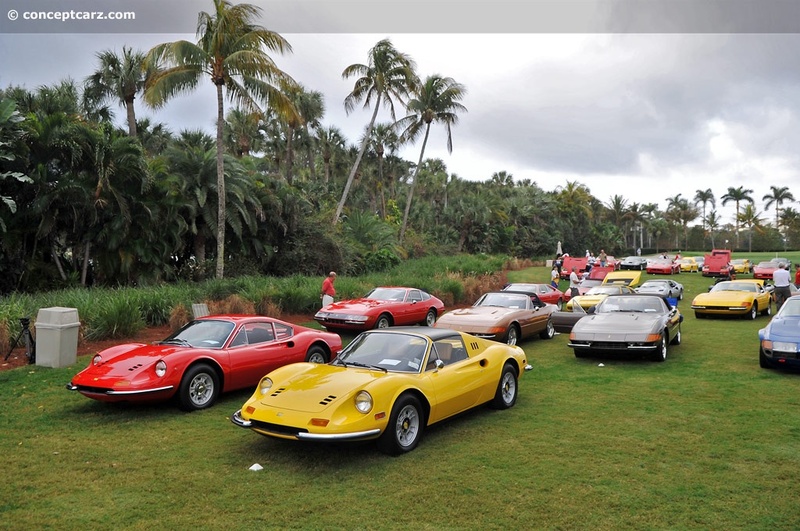 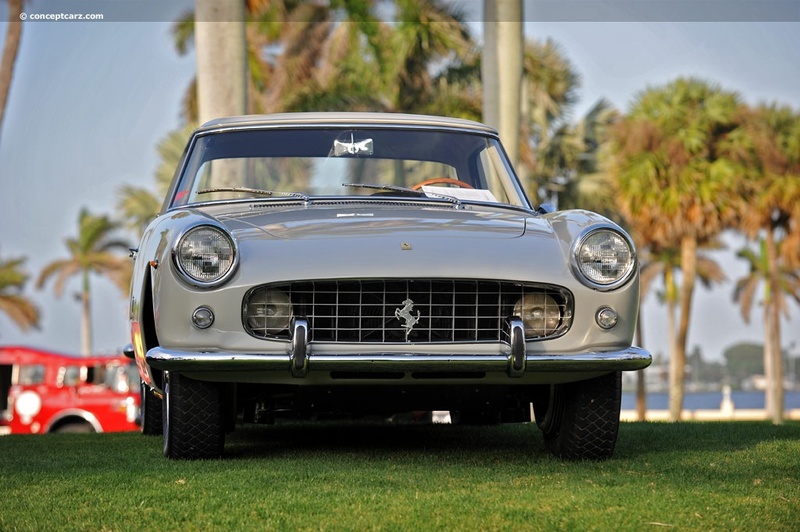 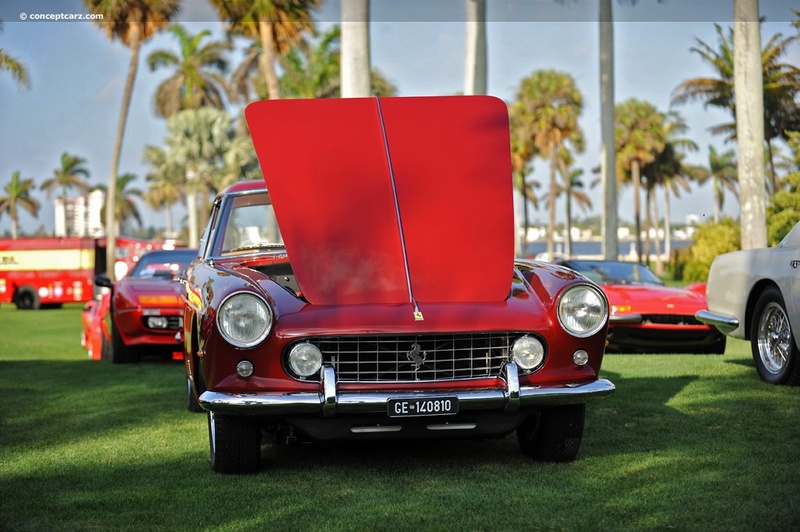 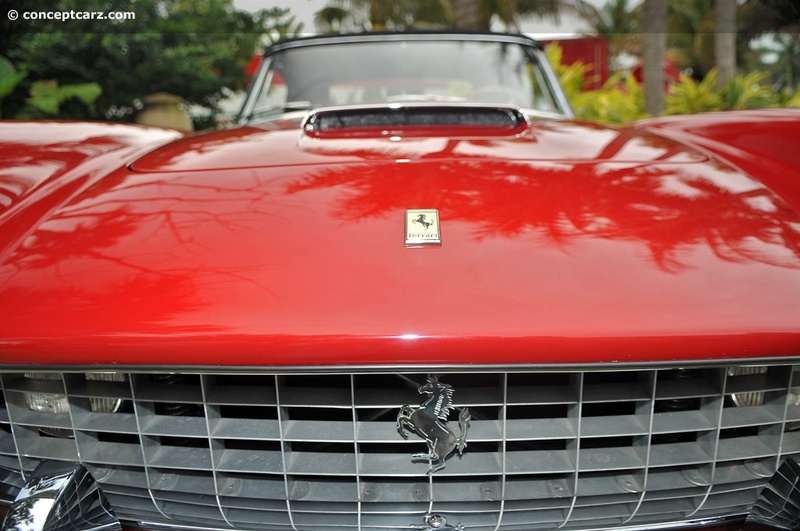 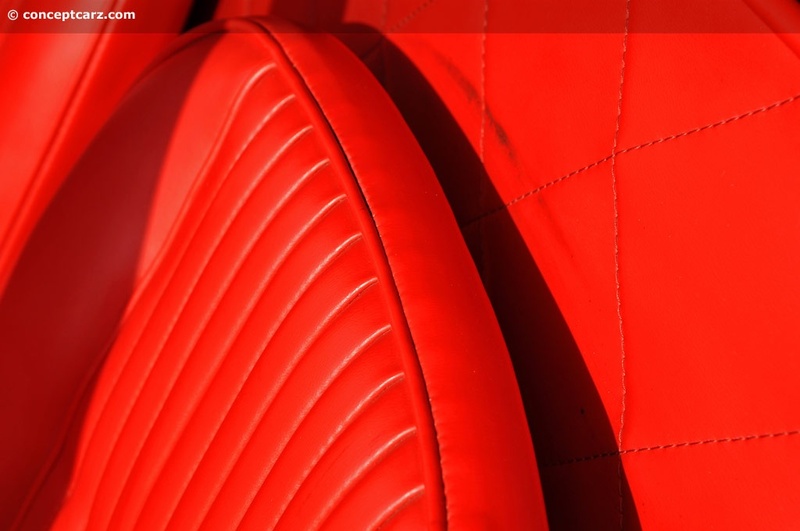 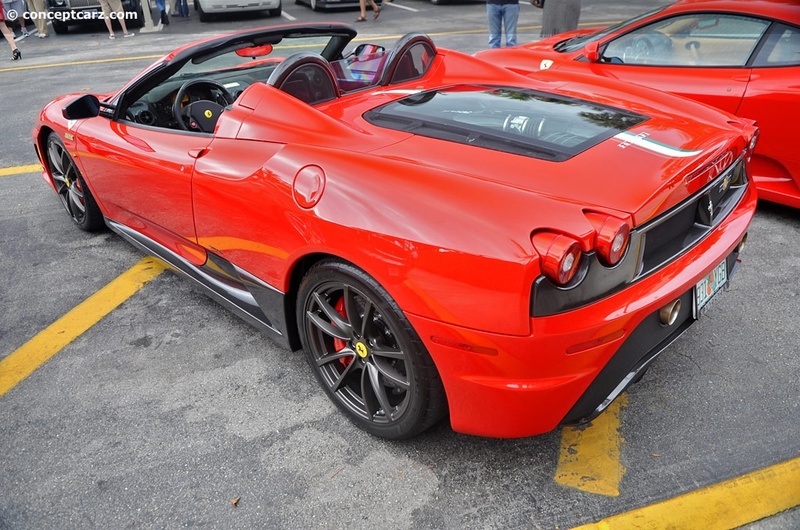 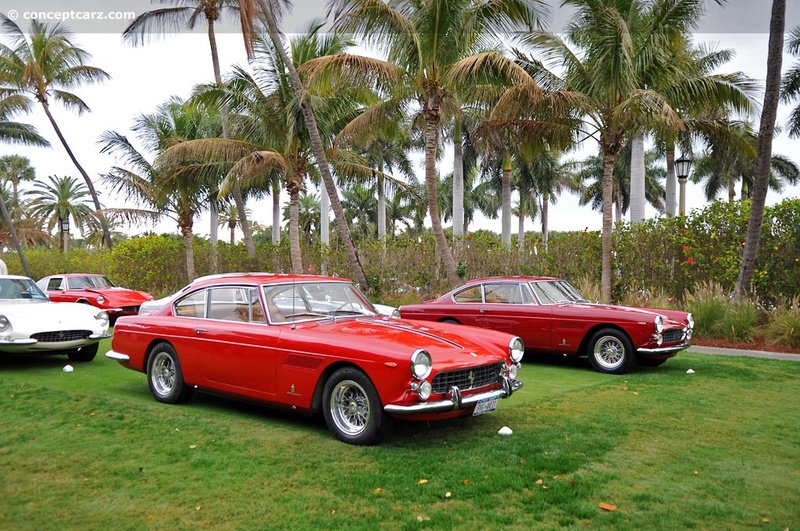 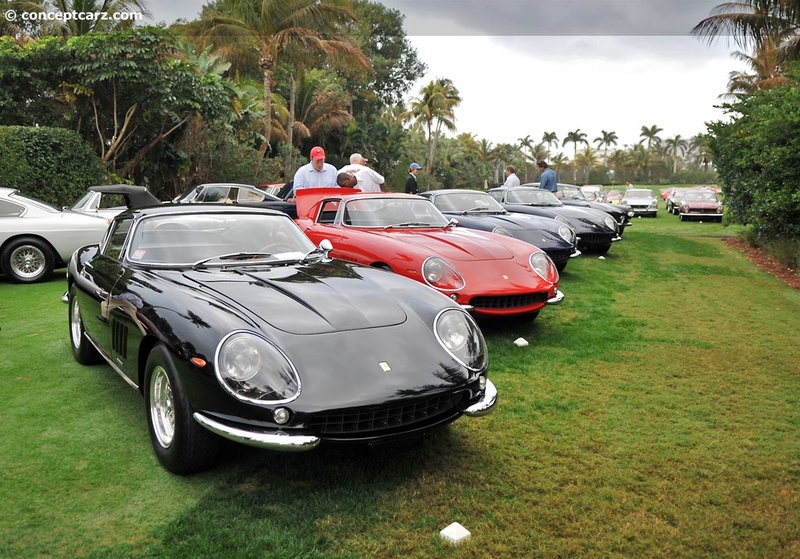 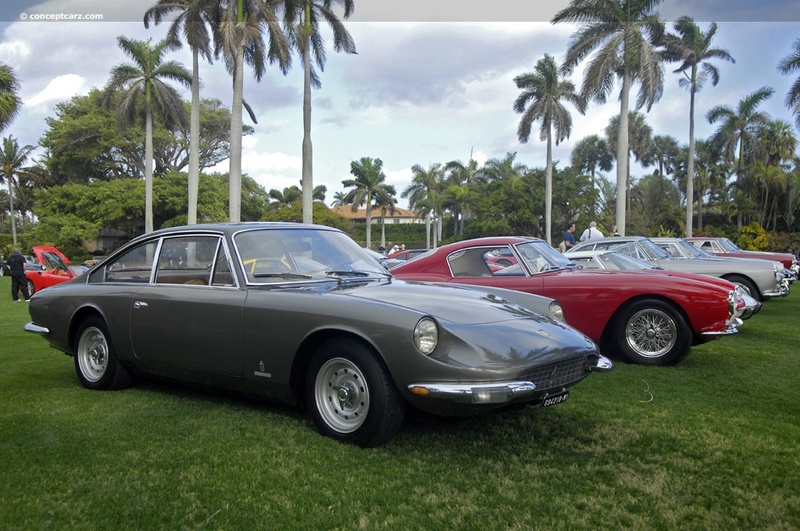 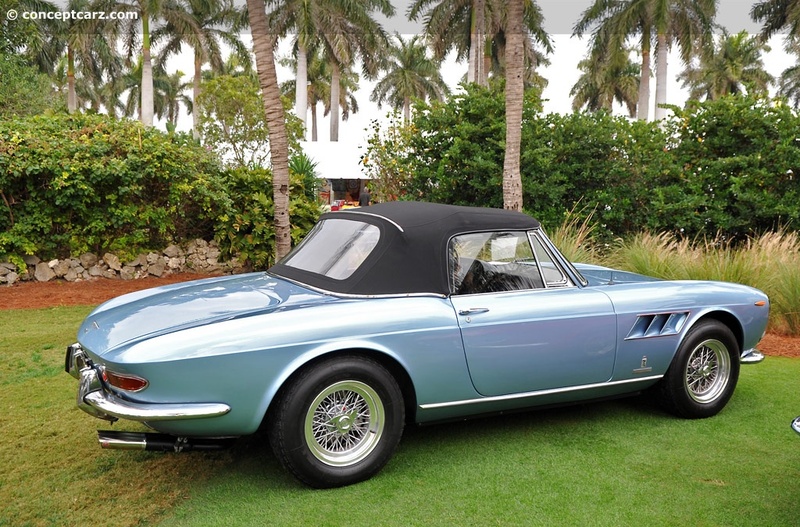 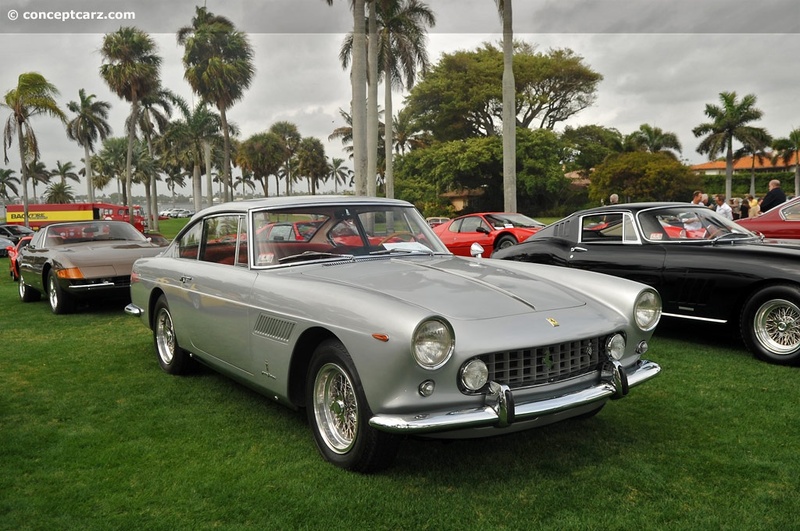 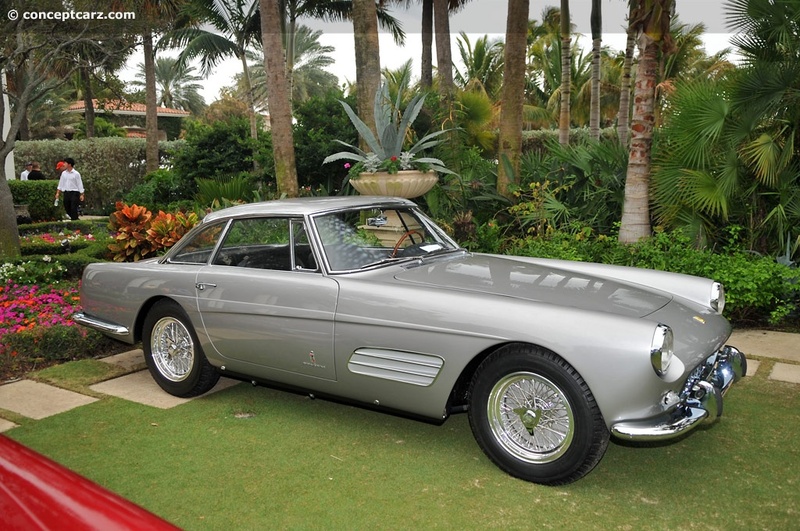 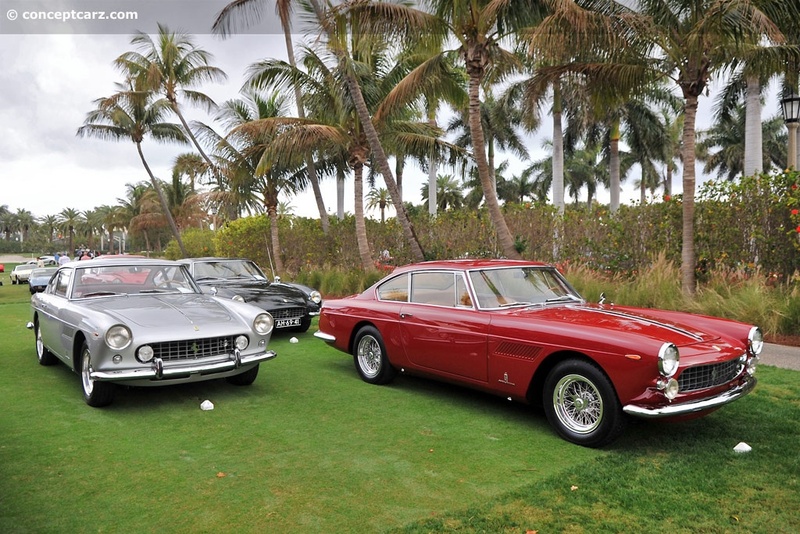 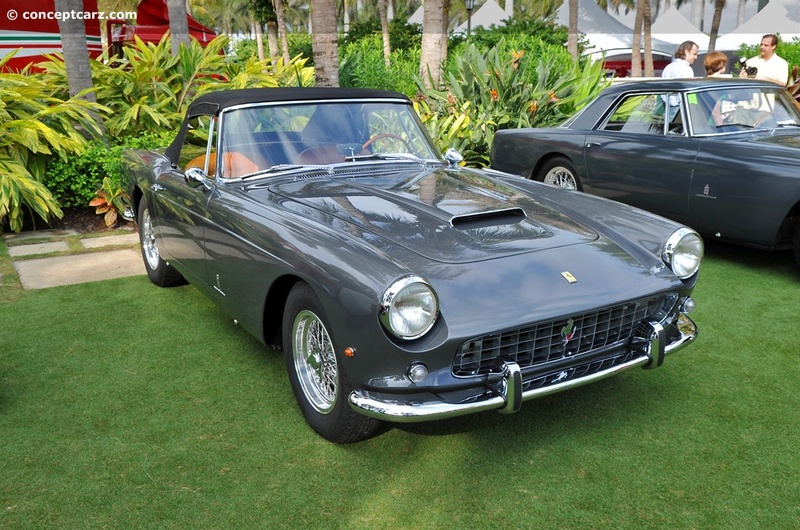 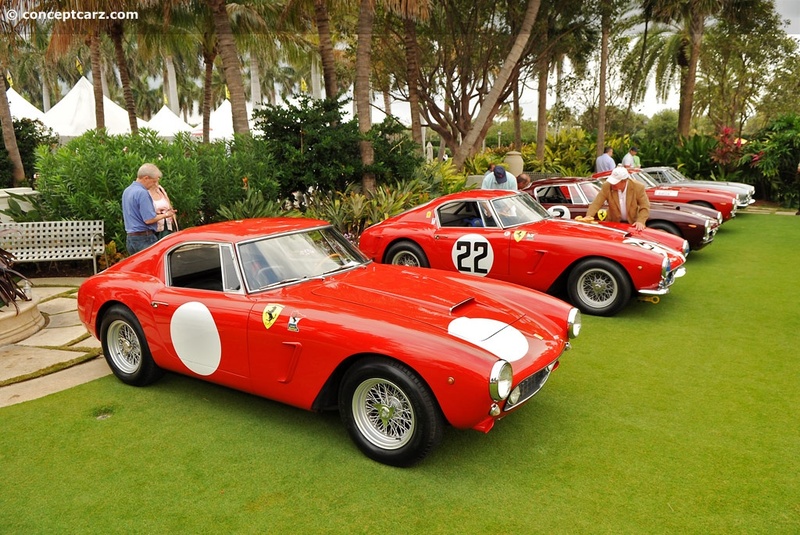 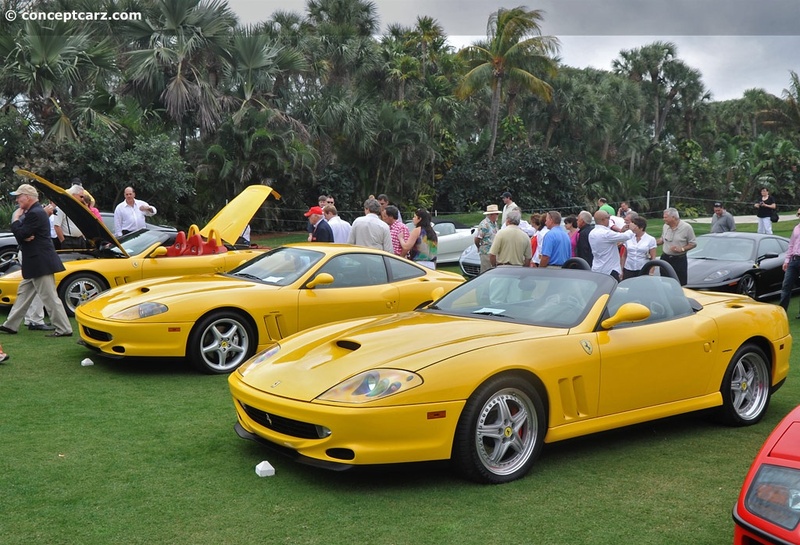 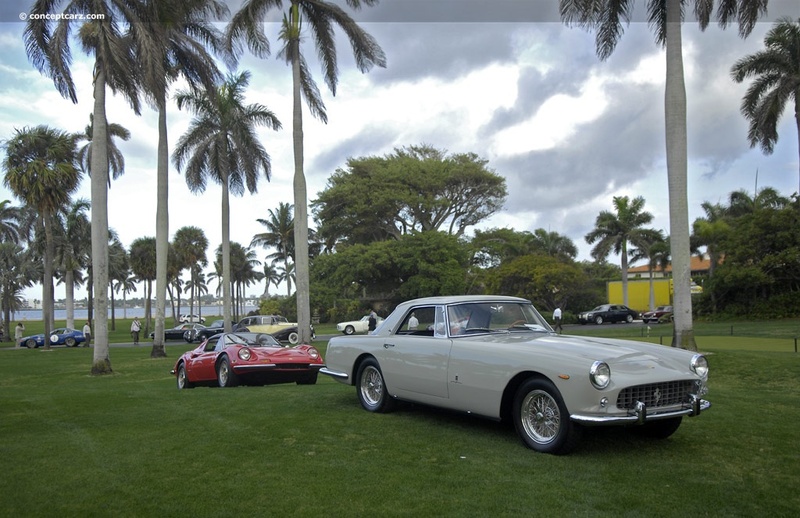 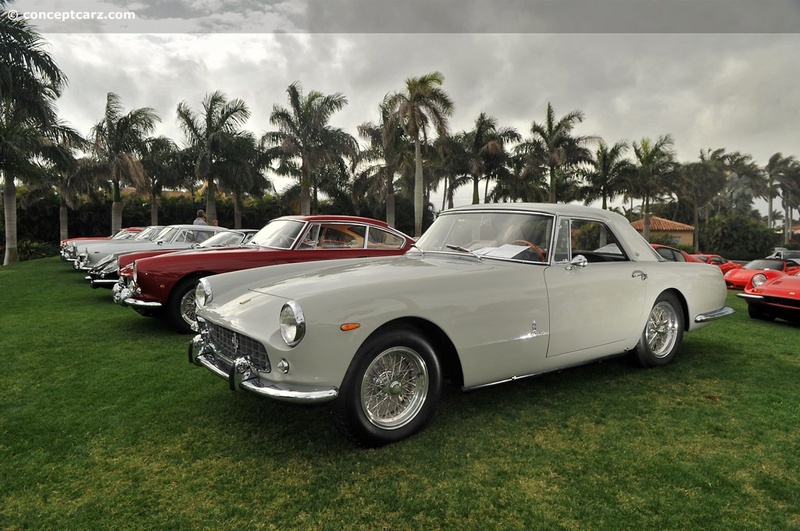 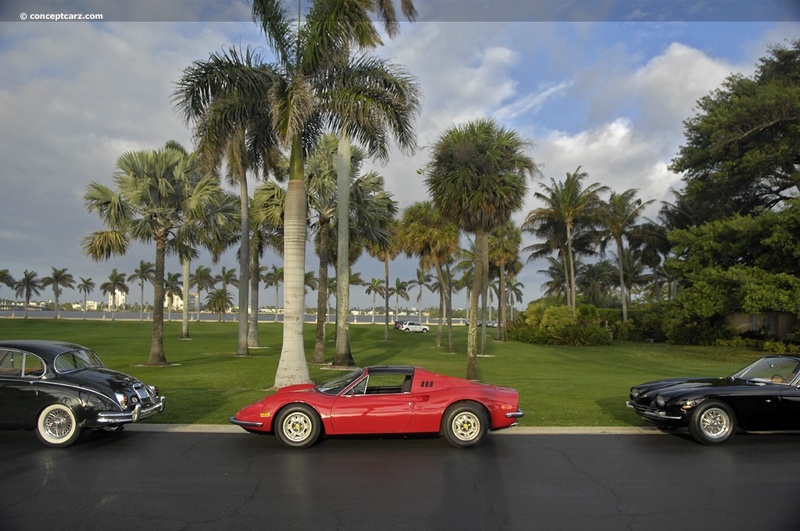 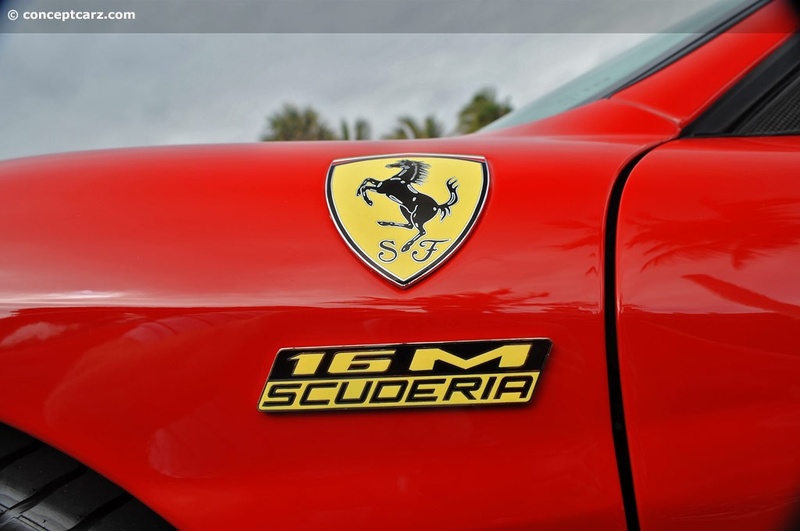 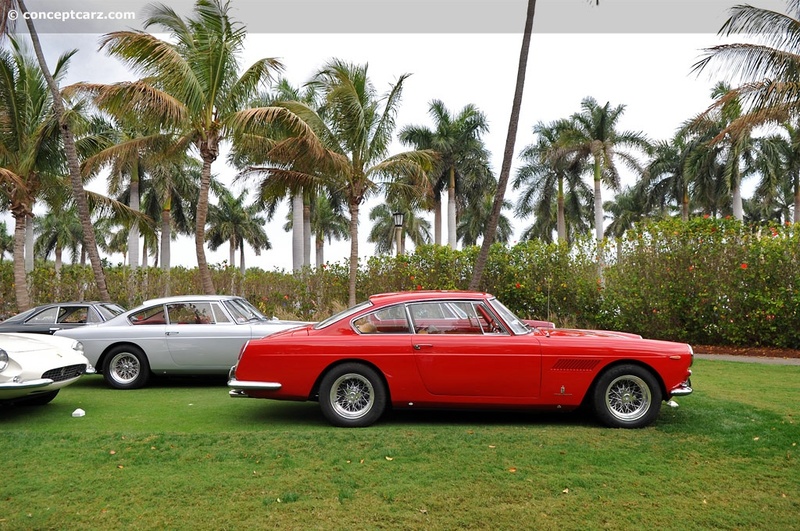 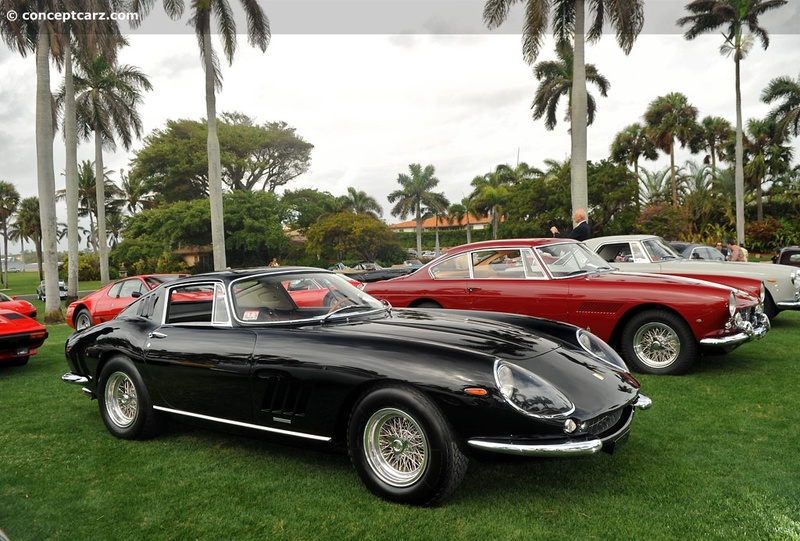 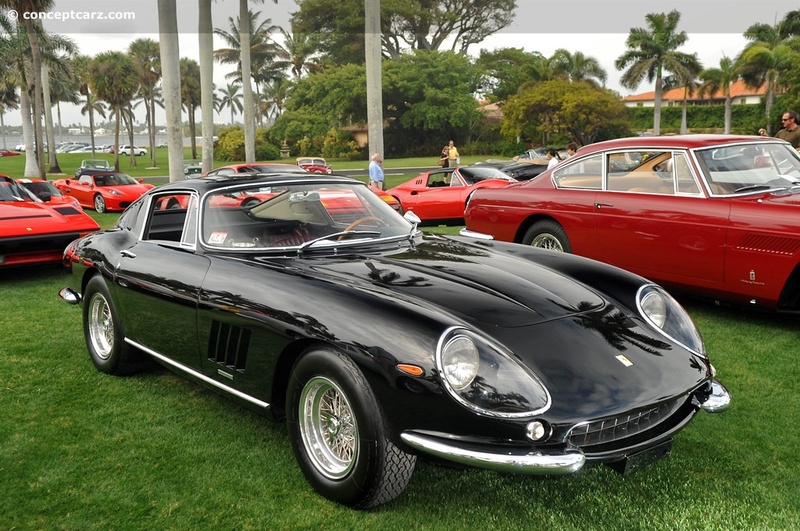 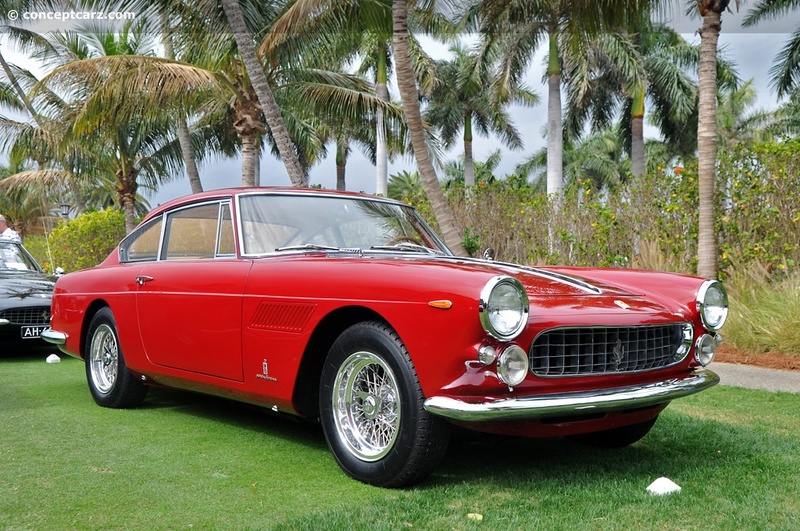 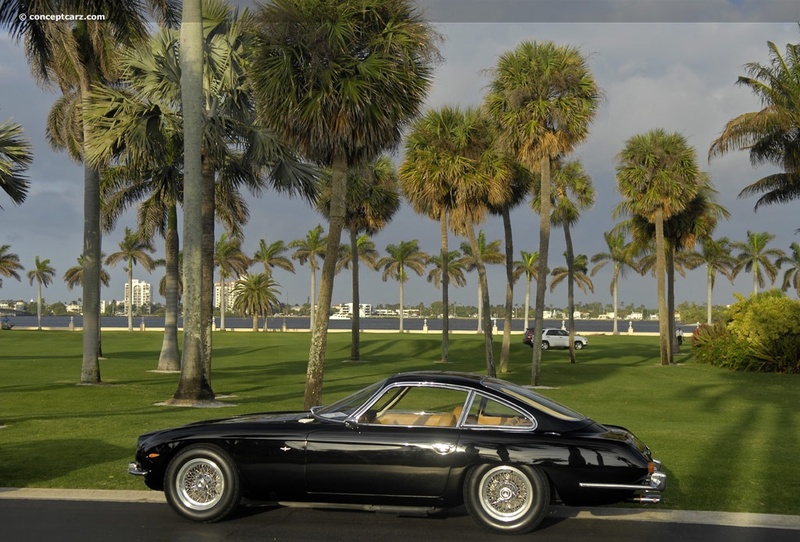 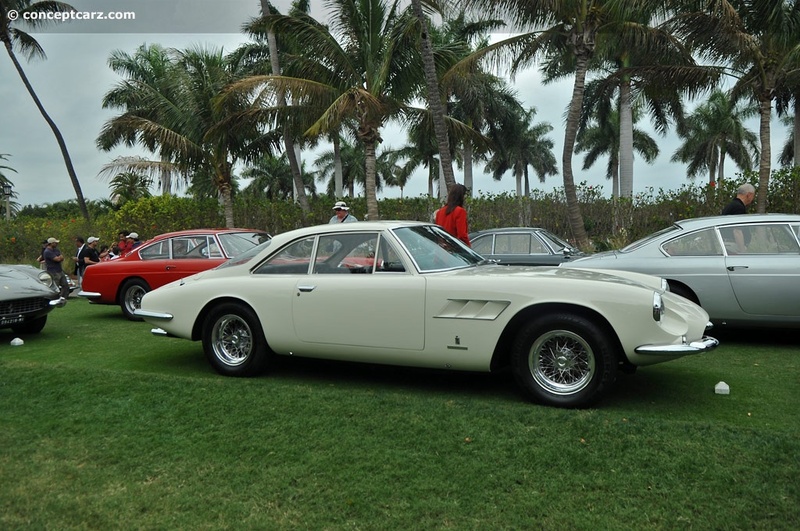 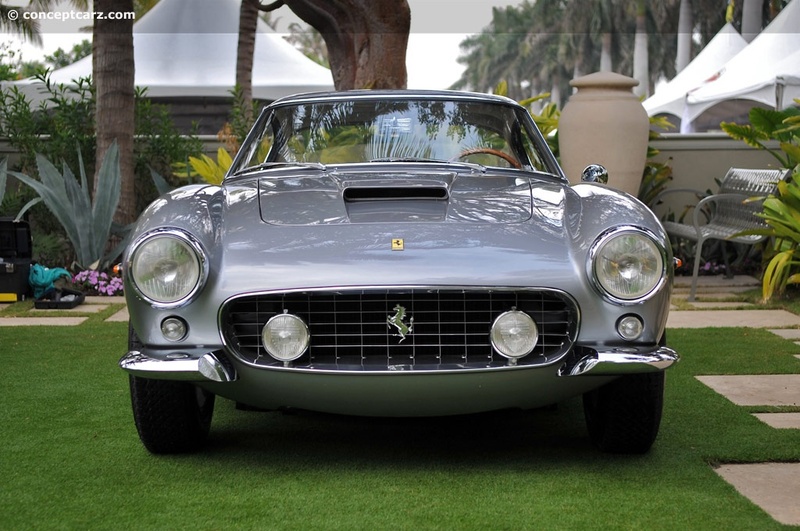 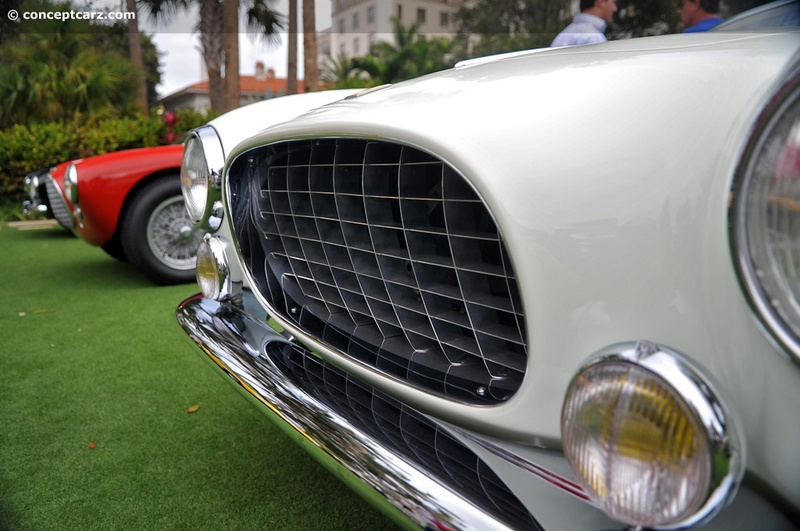 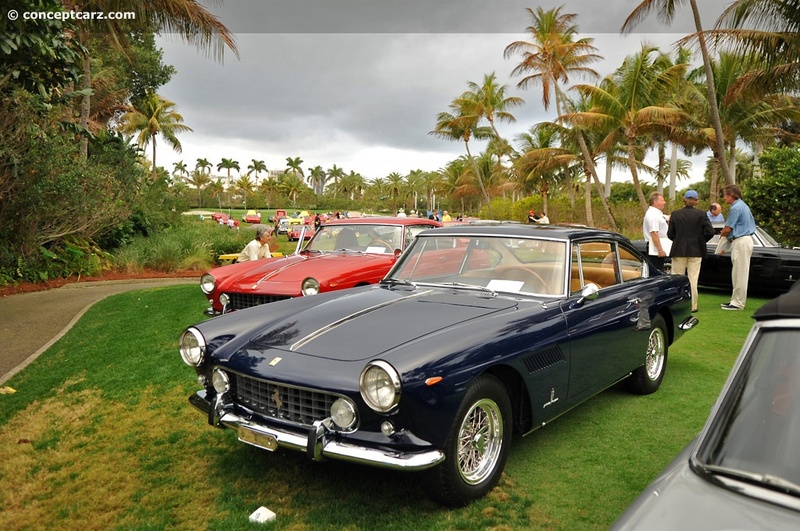 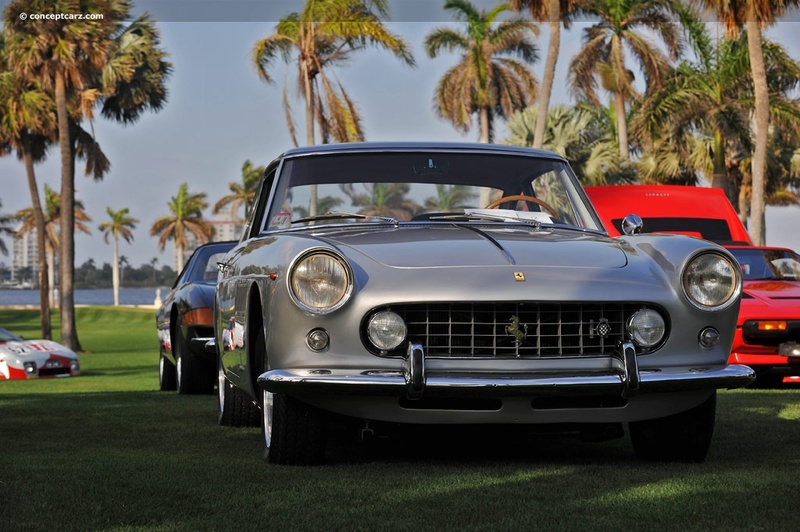 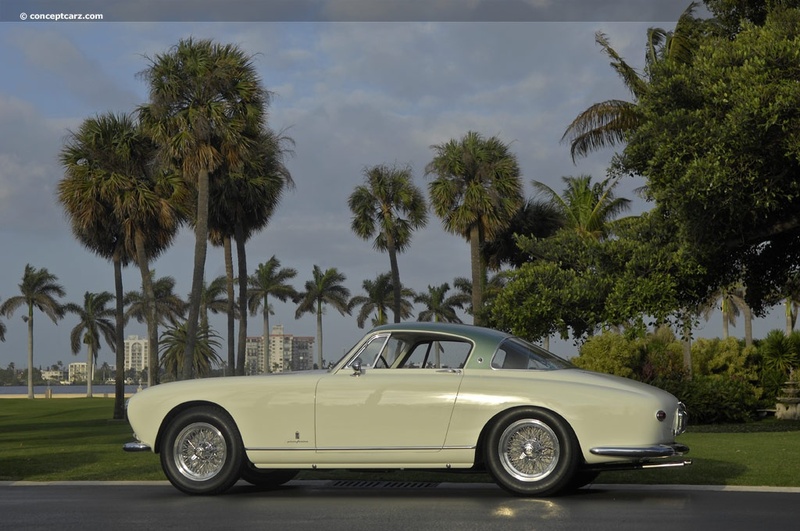 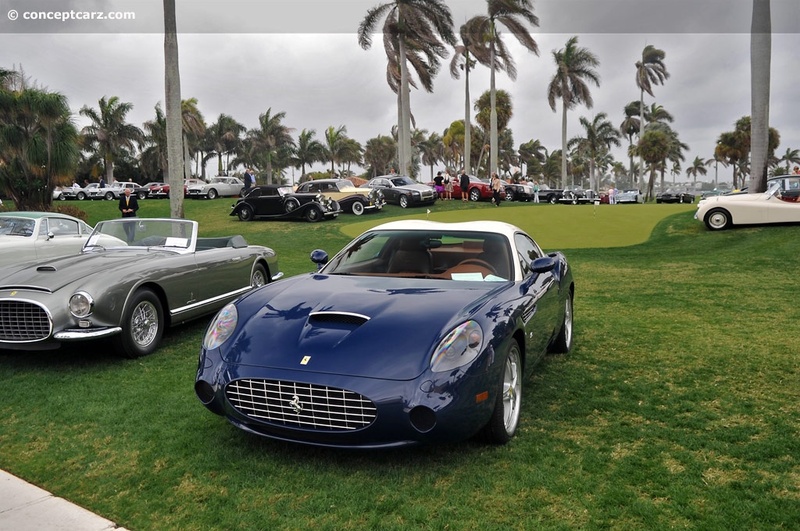 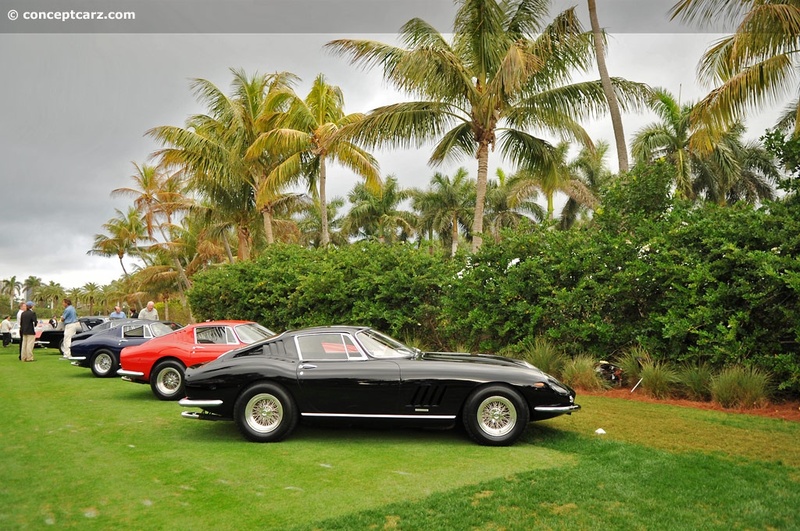 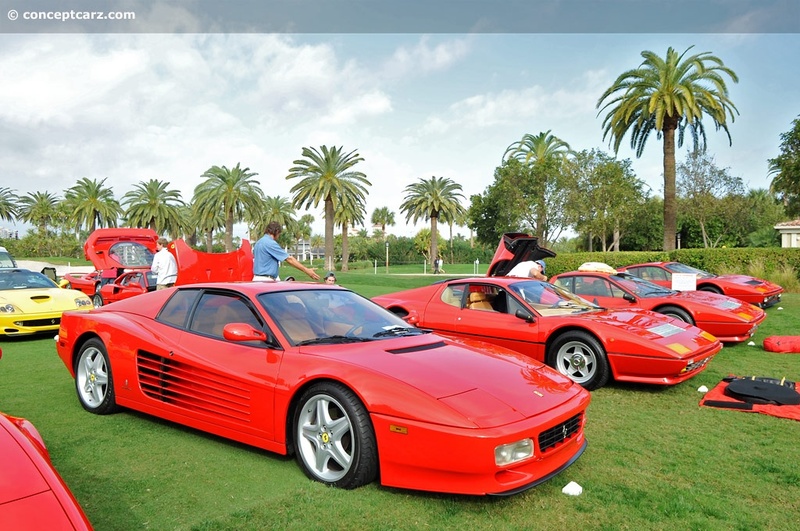 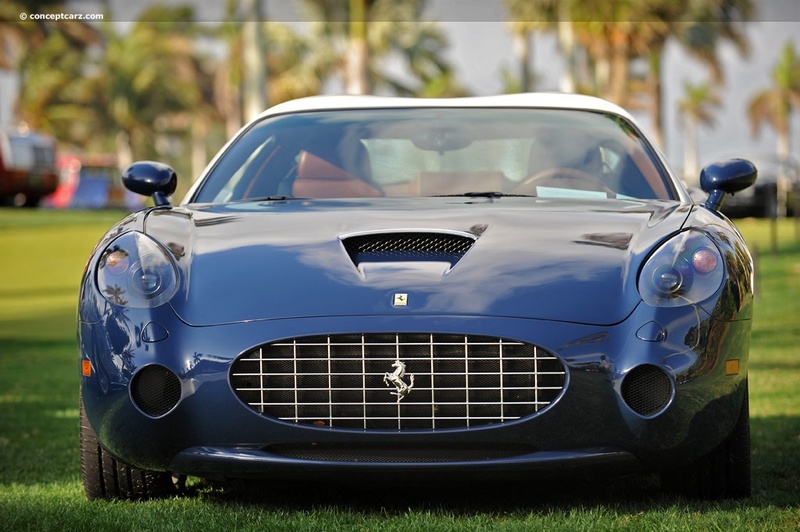 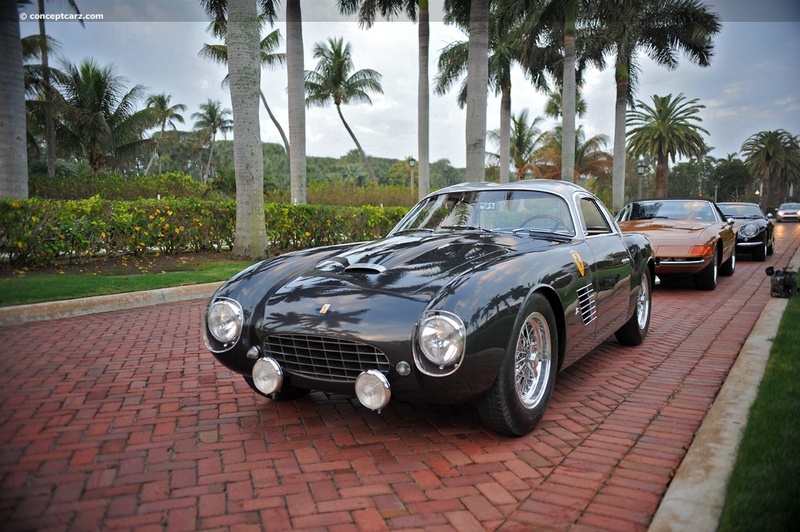 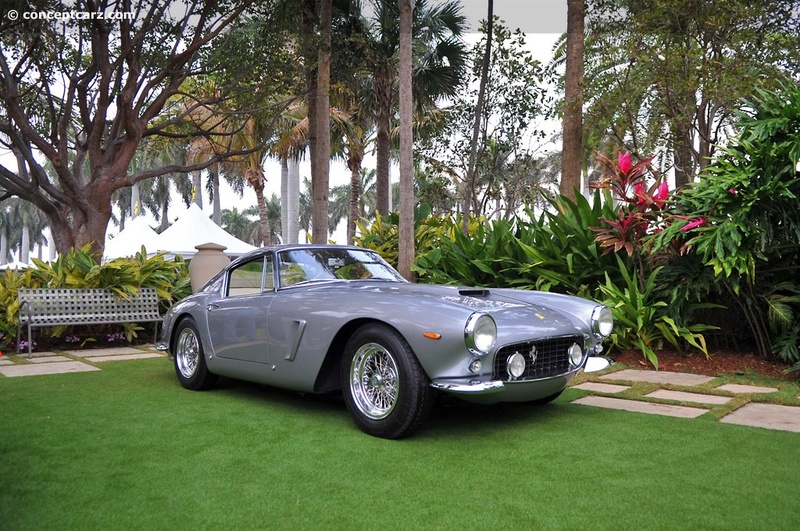 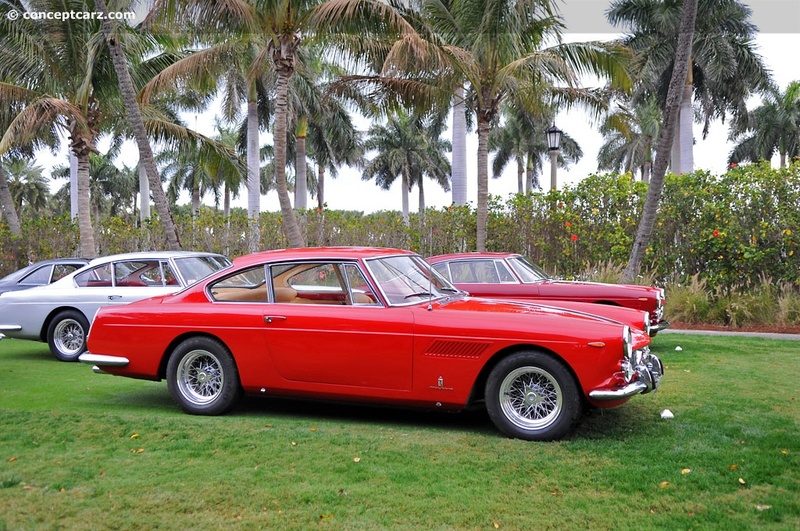 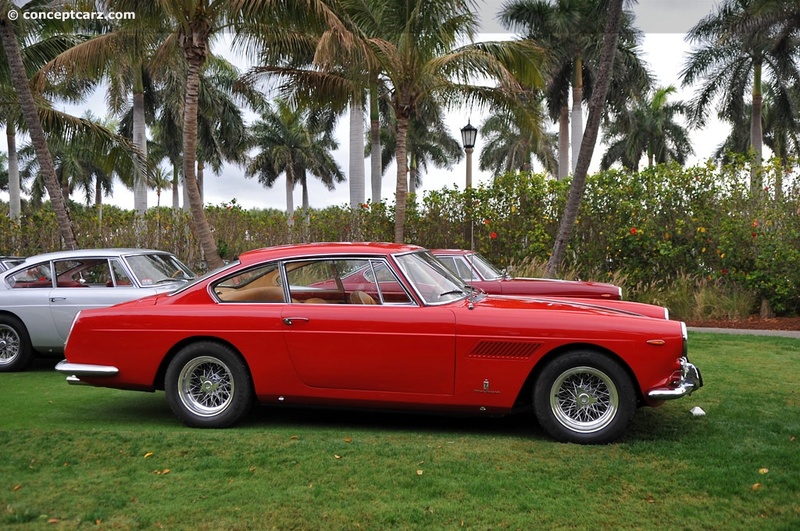 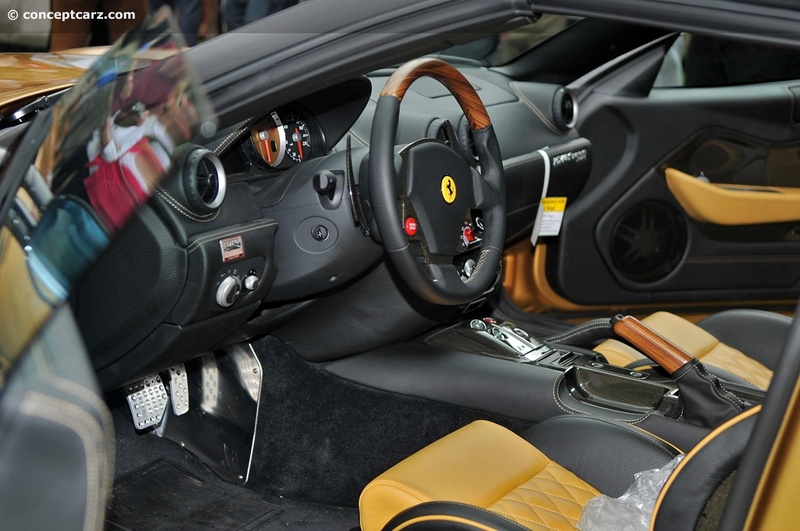 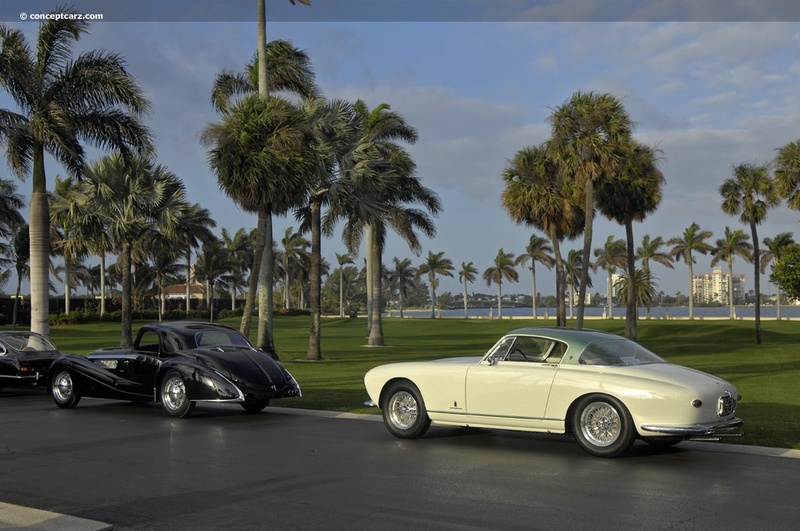 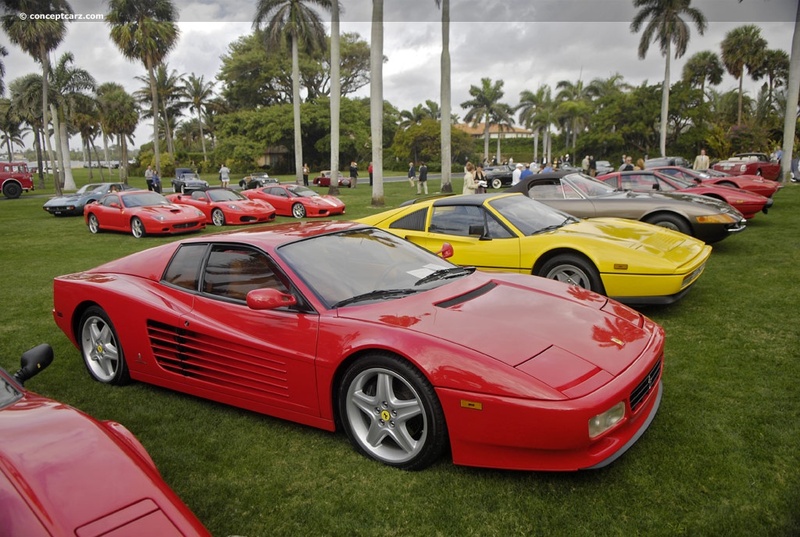 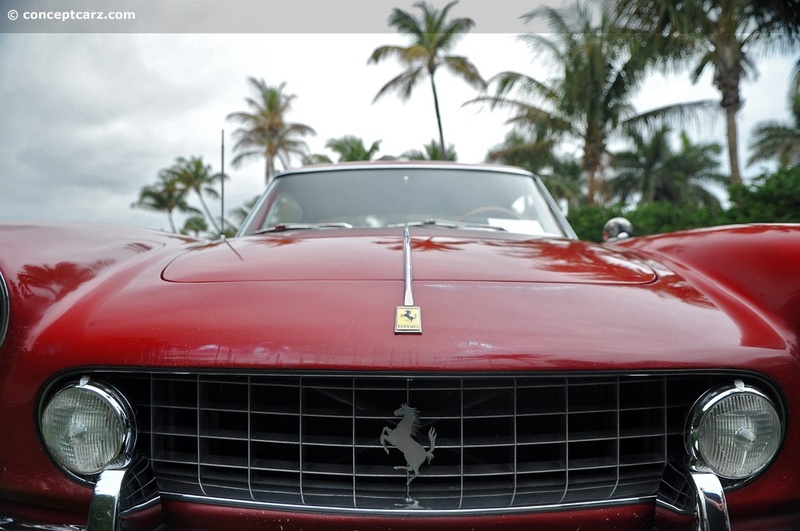 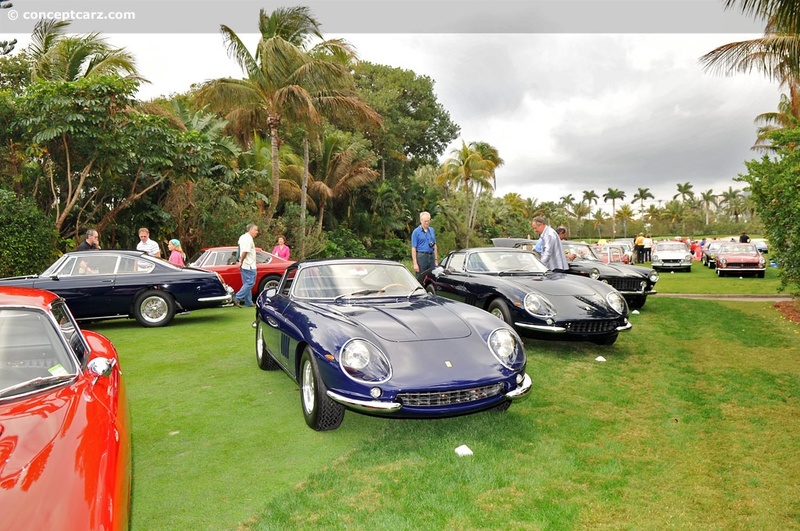 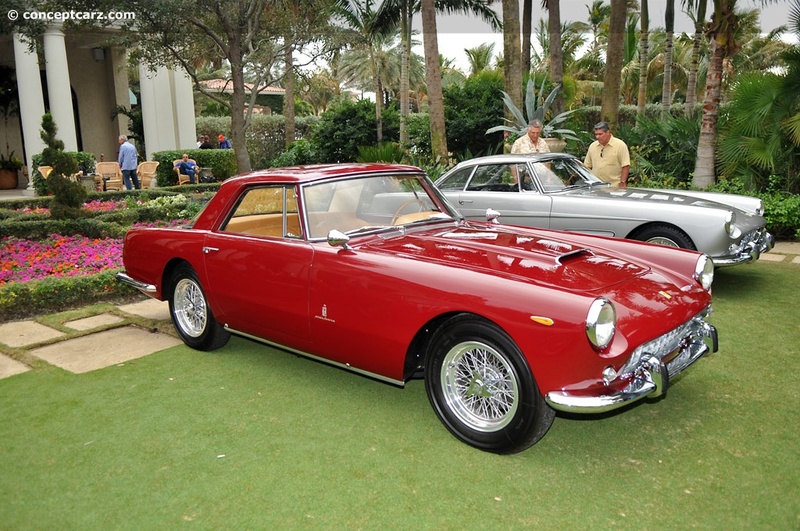 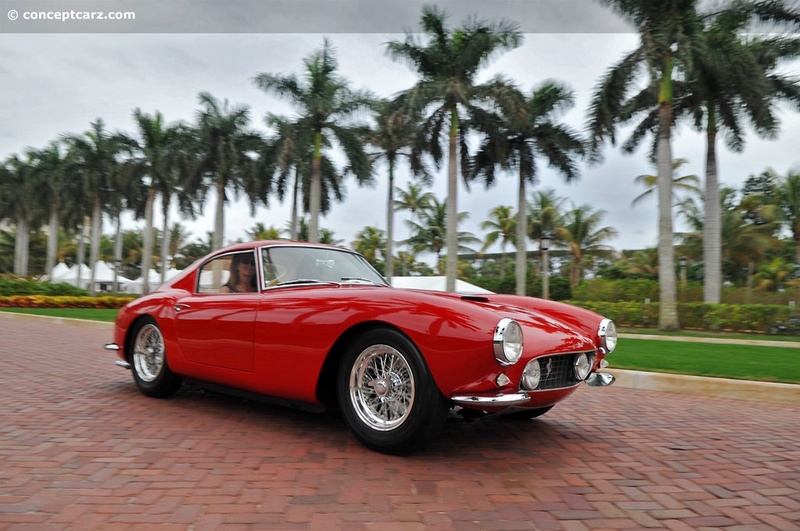 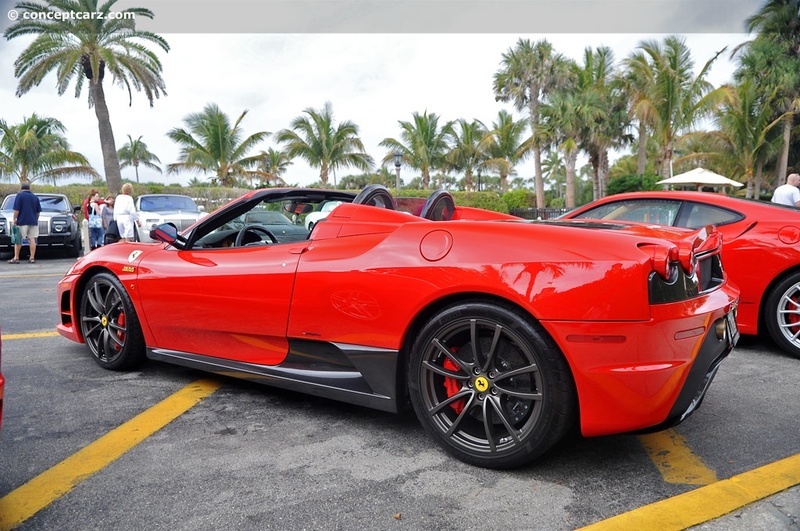 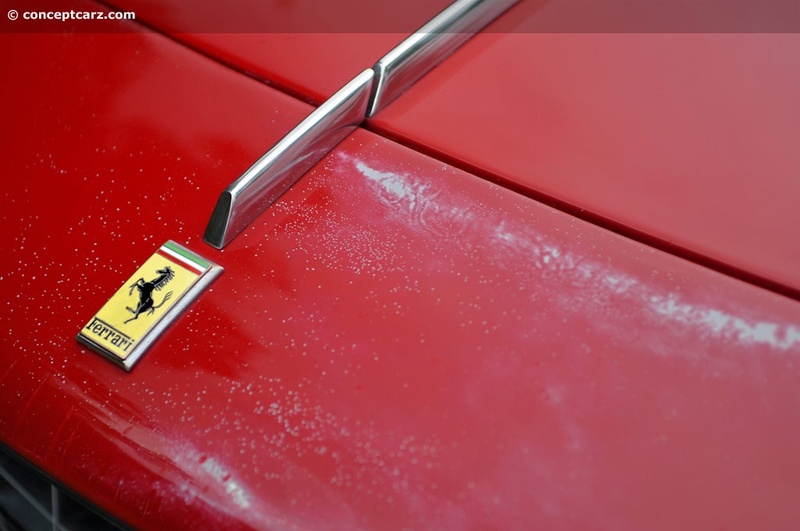 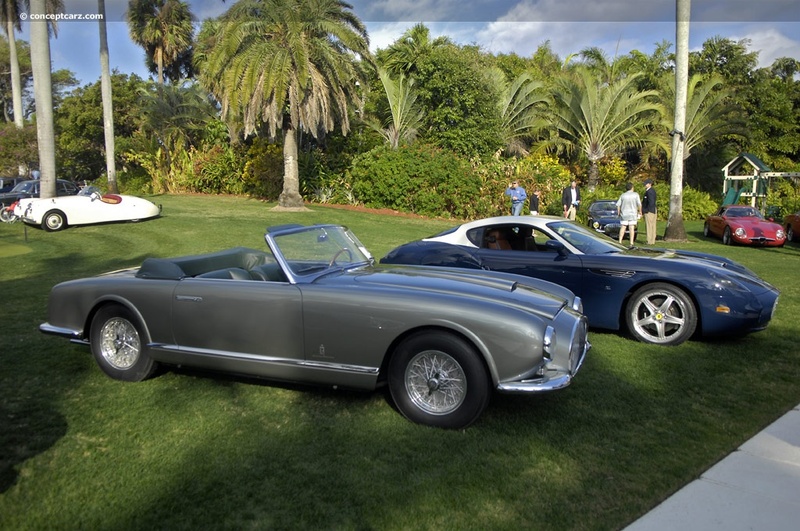 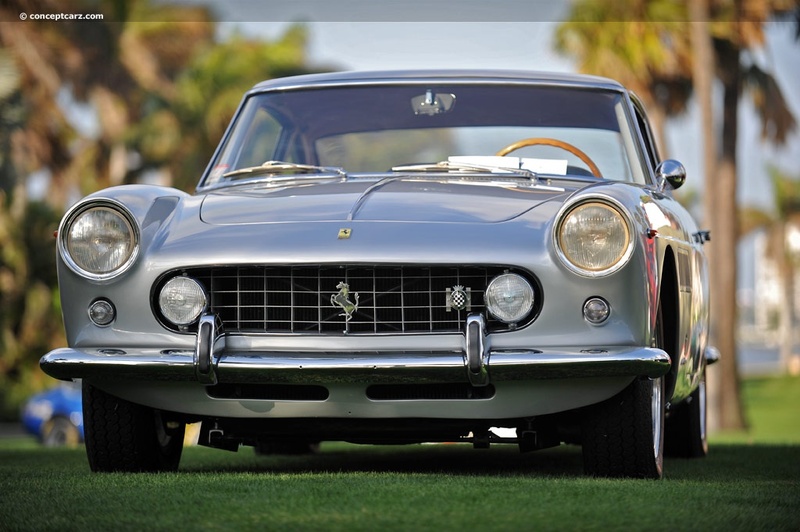 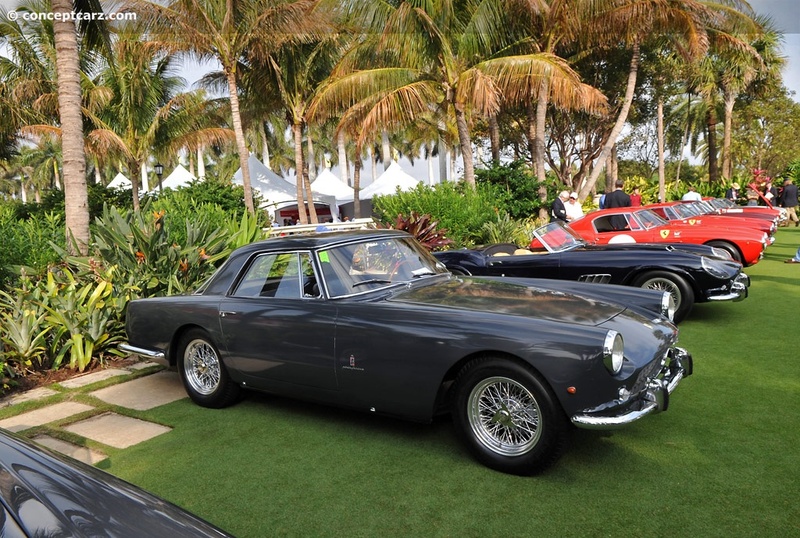 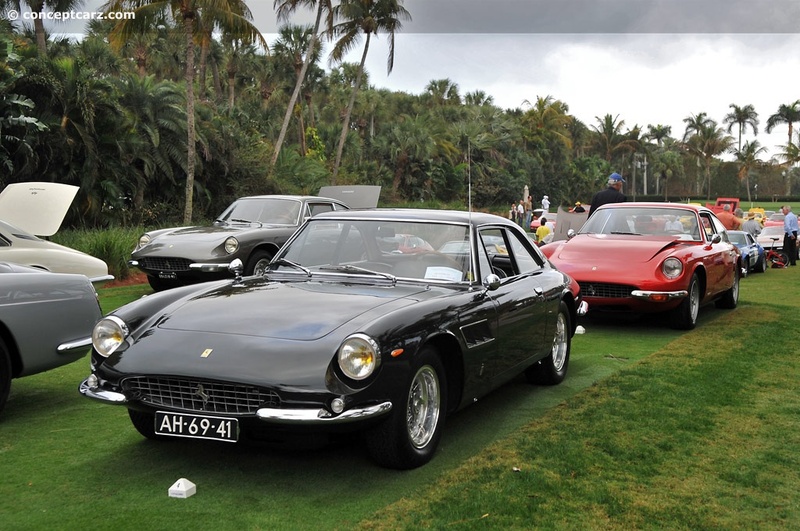 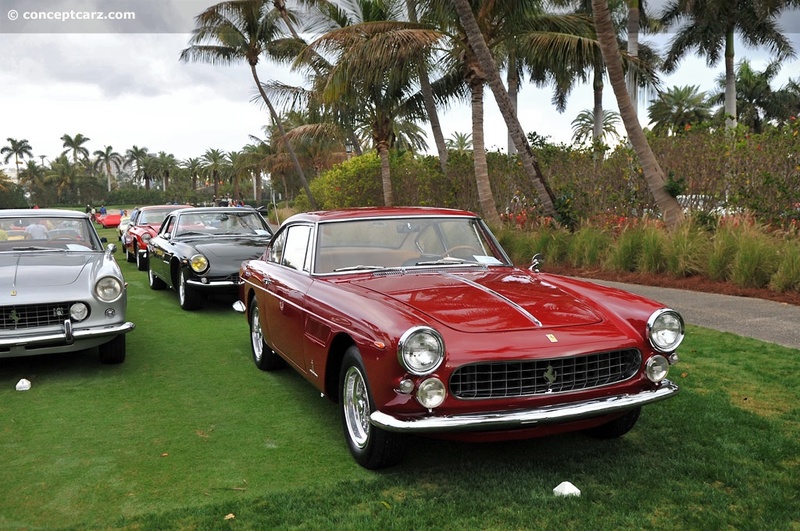 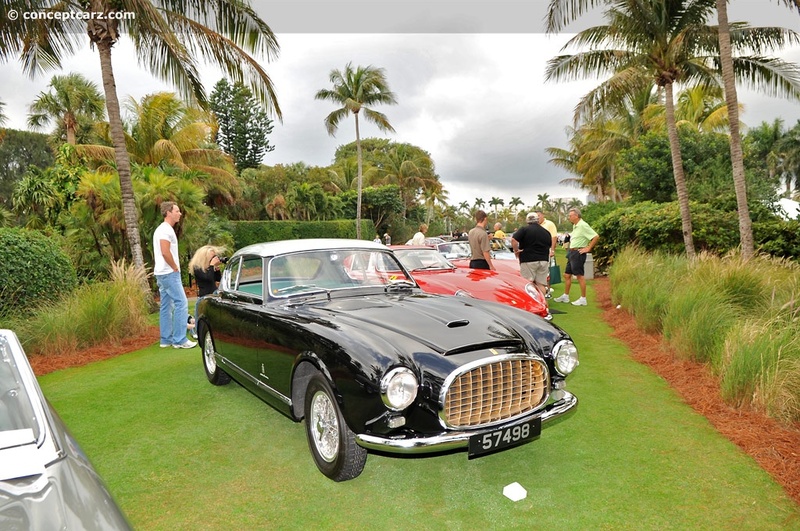 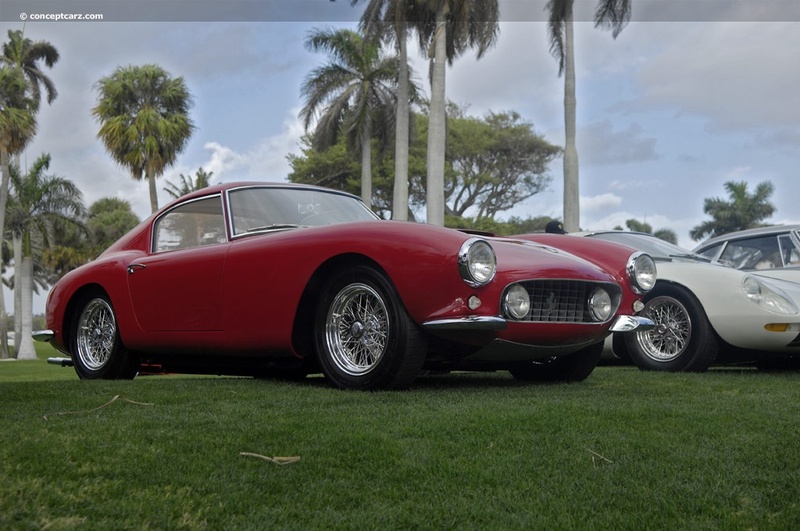 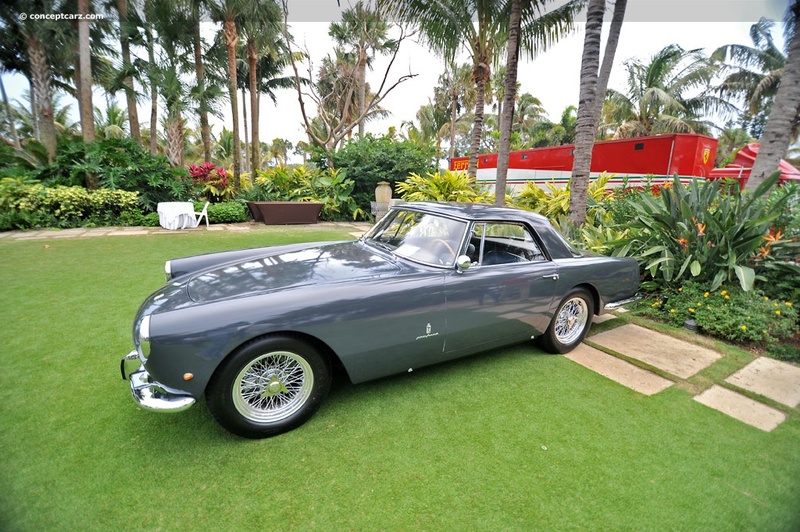 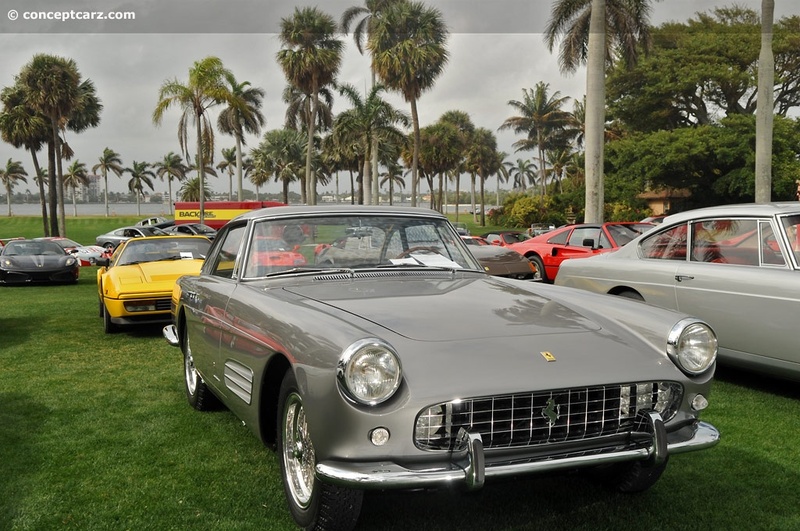 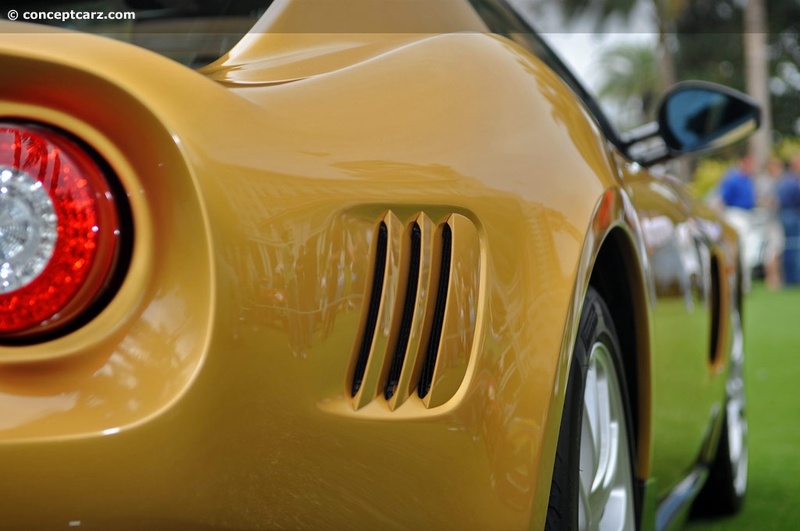 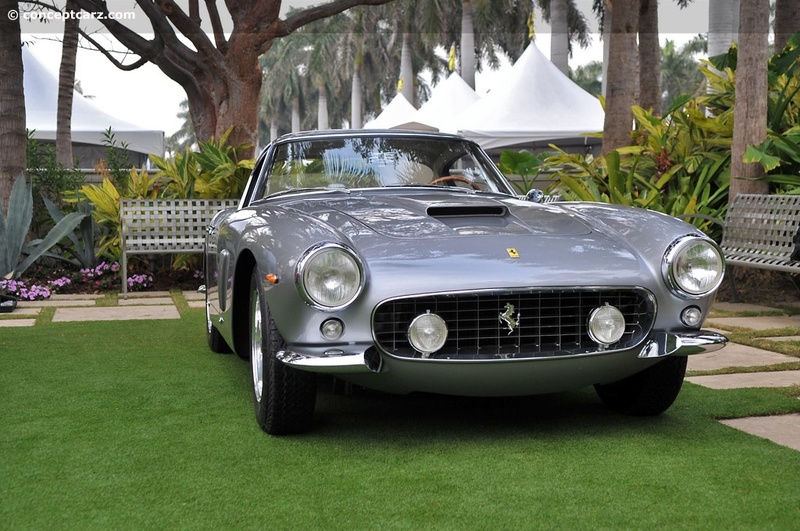 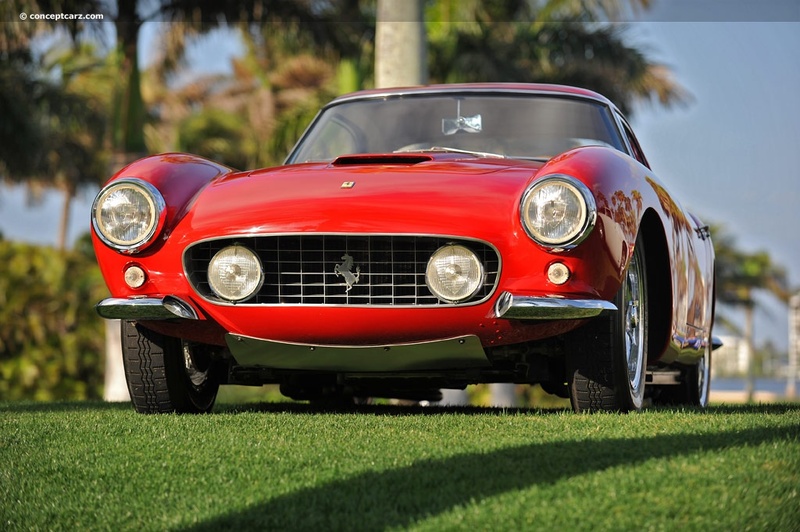 Winter in West Palm Beach, Florida is made even more enjoyable by the Cavallino Classic, a convention for Ferrari owners and enthusiasts. 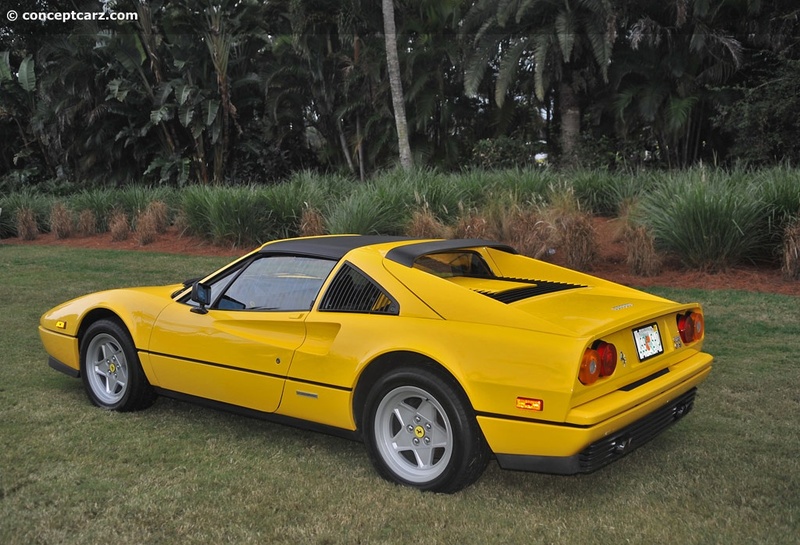 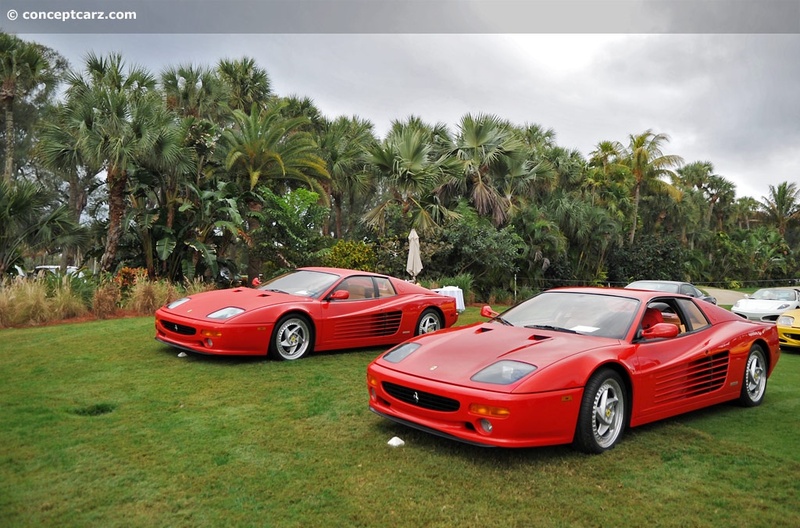 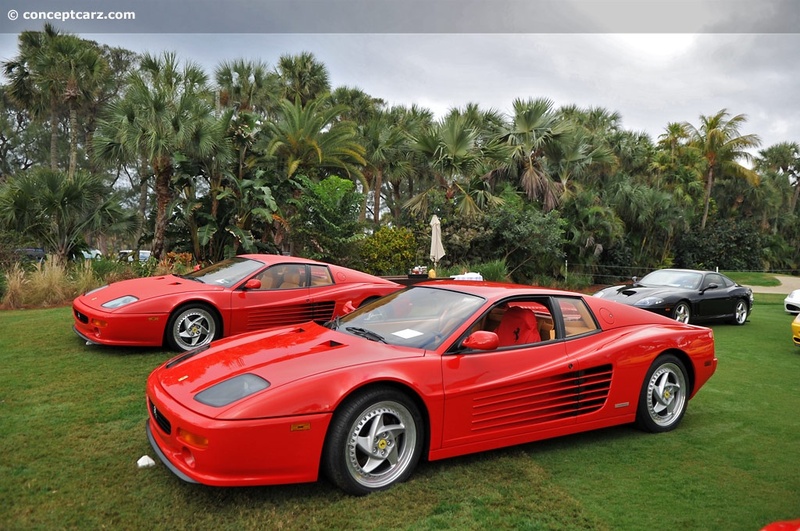 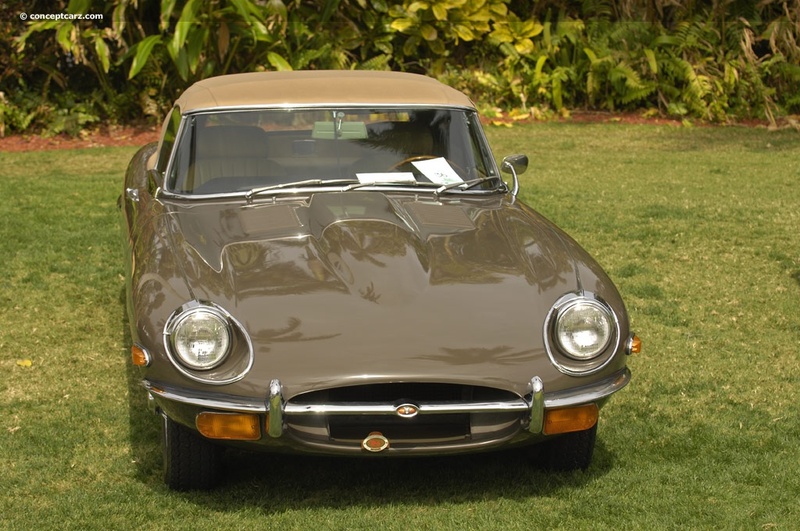 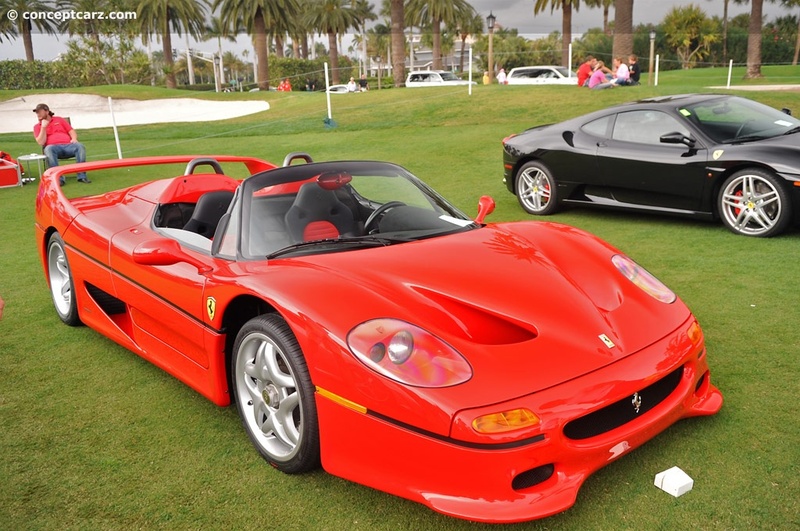 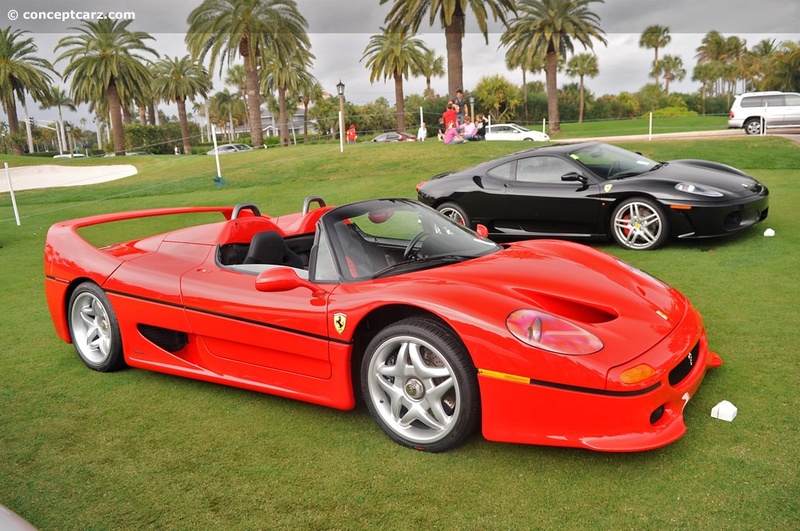 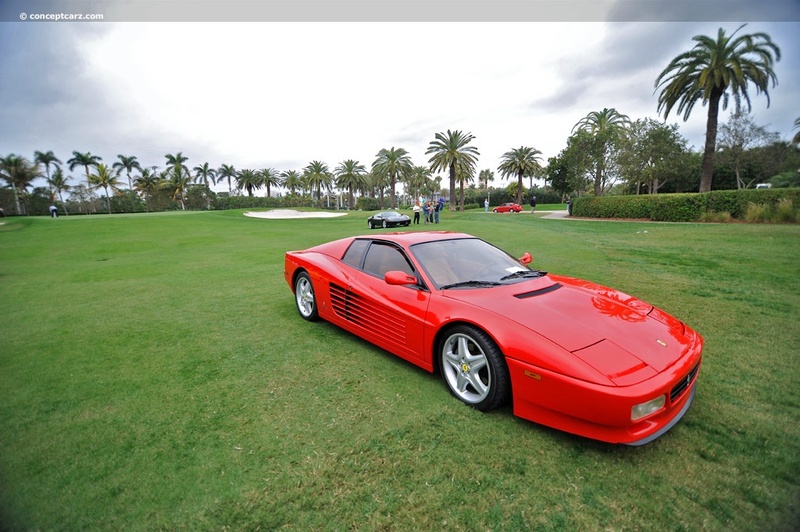 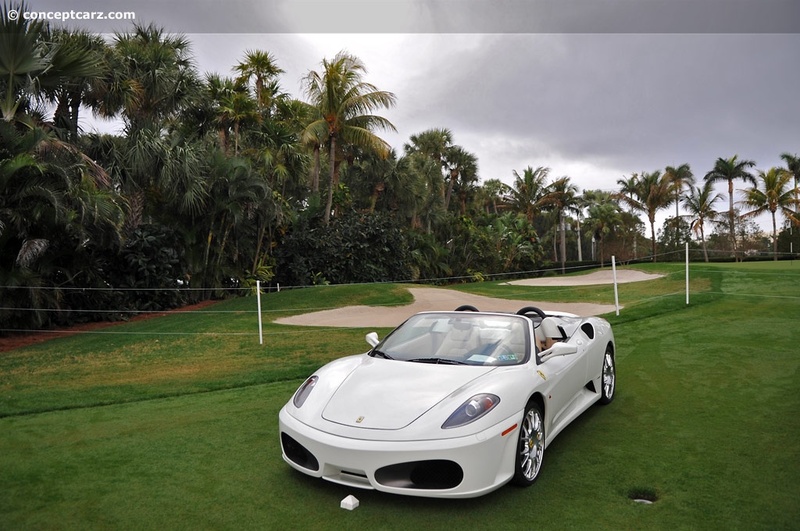 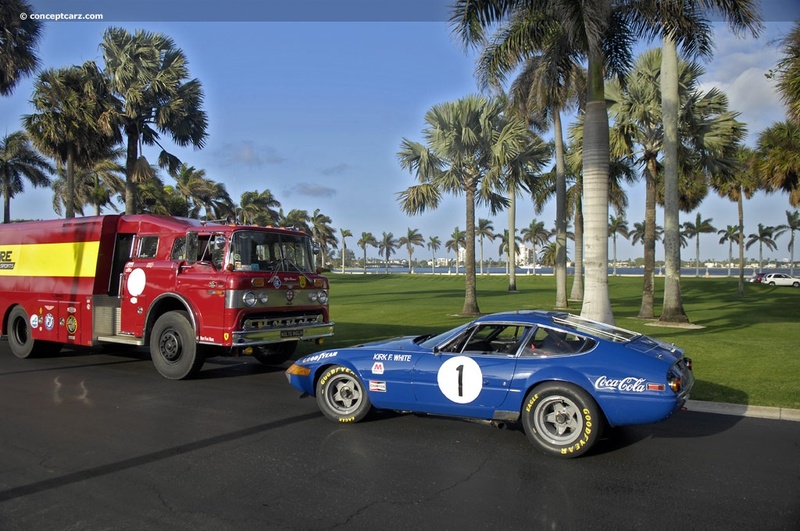 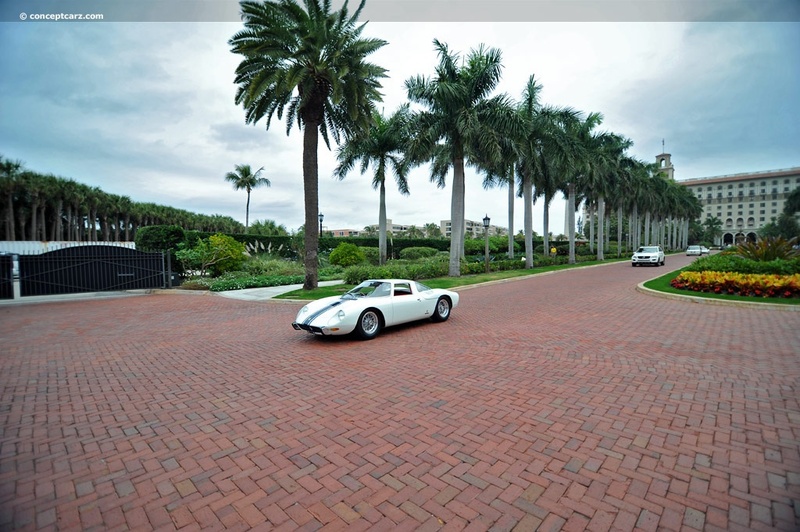 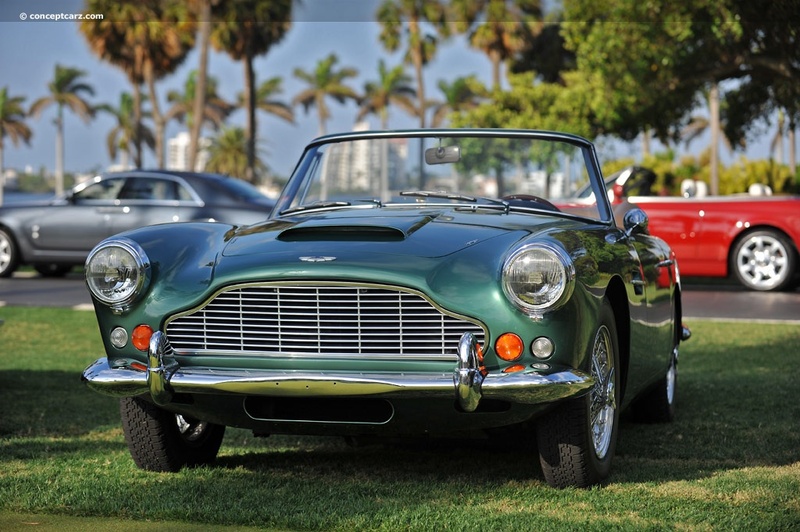 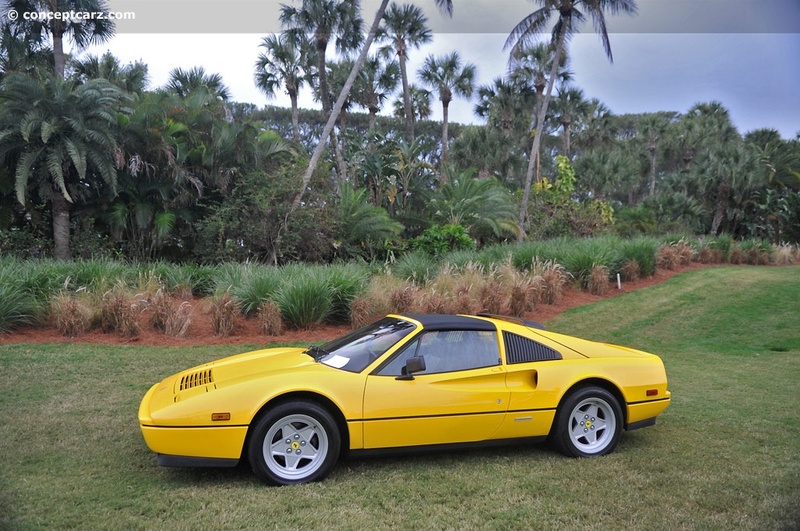 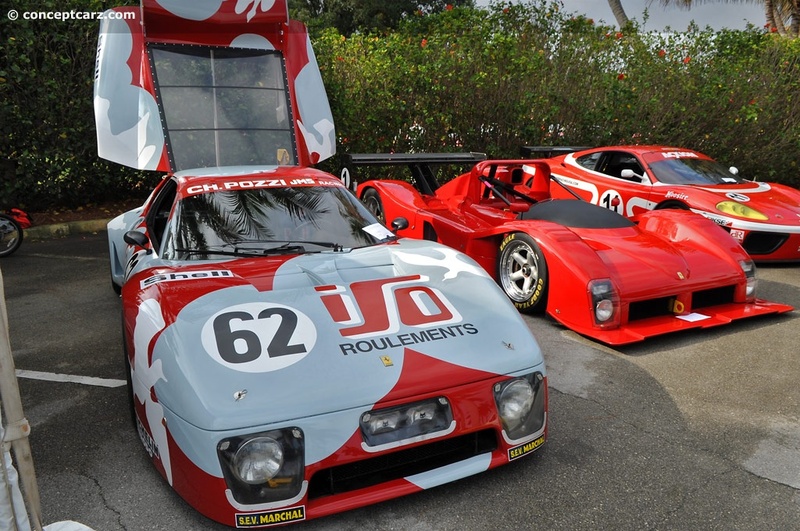 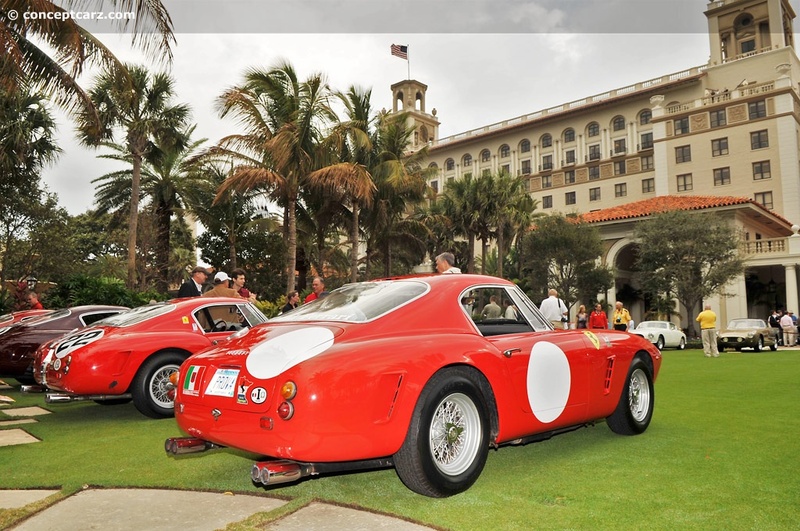 The event is nearly a week long and includes several track days, a Tour of Palm Beach, an exclusive Jet Reception, a Concorso d'Eleganza at The Breakers Resort Hotel, and concludes with the Classic Sports Sunday at The Mar-a-Lago Club. 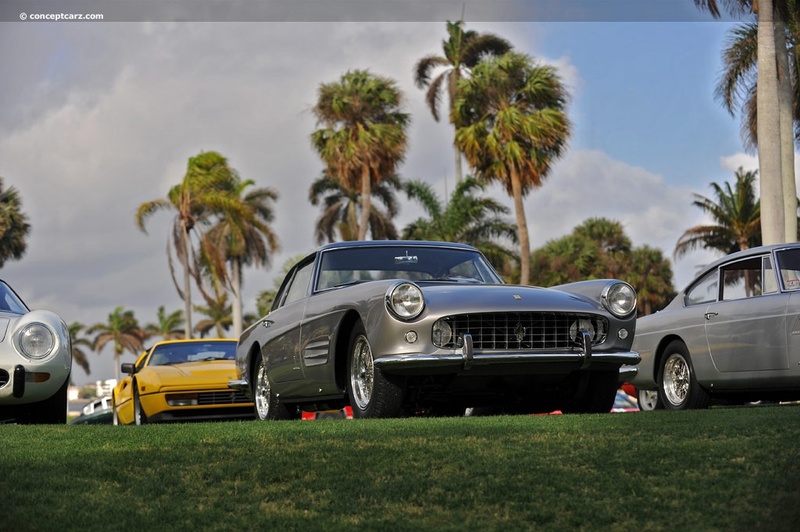 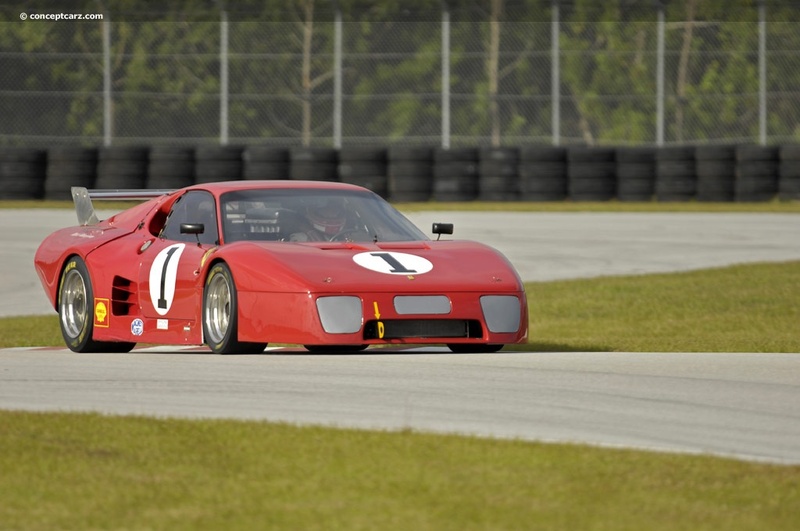 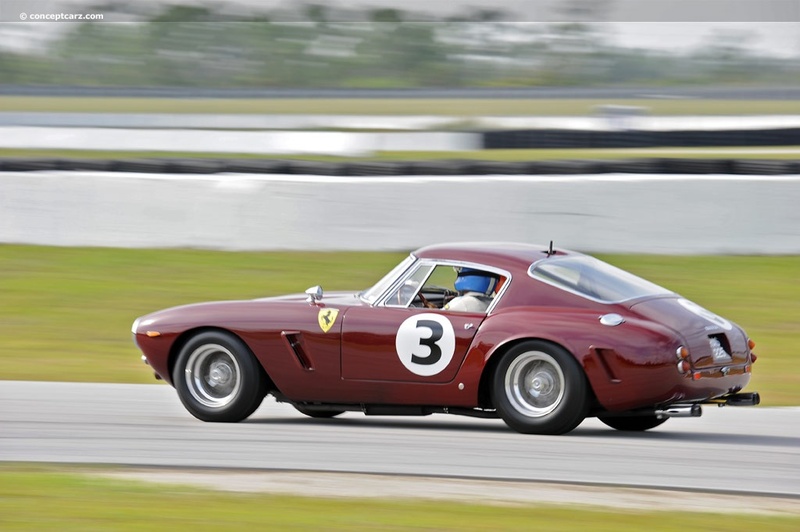 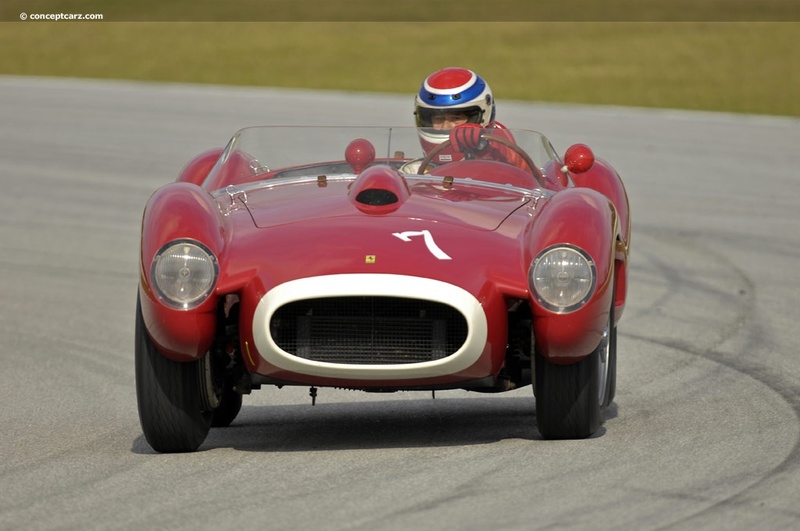 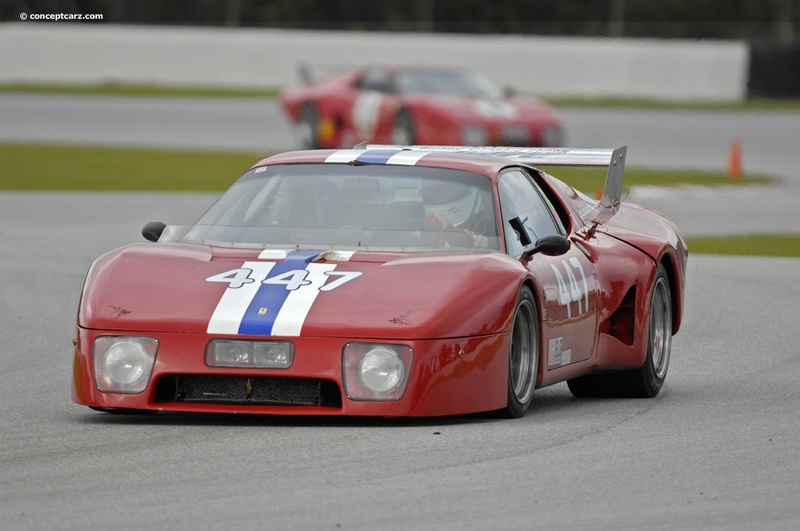 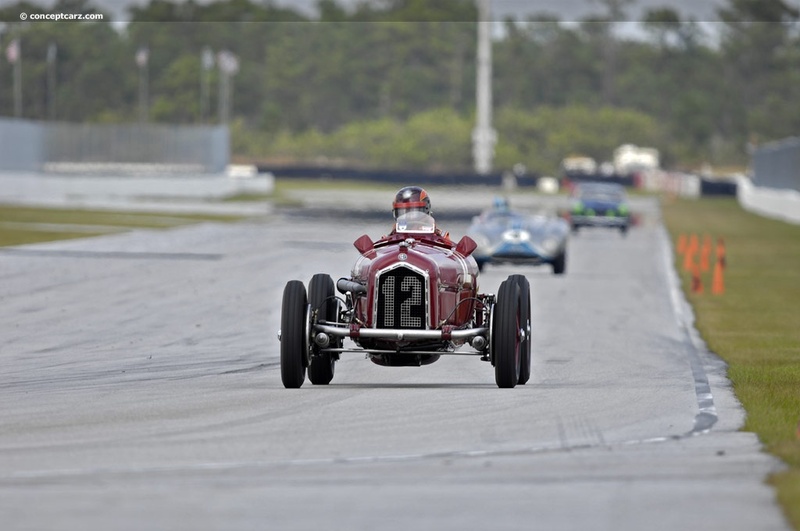 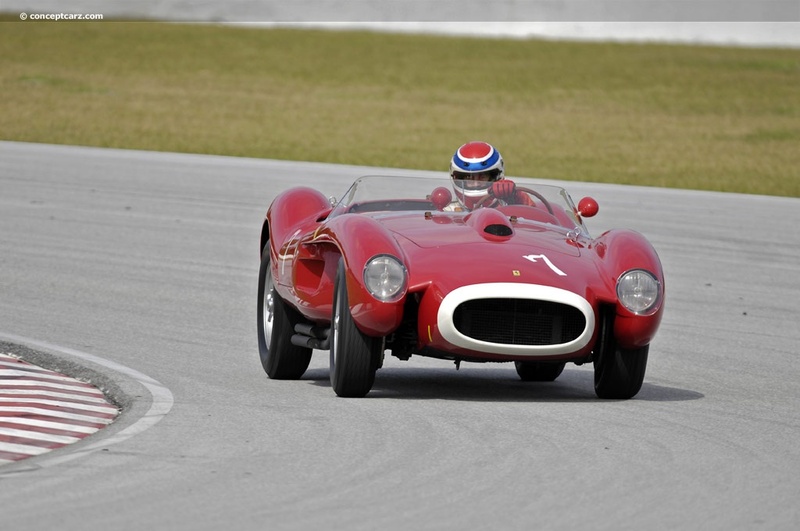 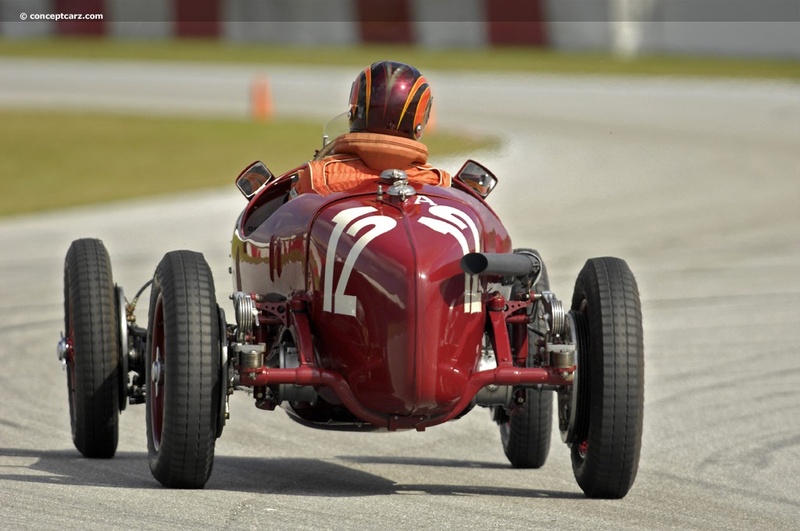 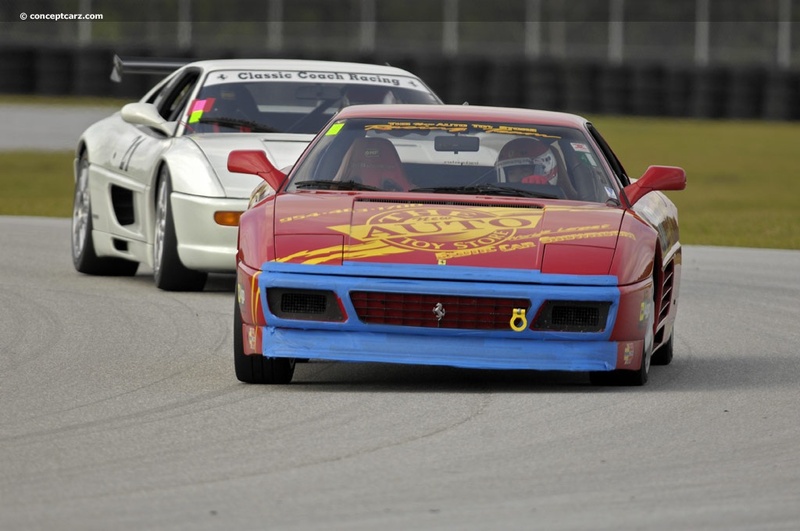 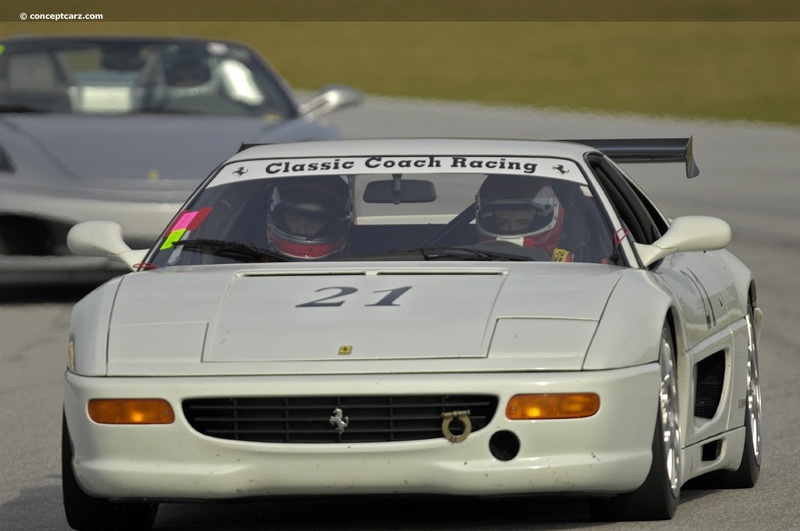 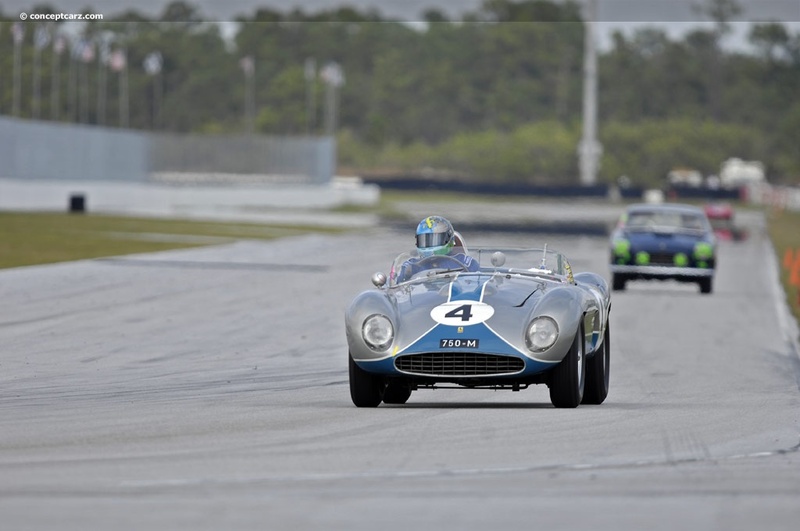 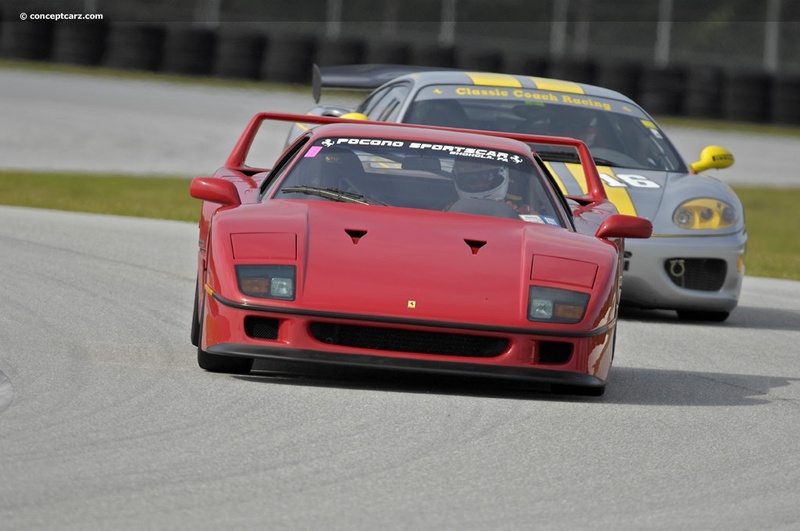 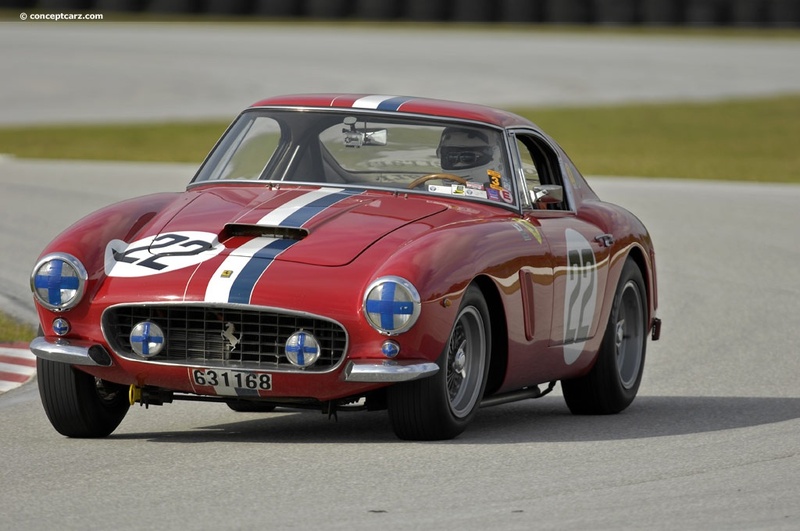 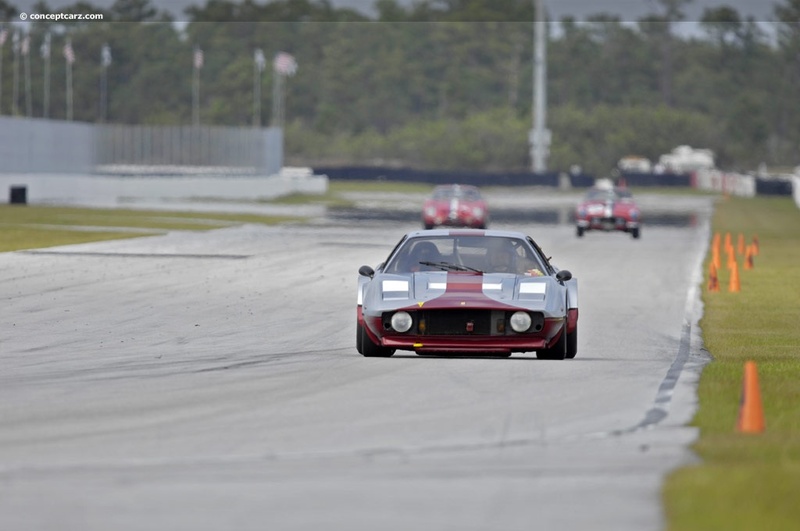 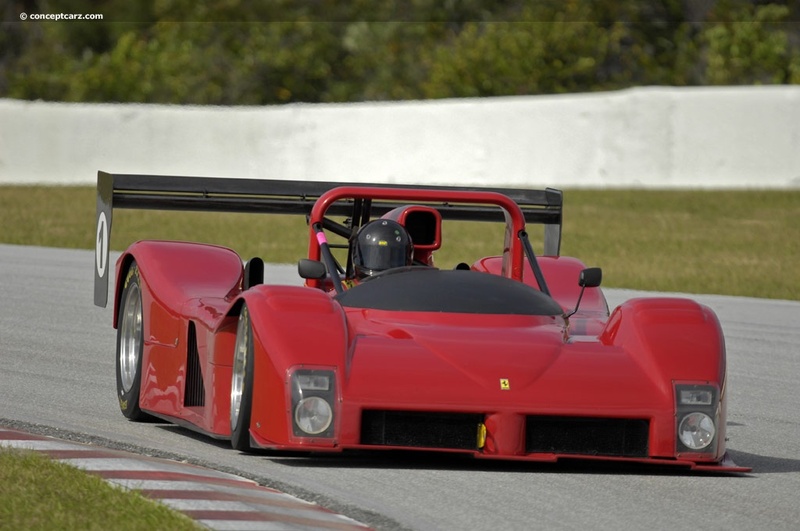 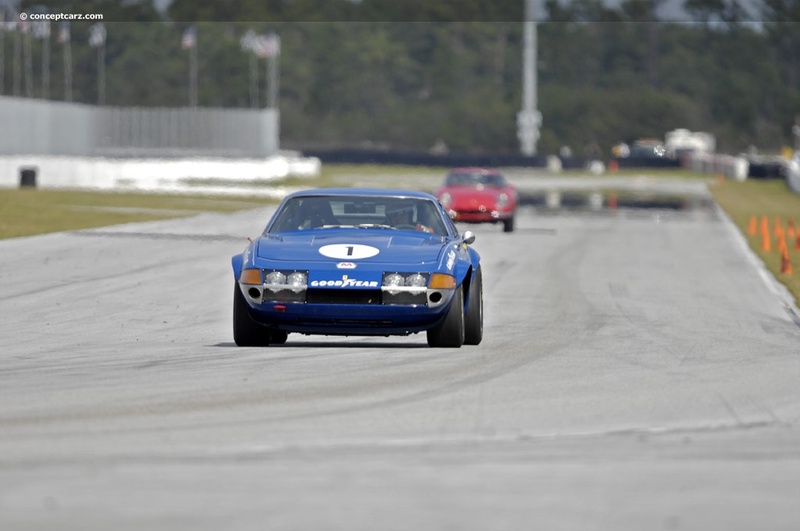 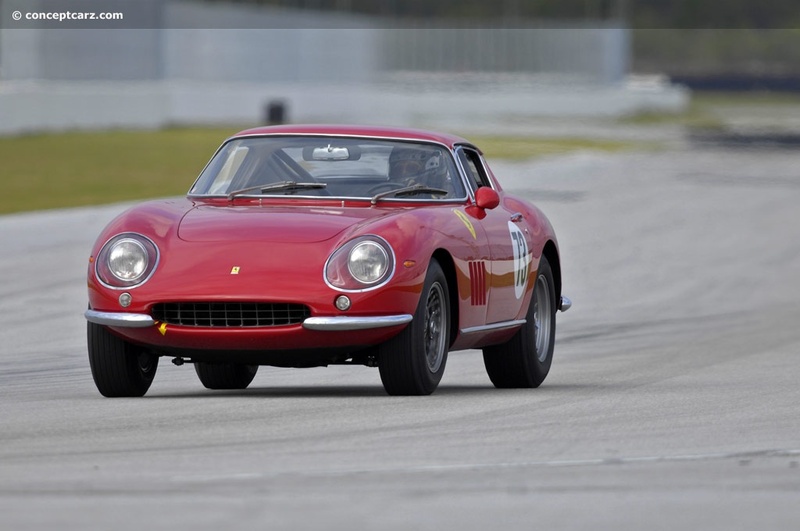 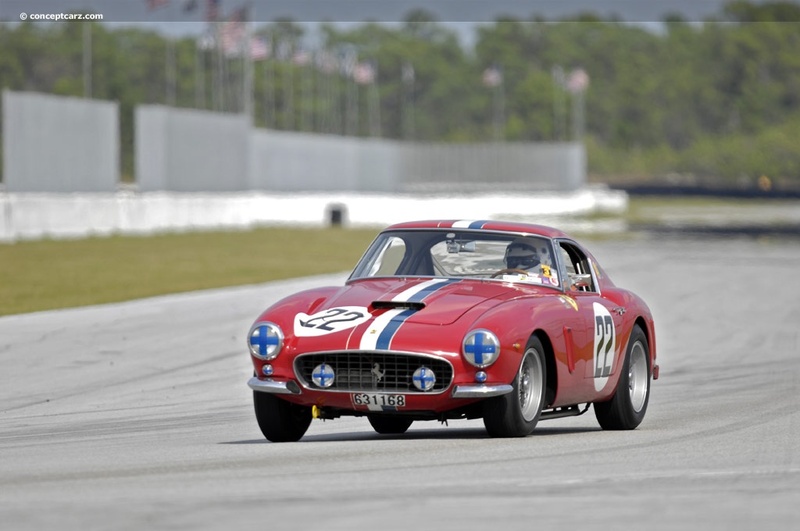 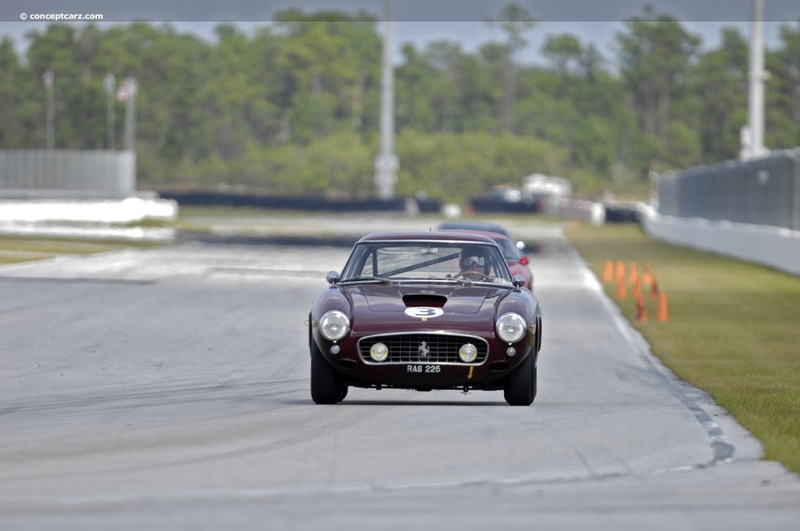 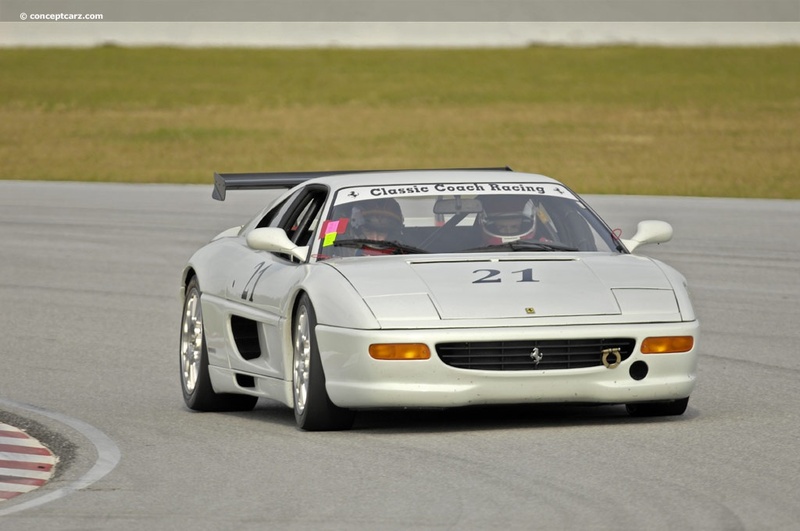 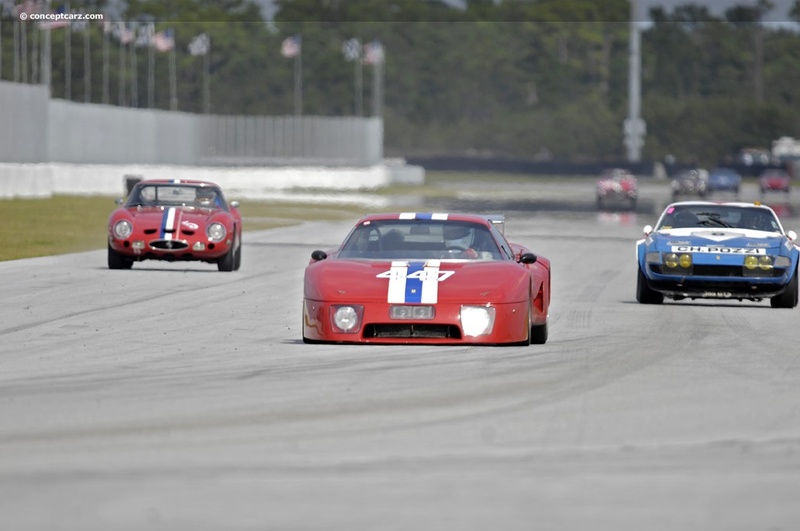 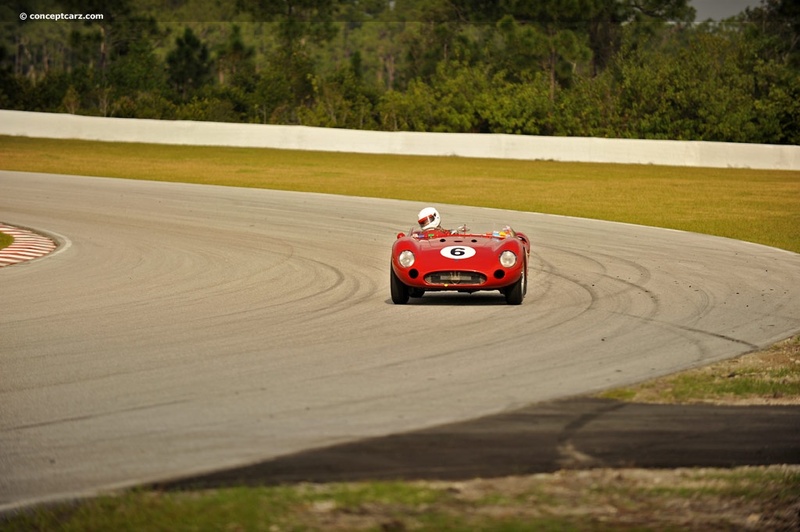 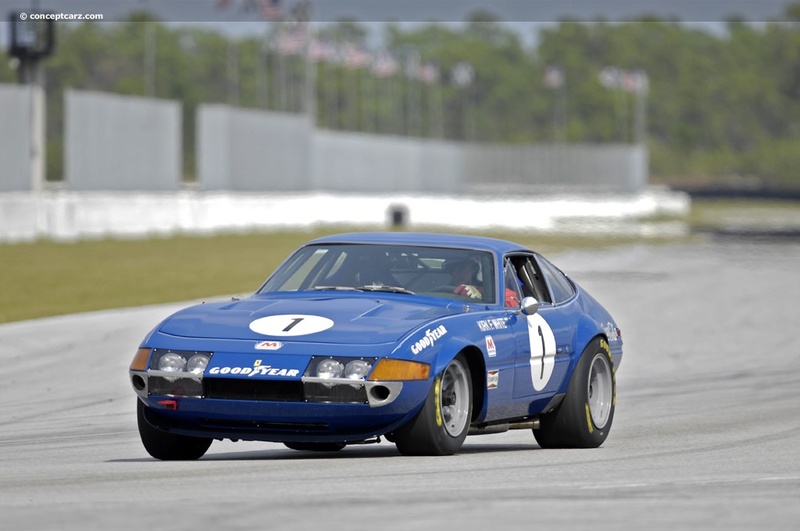 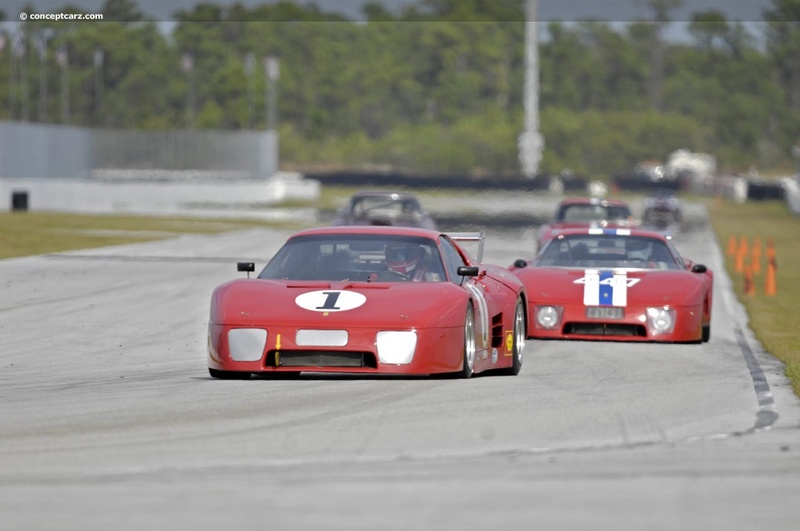 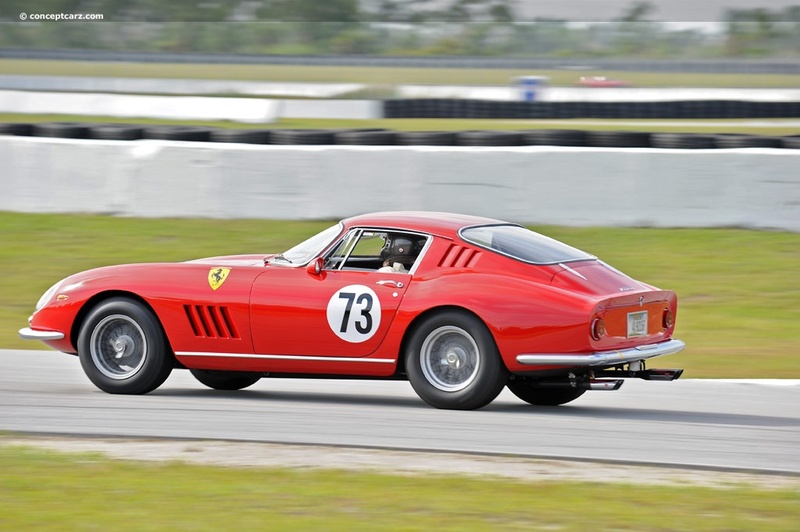 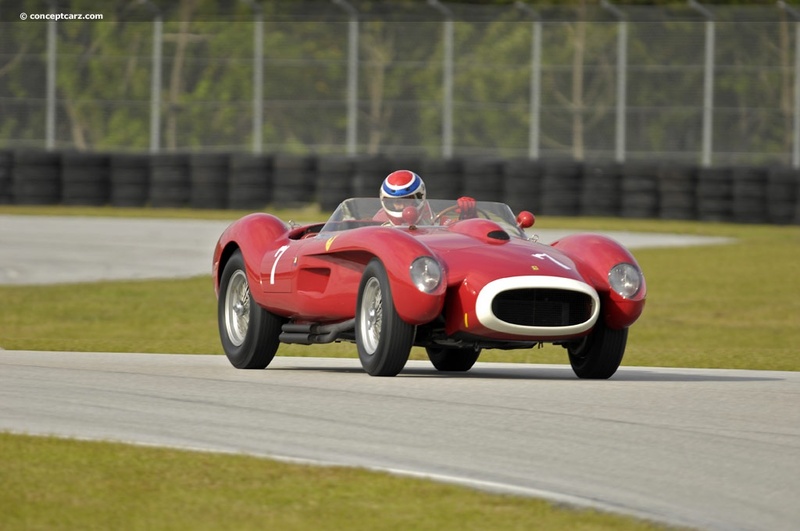 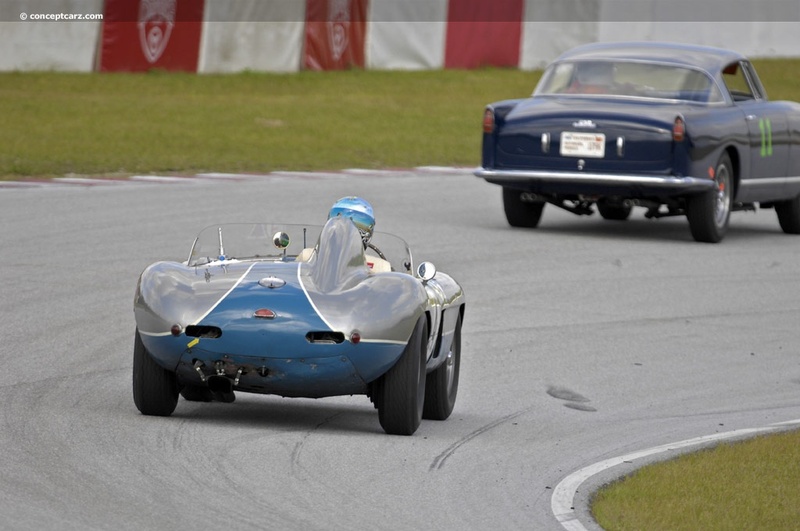 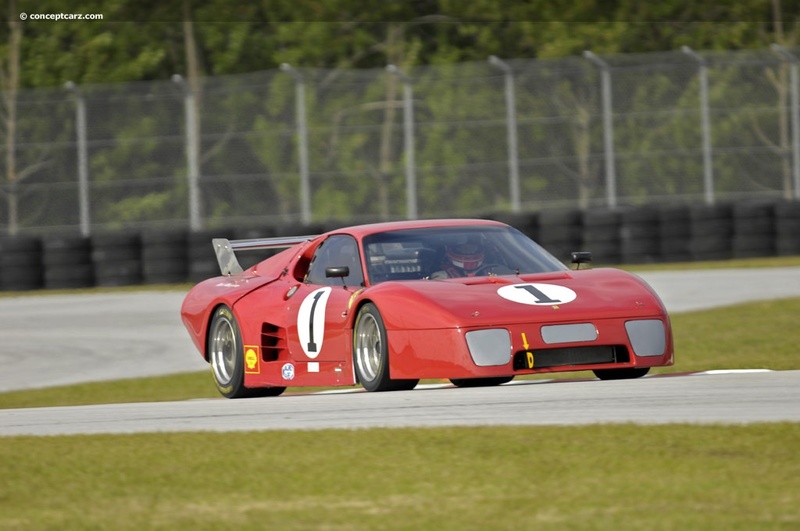 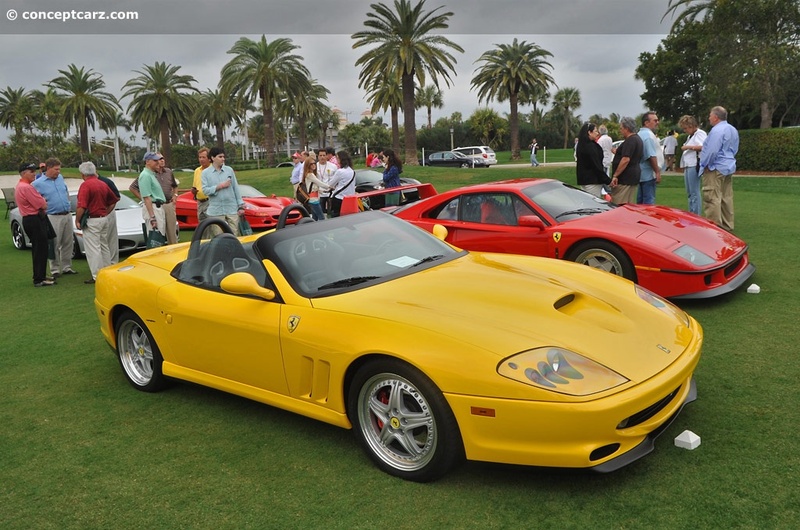 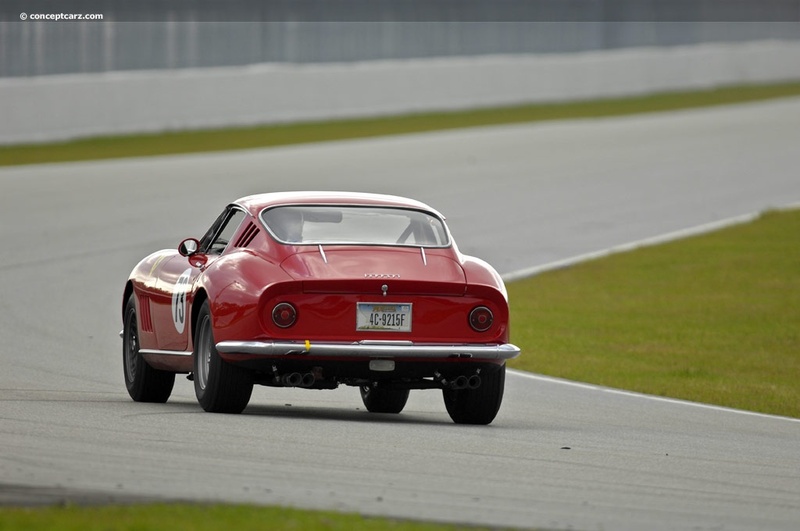 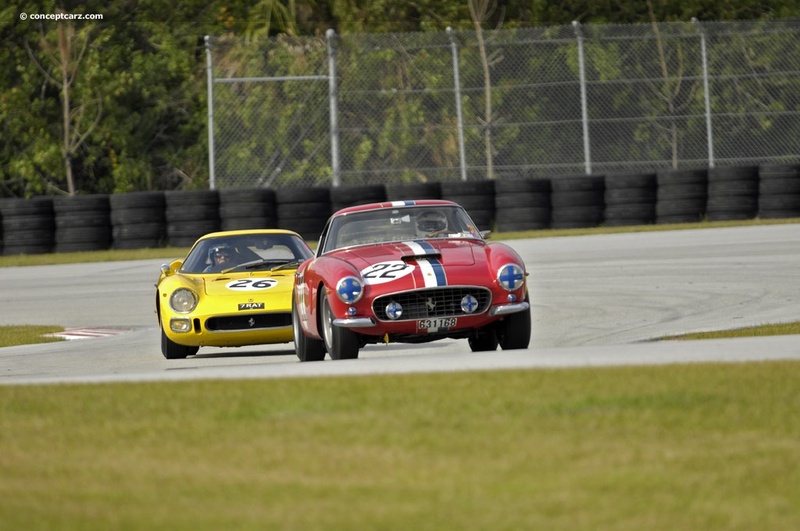 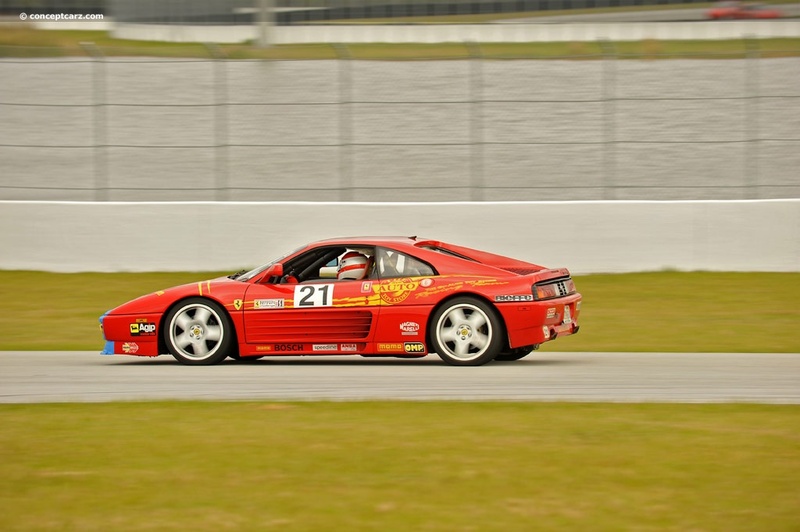 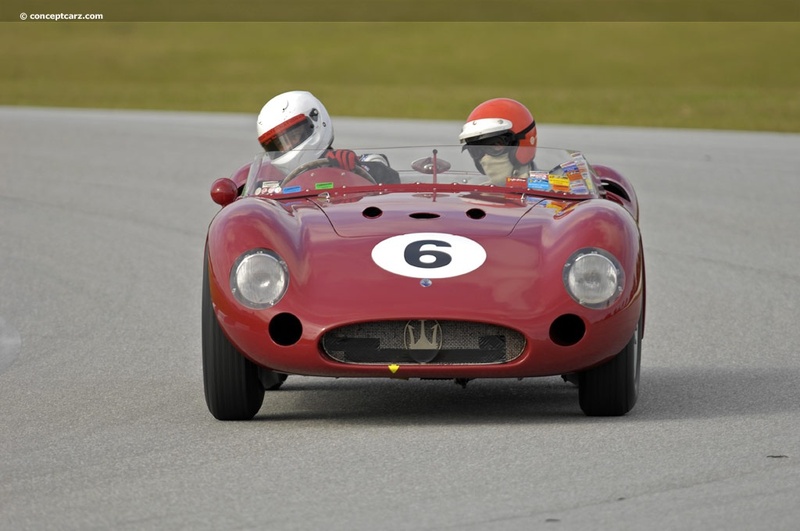 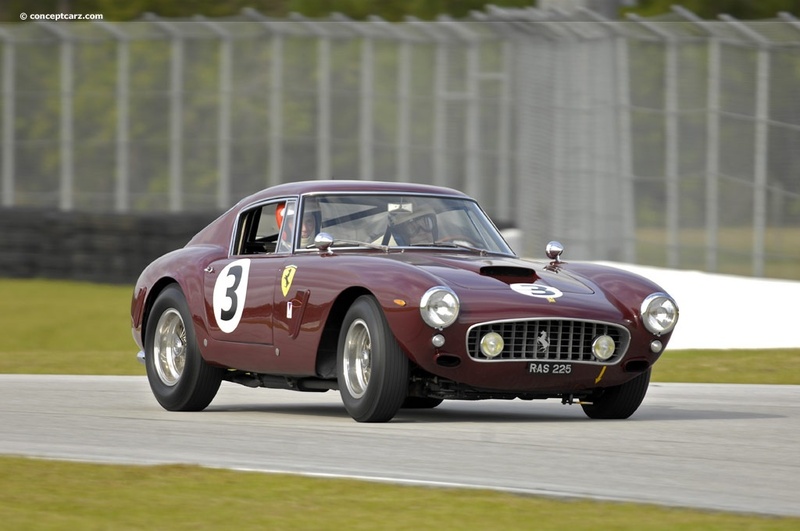 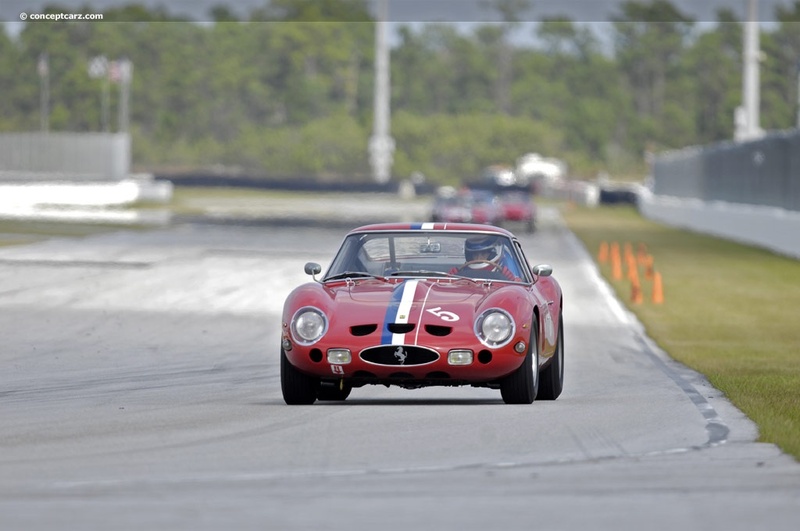 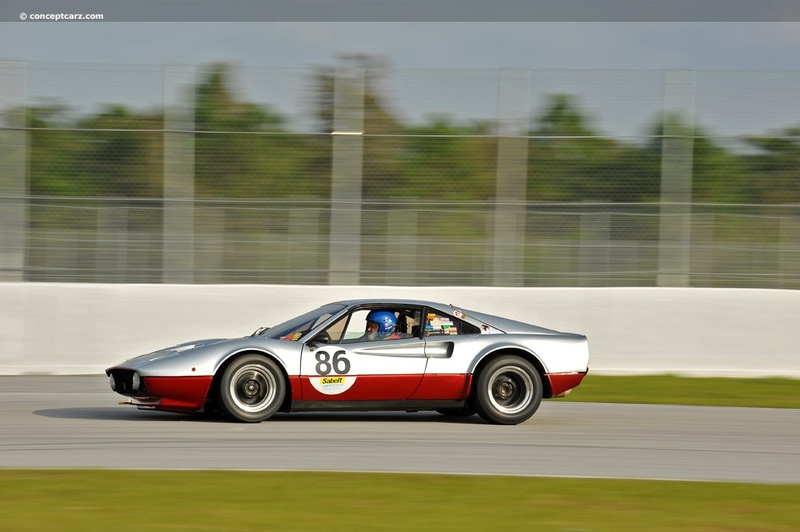 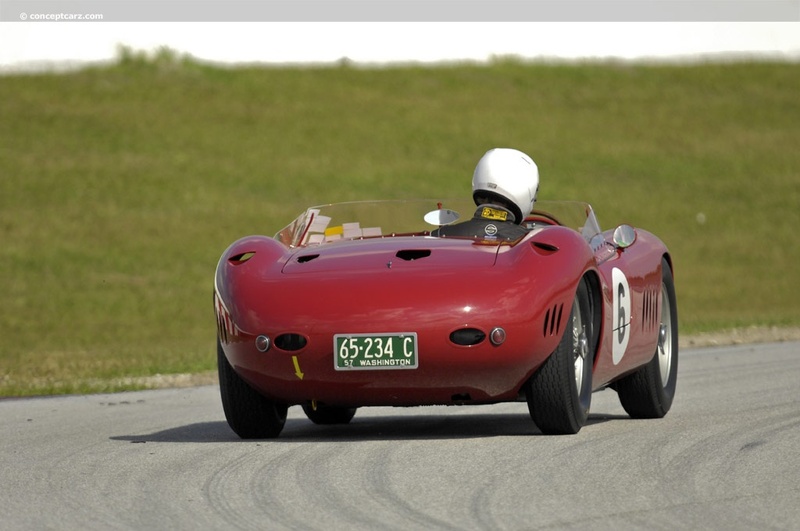 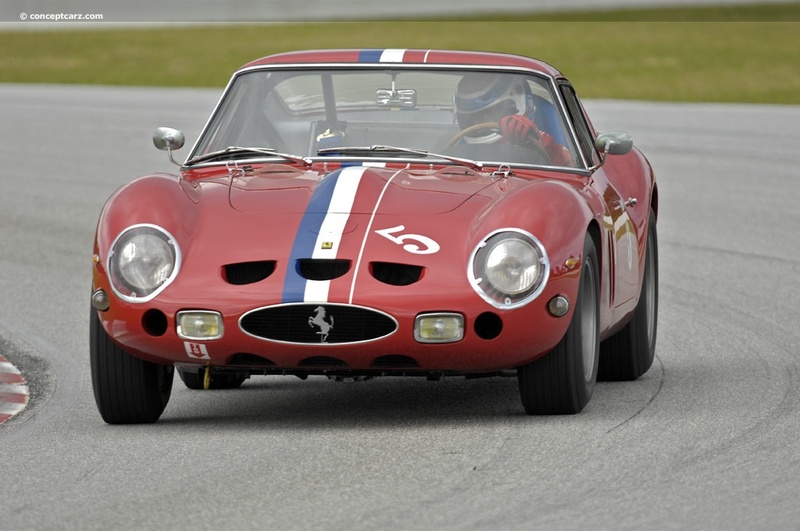 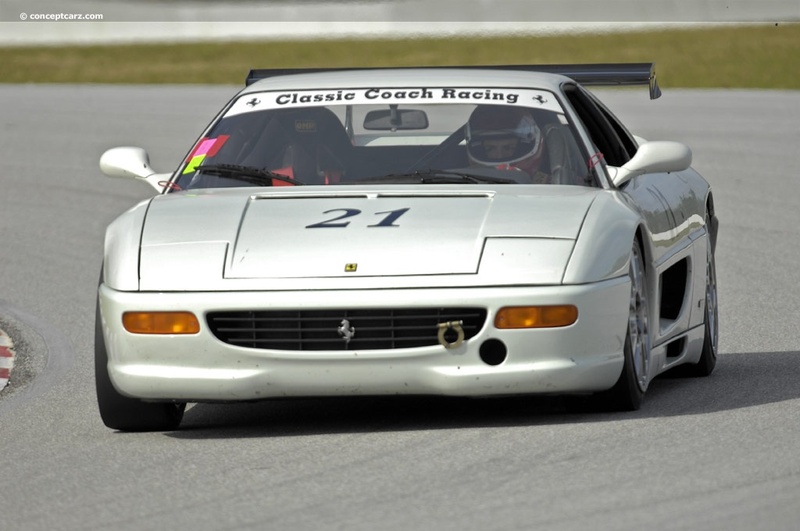 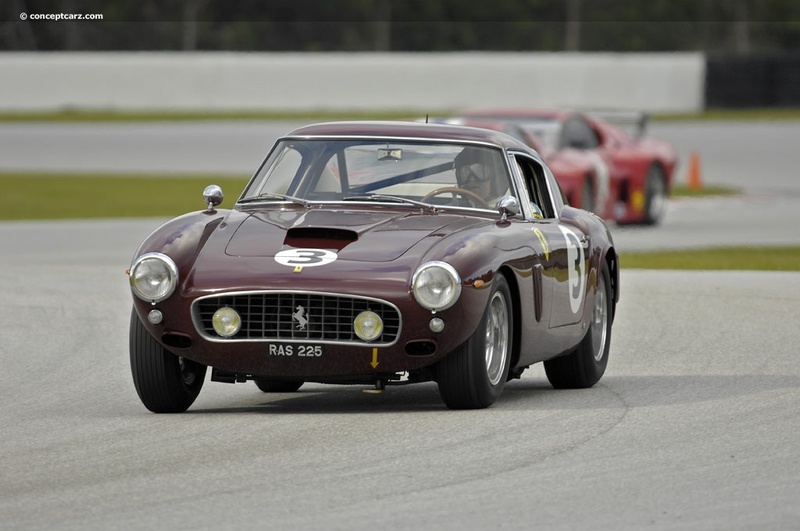 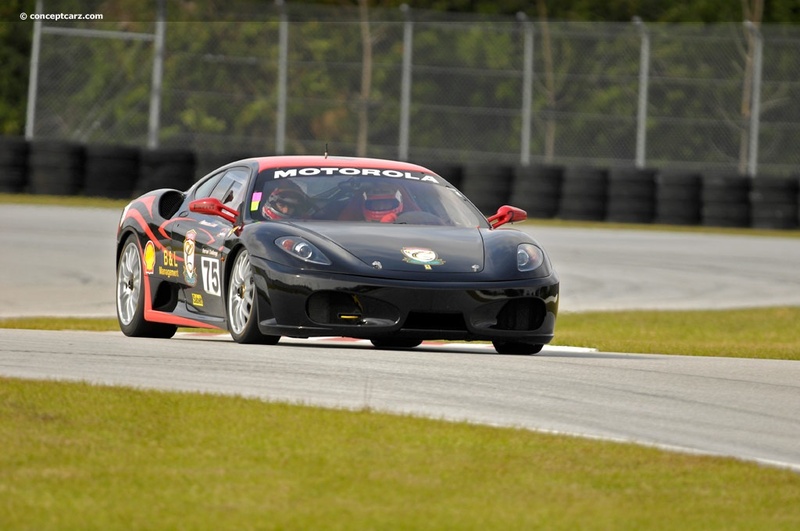 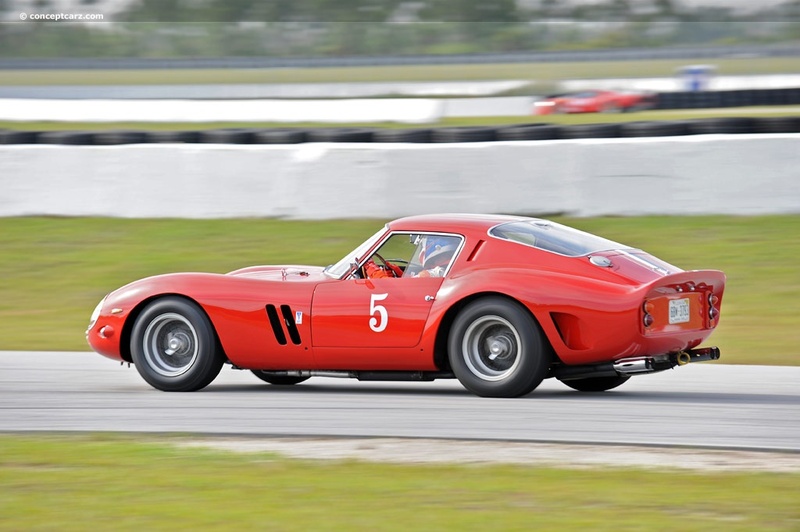 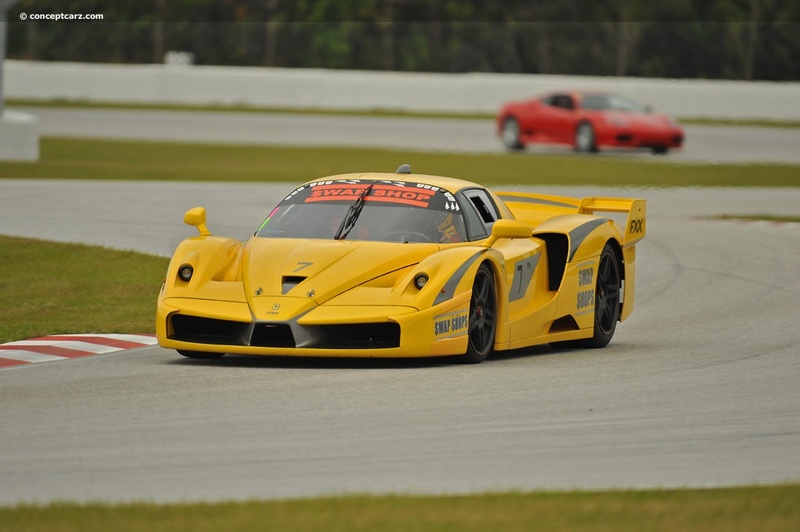 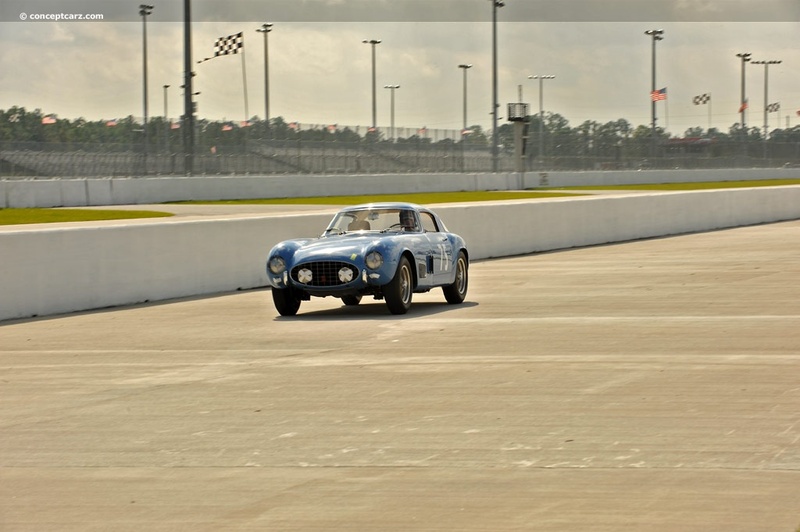 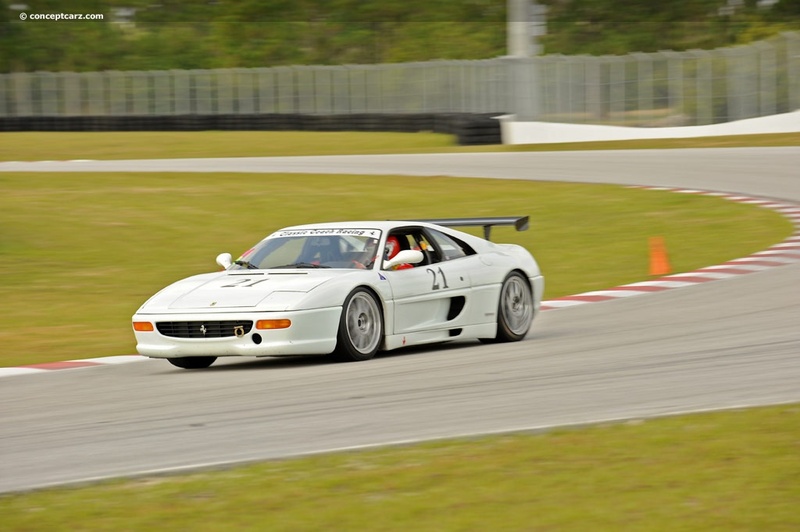 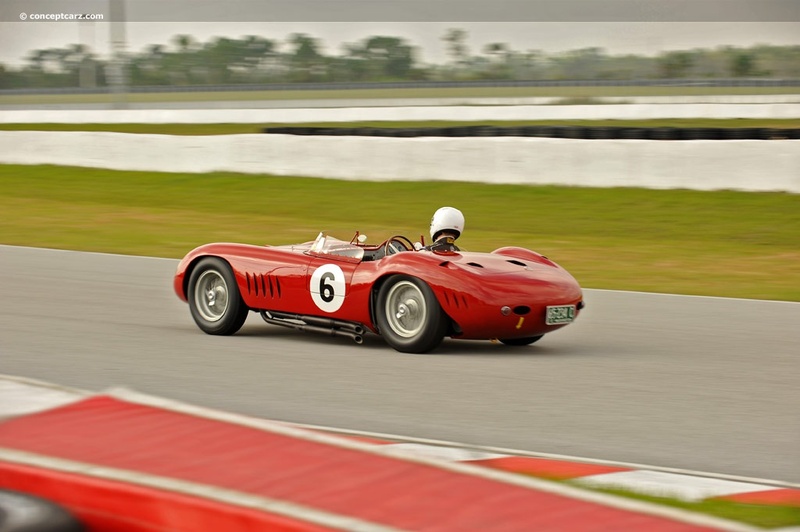 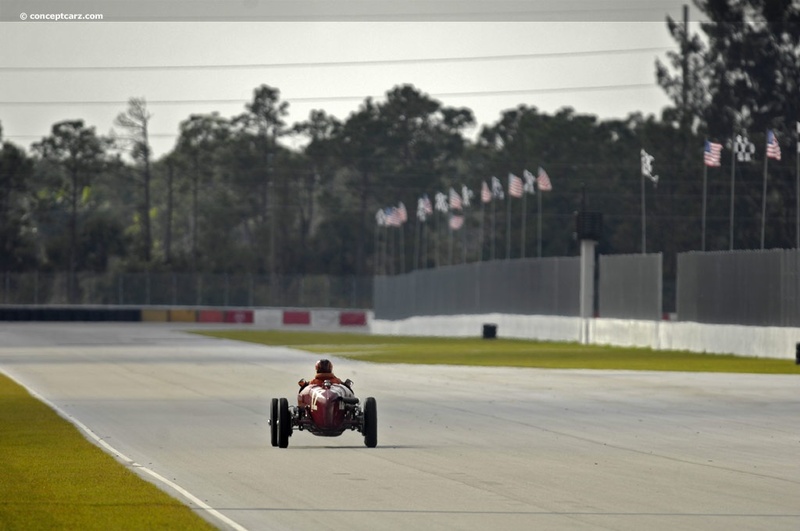 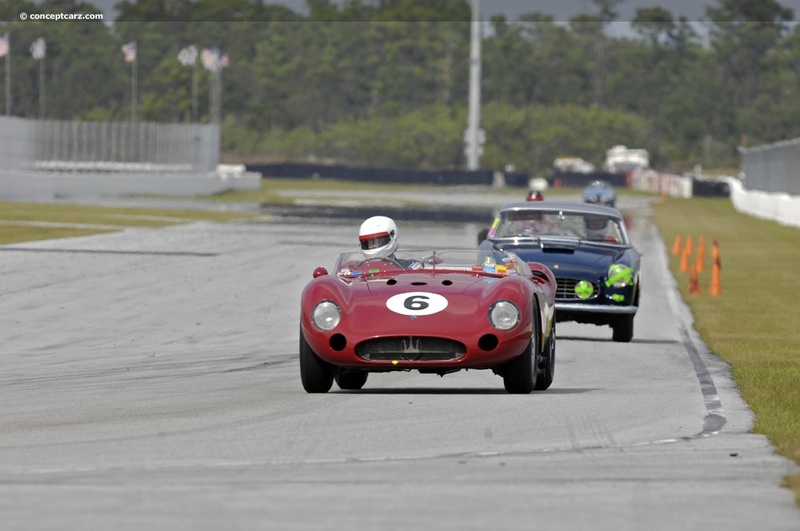 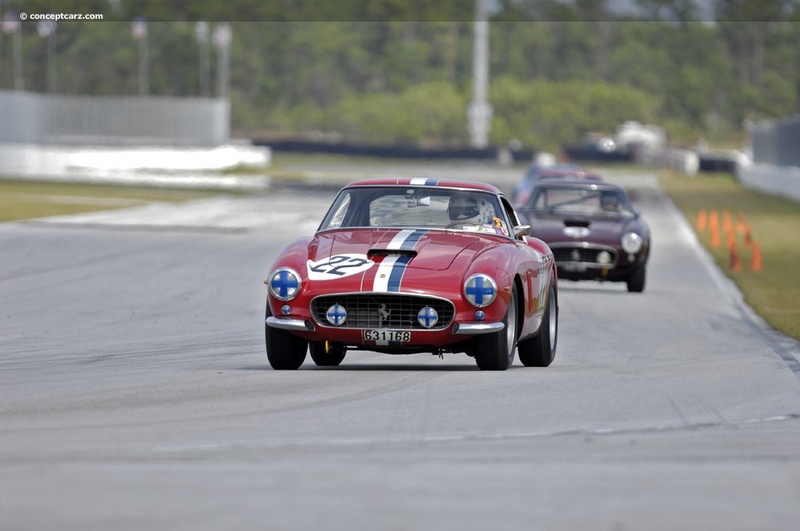 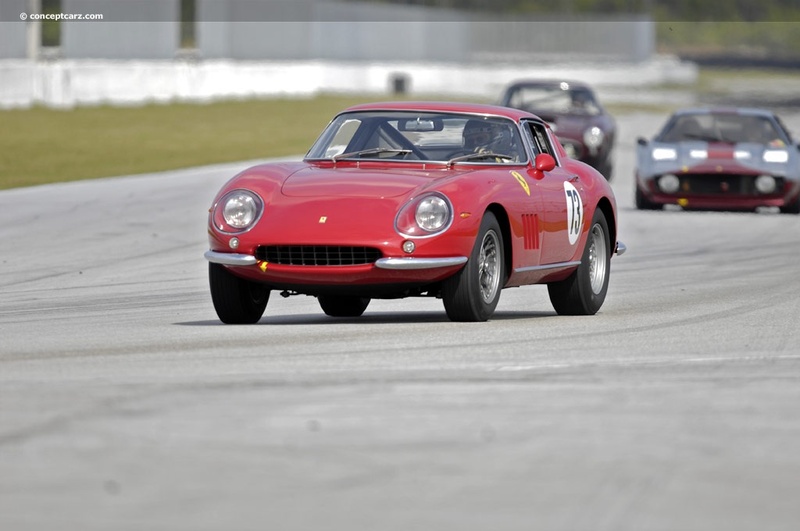 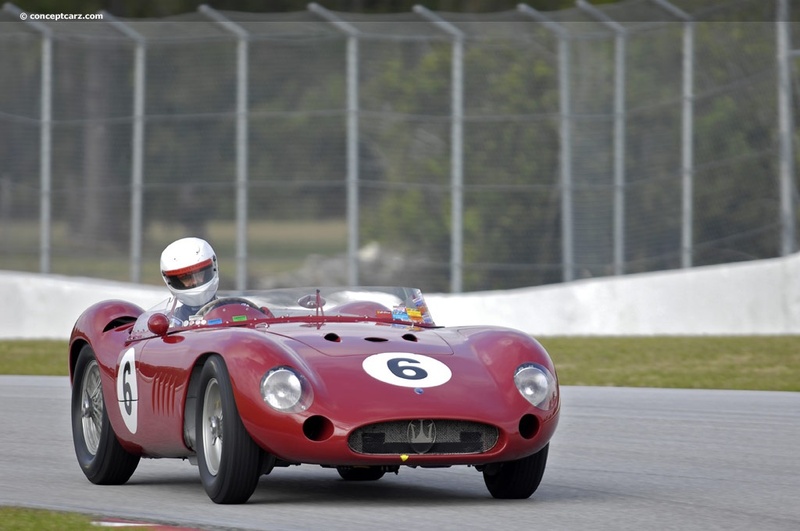 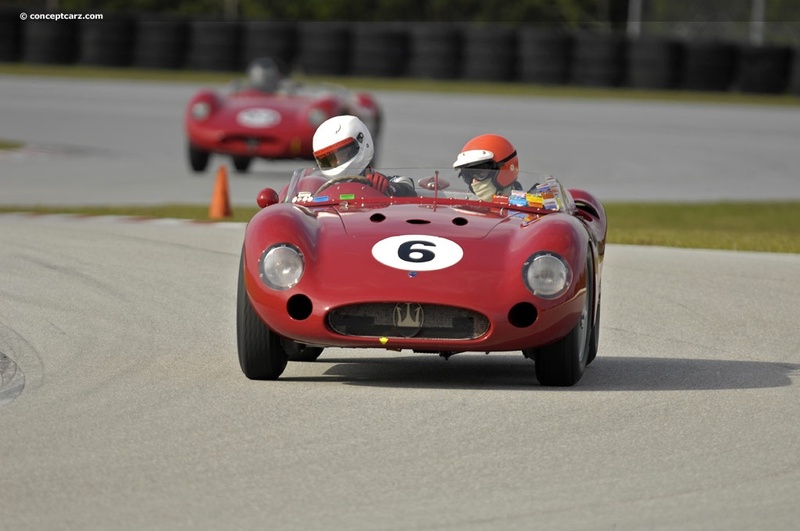 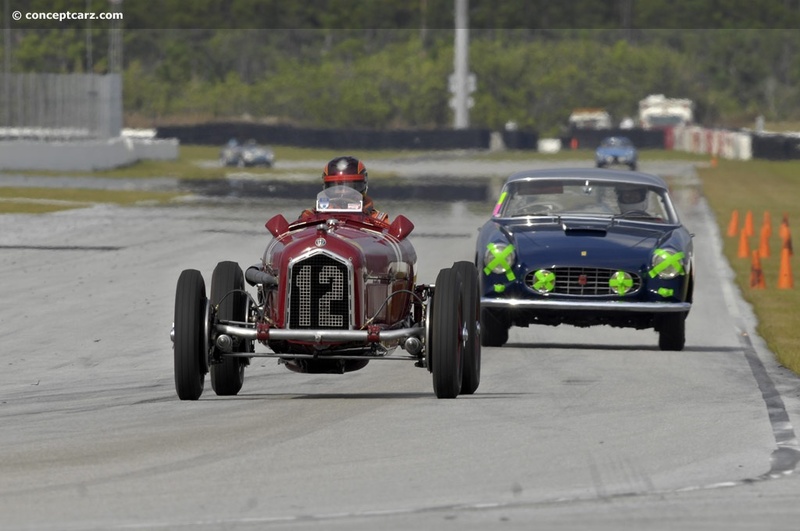 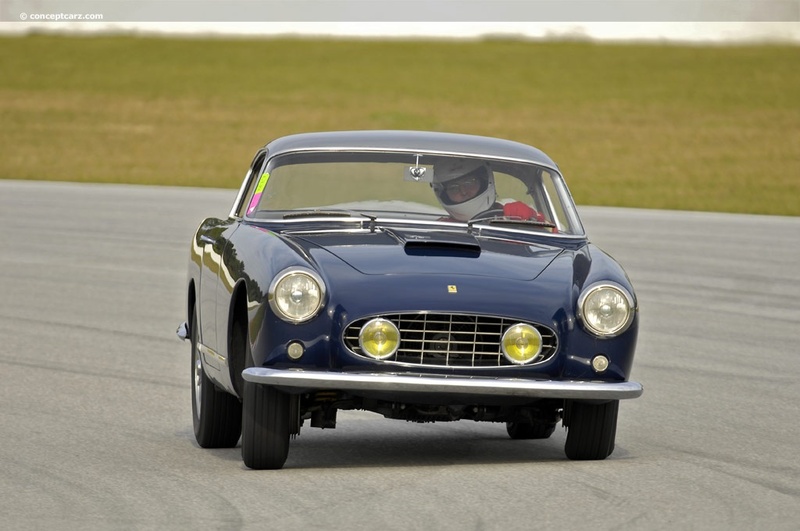 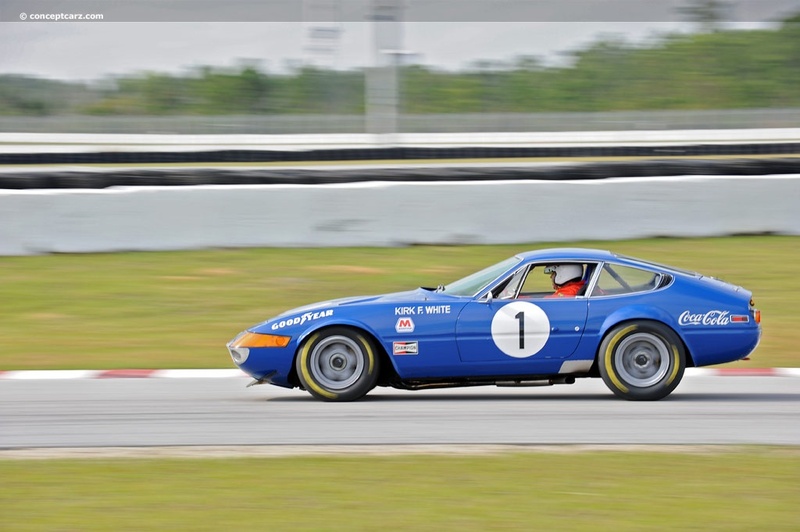 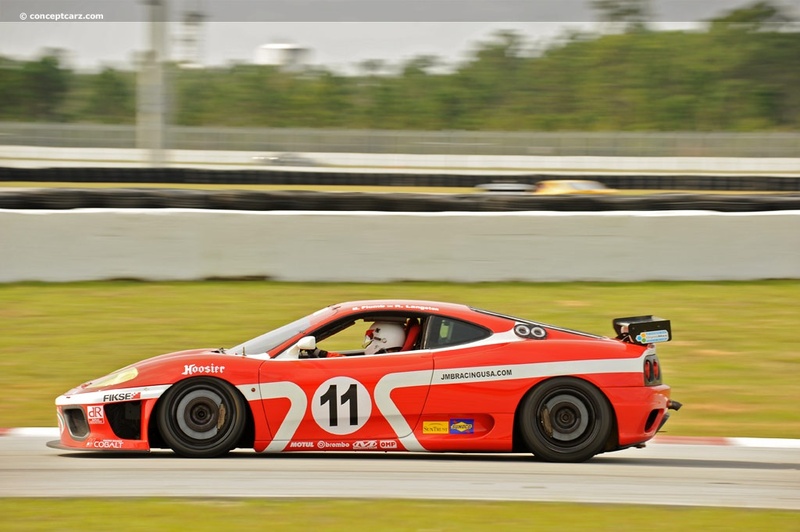 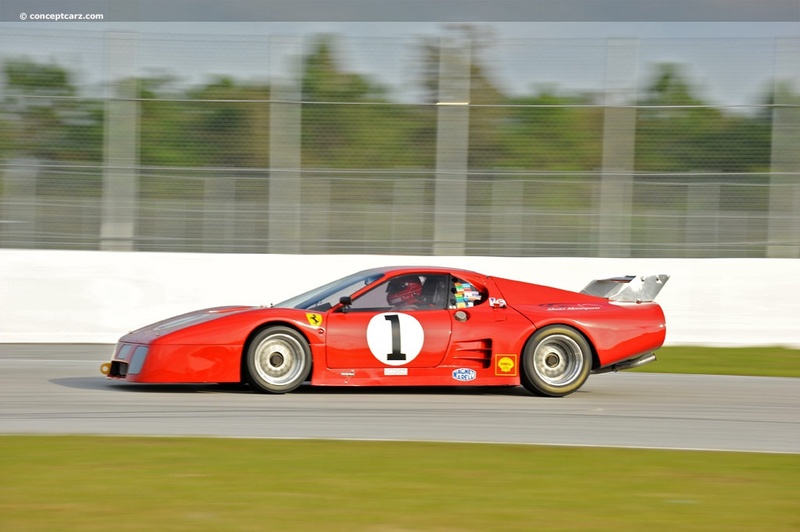 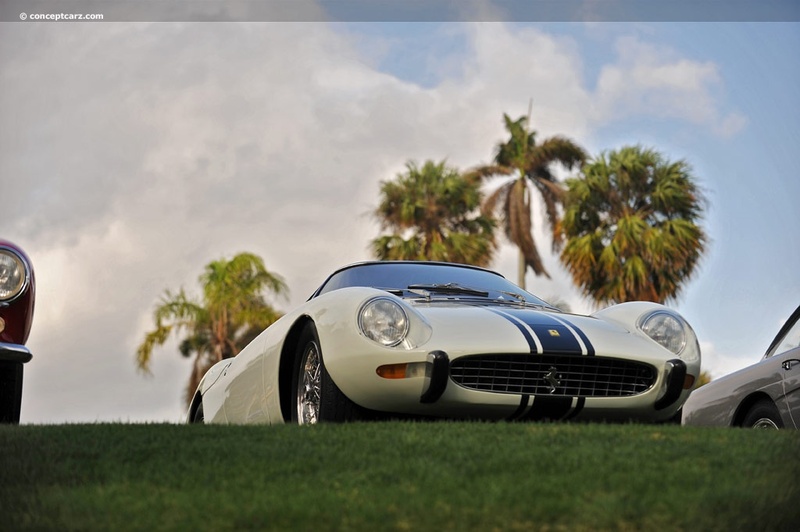 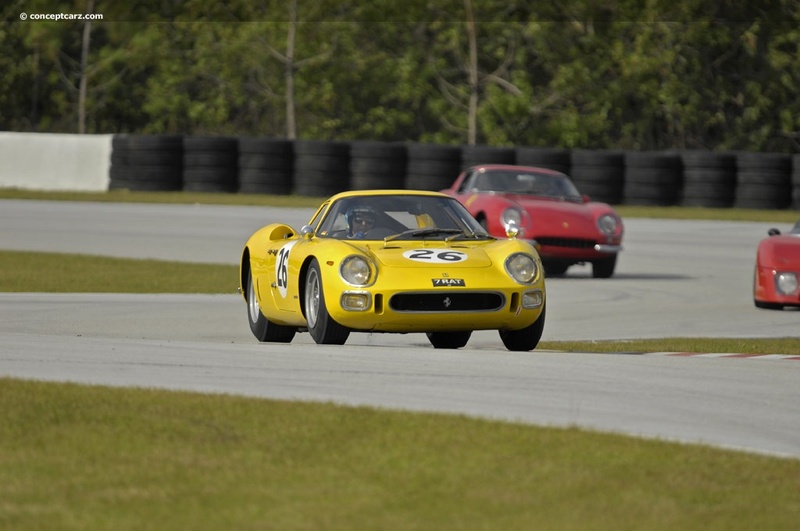 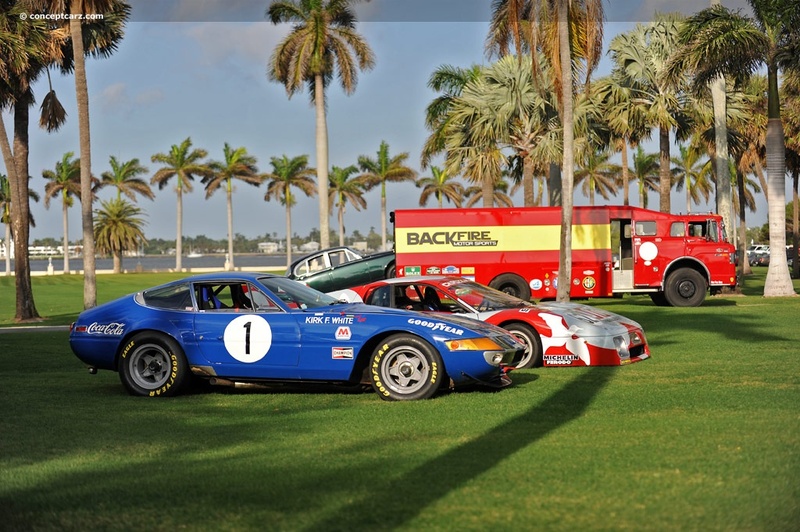 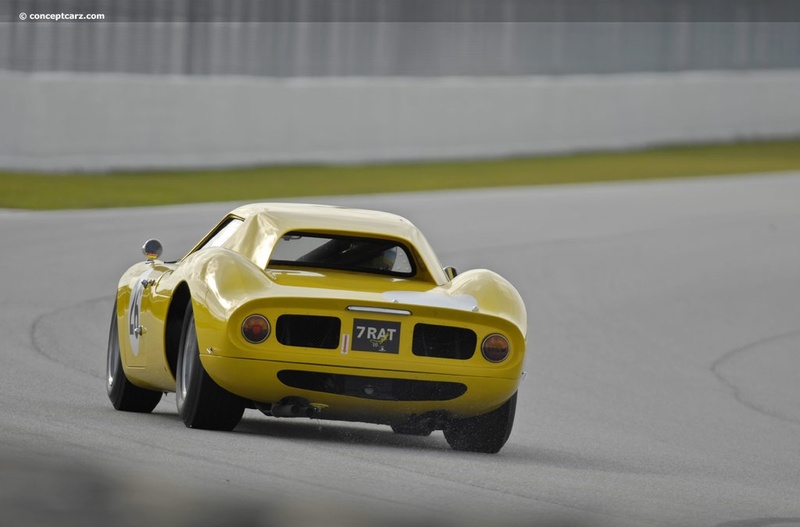 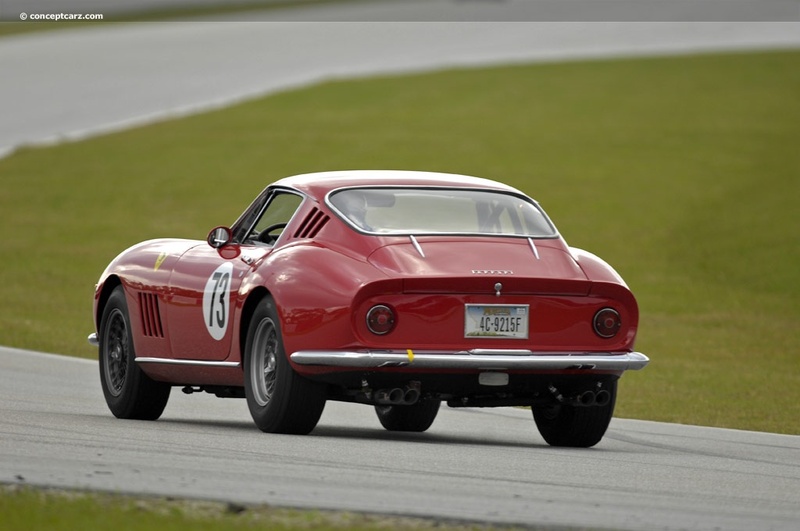 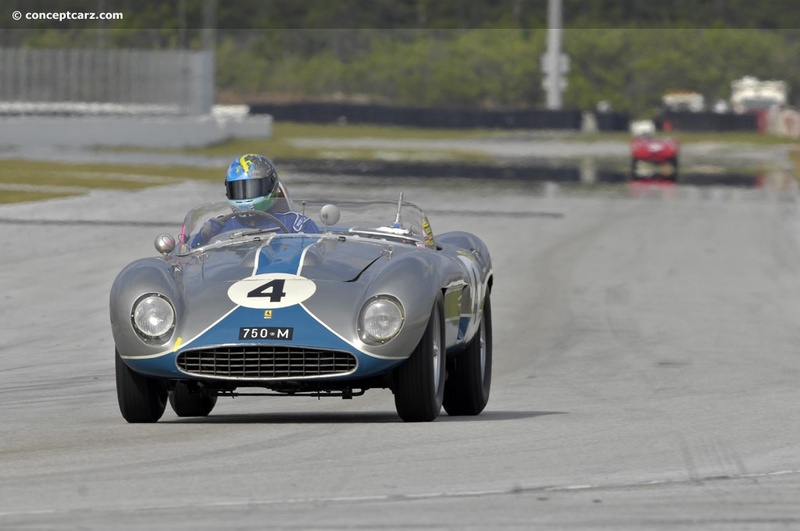 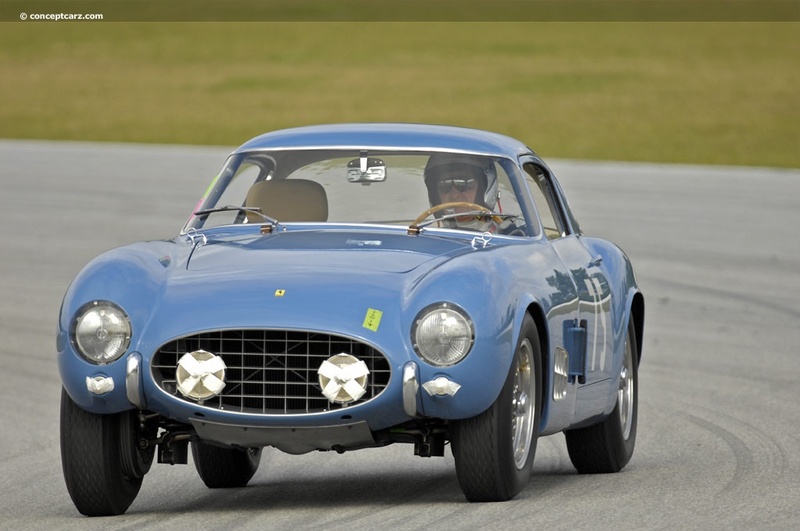 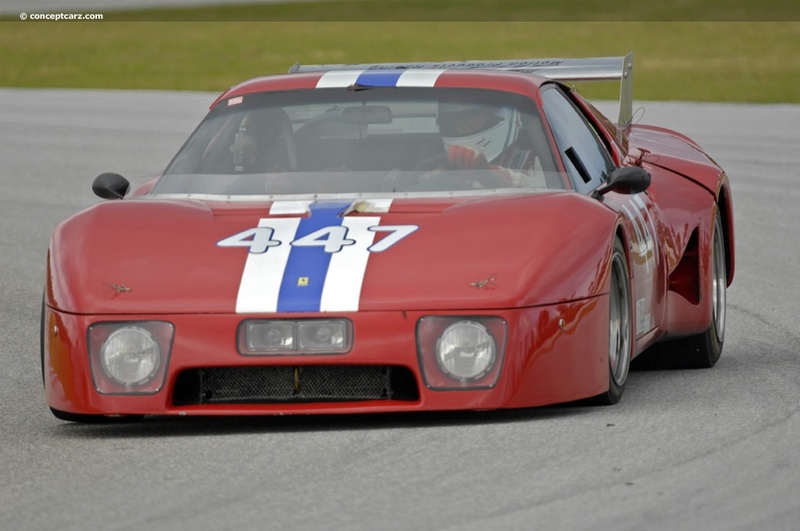 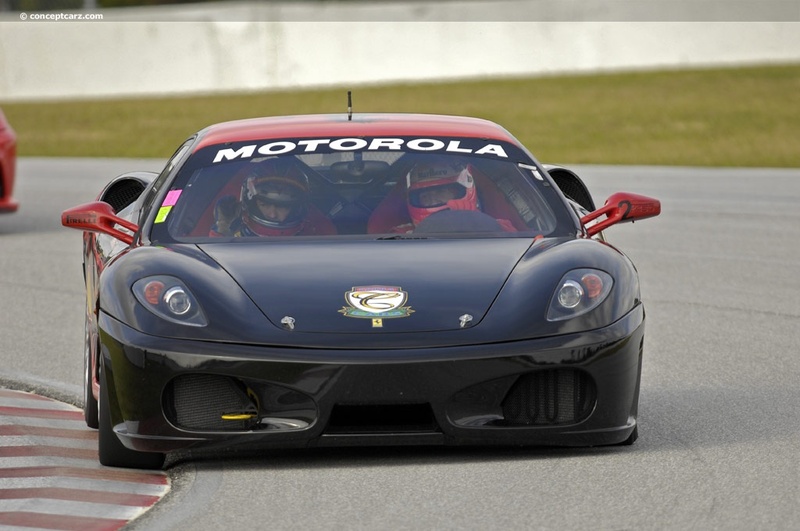 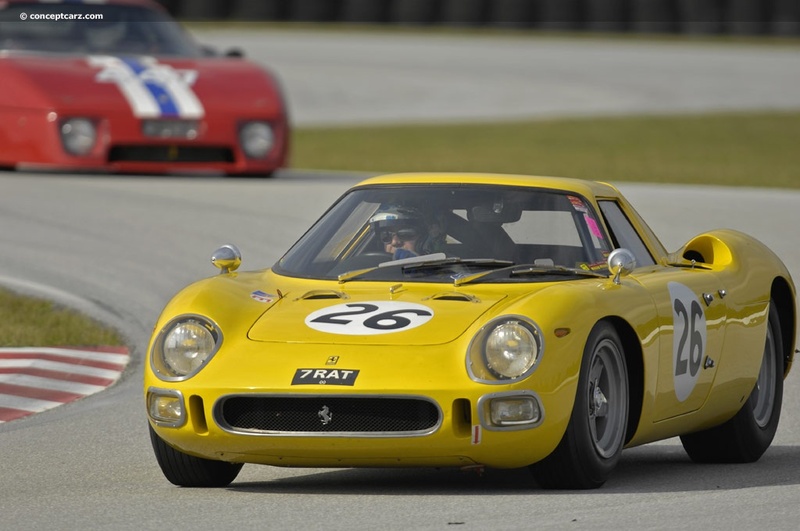 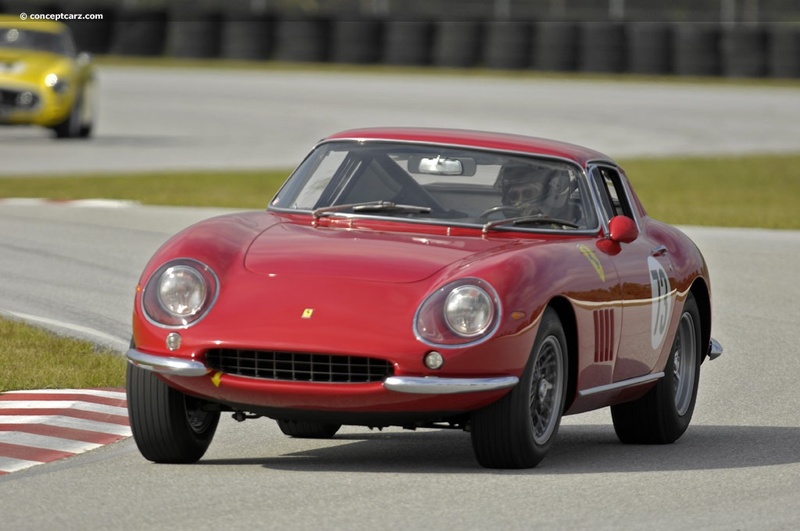 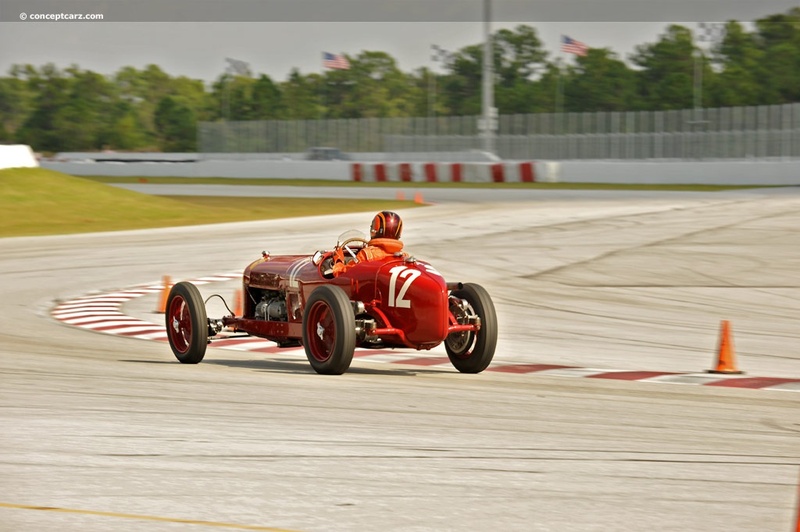 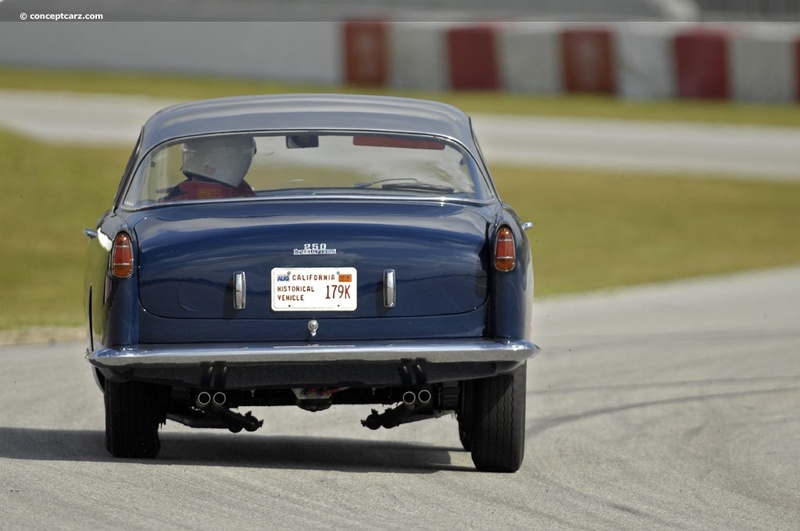 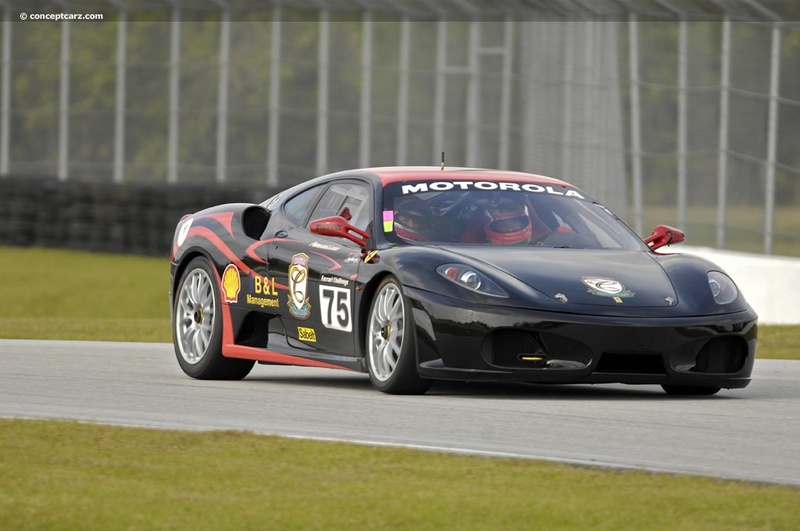 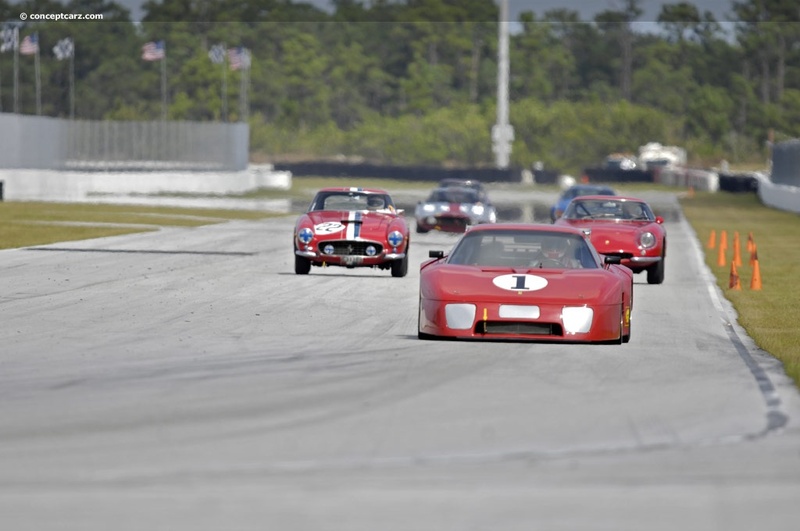 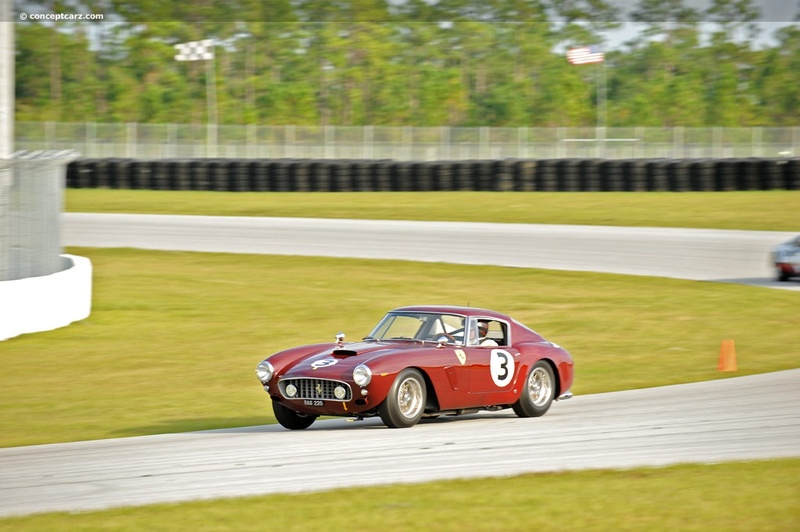 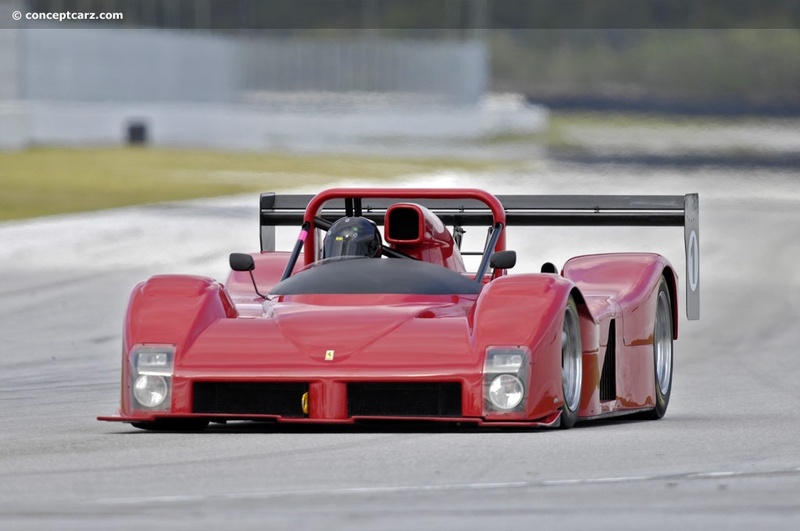 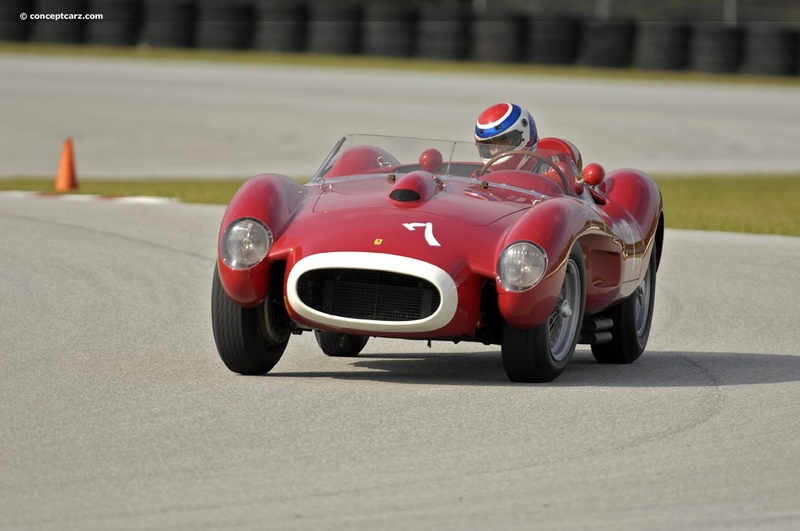 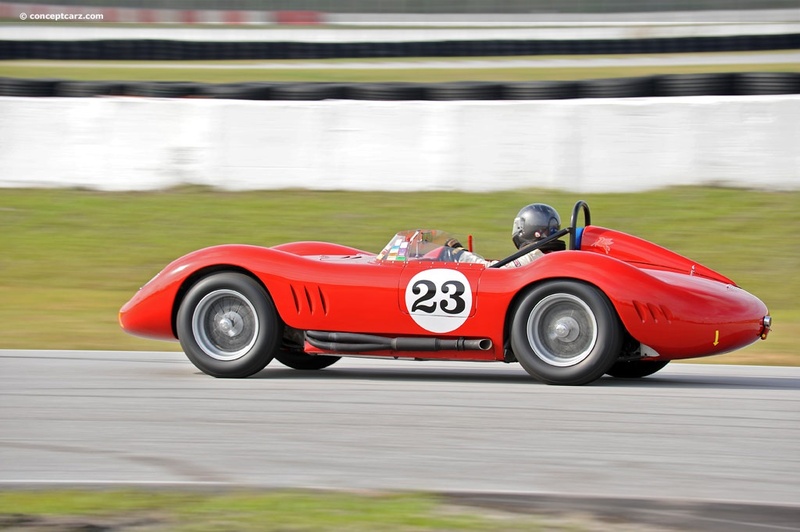 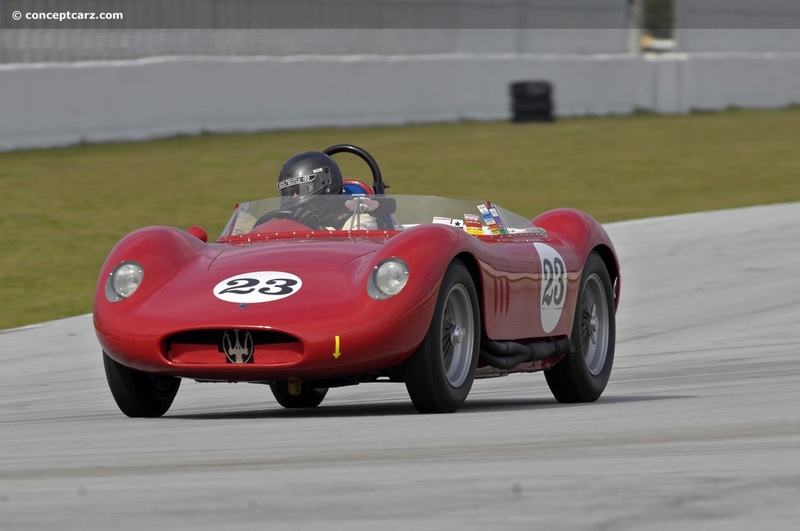 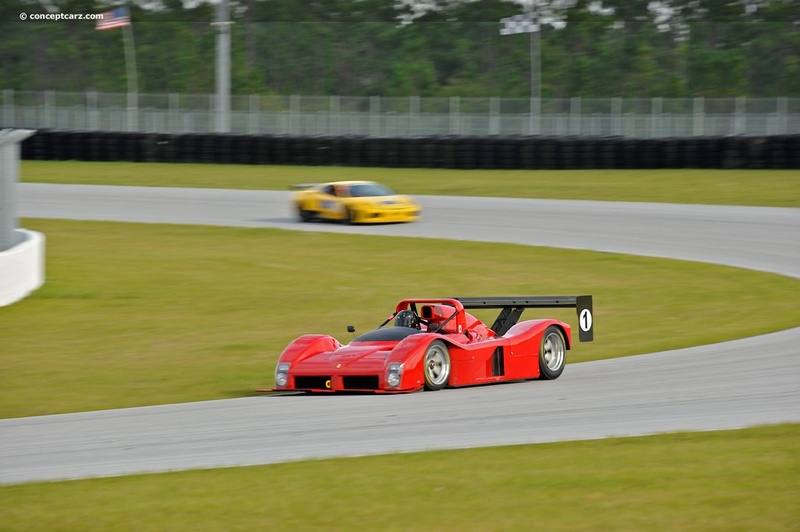 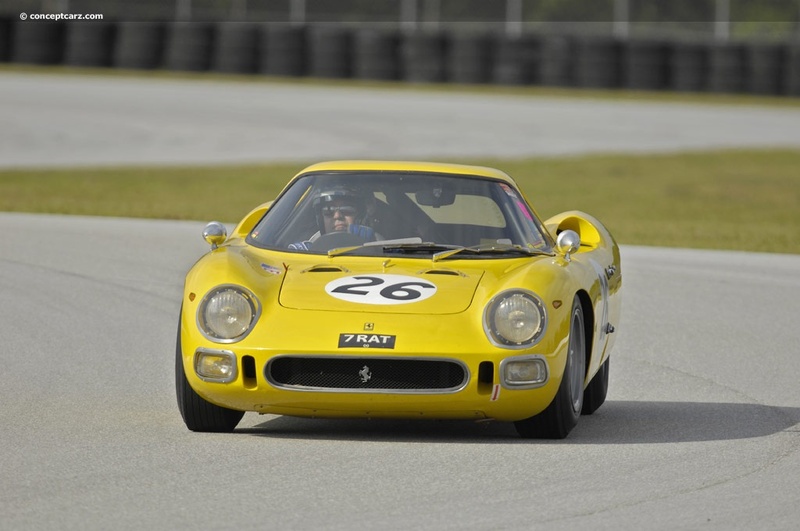 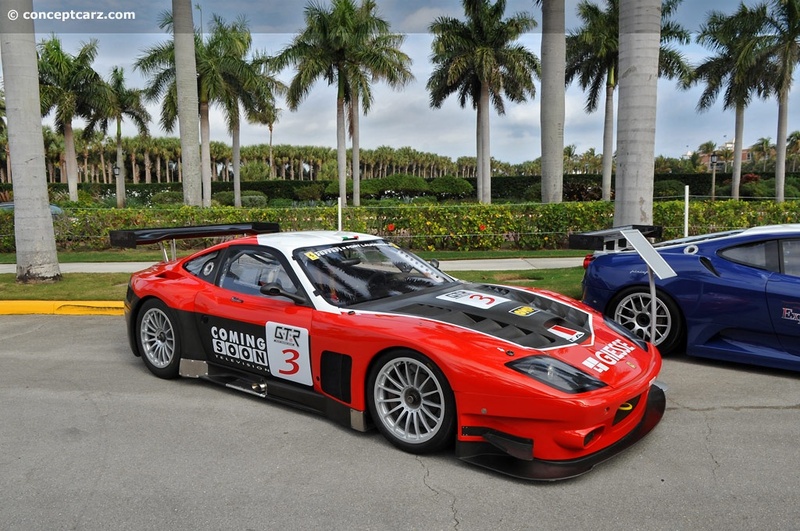 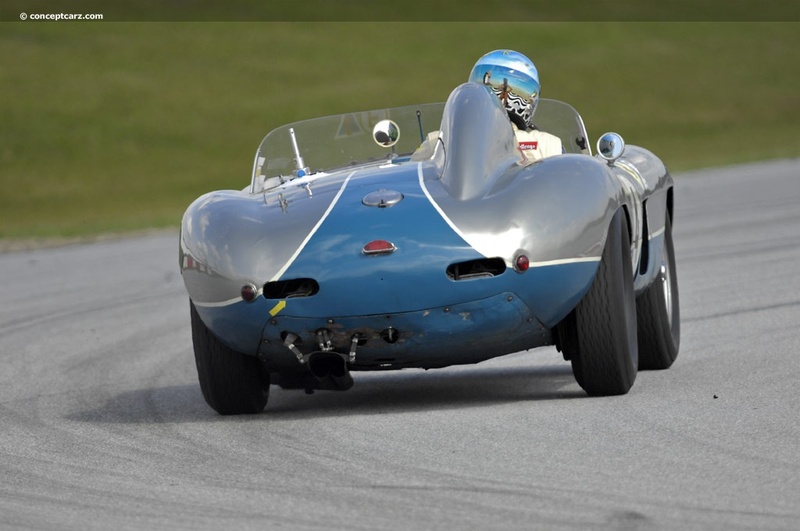 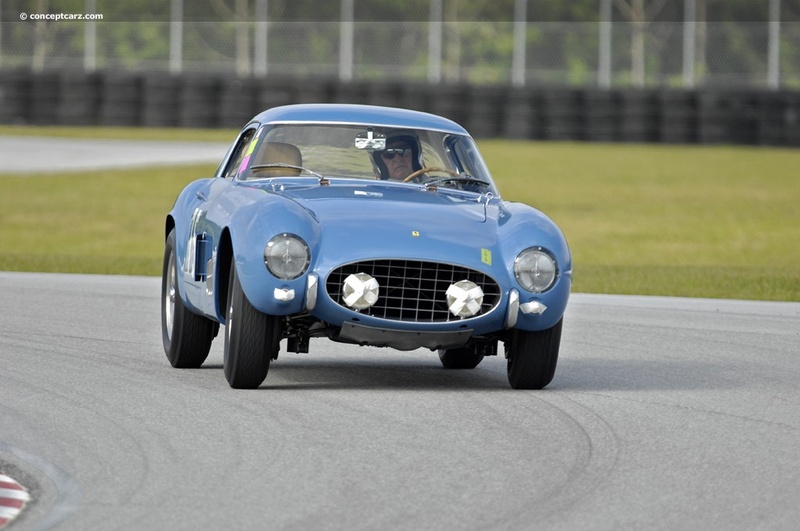 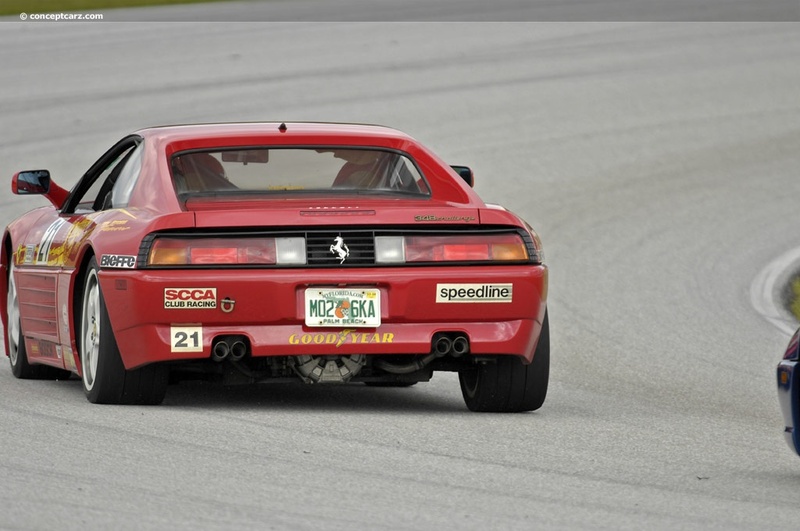 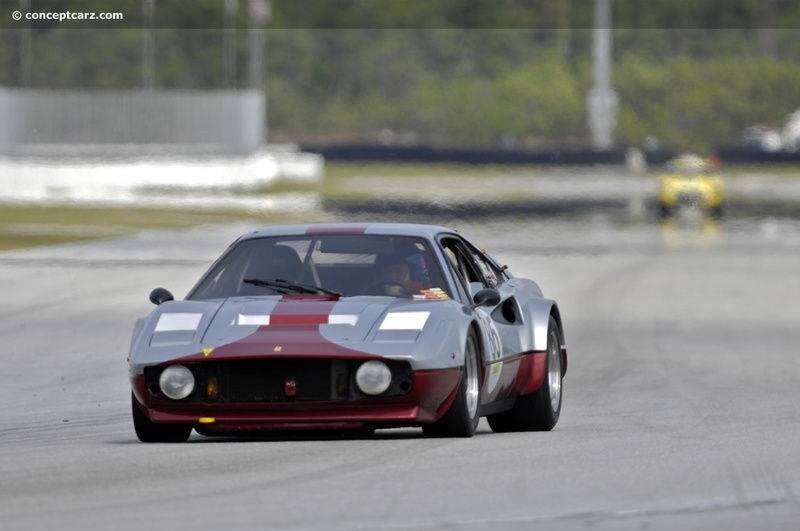 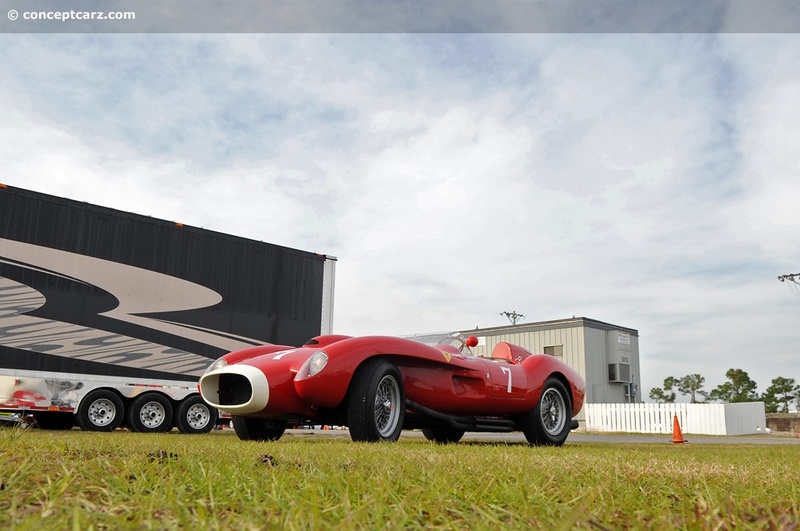 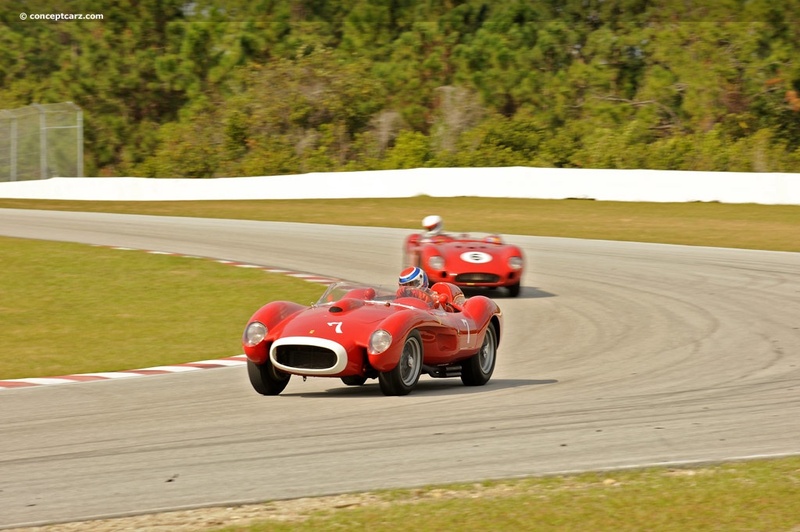 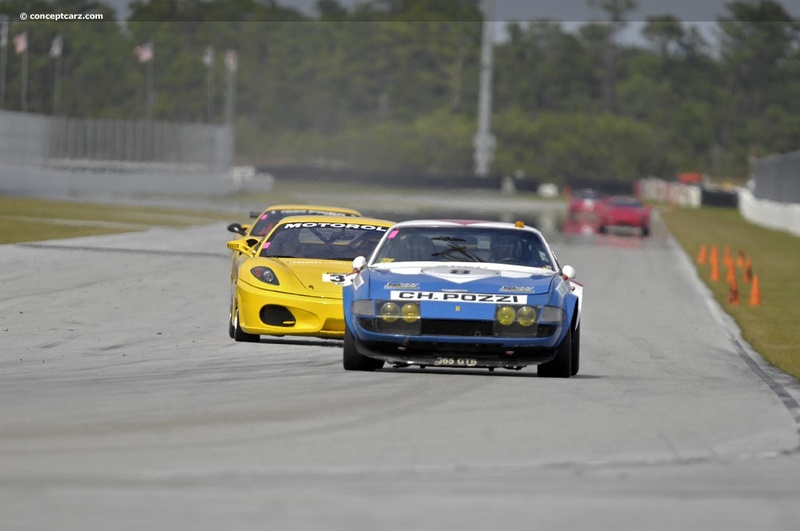 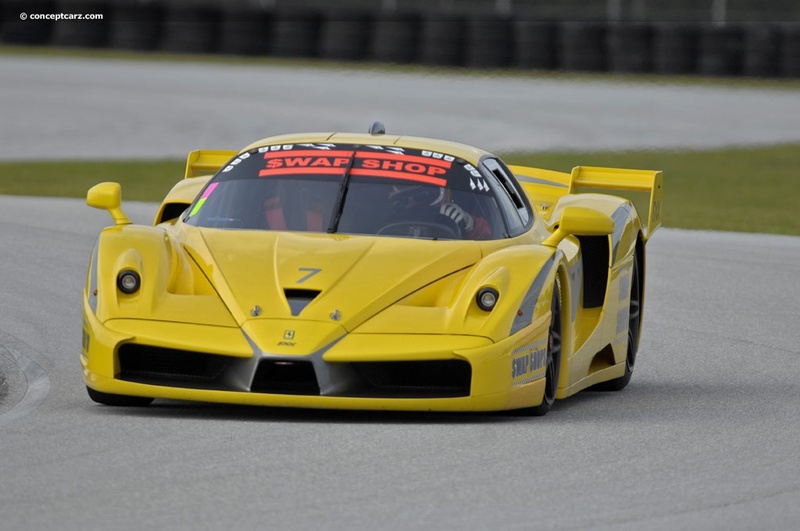 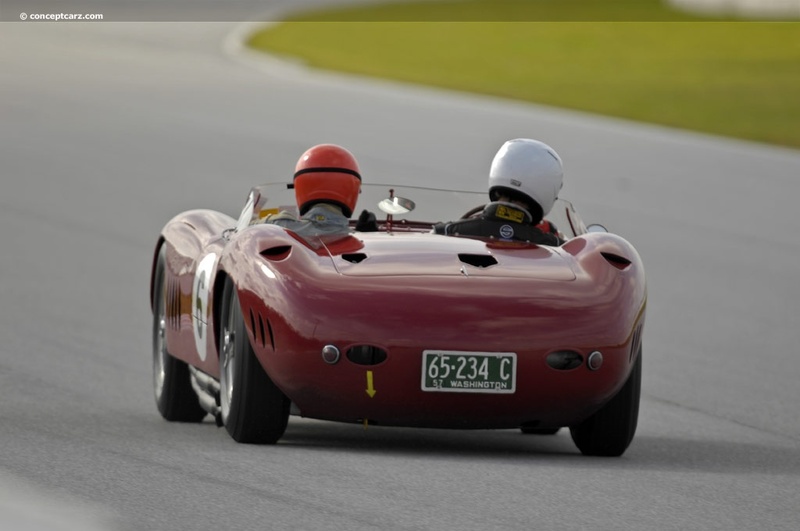 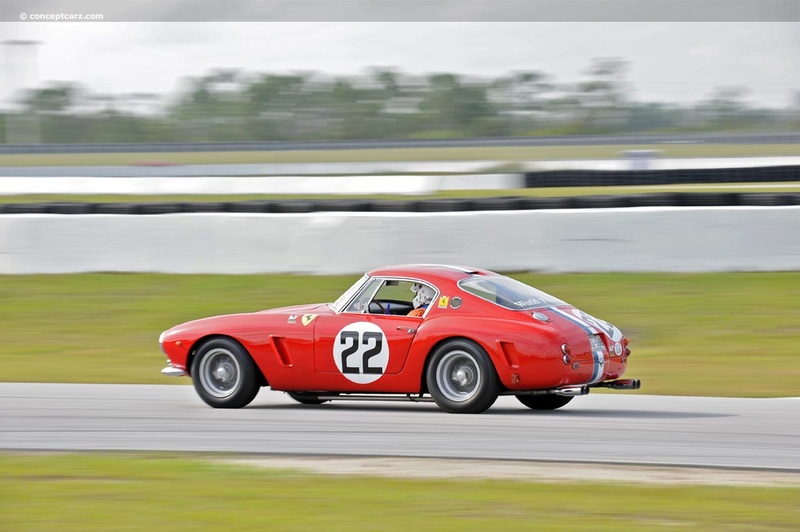 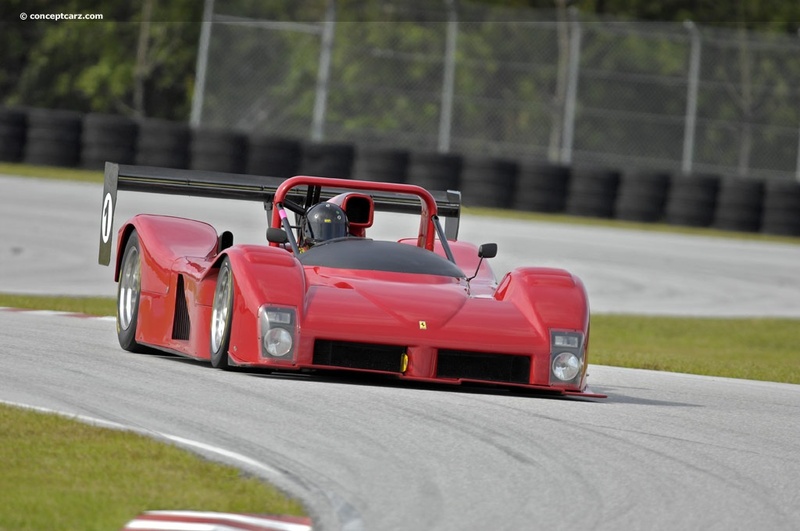 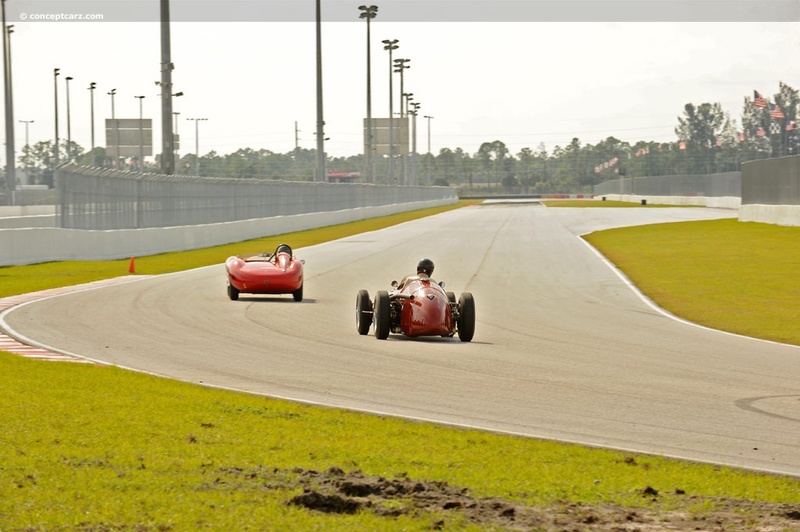 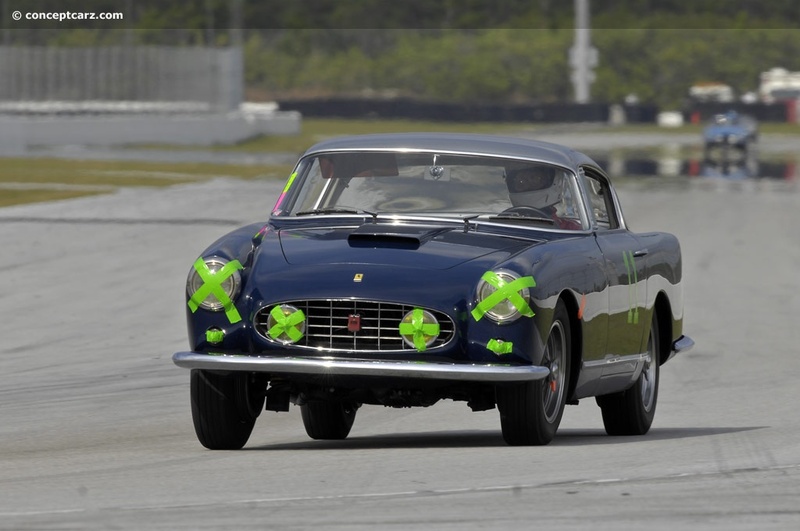 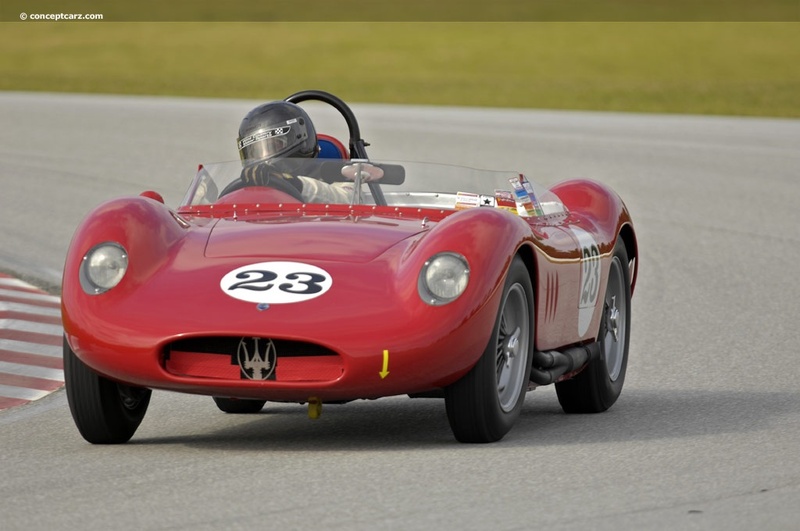 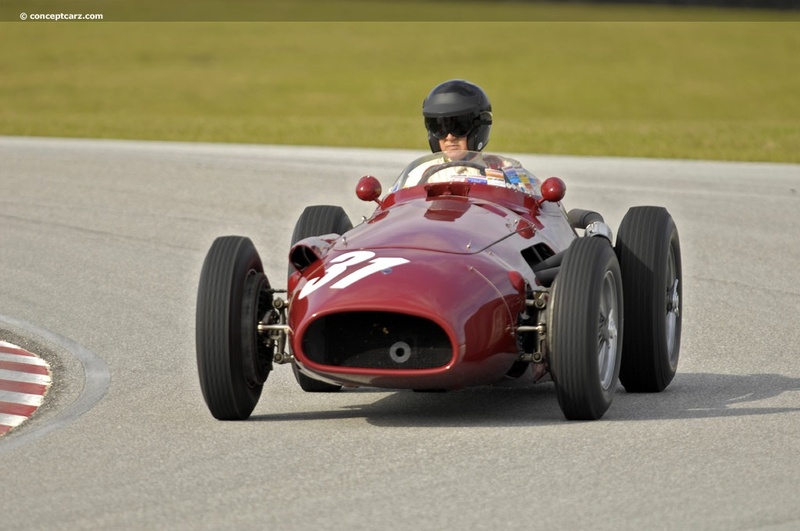 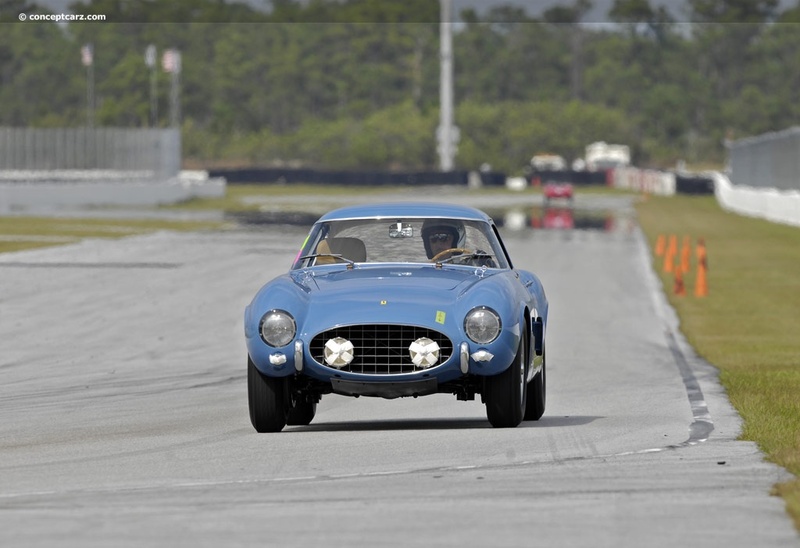 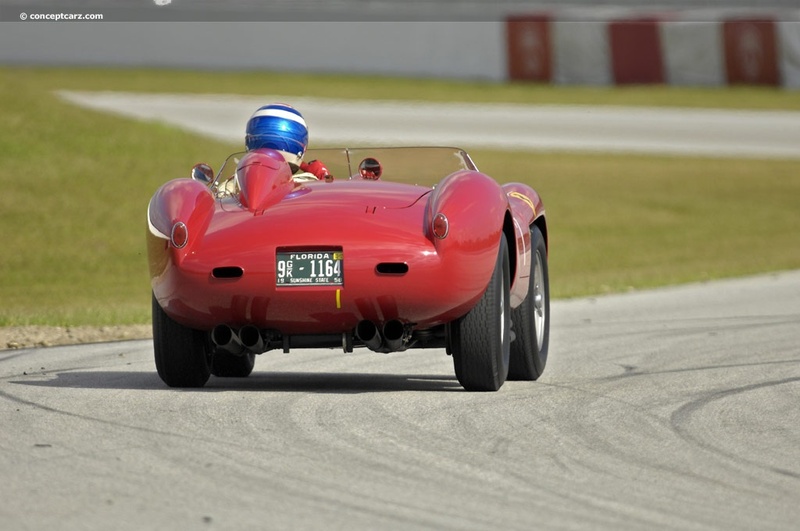 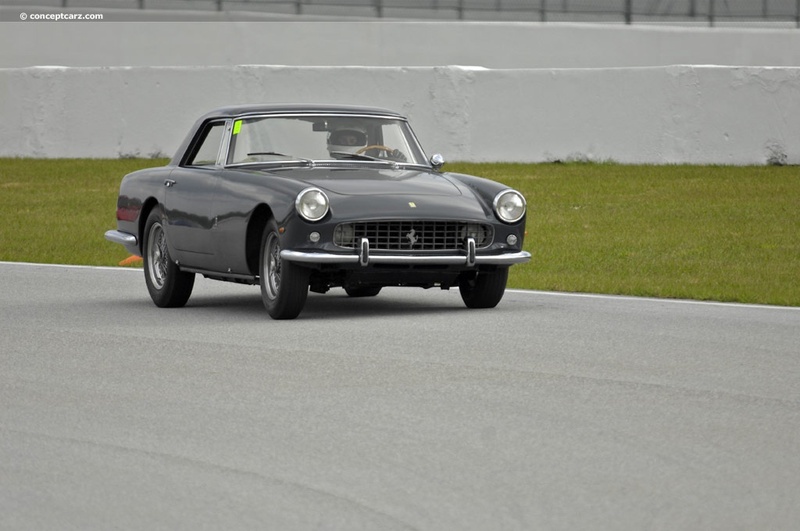 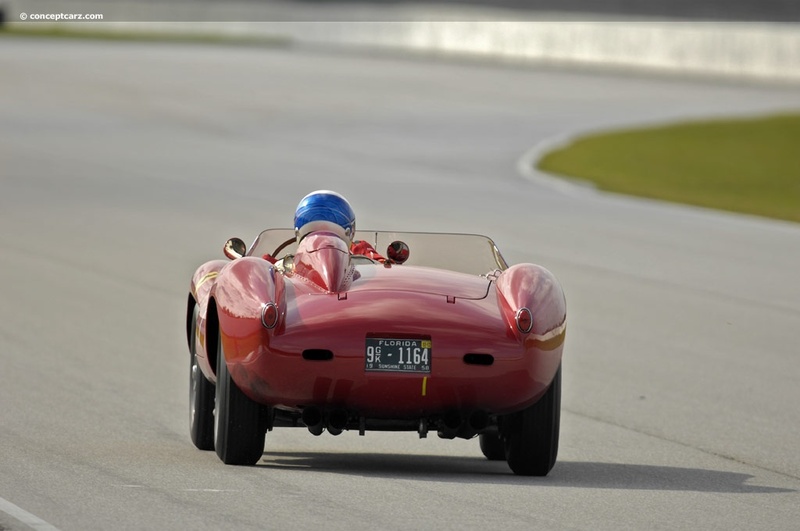 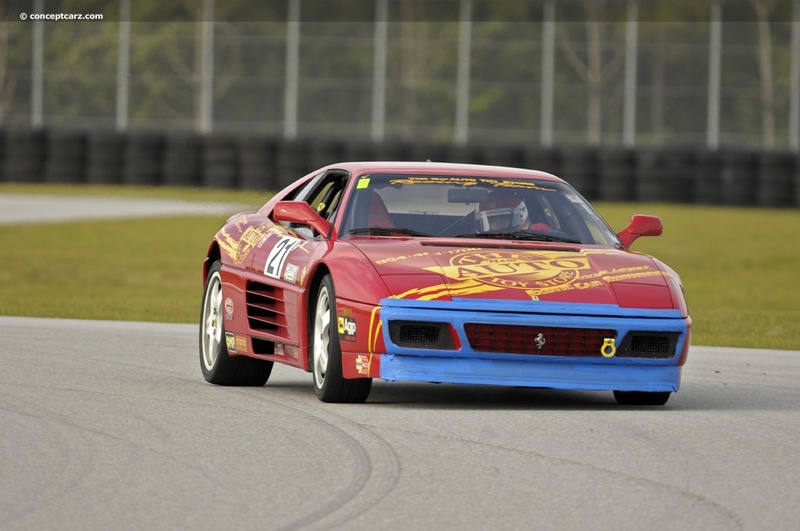 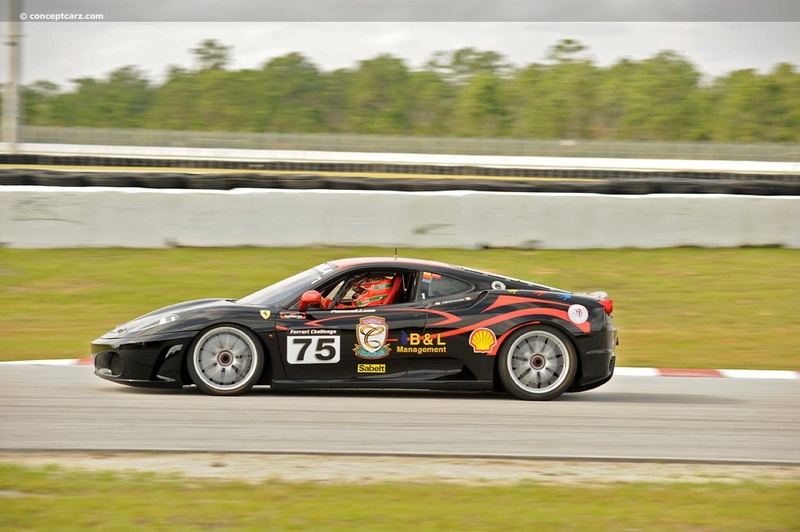 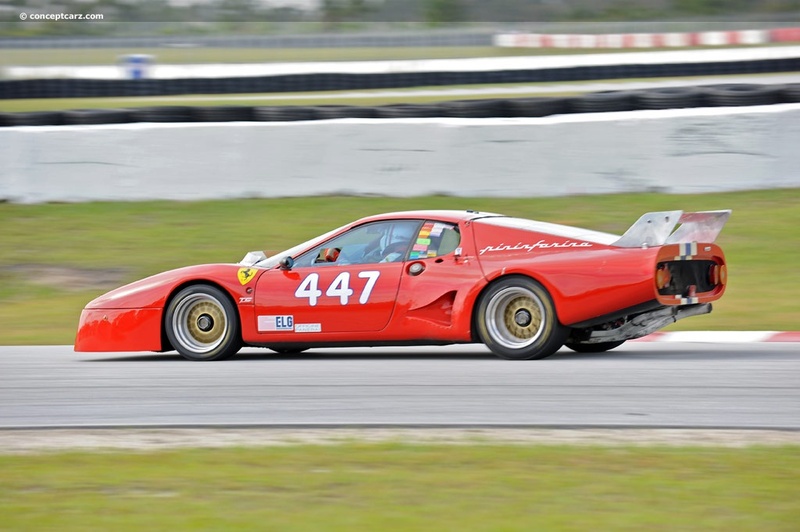 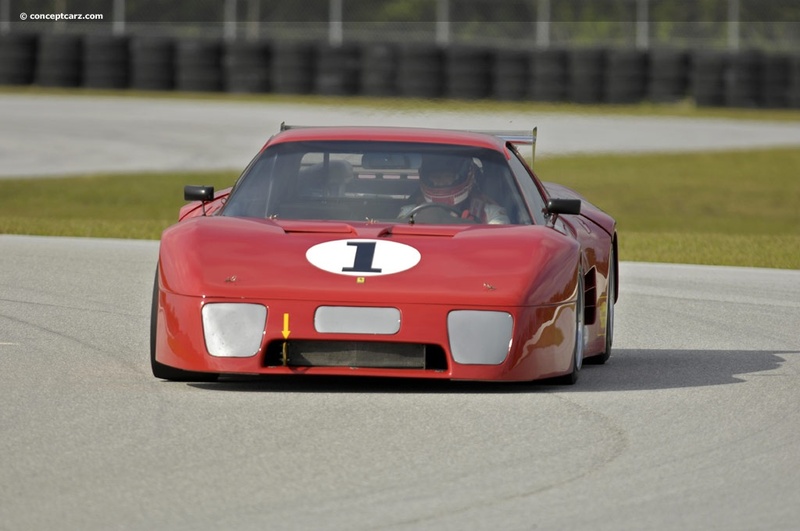 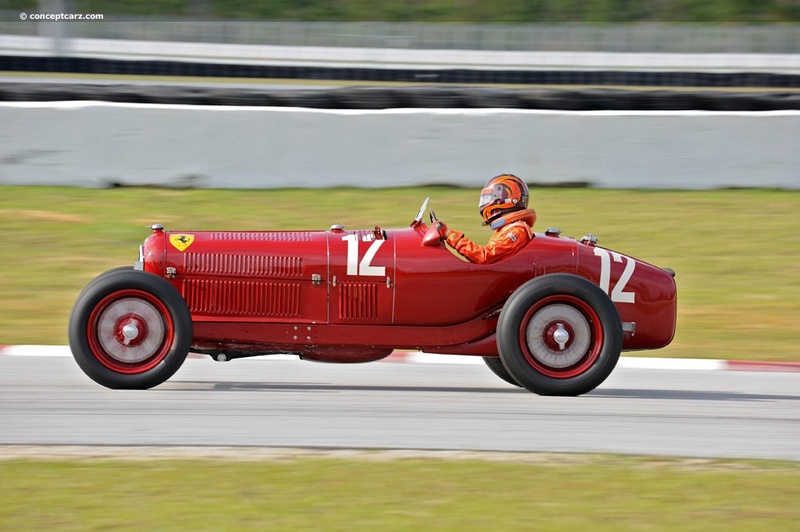 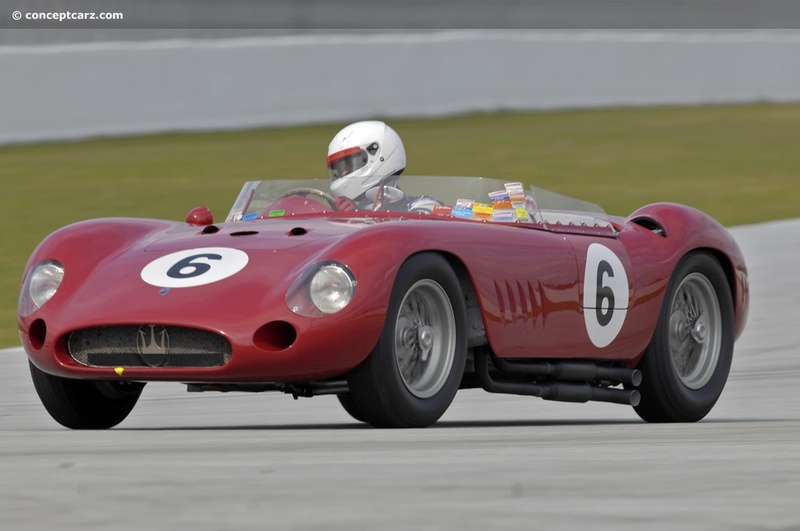 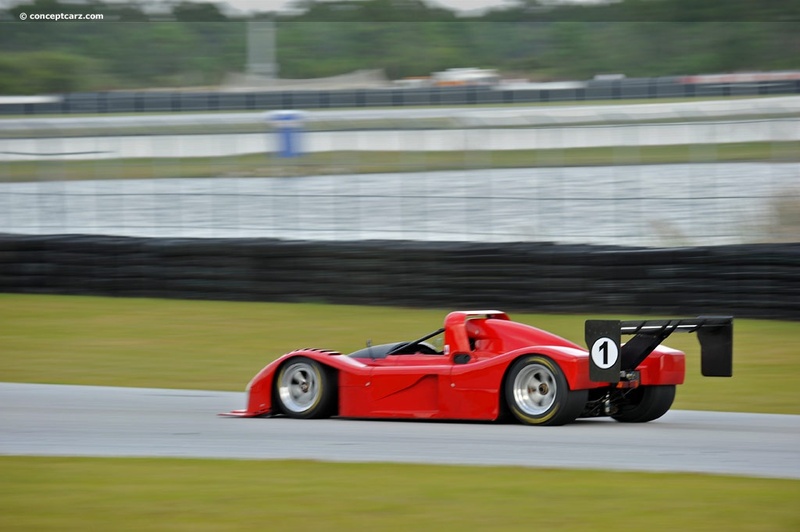 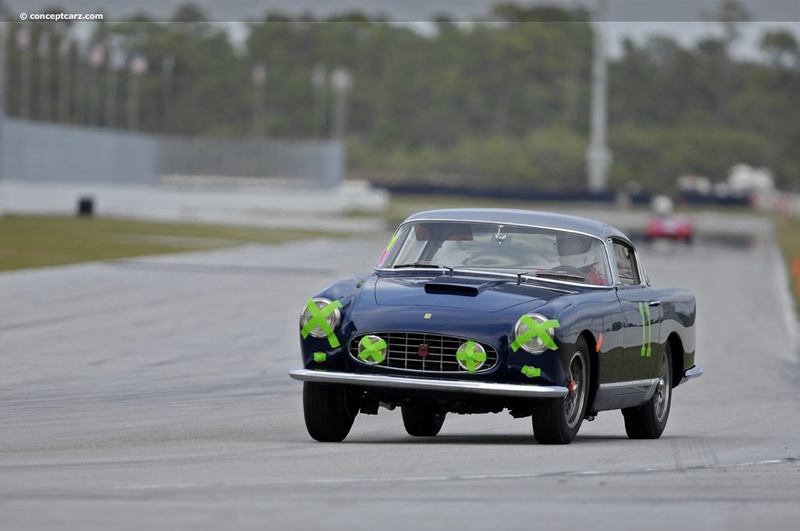 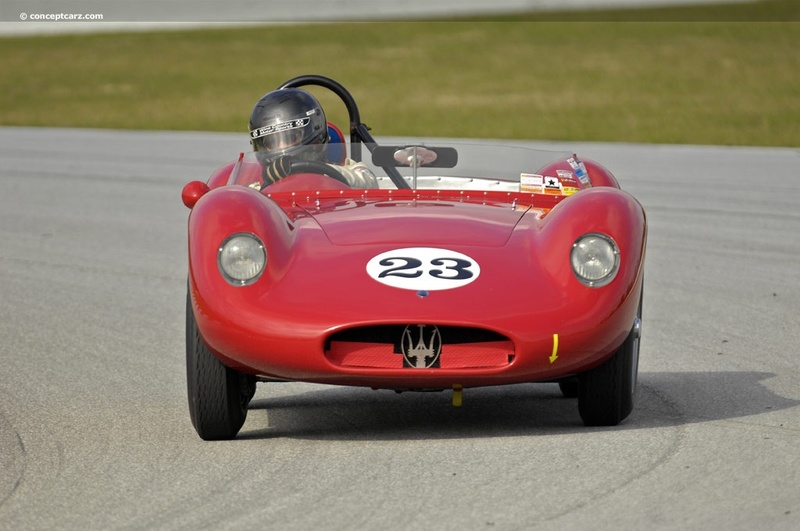 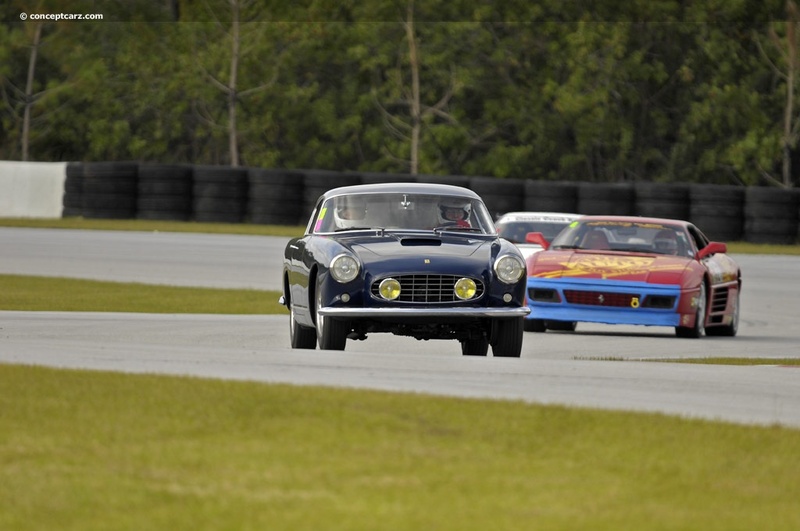 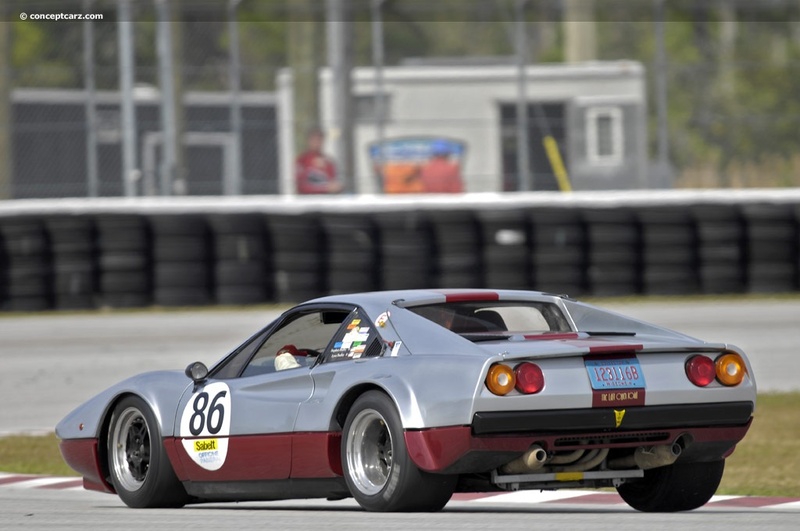 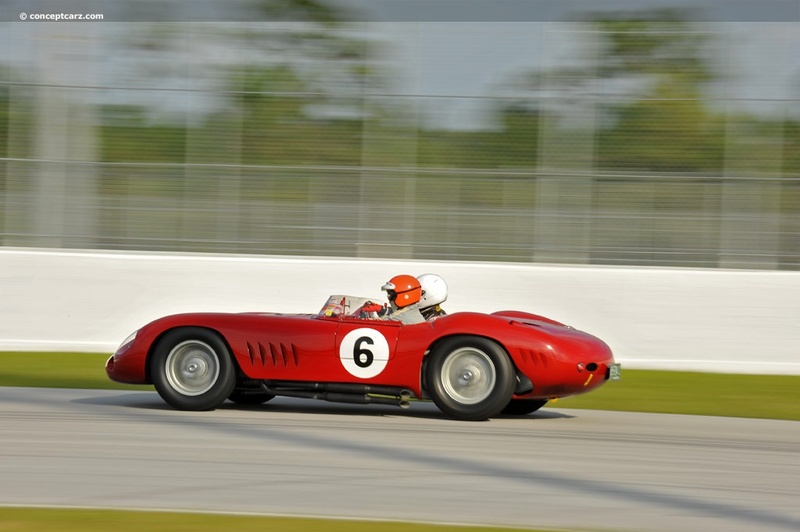 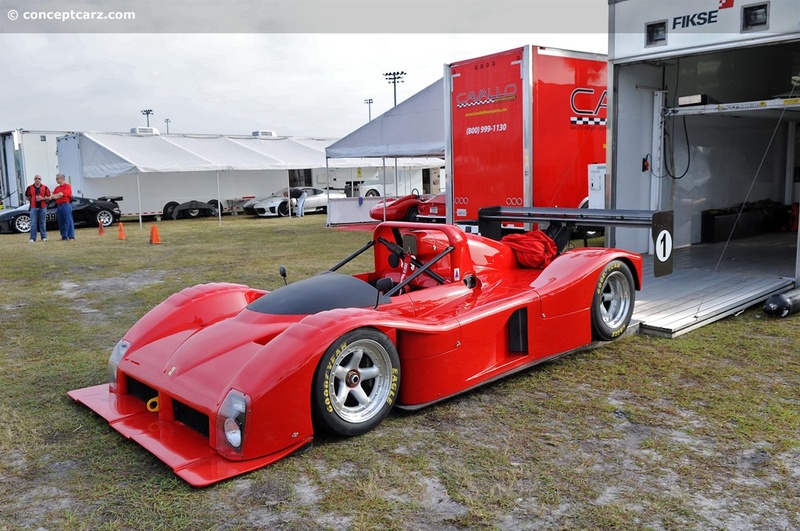 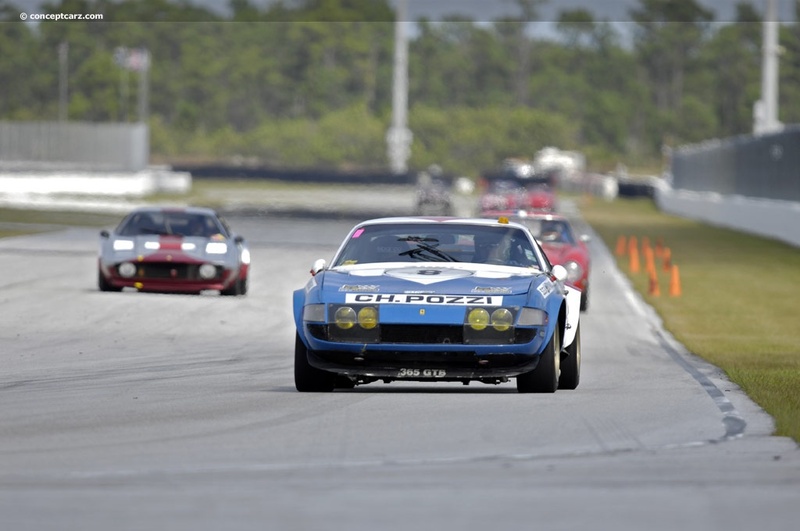 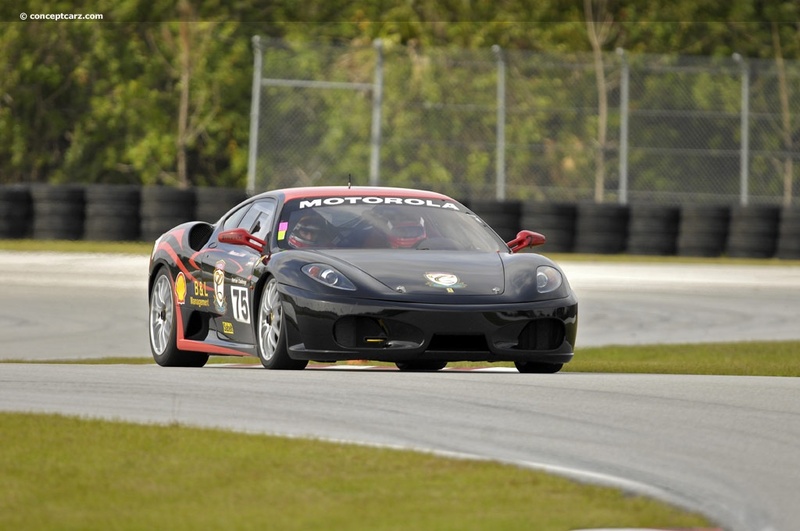 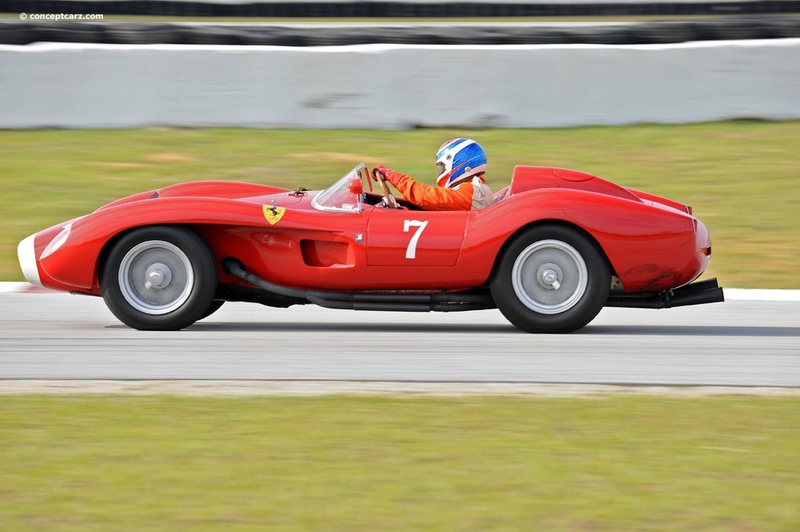 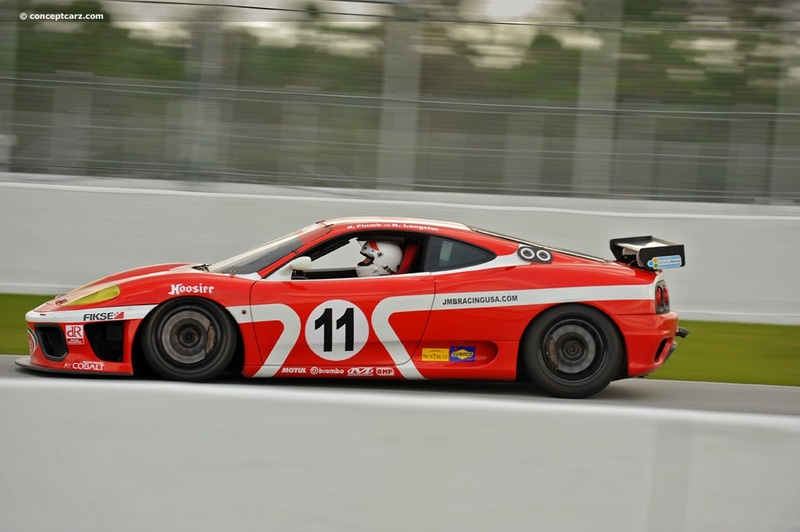 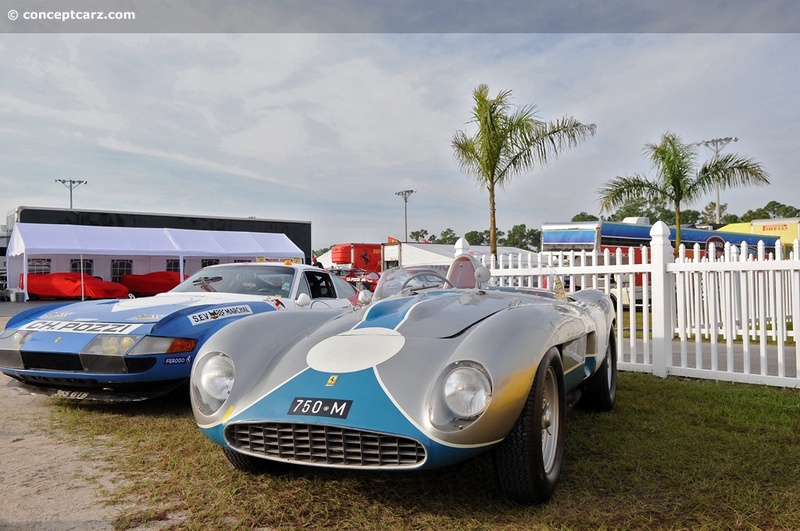 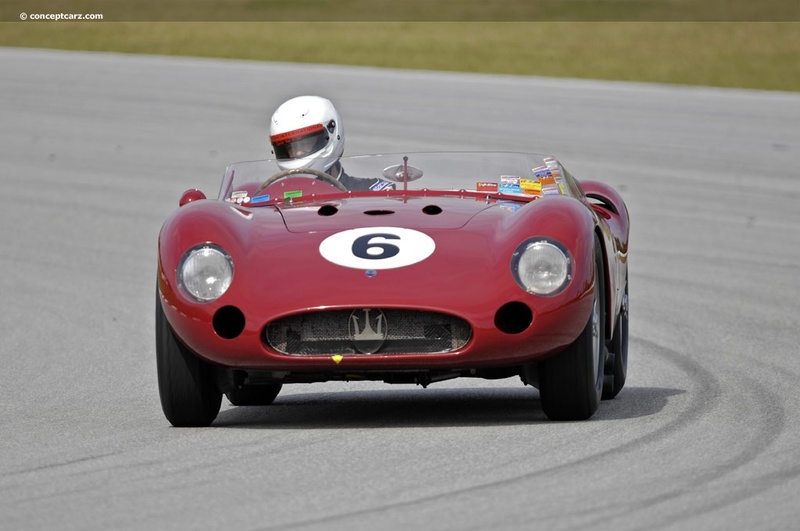 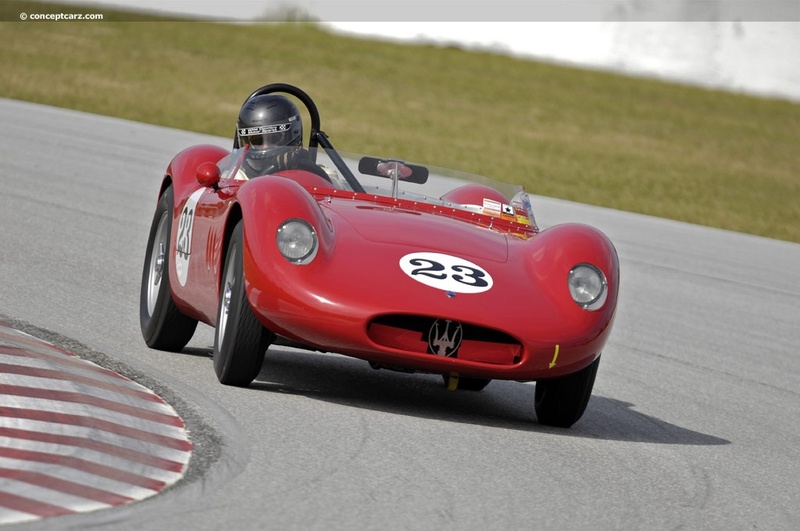 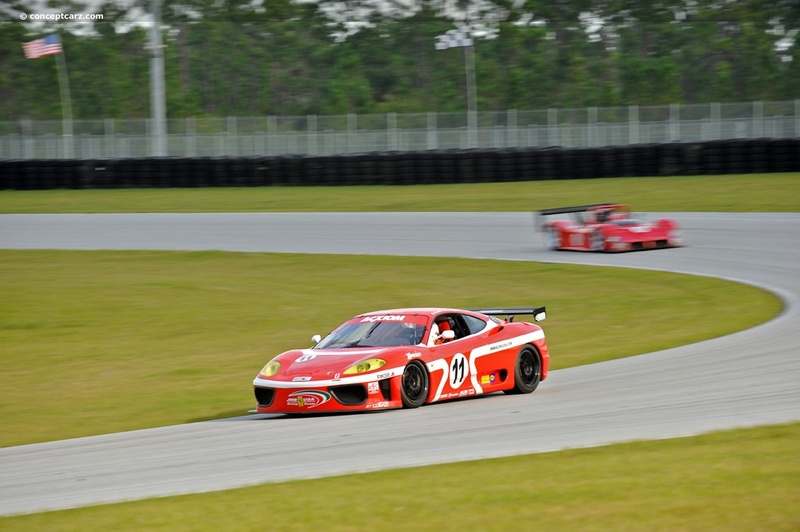 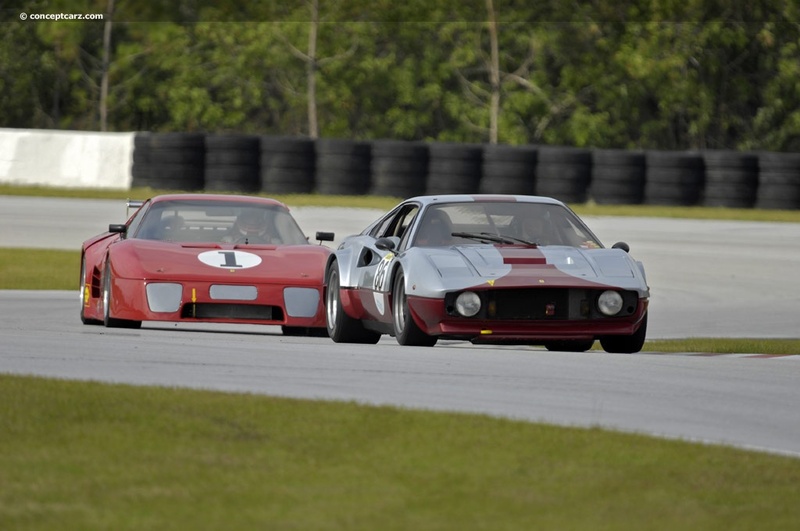 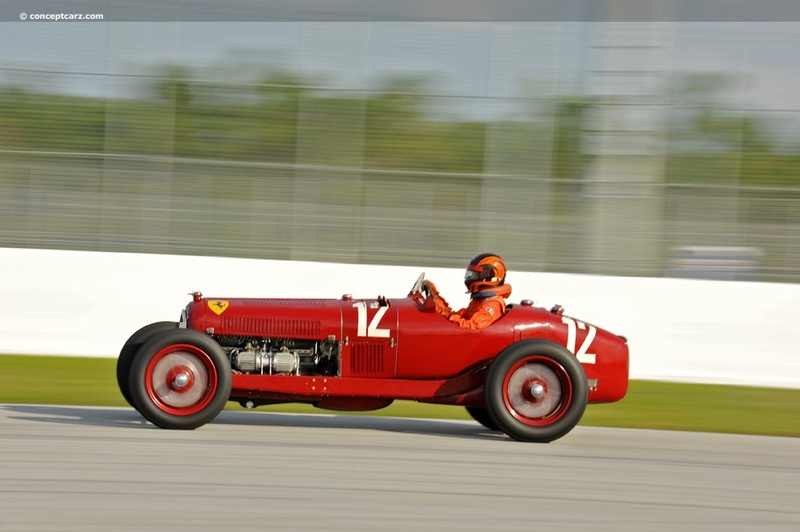 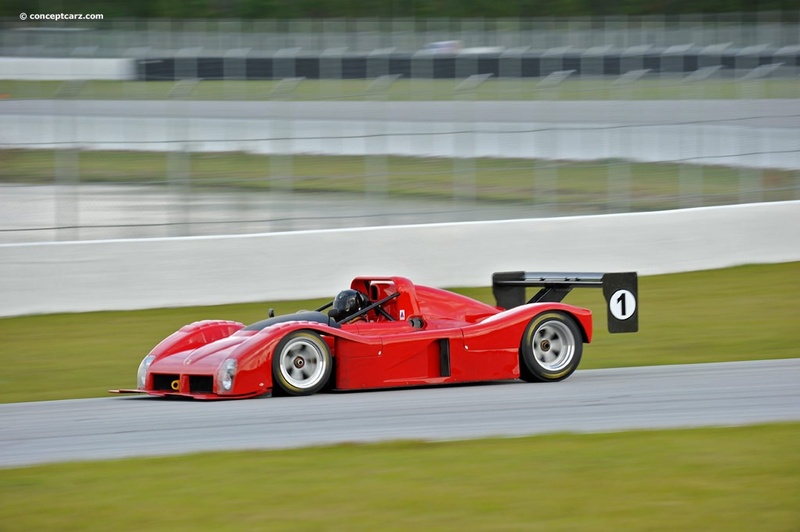 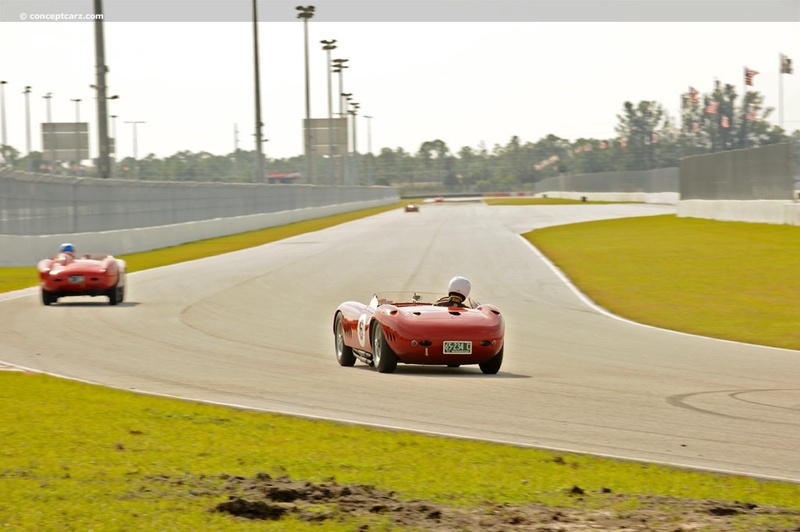 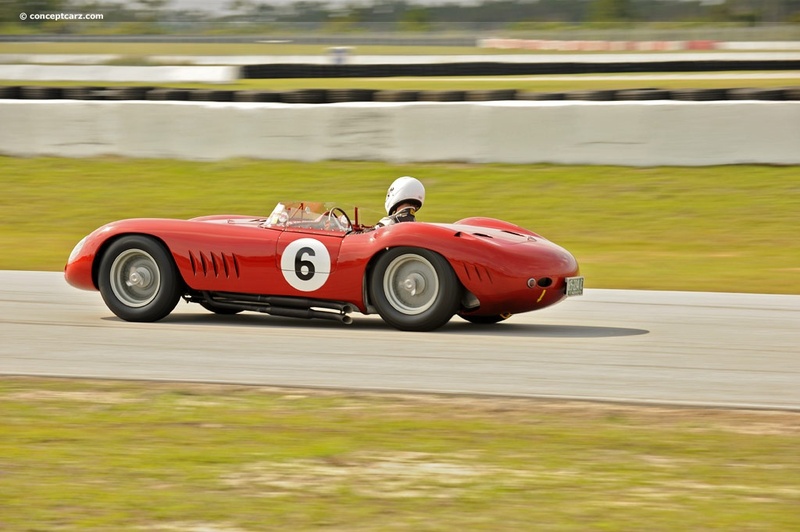 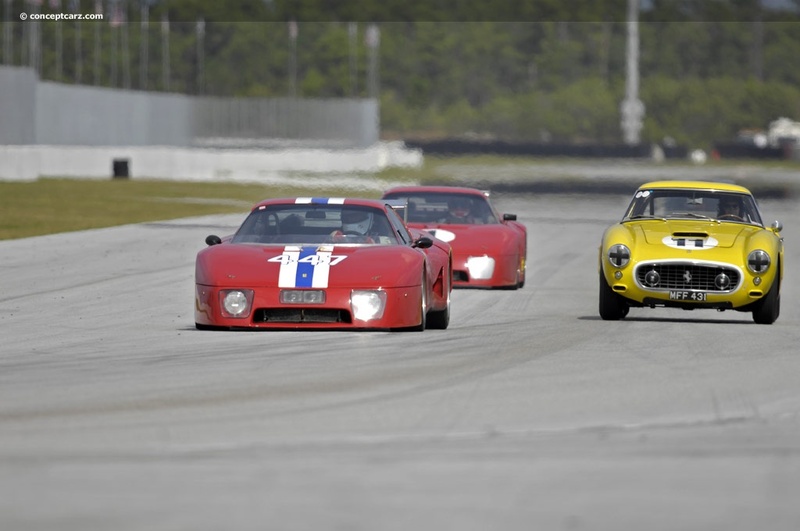 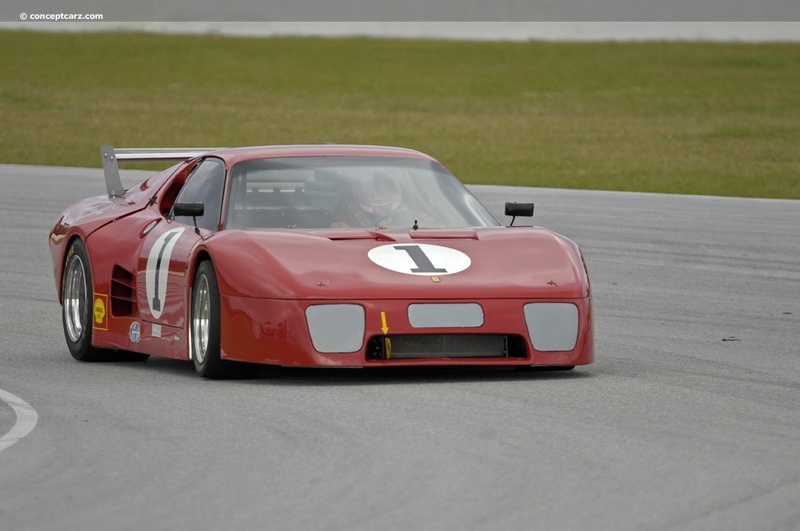 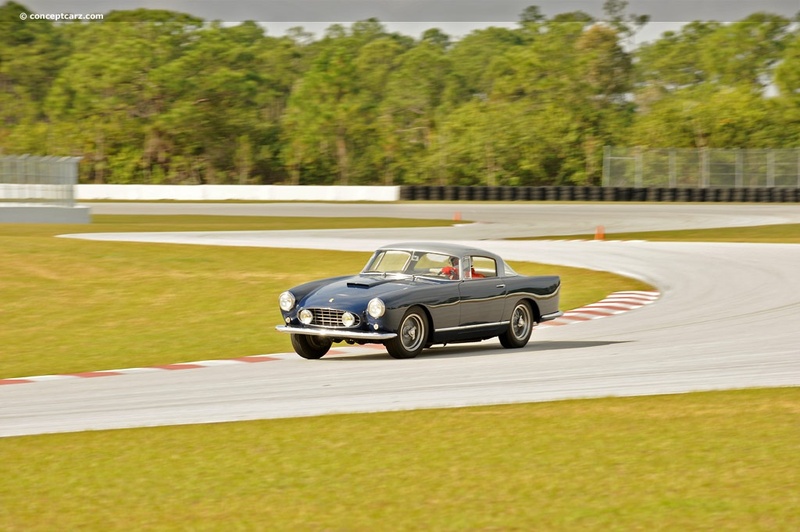 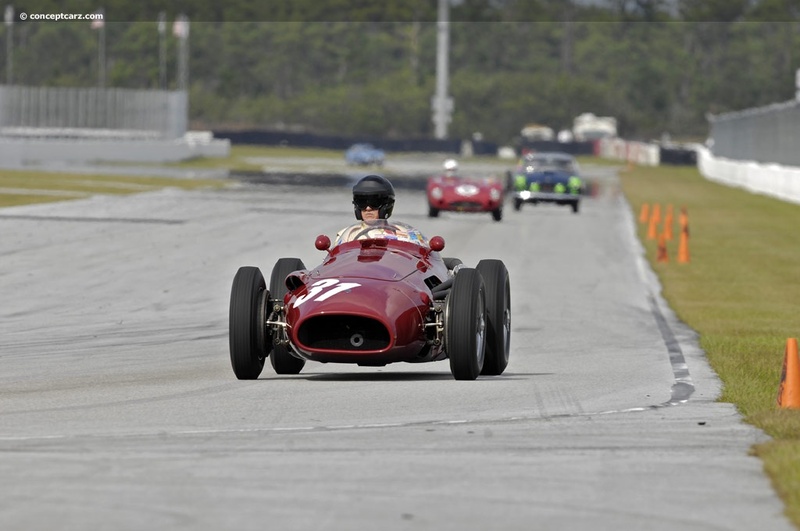 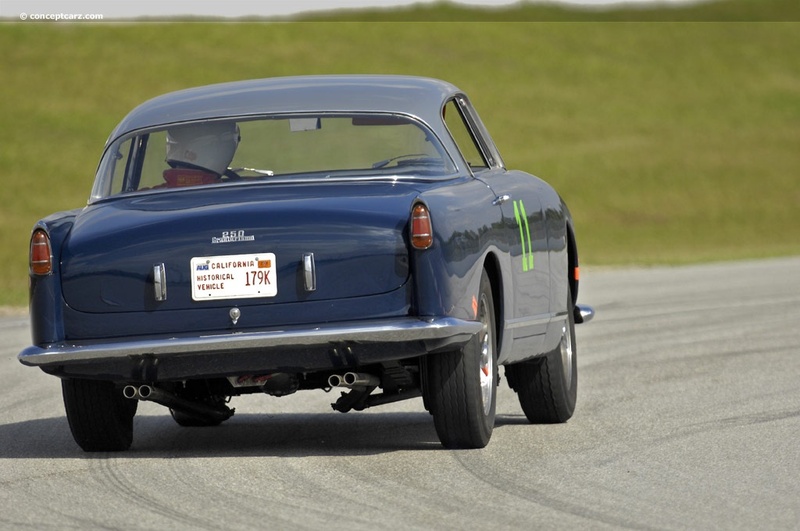 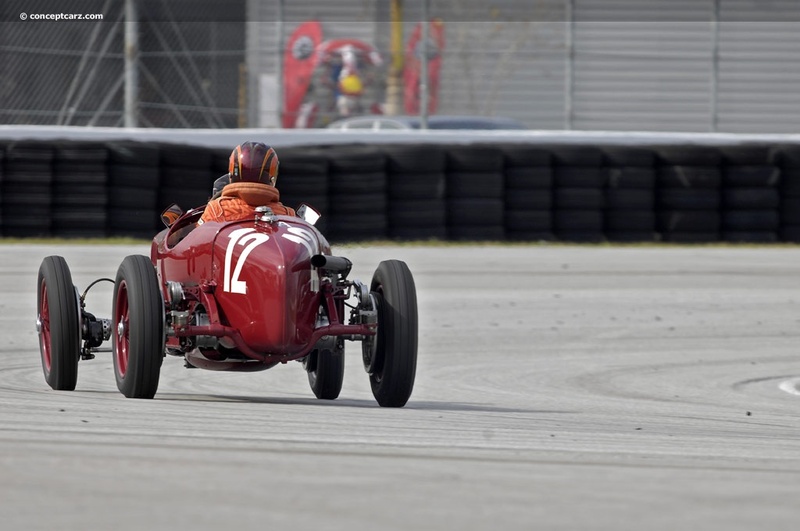 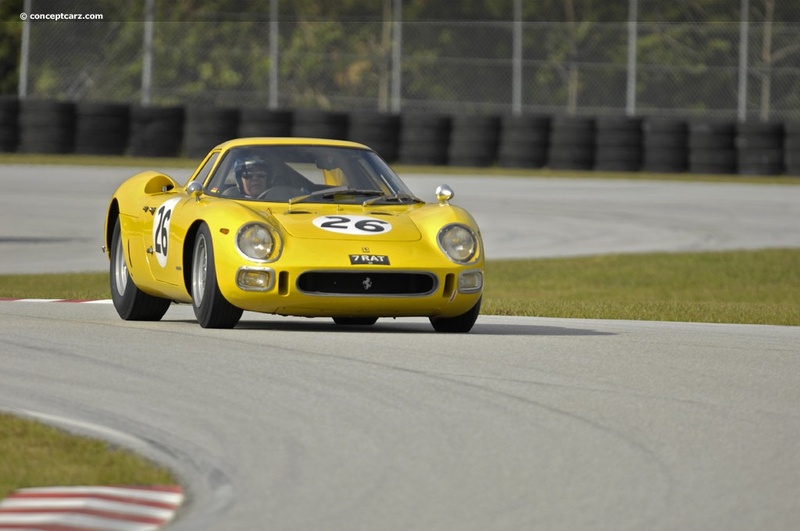 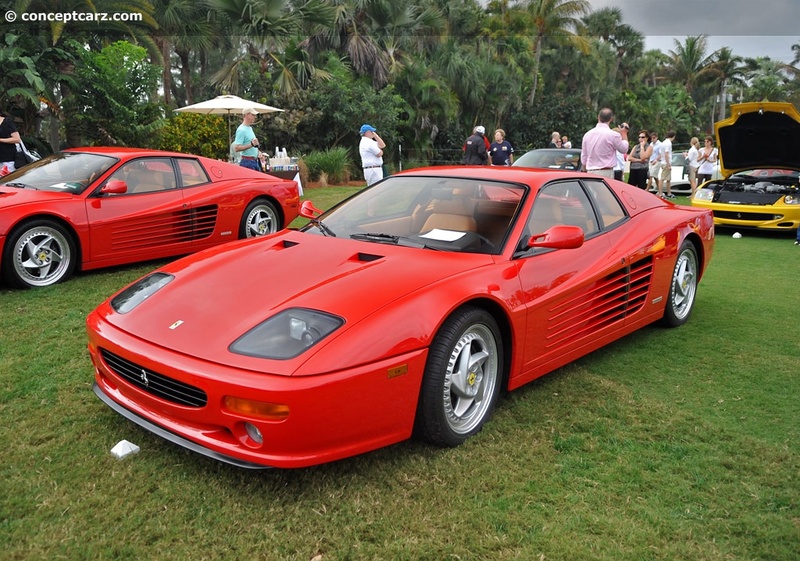 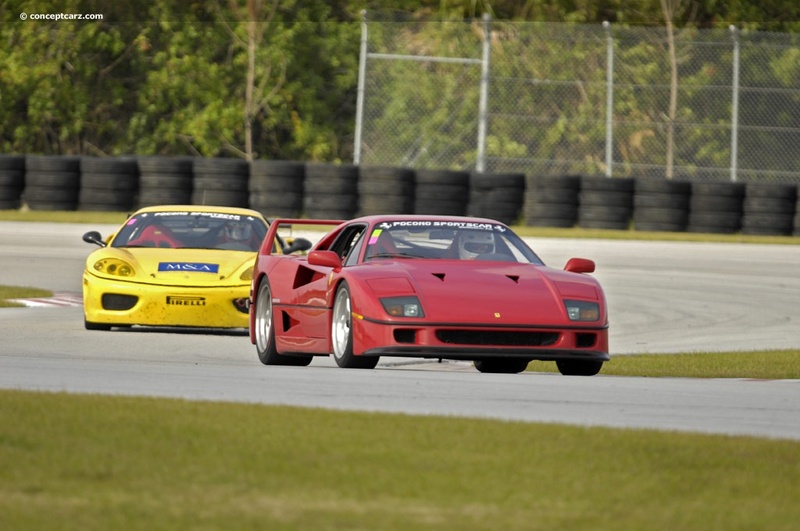 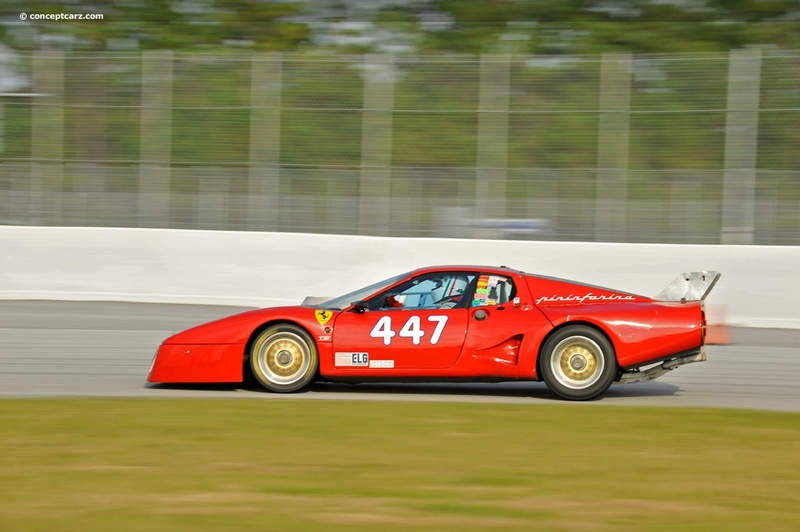 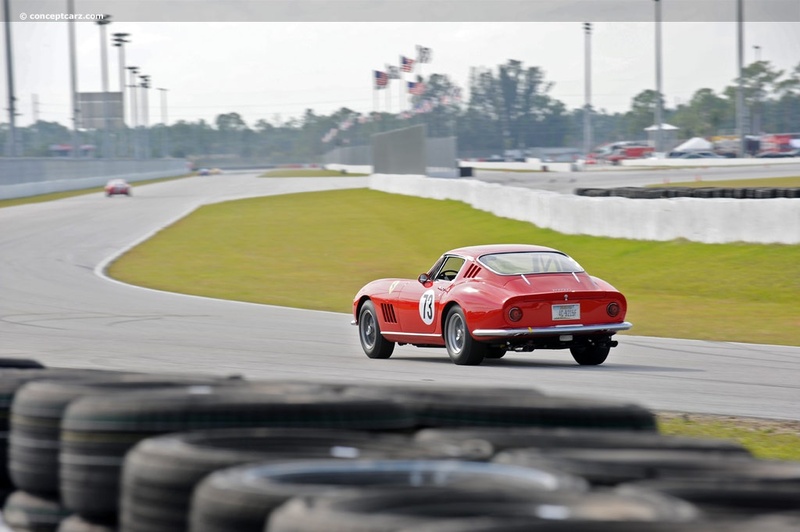 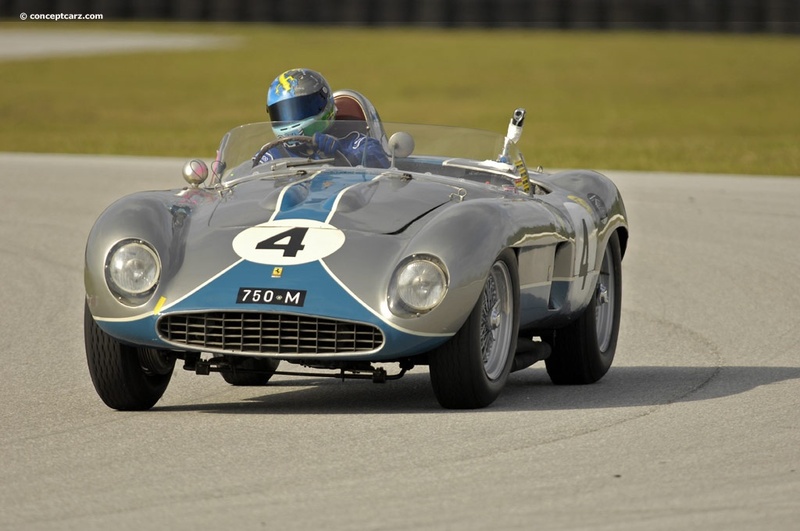 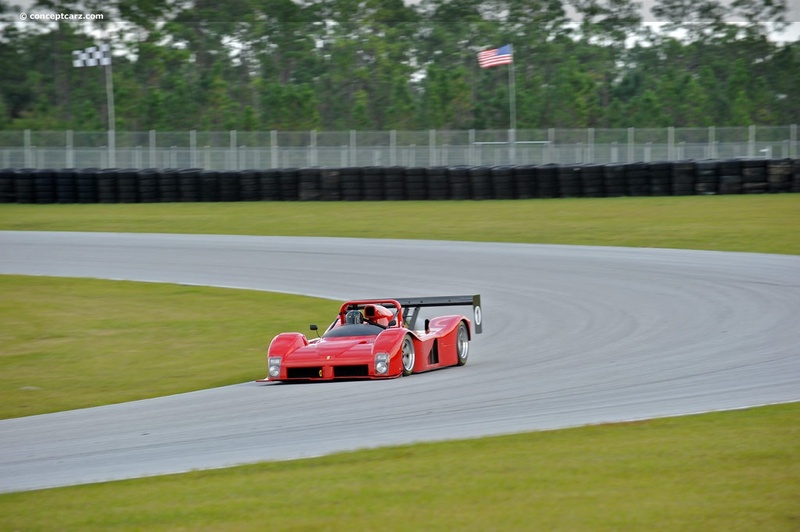 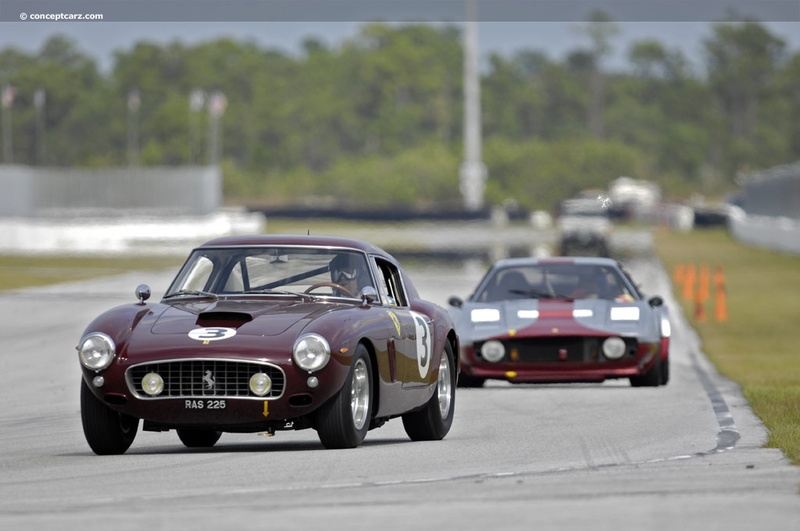 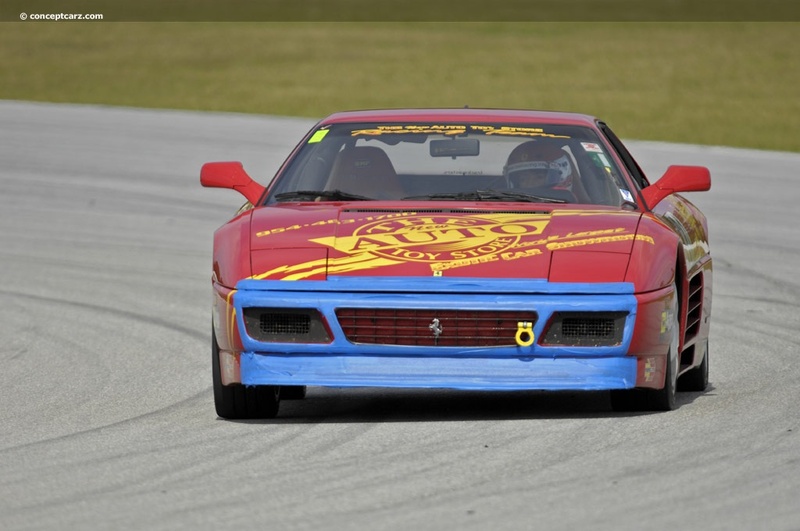 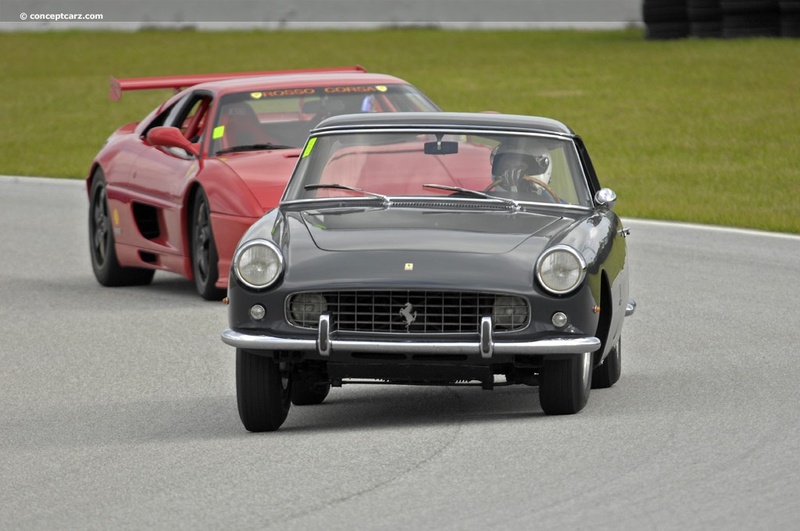 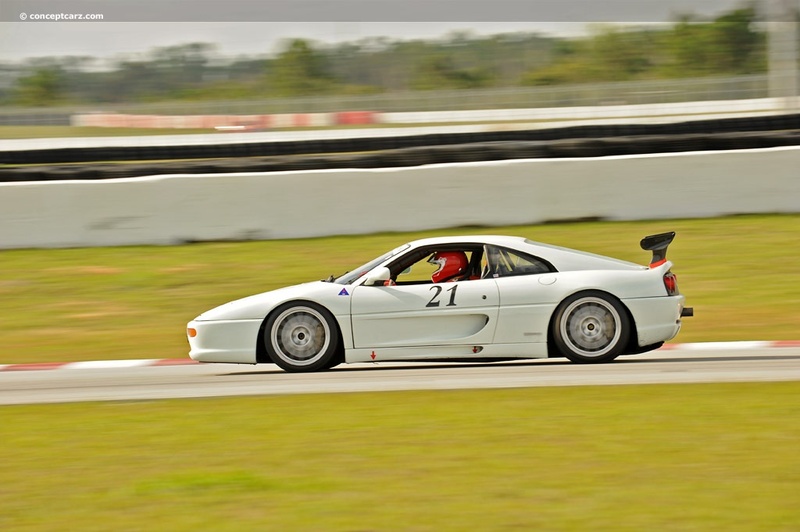 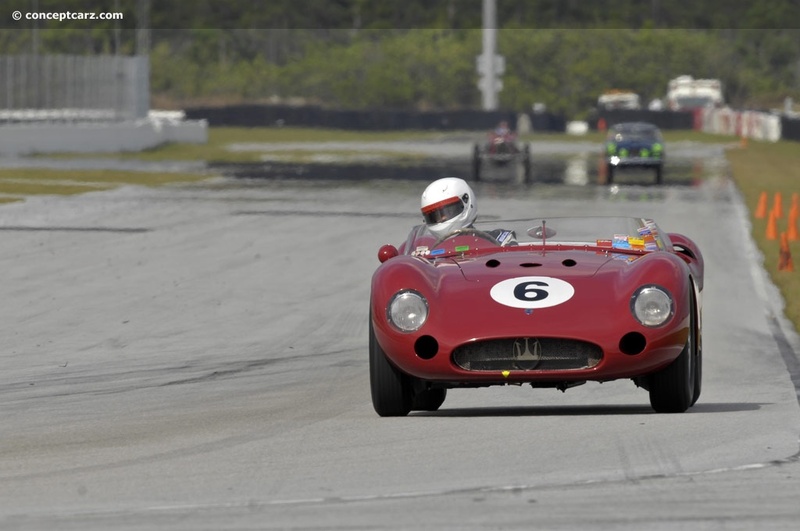 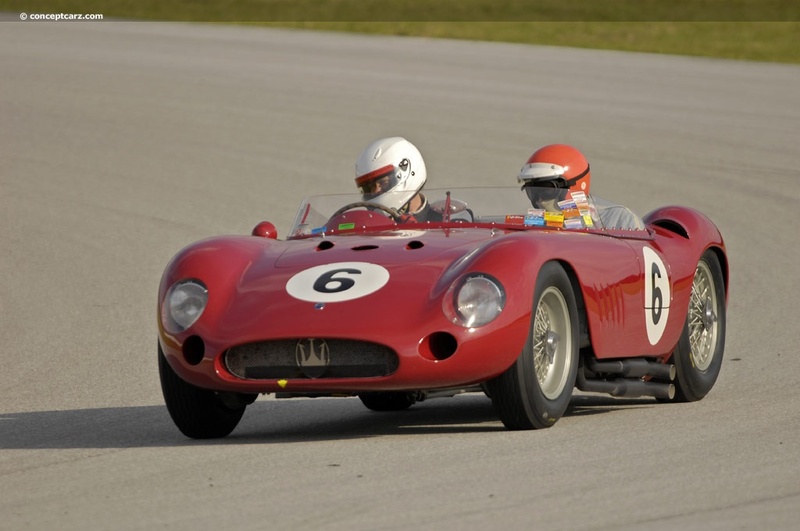 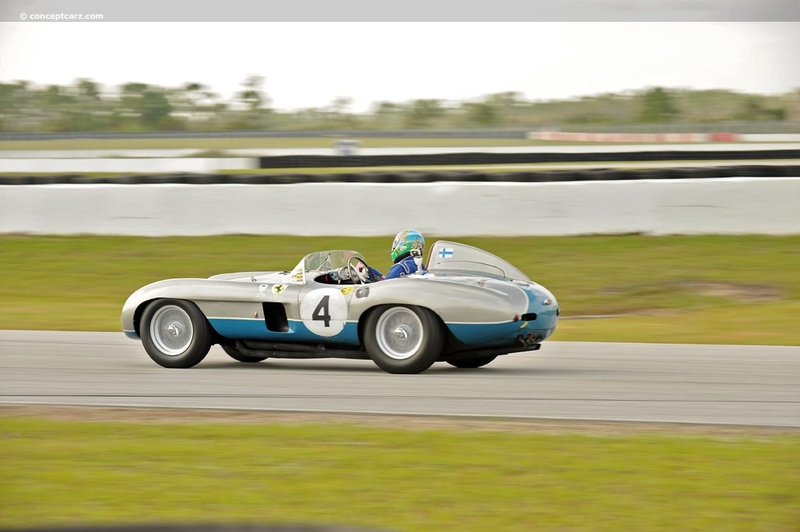 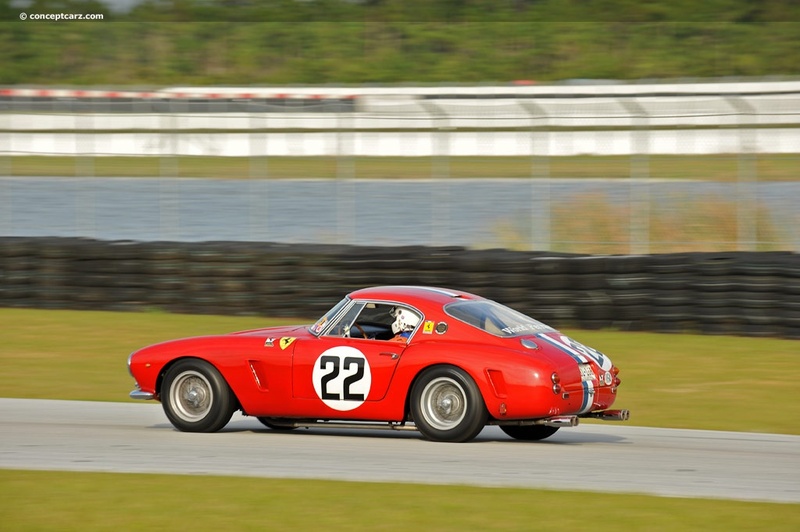 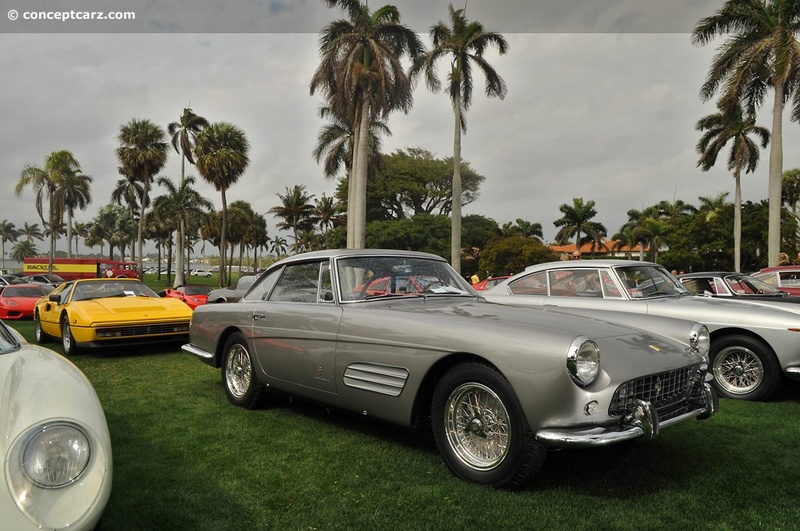 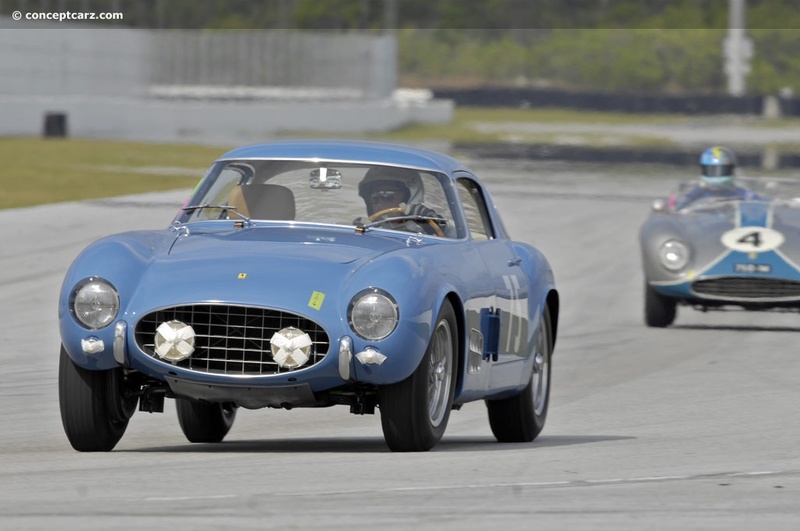 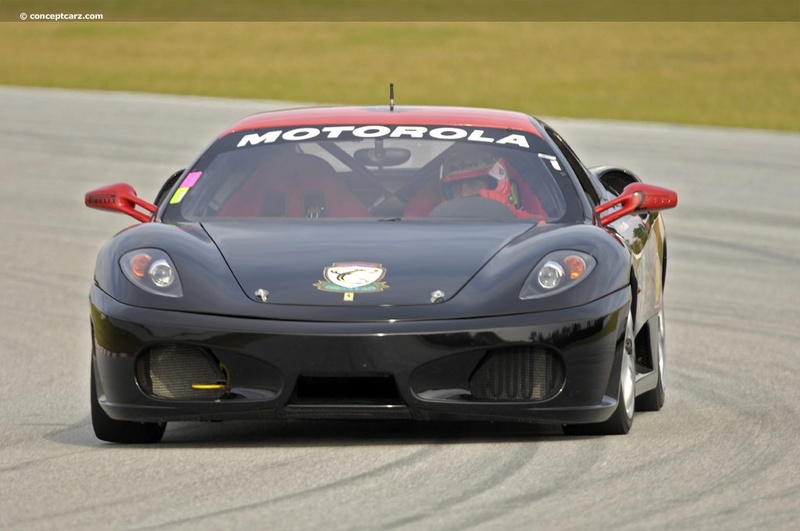 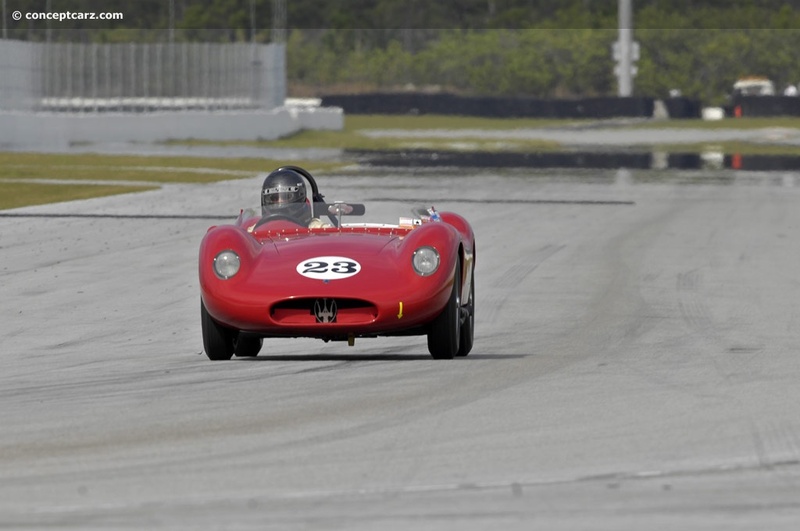 The first major activity for the 19th Annual Palm Beach Cavallino Classic was the Florida Trophy, a two day track meet at the Palm Beach International Raceway. 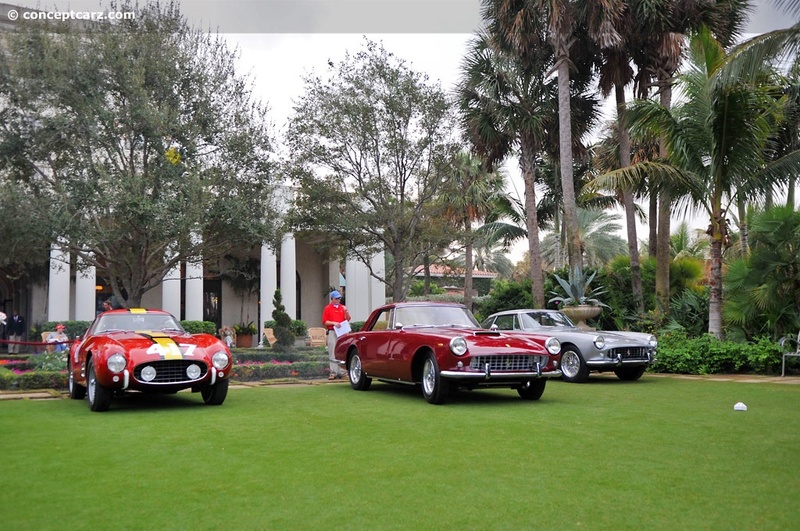 Underlining Ferrari's extraordinary accomplishments in competition, this was a fitting activity to begin the Cavallino Classic celebration. 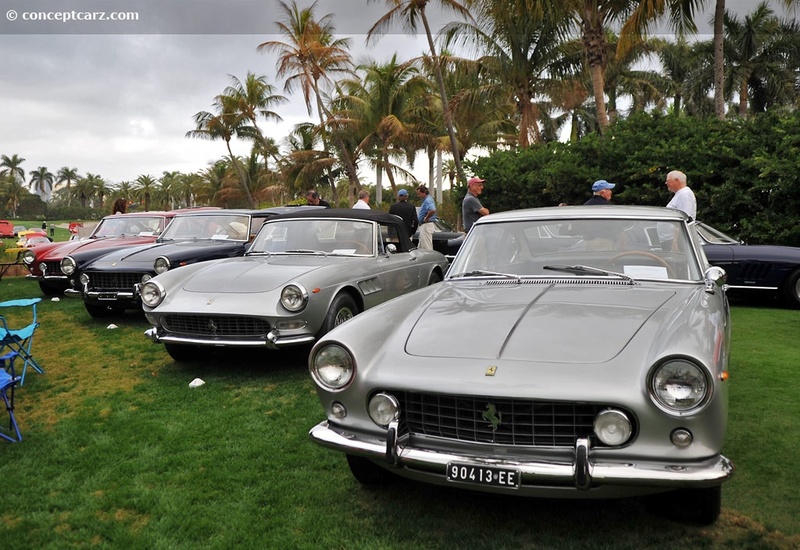 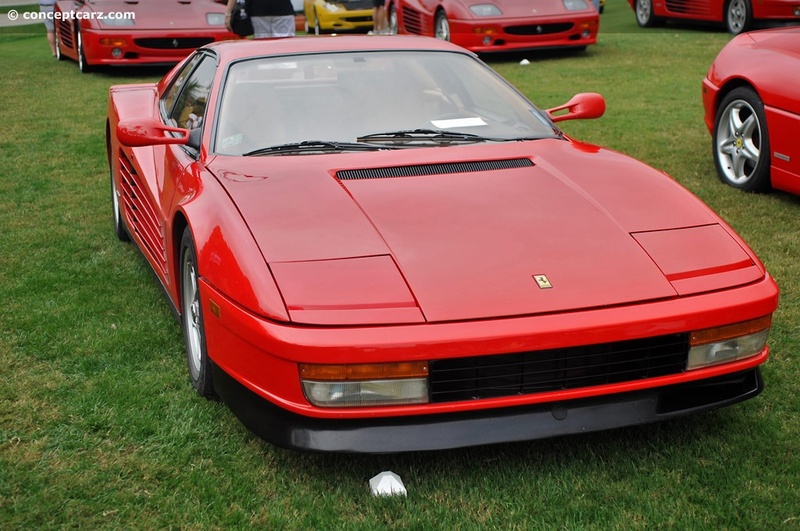 Since the event was open to vintage and modern Ferraris, the cars were separated into three categories. 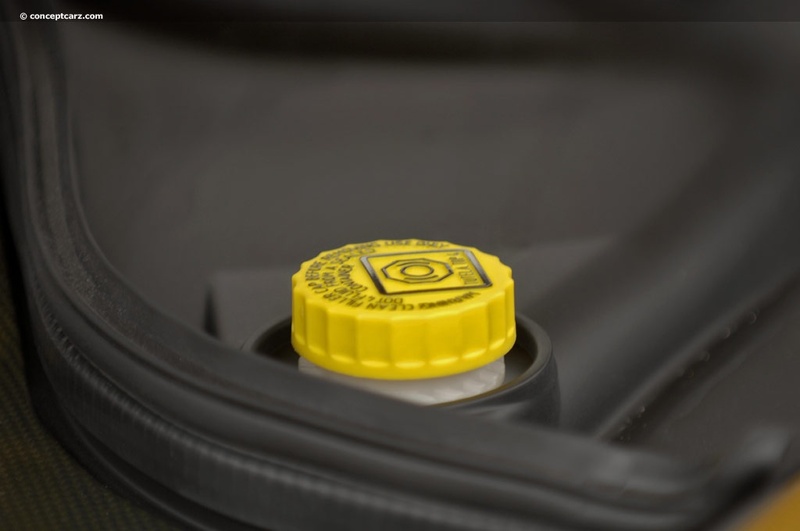 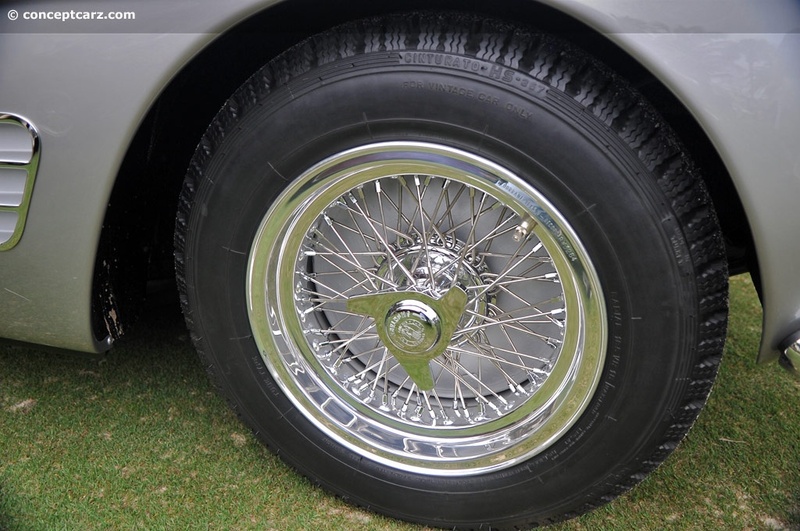 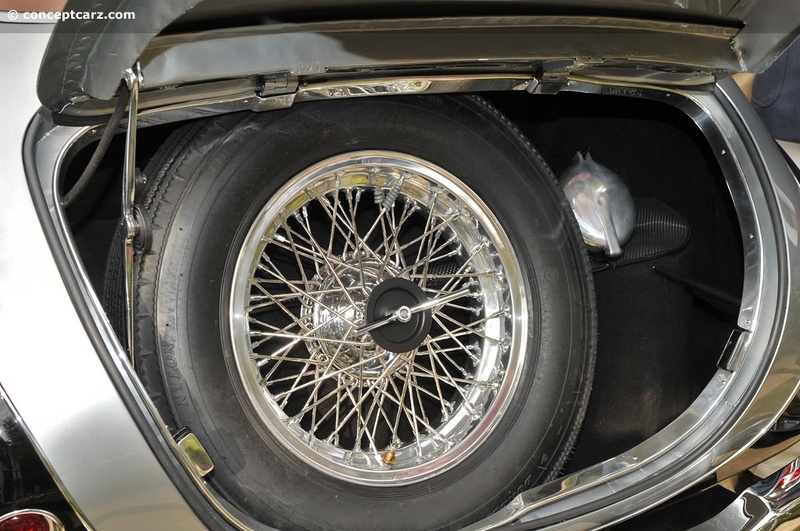 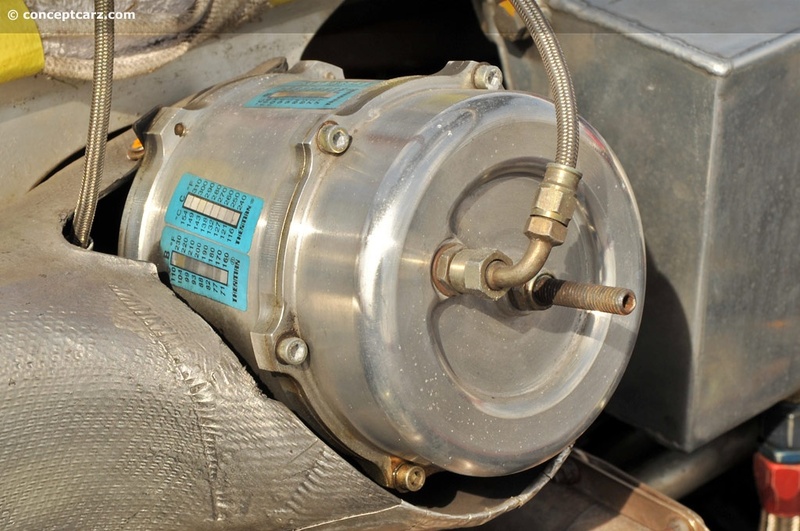 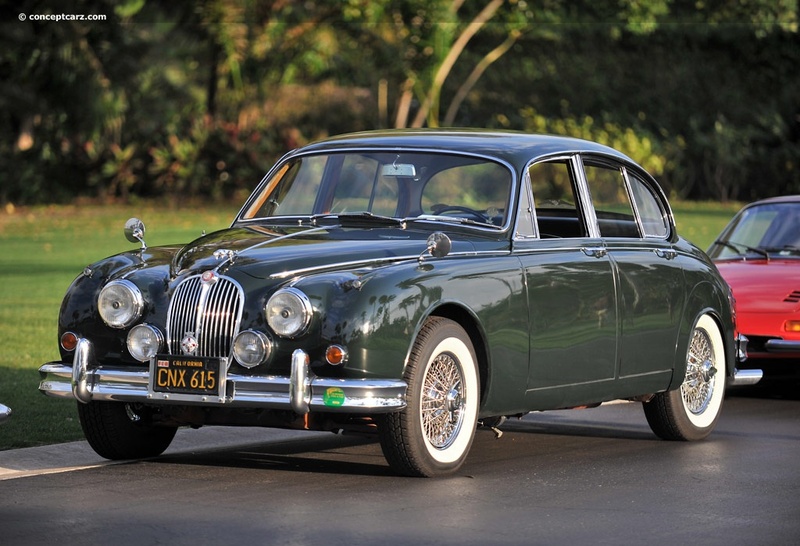 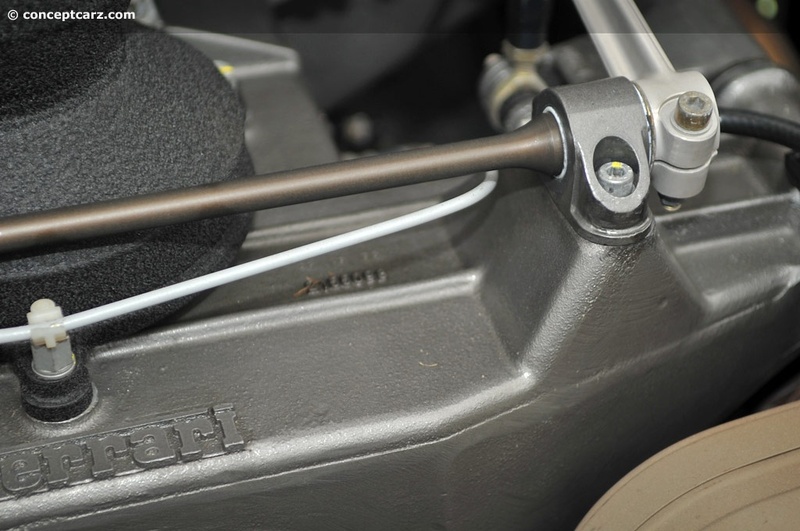 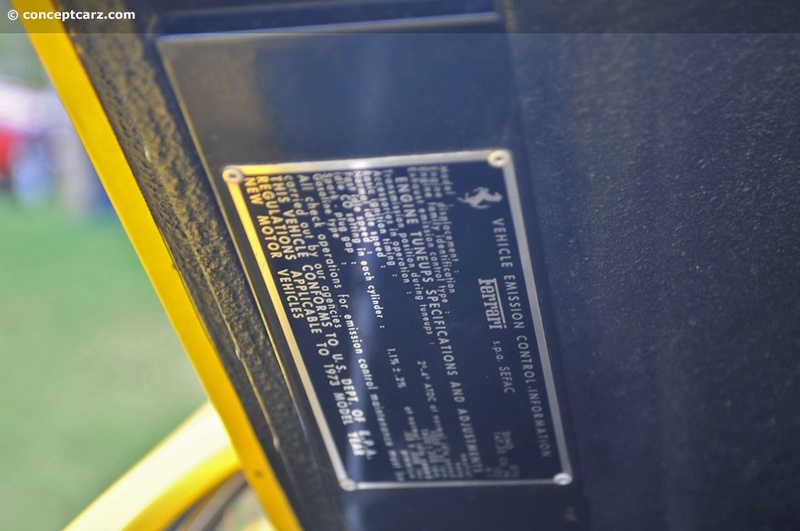 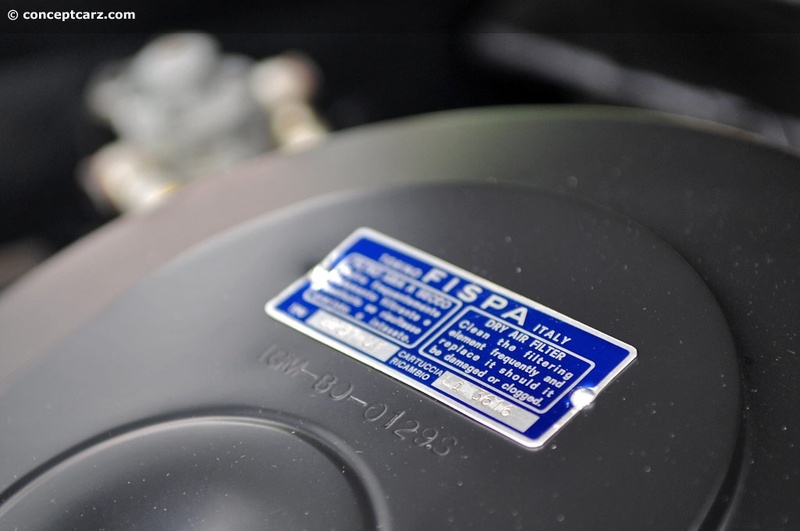 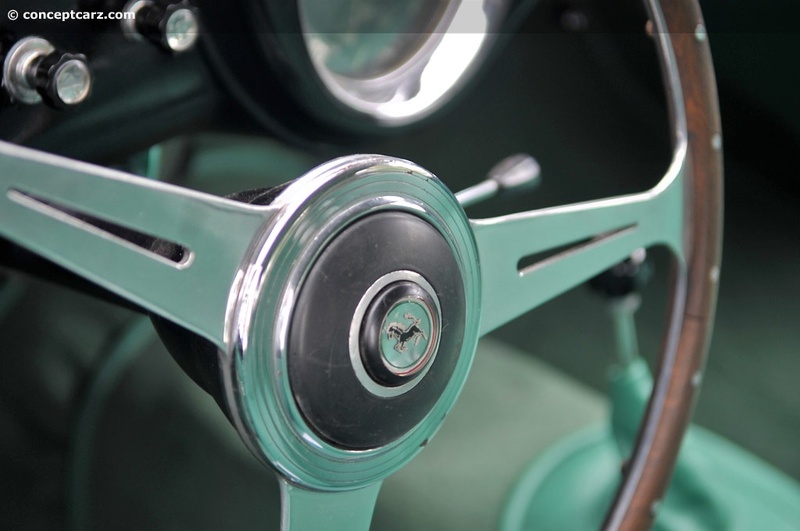 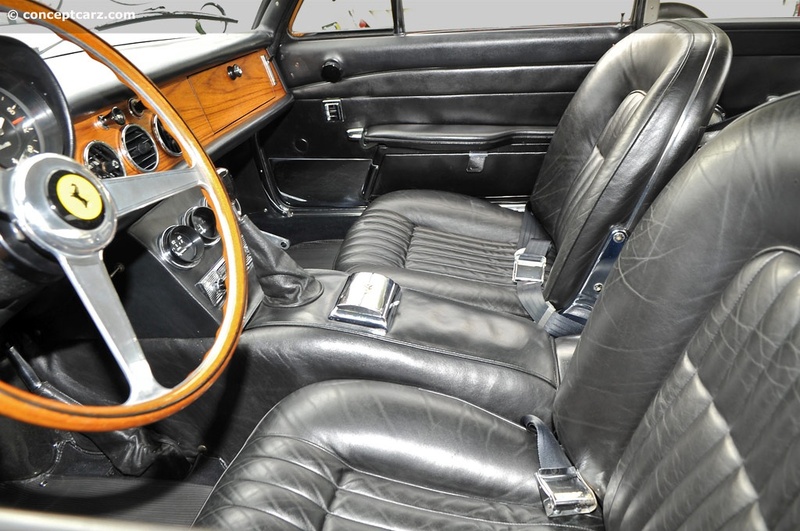 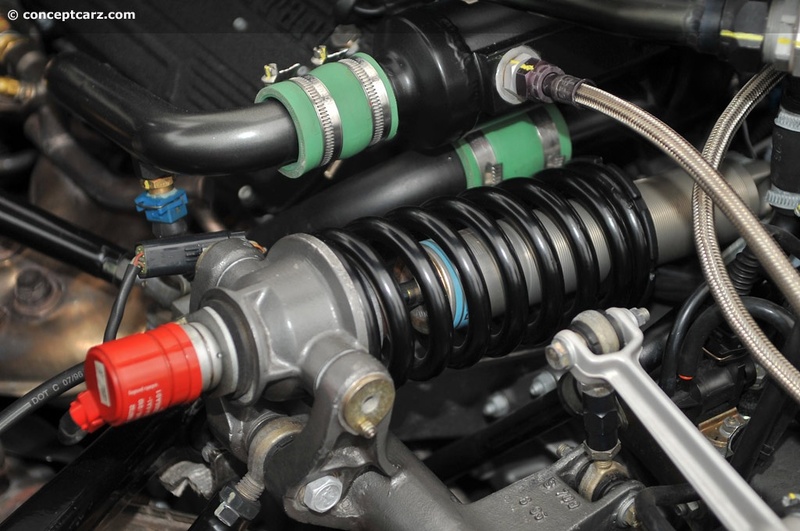 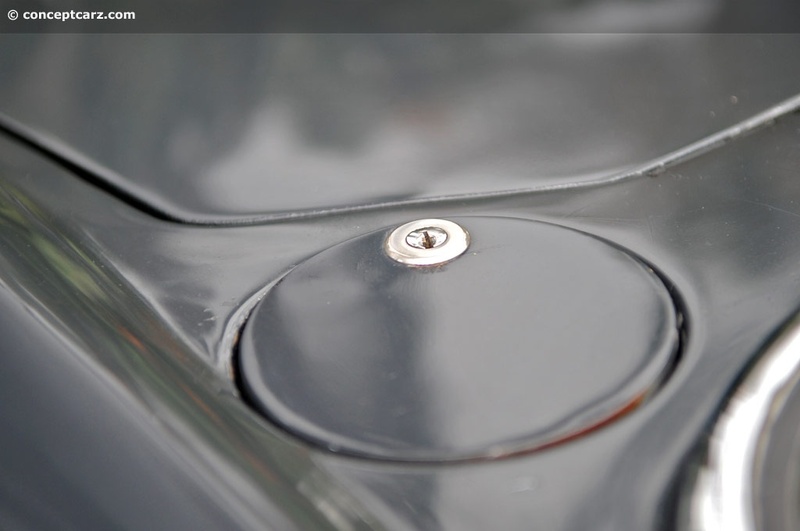 The Drum Brake group was reserved for cars that had left the factory equipped with drum brakes. 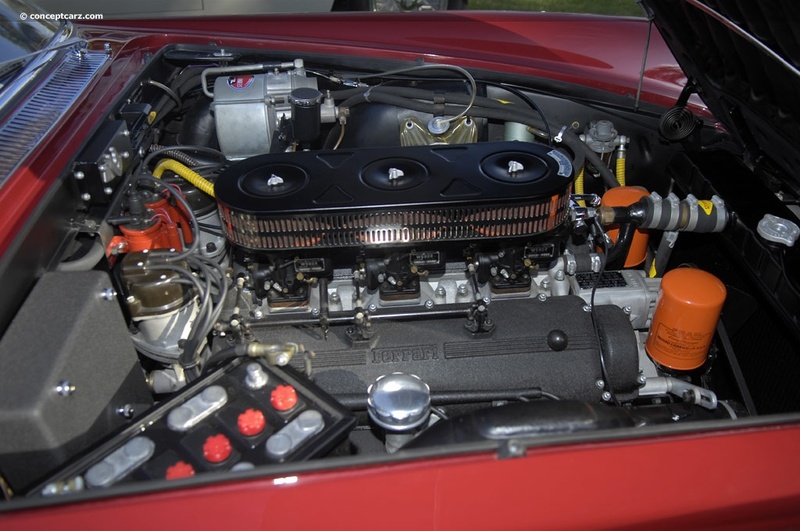 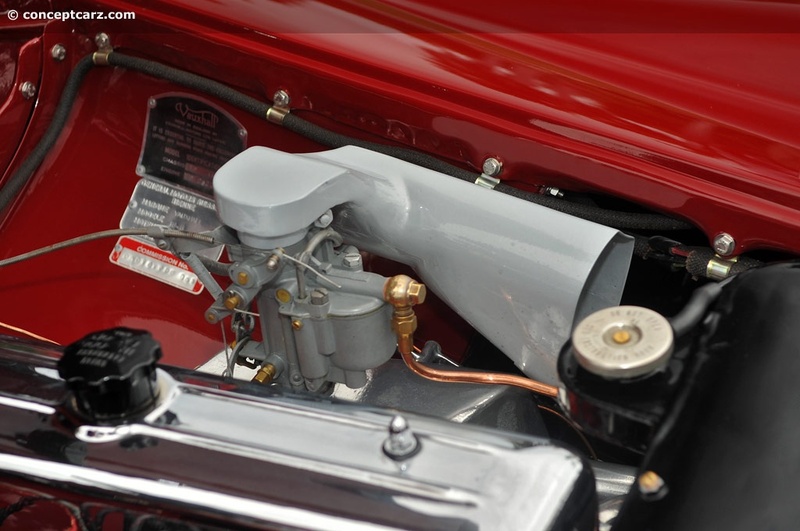 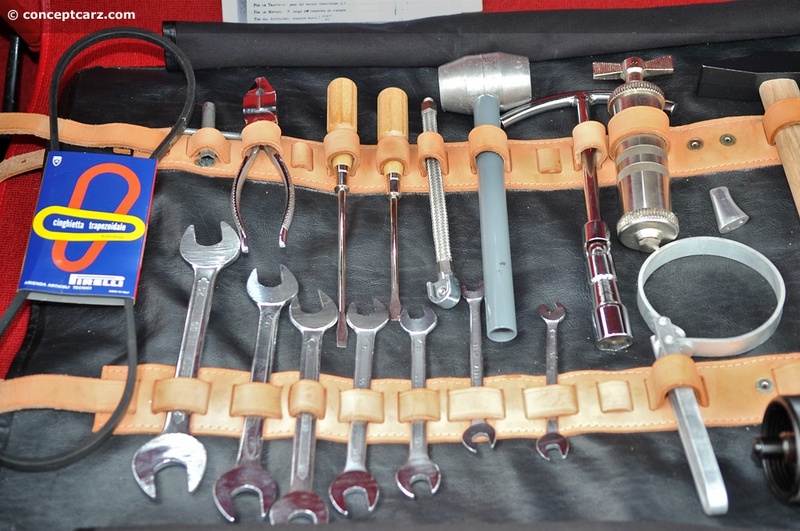 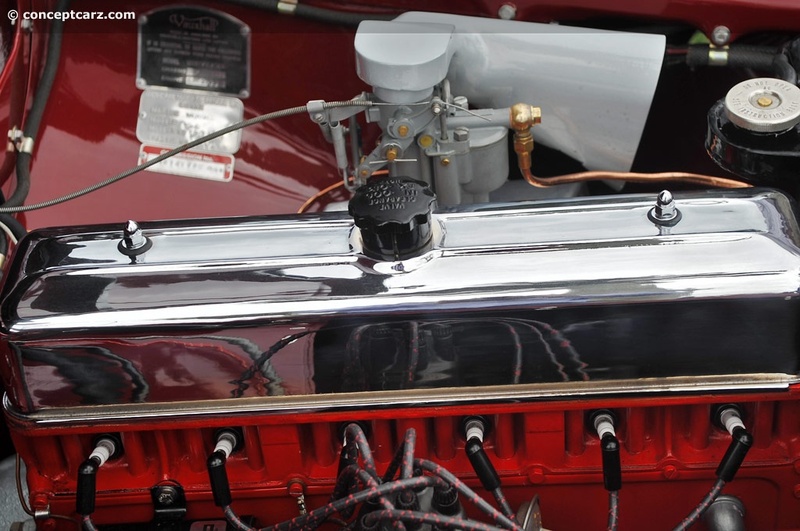 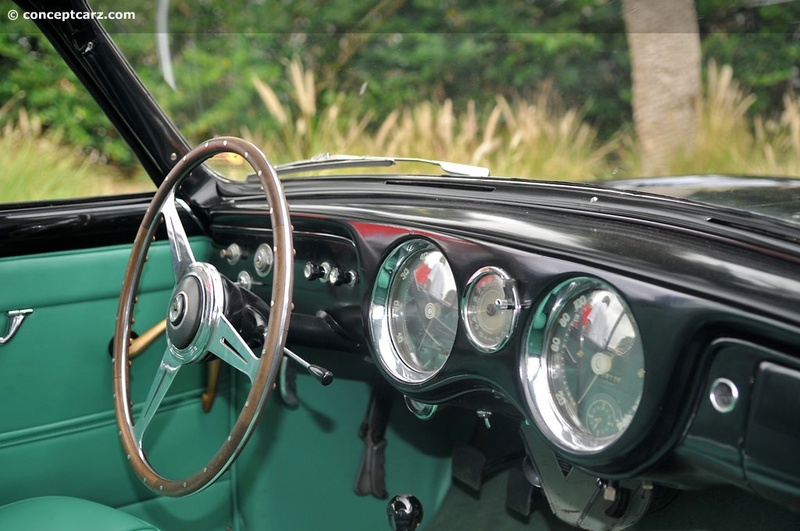 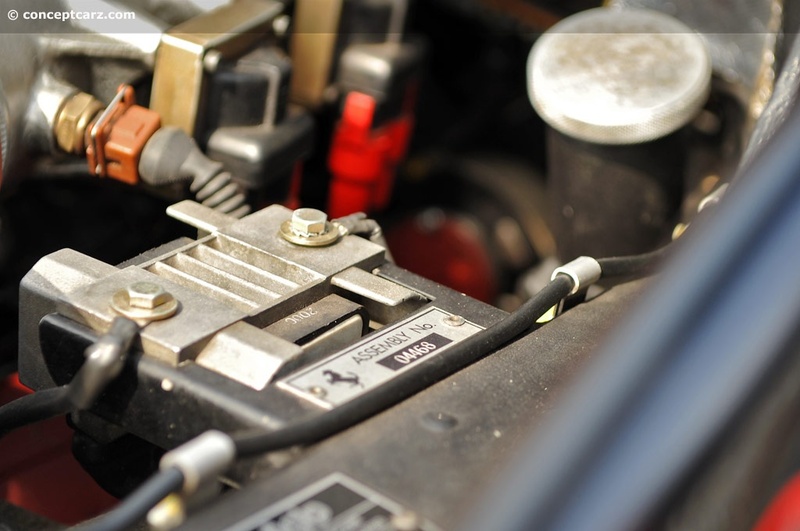 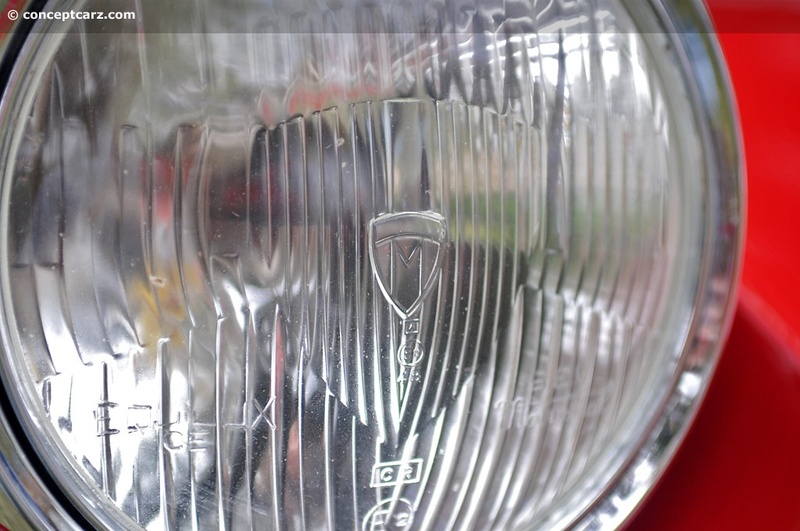 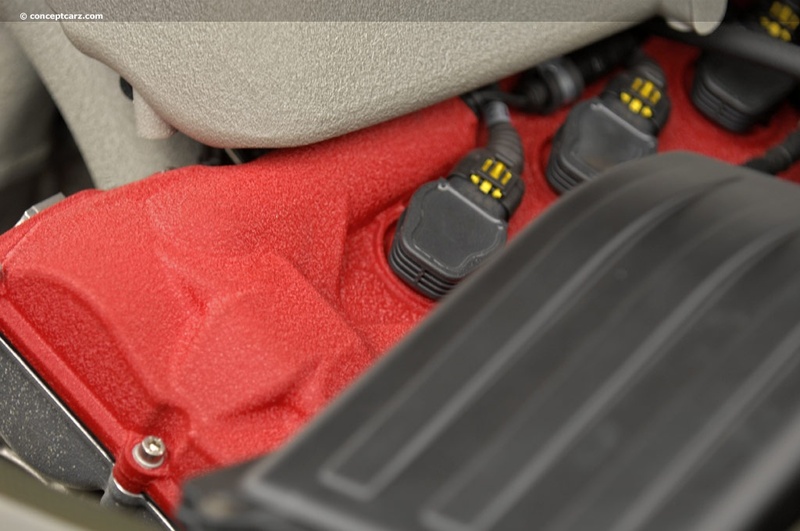 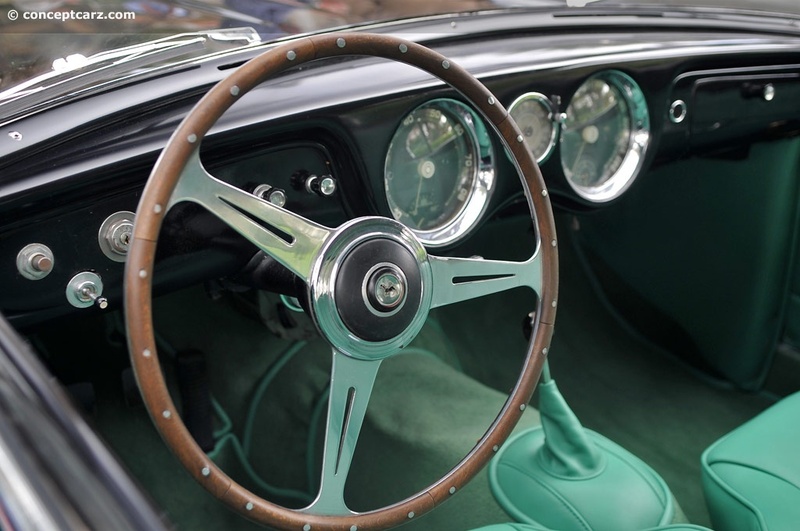 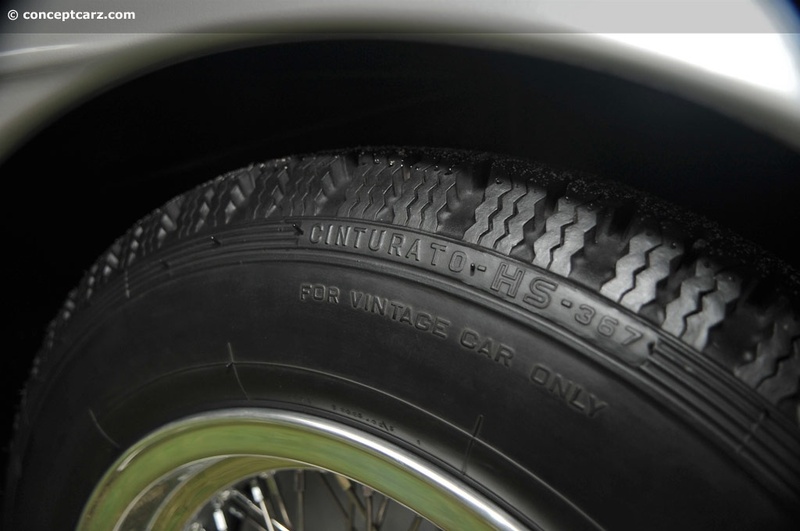 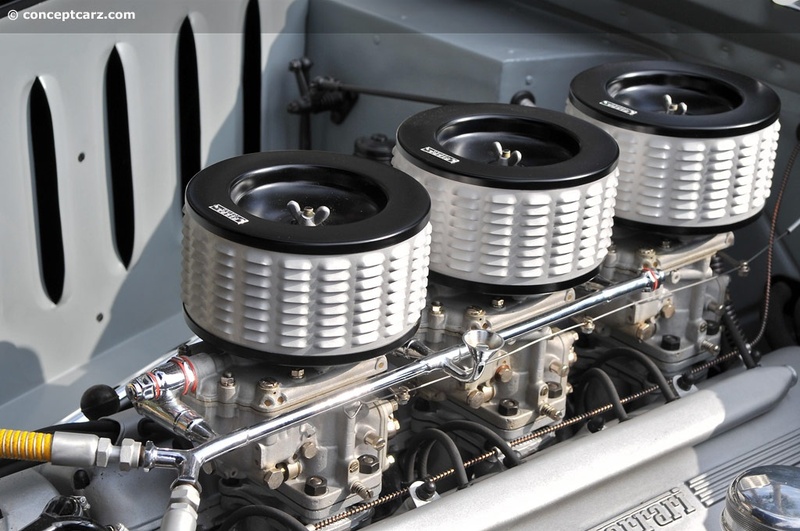 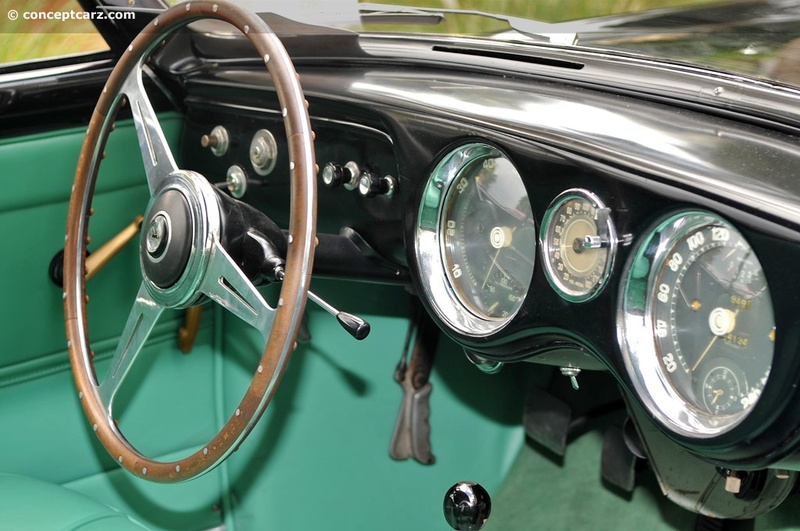 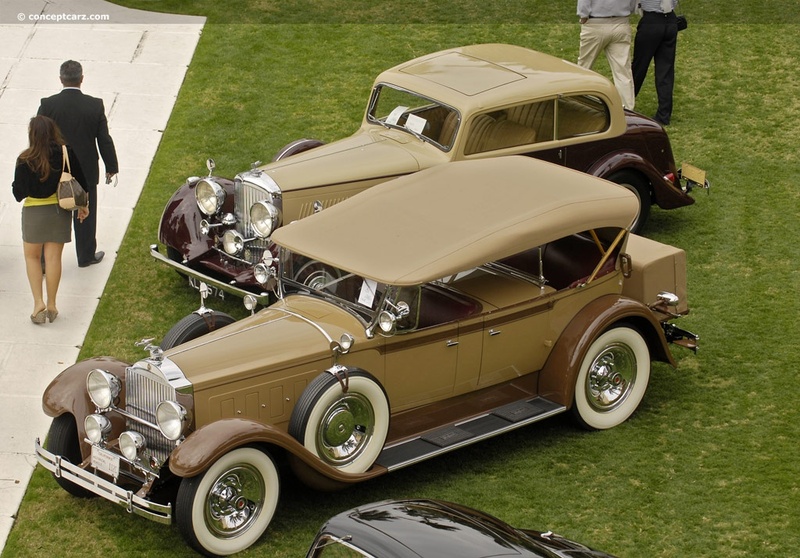 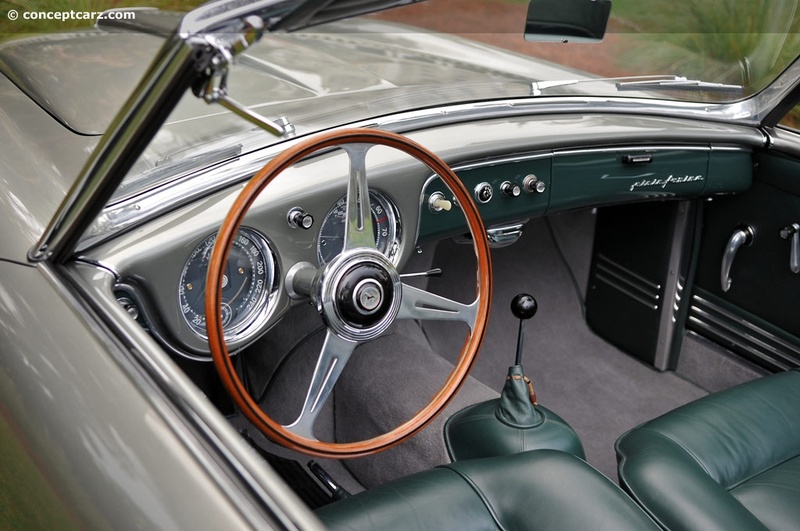 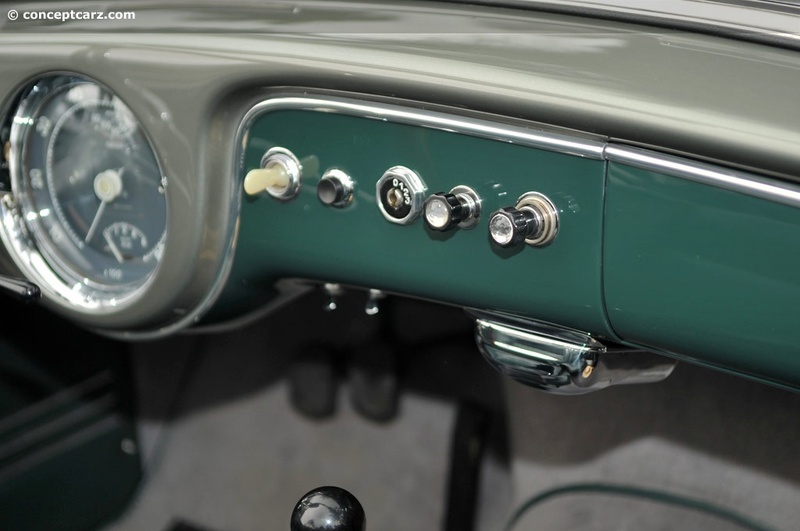 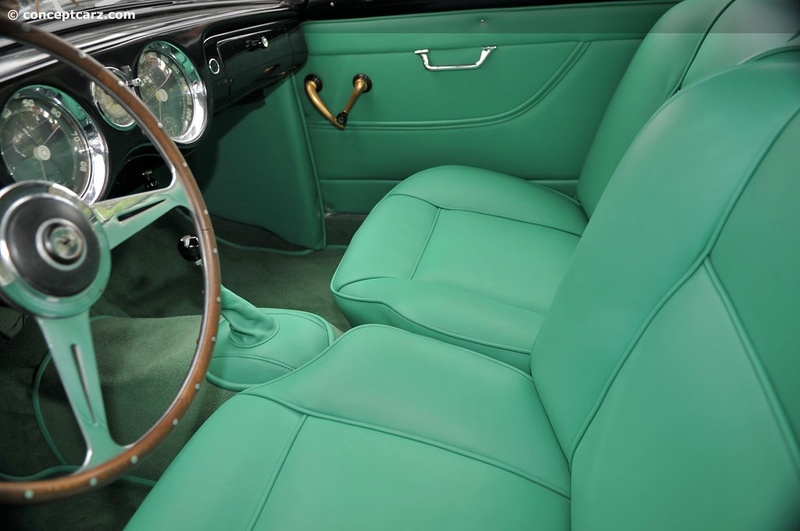 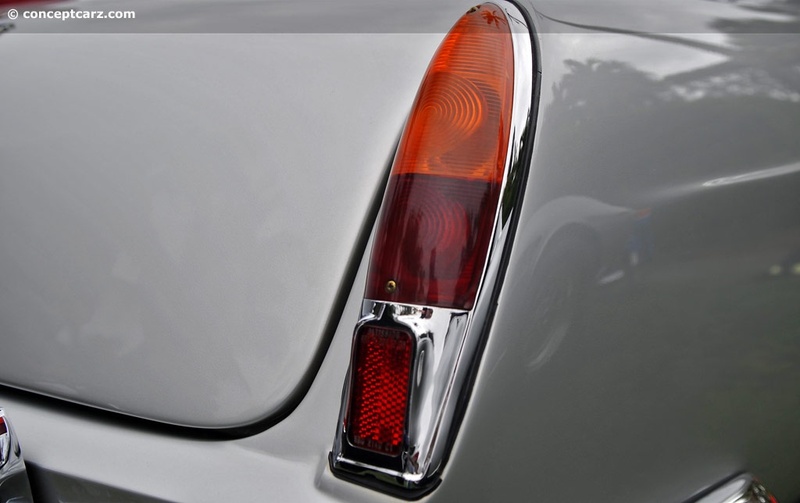 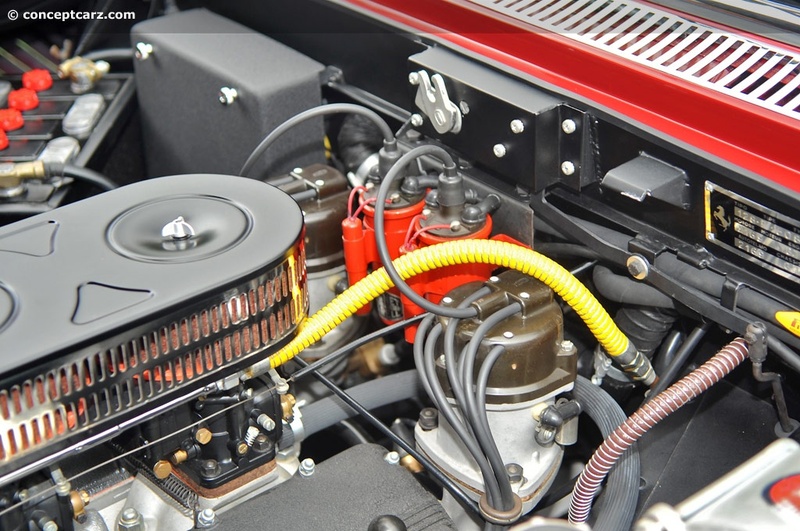 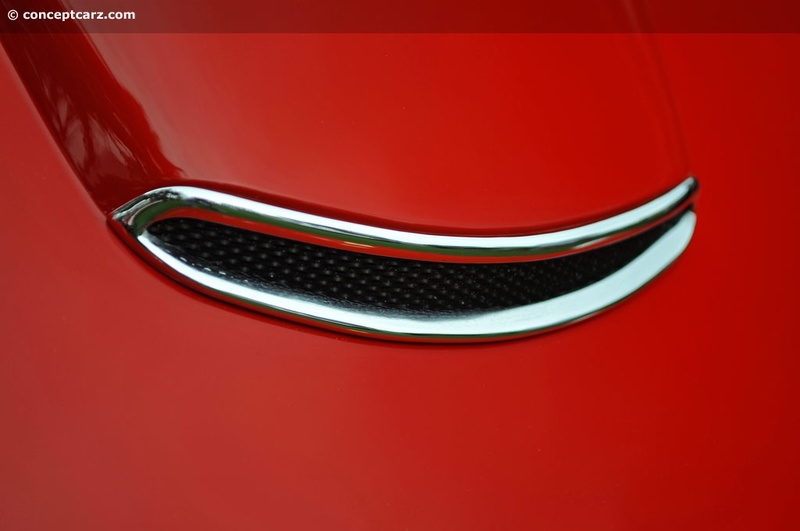 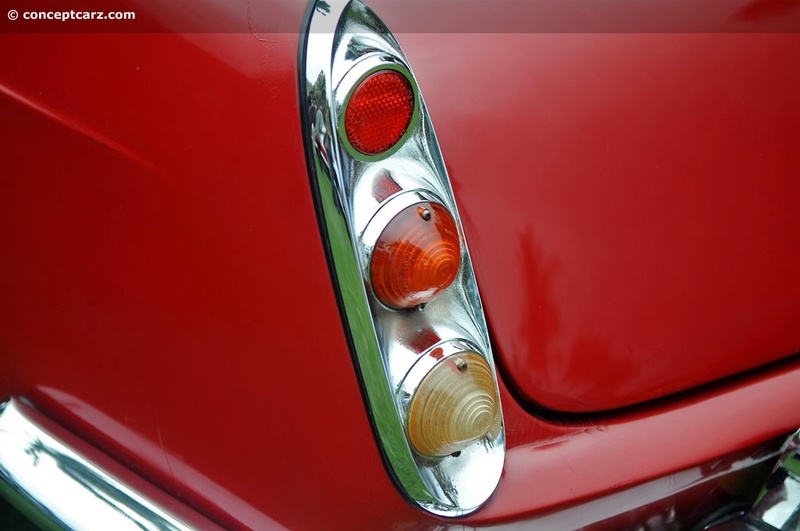 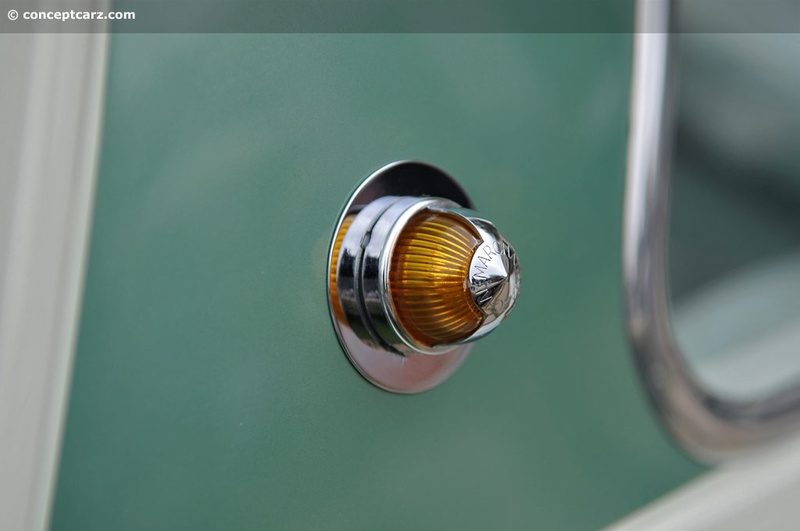 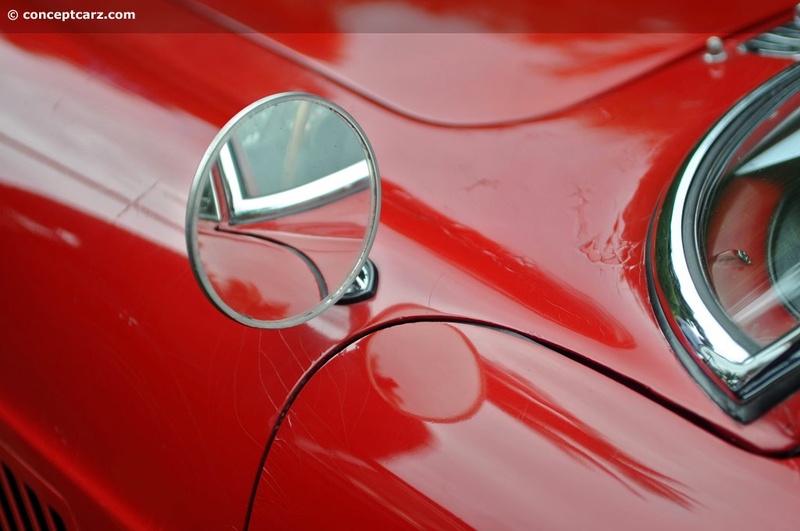 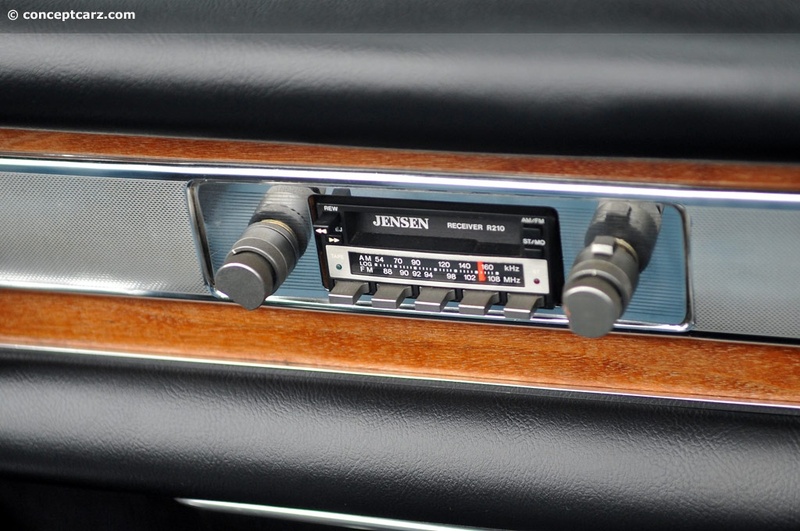 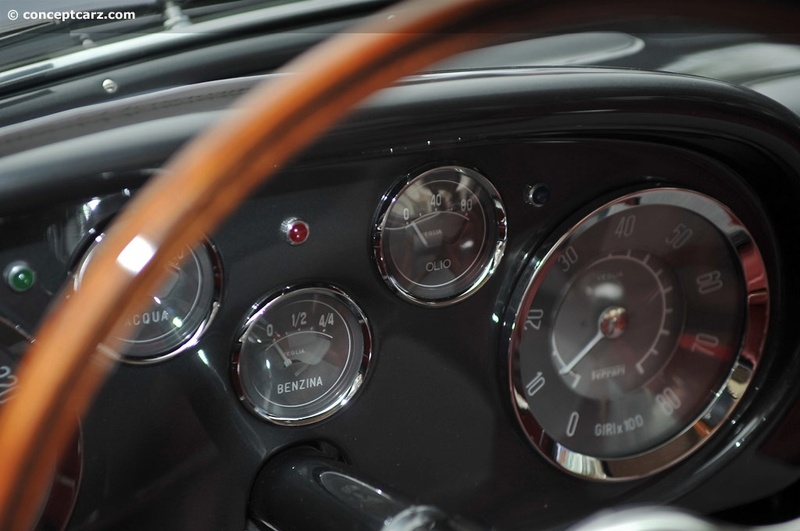 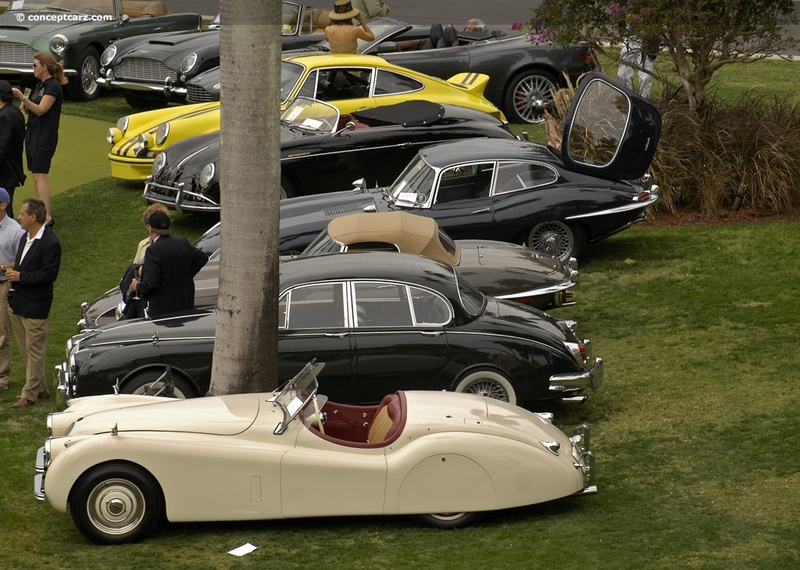 Cars in this group spanned nearly 3 decades, from the 1930s until the late 1950s. 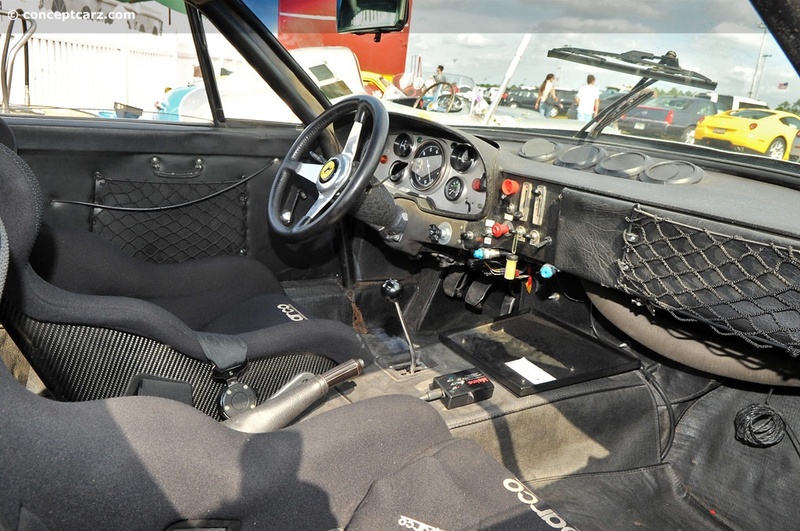 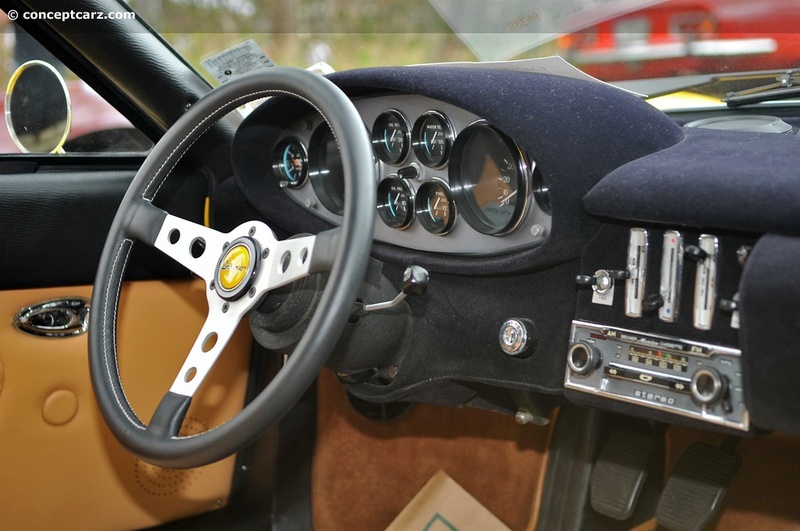 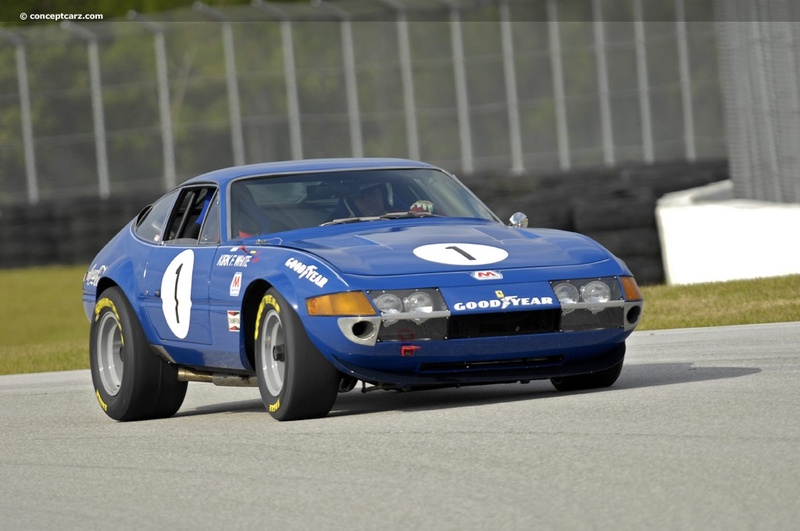 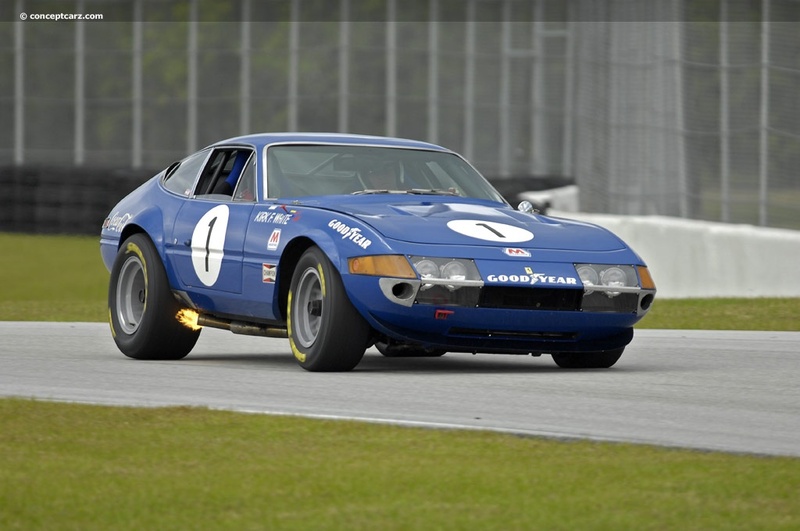 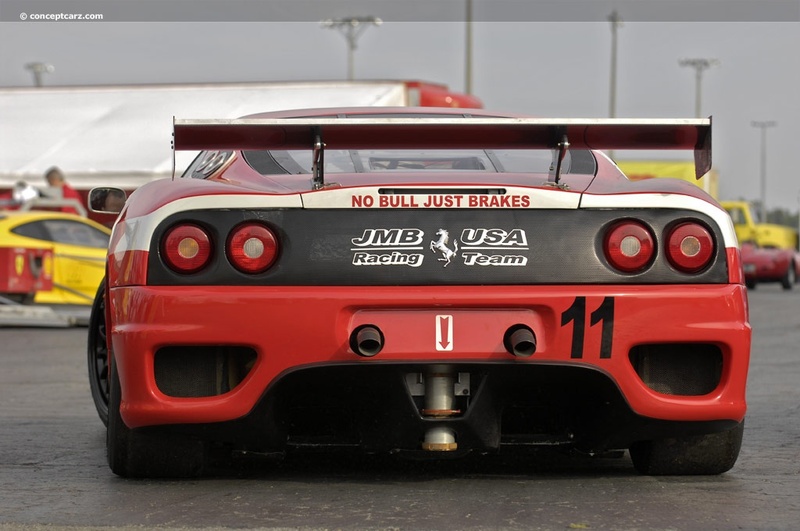 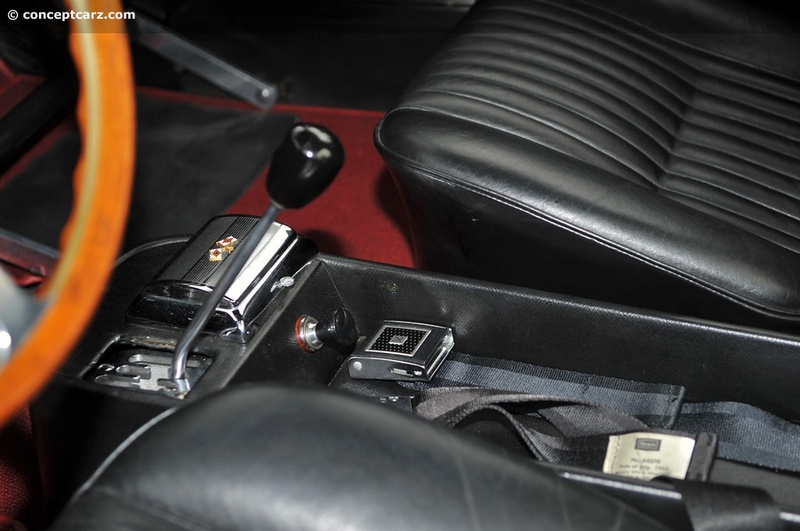 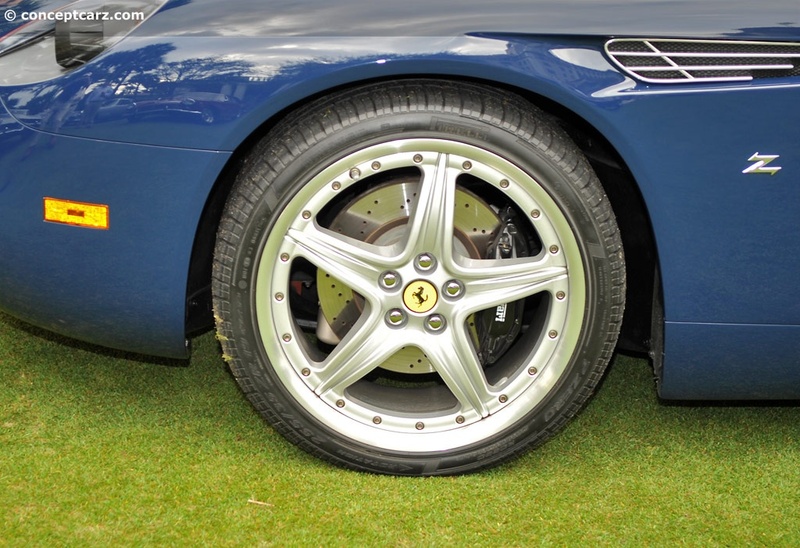 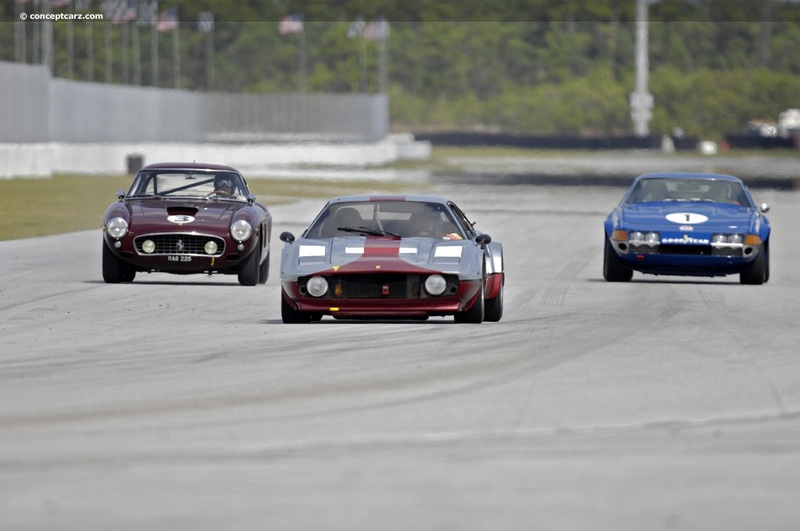 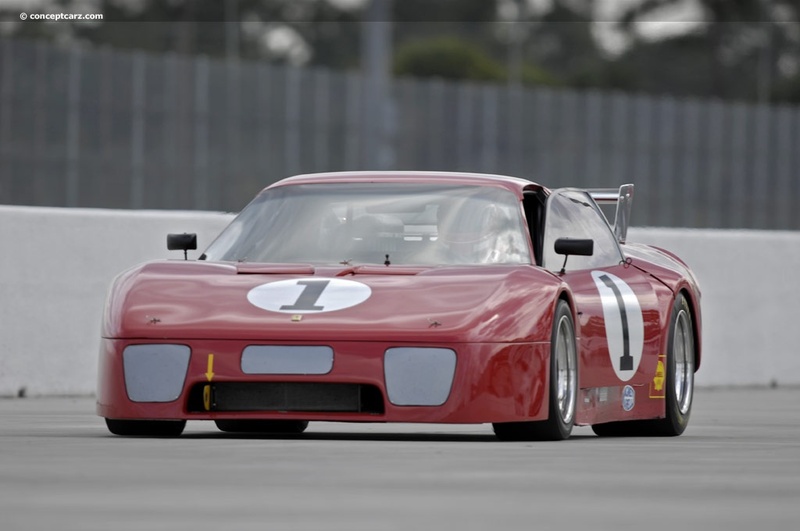 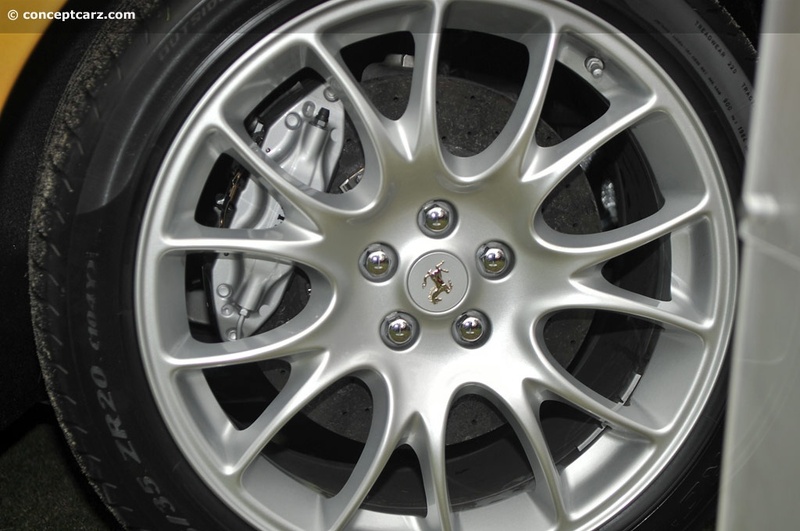 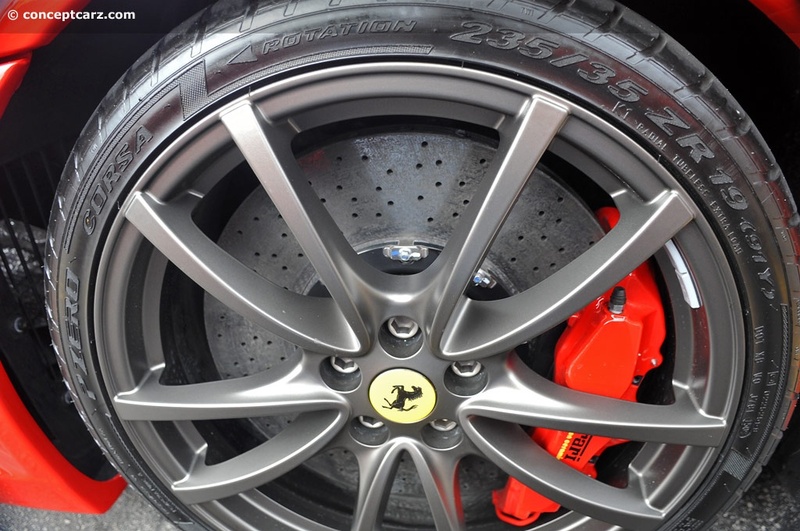 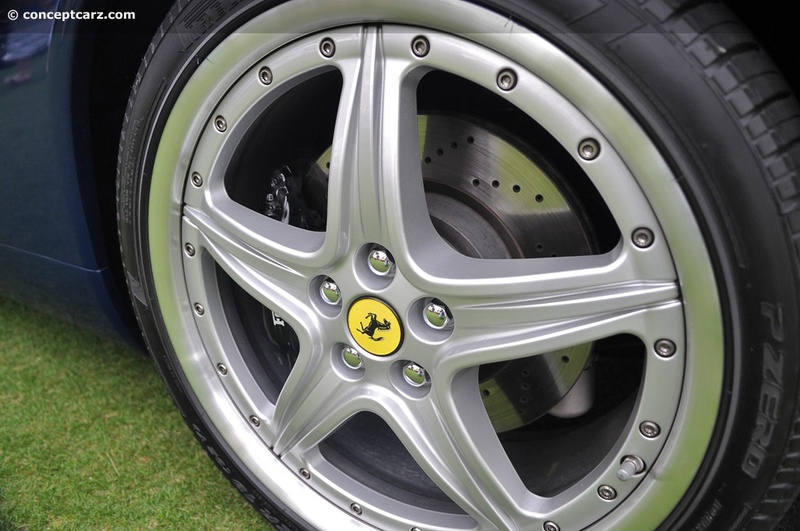 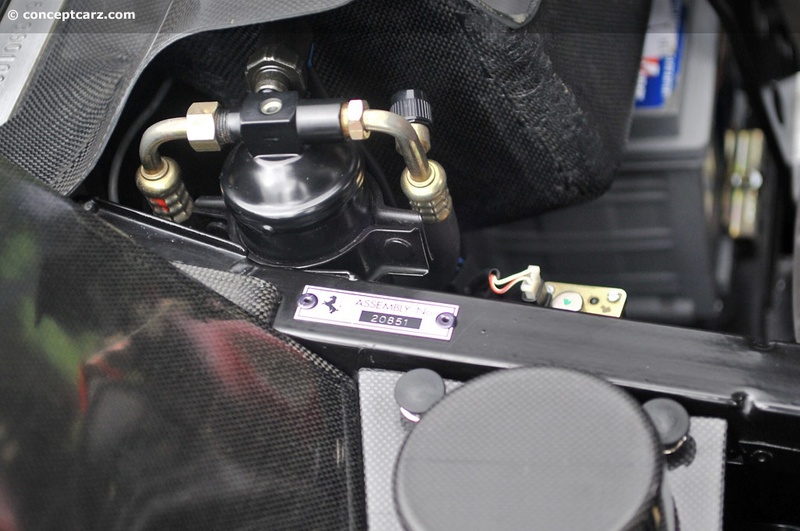 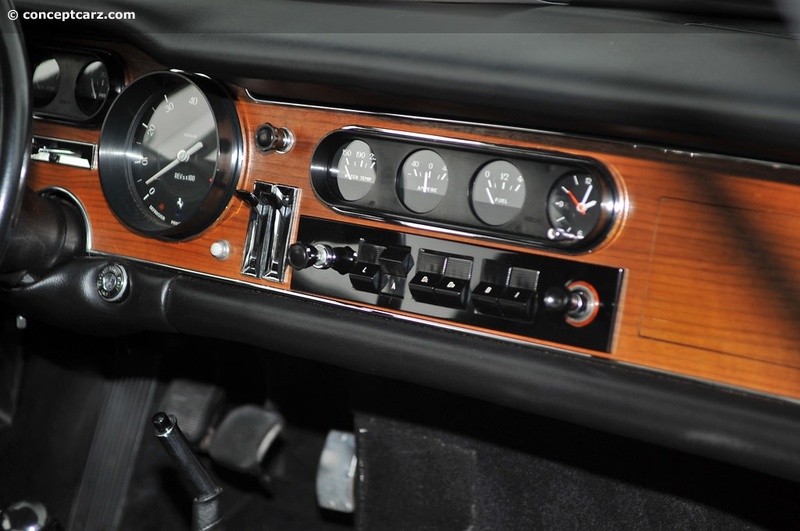 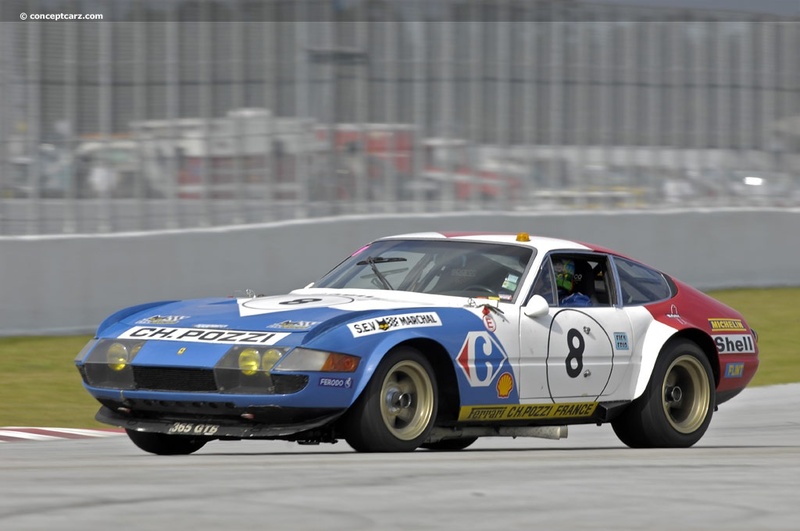 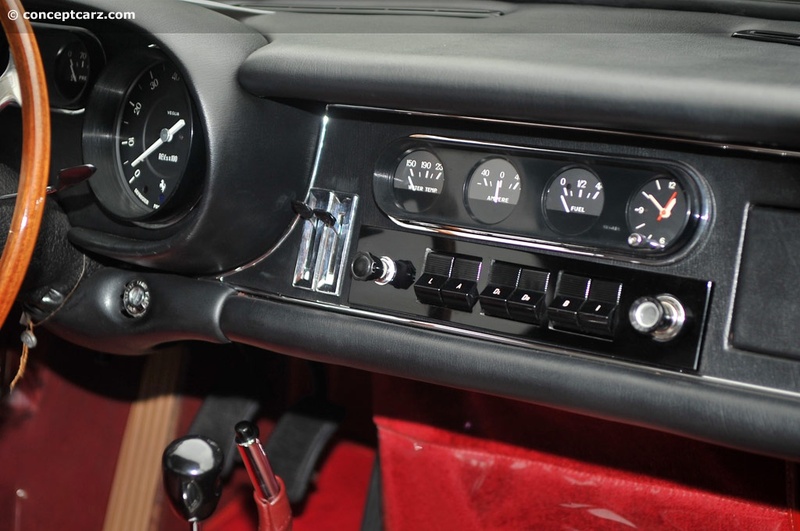 The Disc Brake category included several memorable competition cars including the GTO, the Daytona, 250LM, and the BBLM - all fitted with disc brakes. 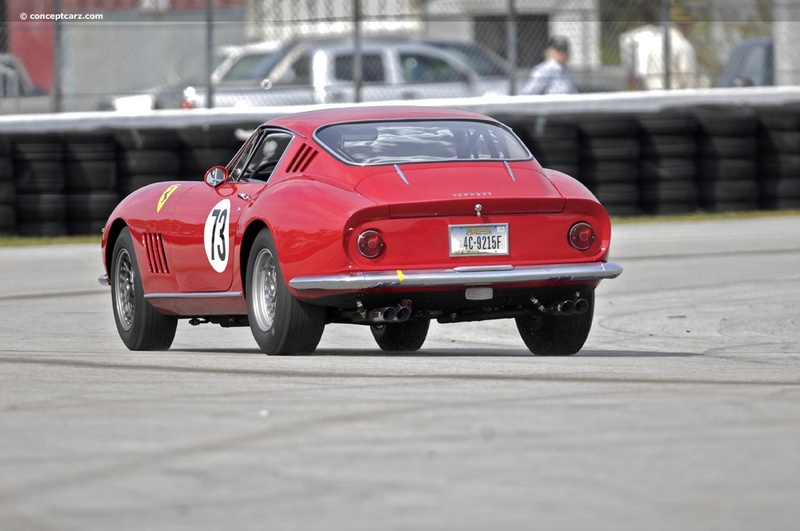 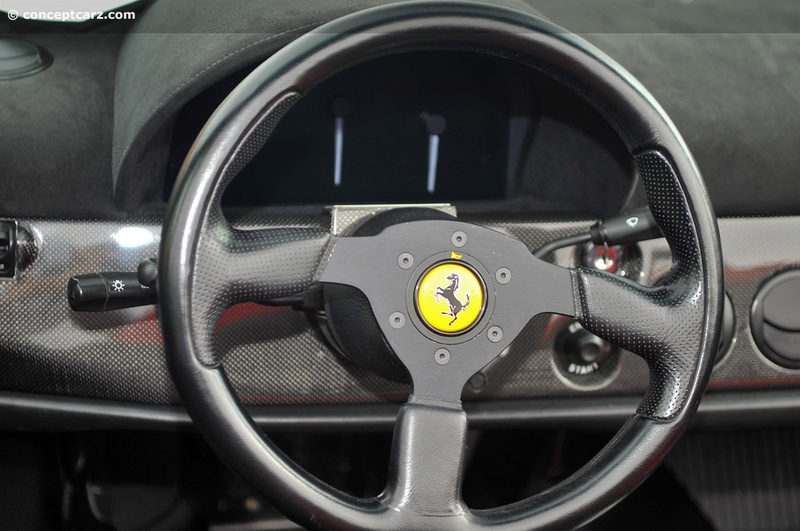 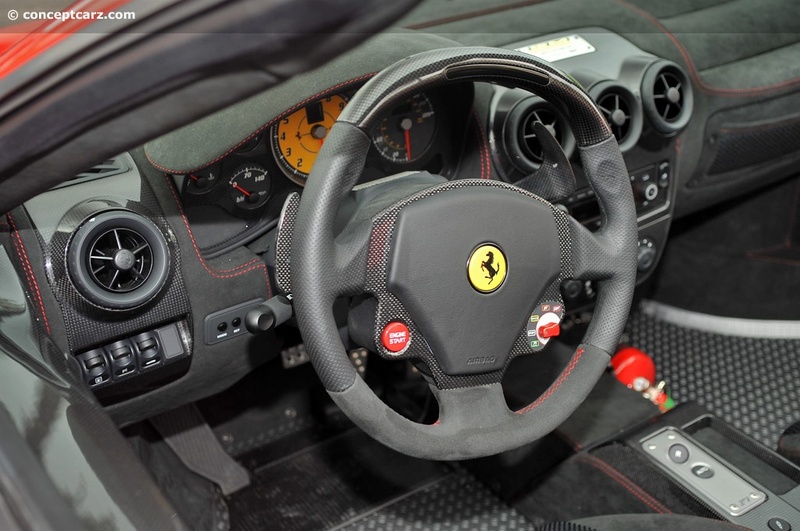 The Sport group was basically opened to drivers who wanted to drive their Ferraris at speed (or at least their comfort level), rather than to race. 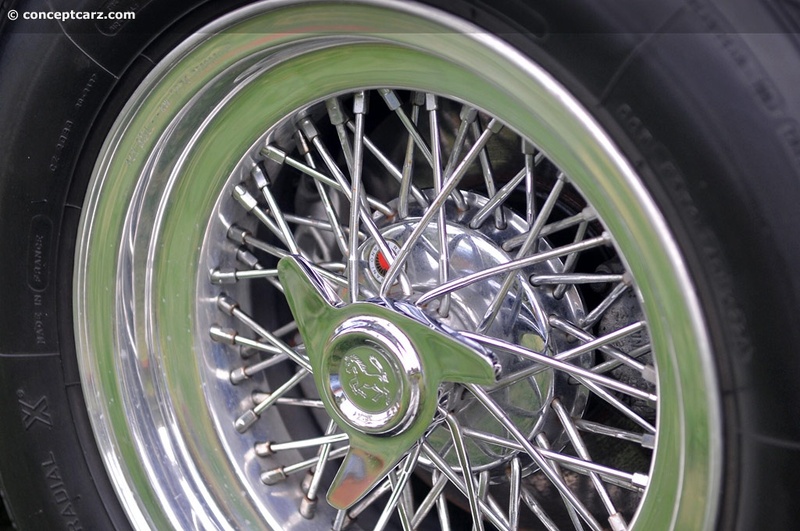 Both Disc and Drum brake groups seemed smaller than in prior years. 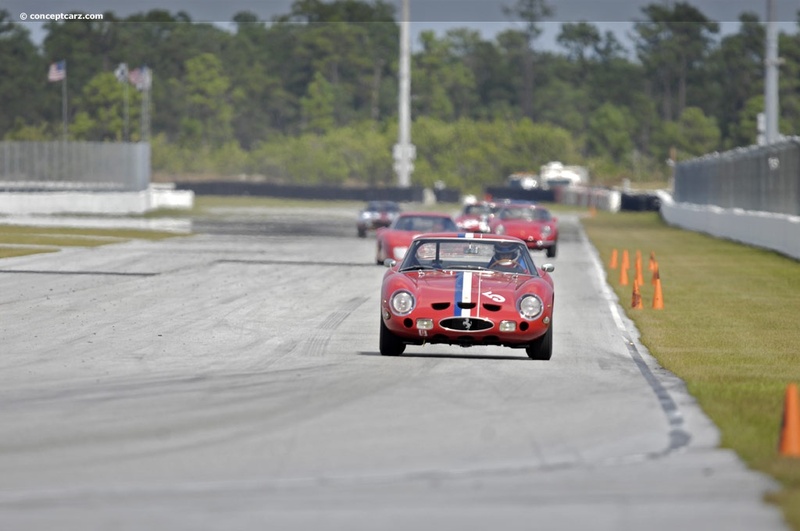 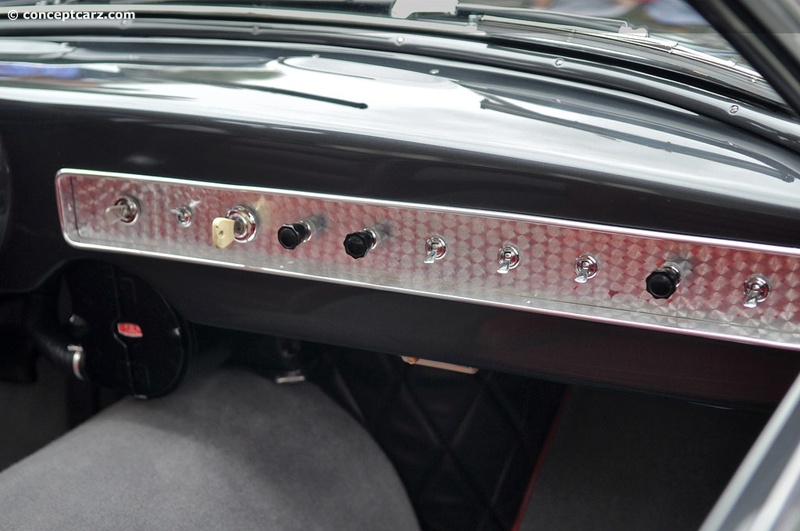 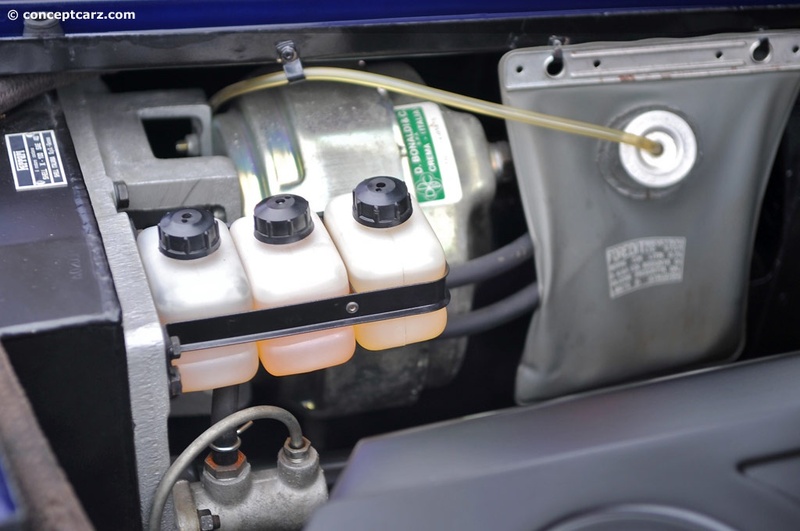 There were just a handful of cars participating in the drum brake group, with most of the cars being from the mid-1950s. 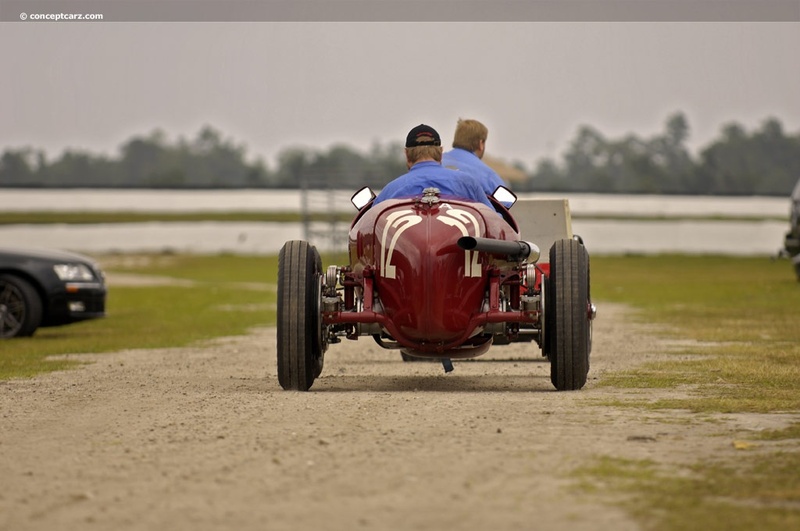 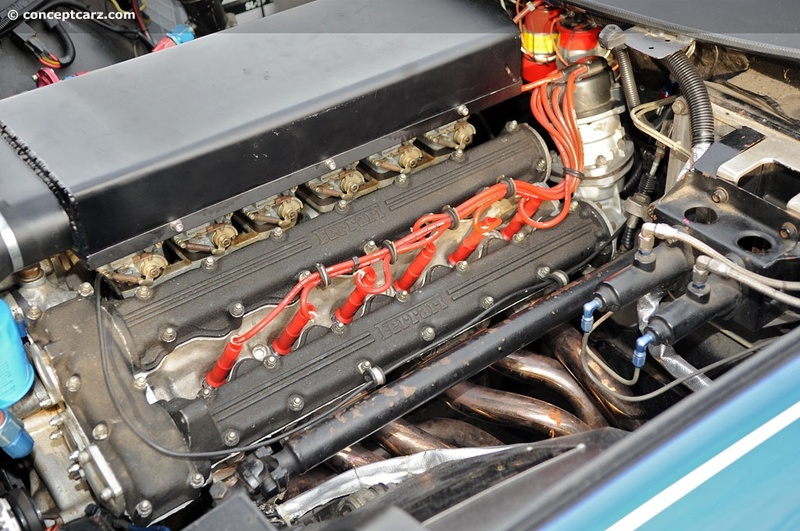 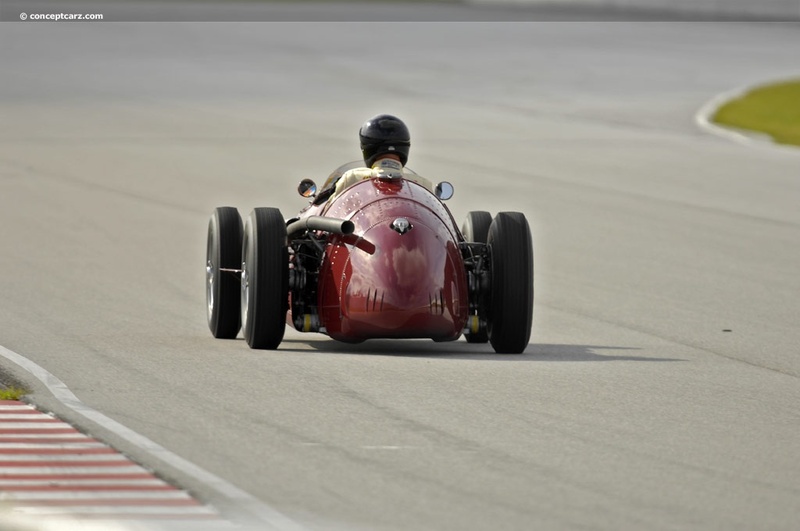 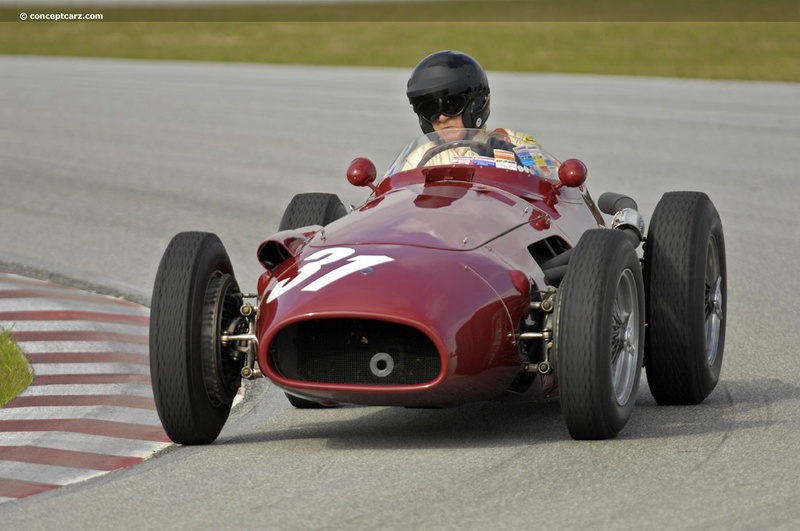 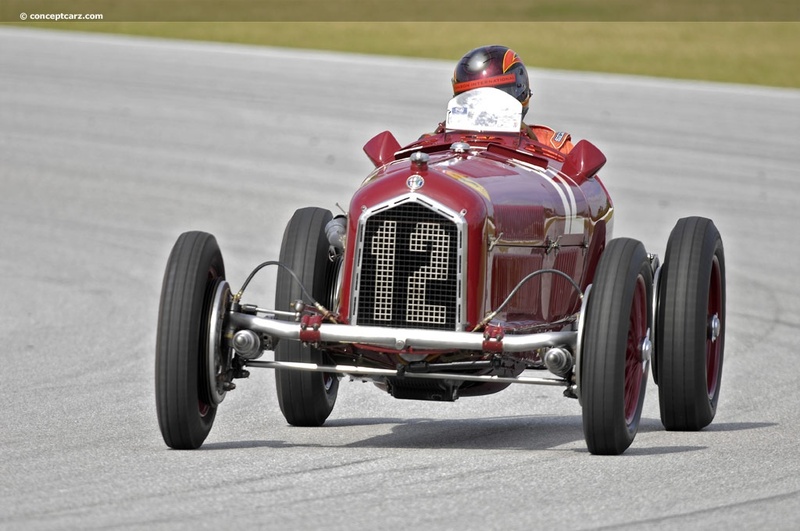 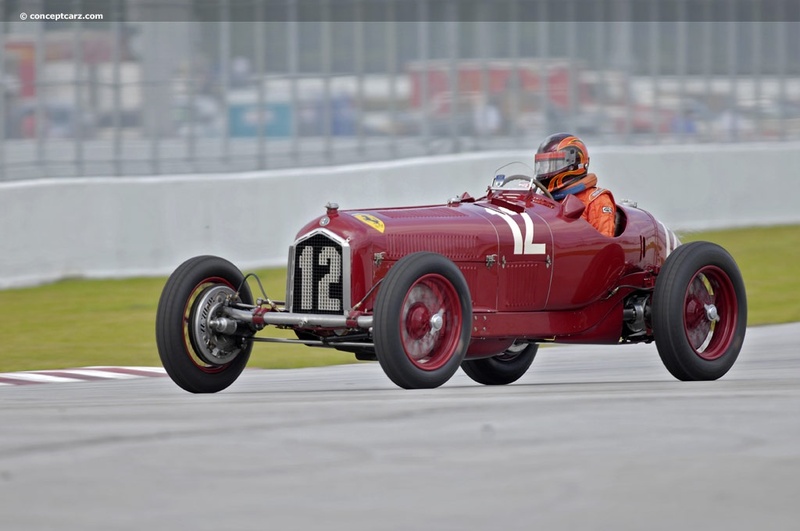 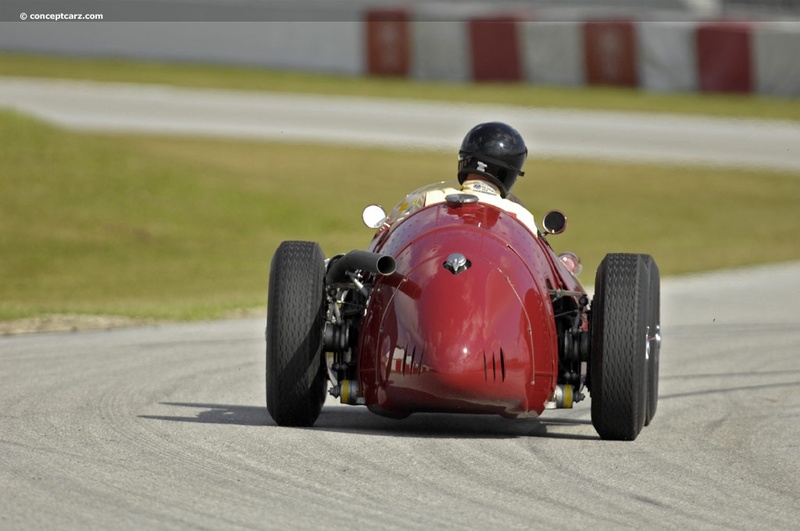 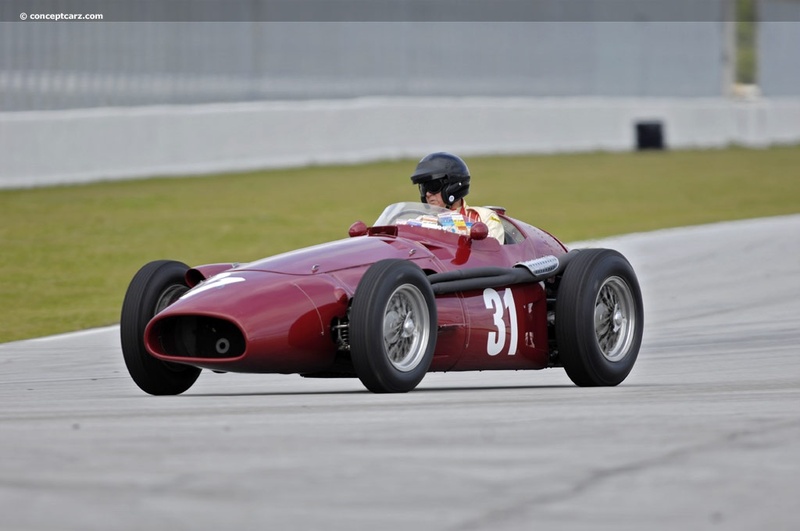 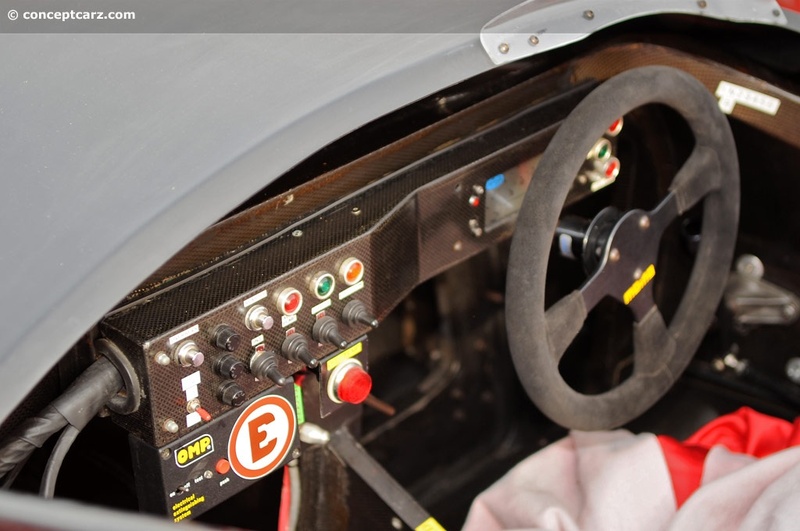 The oldest car (and in a league of its own) was the Alfa Romeo Tipo B P3. 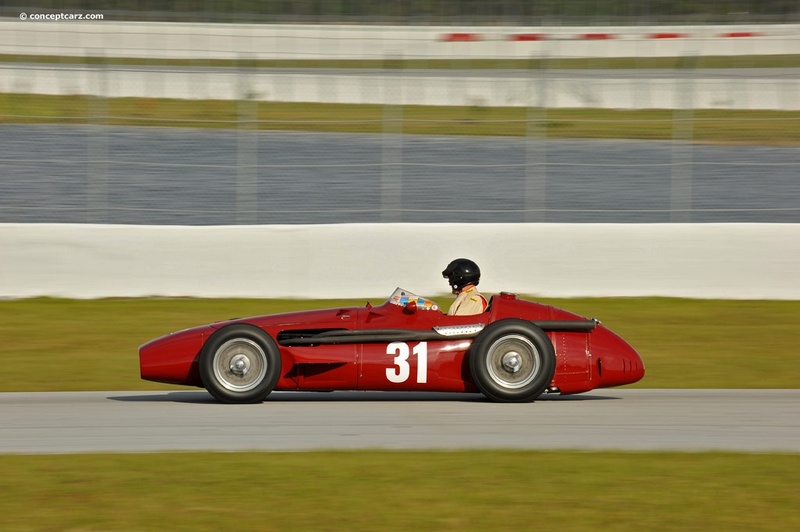 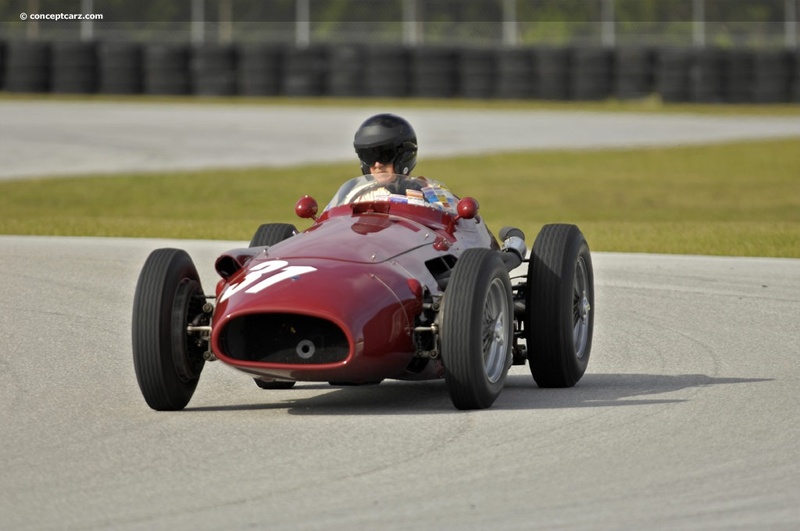 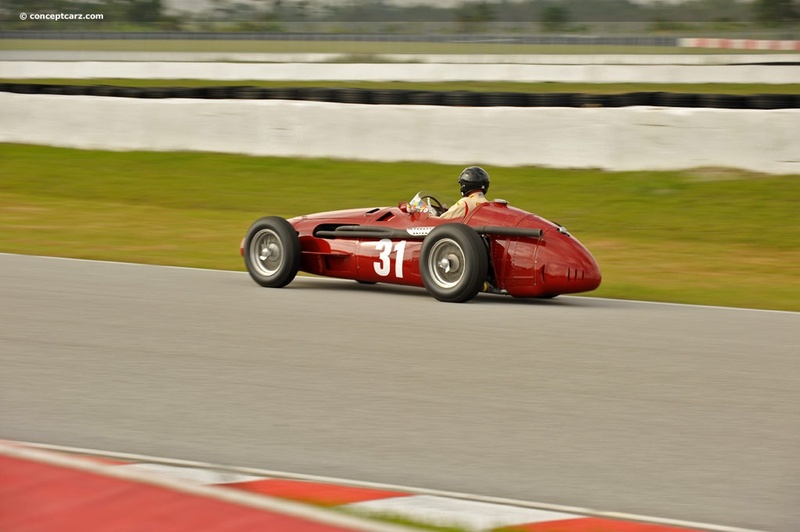 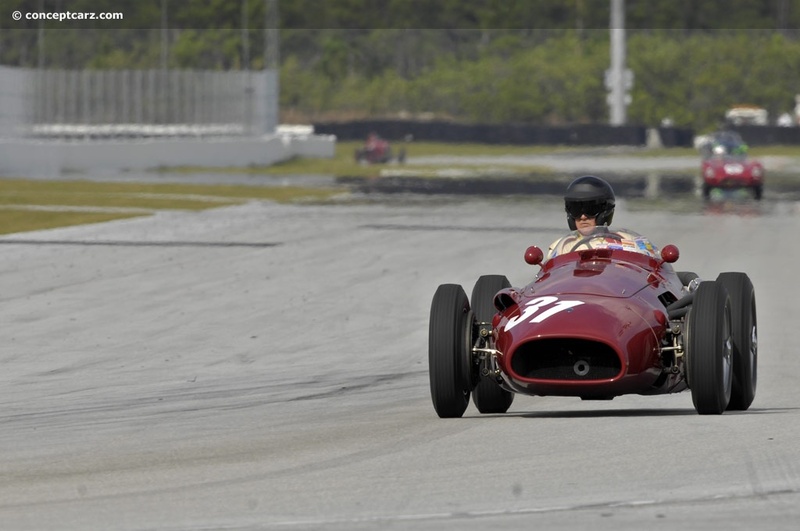 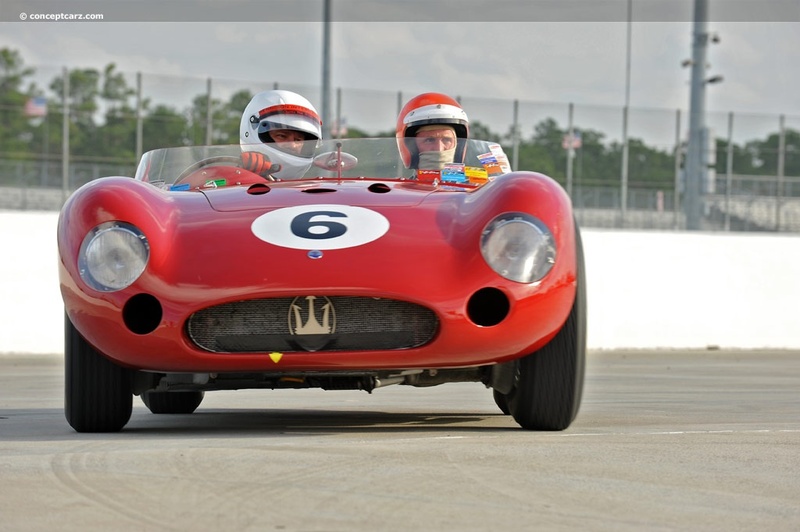 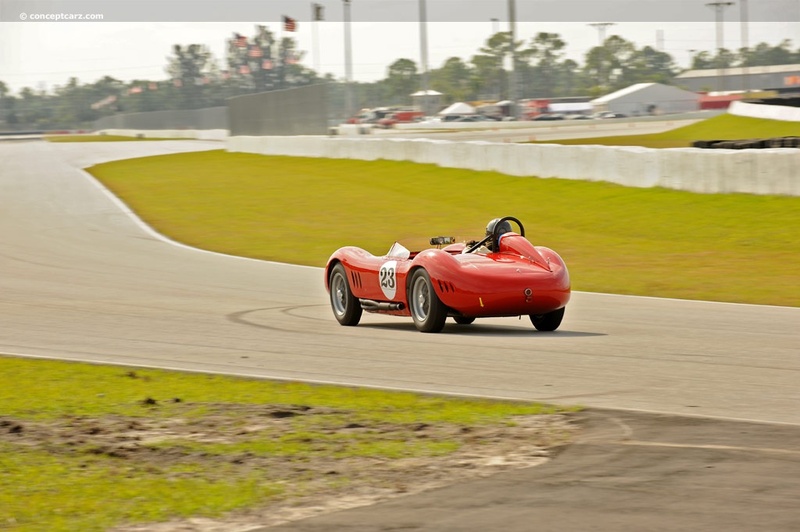 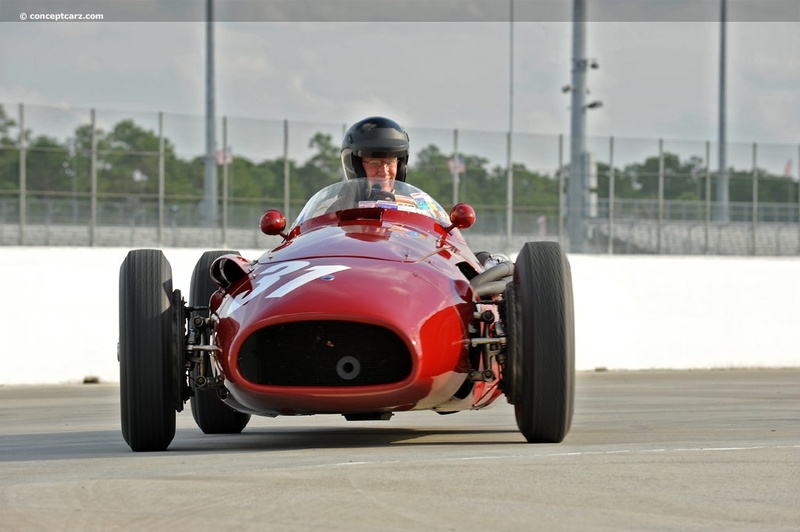 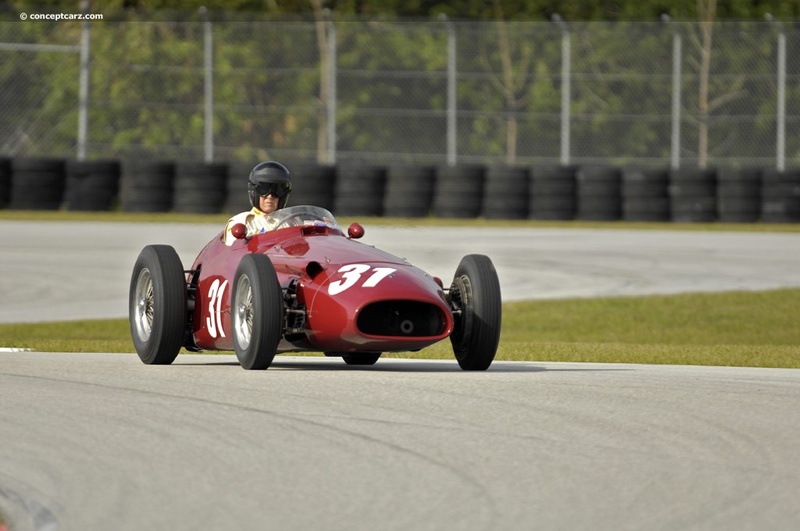 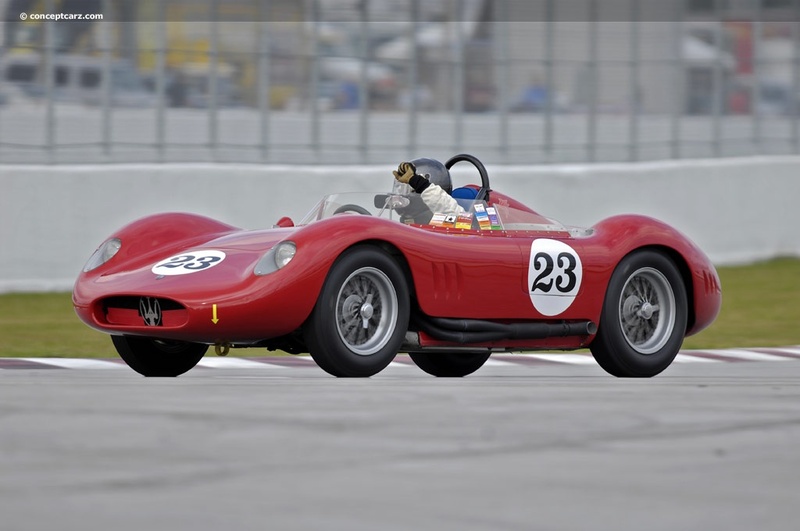 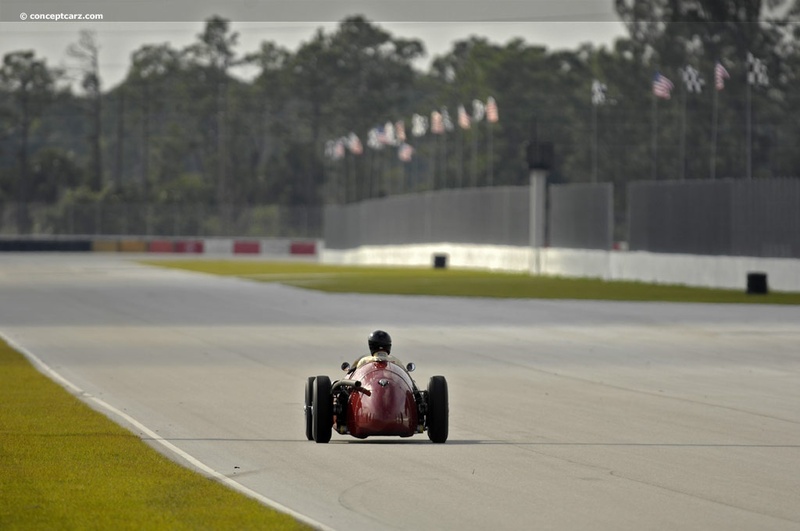 The only other open wheeled car throughout the weekend was the Maserati 250F, which easily and gracefully navigated the twists and turns skillfully. 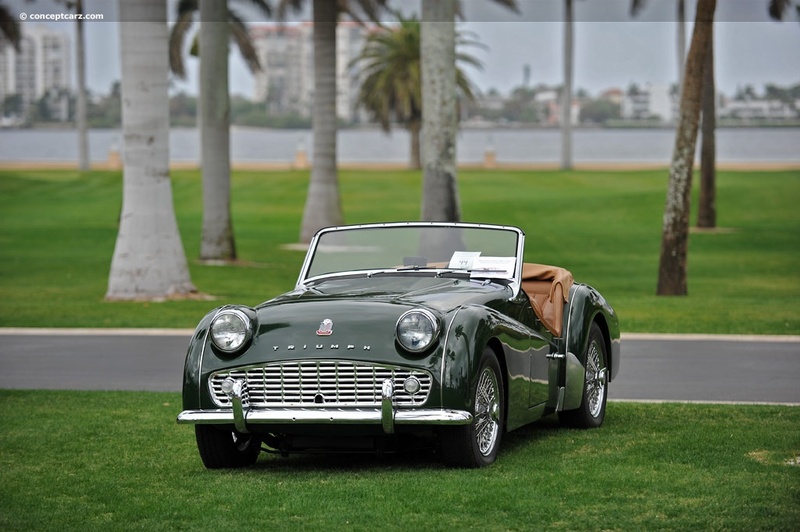 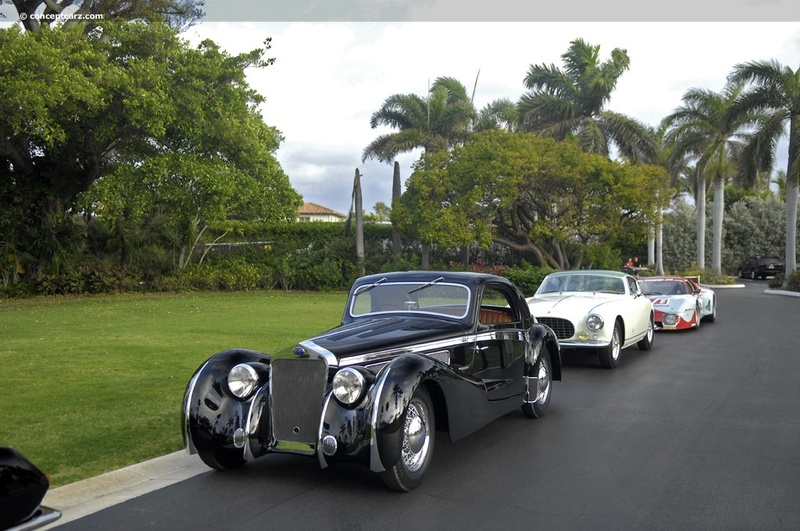 The car that brought the most smiles in this group was the exotic, pontoon fendered 250 TR. 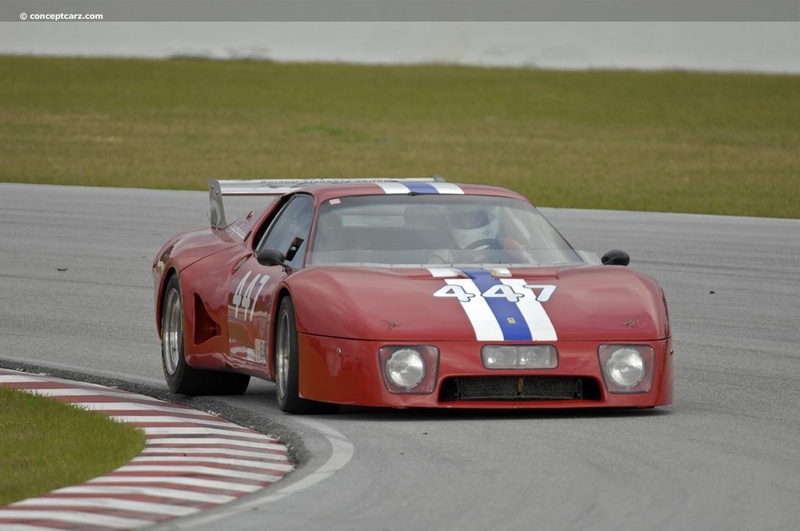 The Disc brake category was a very competitive group, with the 512 BB/LM's leading the pack. 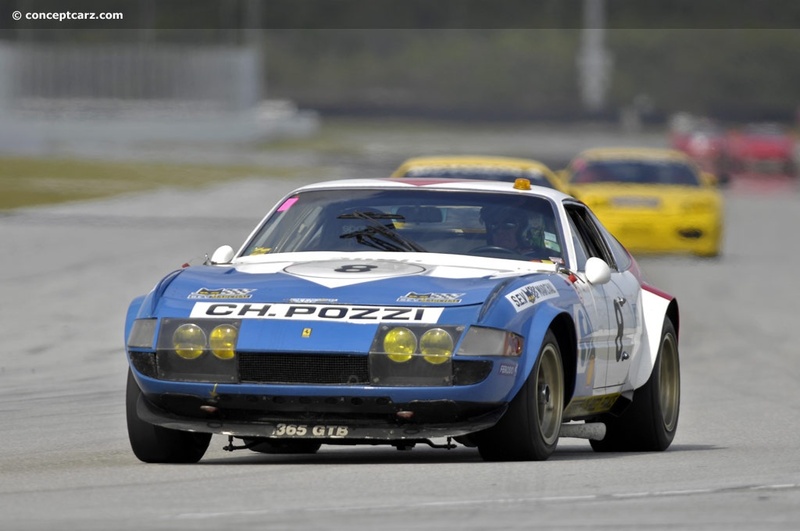 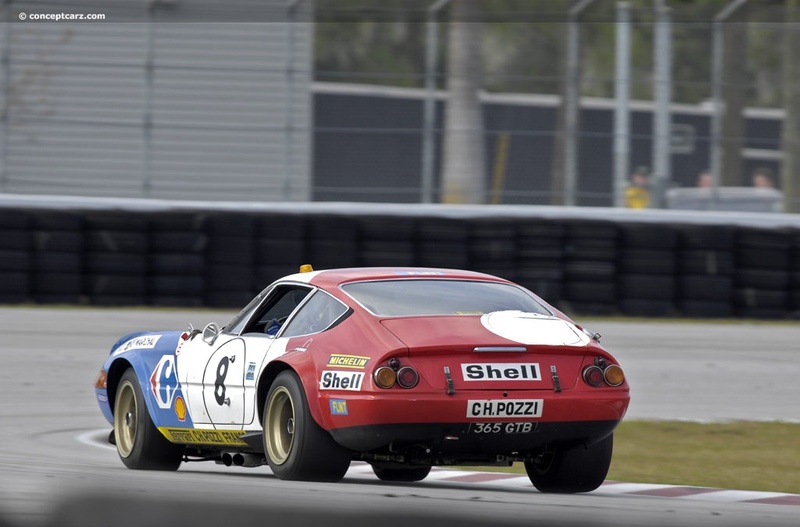 There were two 365 GTB/4 Daytona Competiziones, with chassis number 15667 still wearing its LeMans winning Ferrari France livery. 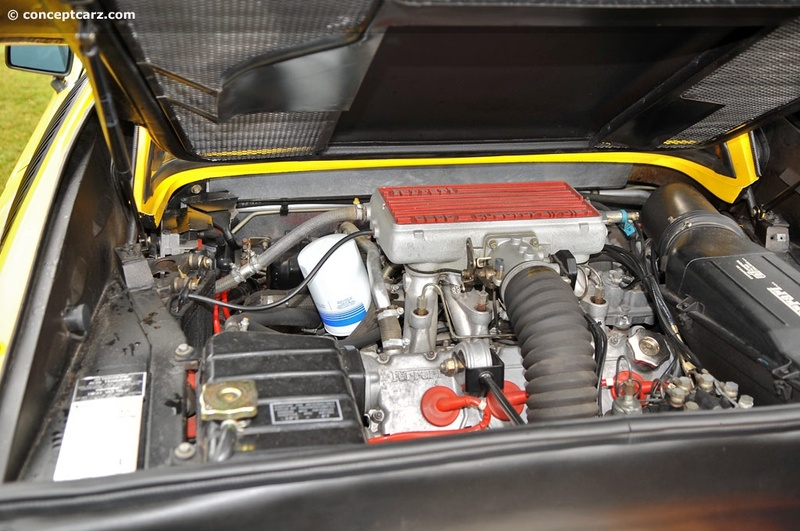 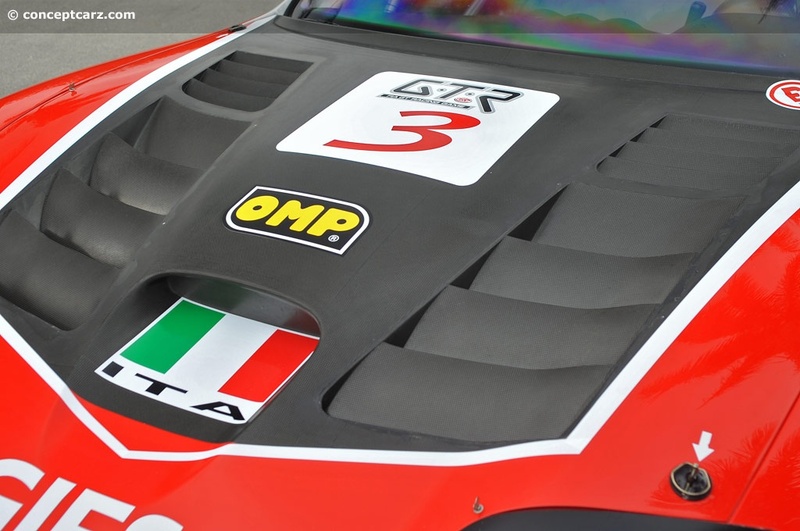 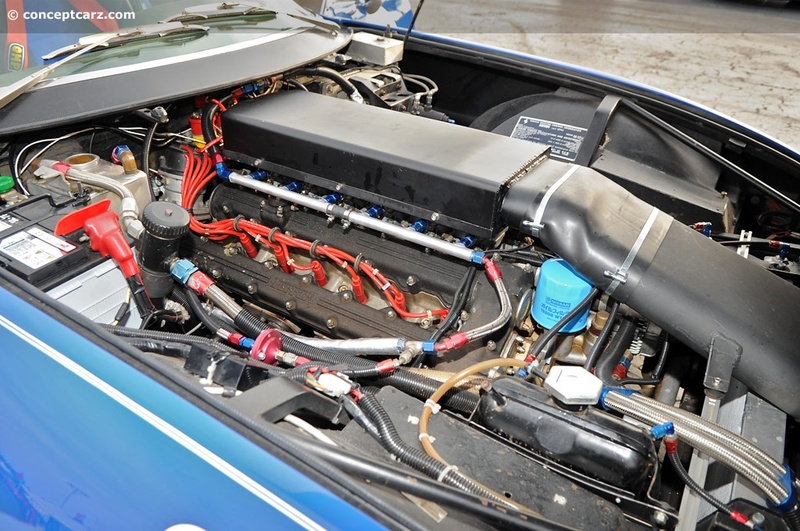 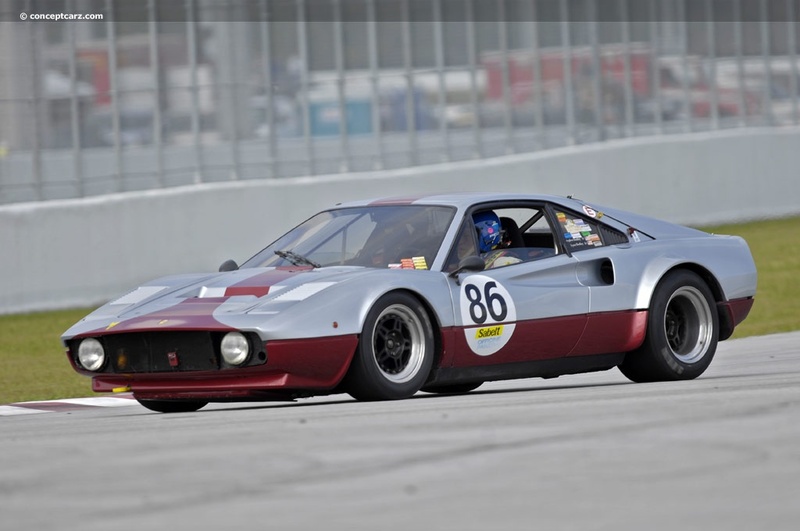 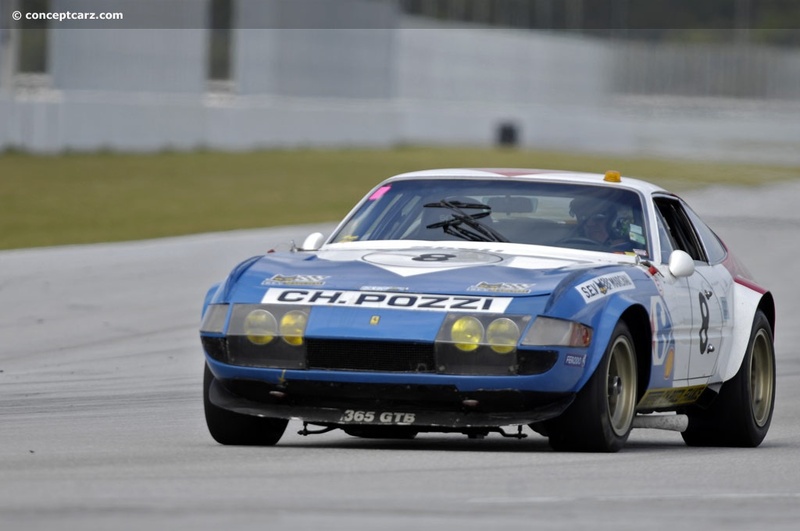 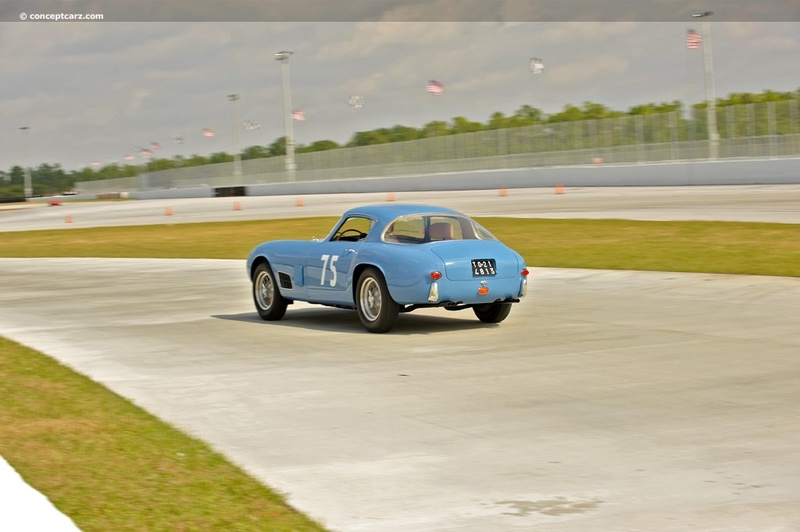 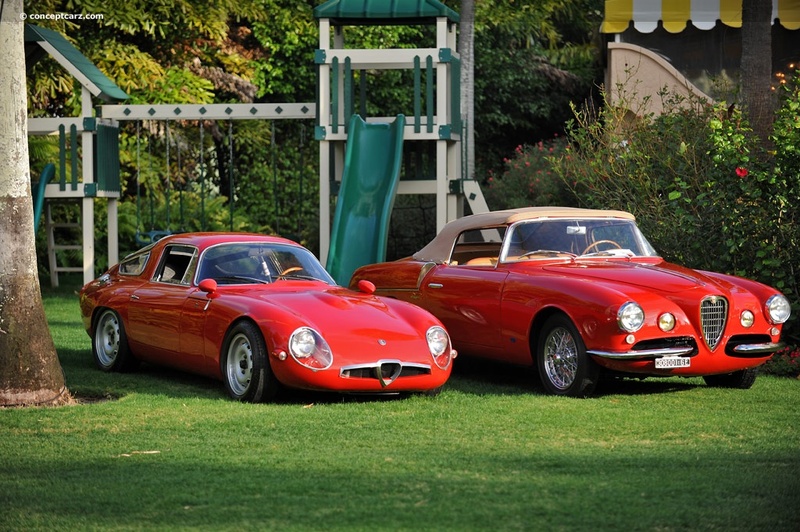 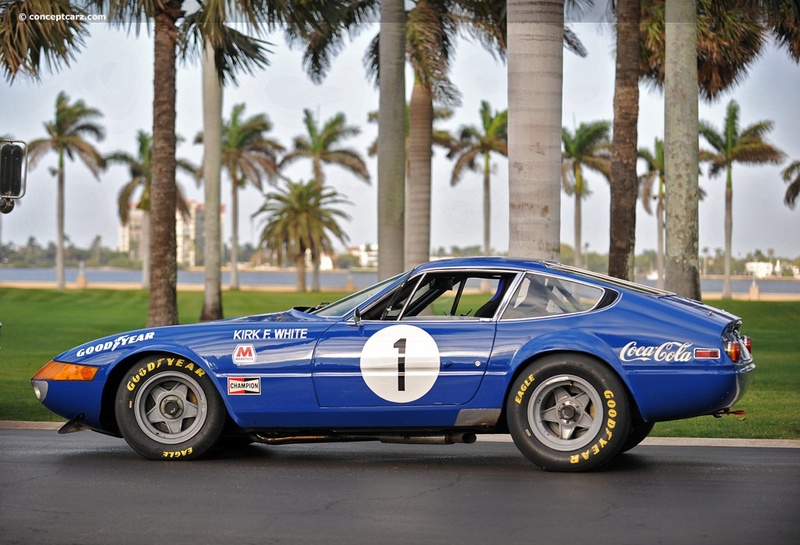 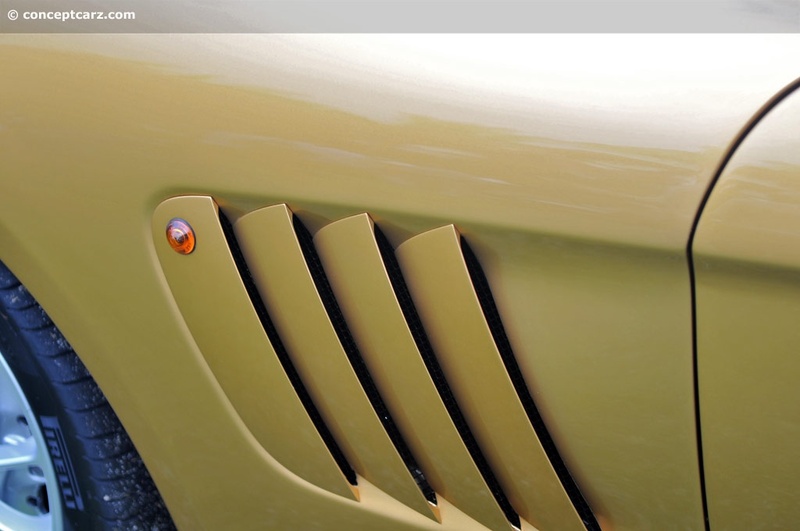 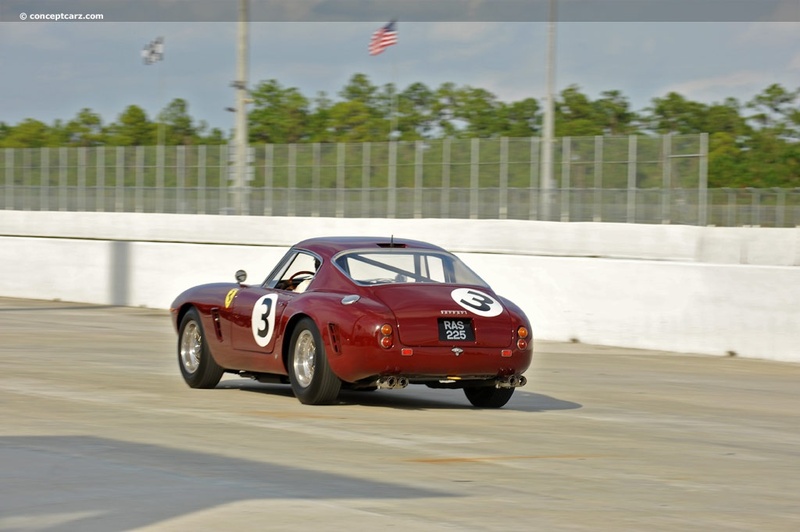 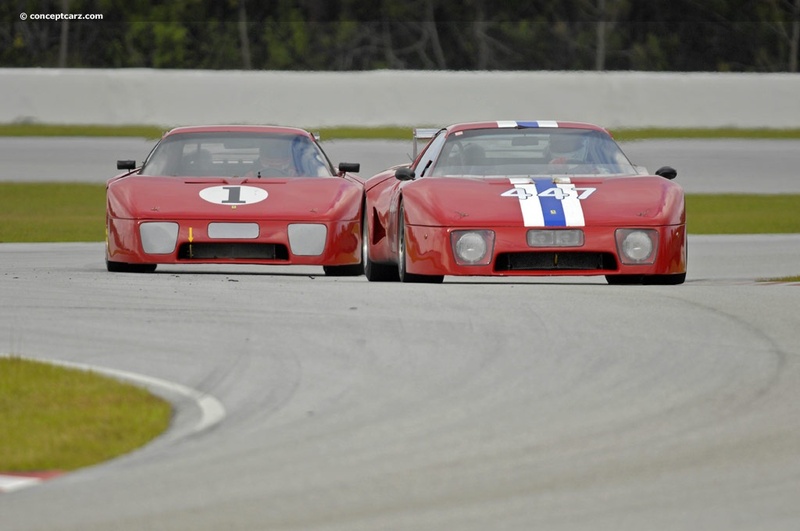 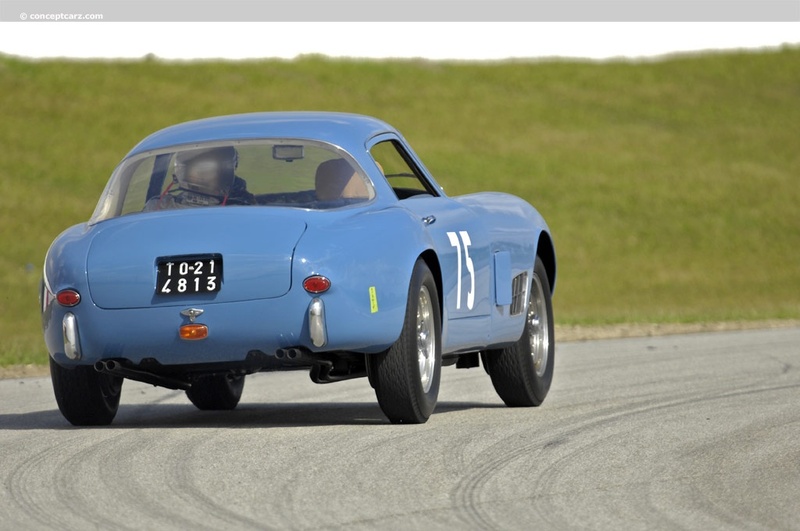 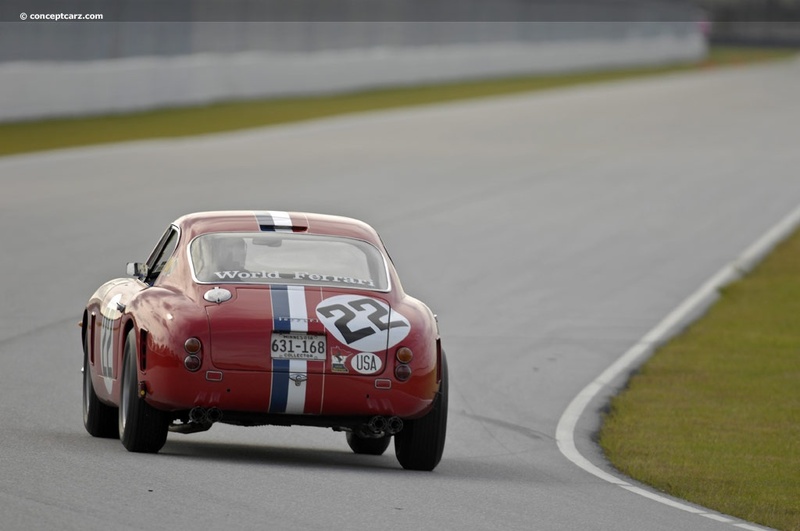 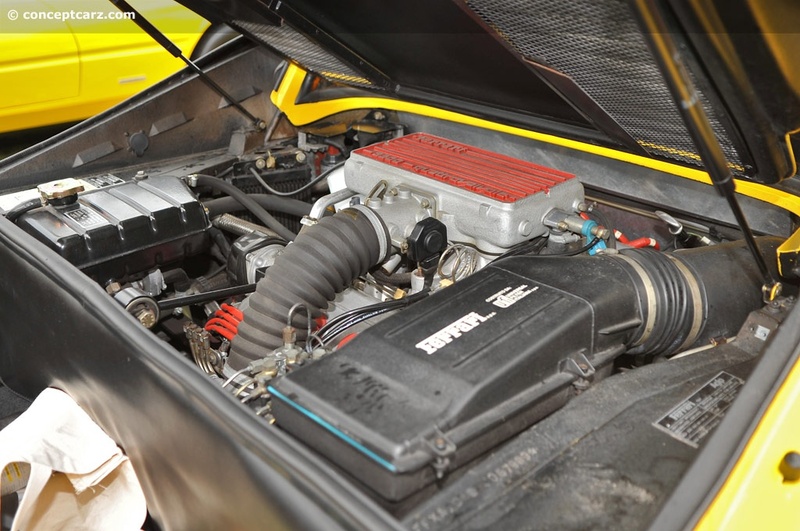 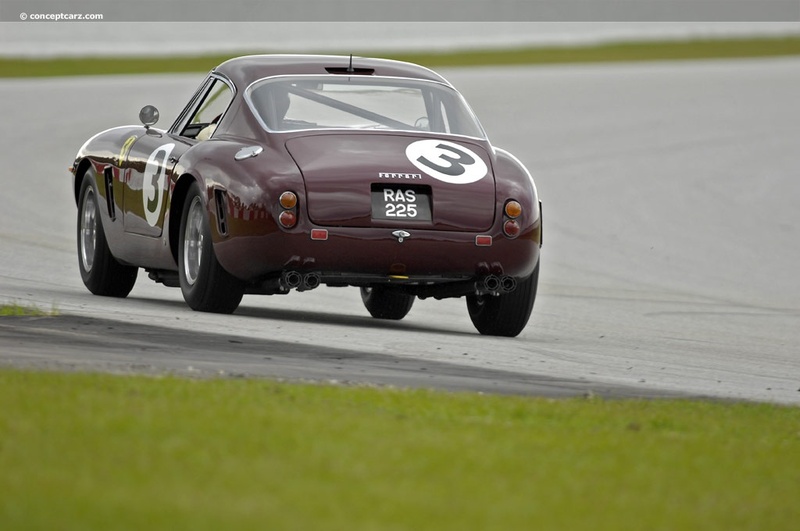 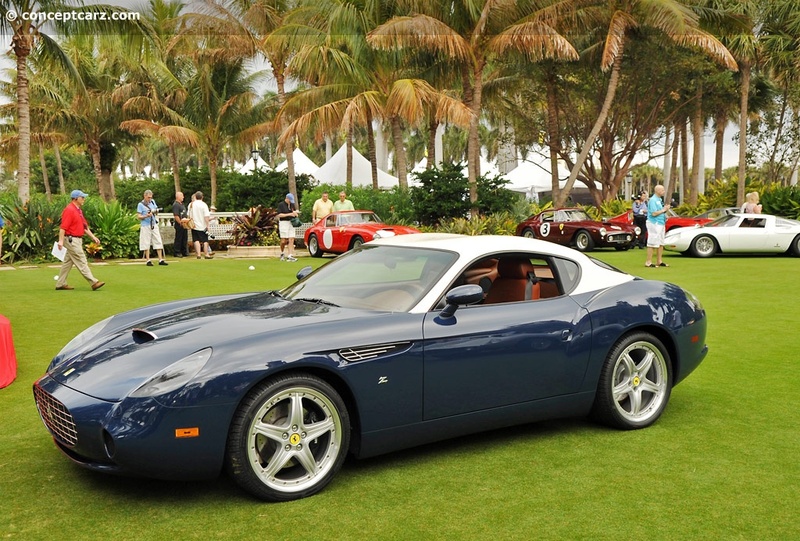 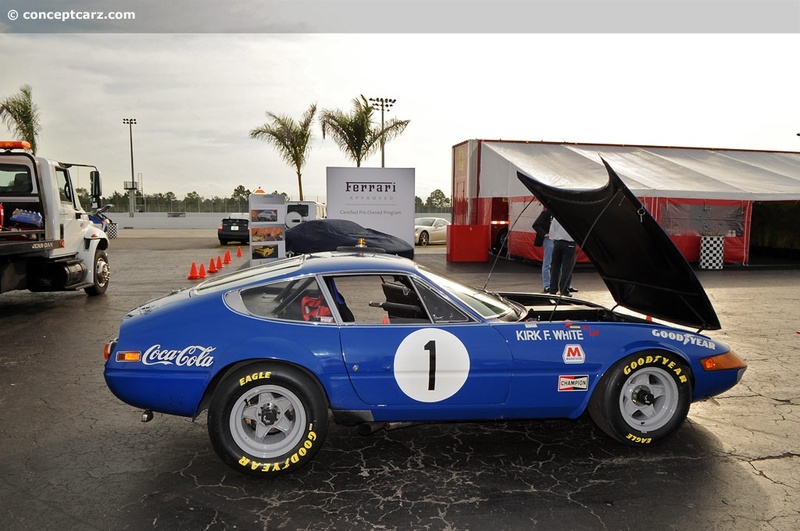 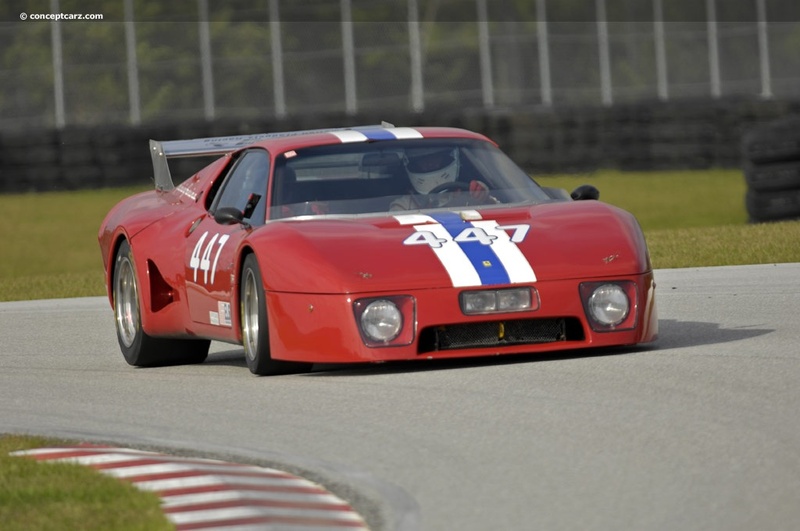 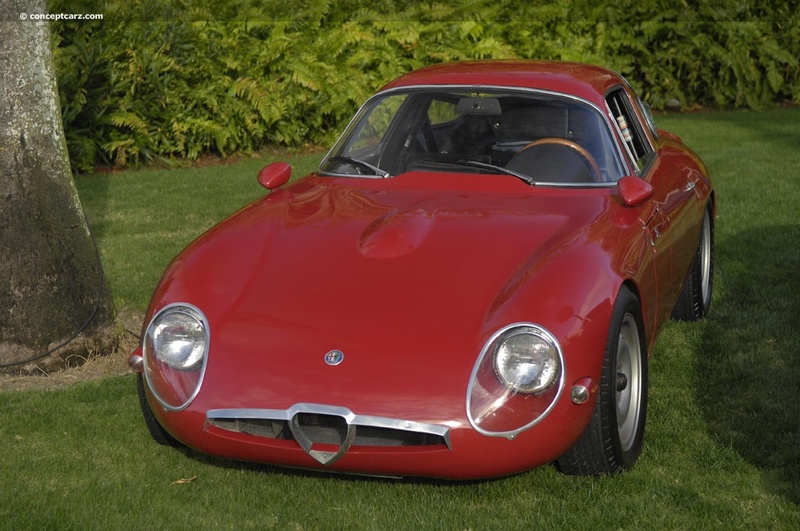 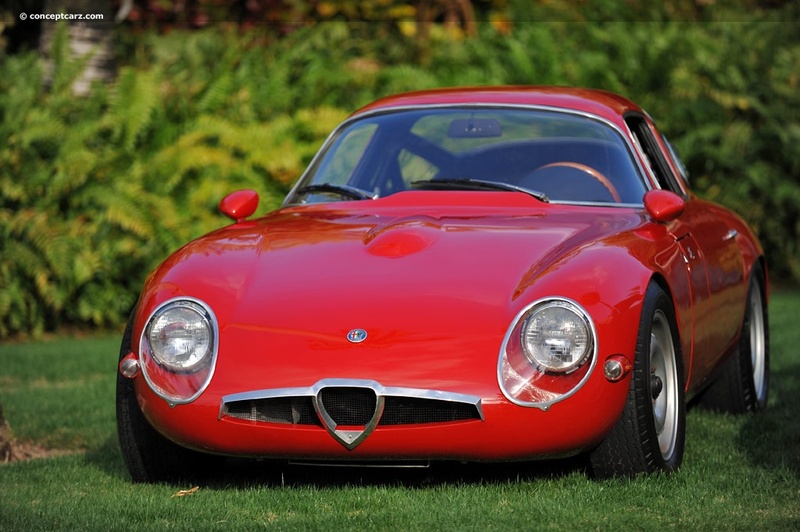 It is one of the most important Daytona Competizione examples ever created. 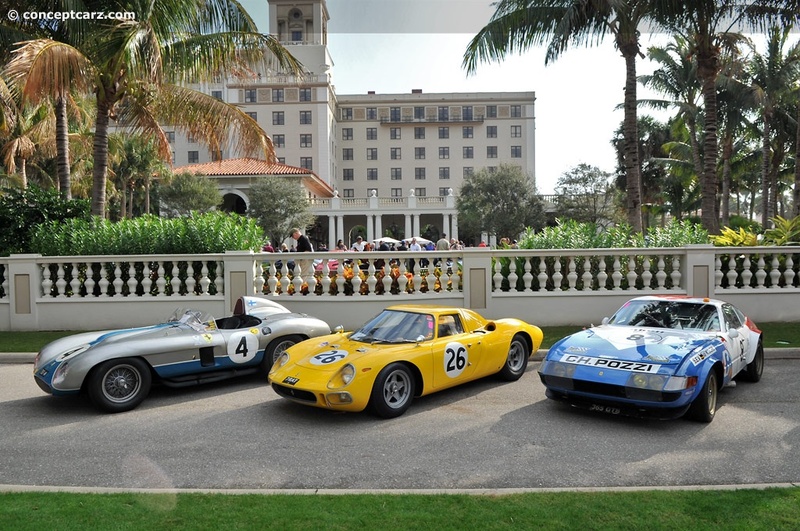 The Sport Group was an interesting and eclectic mix of cars. 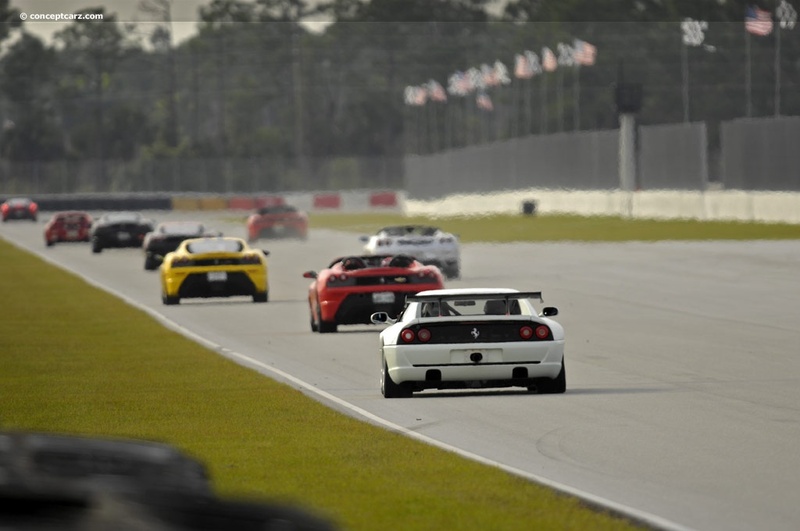 Some were being driven at a very quick pace, while others seemed intent on mastering the corners, even at slower speeds. 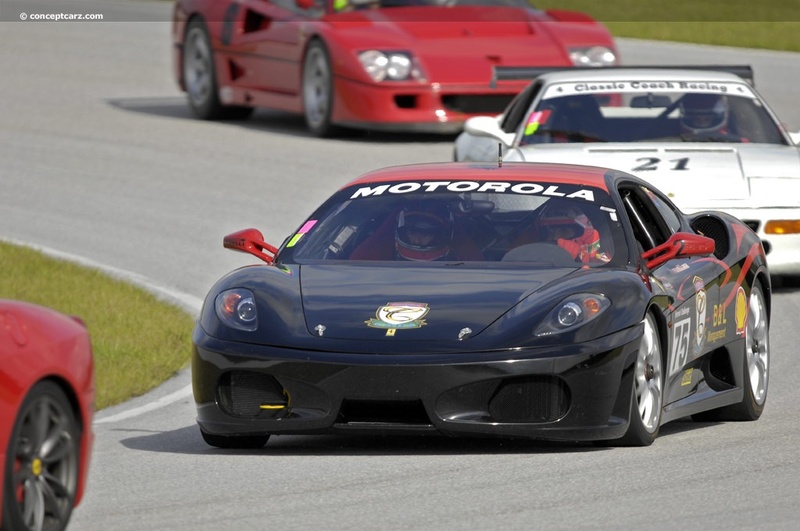 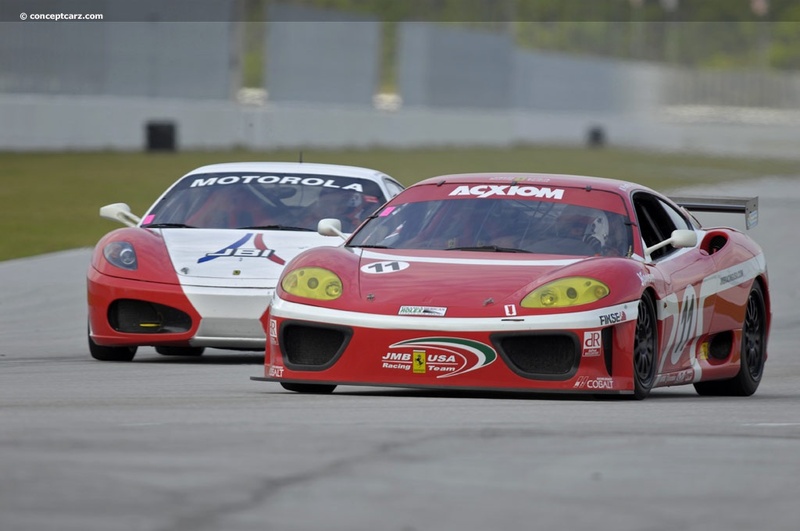 Many of the cars circling the track were from the past decade, including the 360 and the 430. 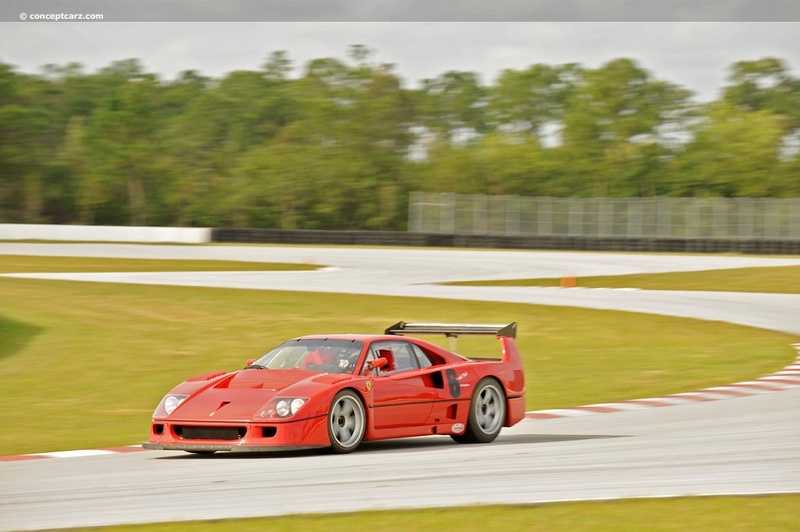 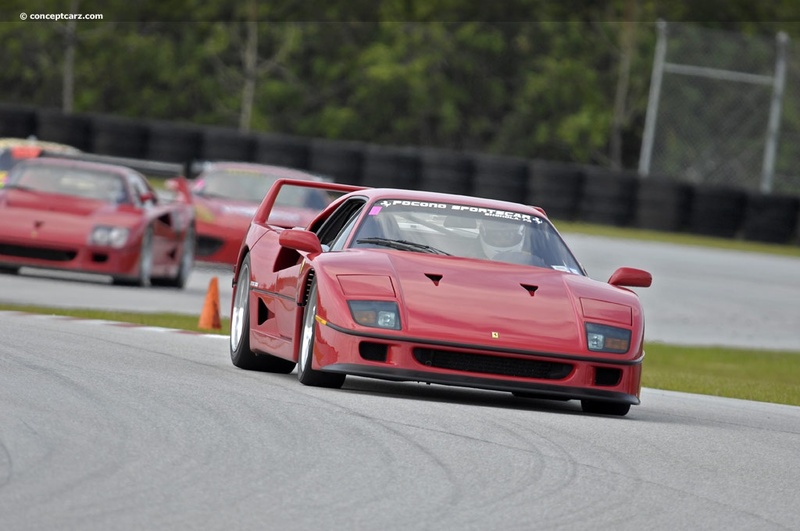 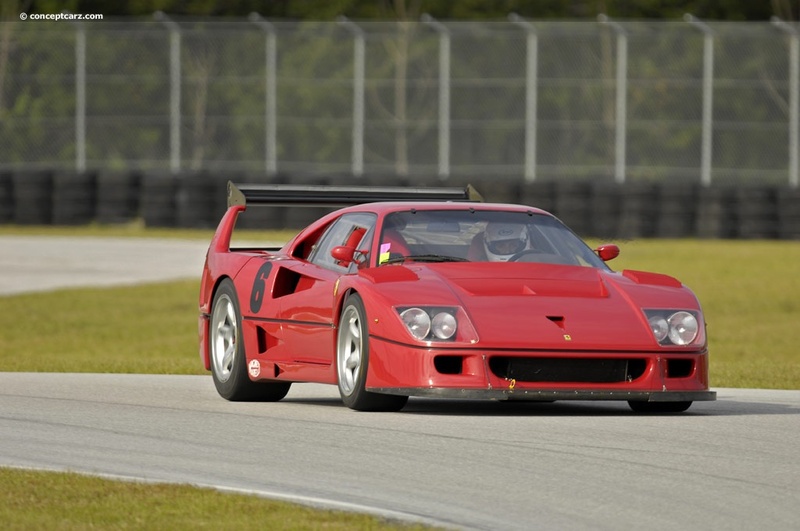 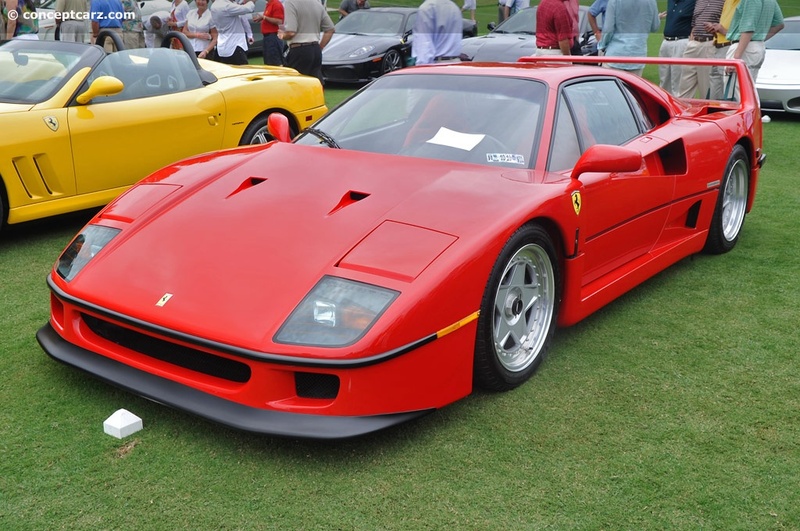 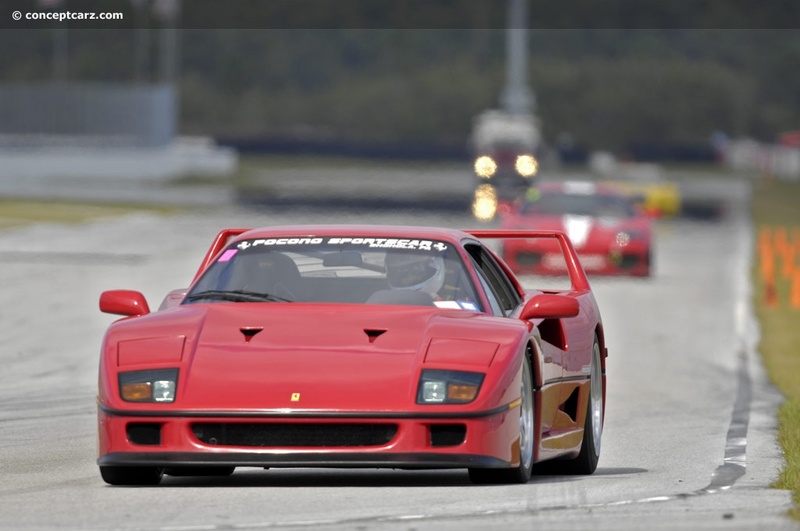 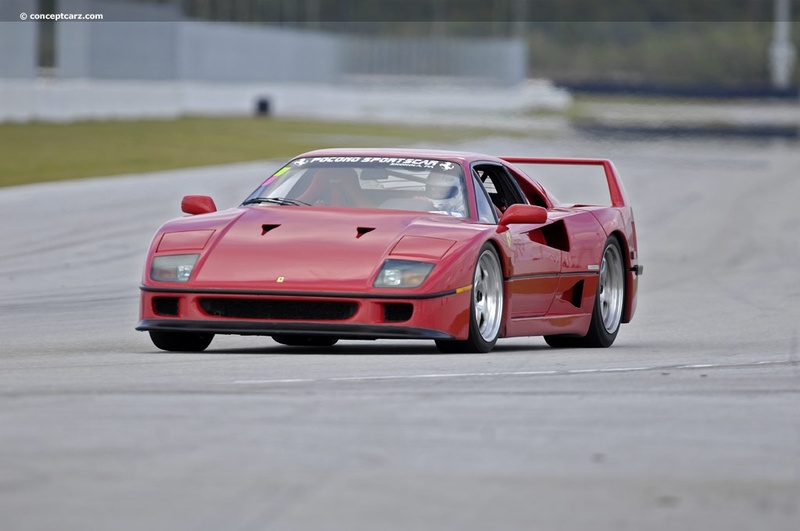 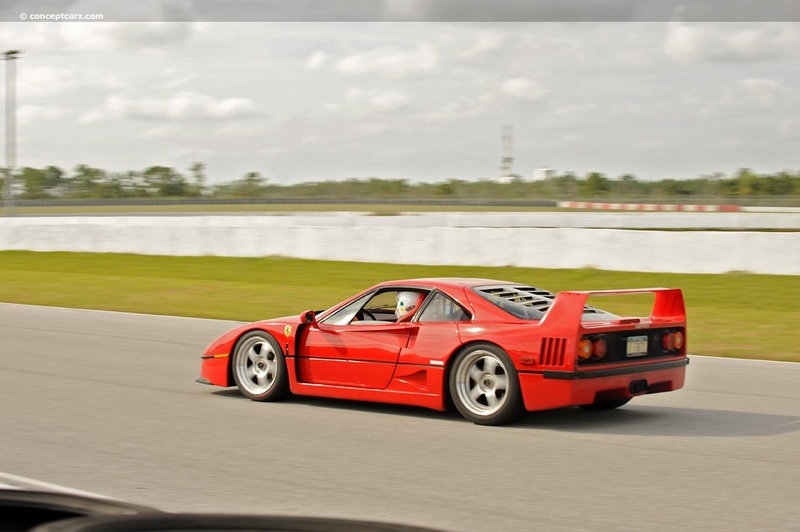 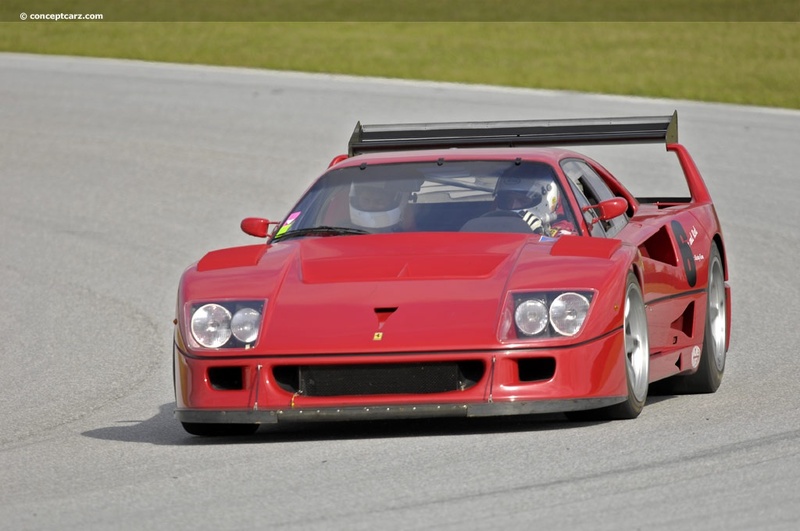 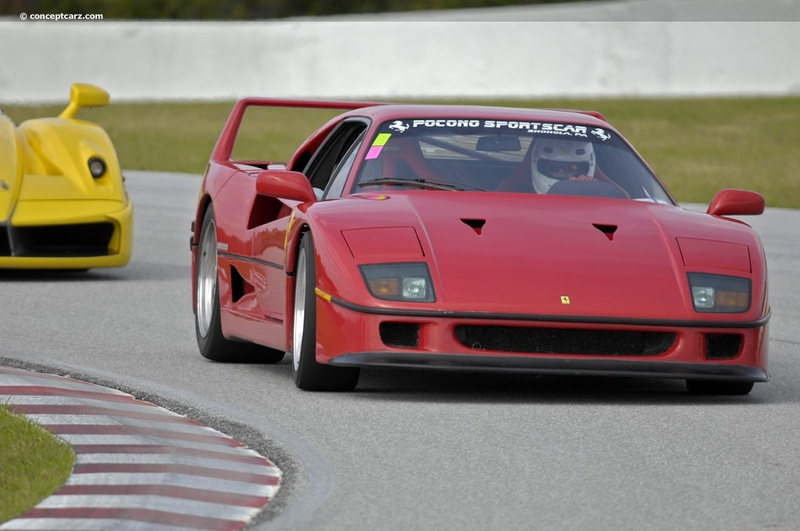 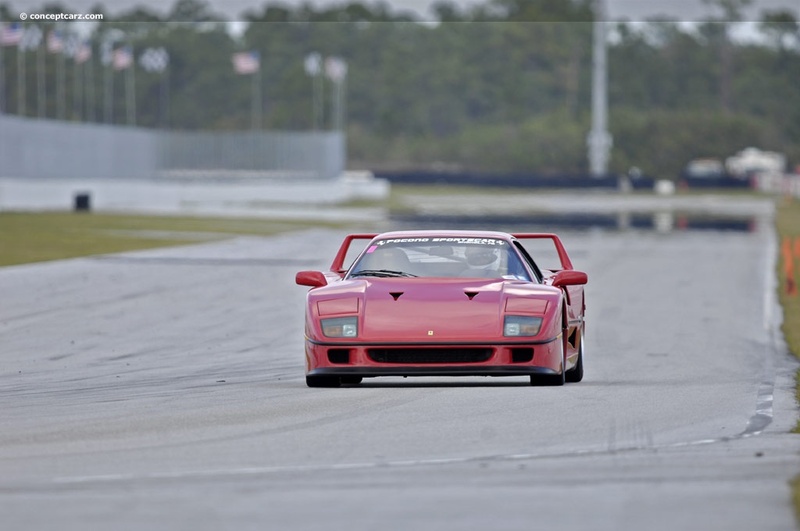 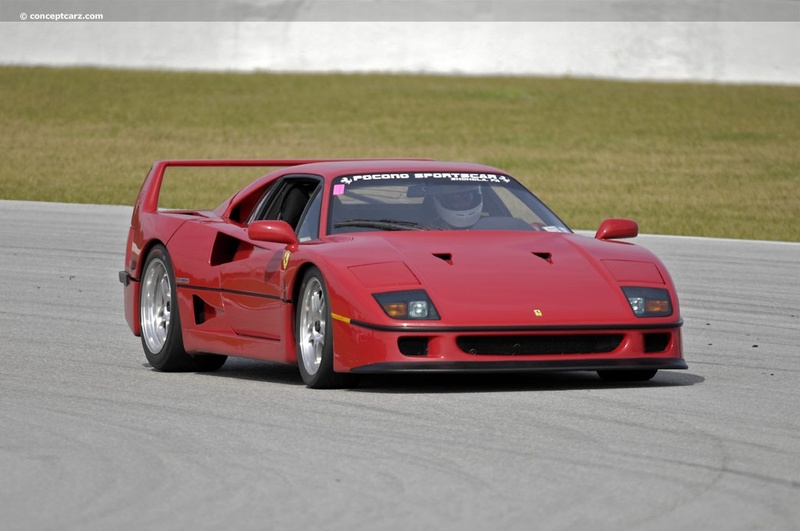 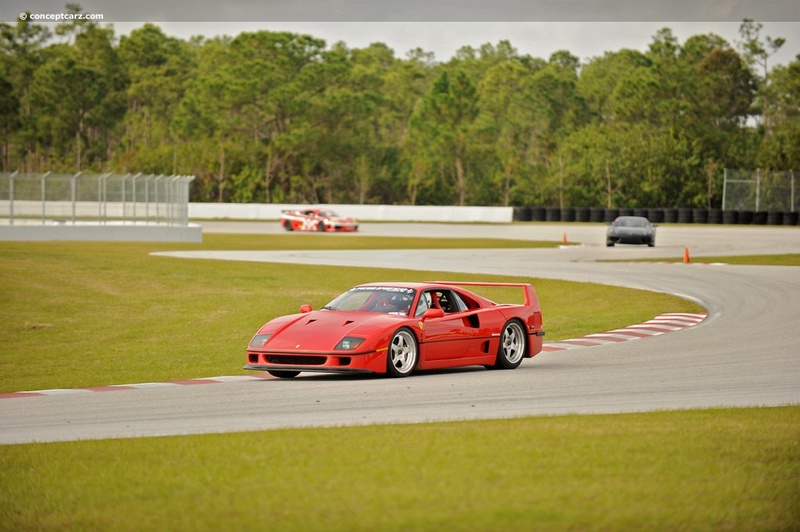 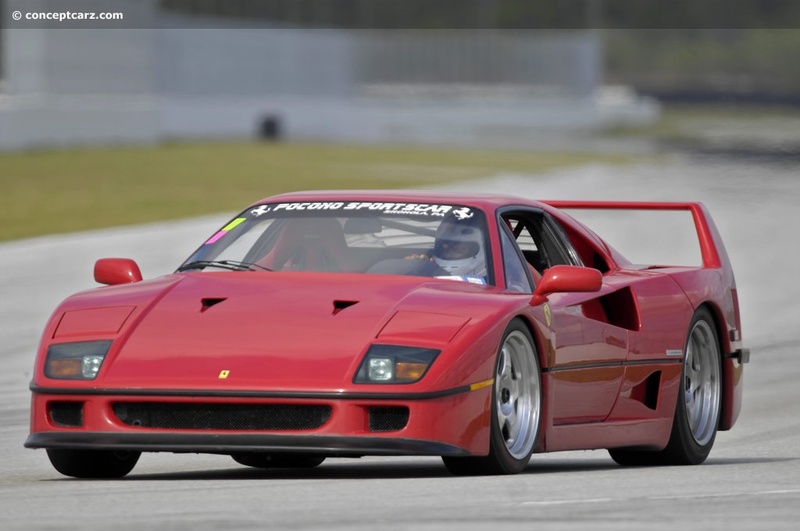 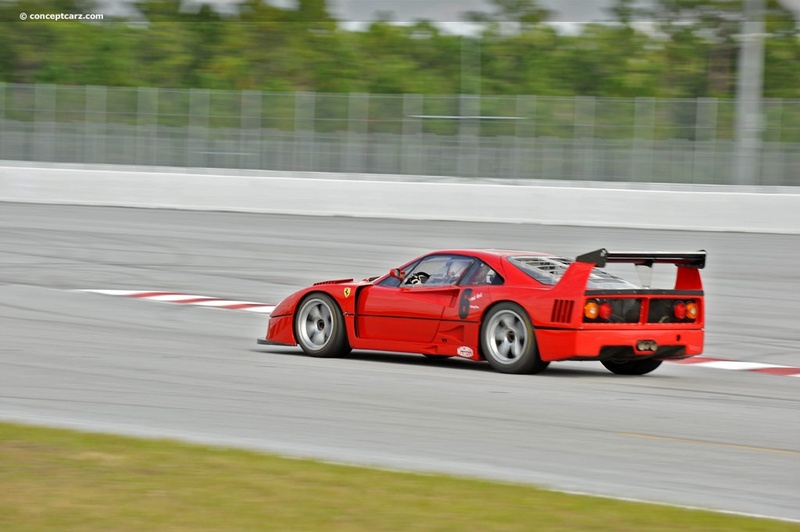 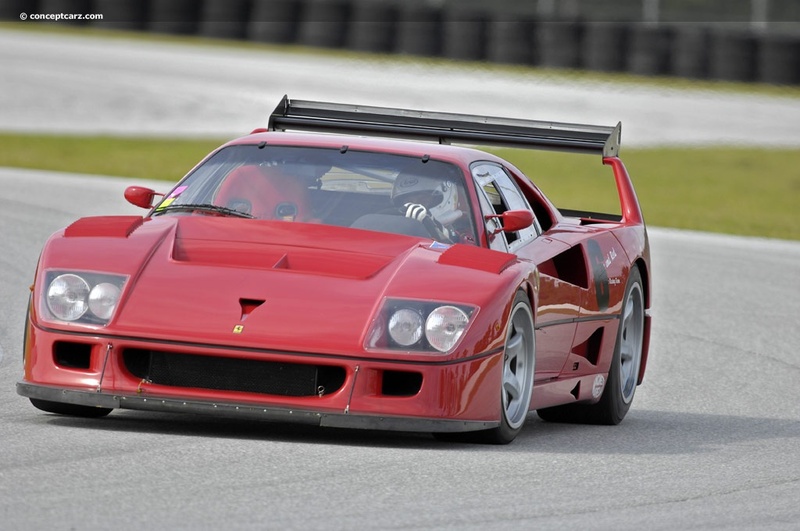 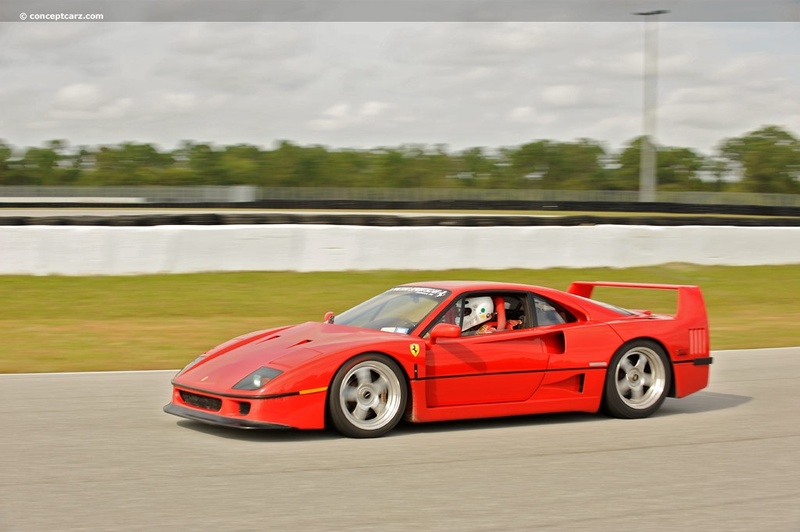 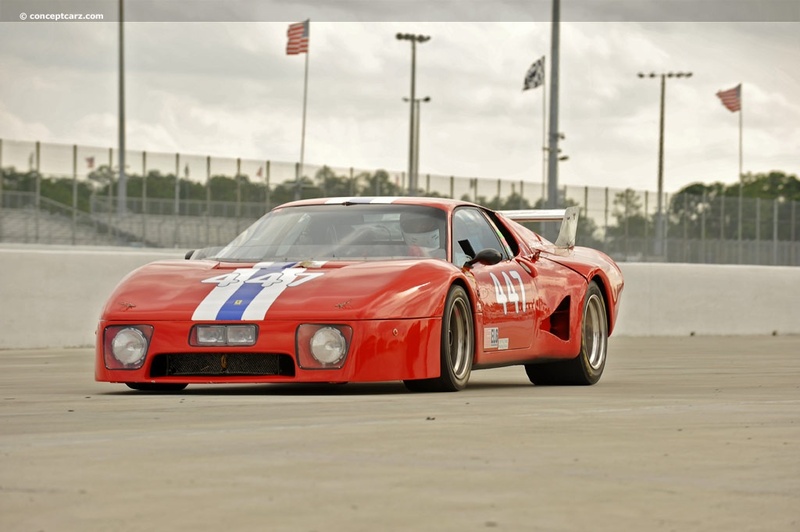 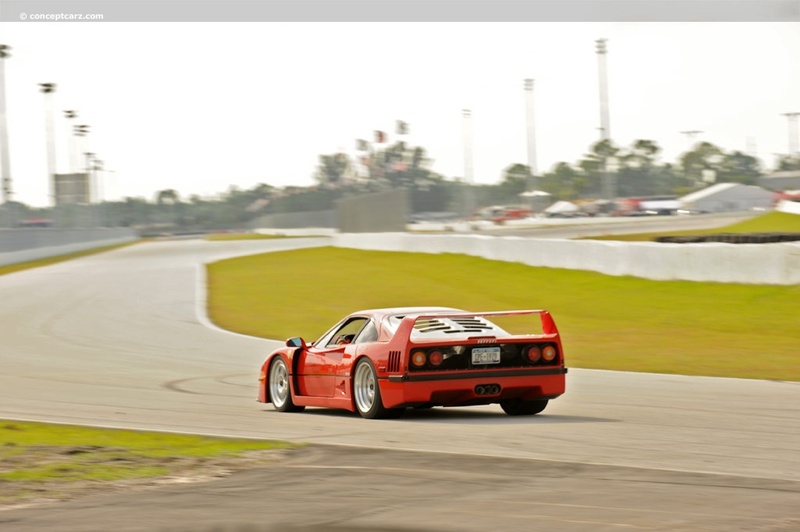 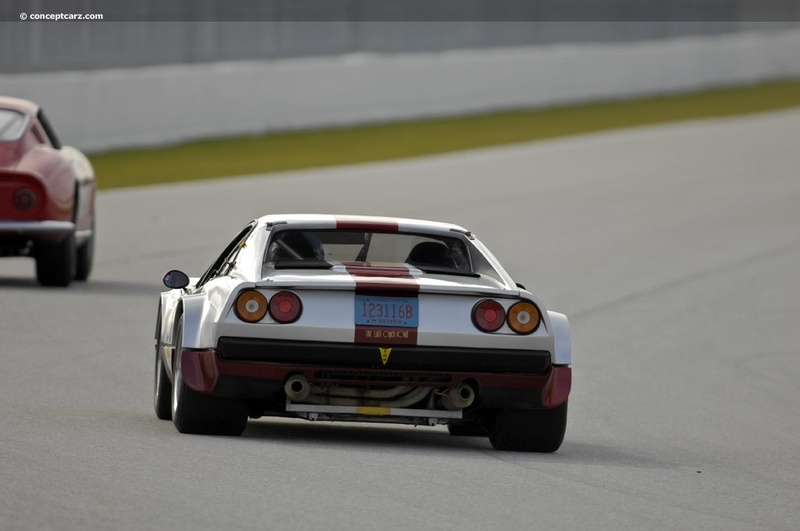 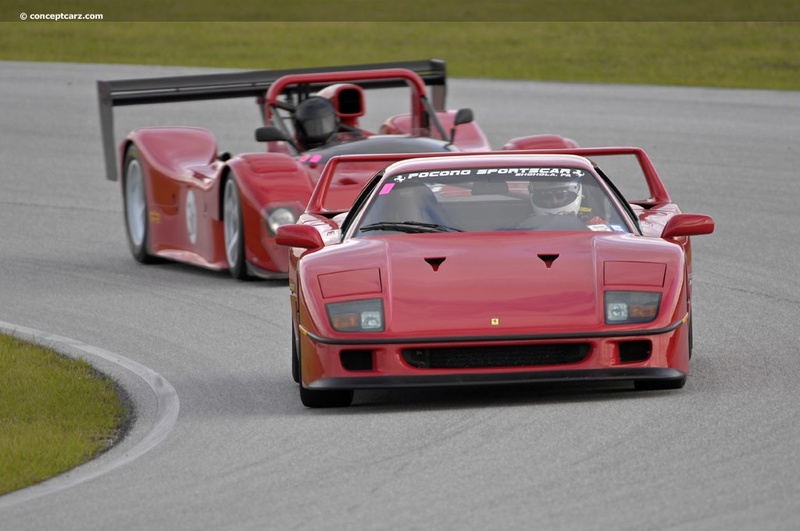 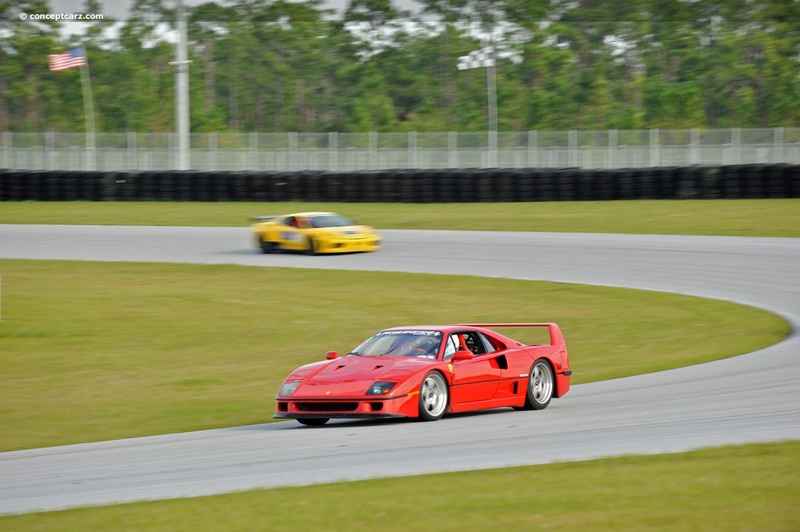 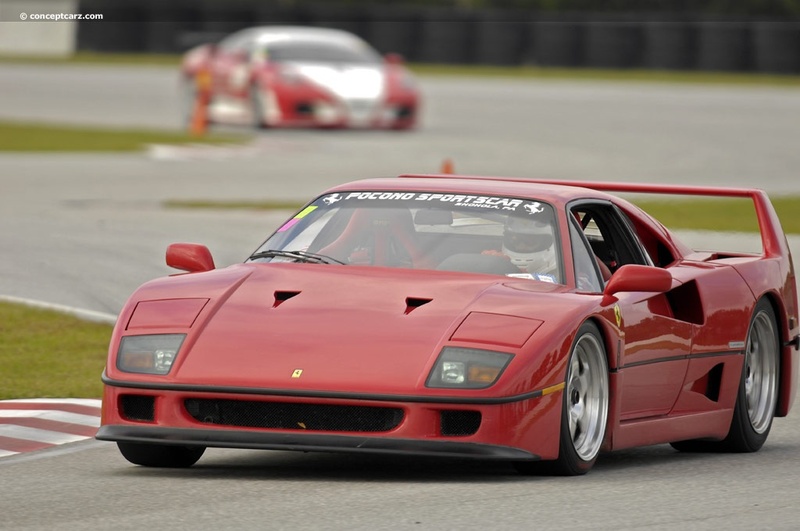 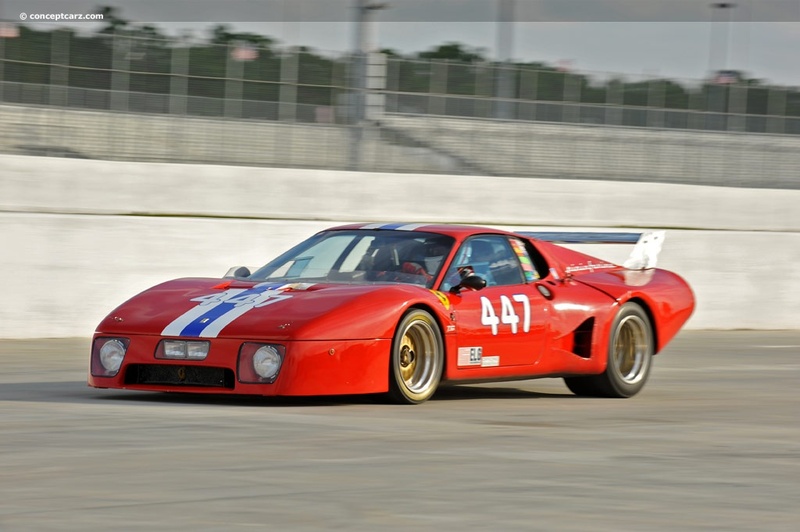 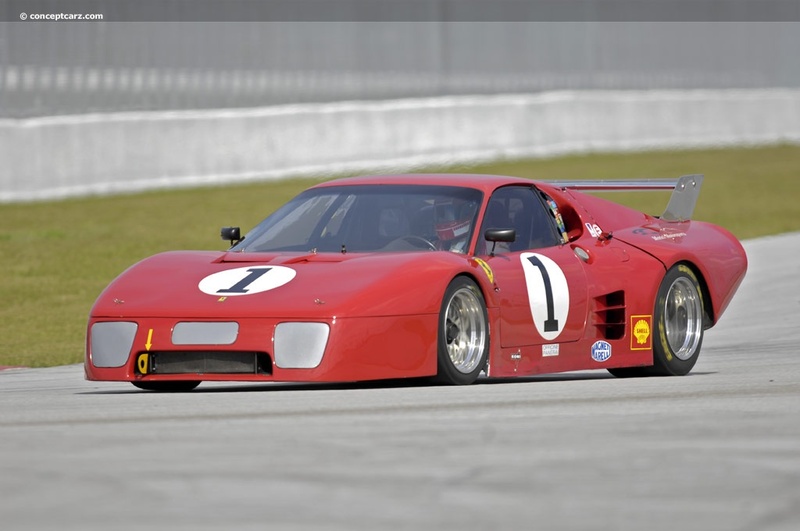 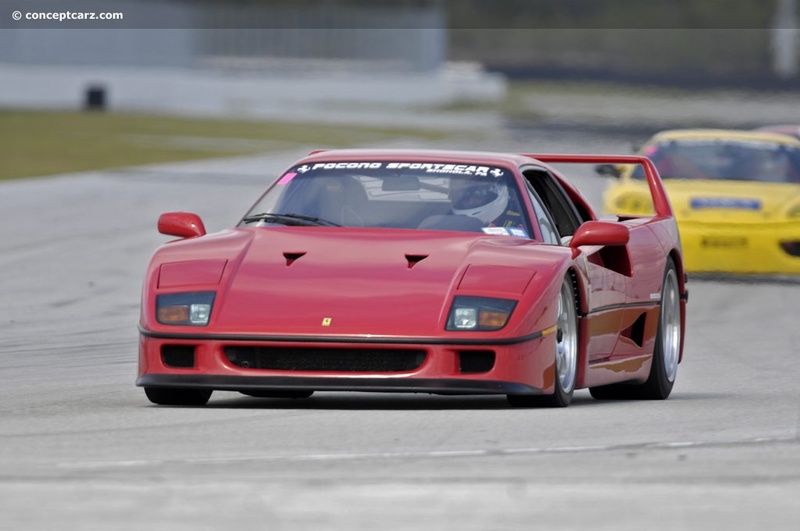 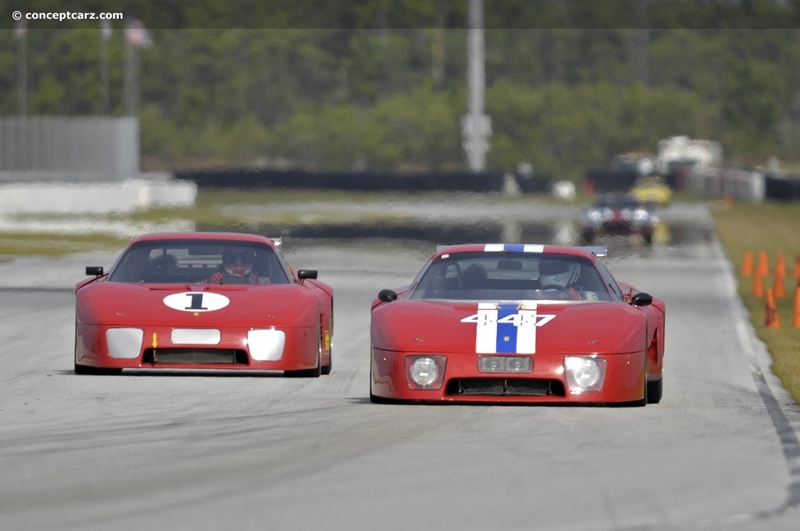 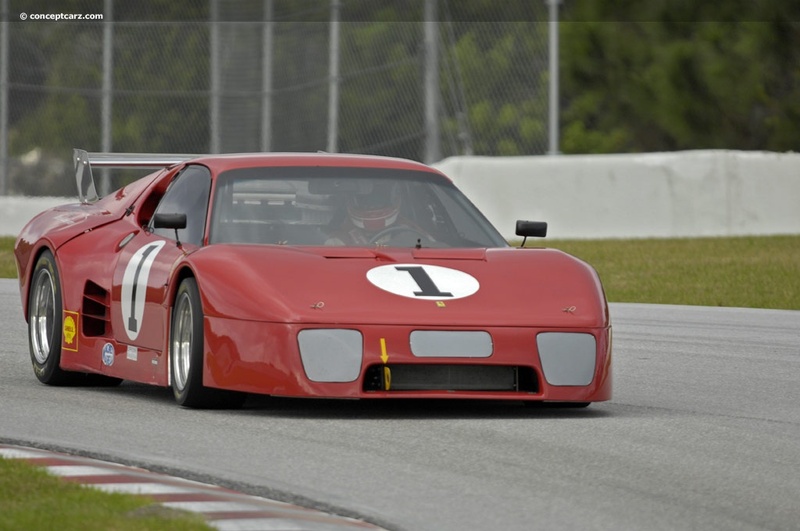 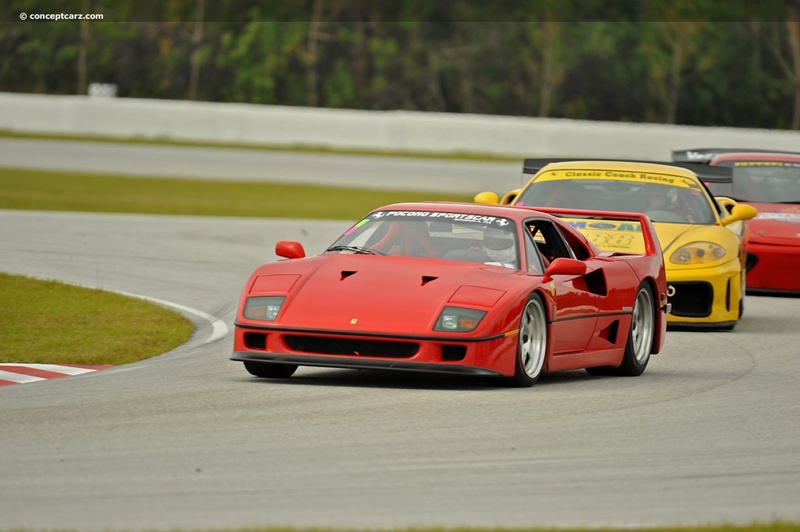 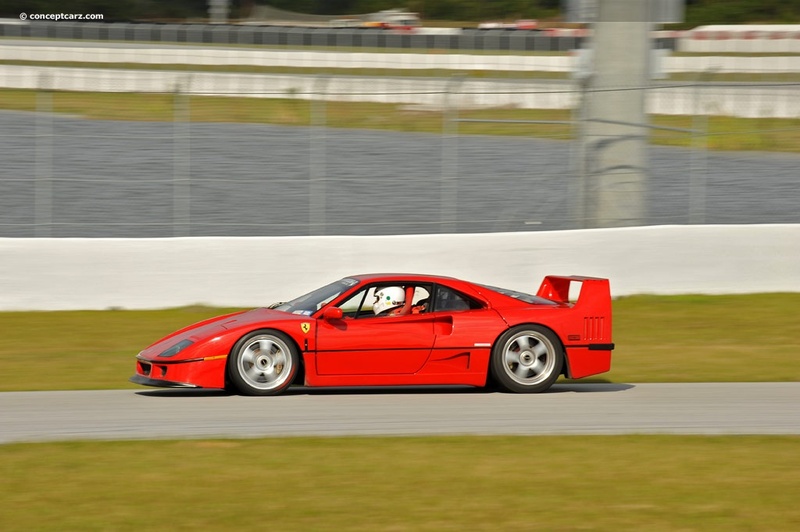 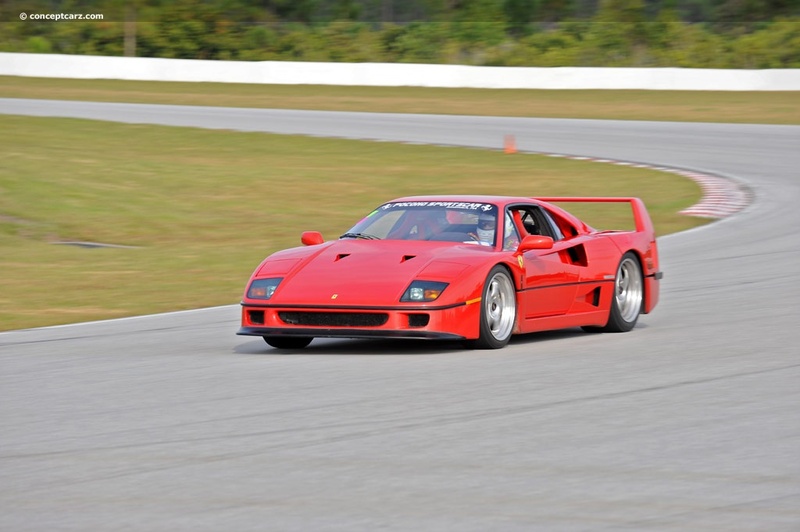 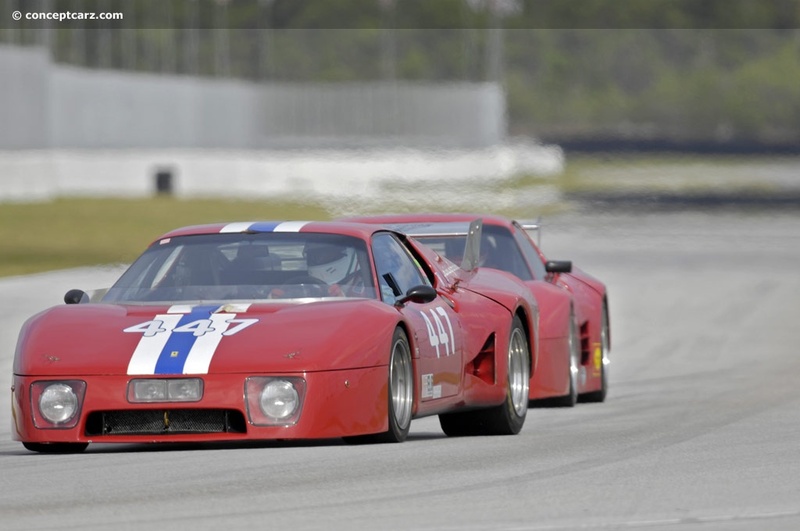 A pair of F40s were among the more exotic-looking cars on the track. 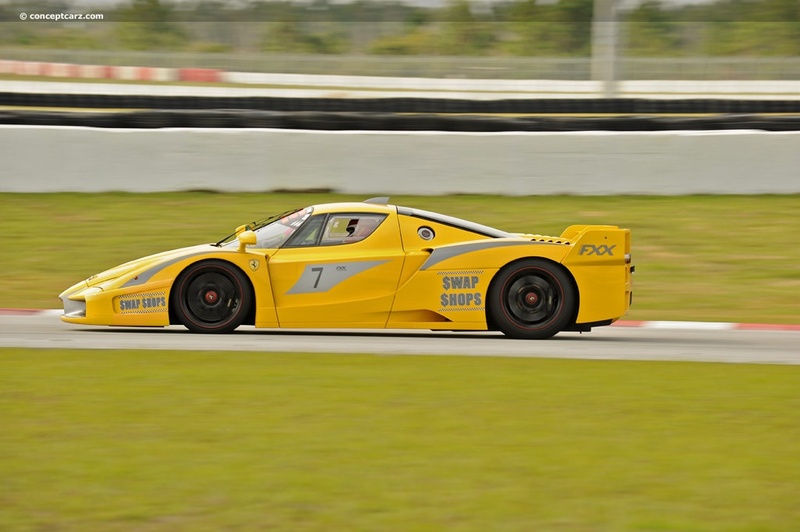 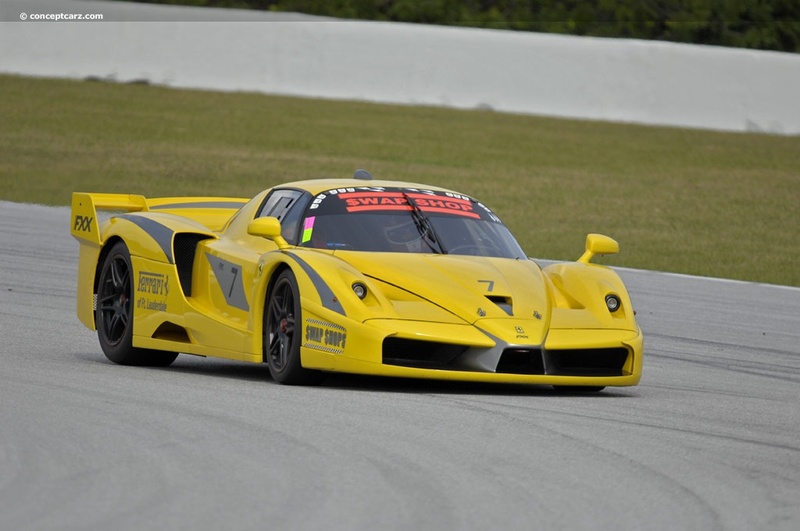 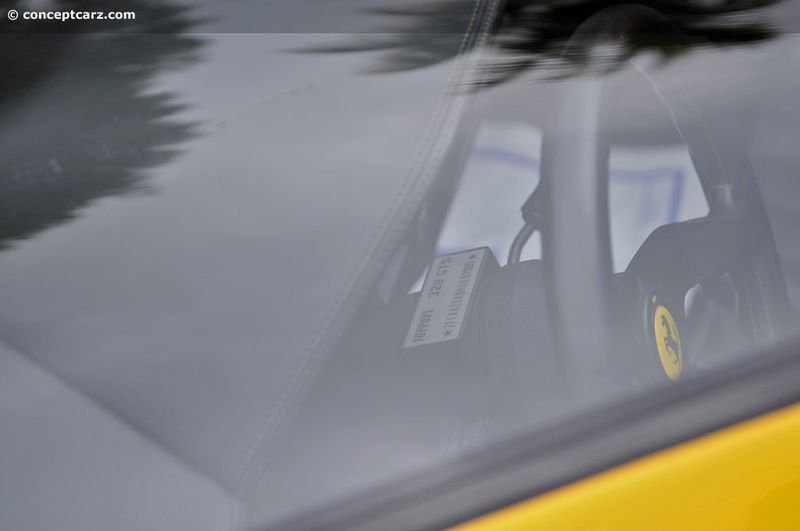 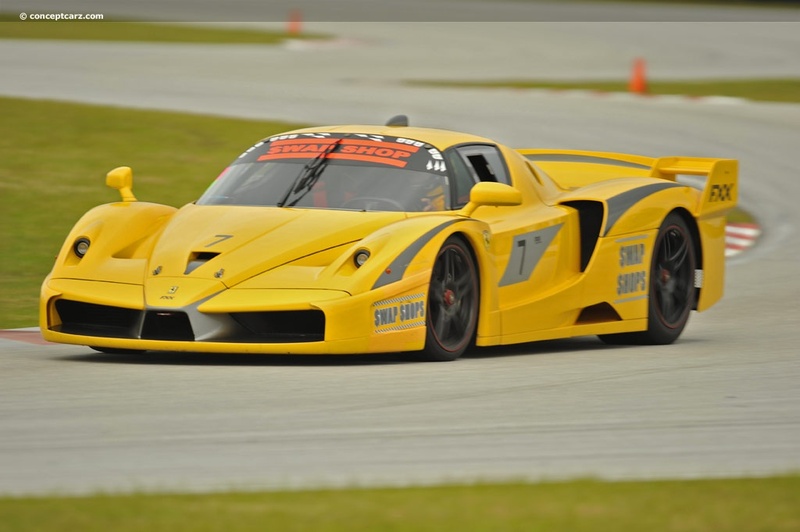 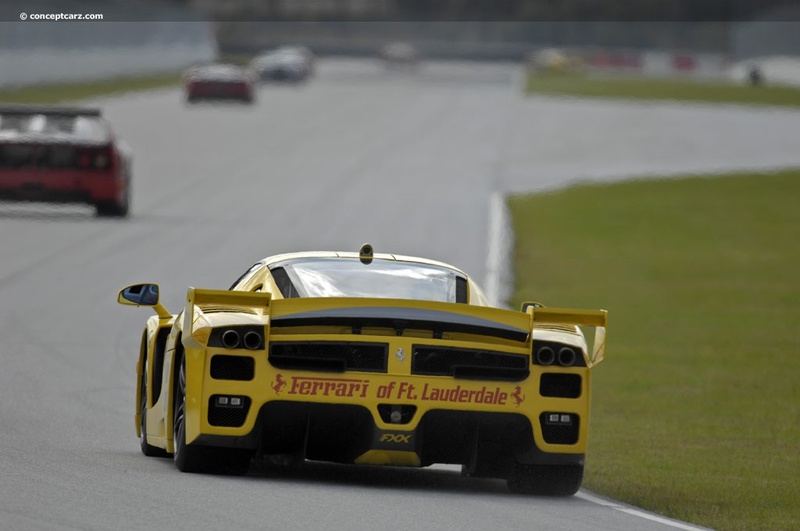 Joining the group on rare occasions was a yellow Ferrari FXX. 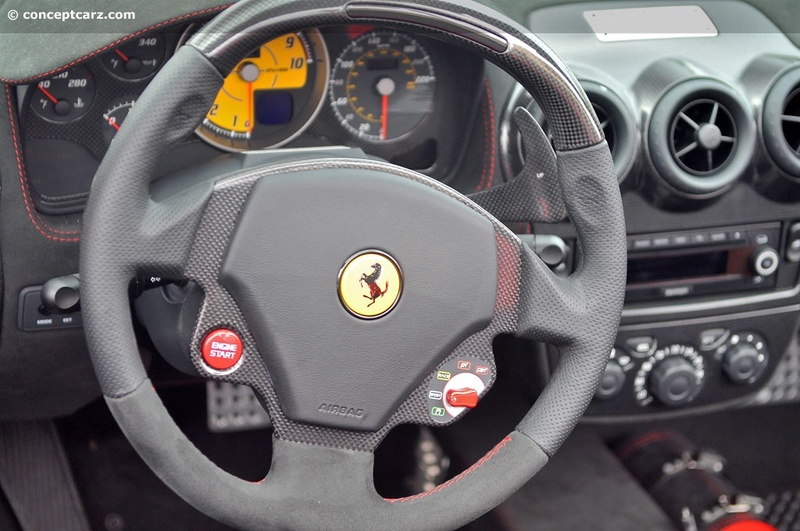 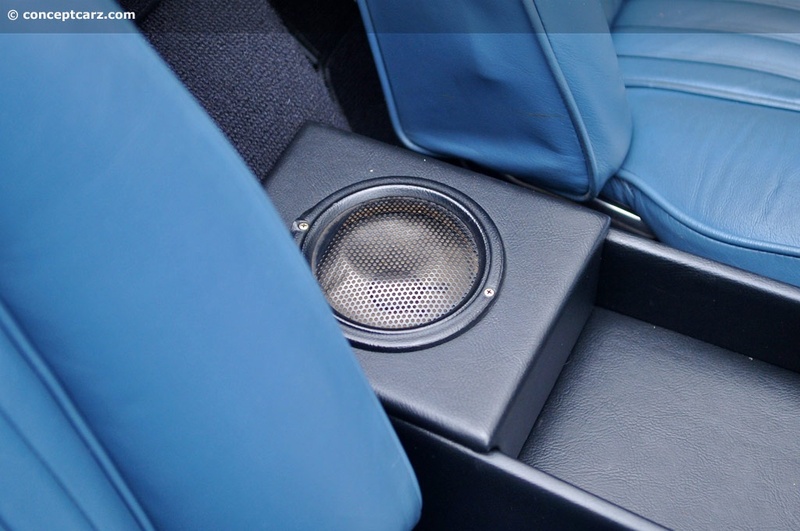 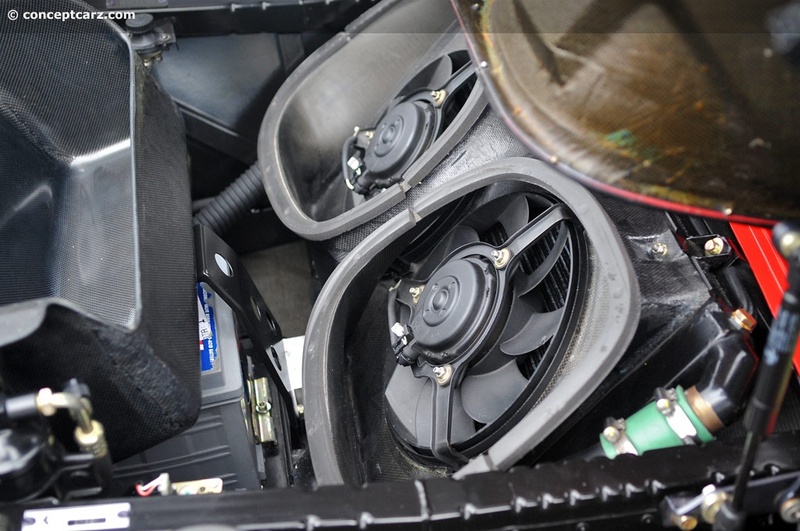 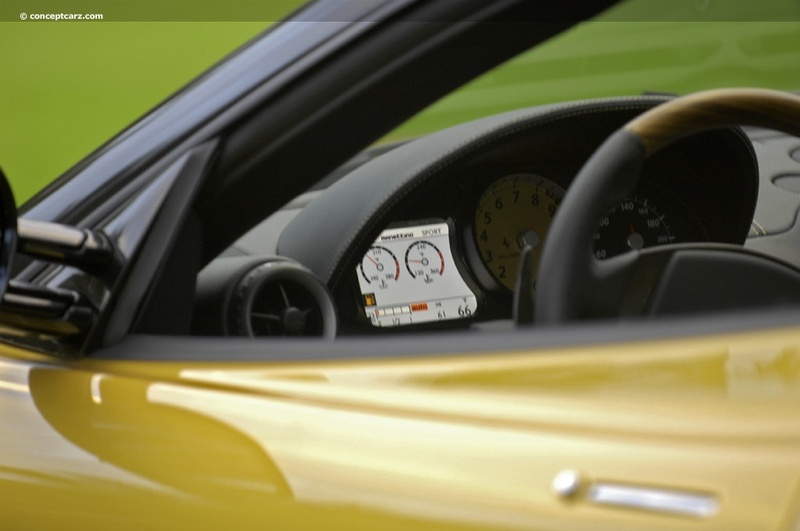 Its high pitched squeal signaled the driver's intentions as the car quickly rocketed to blistering fast speeds. 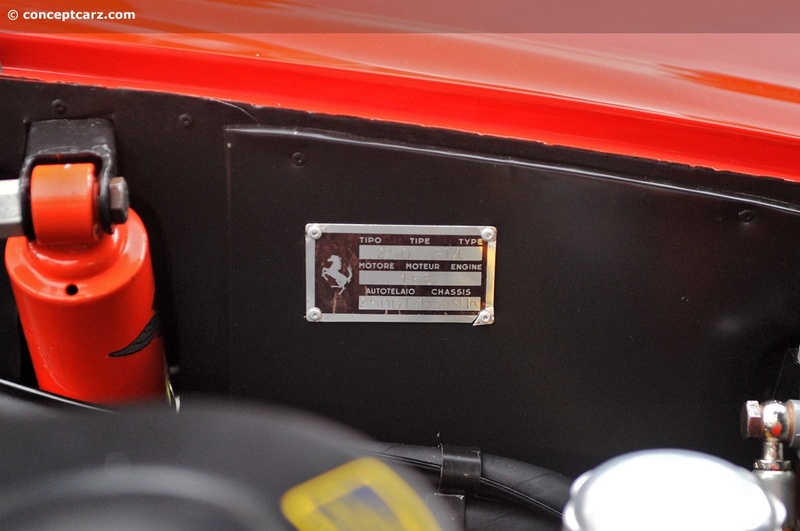 Sitting in the Paddock area was a Ferrari F1 team transport truck from the company's legendary past. 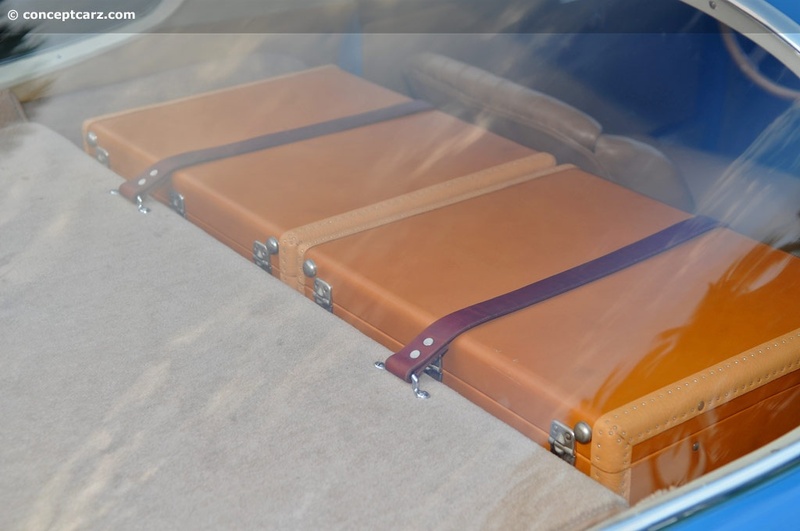 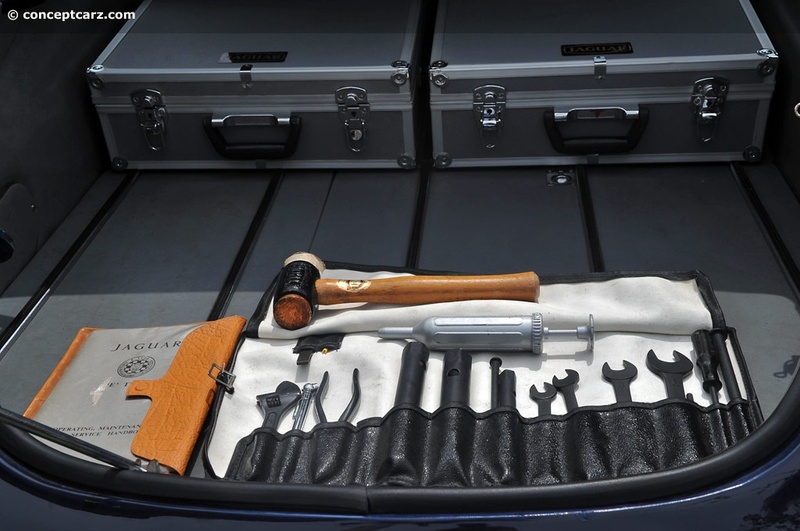 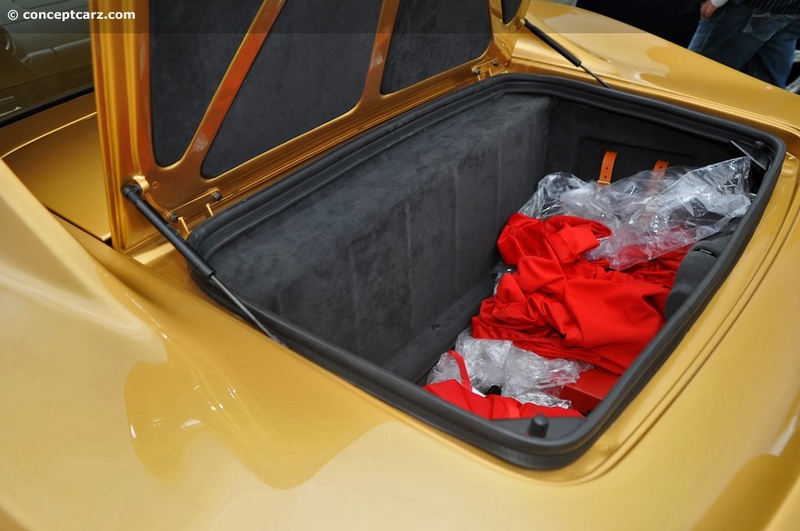 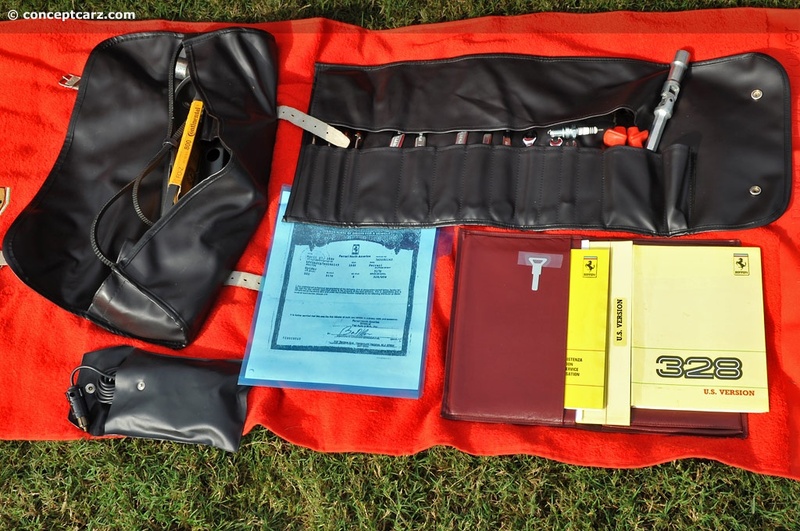 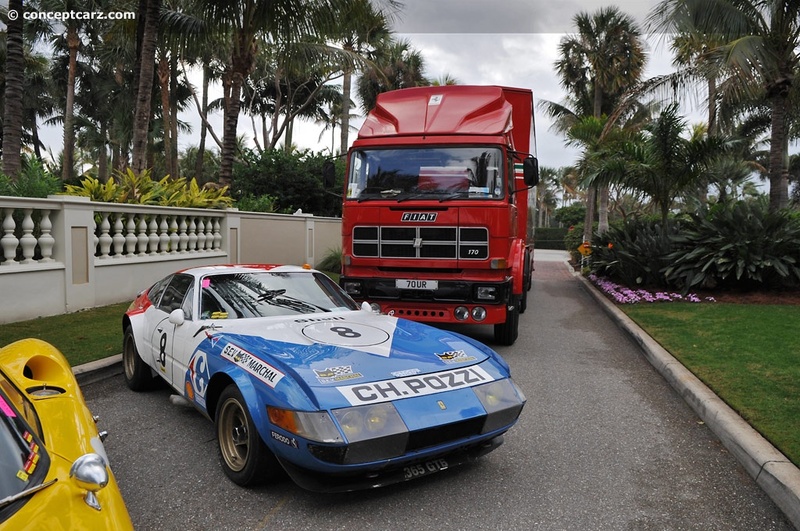 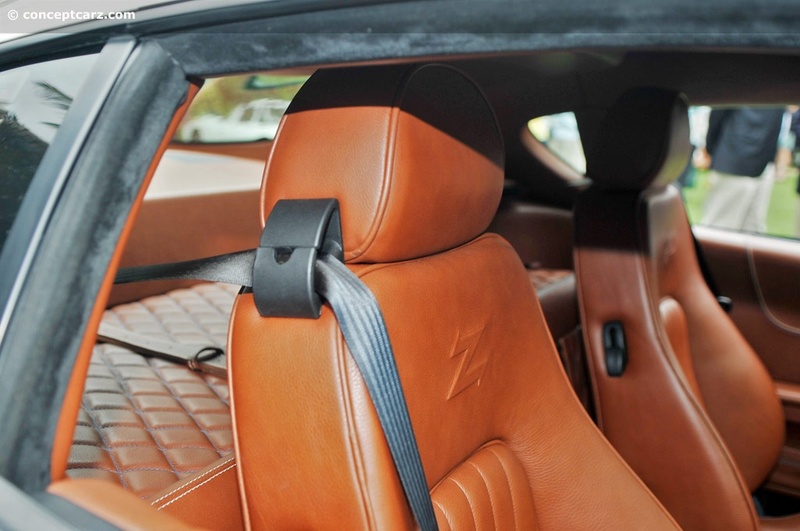 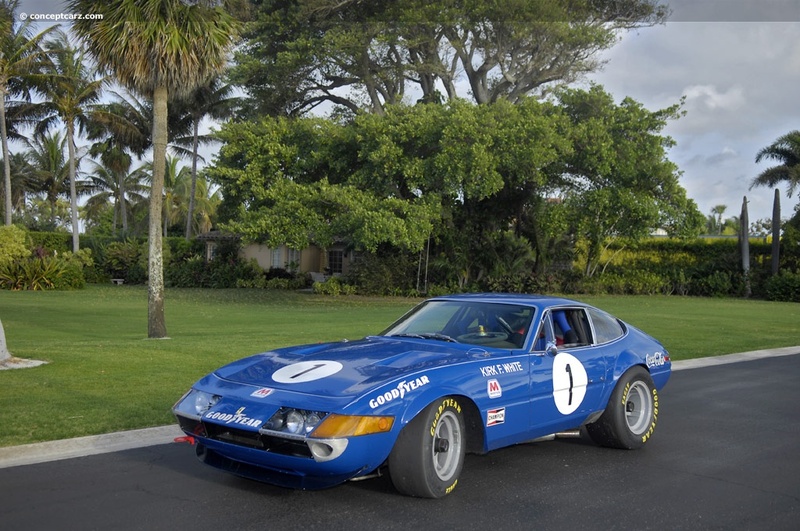 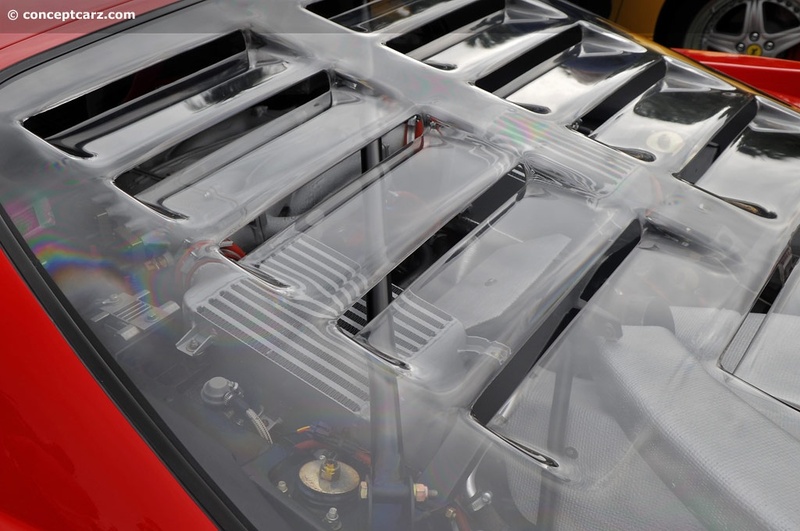 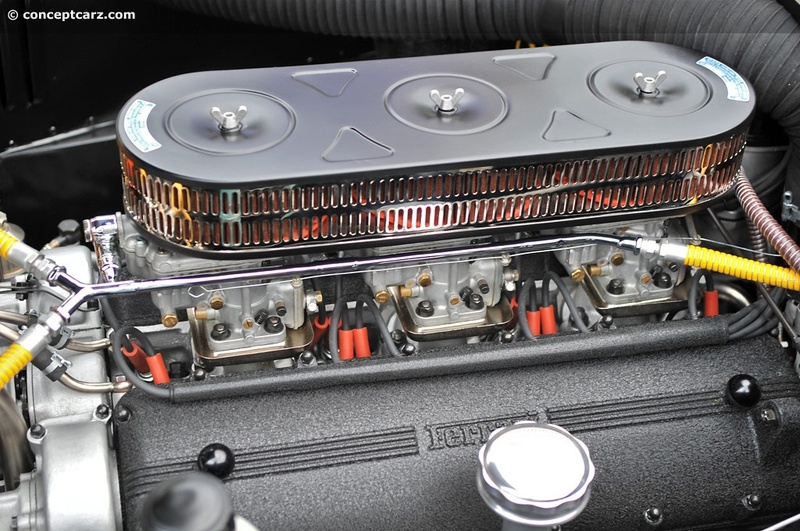 It carried precious cargo consisting of a 4-cylinder 750 Monza, a 250 LM, and a Daytona Competition. 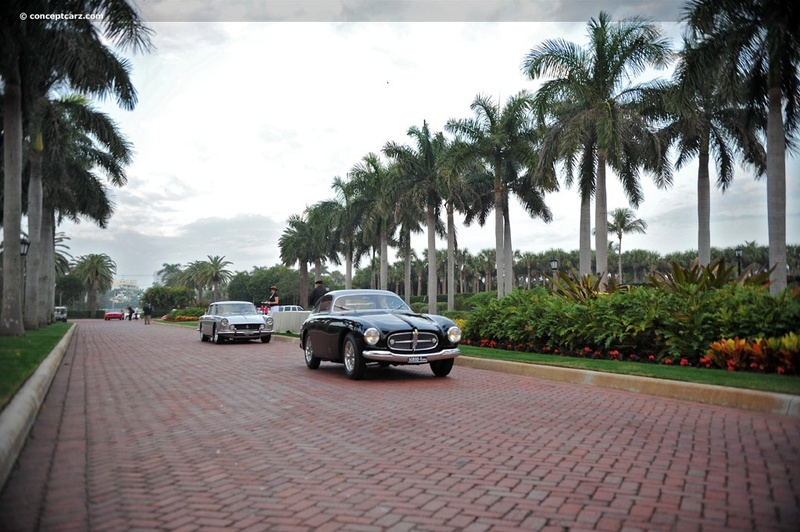 The next event on the schedule was the Tour of Palm Beach. 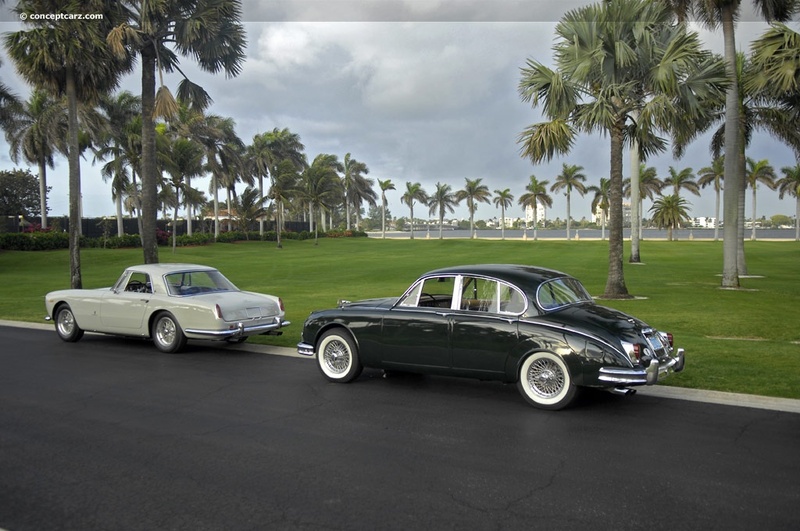 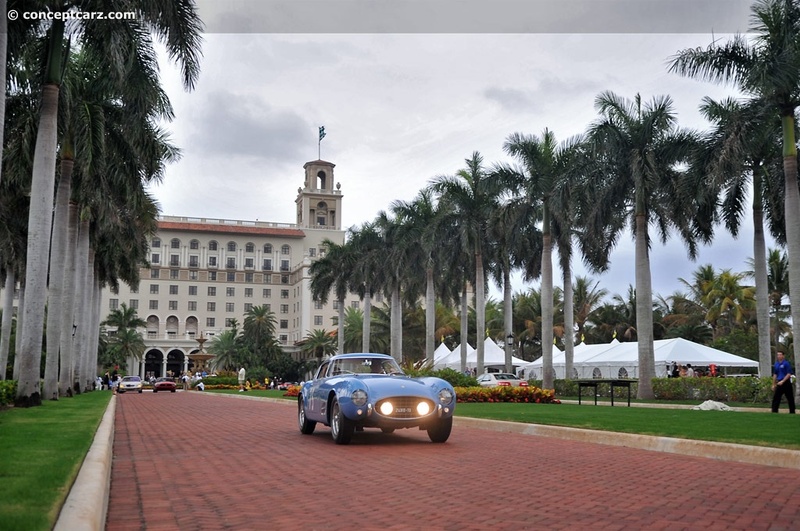 Taking advantage of the spectacular scenery the area has to offer, the tour organizers began the event at 'The Breakers' and continued through Palm Beach and along the Atlantic coastal roads. 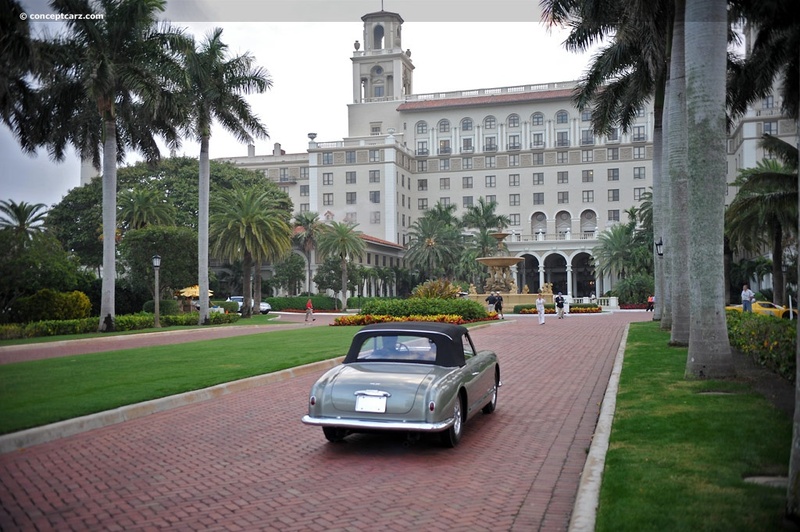 There were stops at The Ritz-Carlton, Mar-a-Lago, and The Chesterfield Hotel. 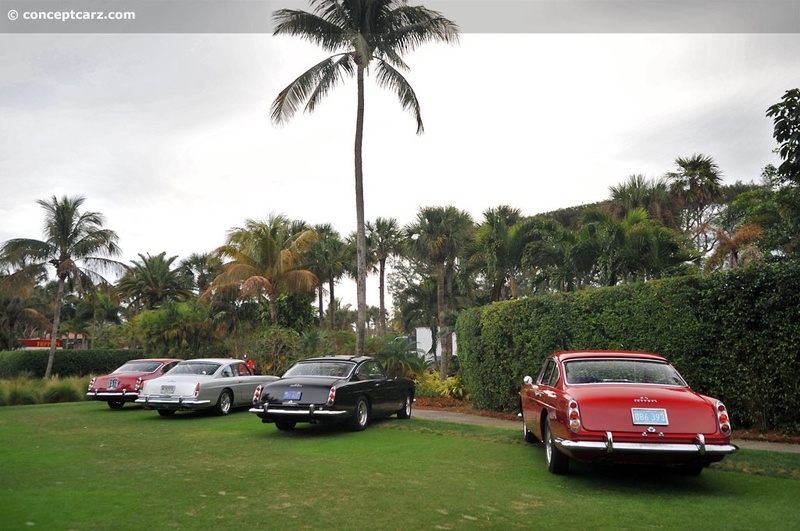 The final destination was at the Jet Aviation for the Jet Reception. 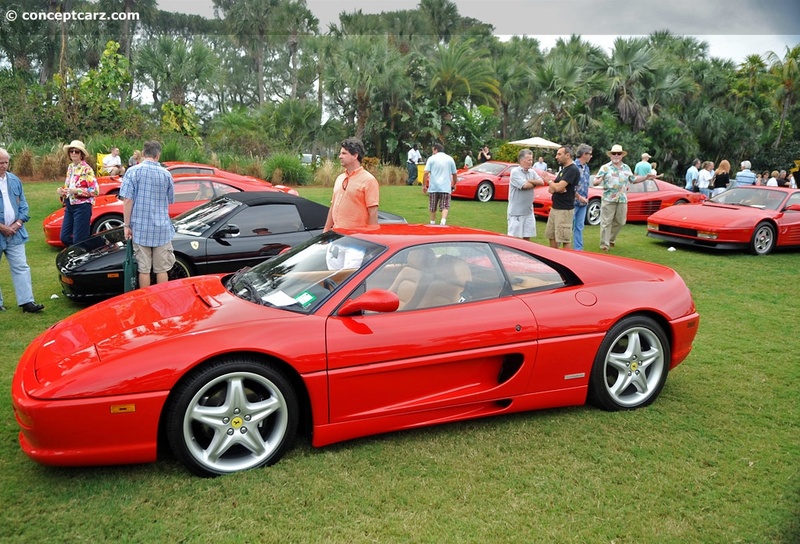 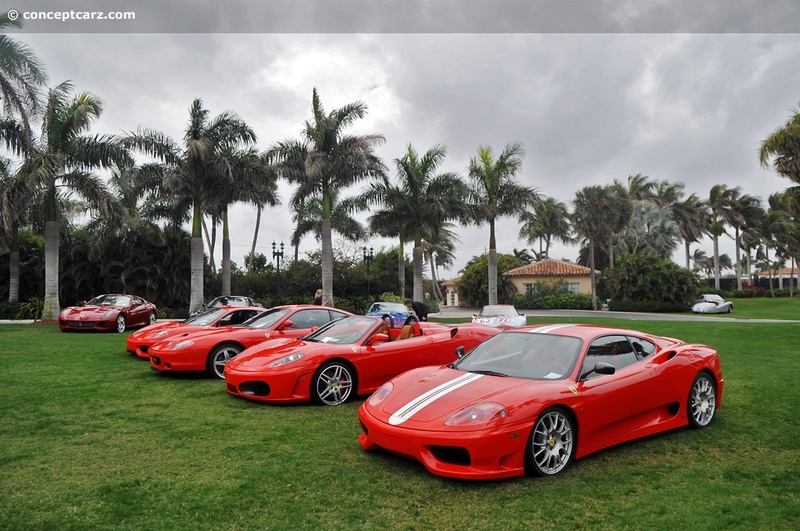 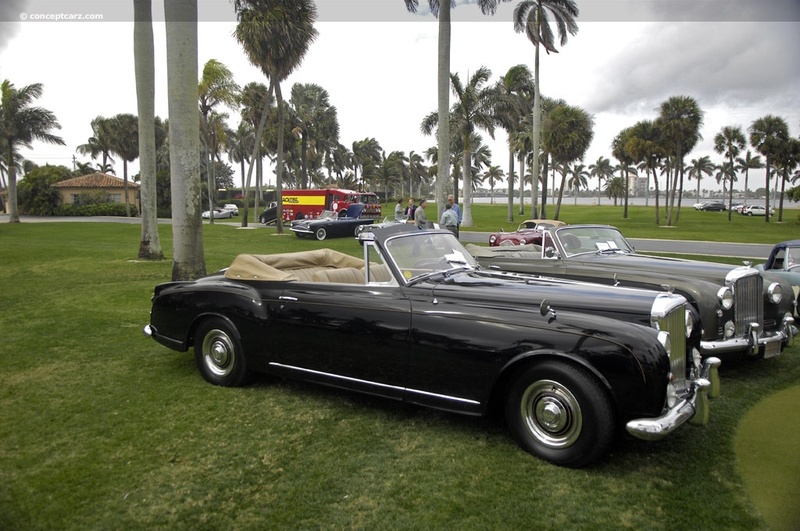 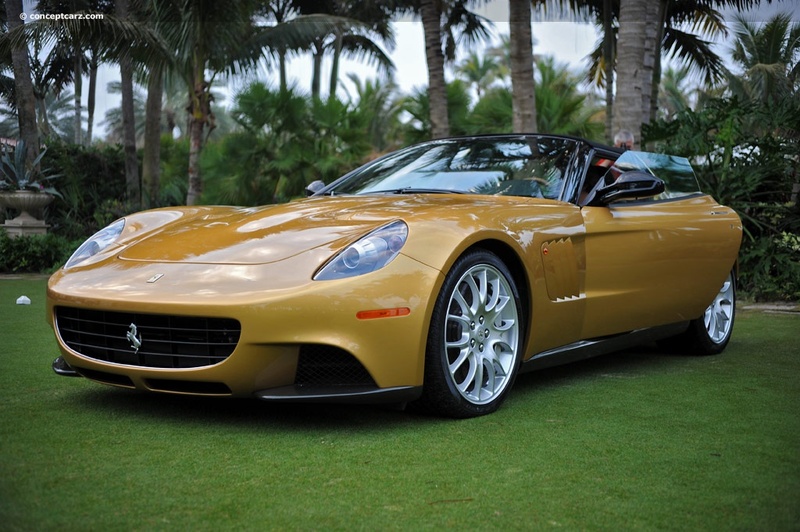 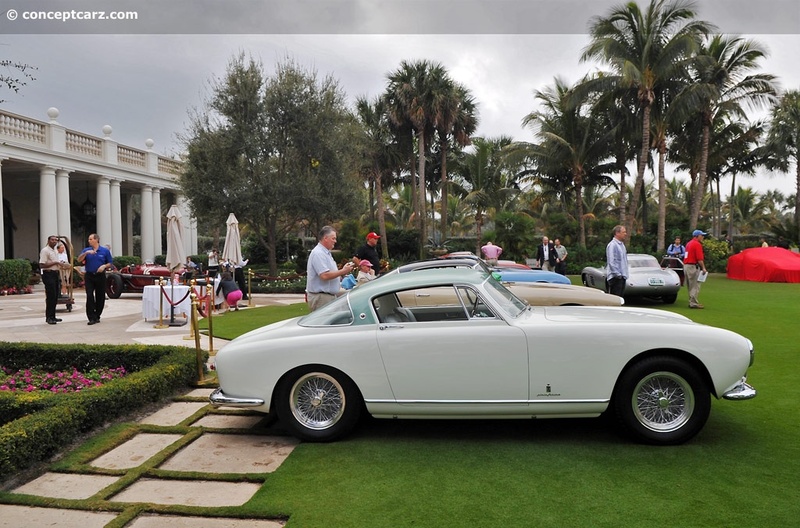 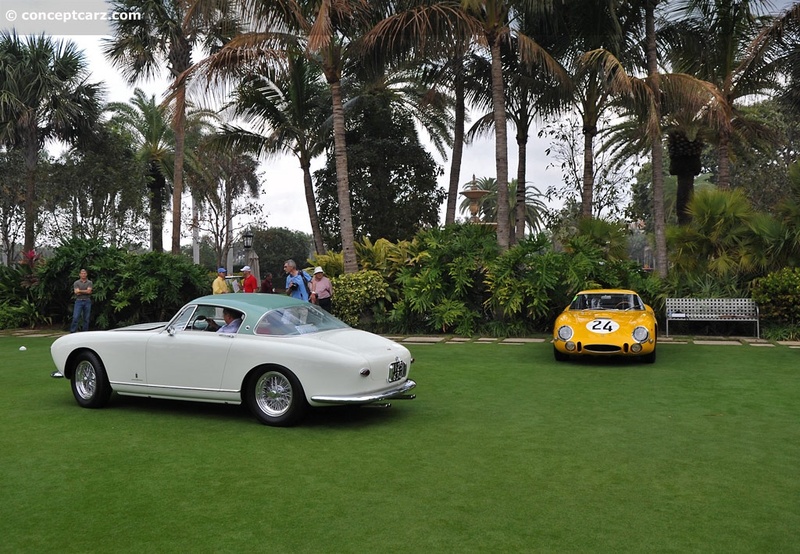 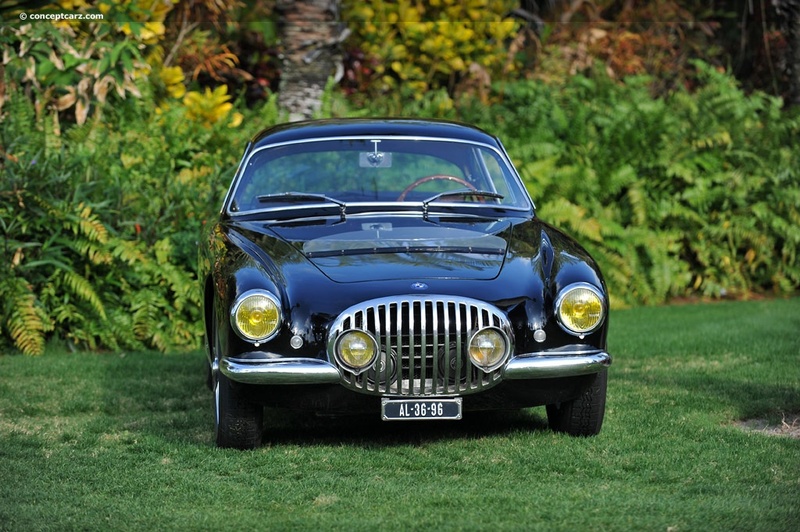 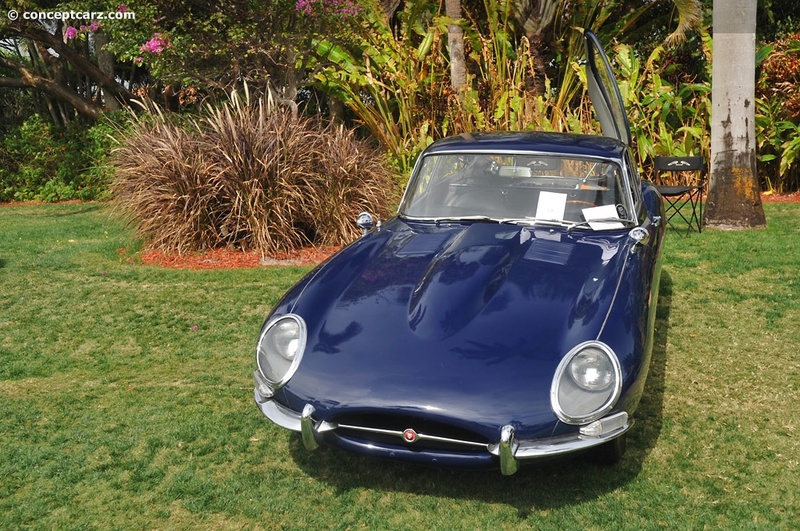 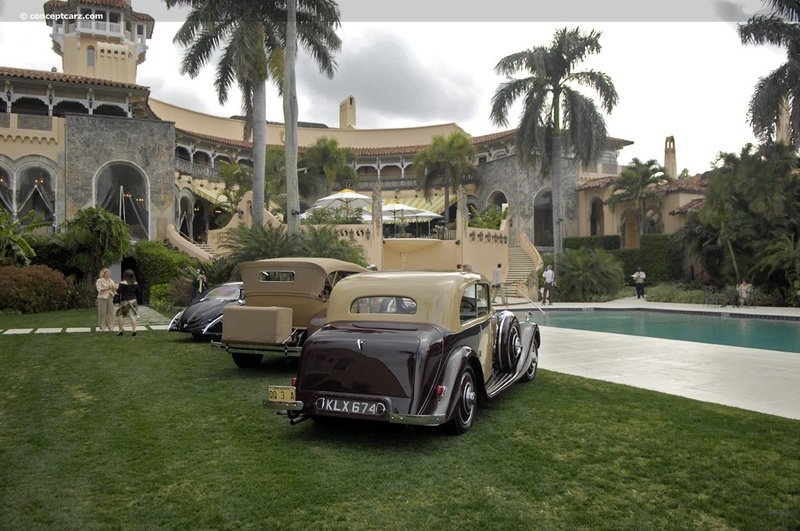 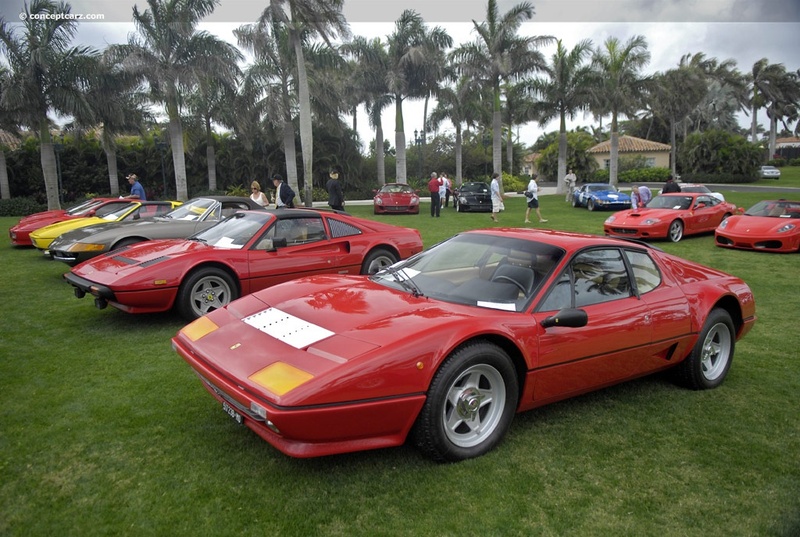 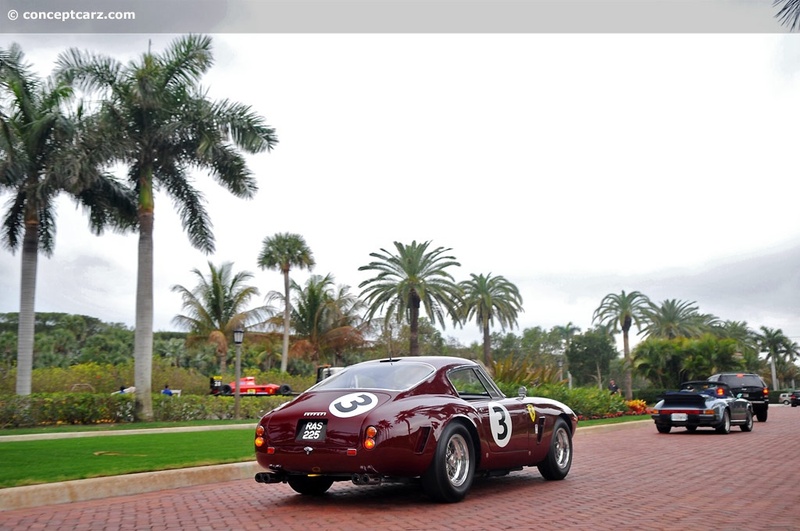 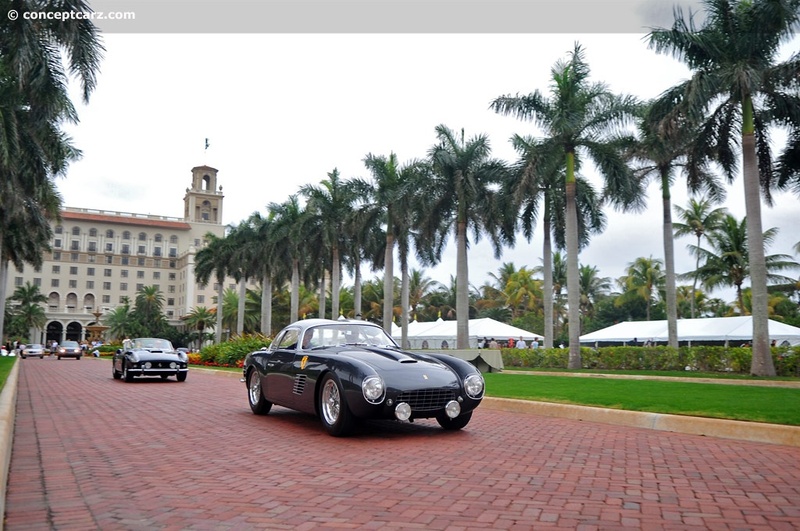 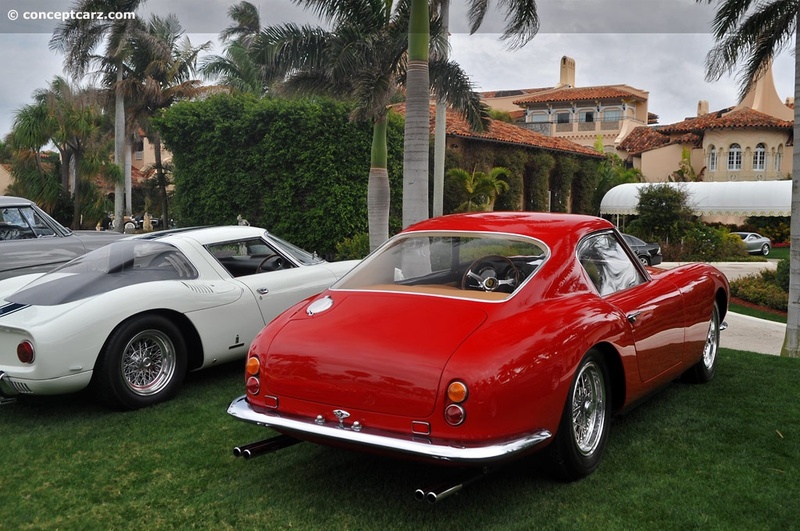 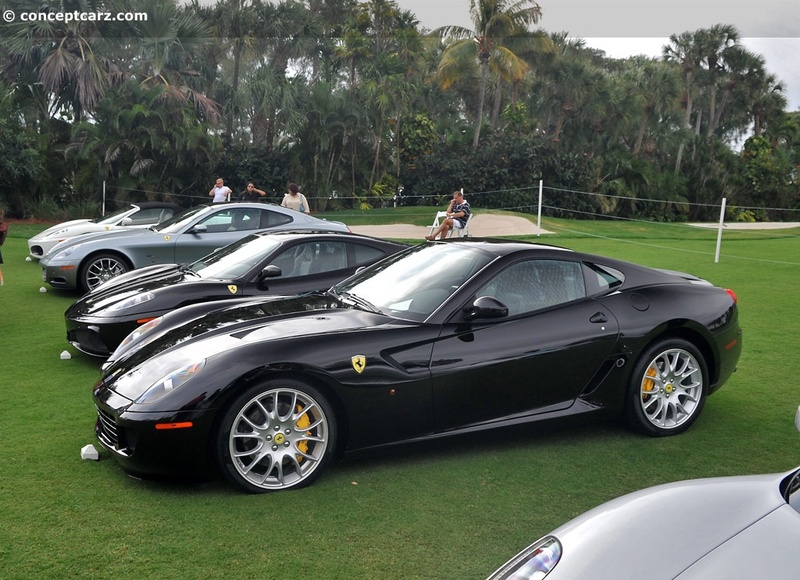 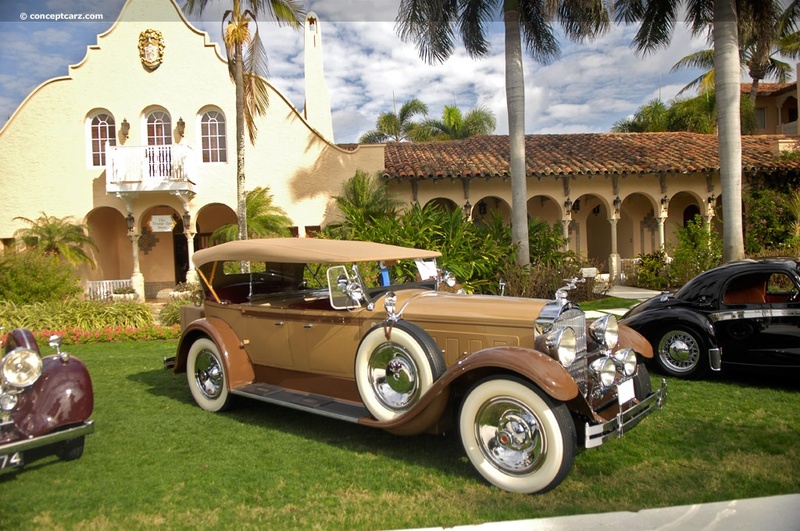 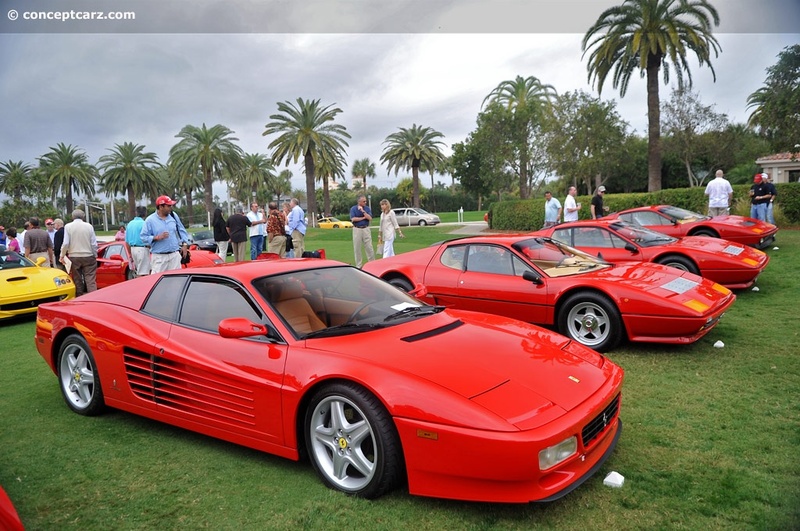 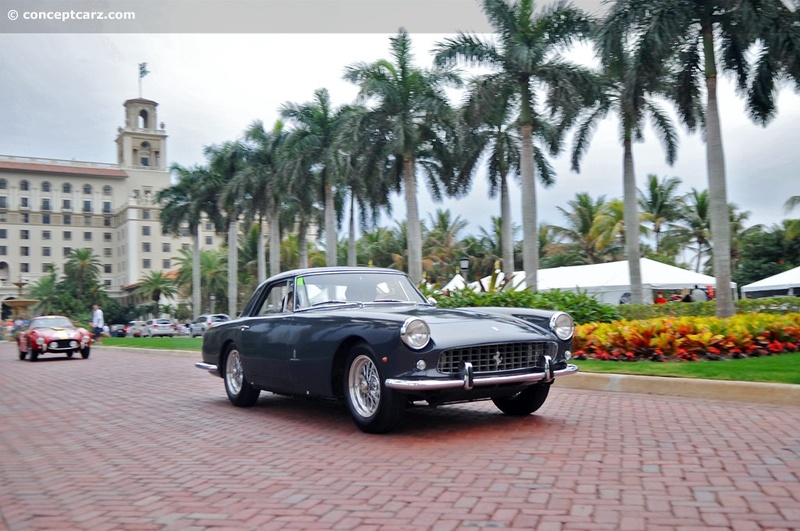 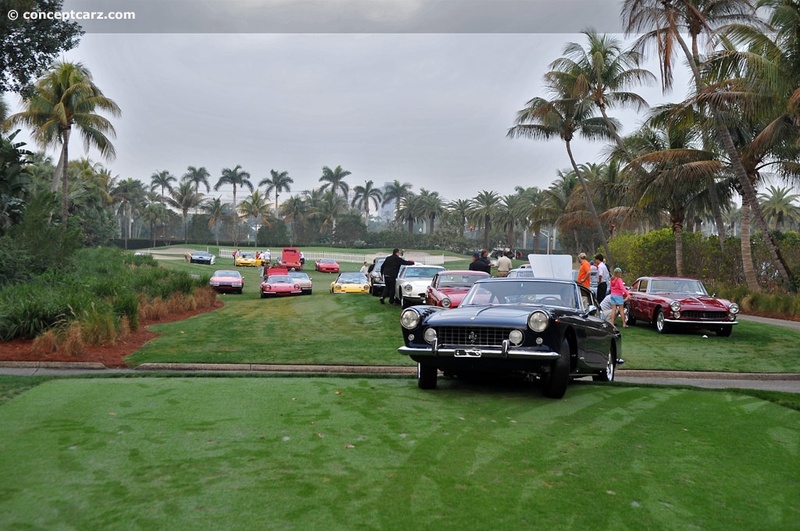 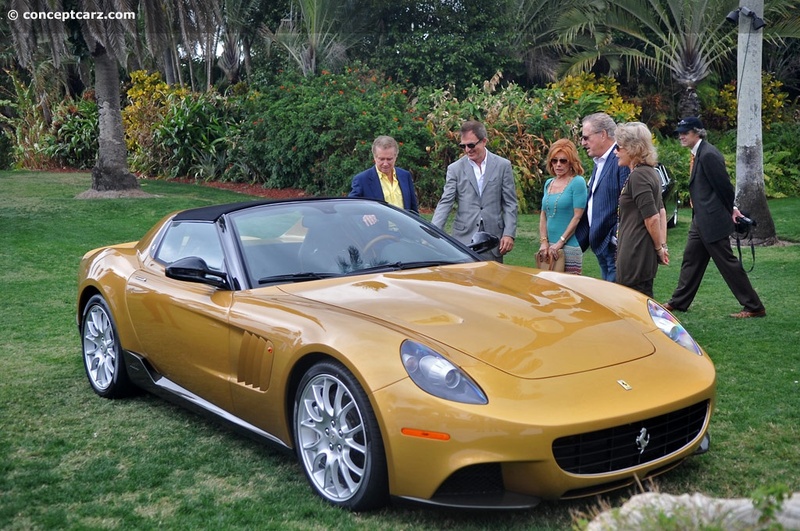 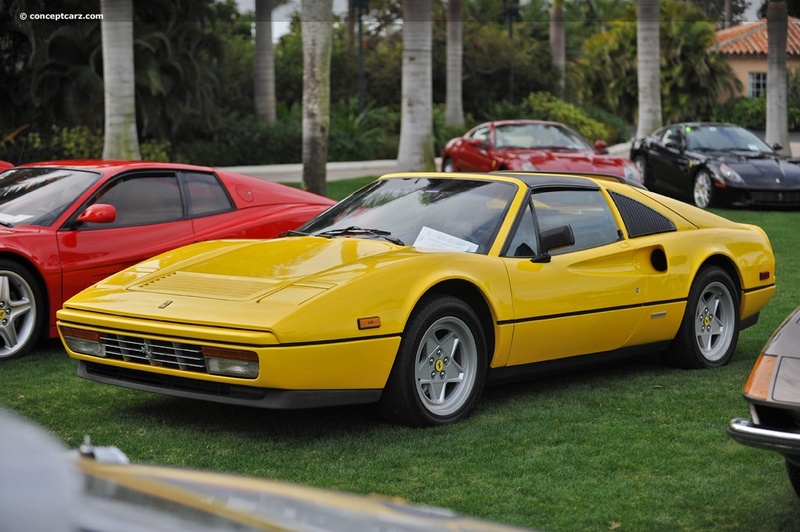 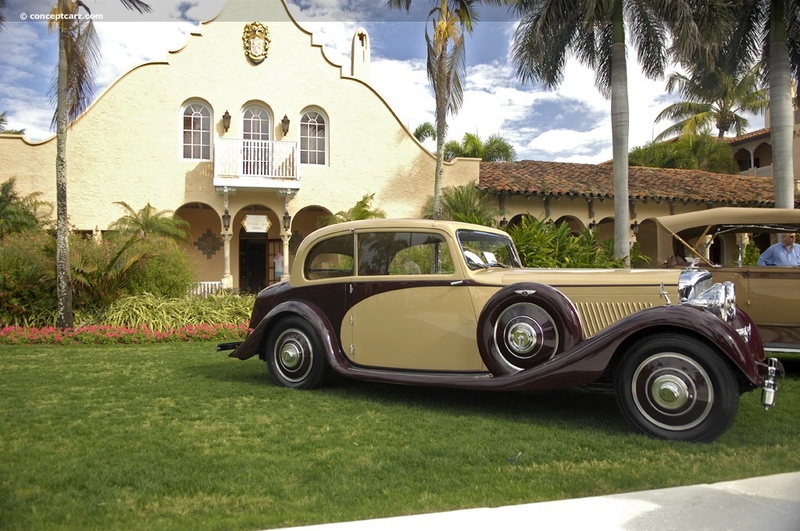 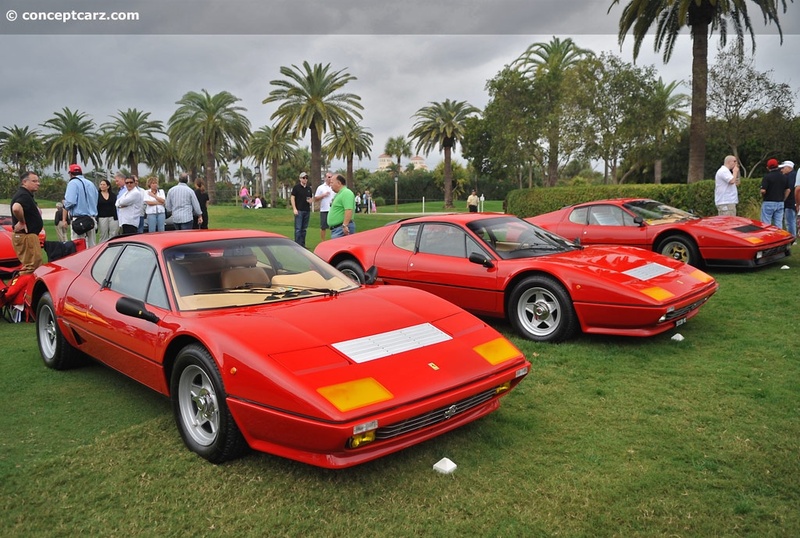 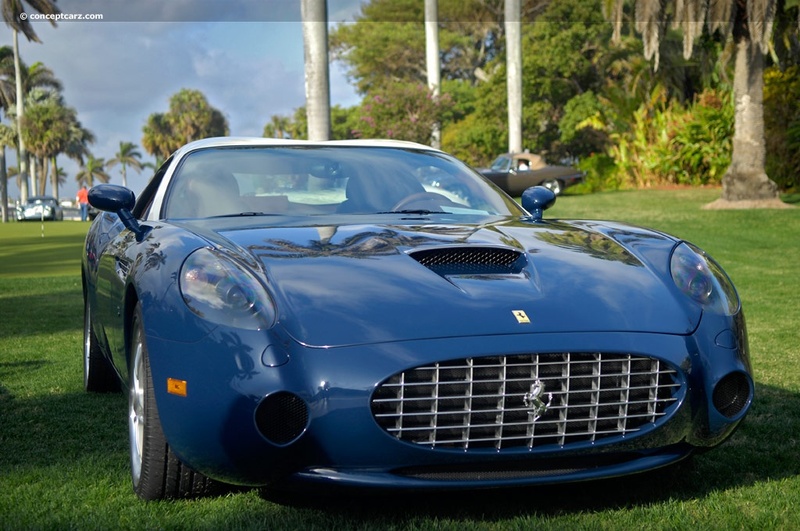 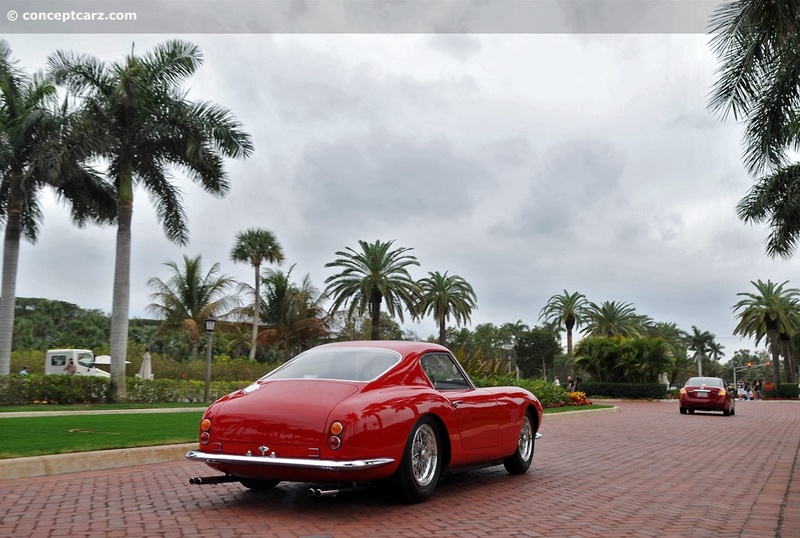 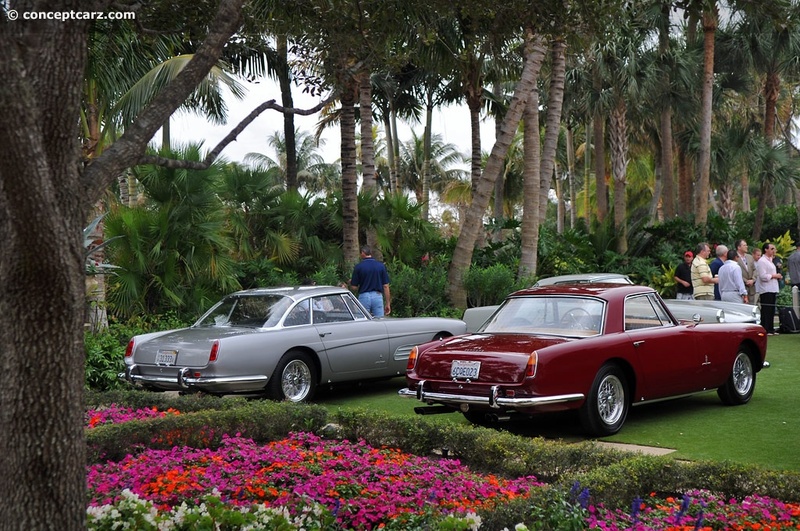 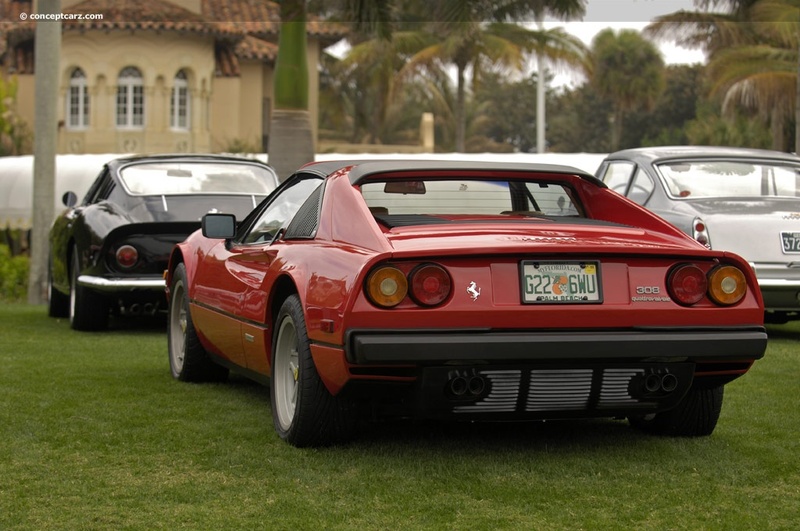 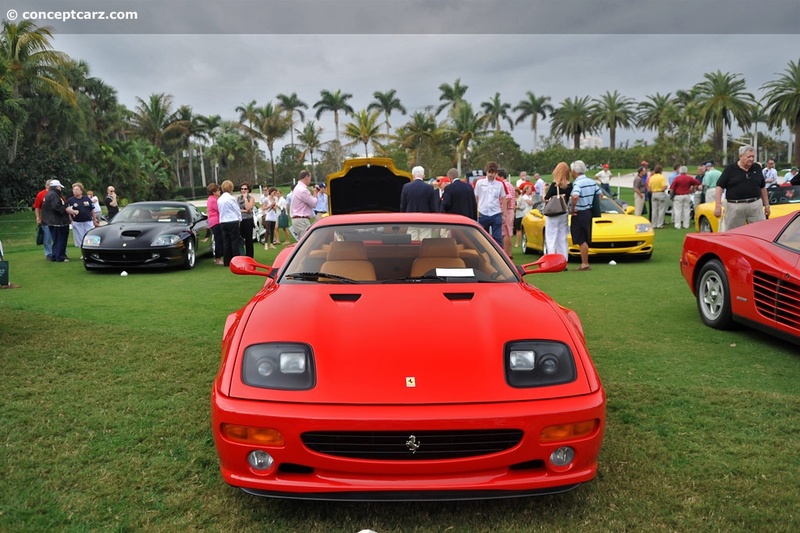 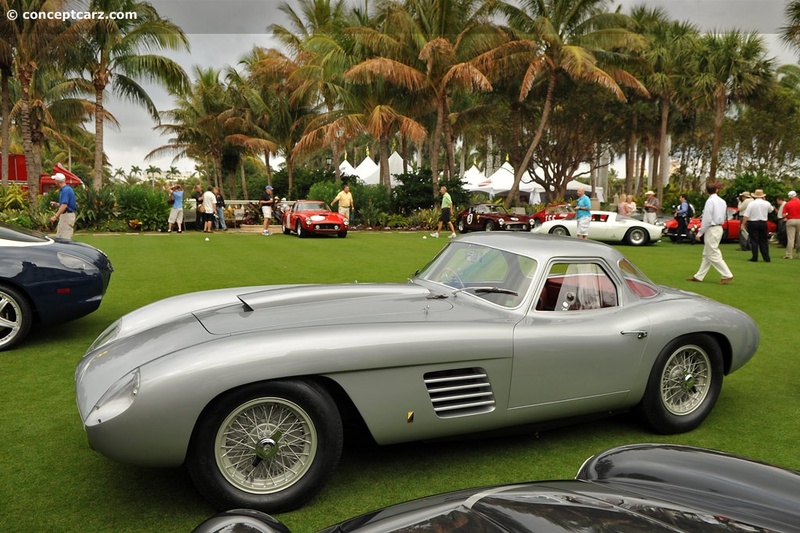 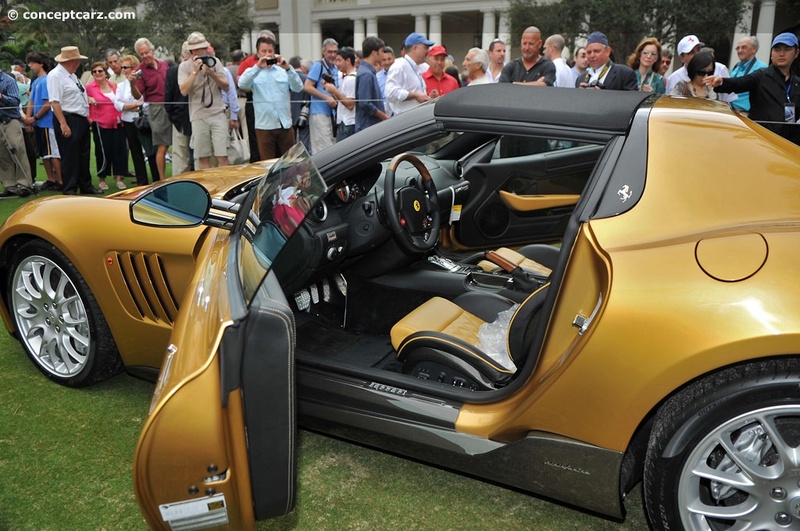 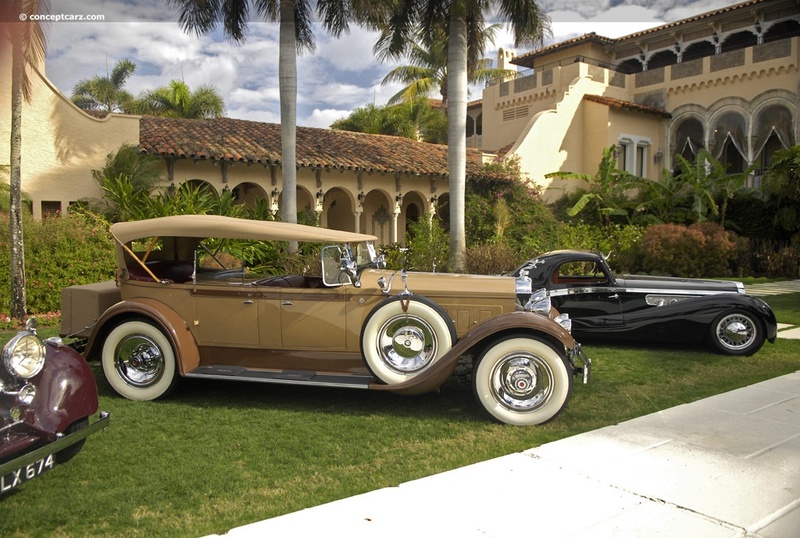 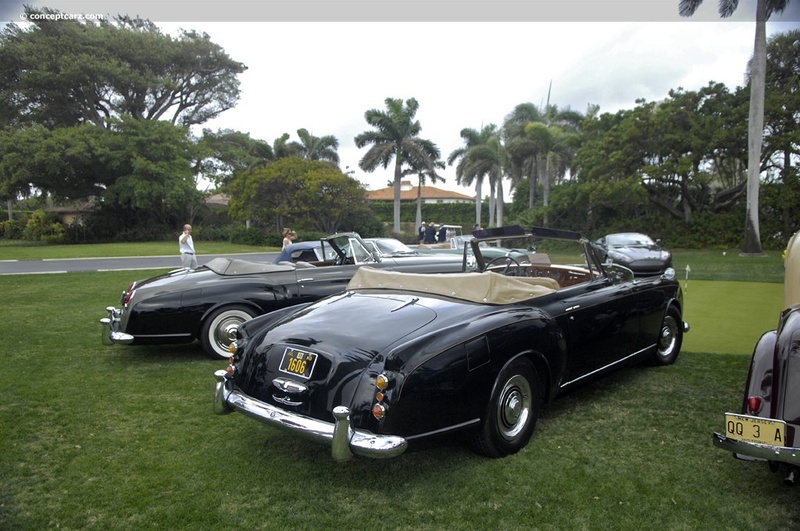 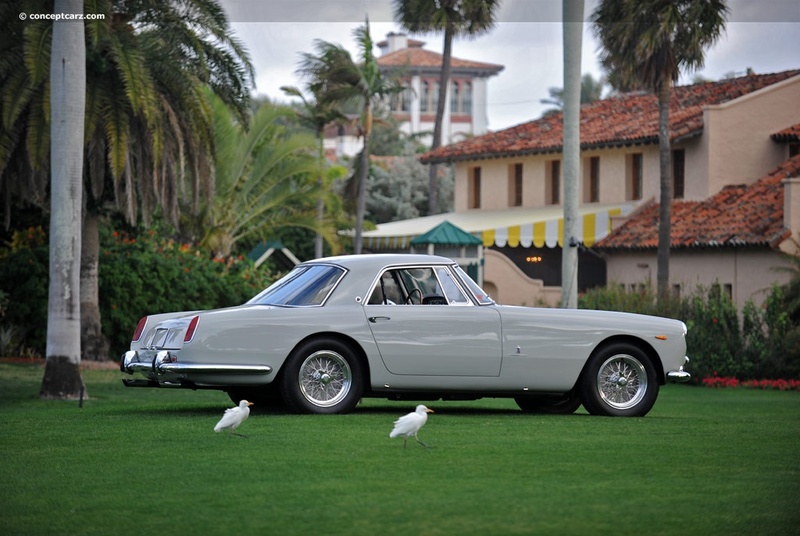 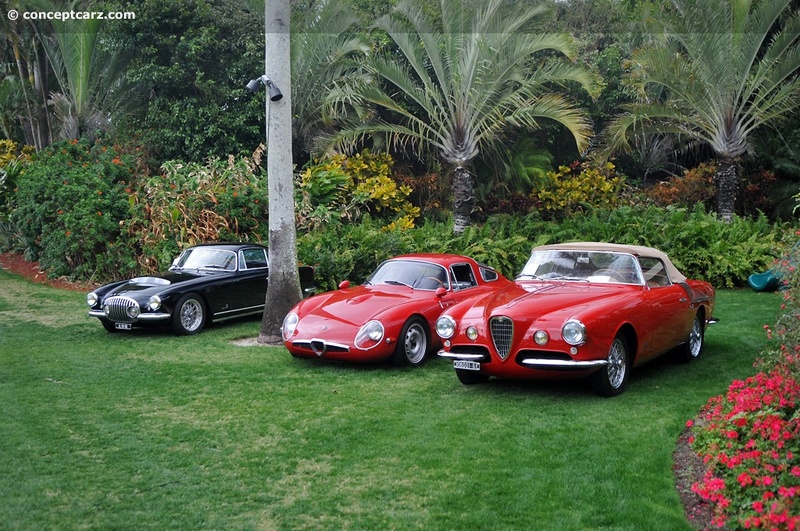 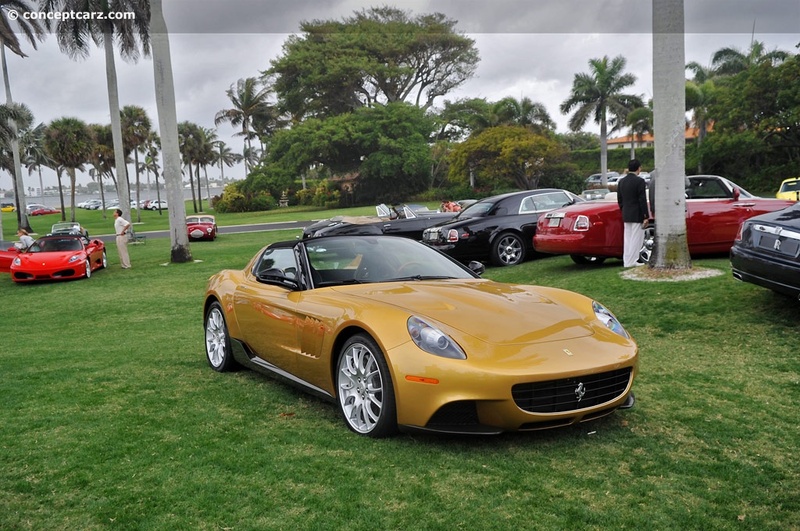 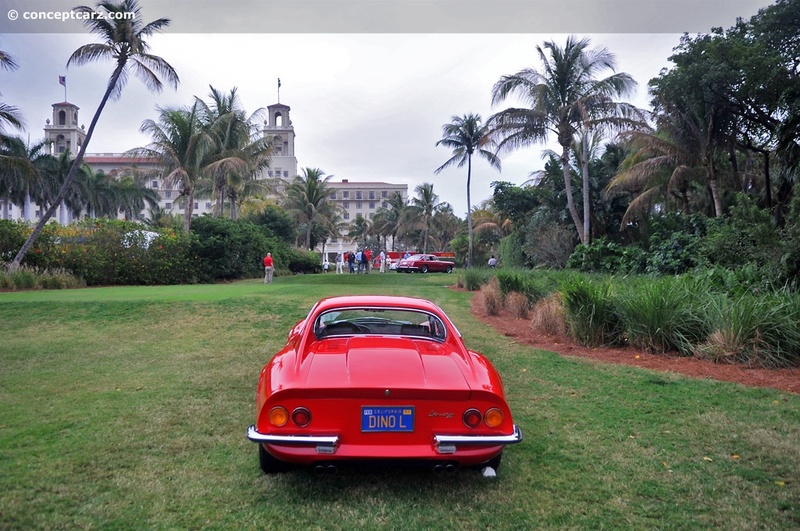 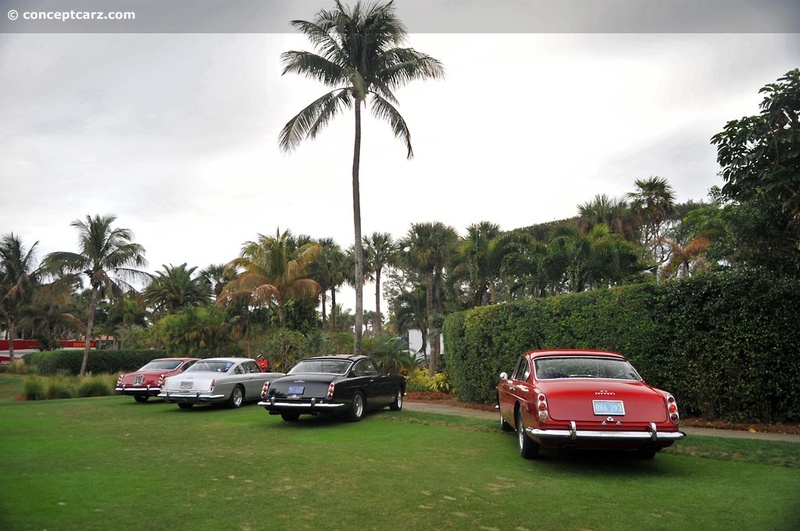 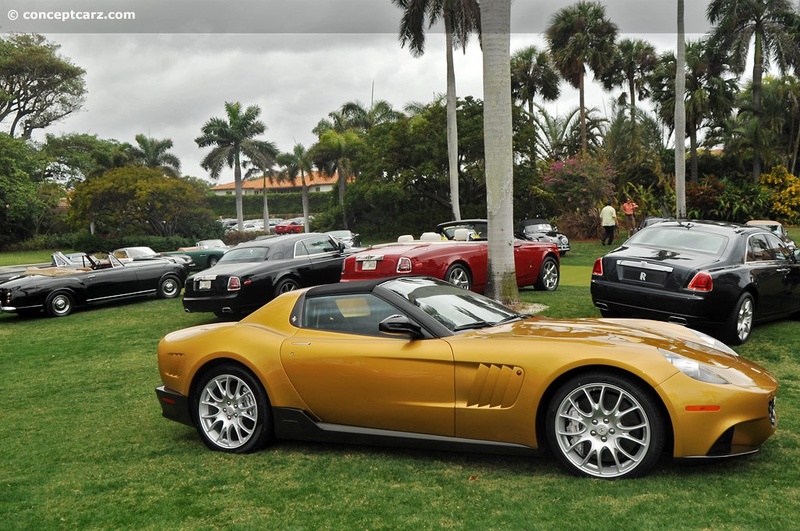 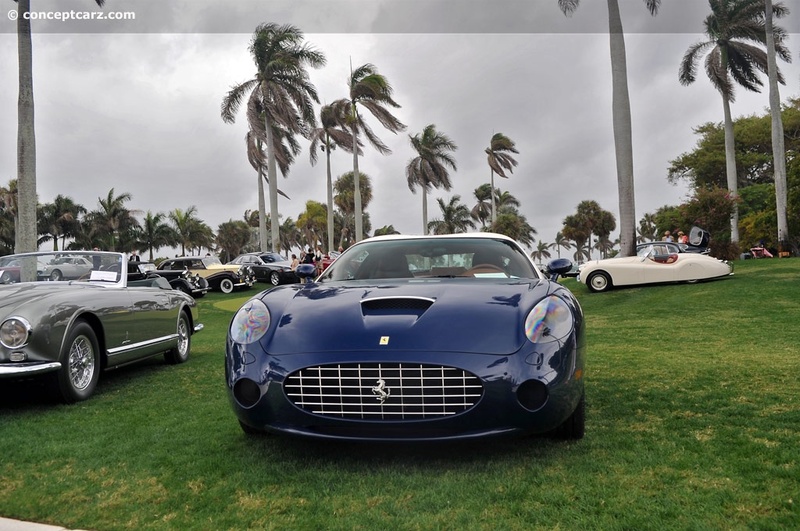 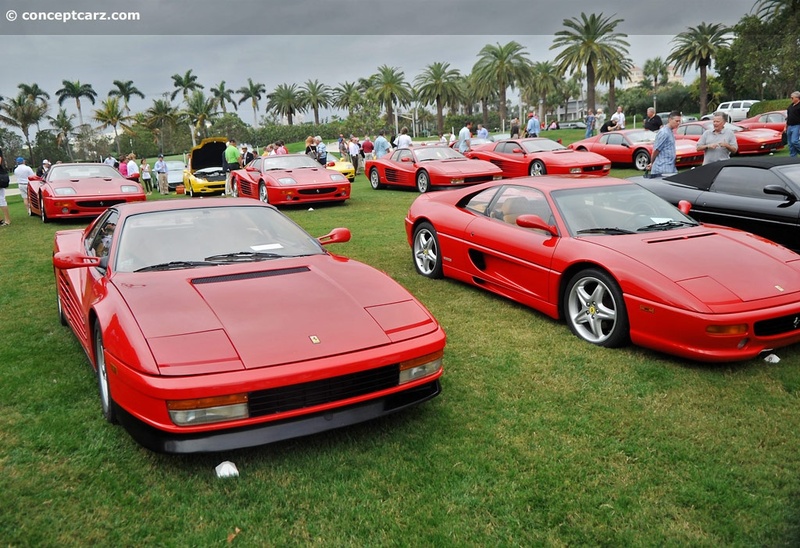 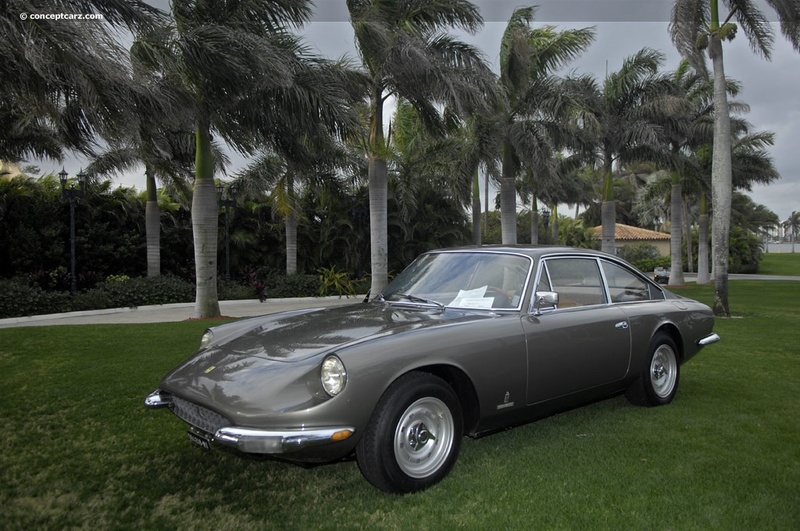 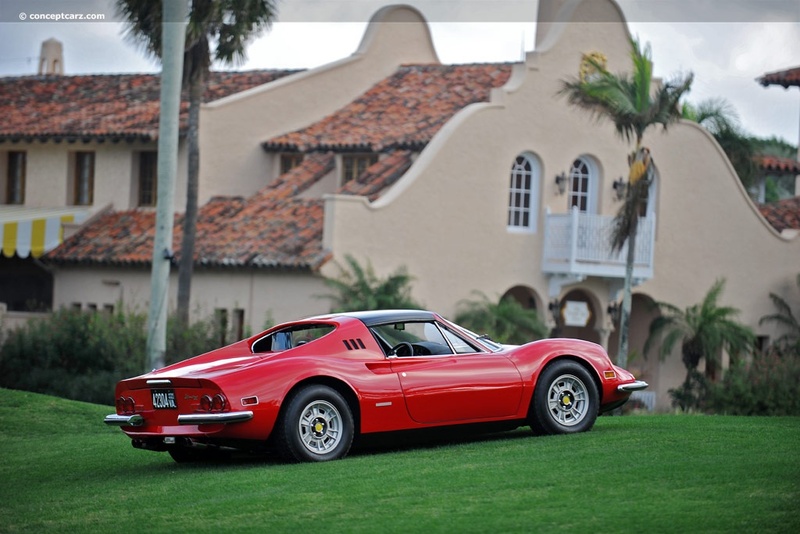 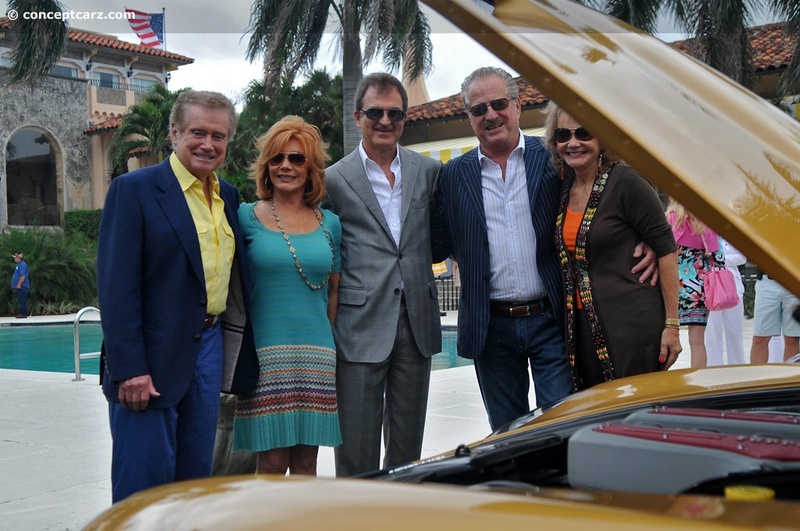 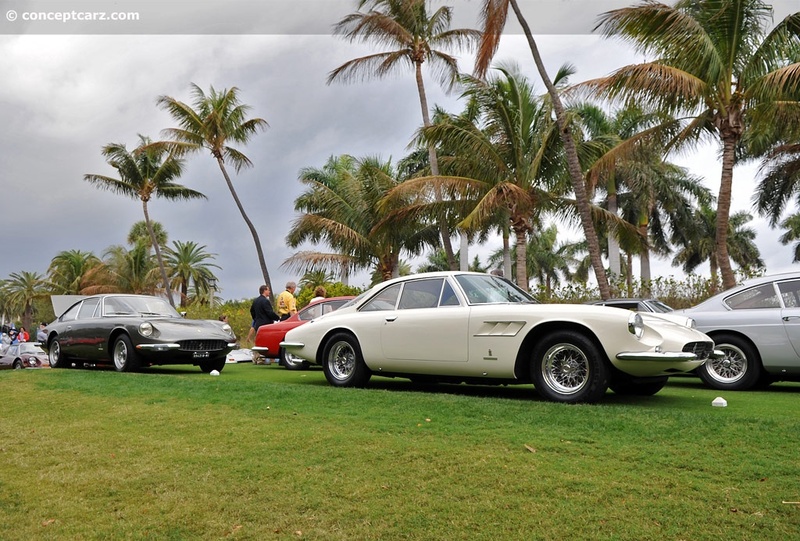 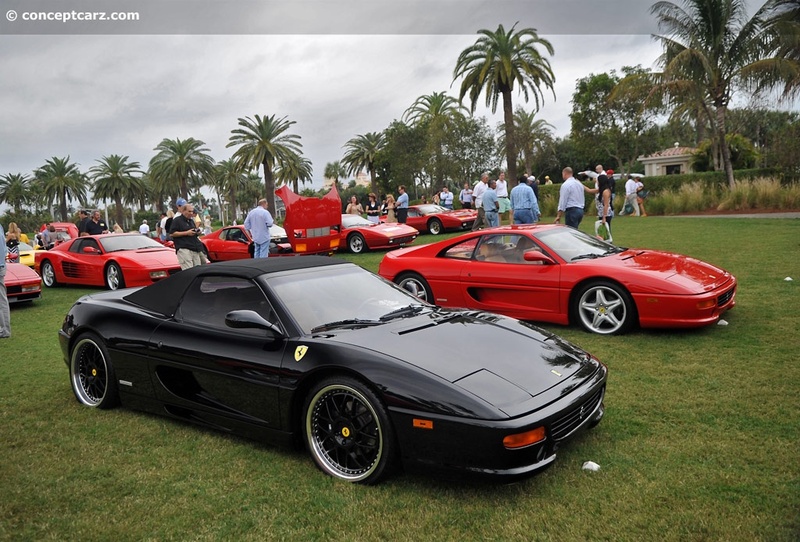 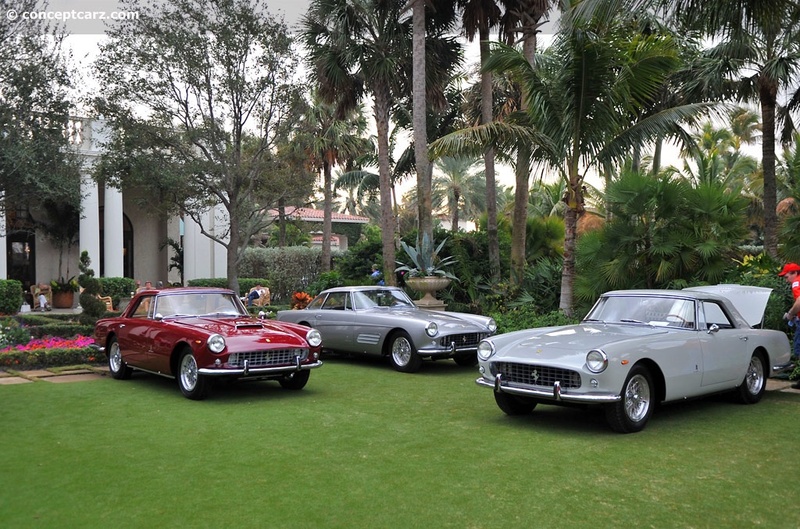 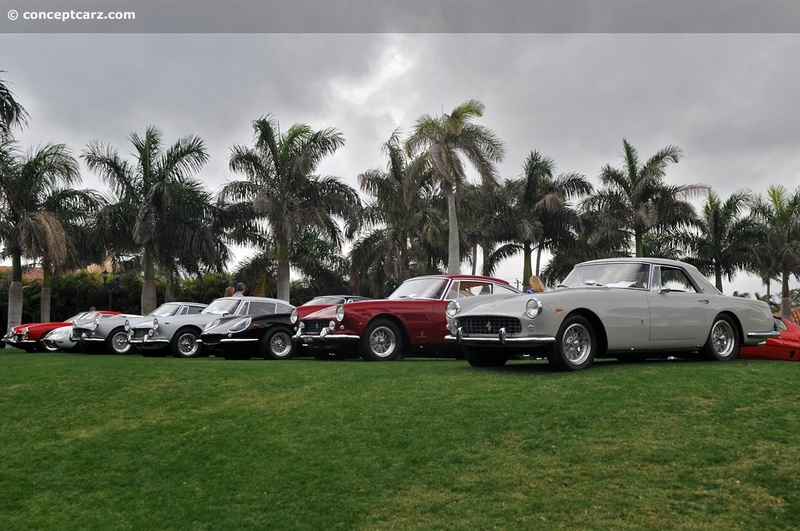 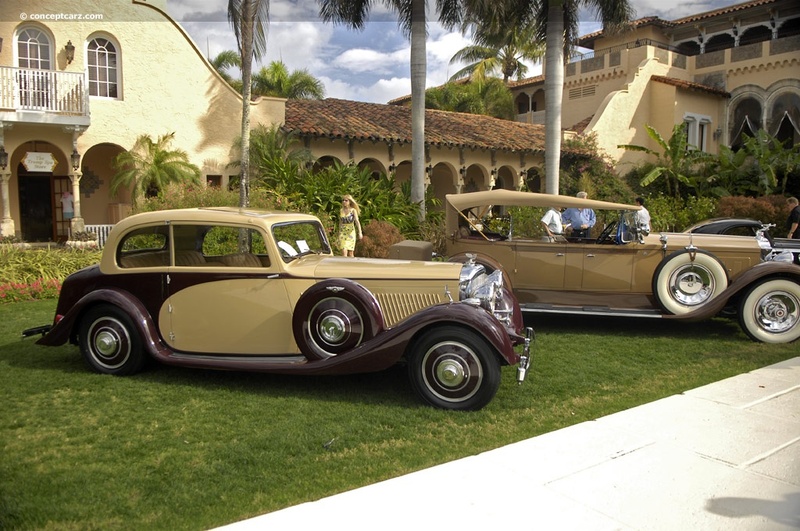 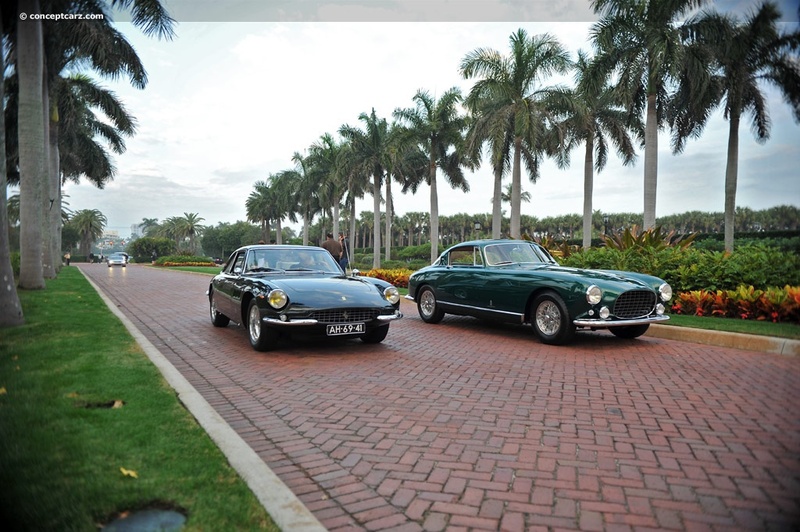 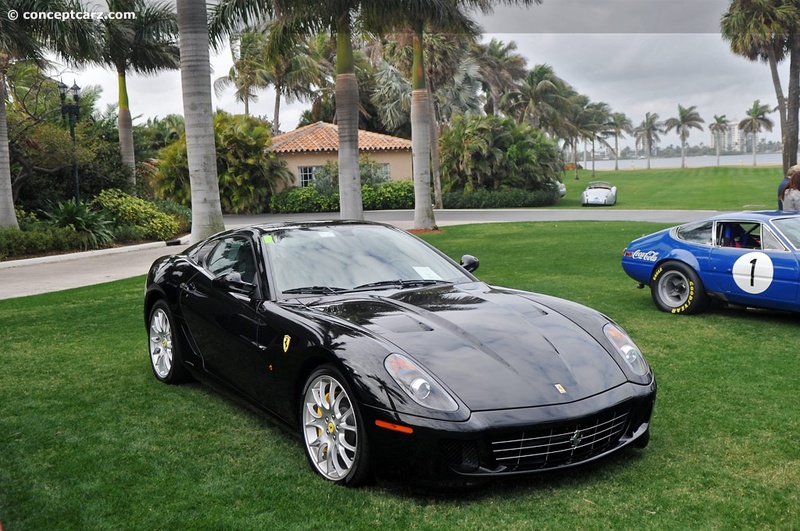 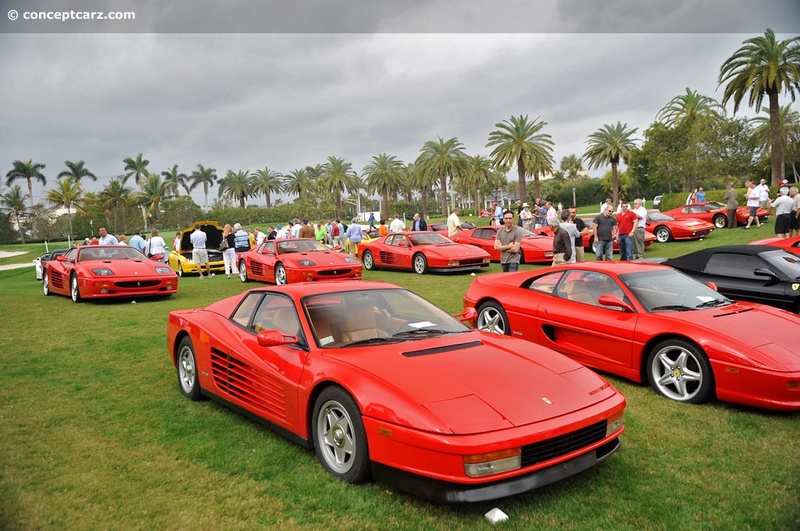 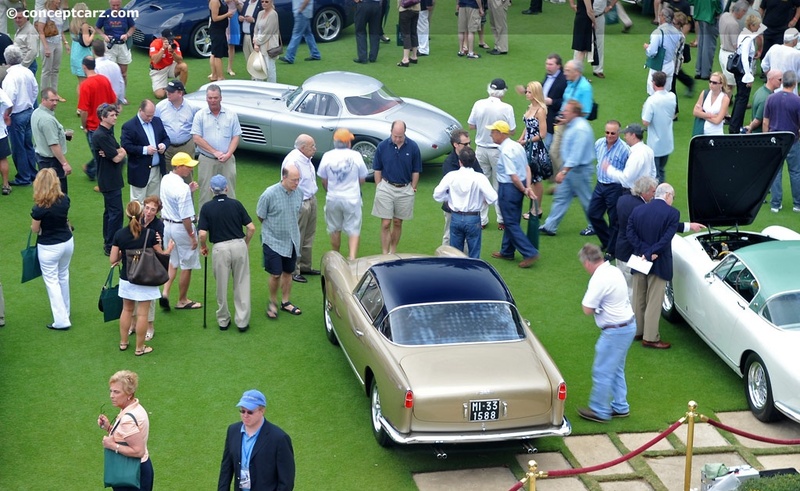 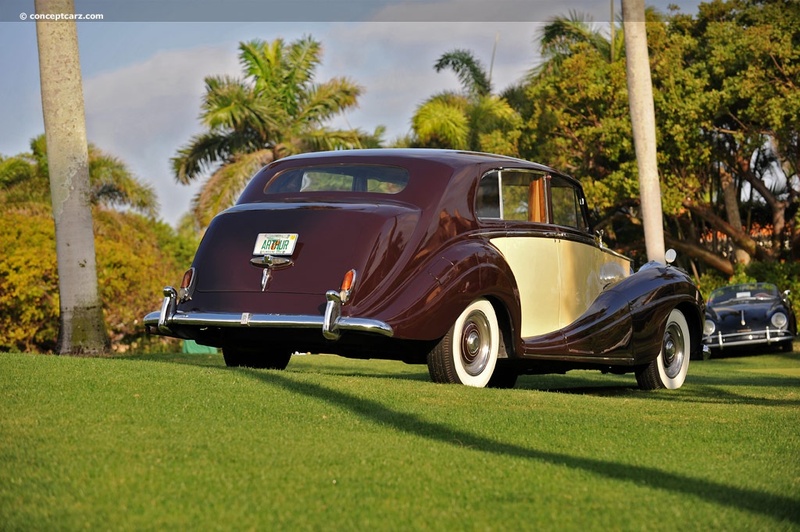 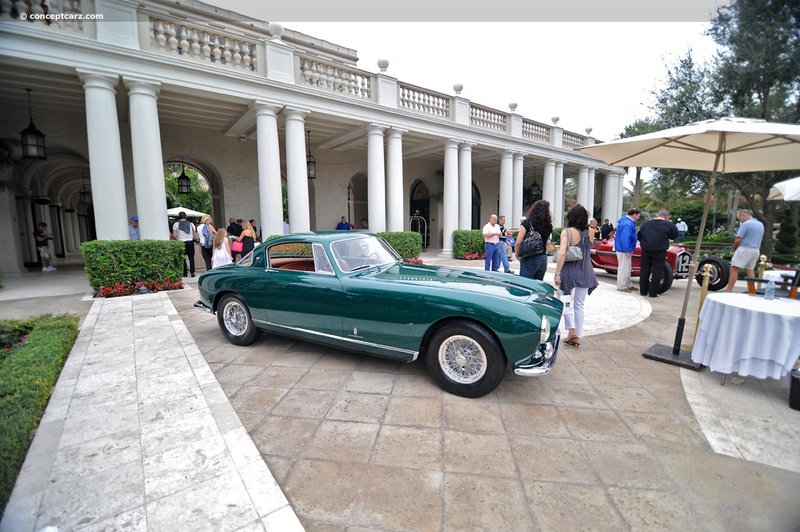 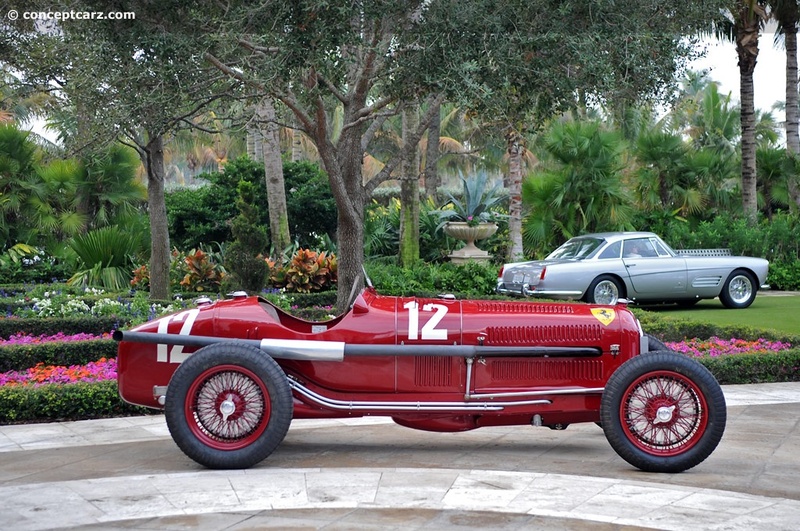 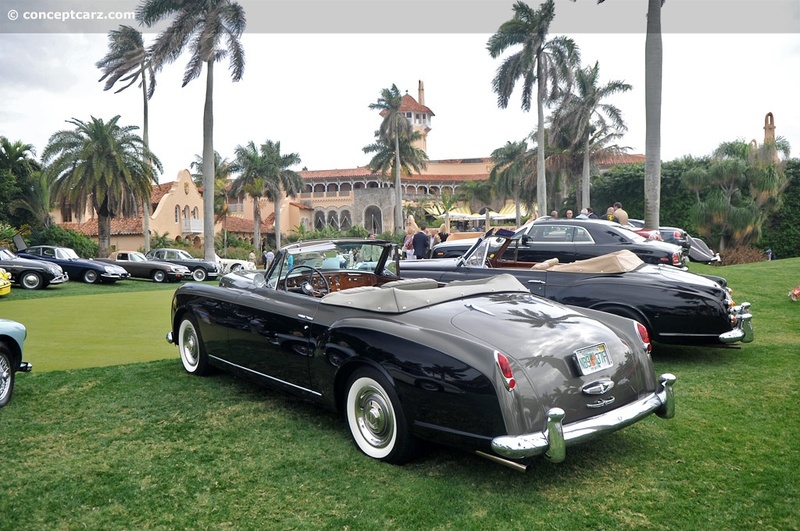 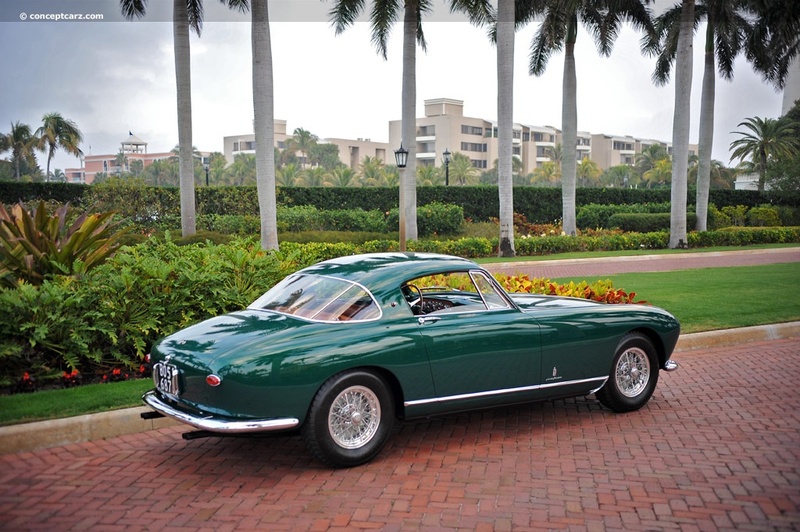 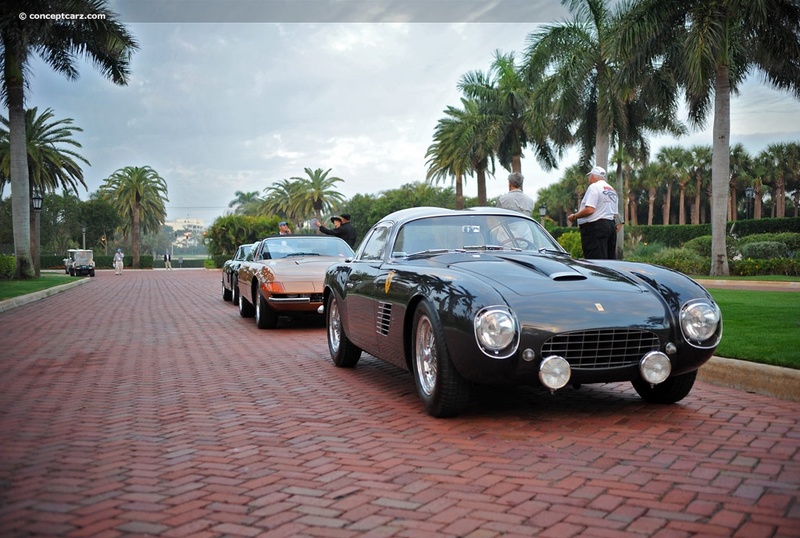 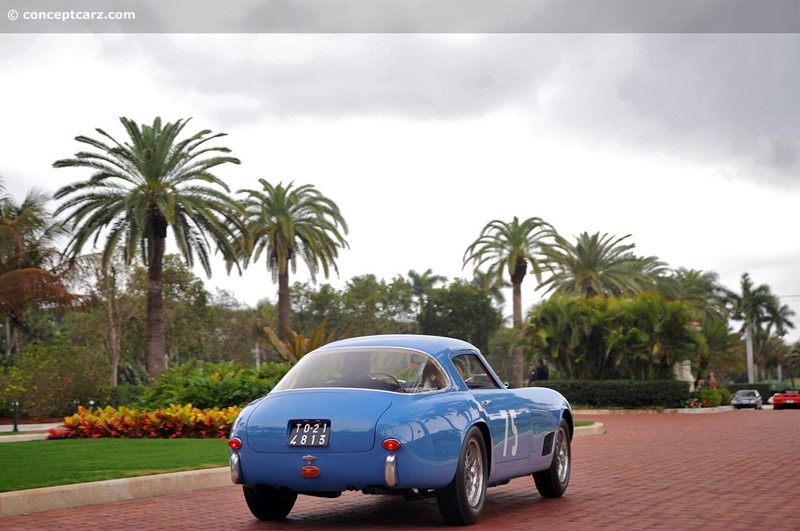 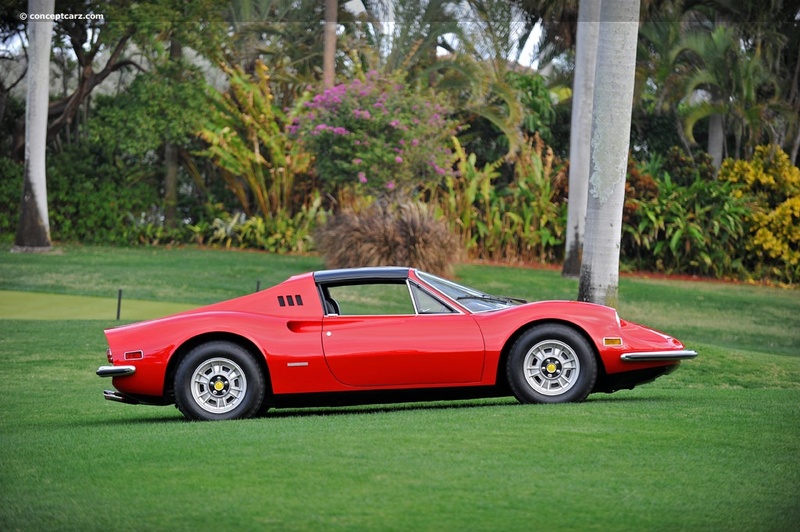 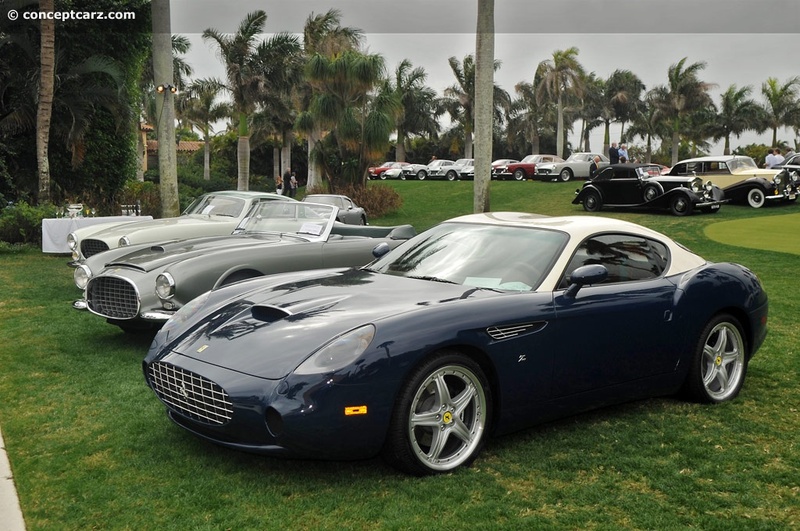 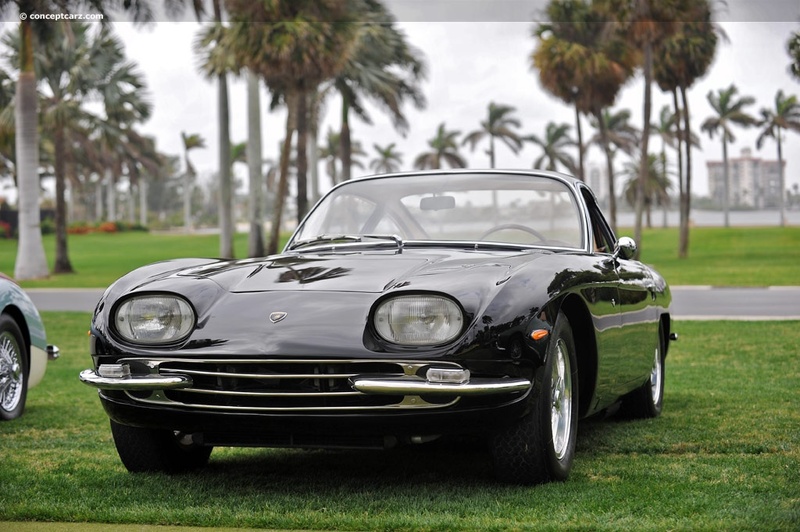 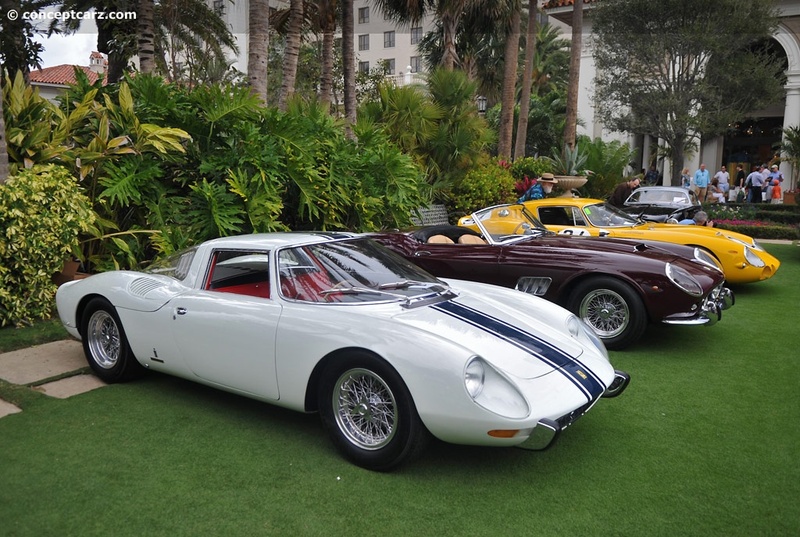 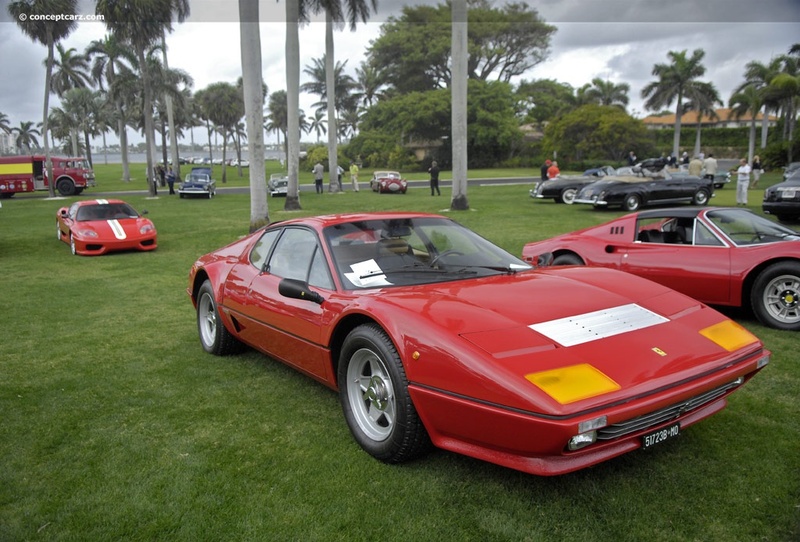 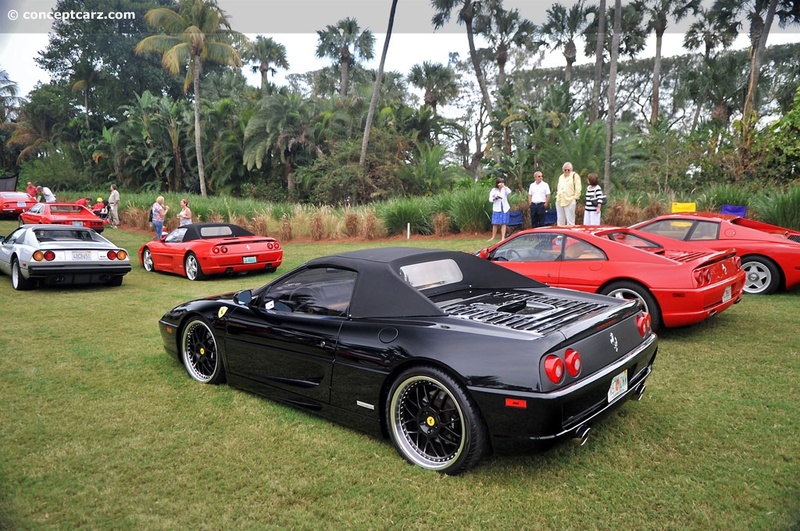 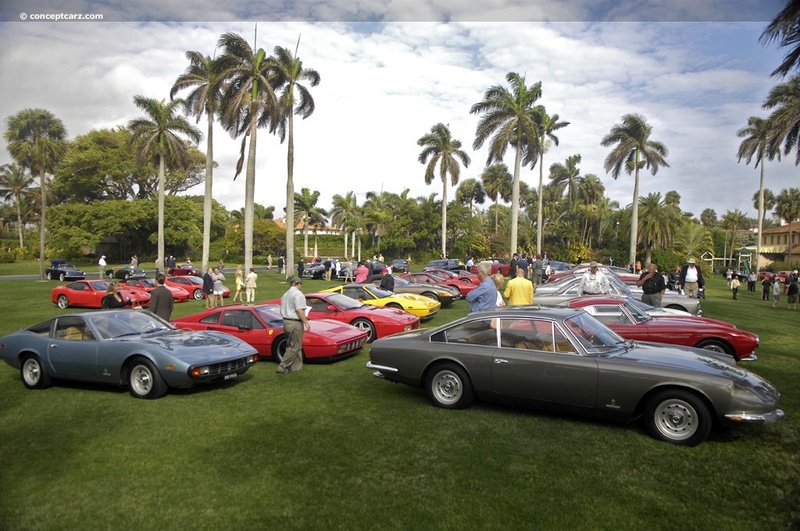 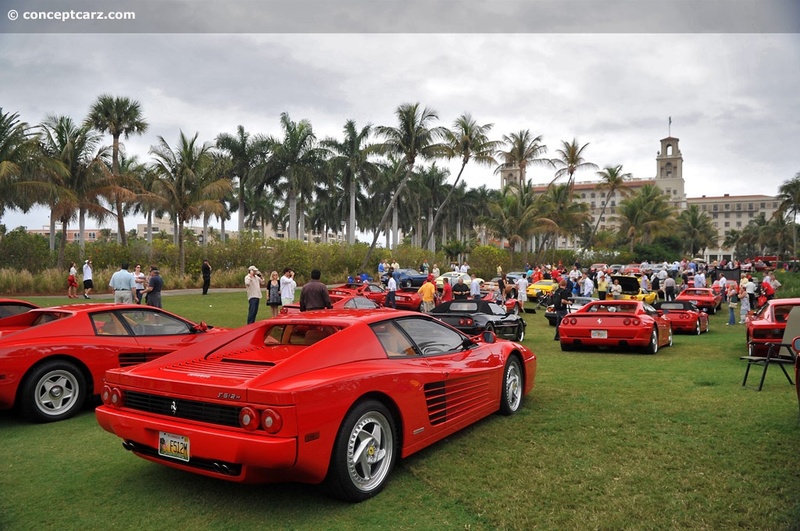 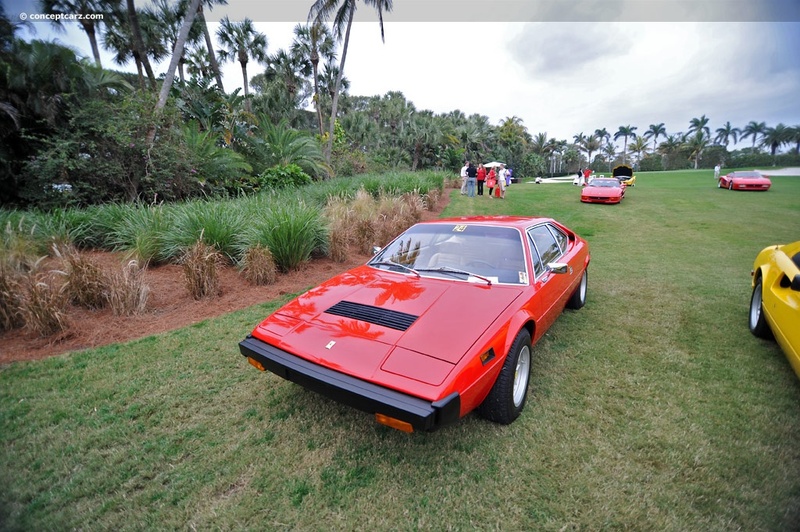 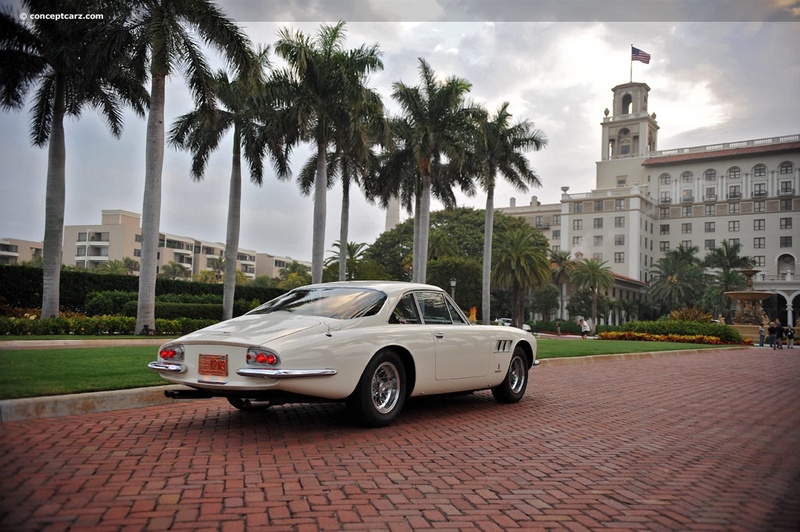 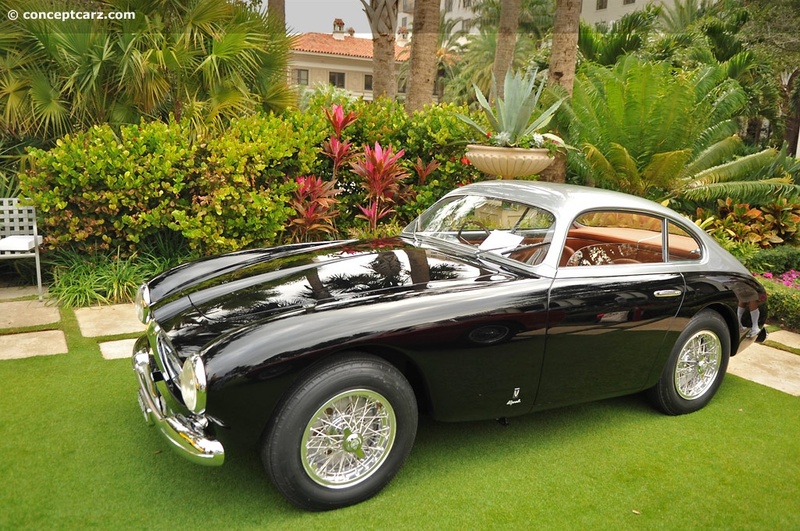 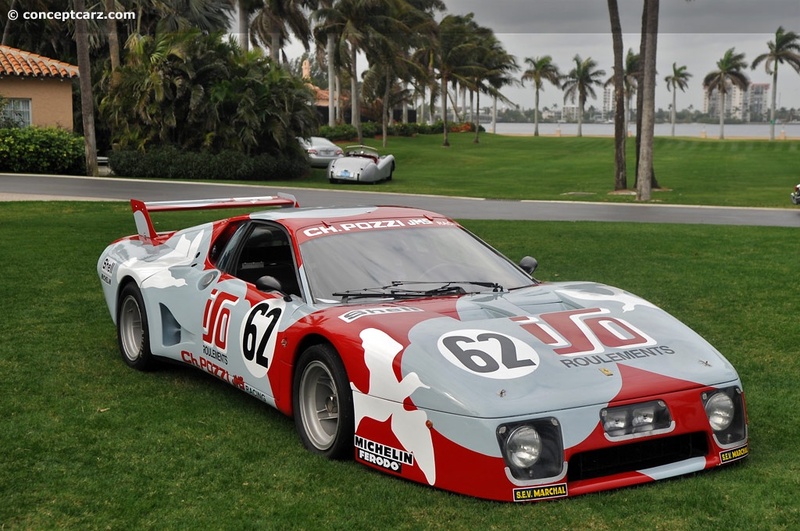 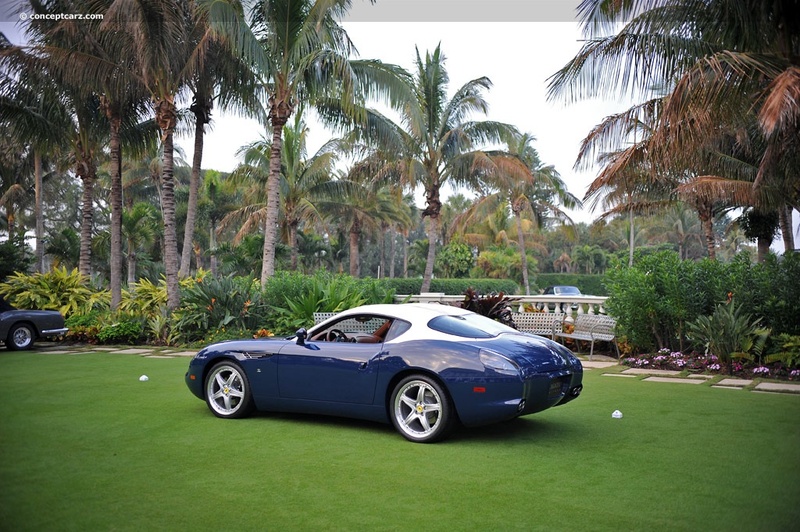 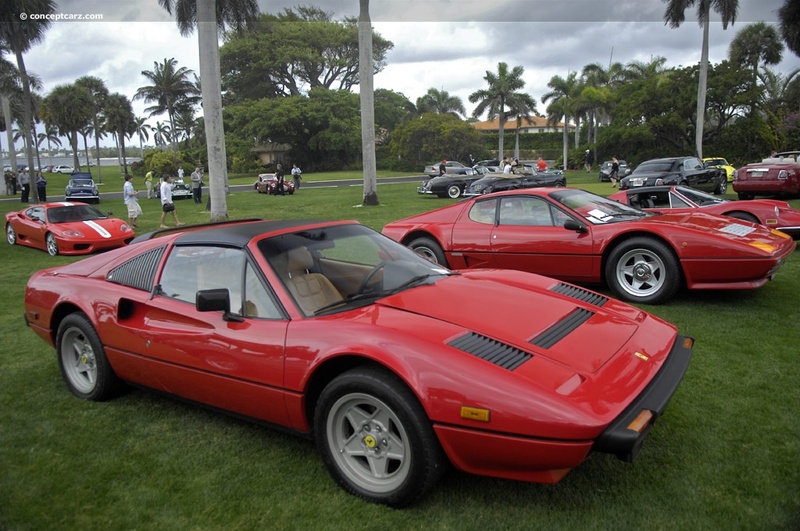 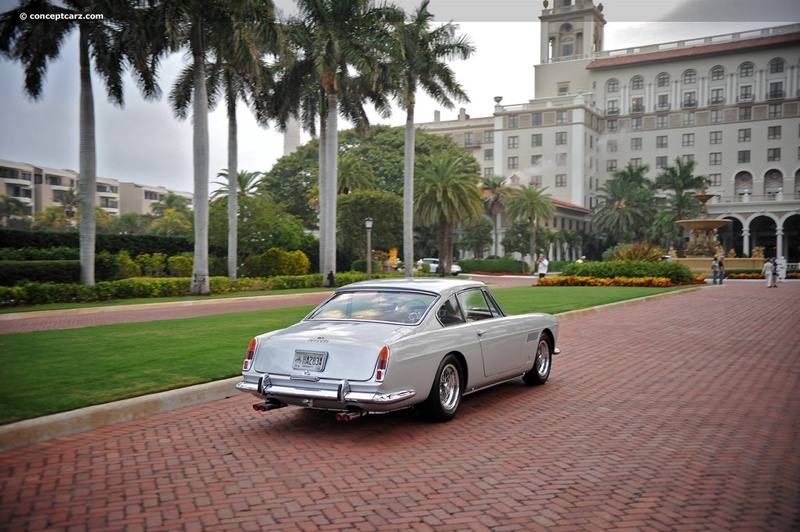 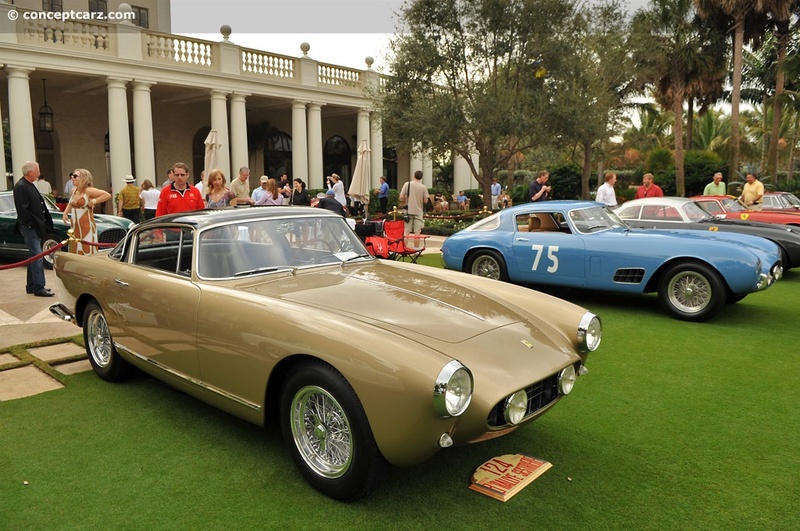 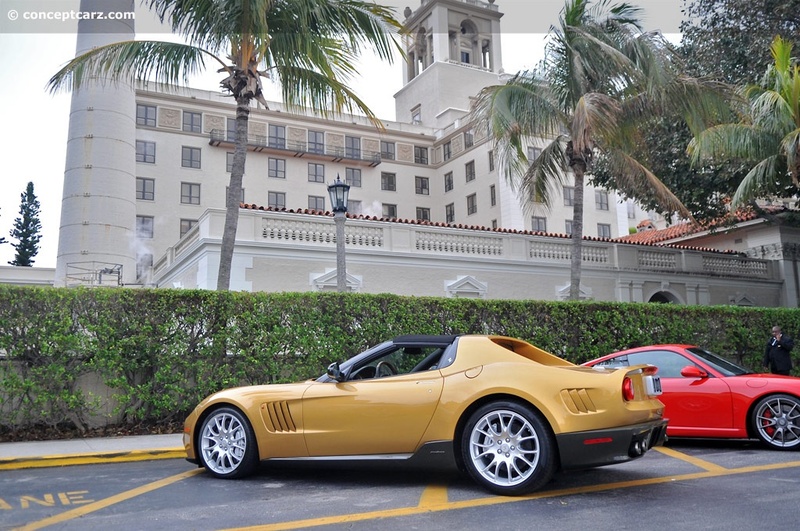 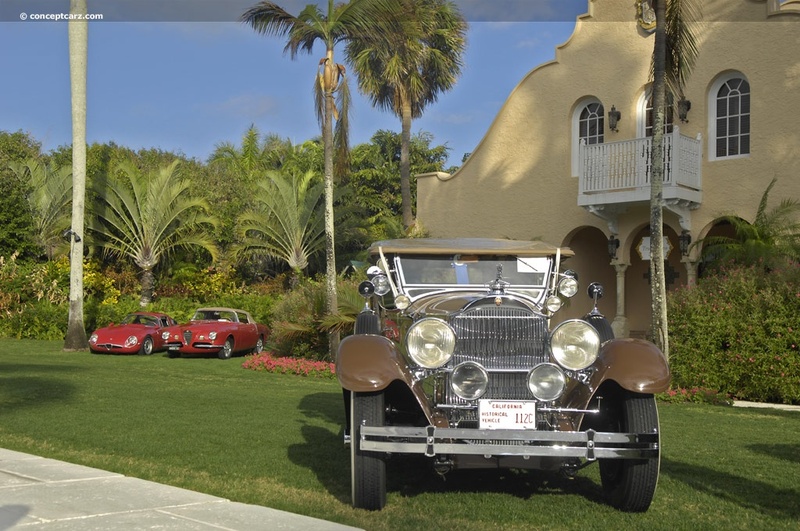 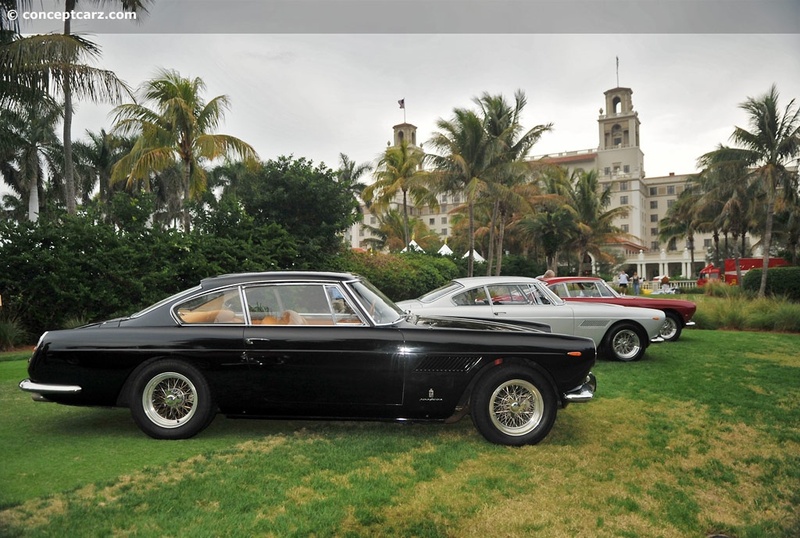 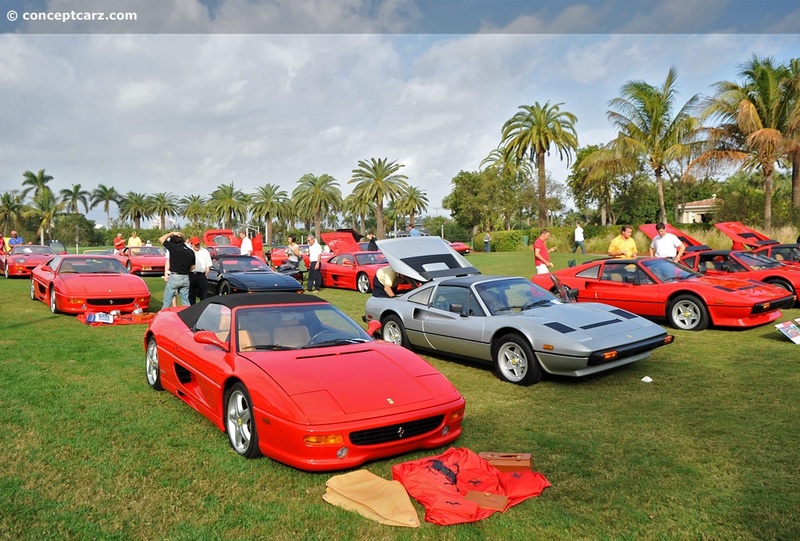 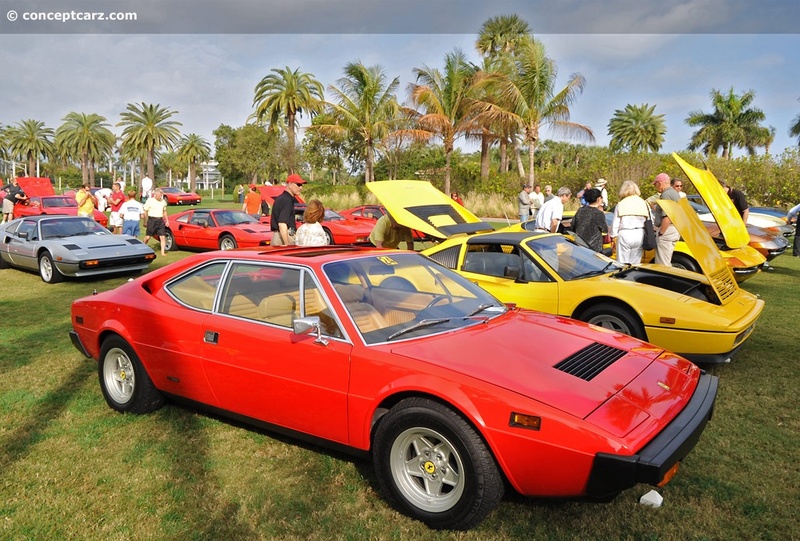 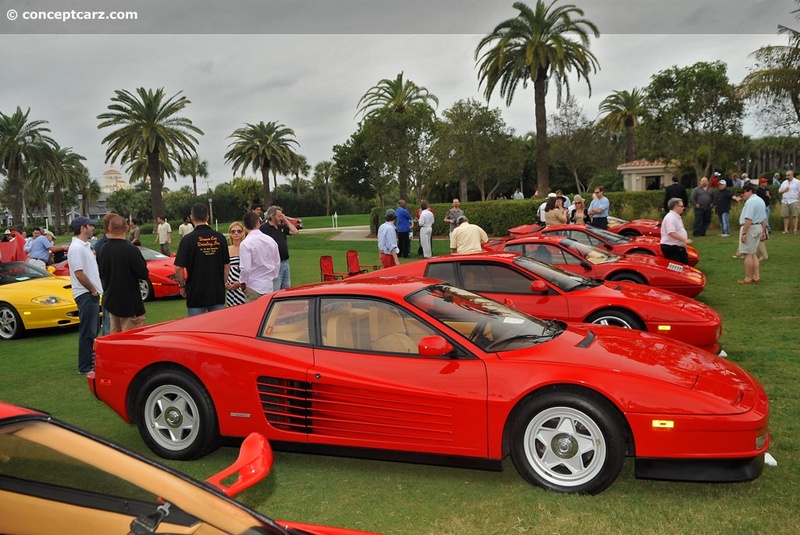 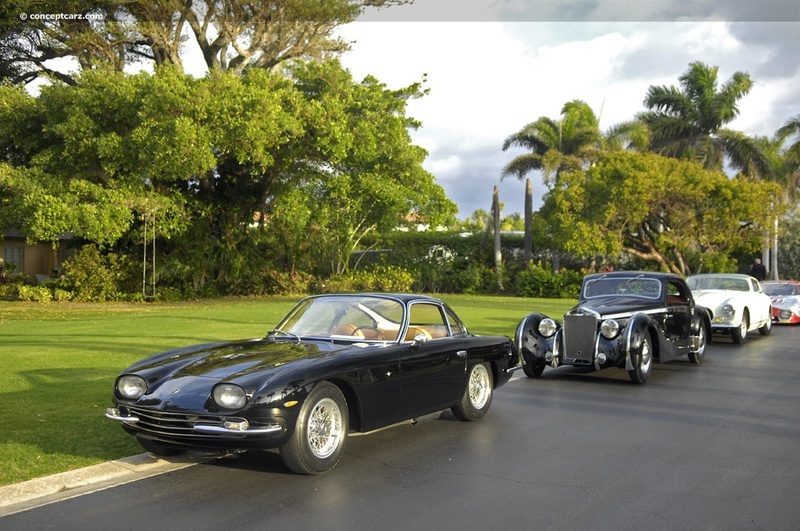 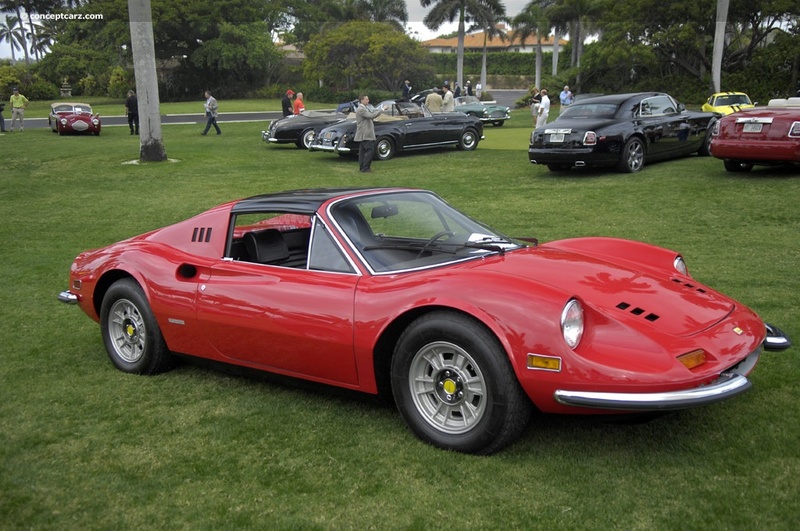 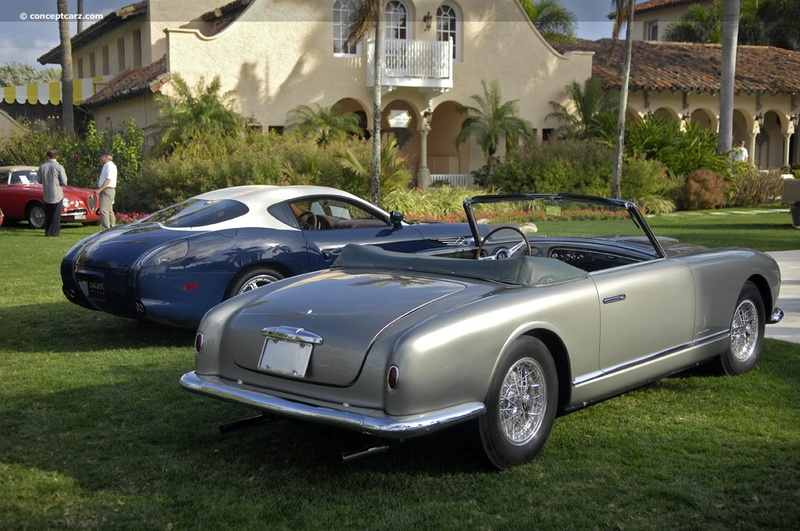 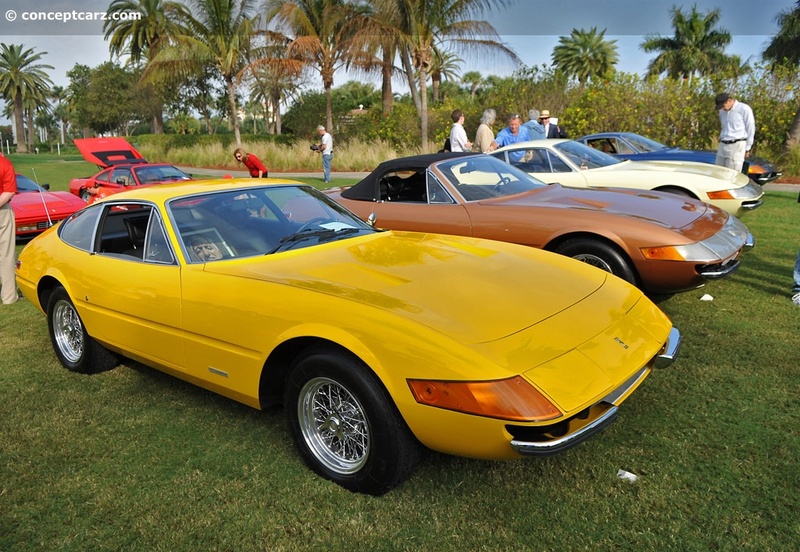 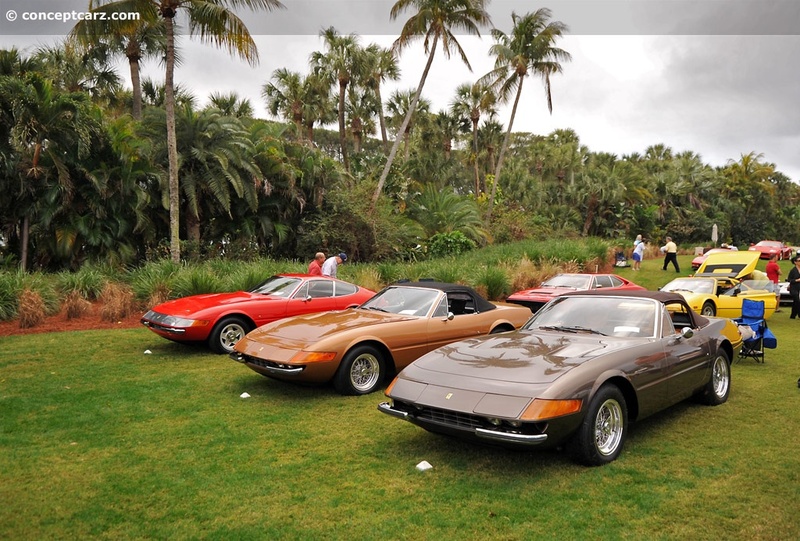 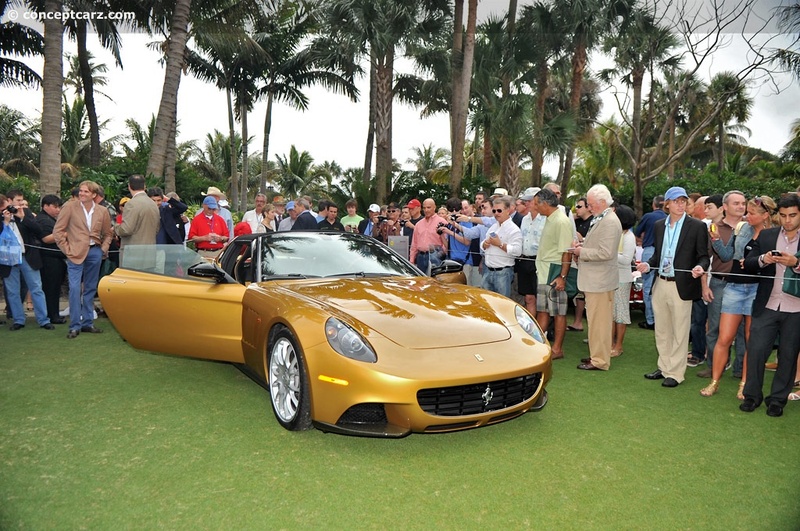 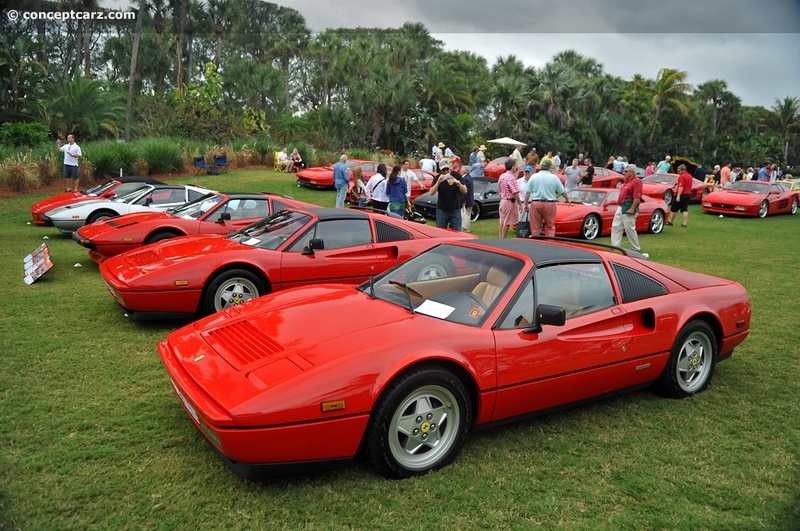 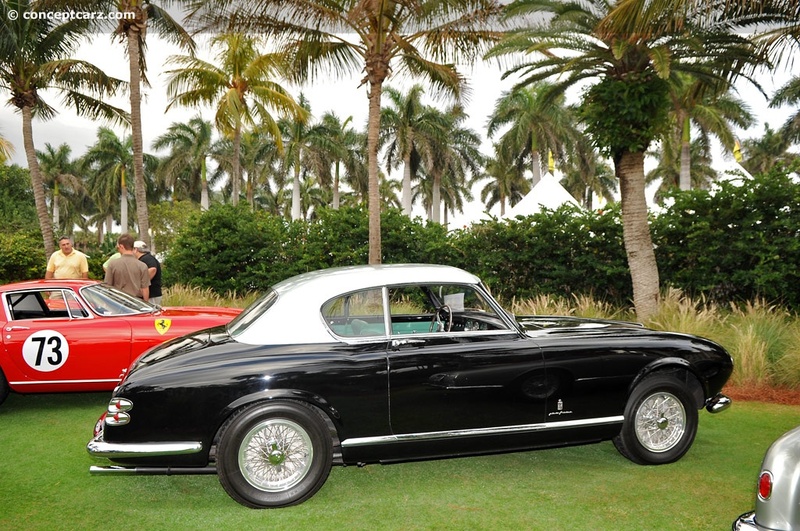 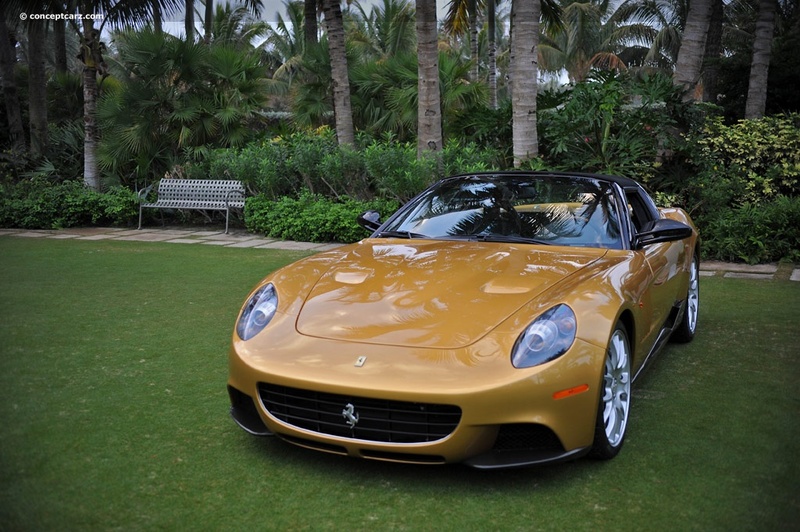 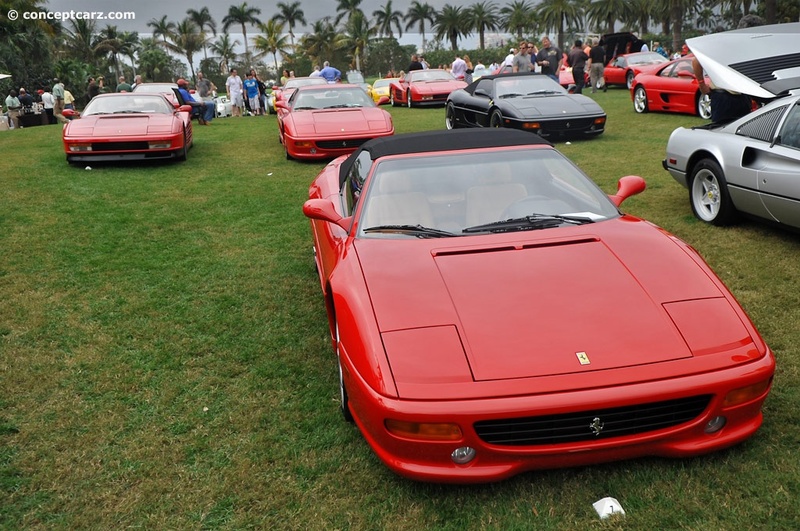 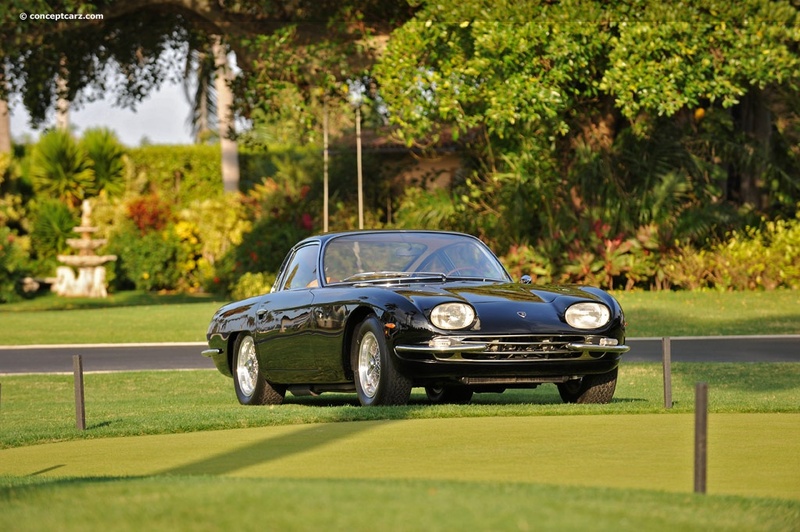 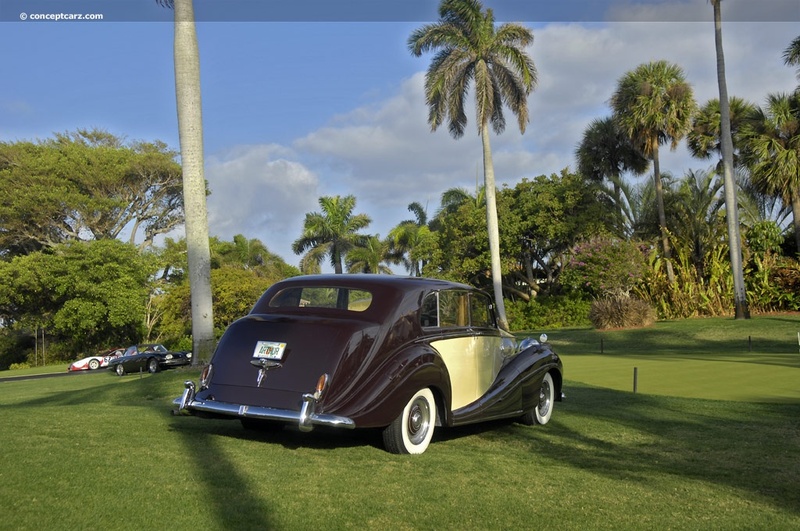 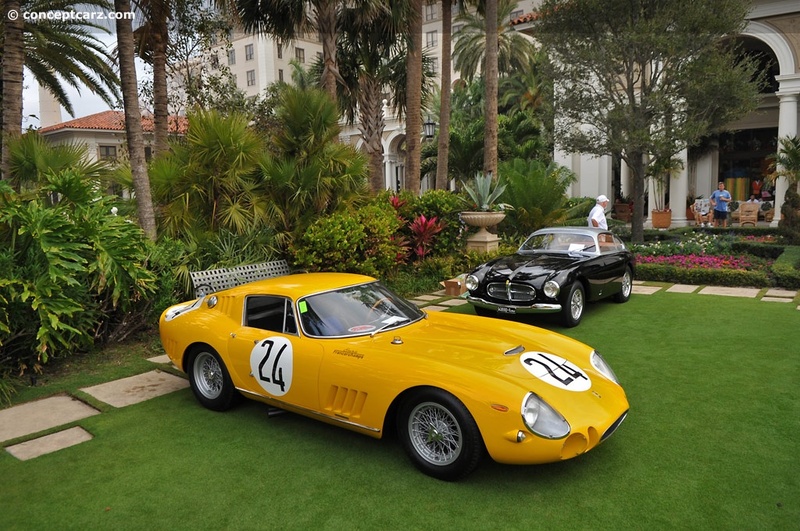 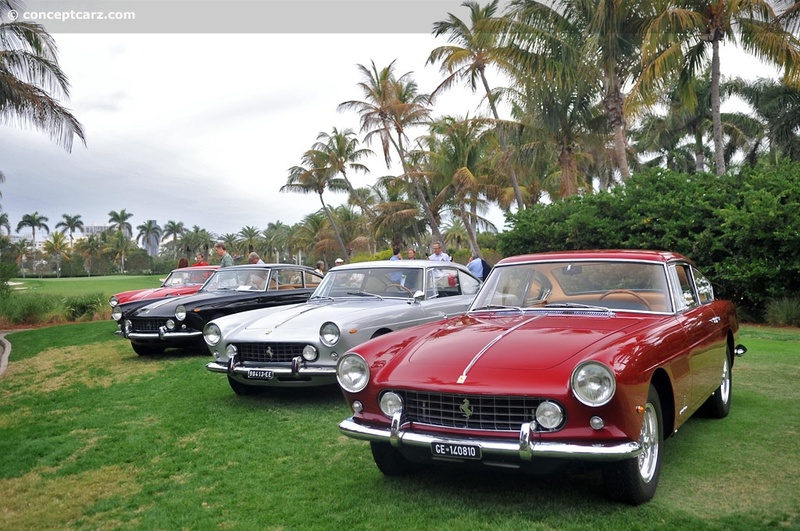 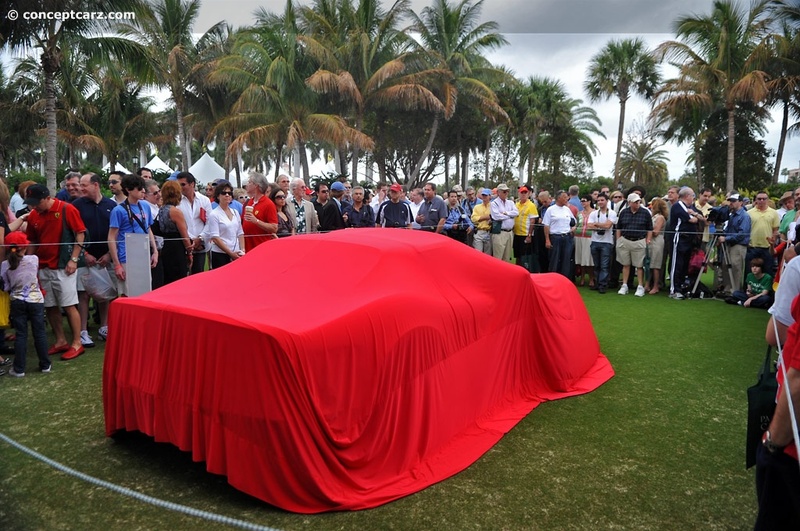 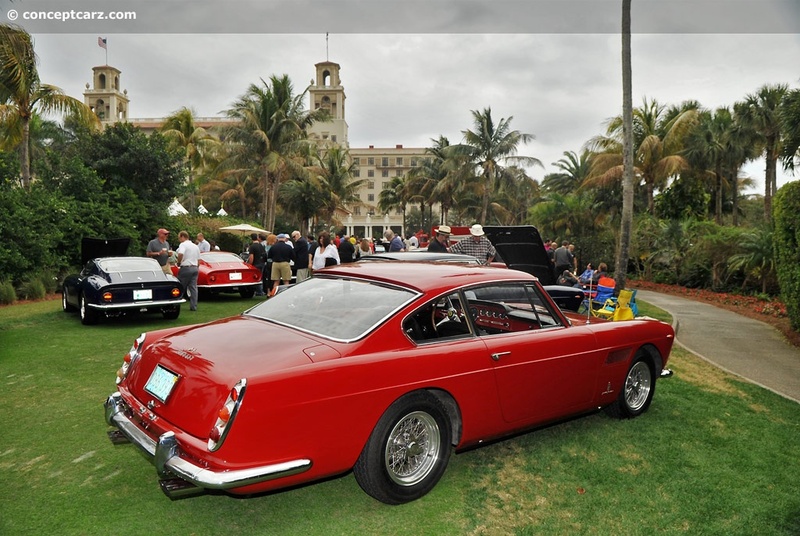 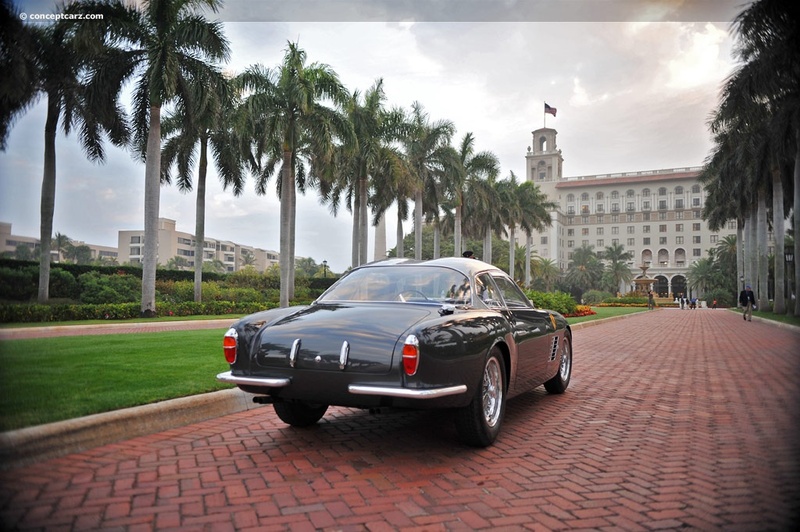 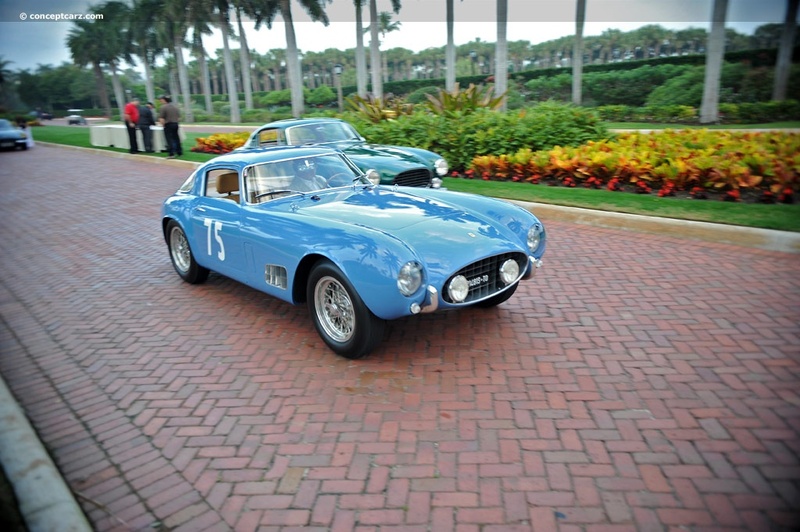 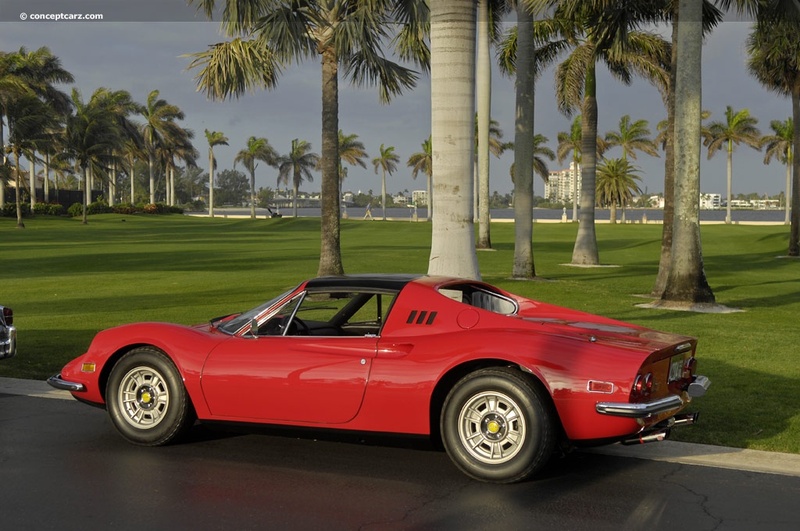 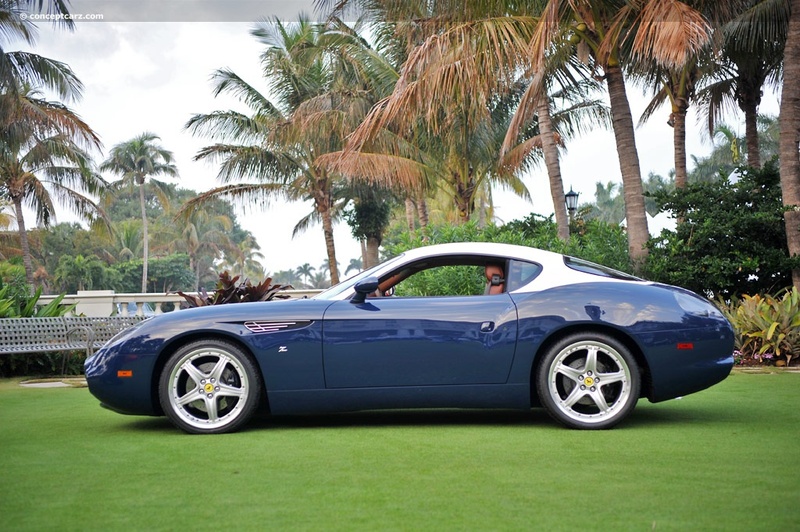 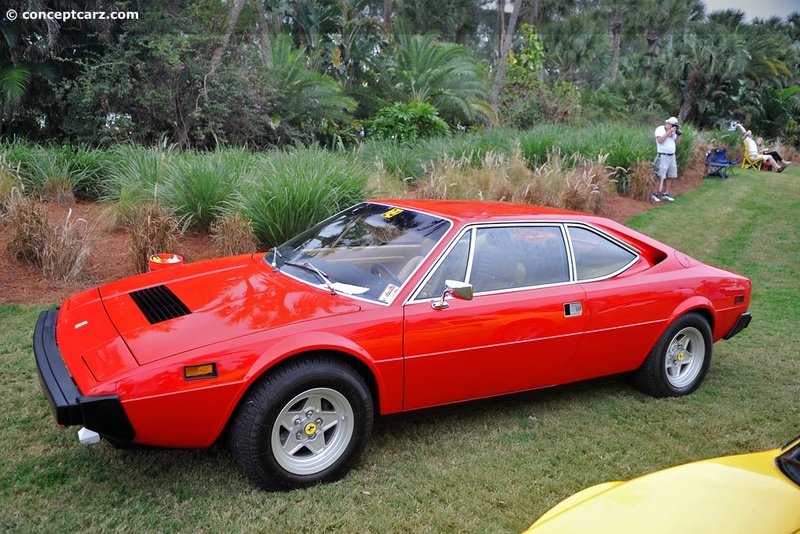 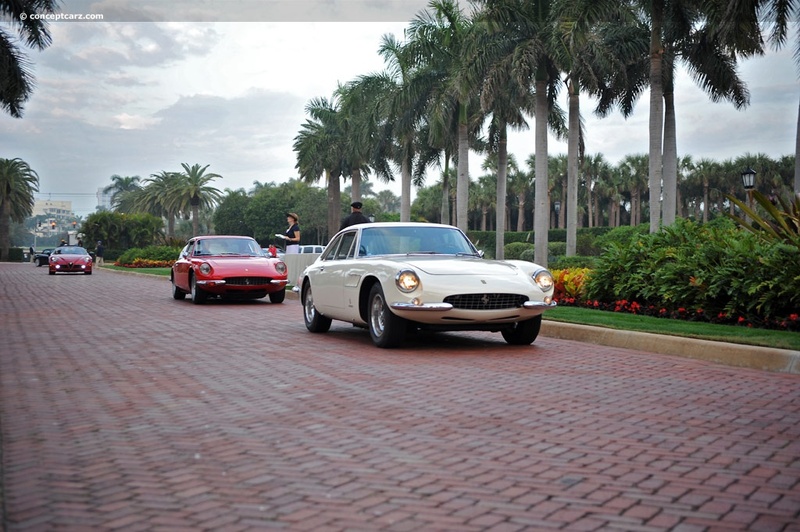 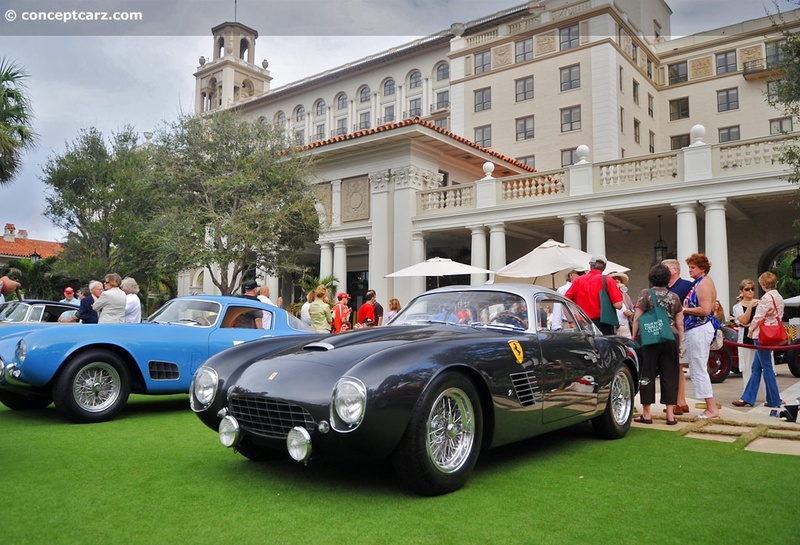 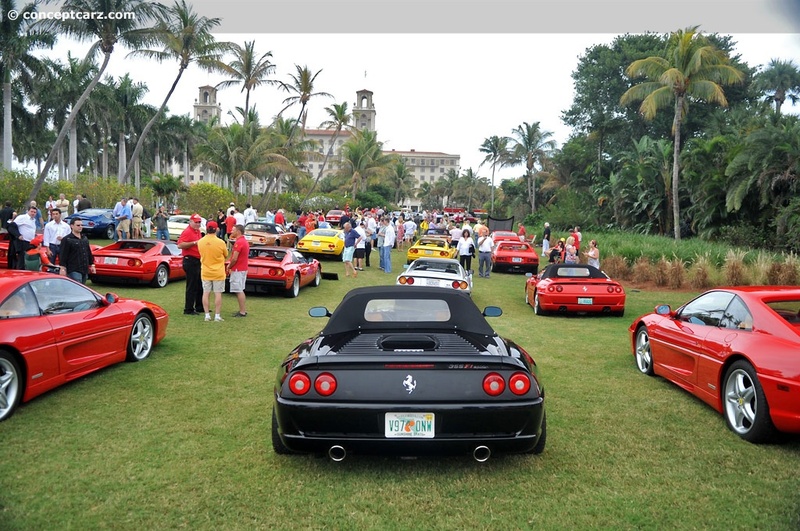 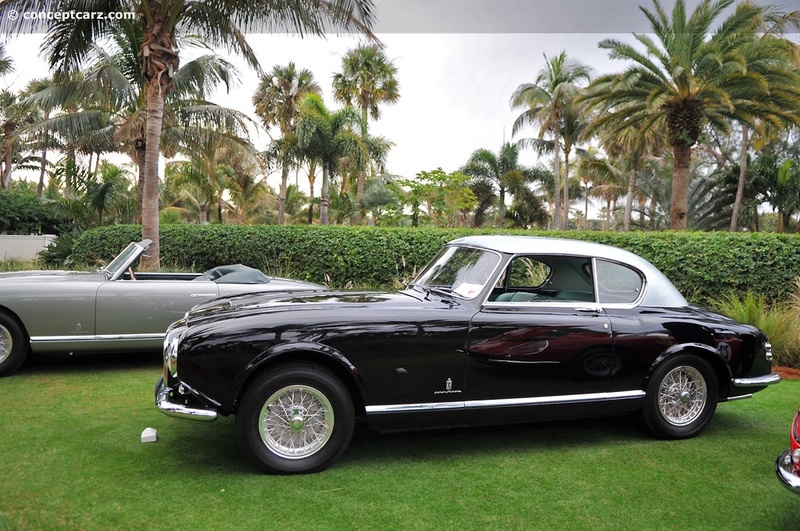 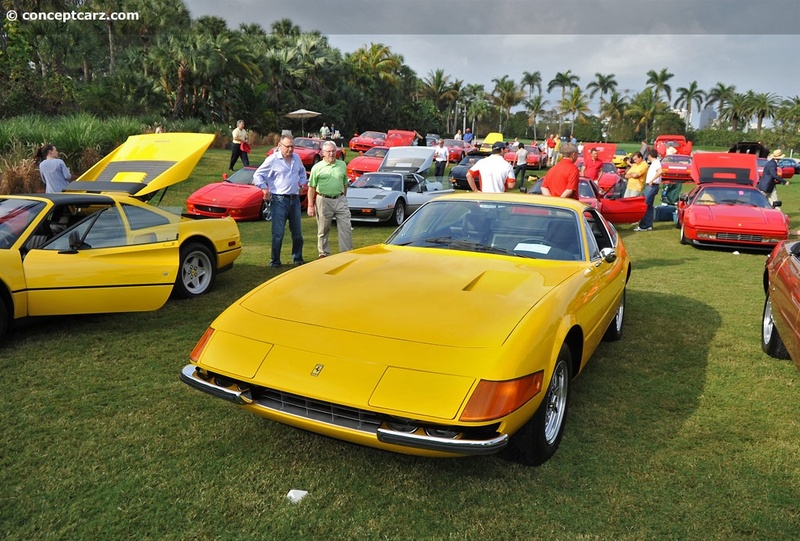 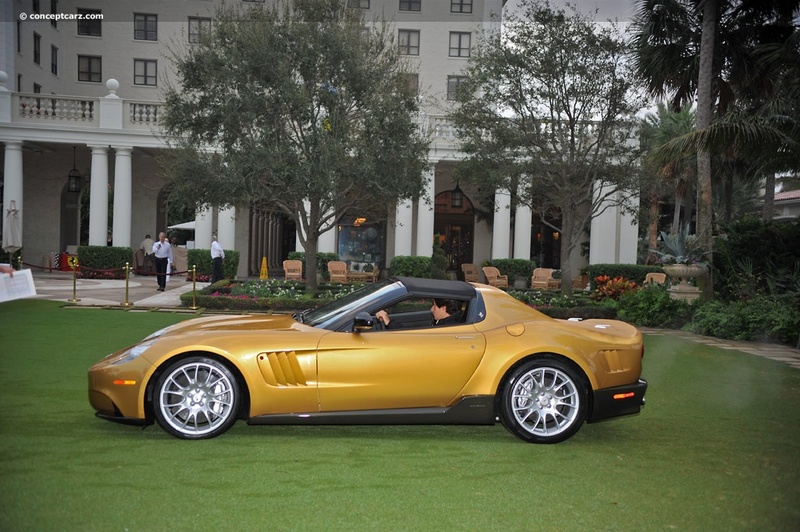 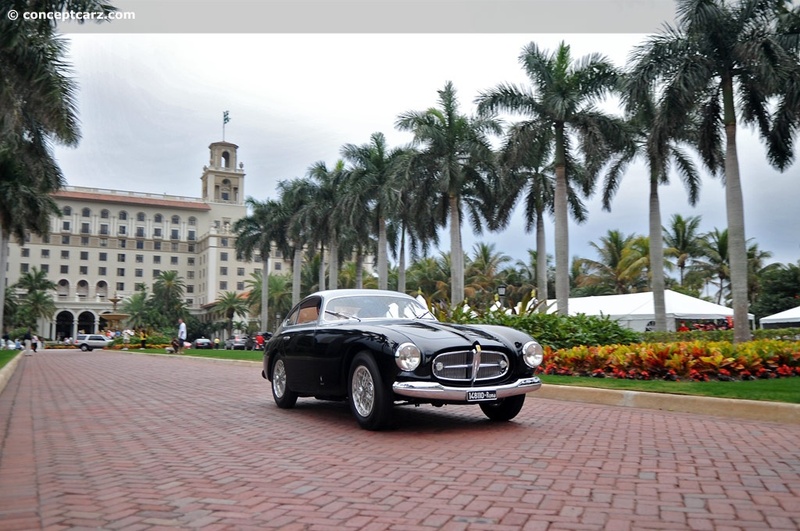 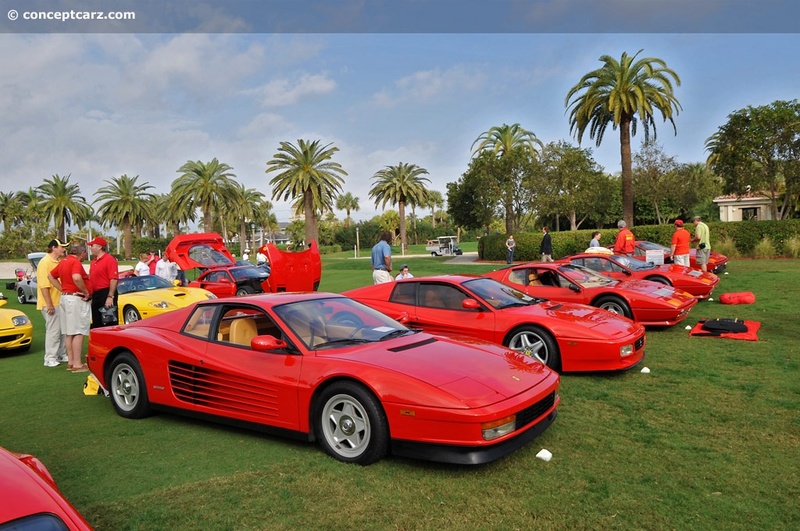 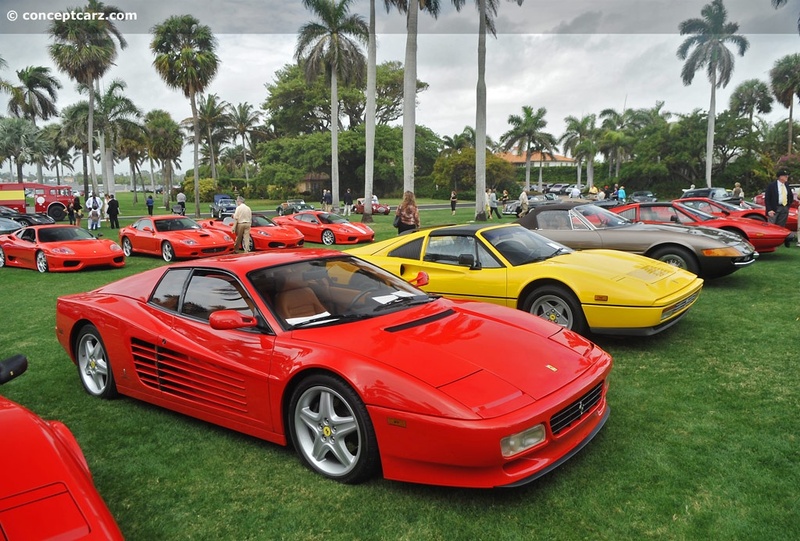 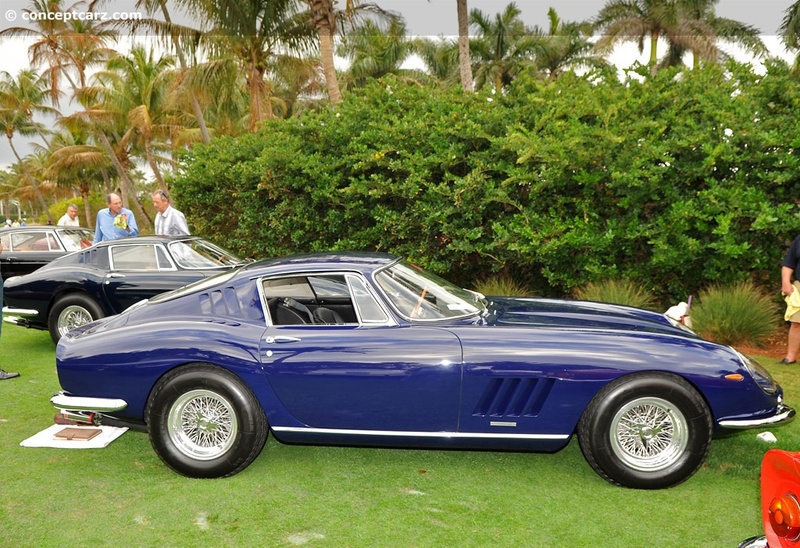 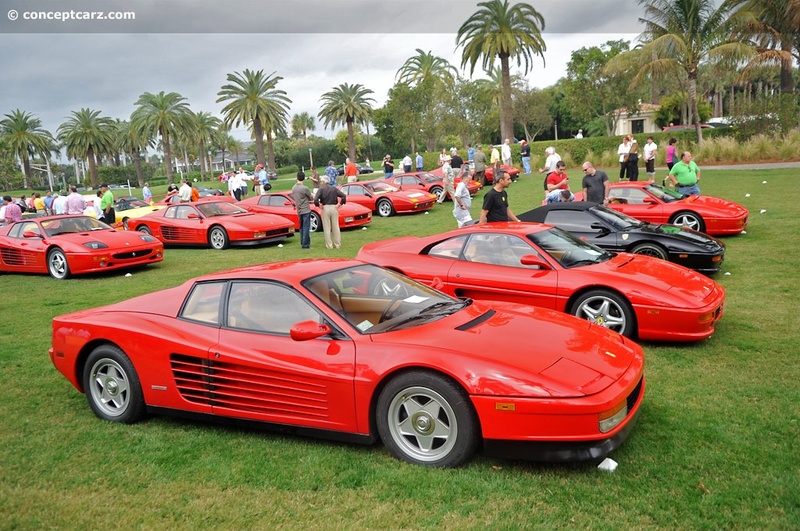 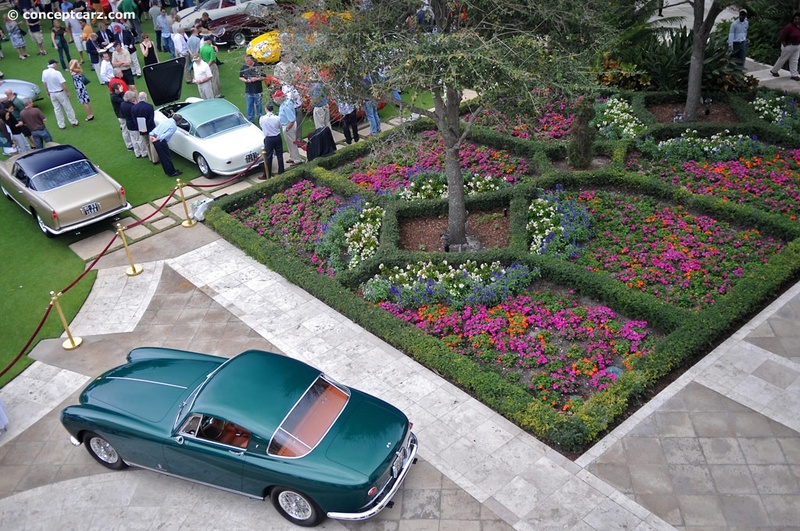 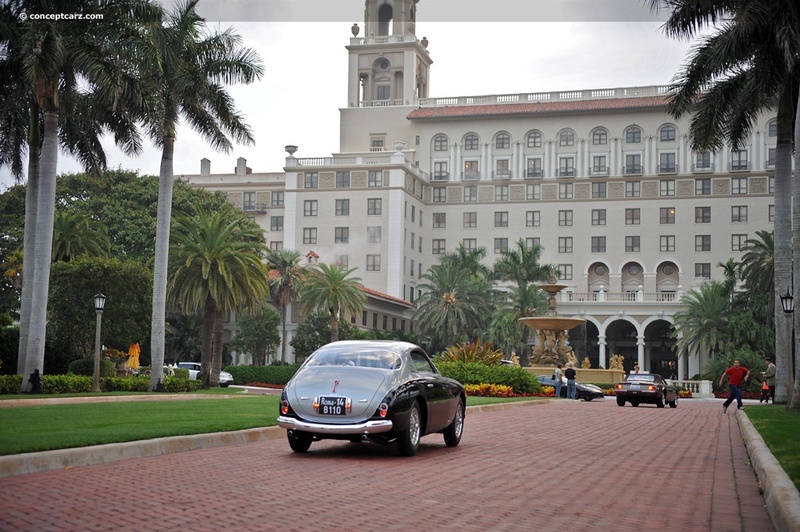 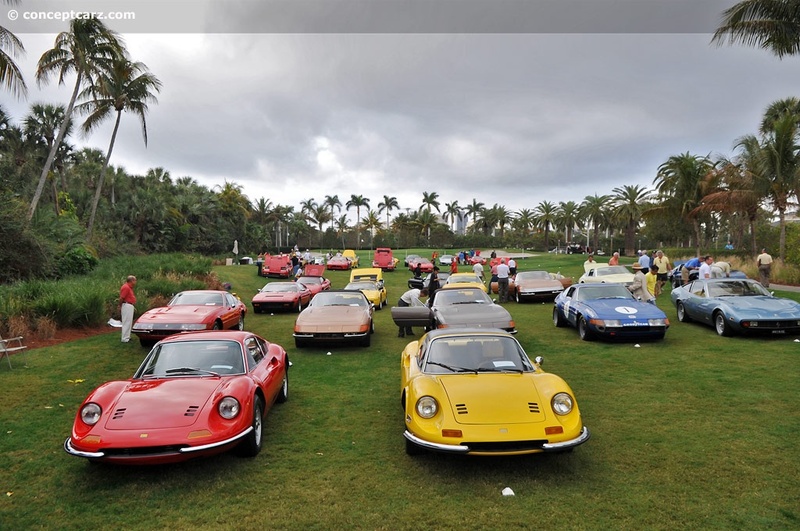 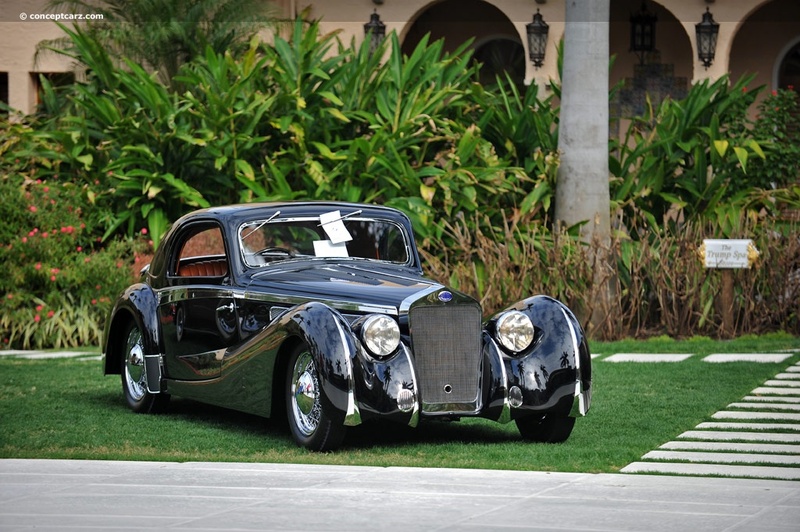 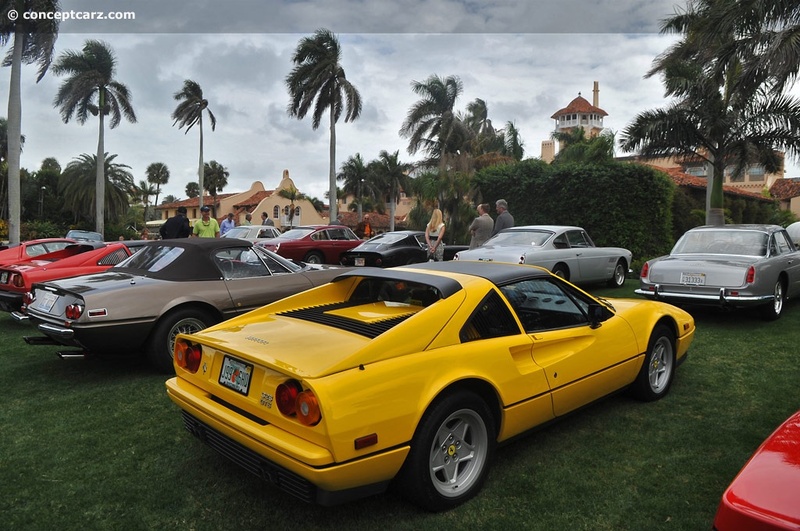 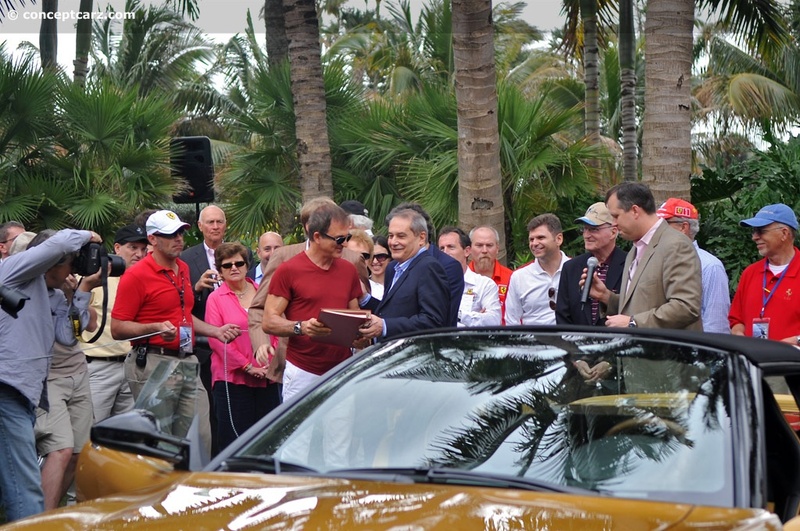 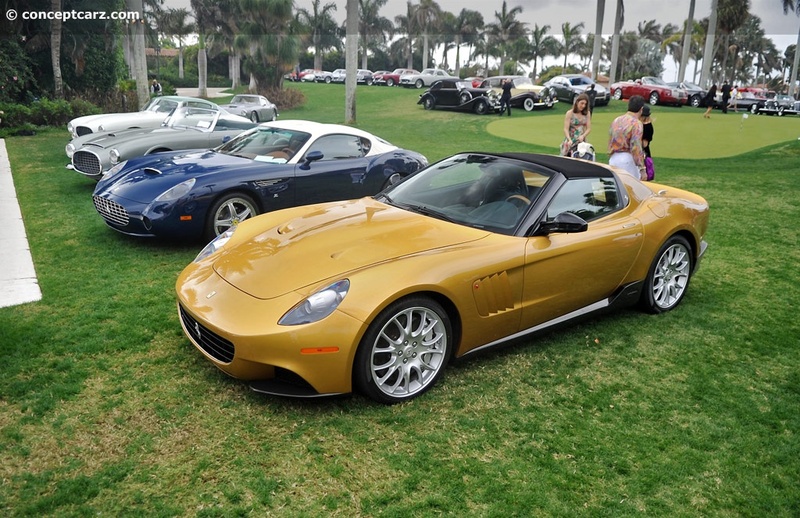 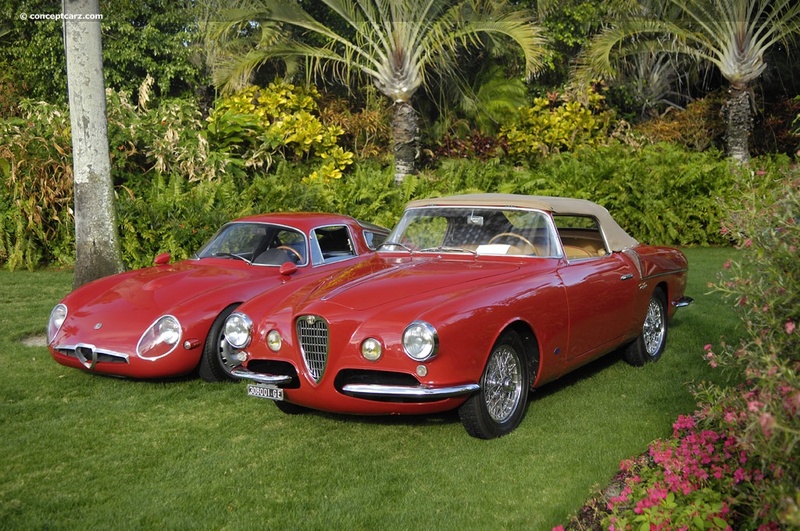 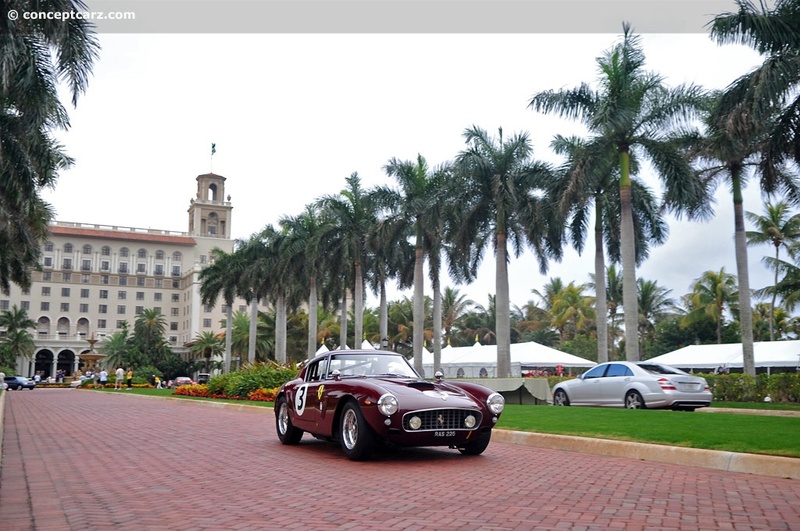 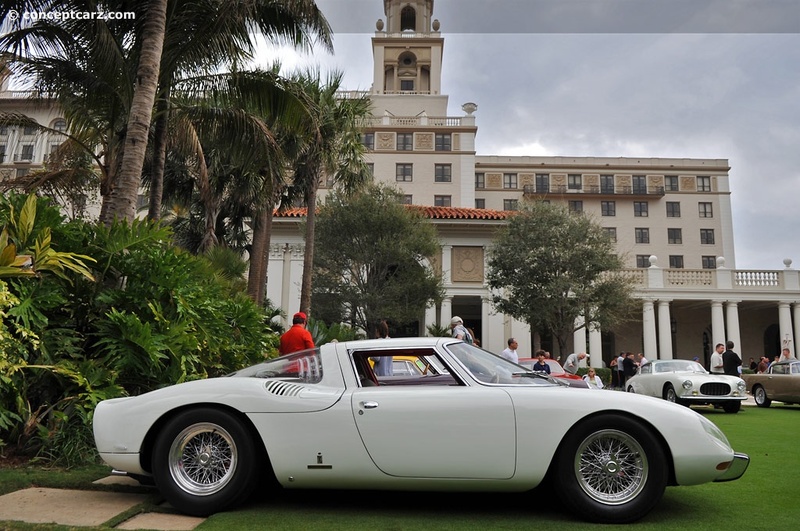 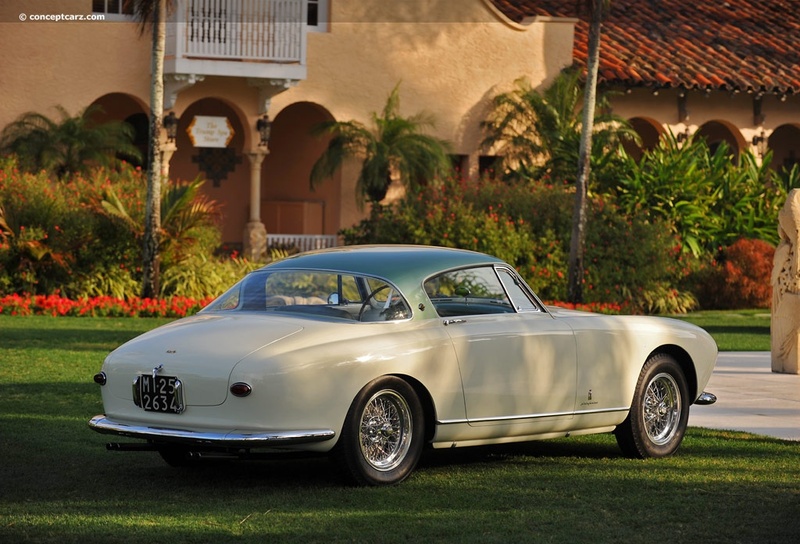 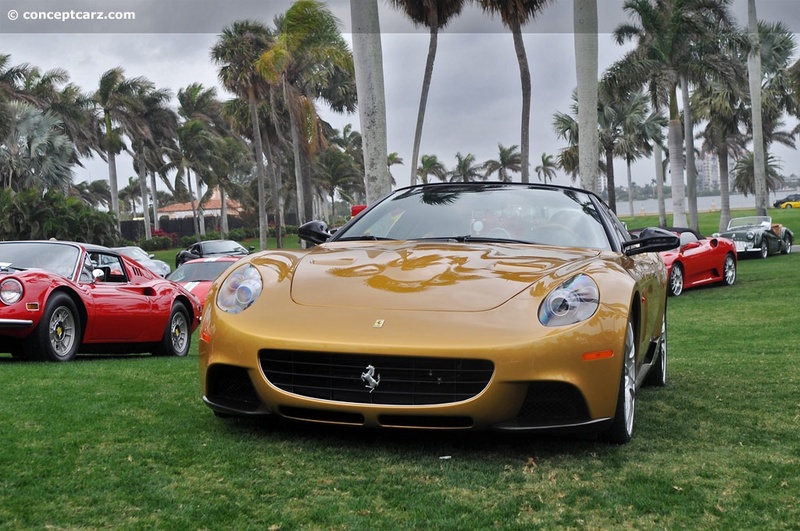 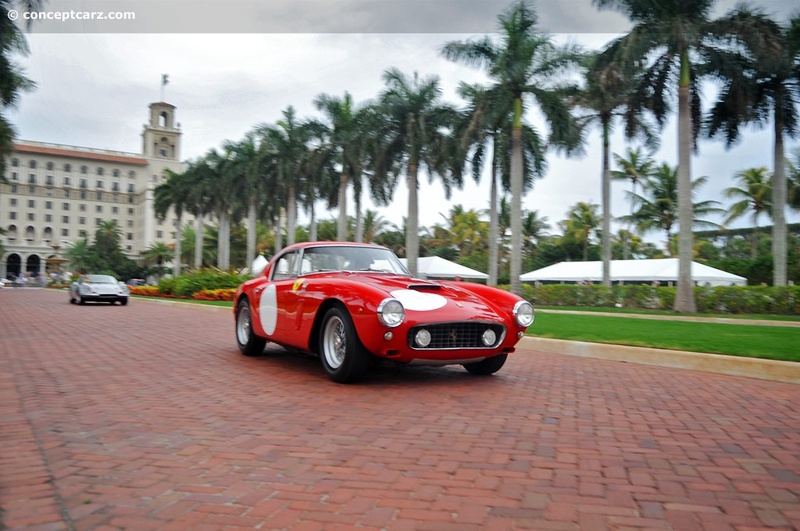 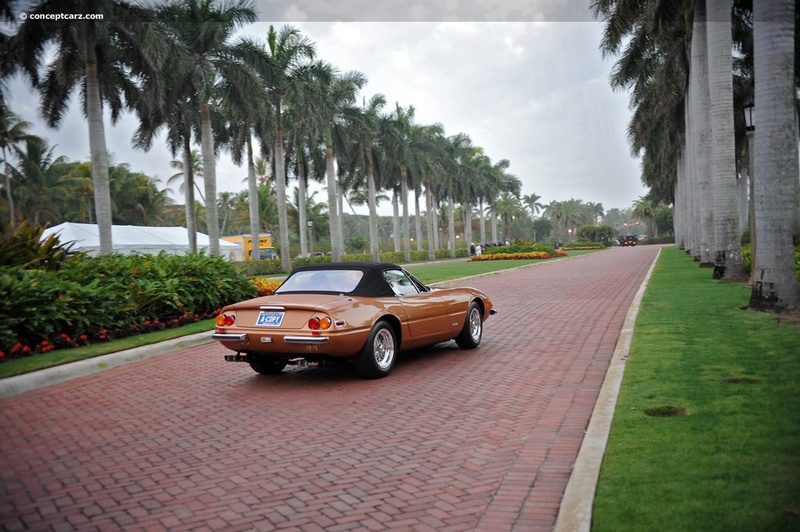 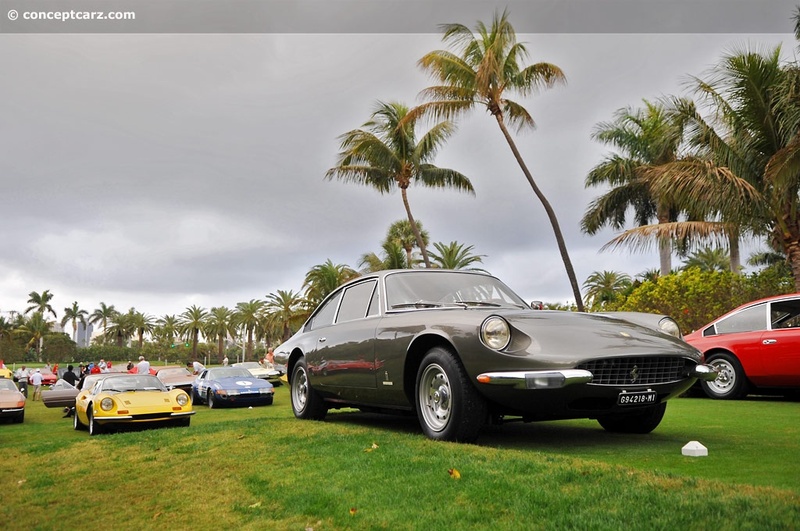 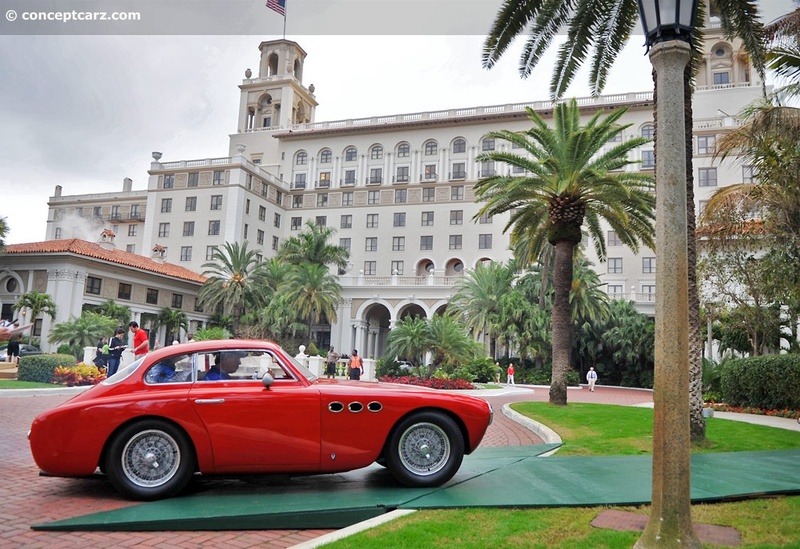 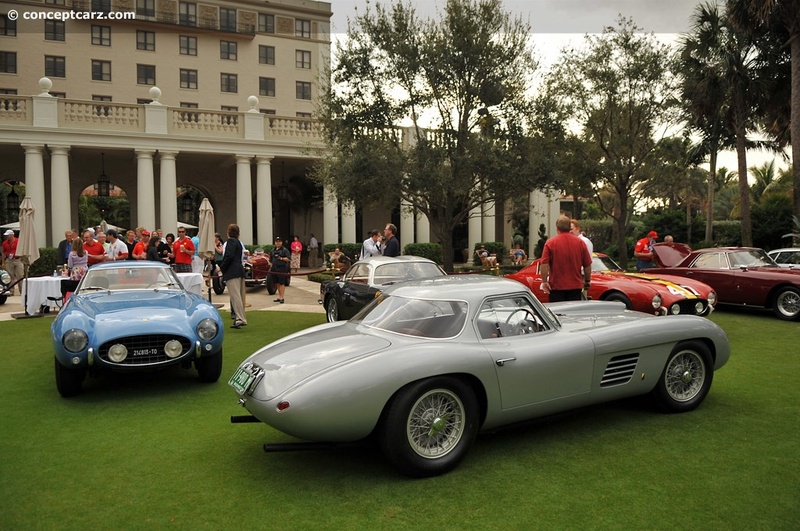 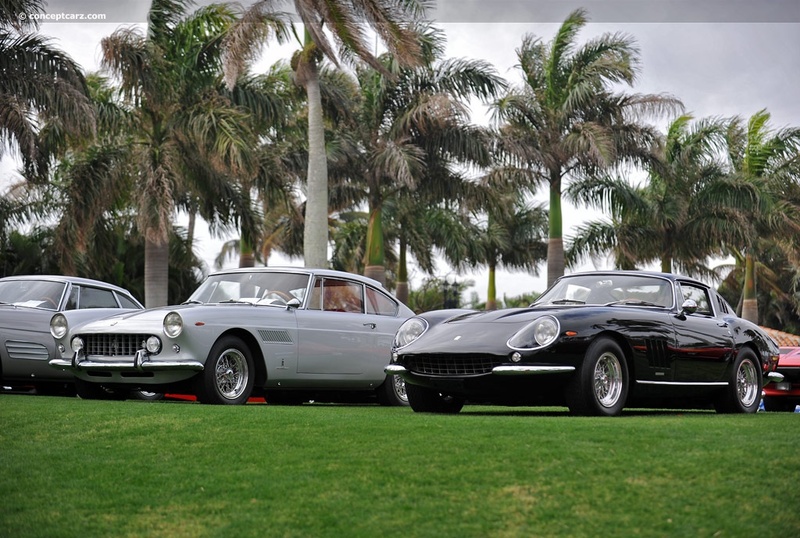 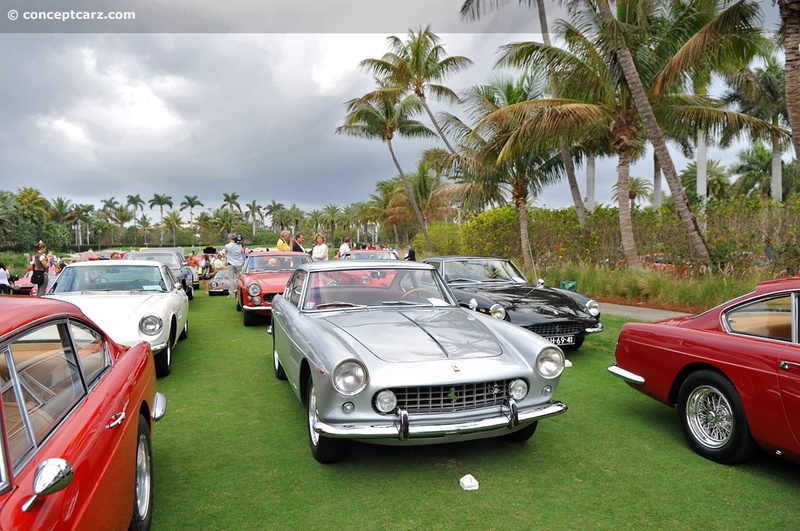 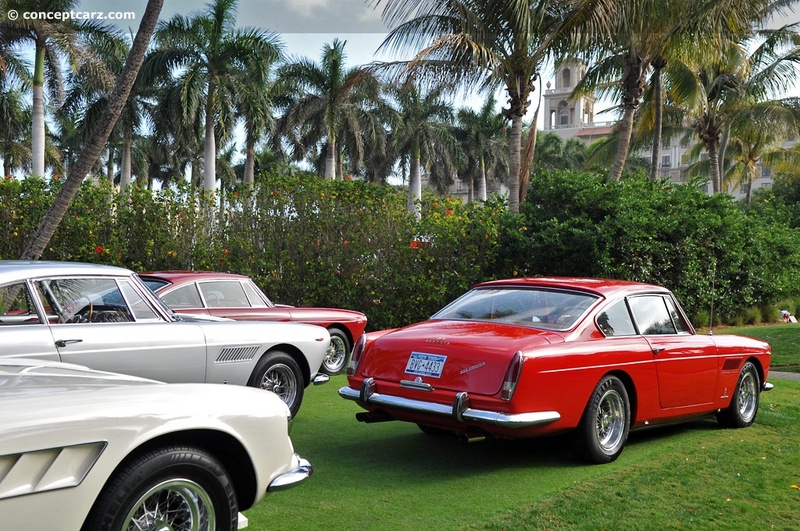 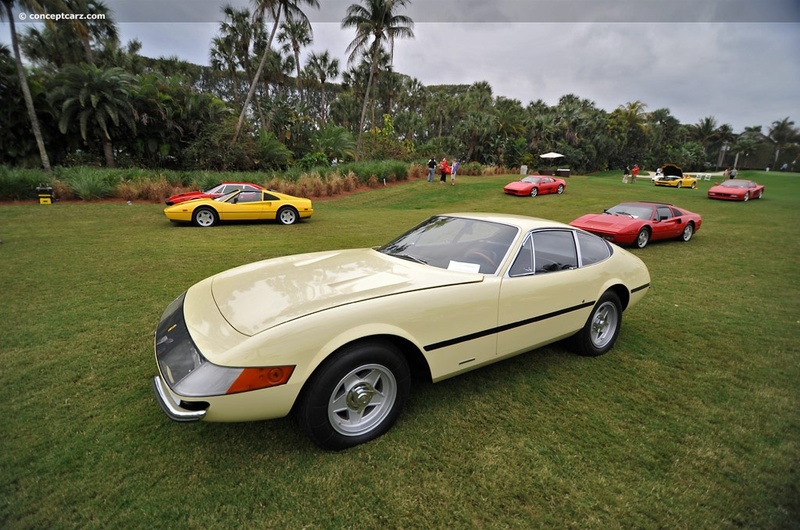 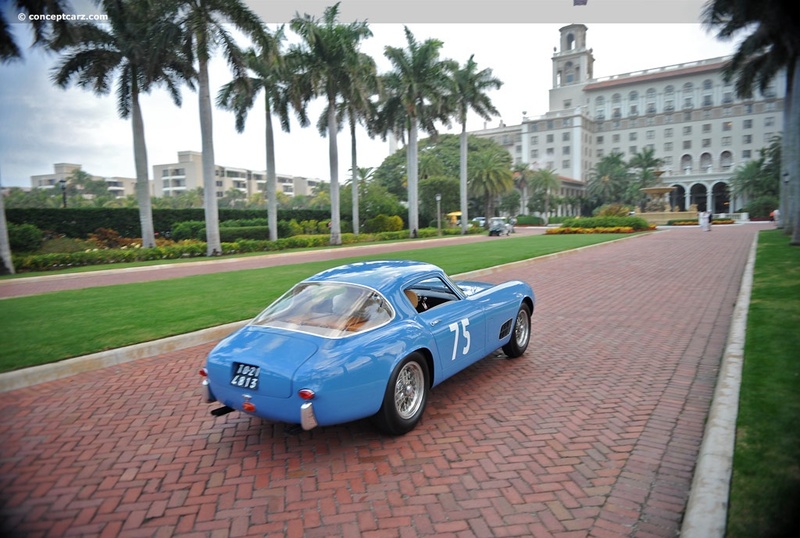 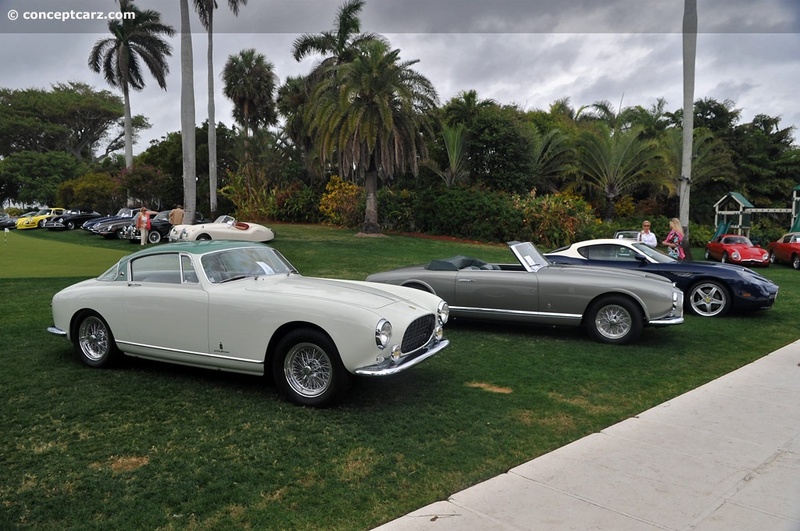 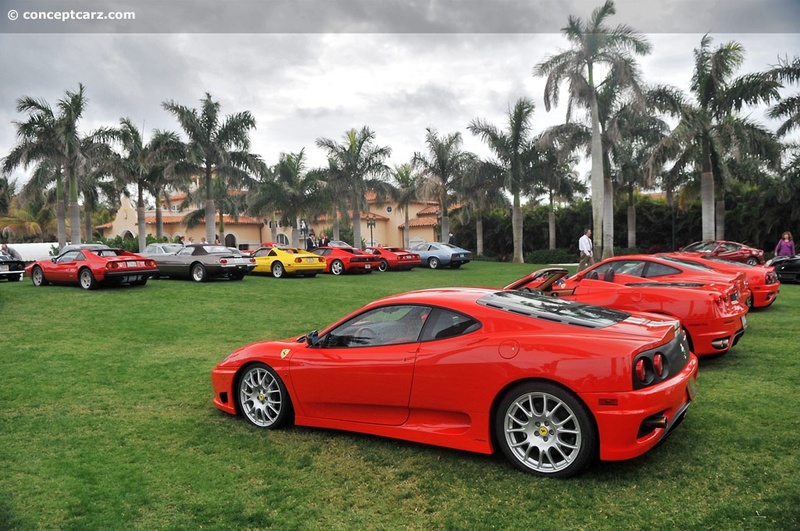 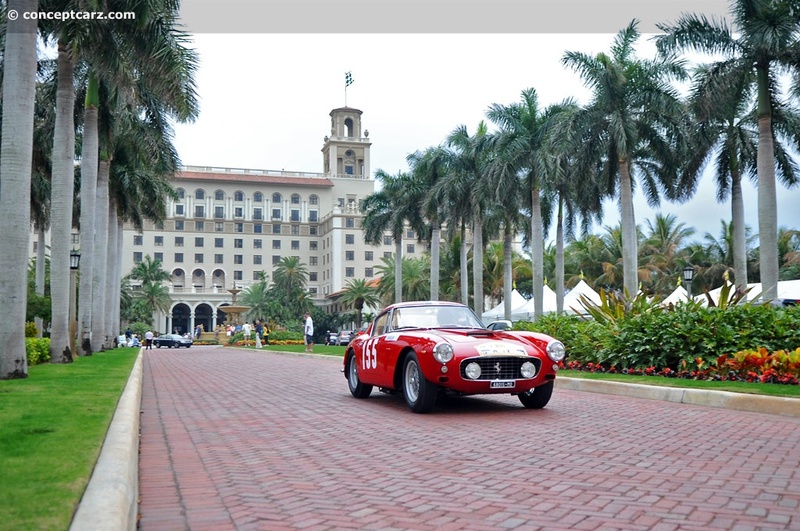 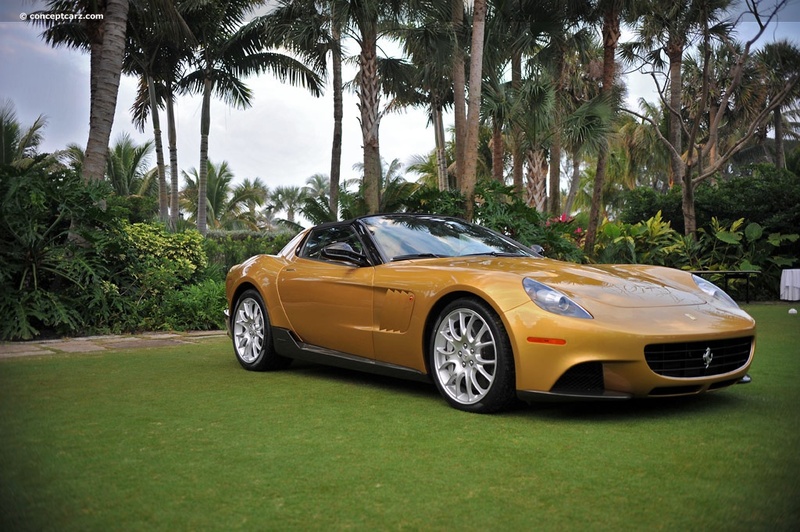 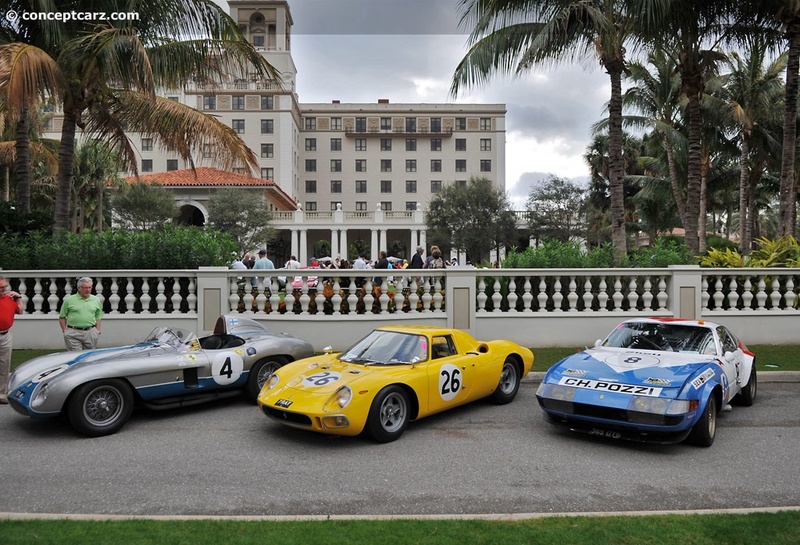 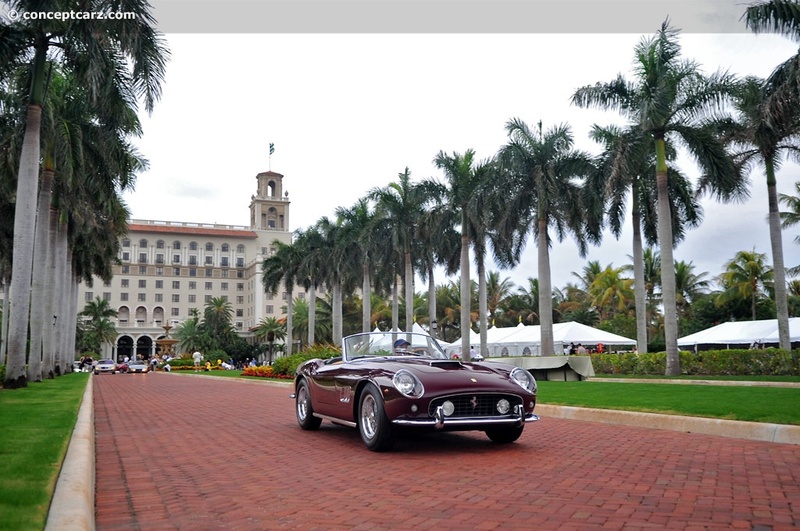 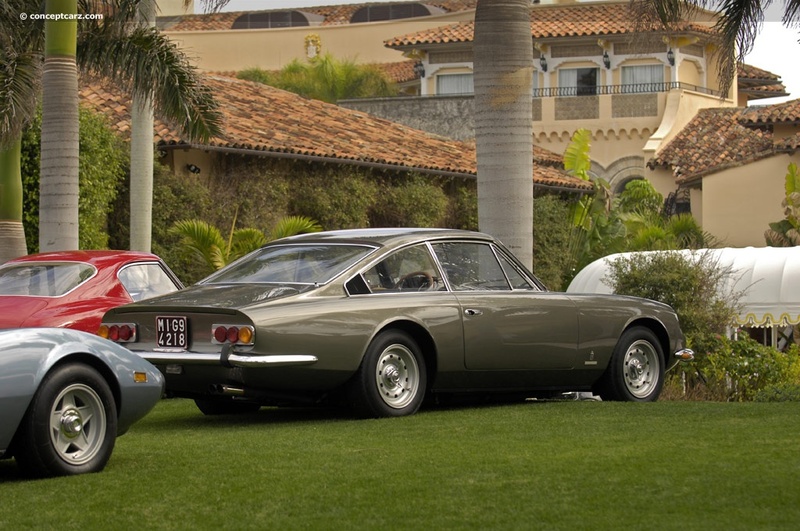 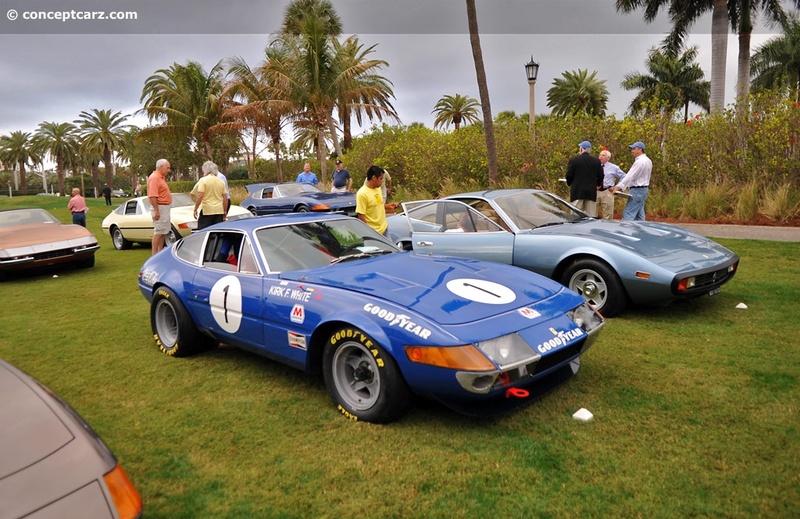 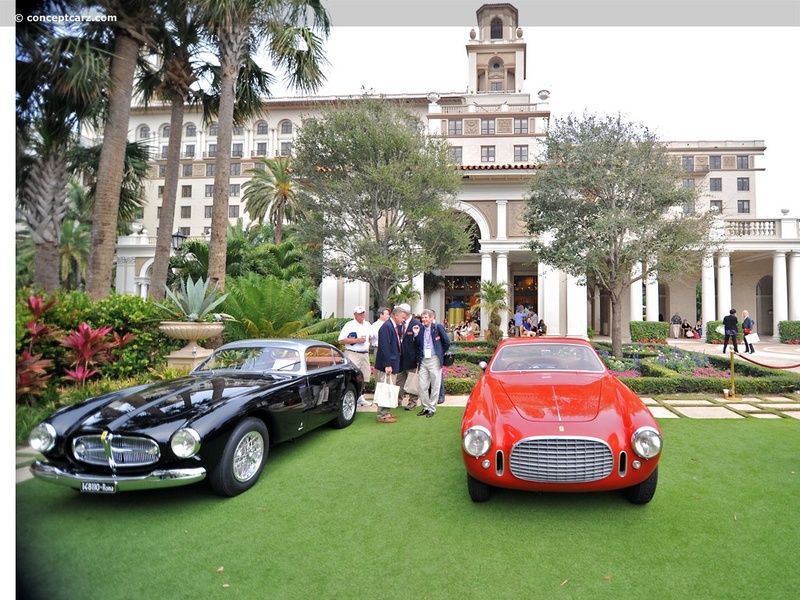 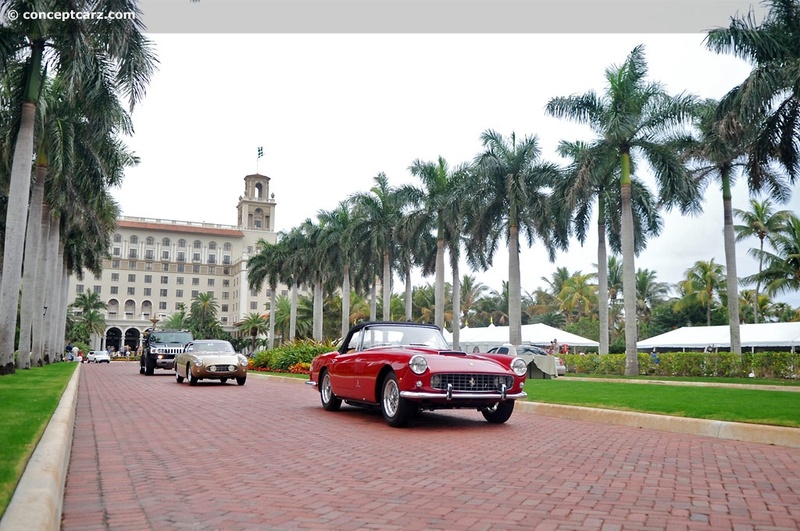 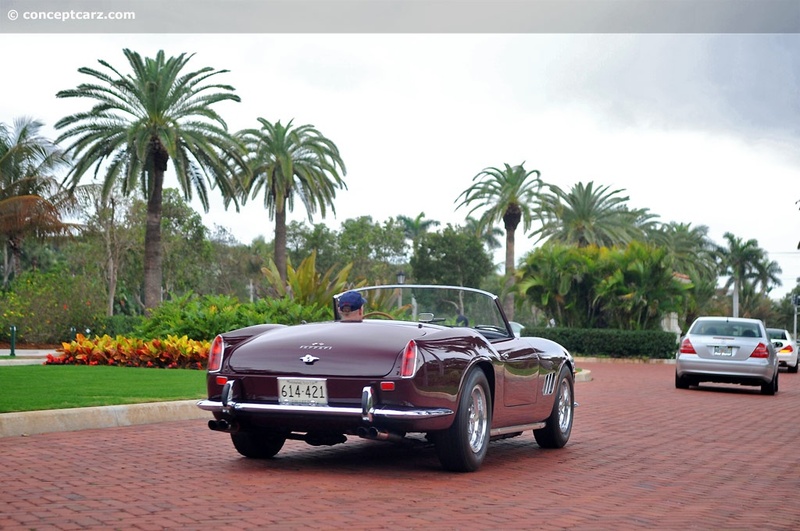 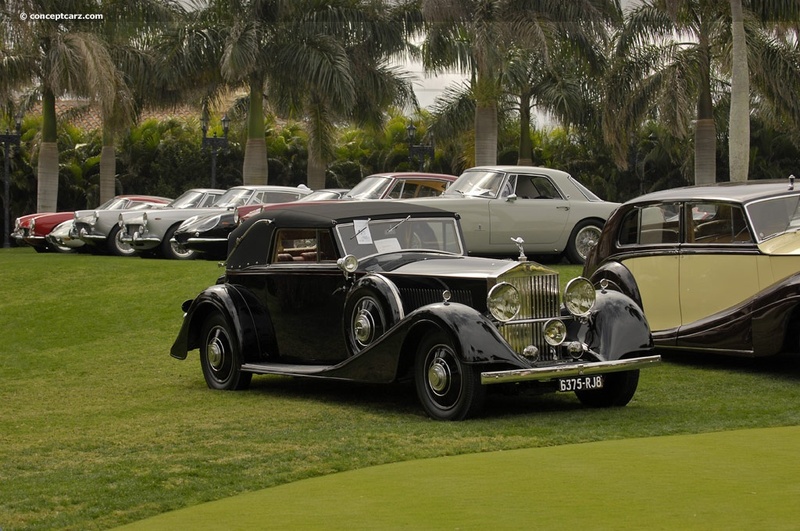 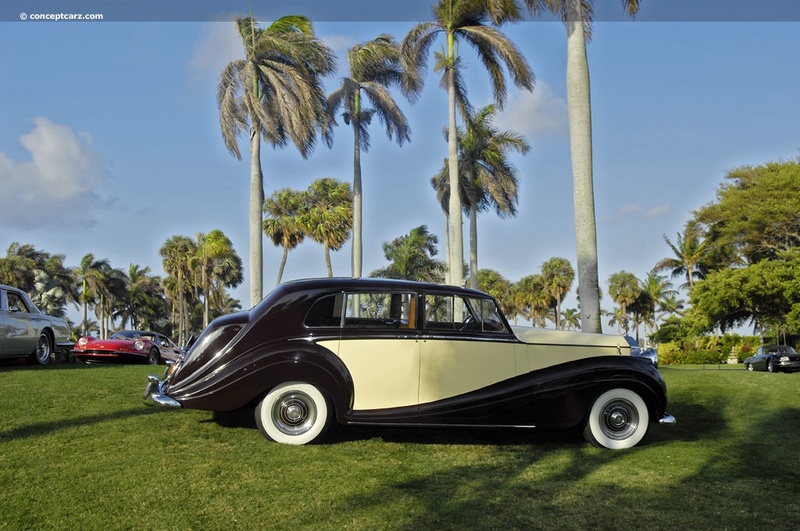 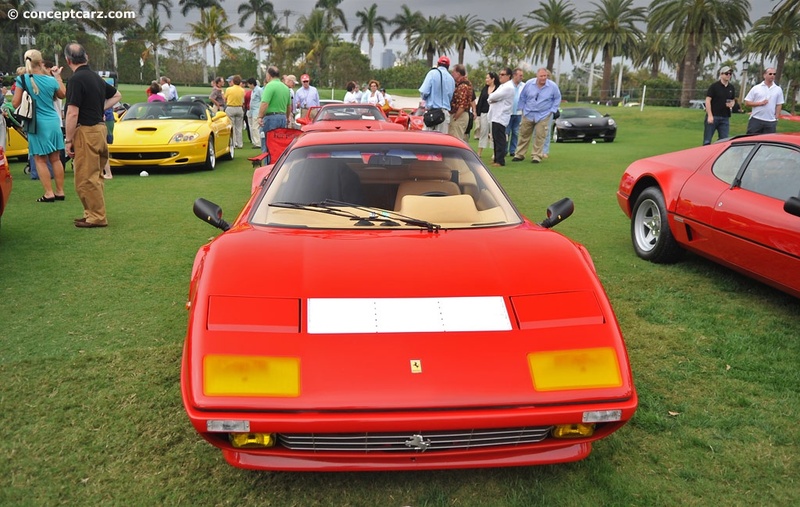 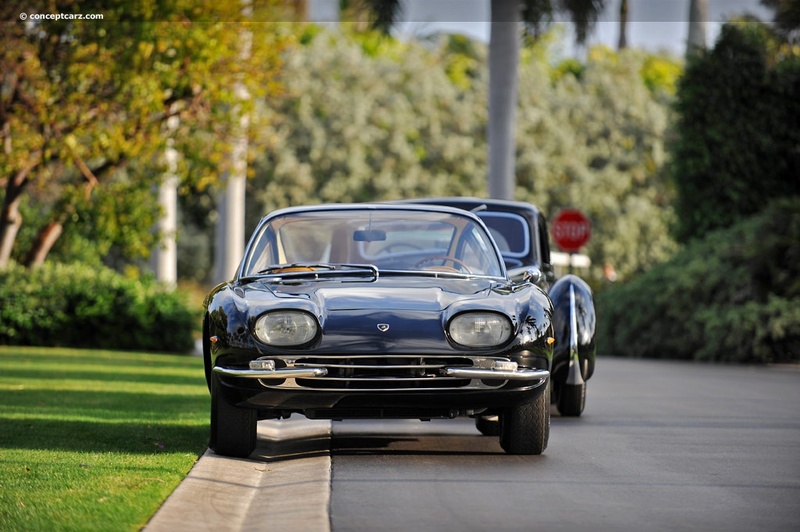 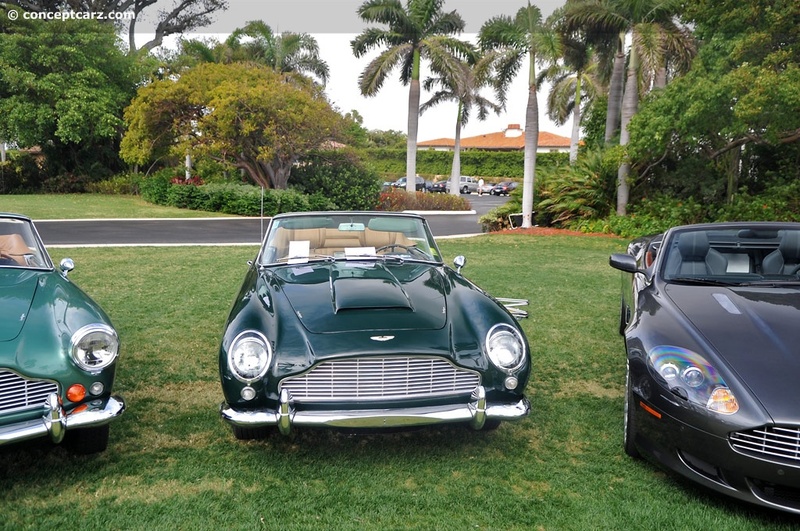 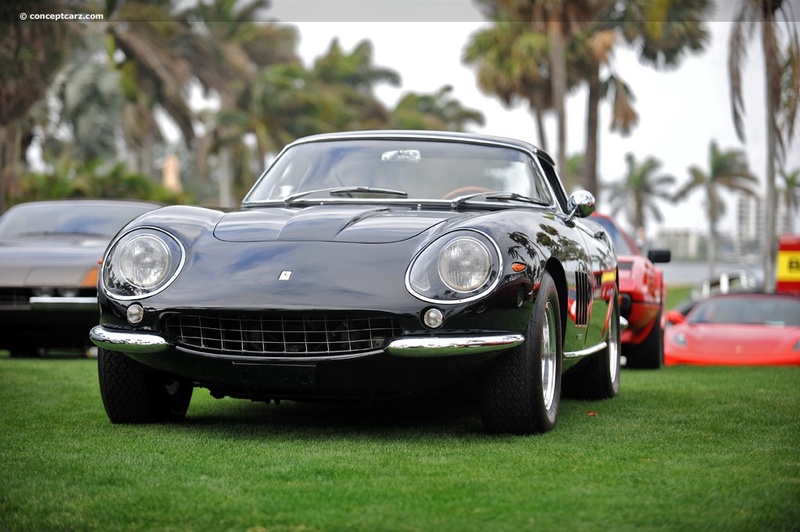 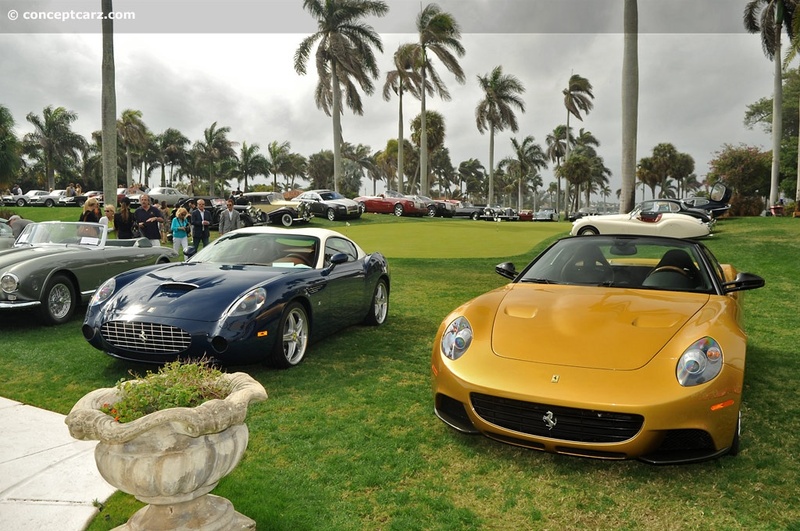 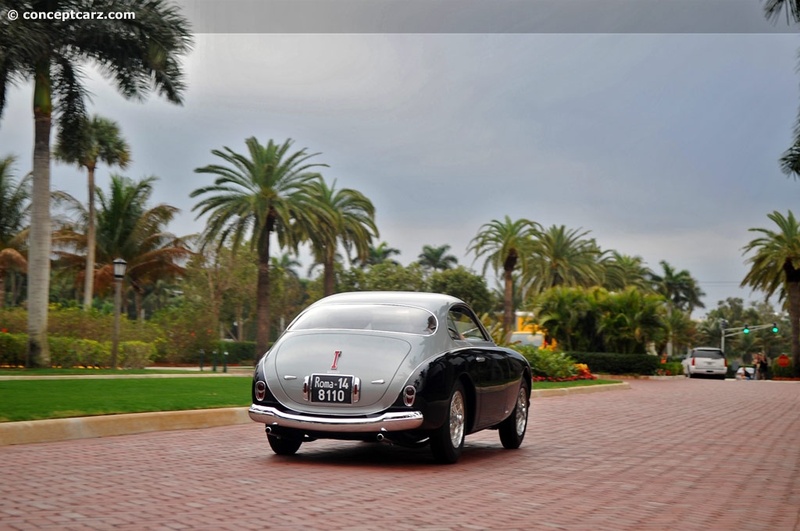 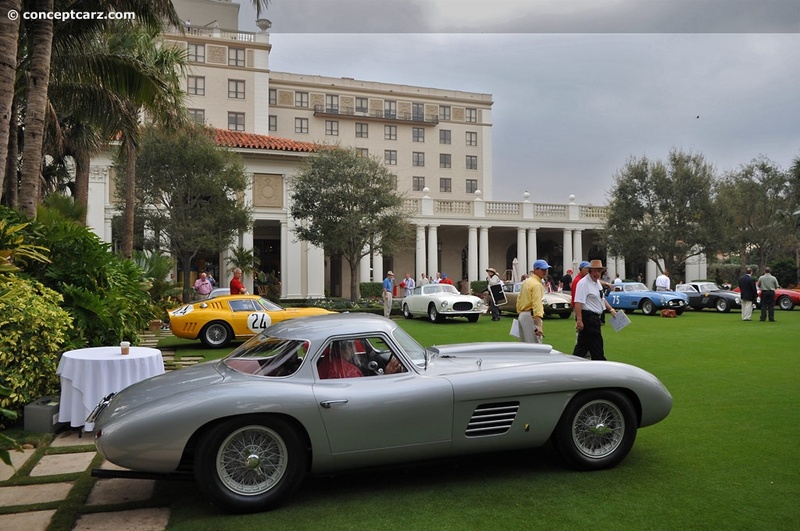 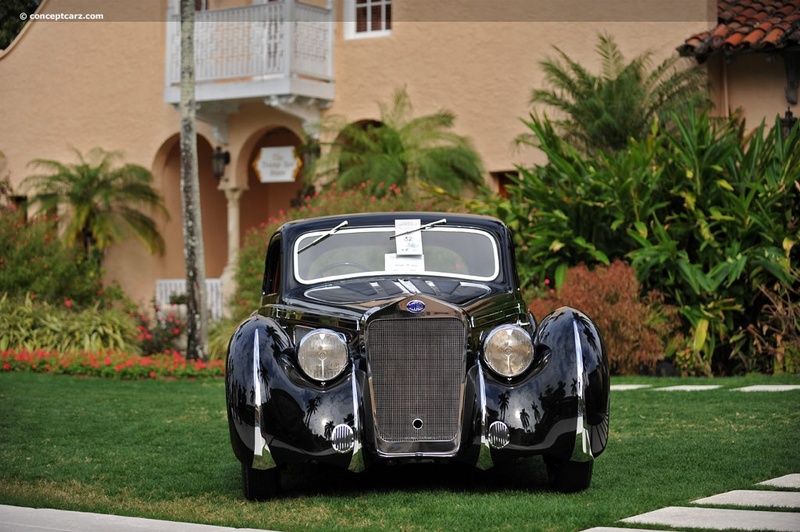 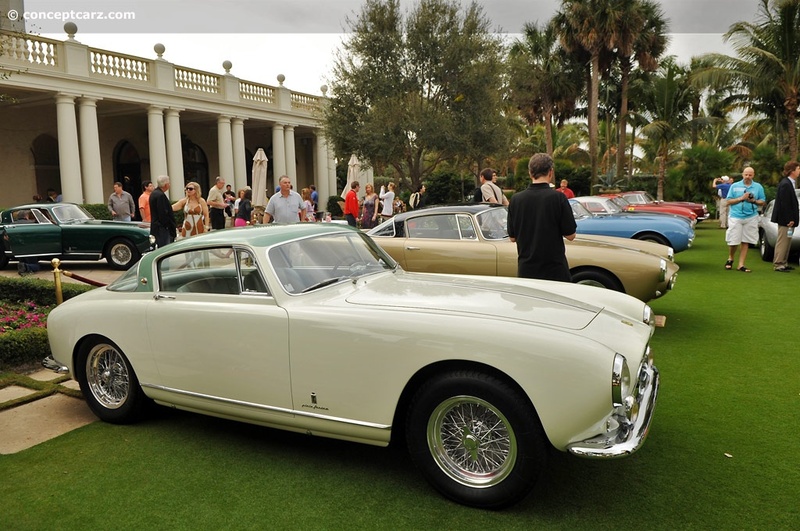 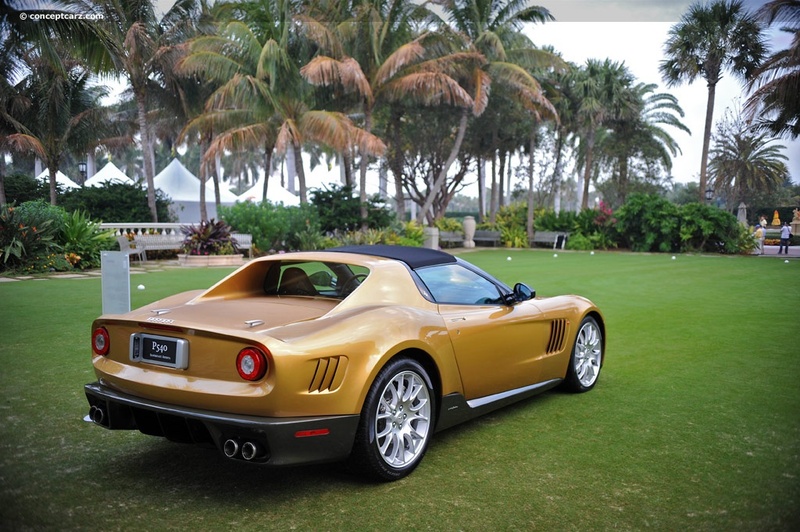 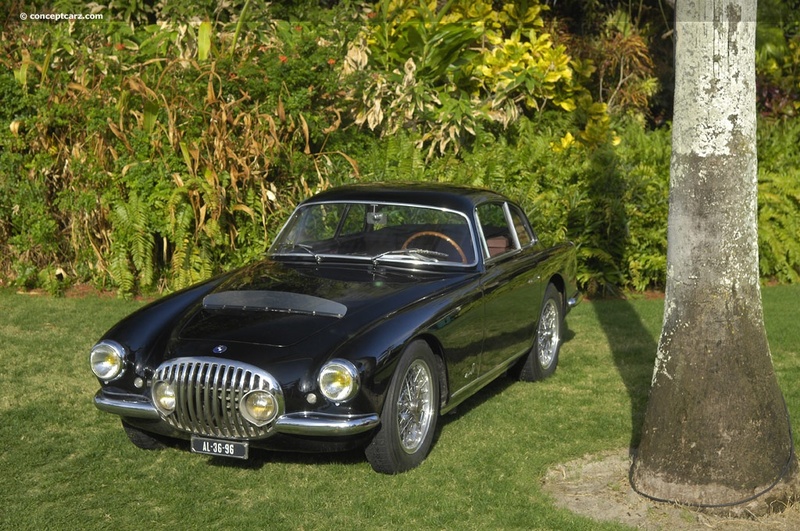 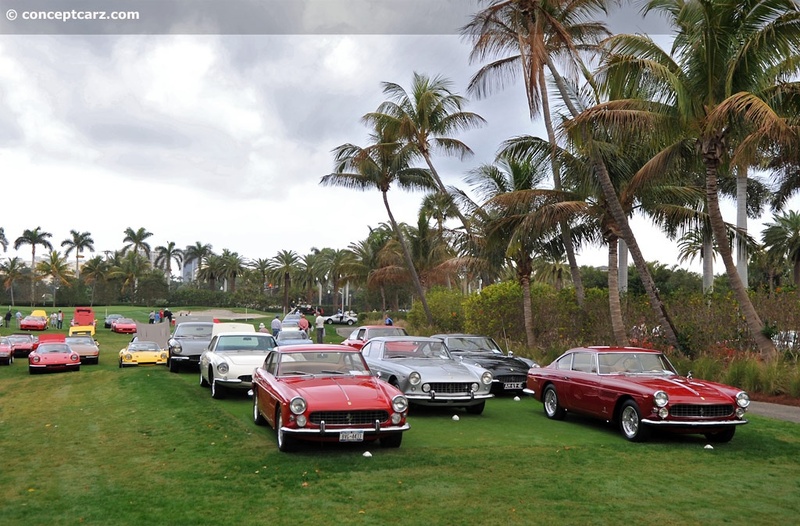 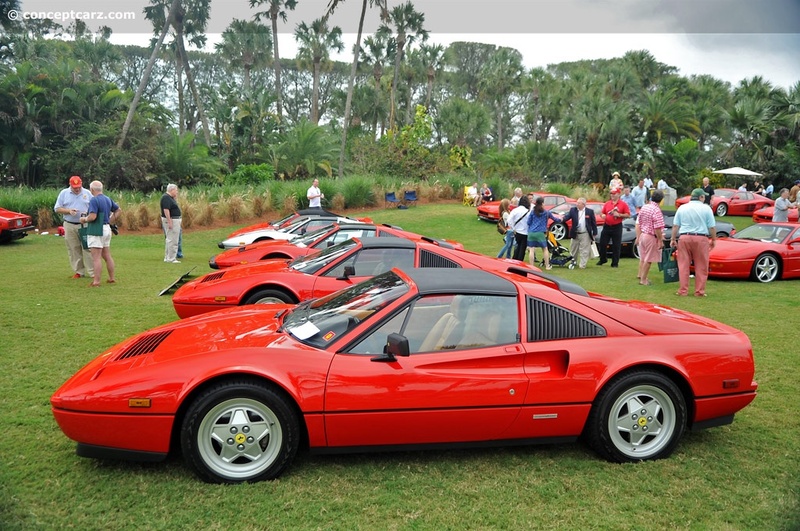 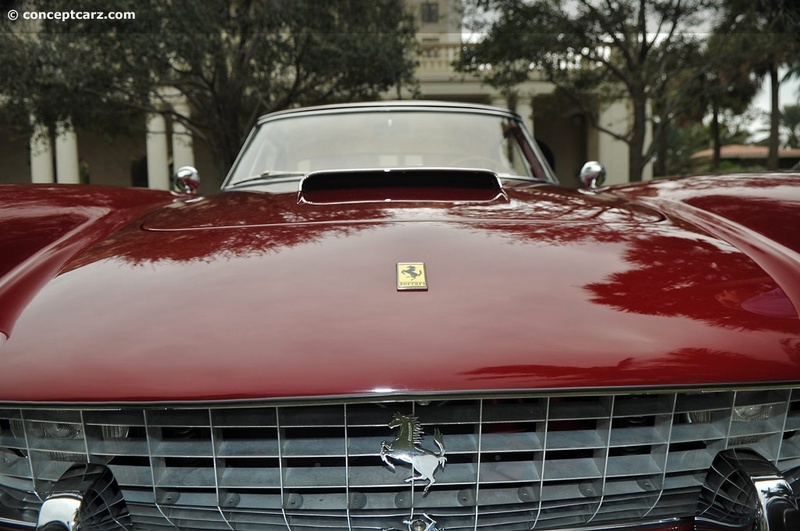 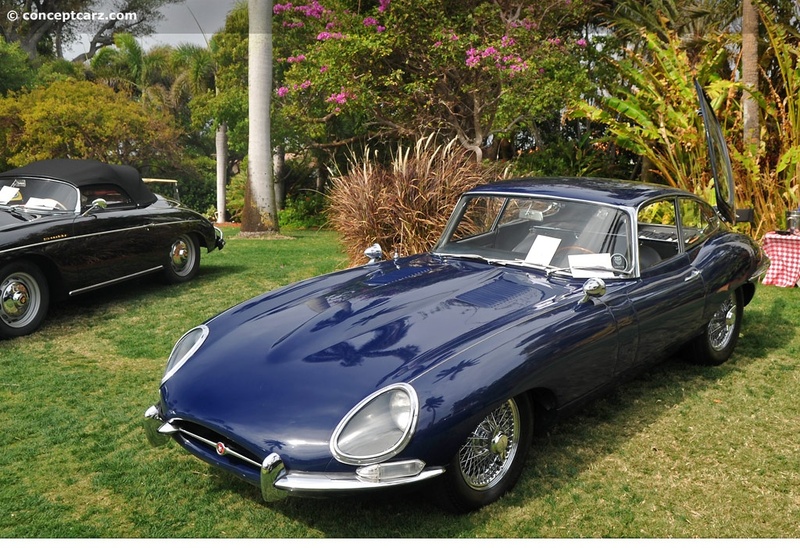 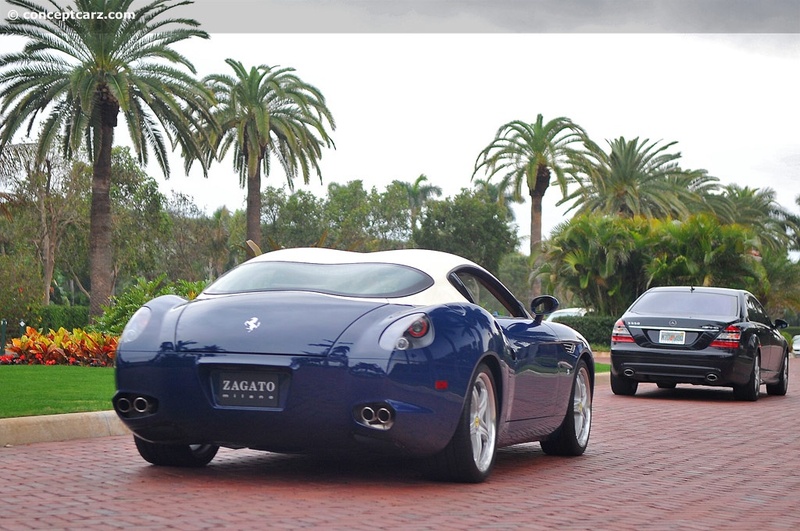 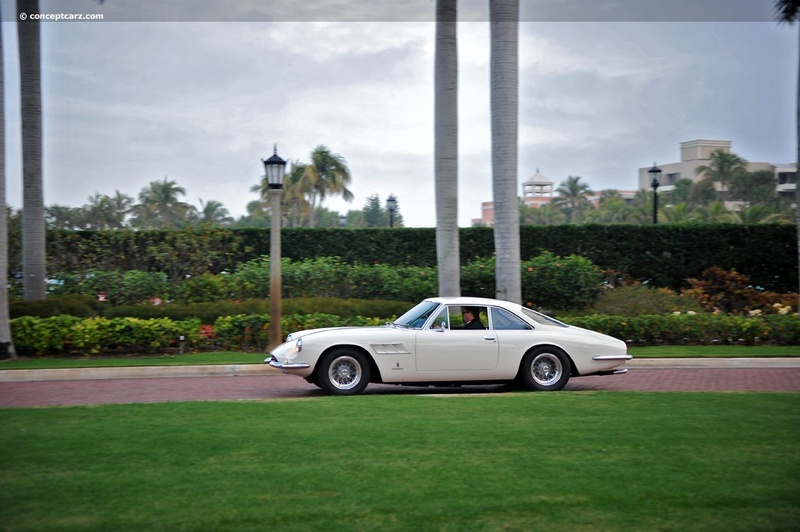 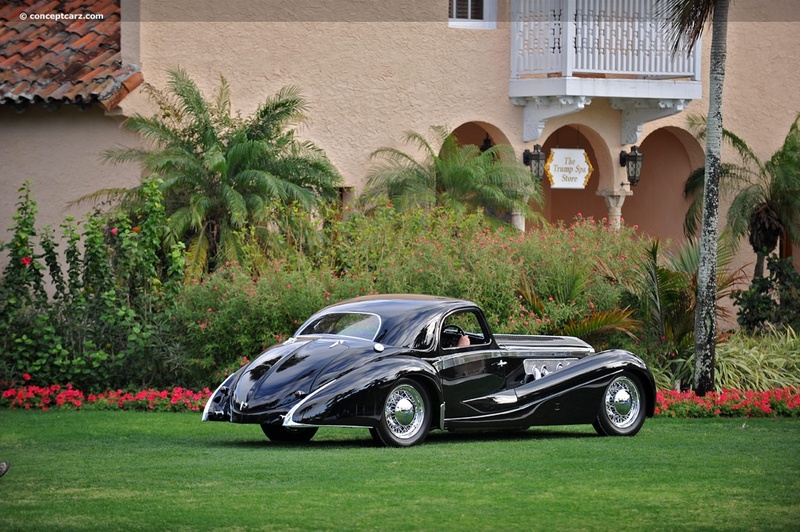 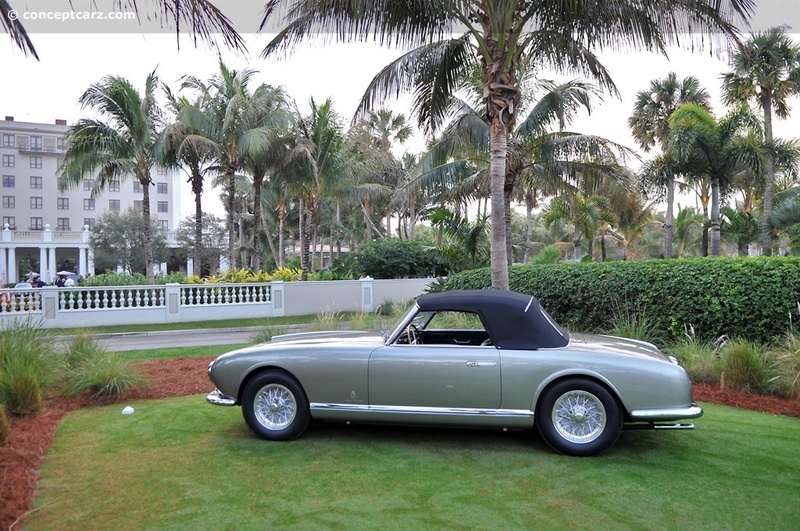 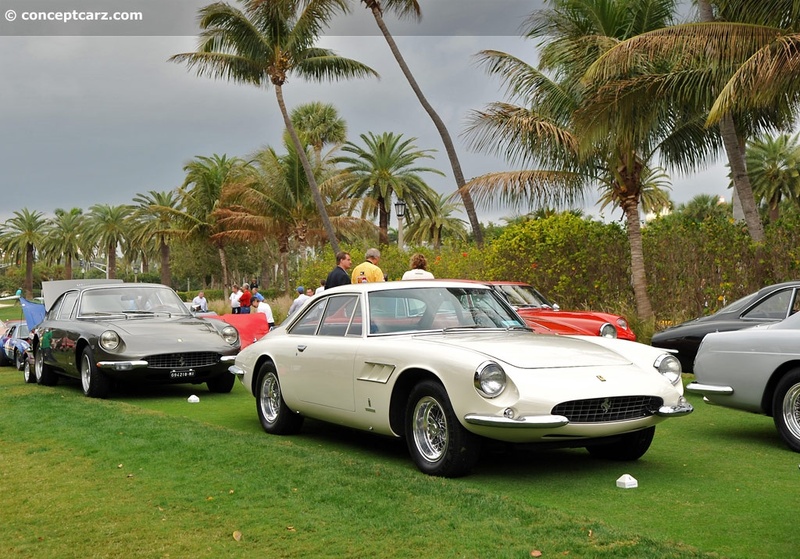 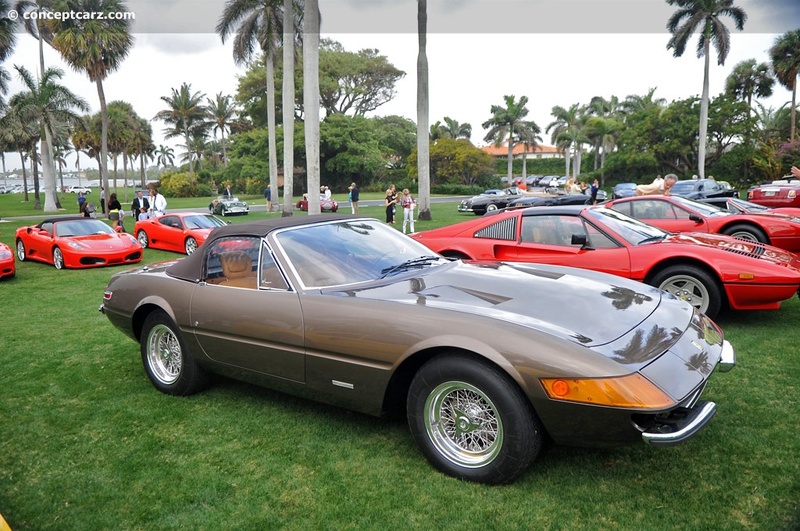 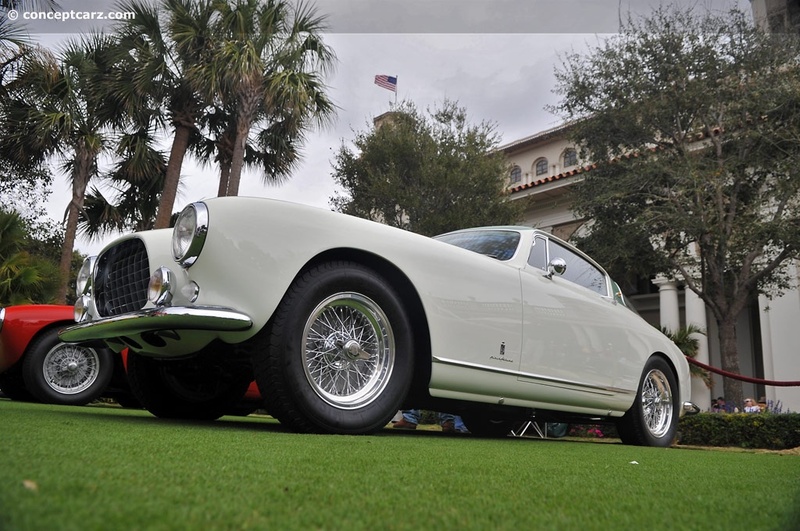 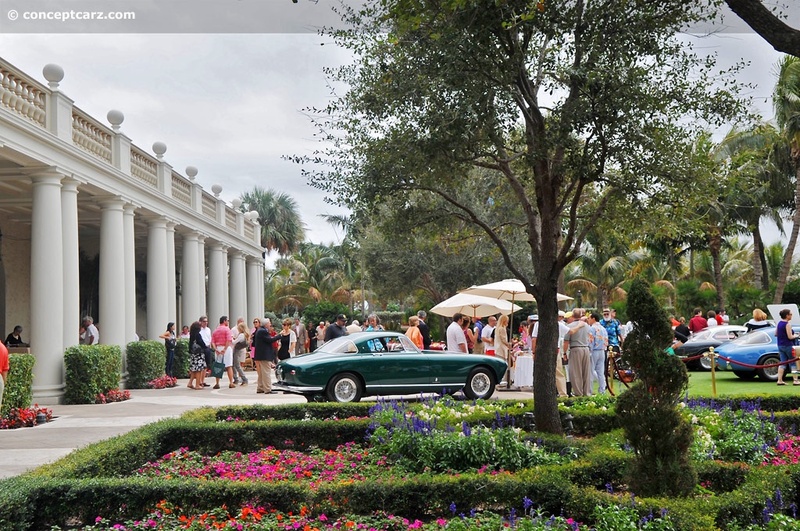 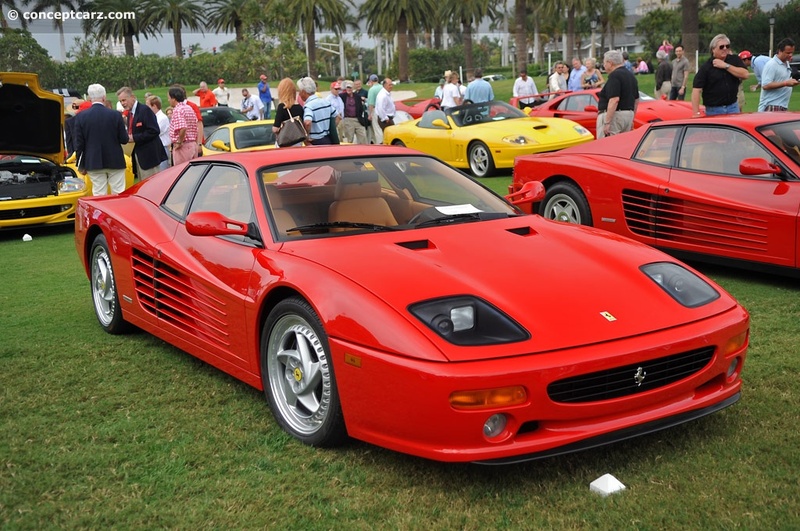 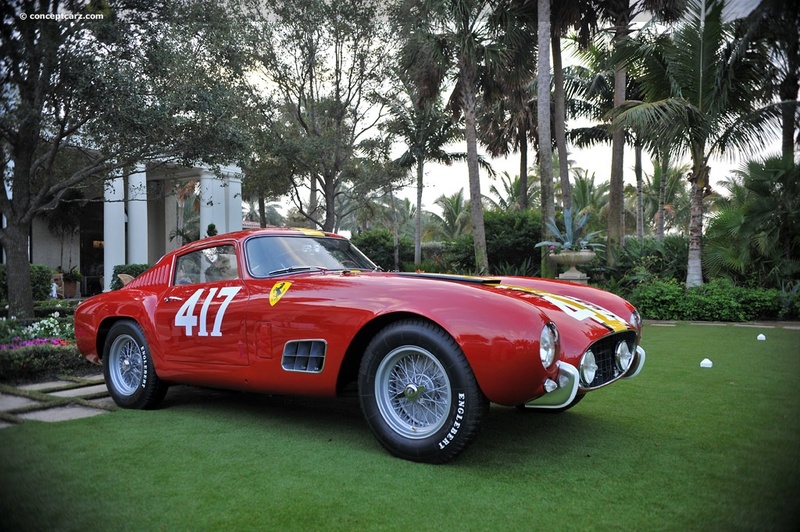 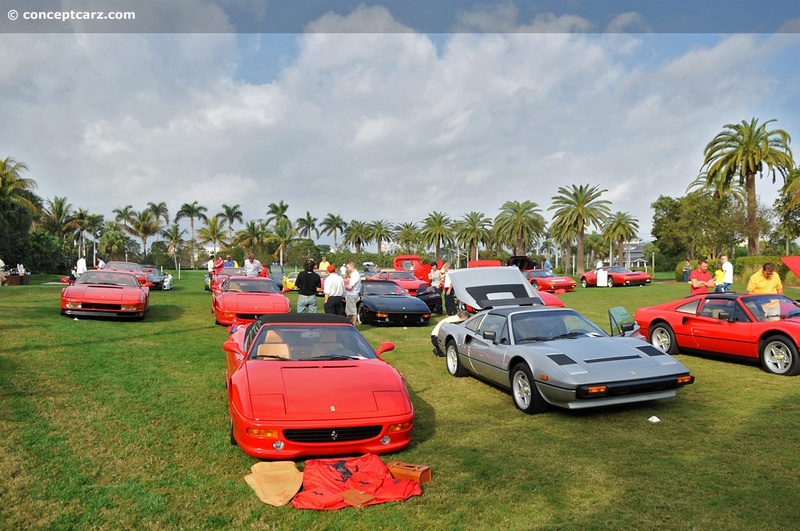 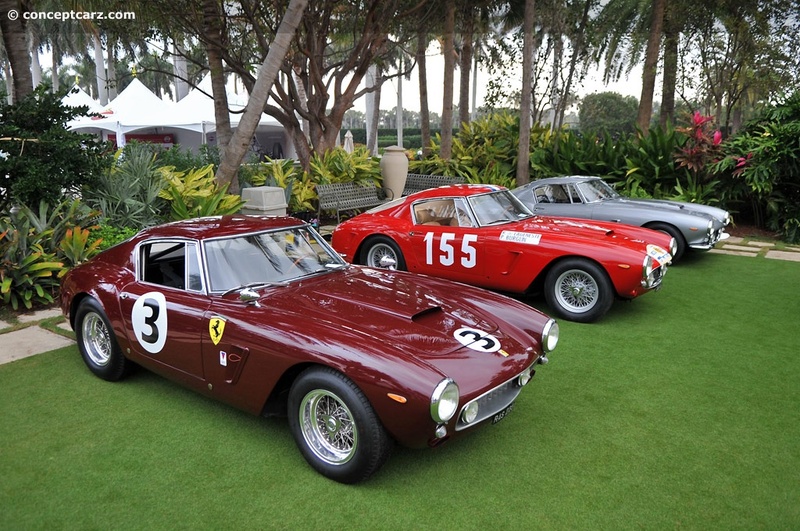 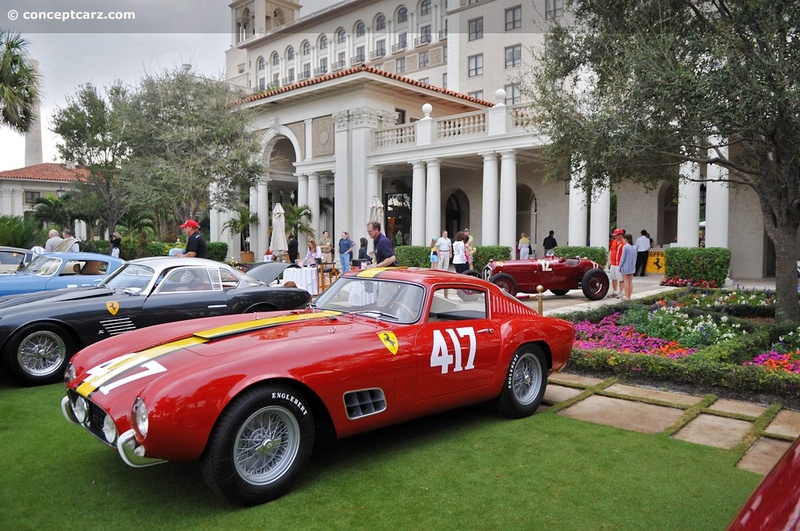 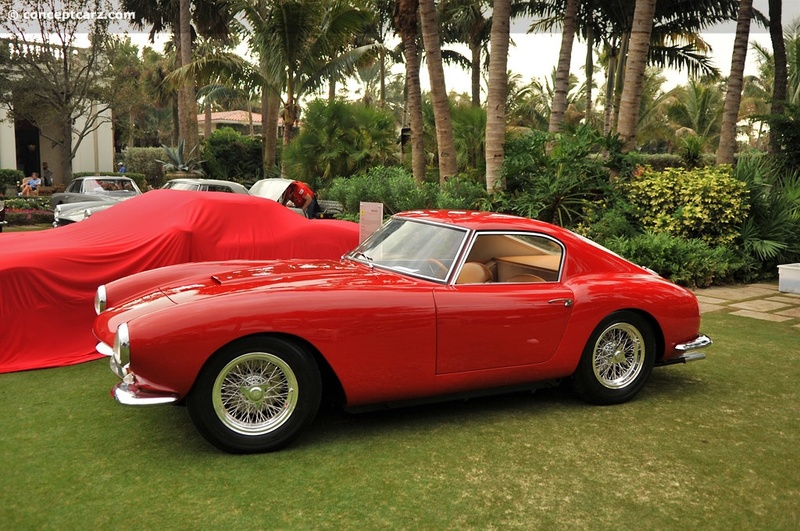 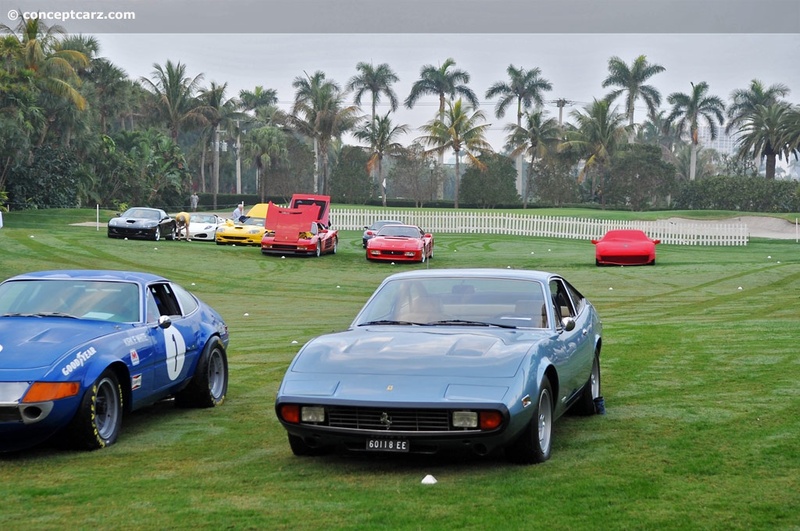 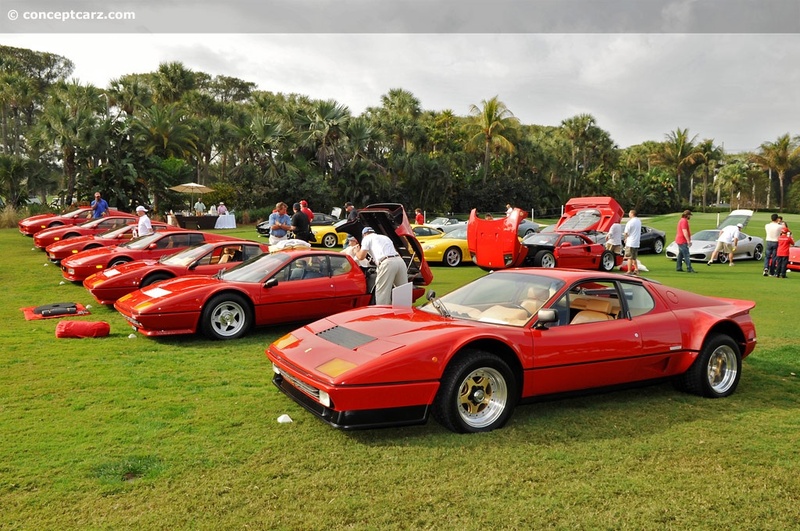 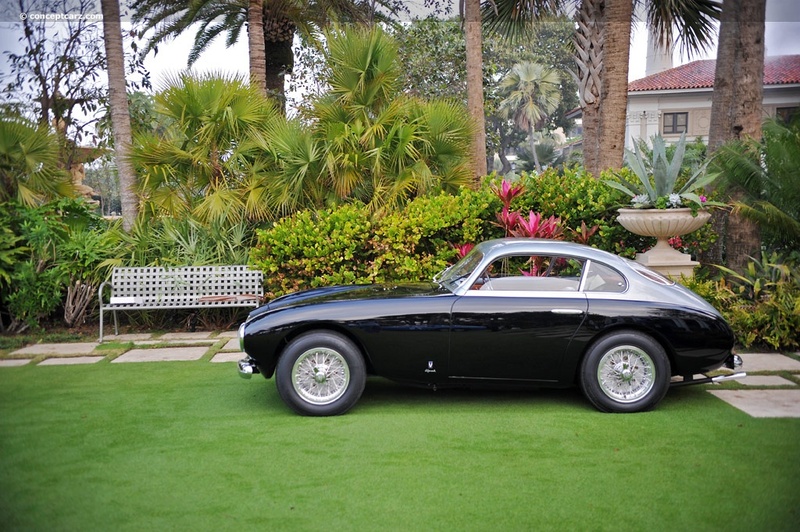 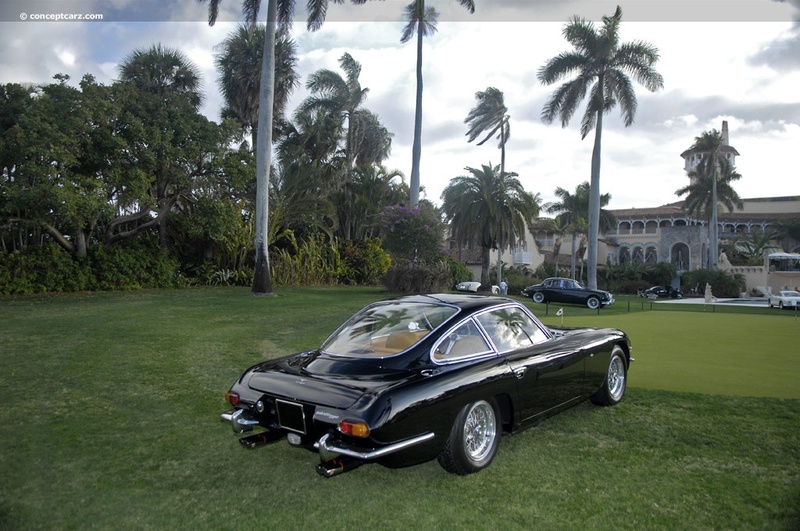 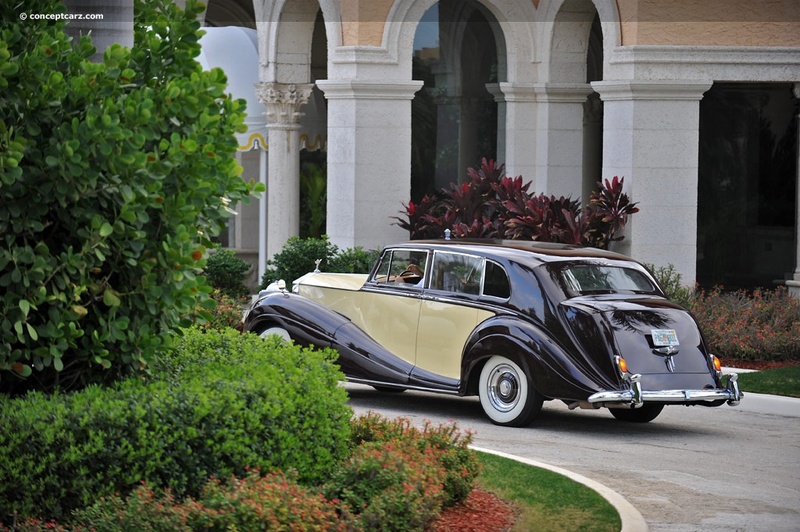 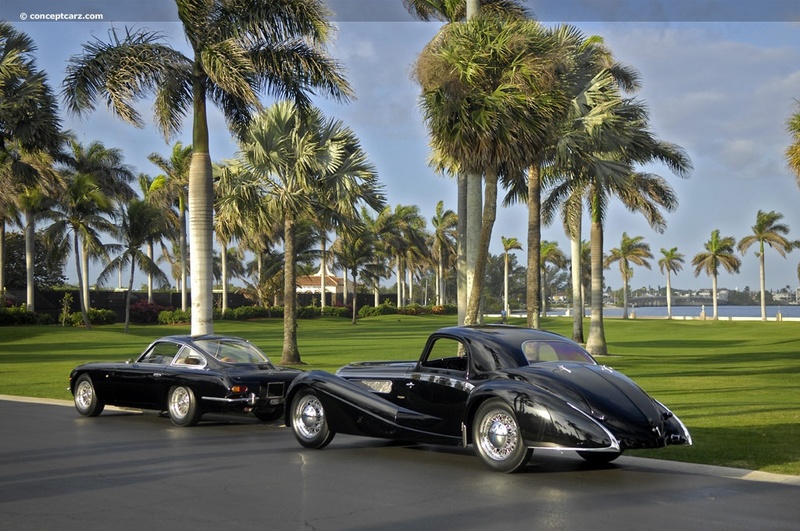 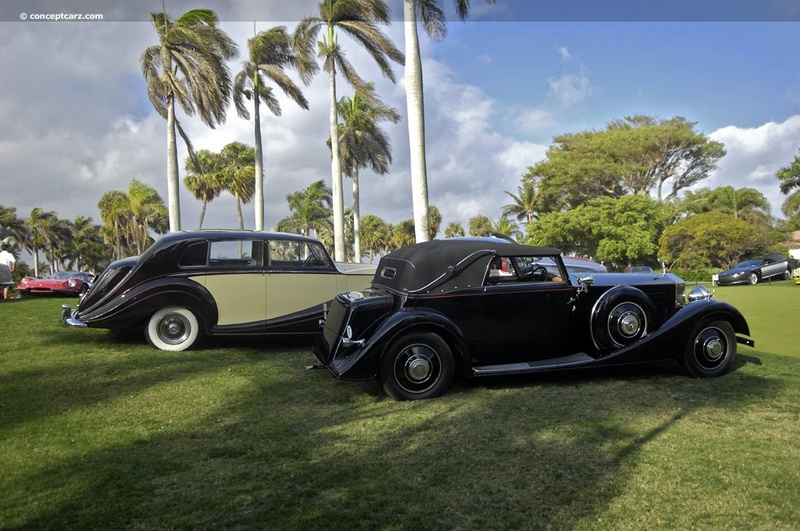 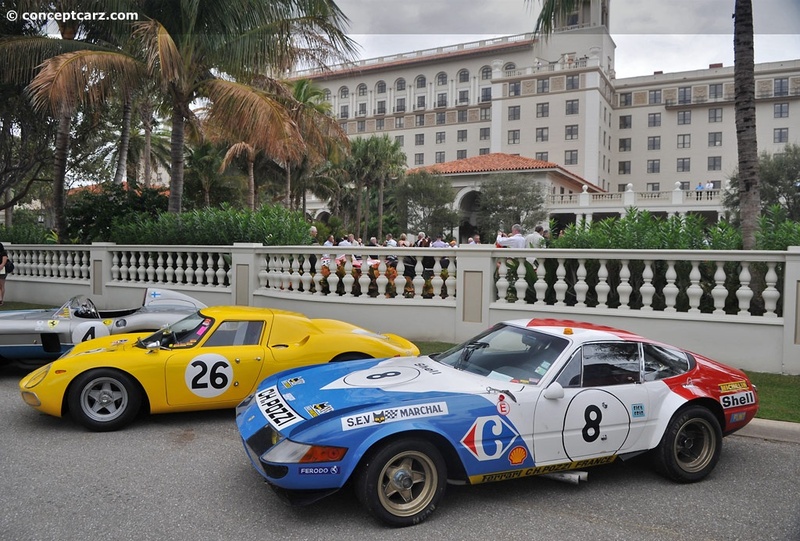 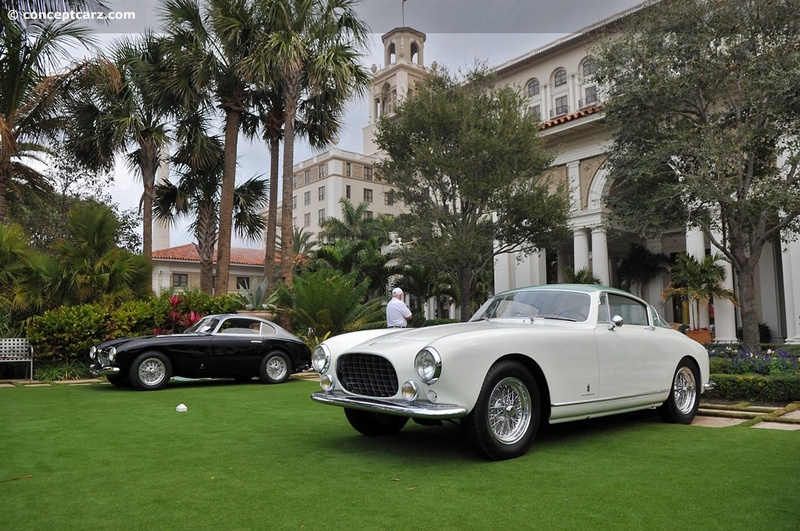 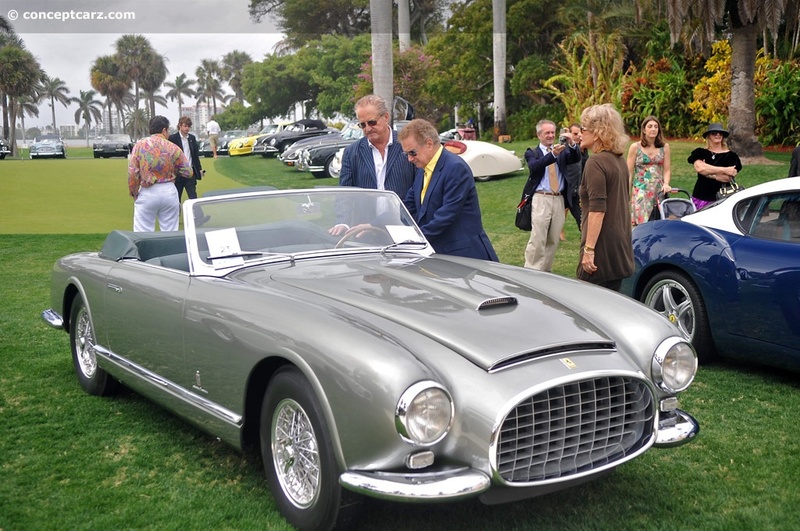 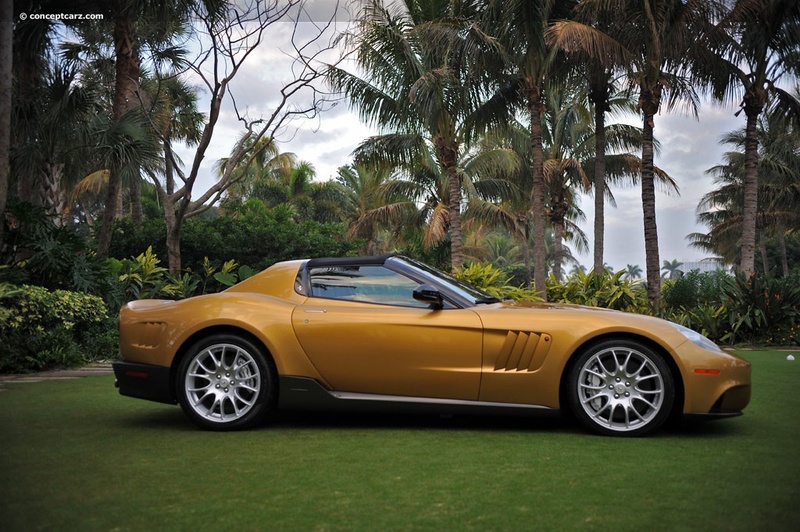 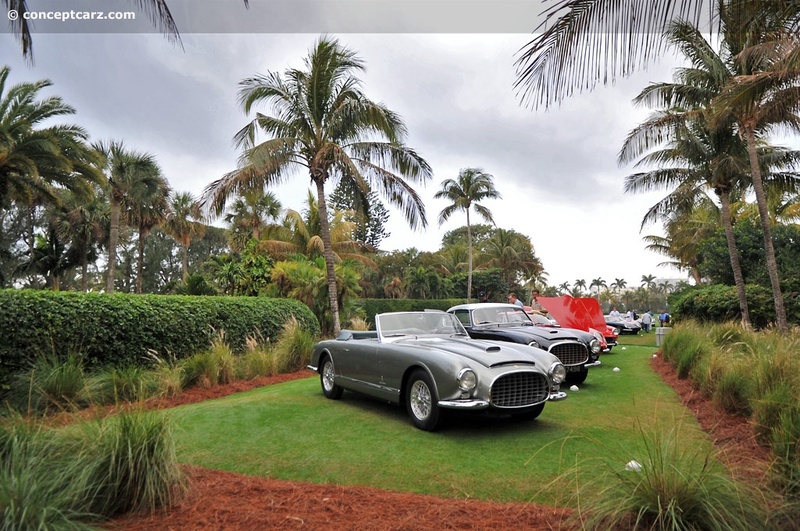 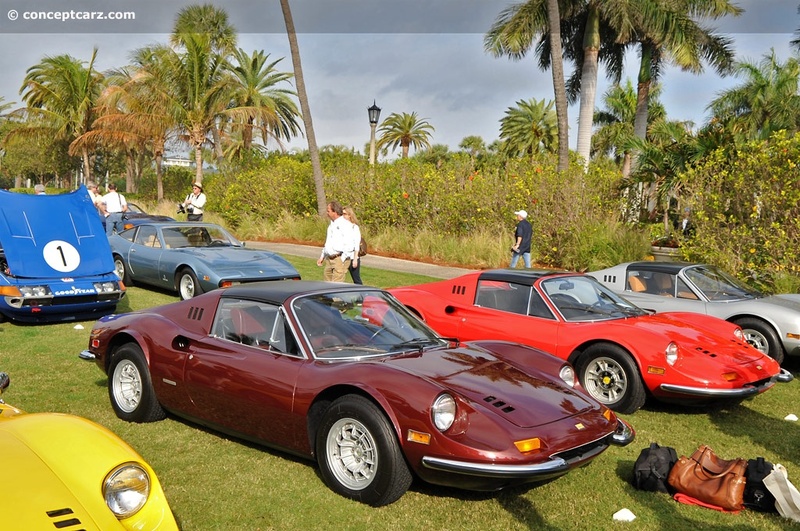 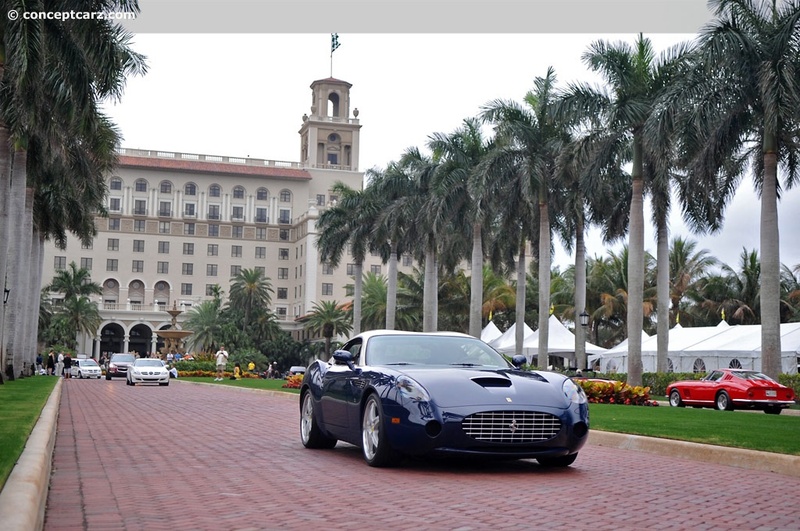 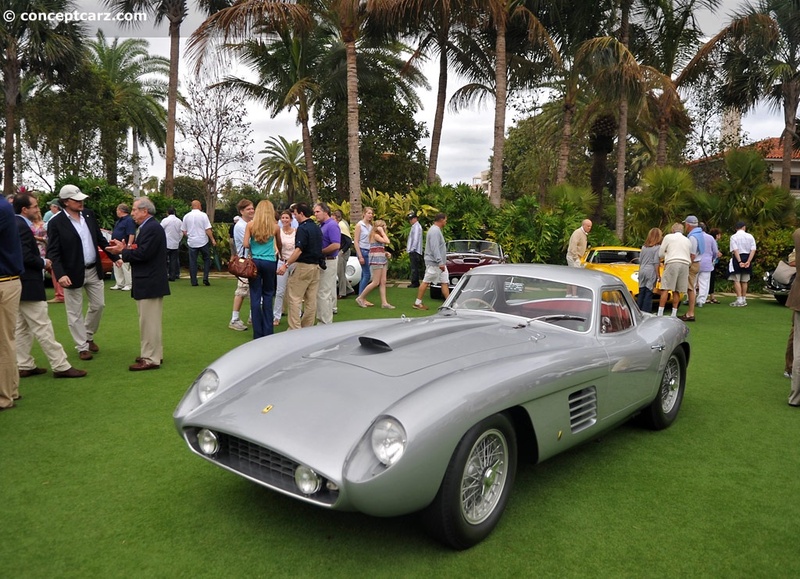 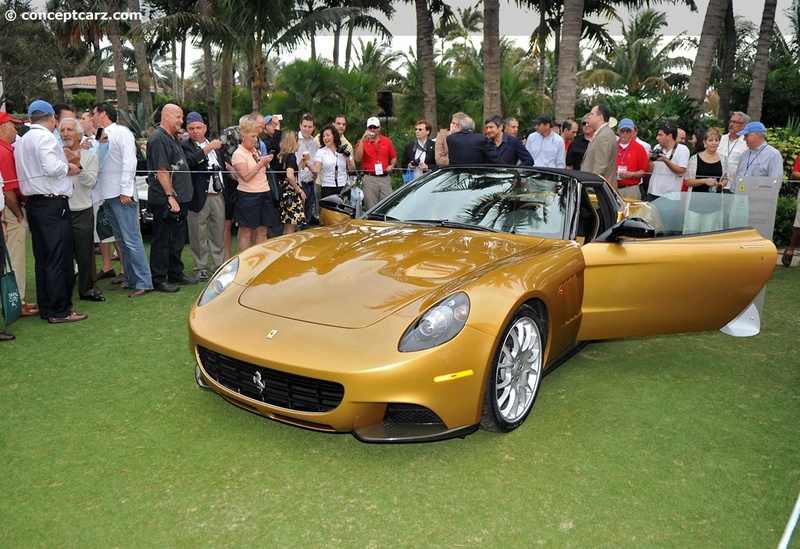 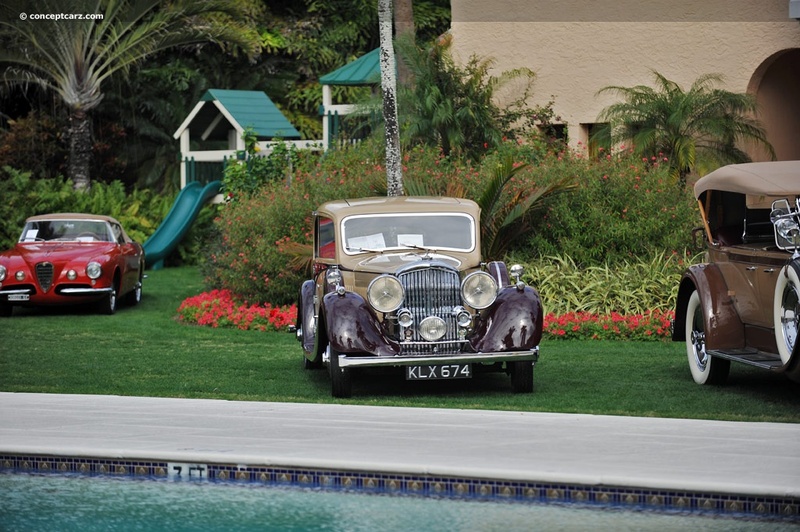 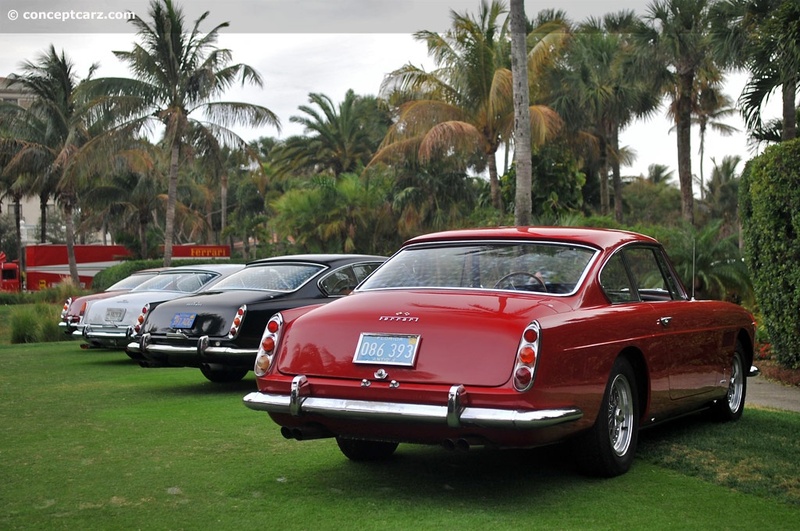 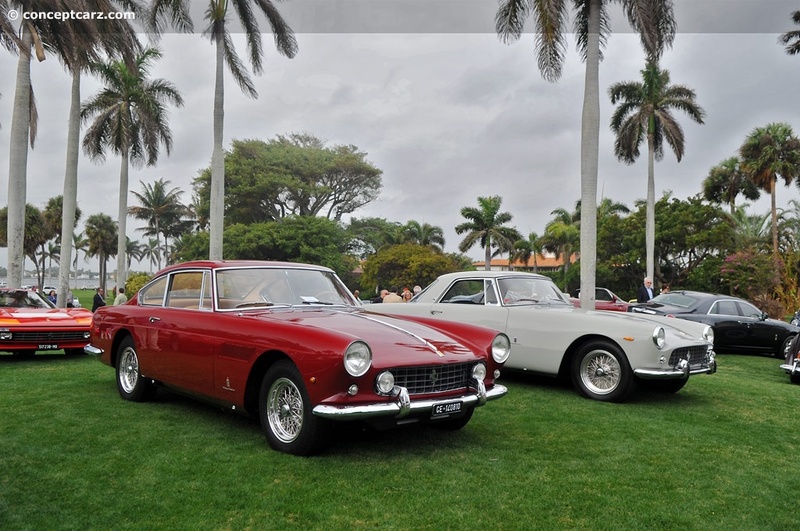 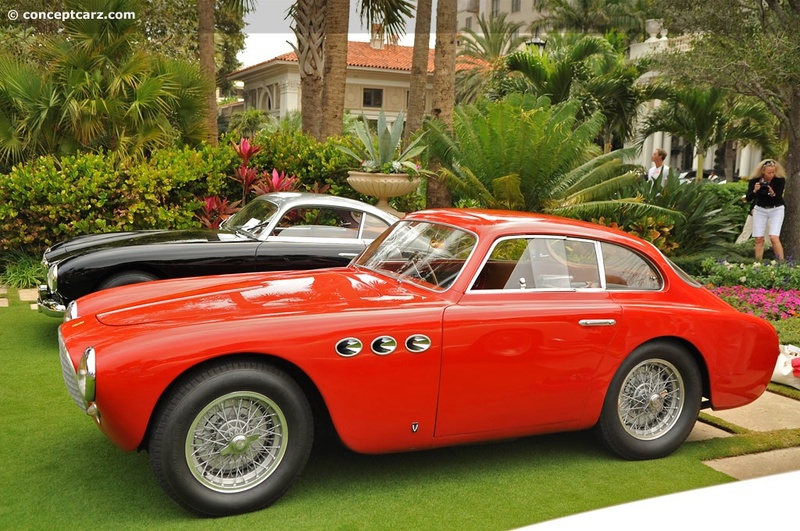 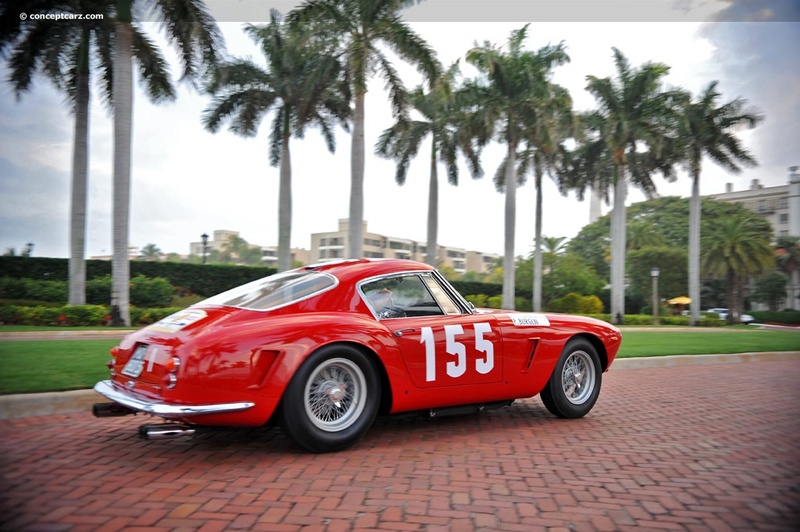 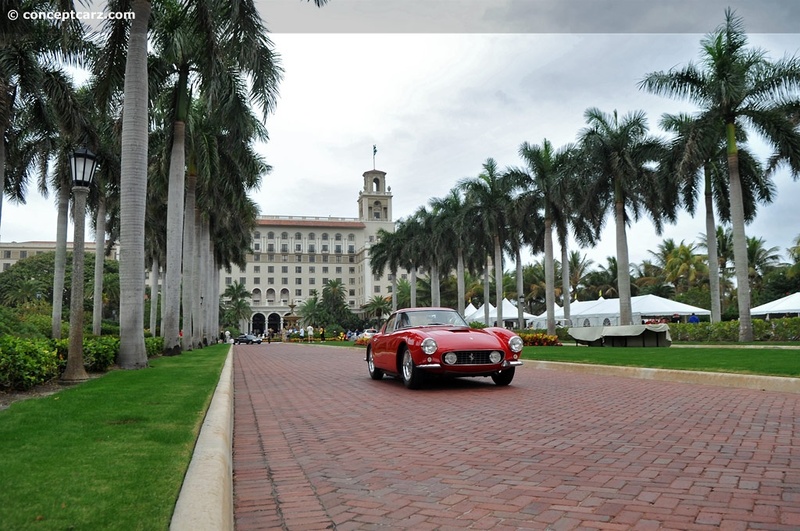 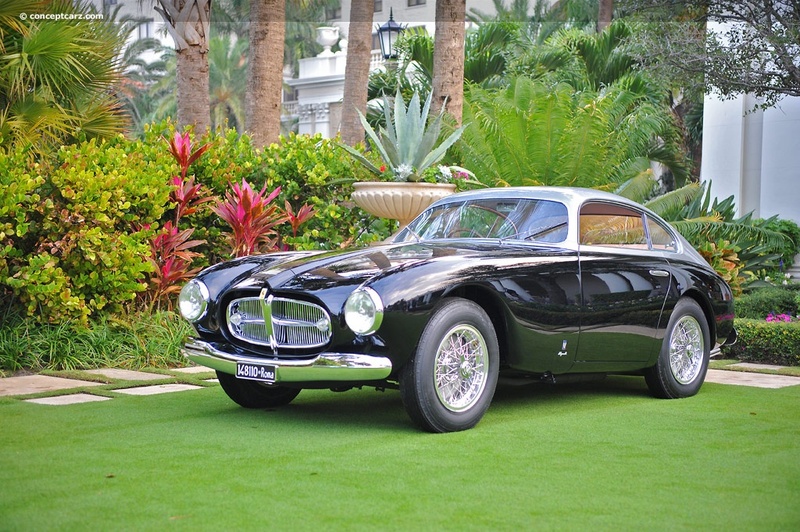 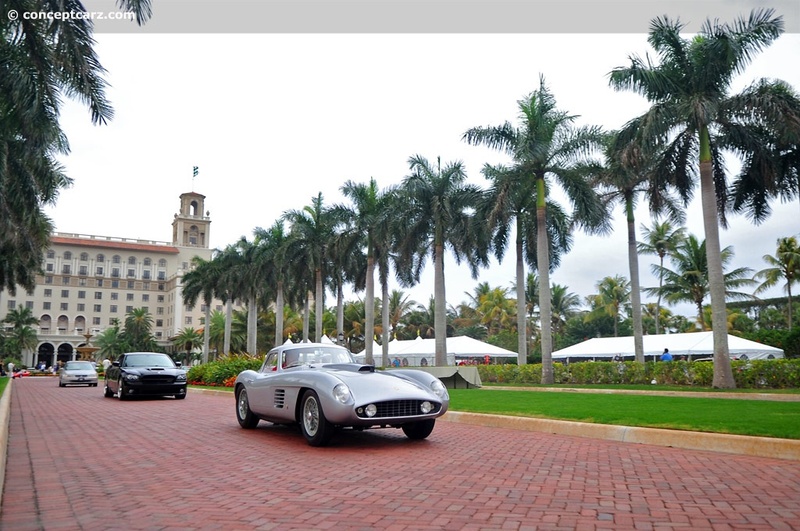 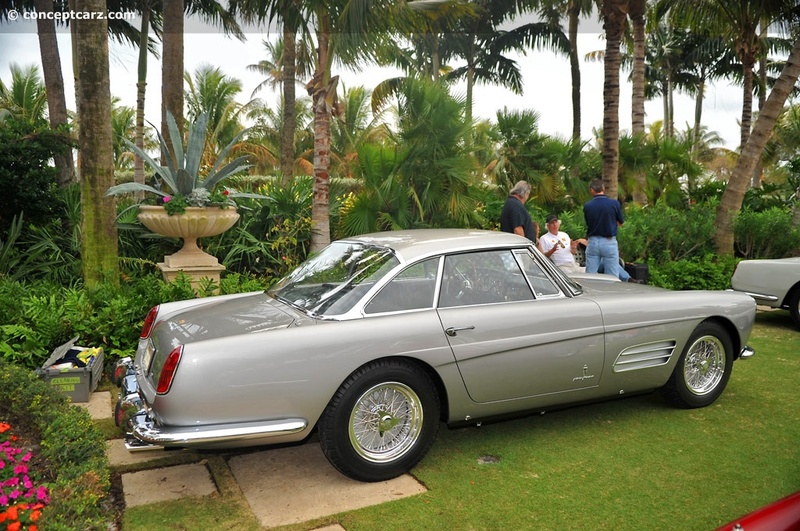 The high point of the celebration was the Concorso d'Eleganza on the lawn of The Breakers Resort Hotel. 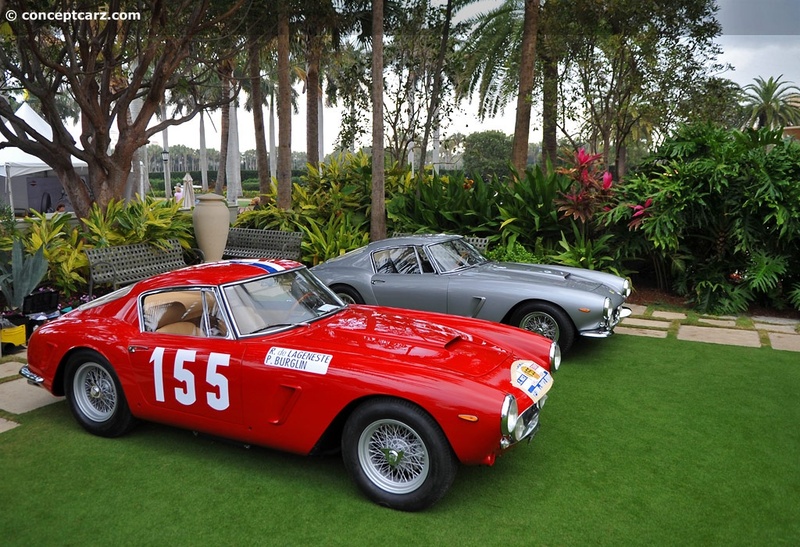 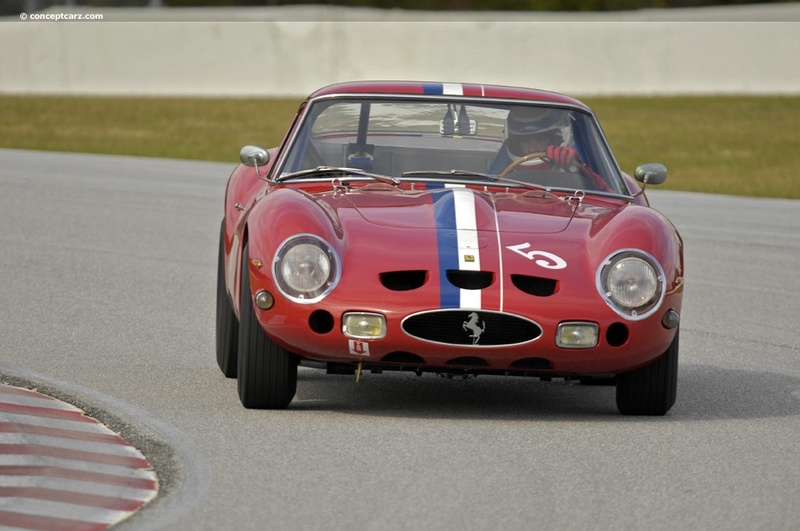 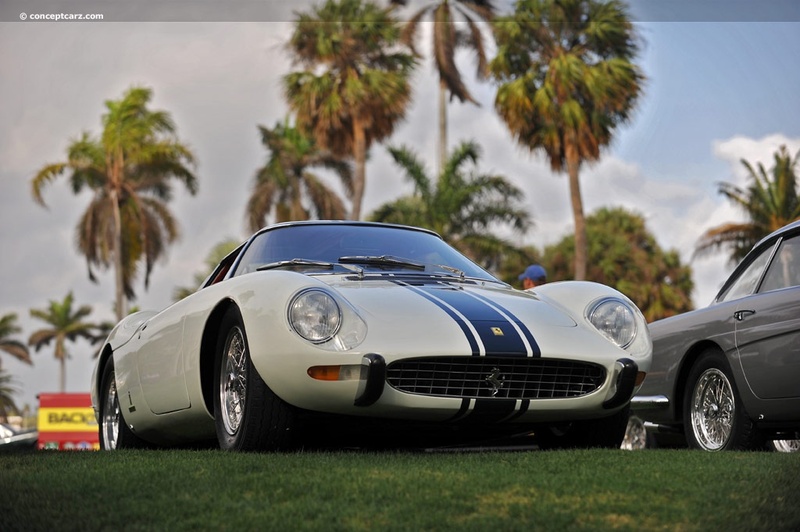 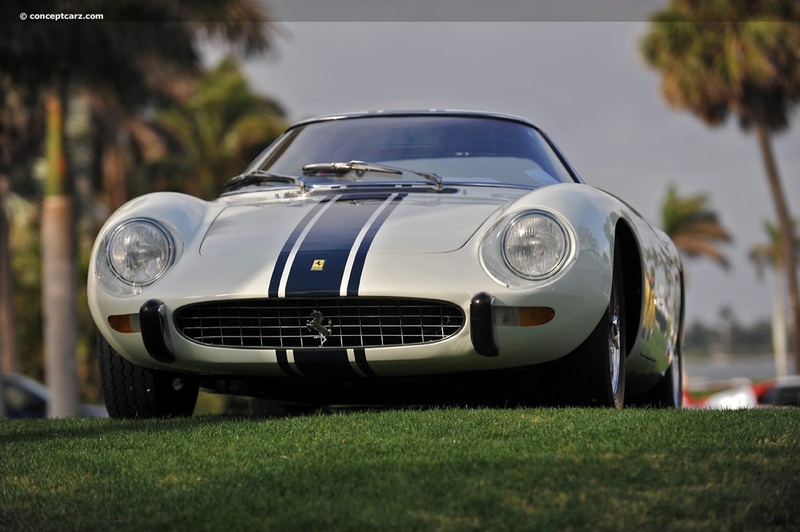 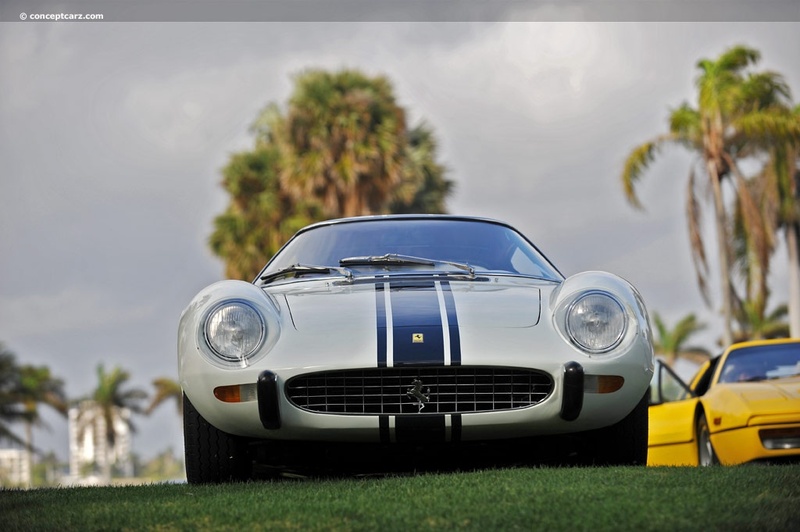 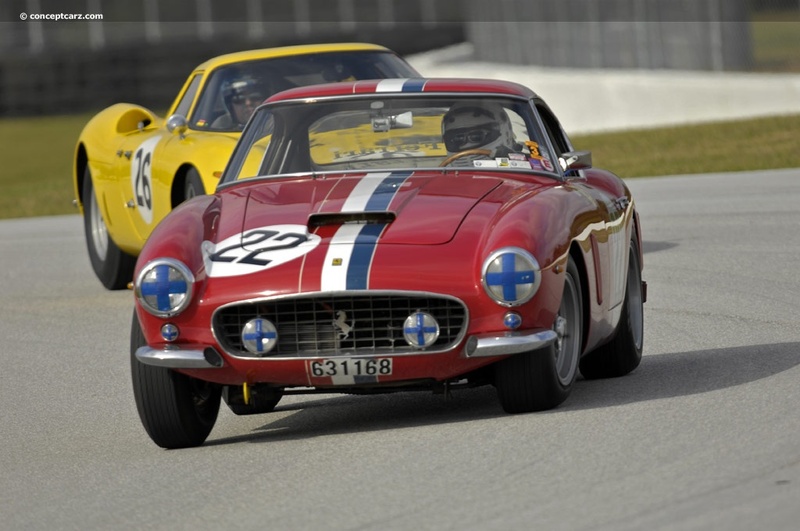 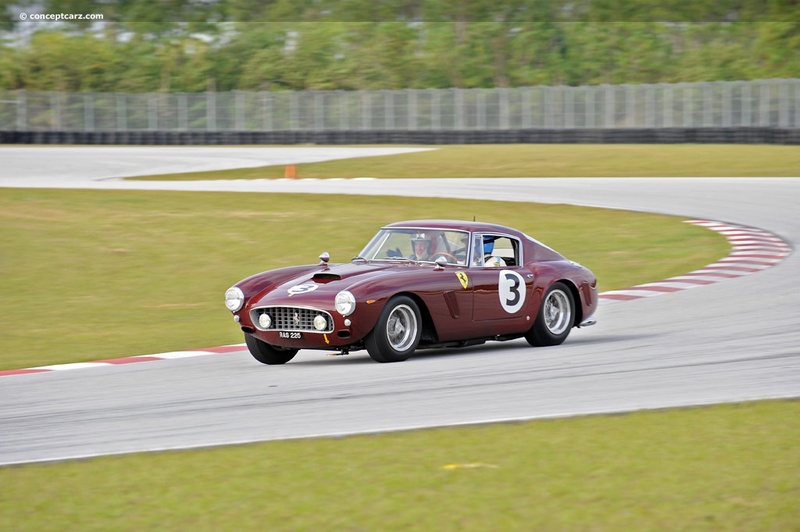 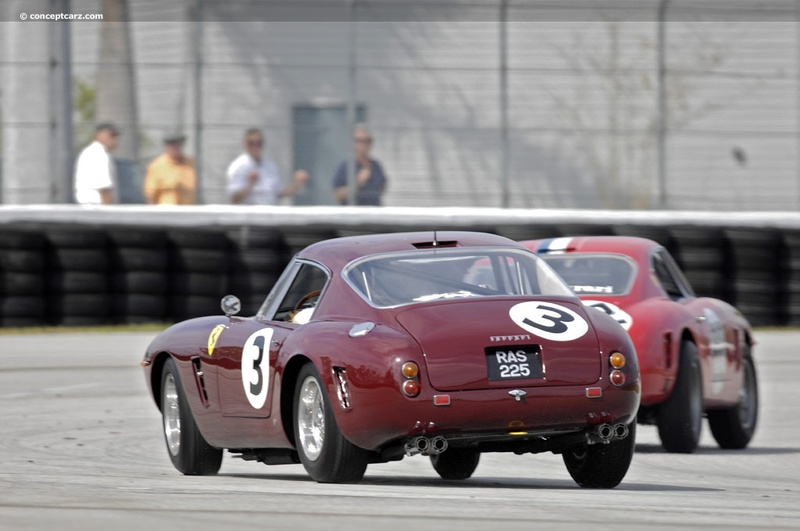 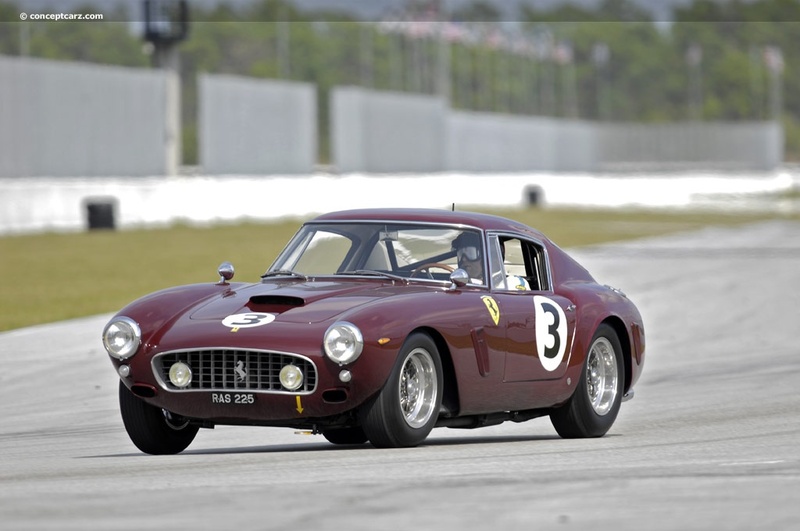 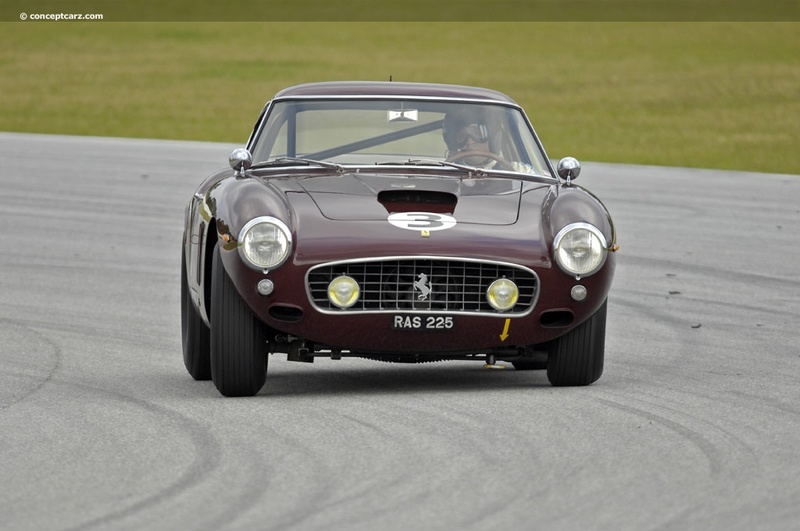 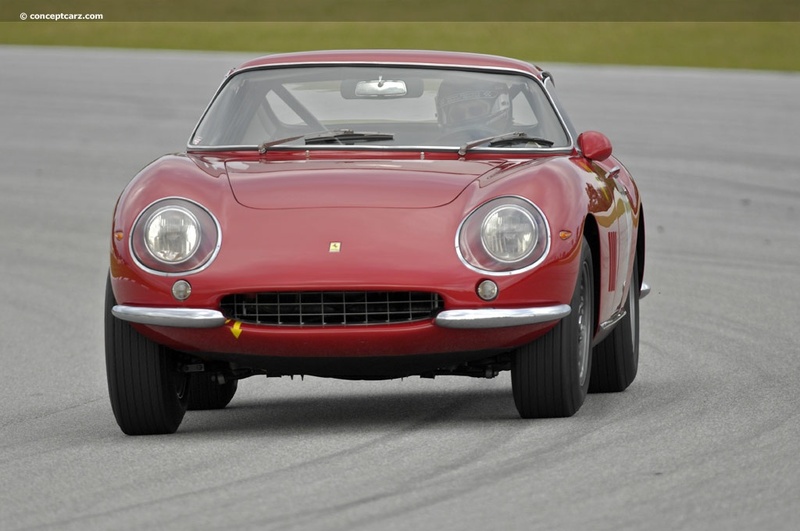 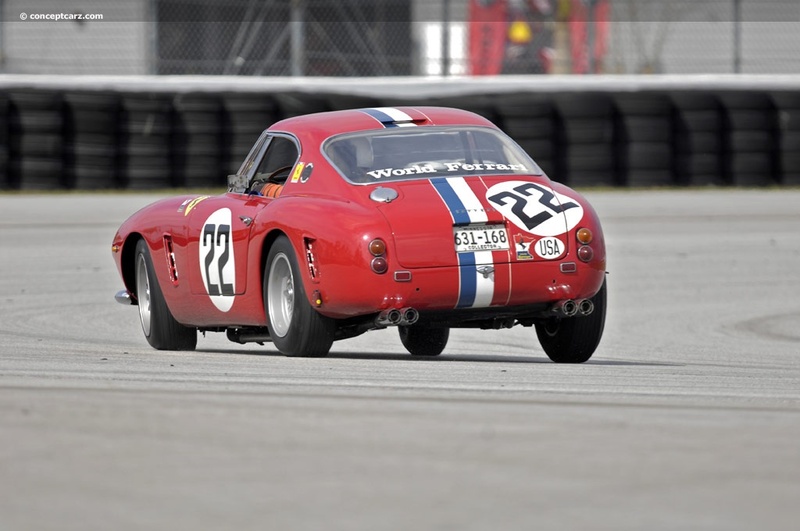 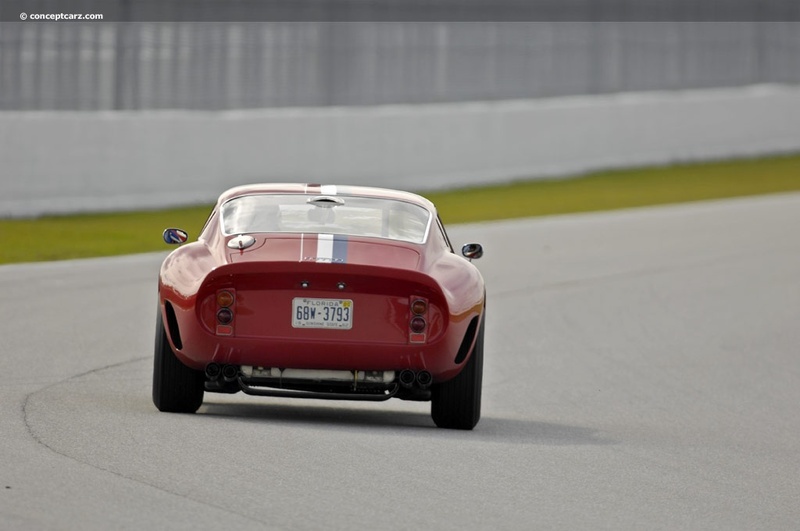 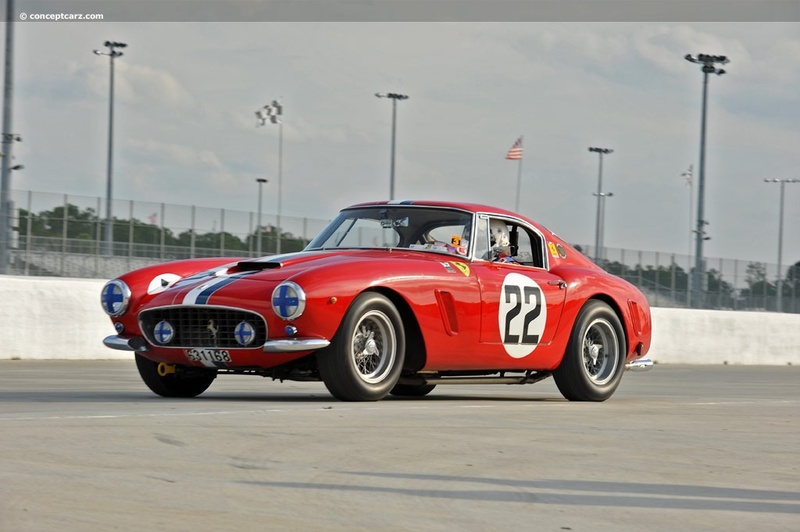 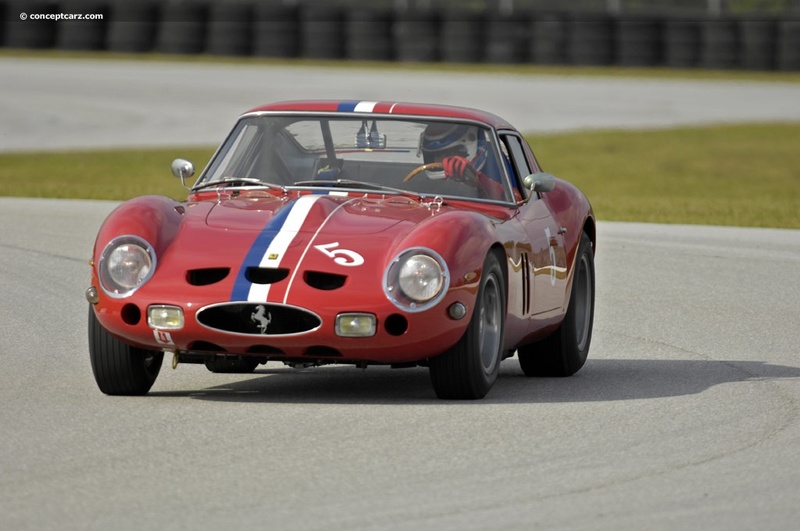 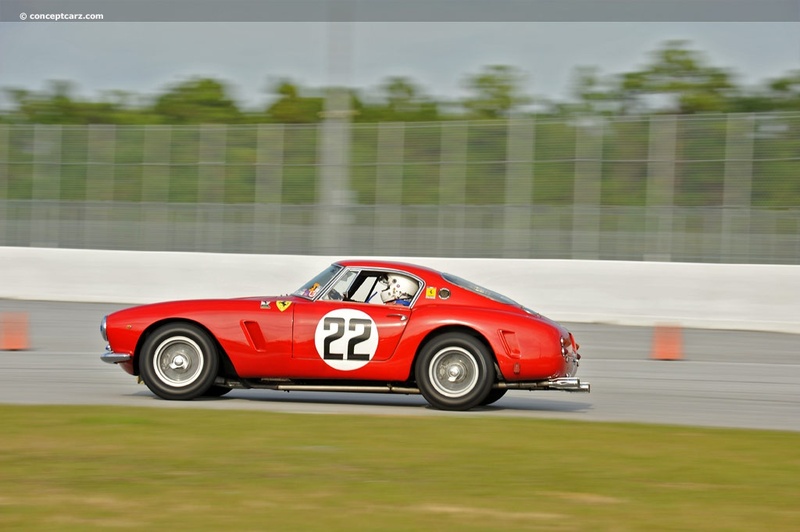 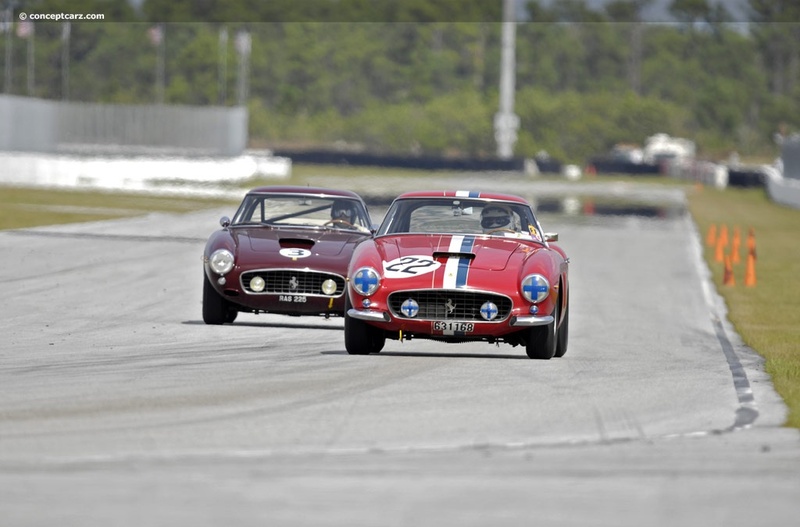 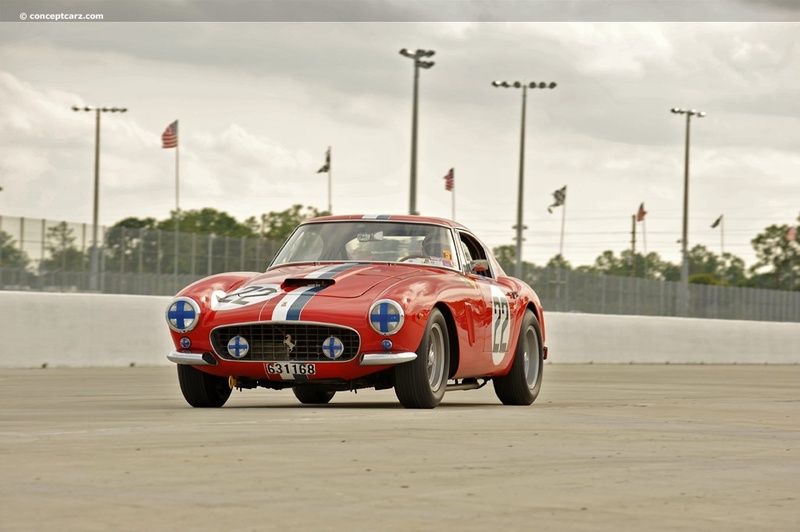 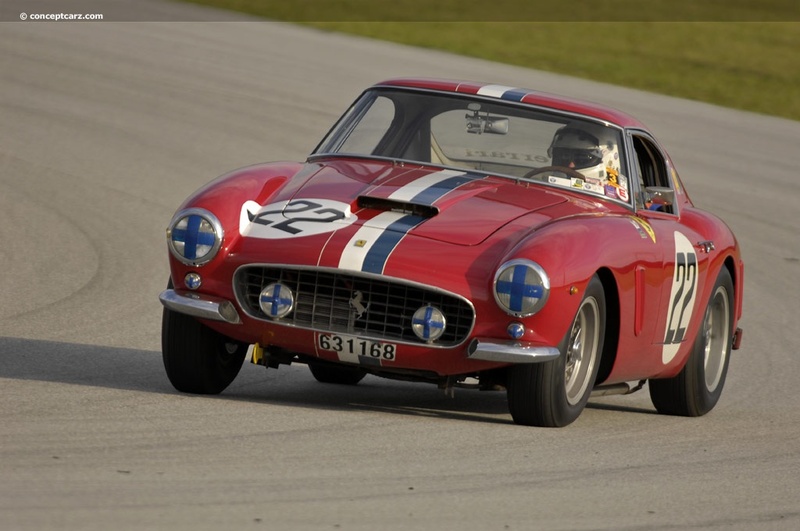 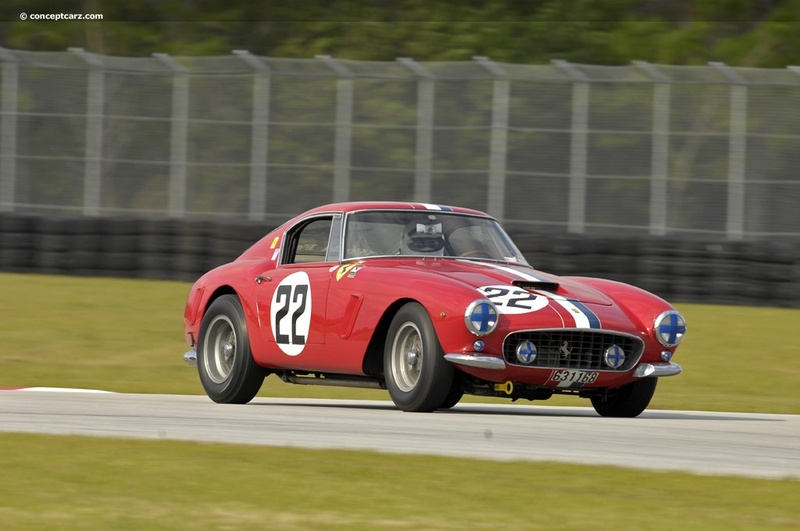 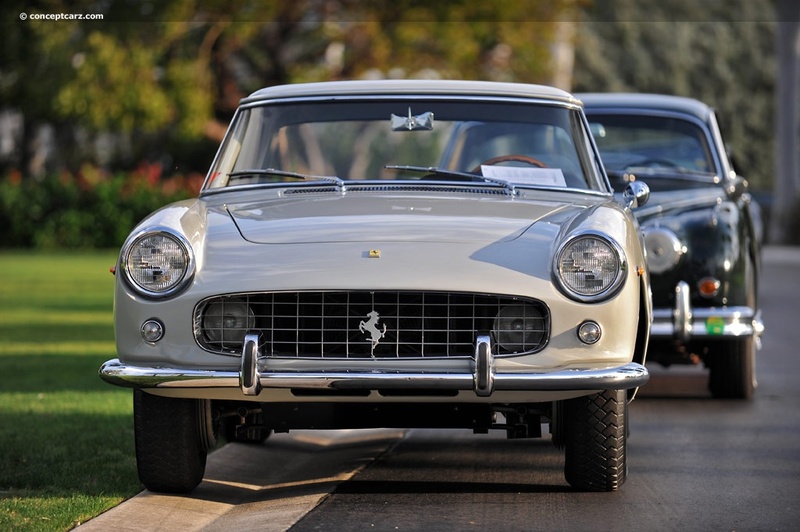 This year, the event celebrated the 50 years of the 250 GT SWB and the 250 GTE 2+2. 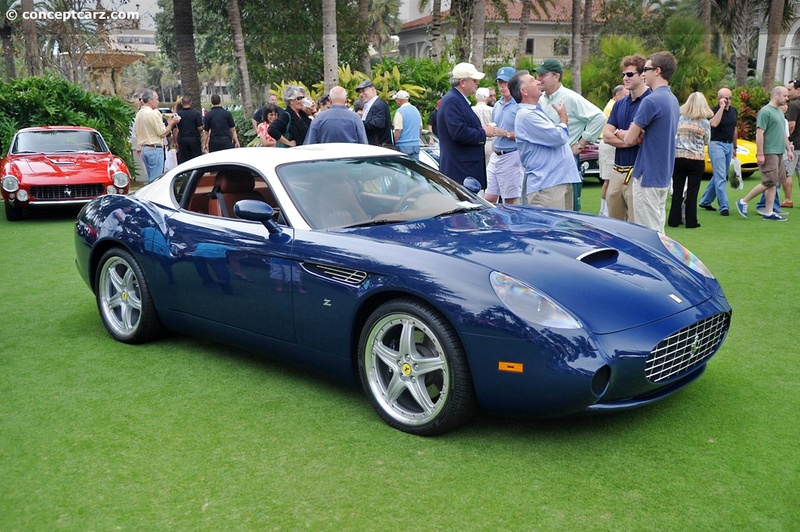 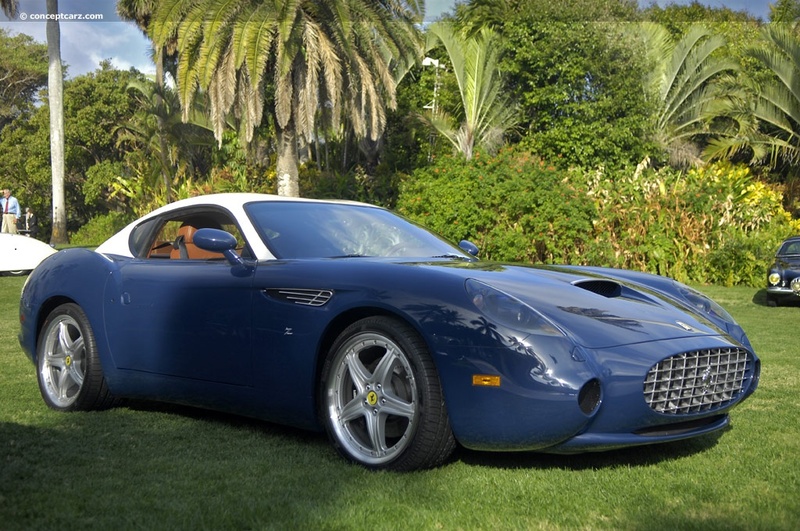 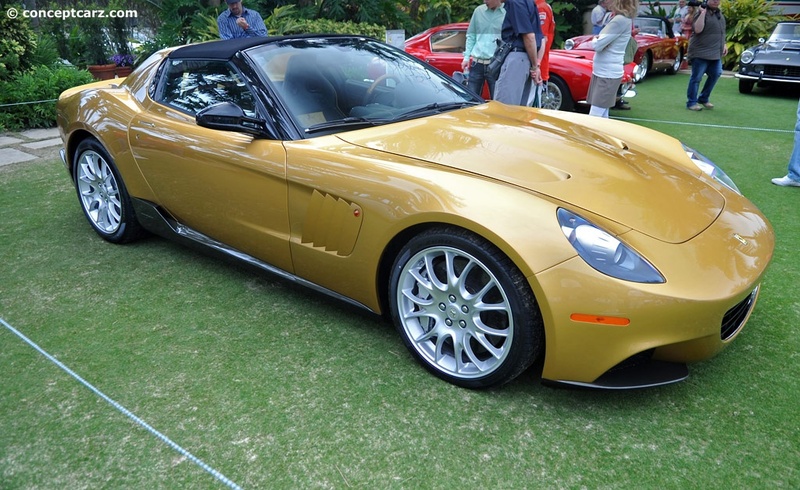 There were two special unveilings, the P540 Superfast Aperta and the latest Zagato built 575 GTZ. 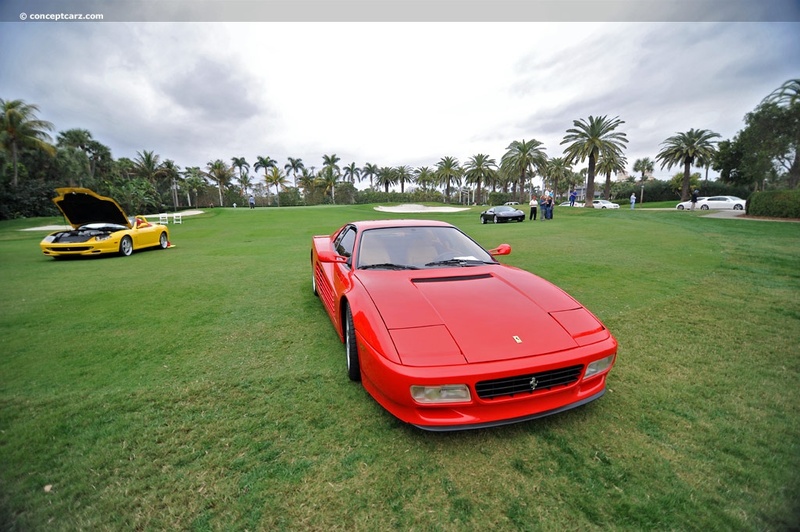 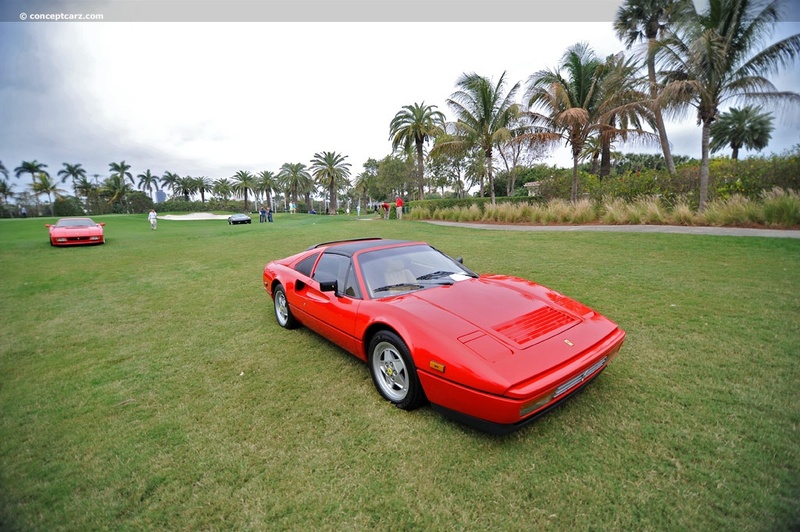 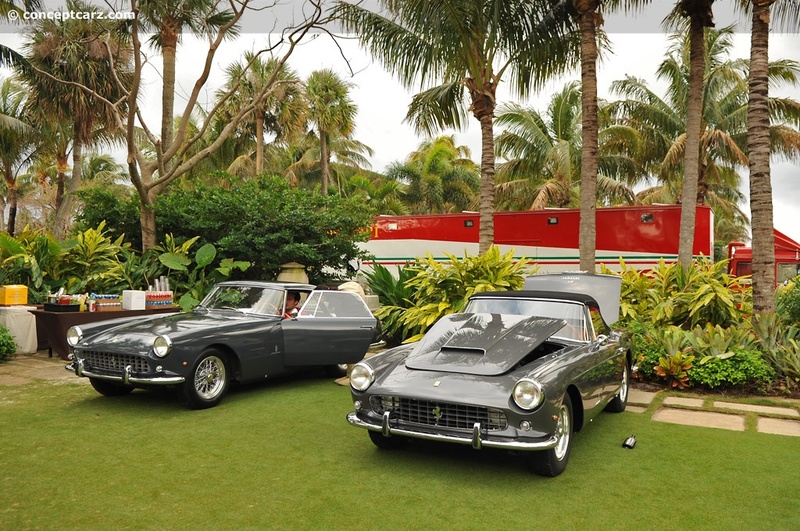 The lawn closest to the Hotel housed some of the most spectacular and special Ferraris in attendance. 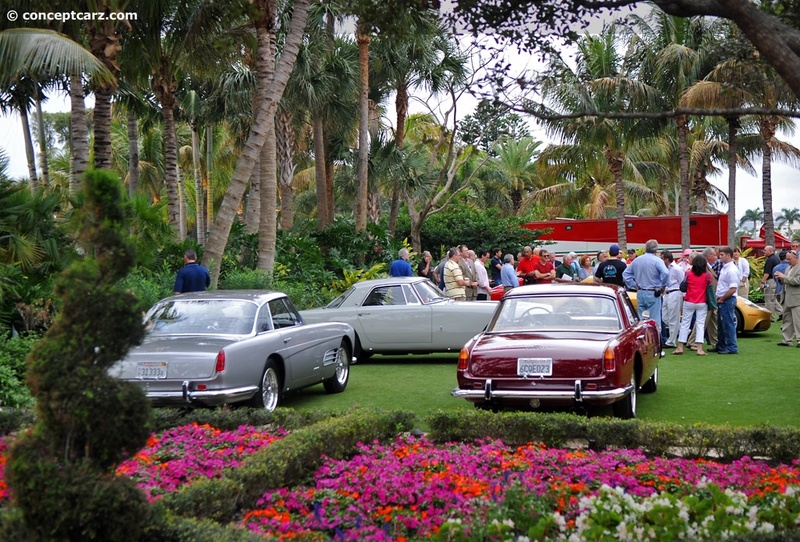 The judges selected both Best of Show winners from this group. 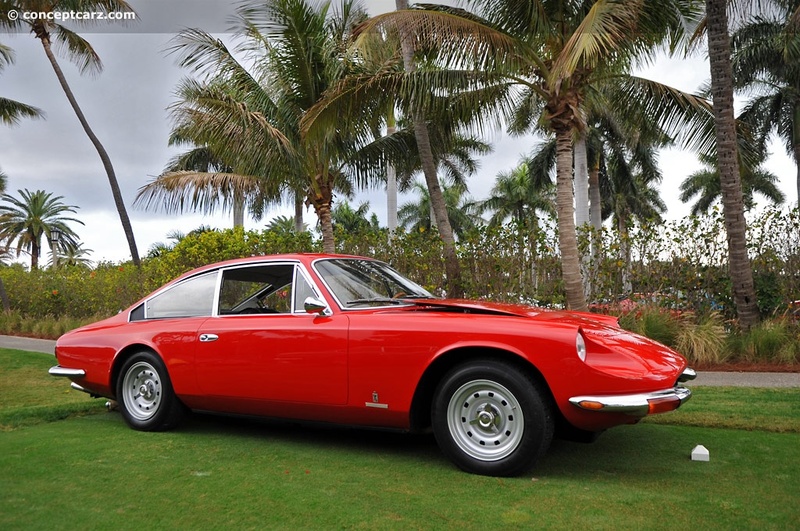 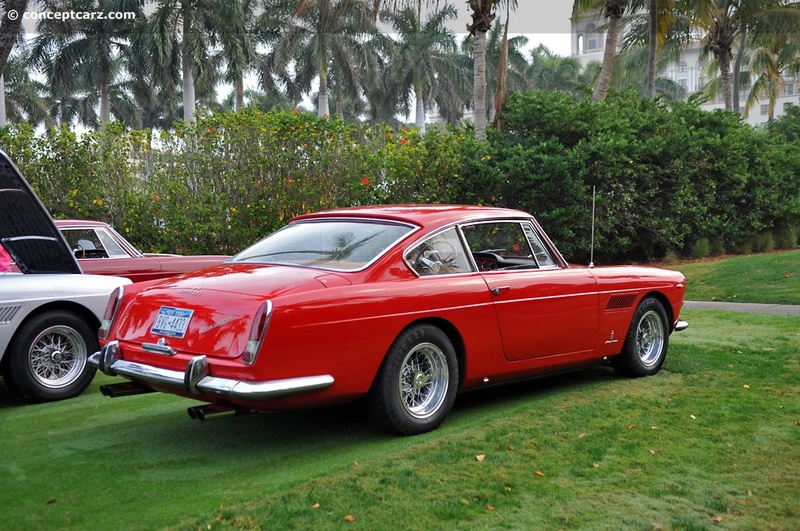 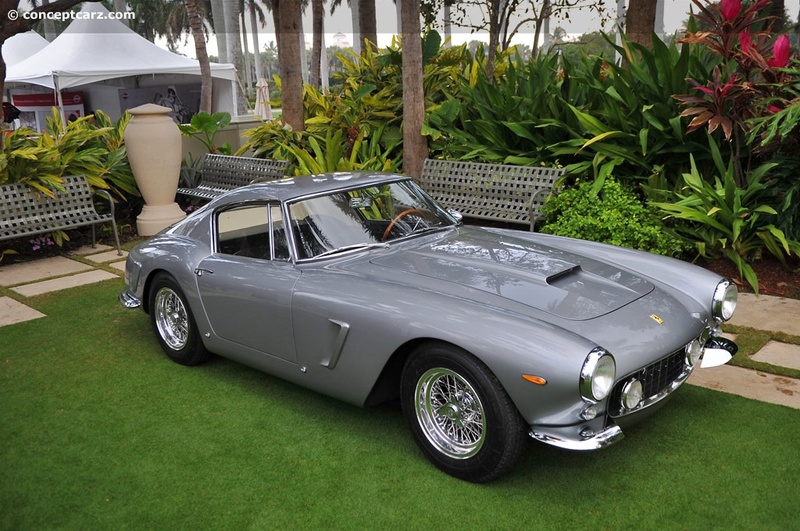 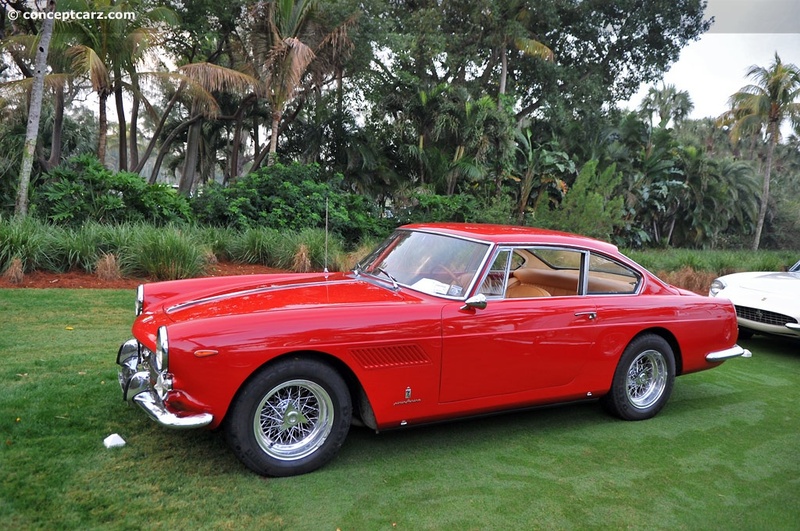 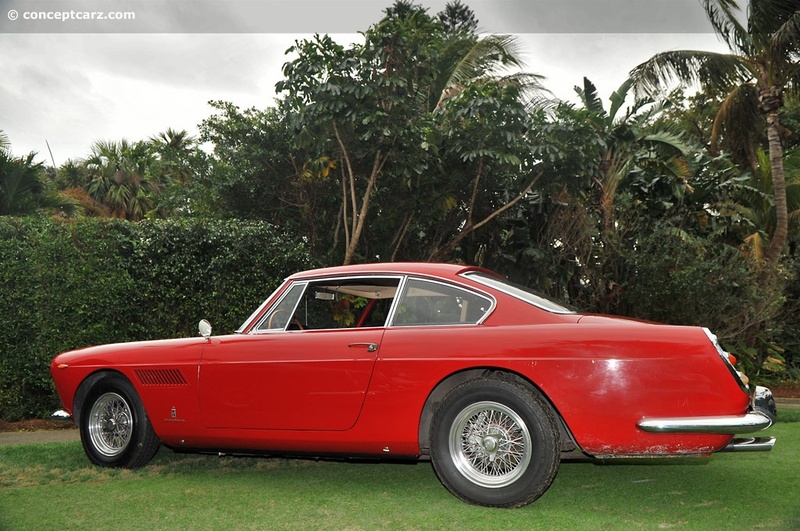 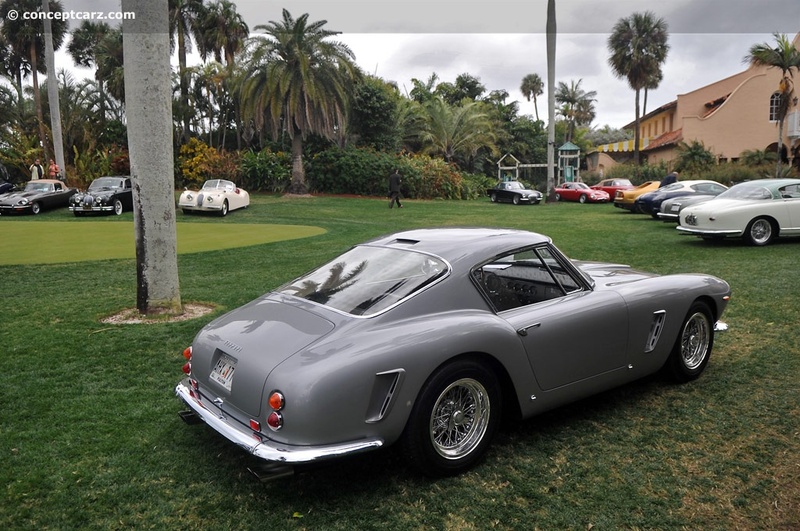 The Cavallino Cup for Best in Show 'Competition' was awarded to a 250 GT TdF (chassis number 0677 GT). 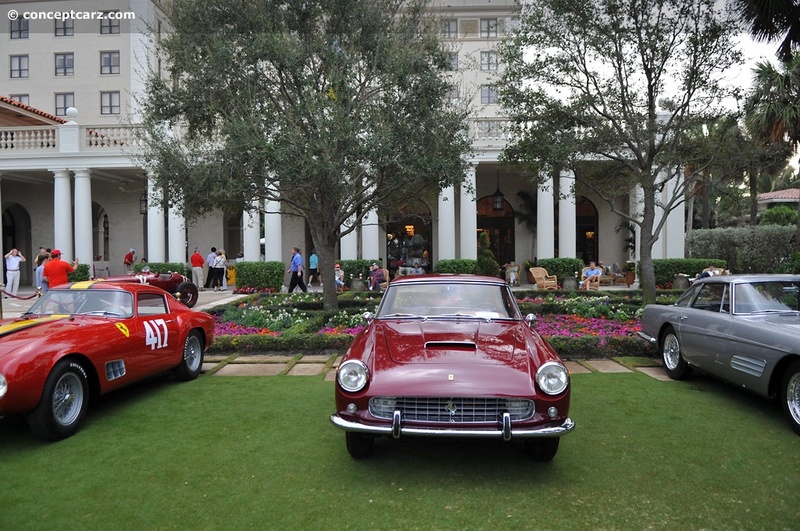 Best in Show in the 'Street' category went to the oldest Ferrari in attendance, the 1951 212 Export (chassis number 0080 E). 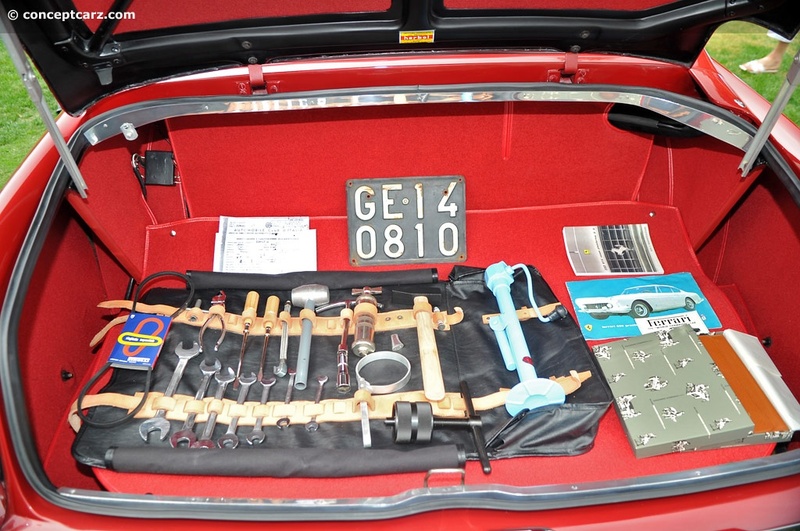 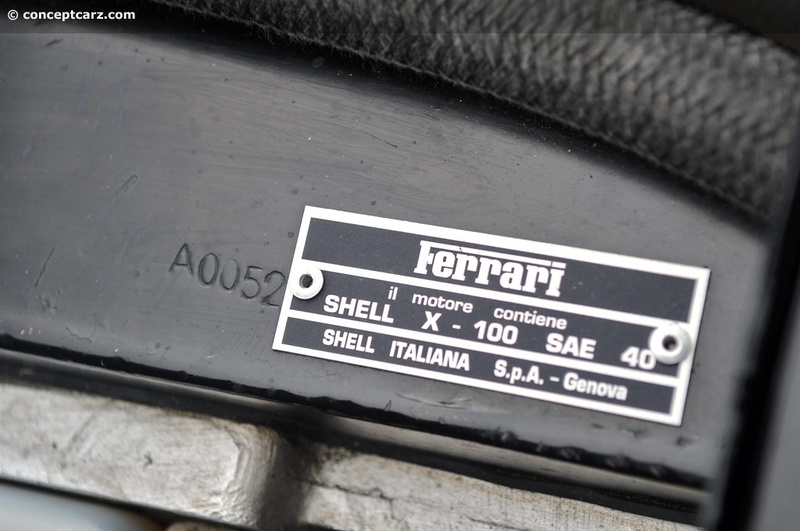 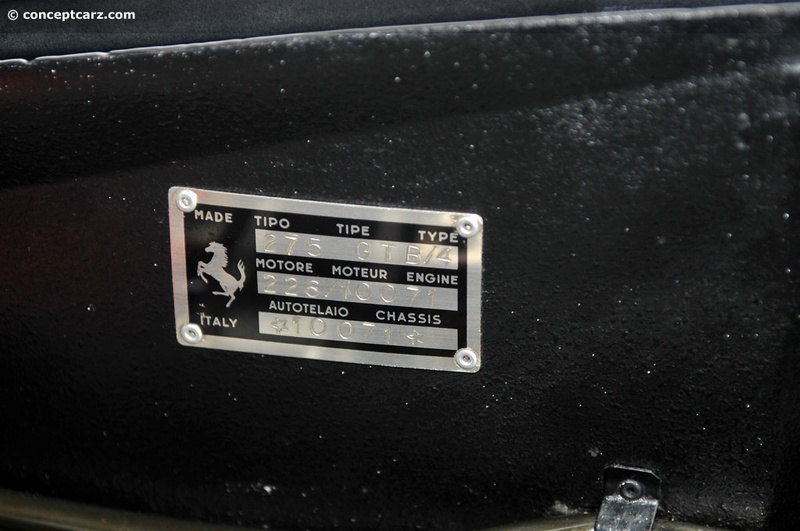 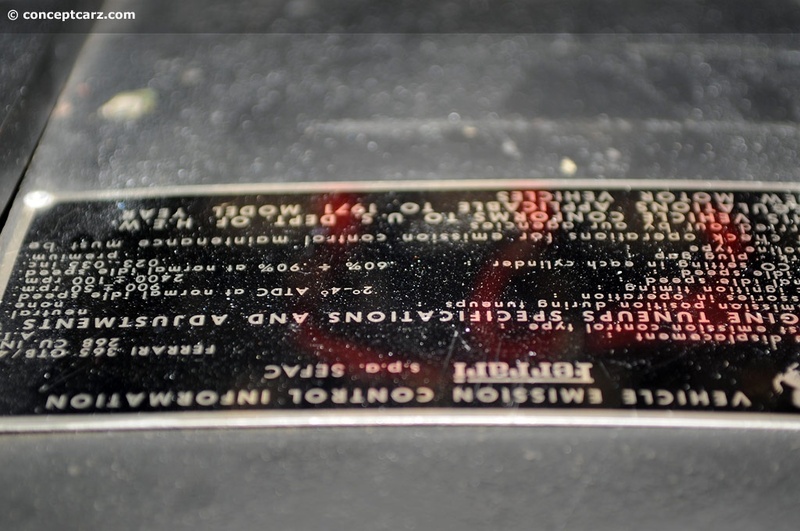 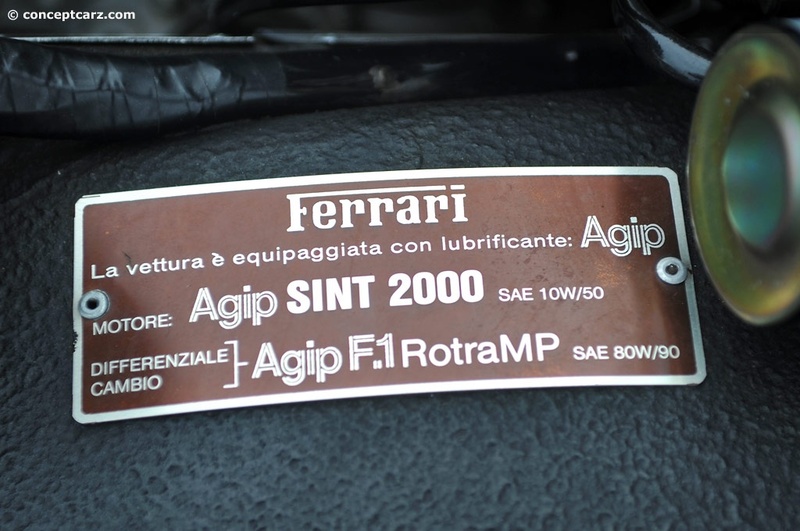 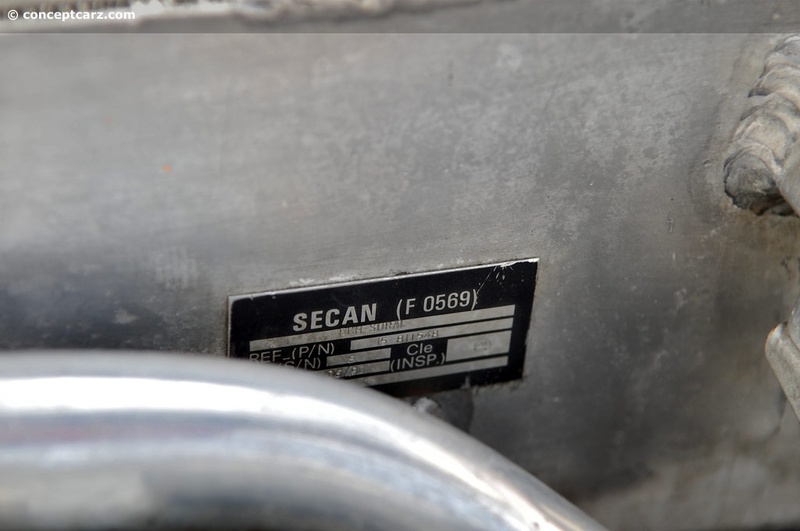 Chassis number 0677GT was one of only 14 Louvre Ferari 250 GT Berlinettas. 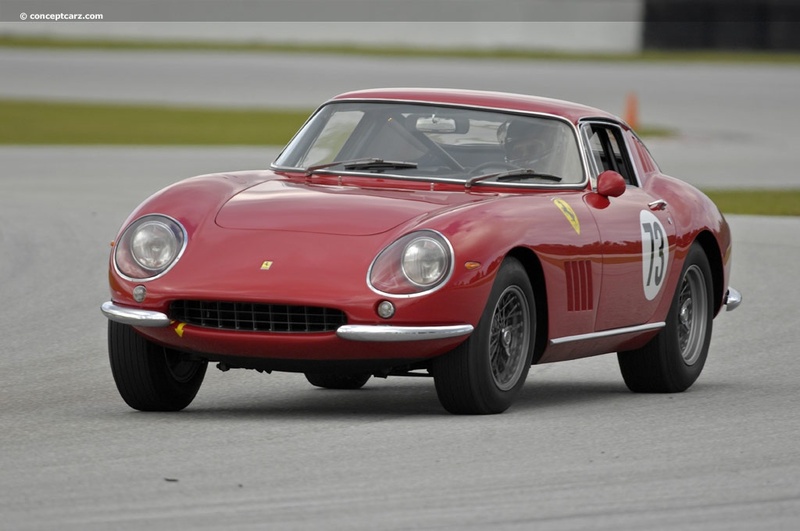 Its racing career began in 1957 and would earn many impressive victories, including a win at the Tour de France. 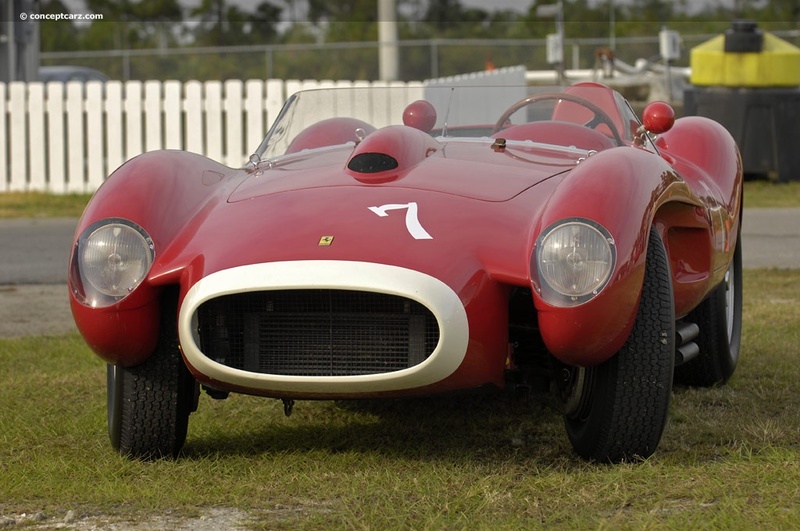 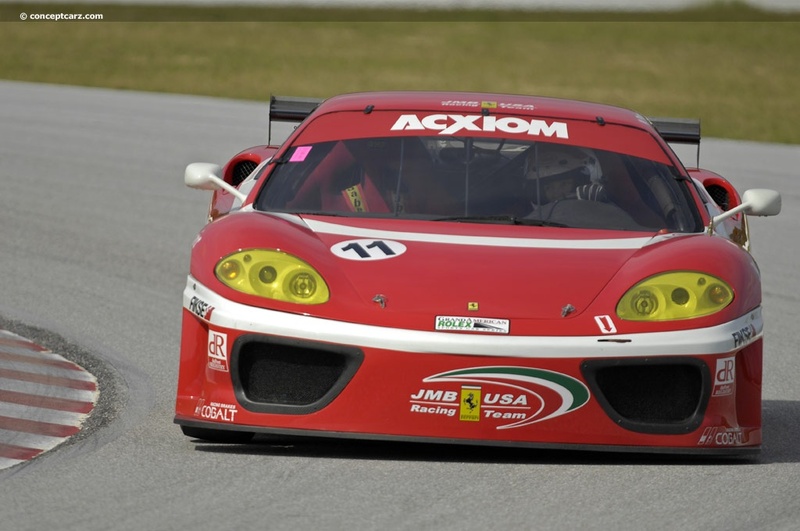 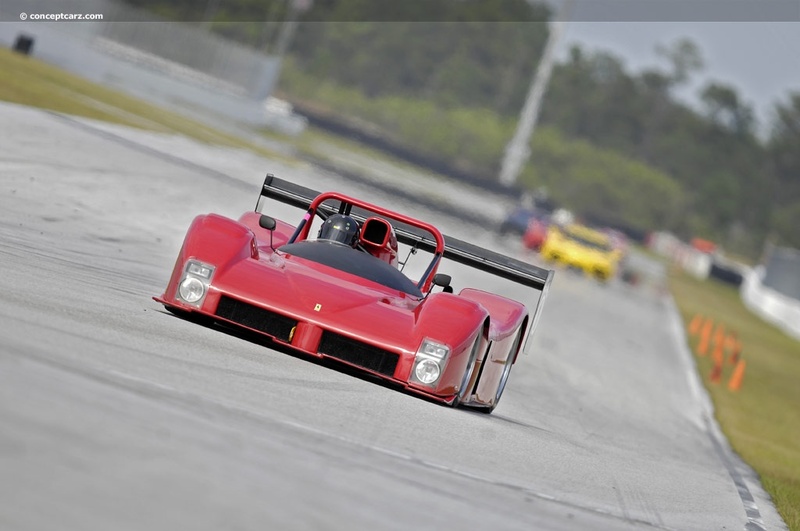 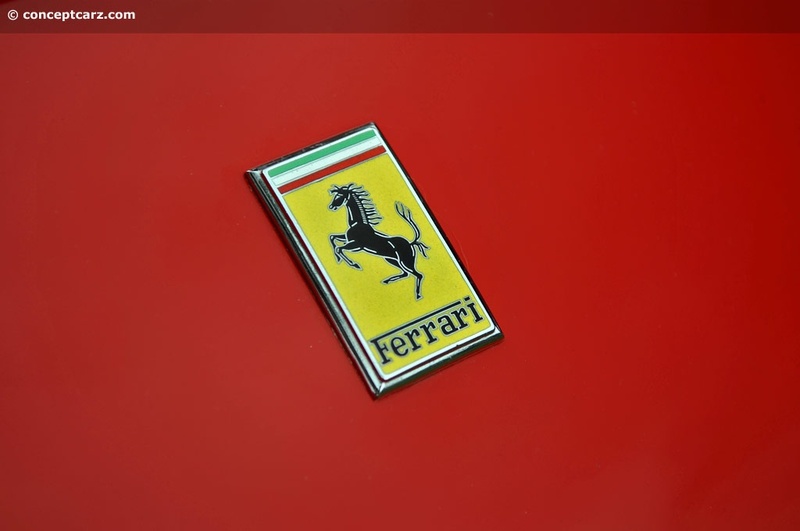 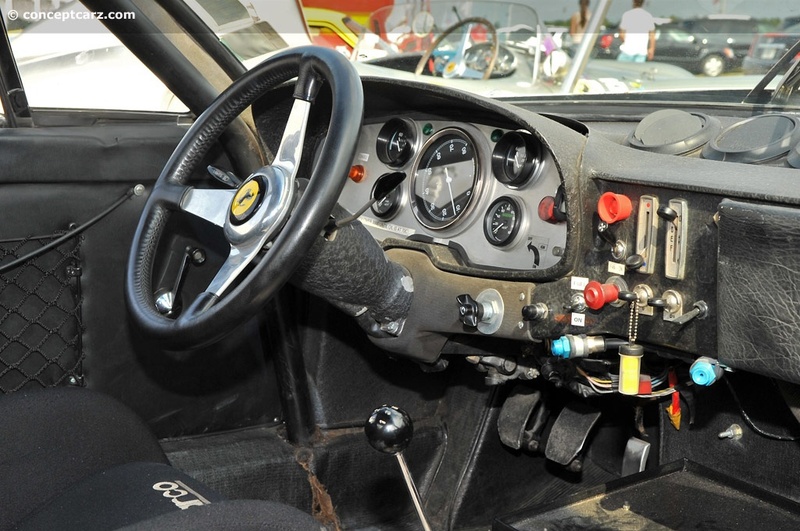 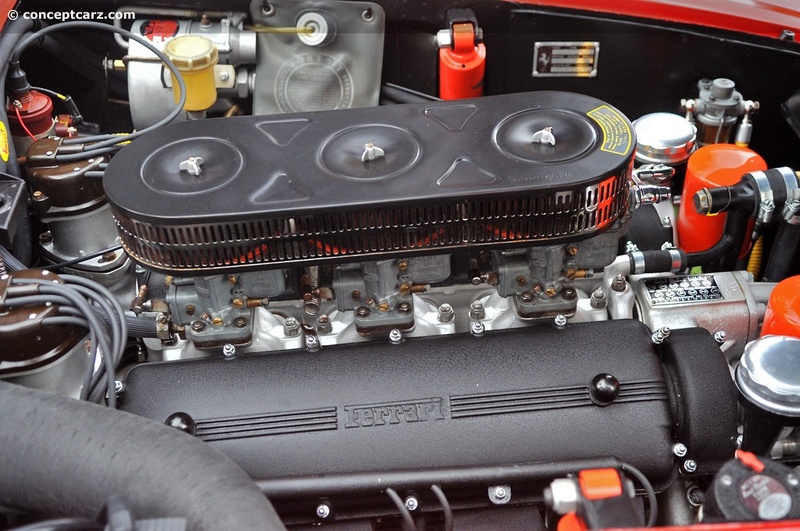 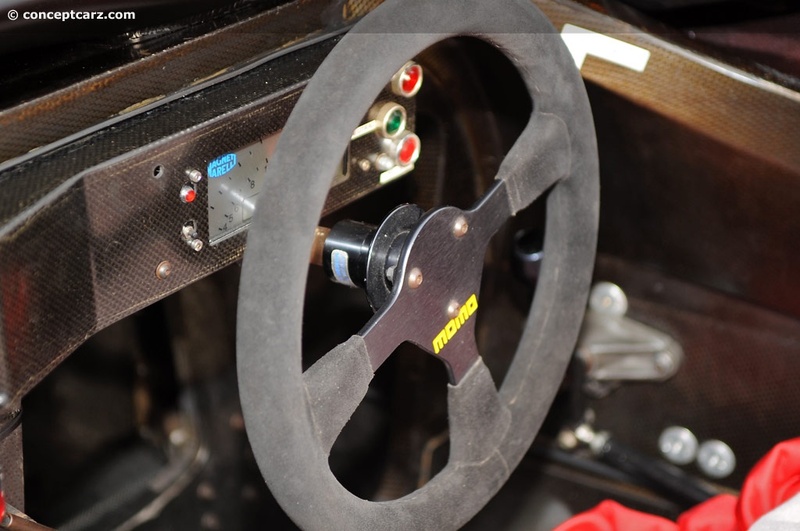 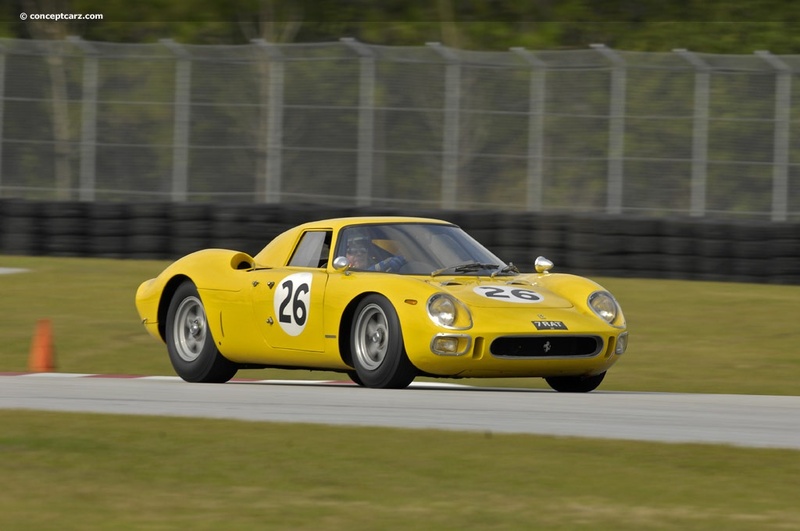 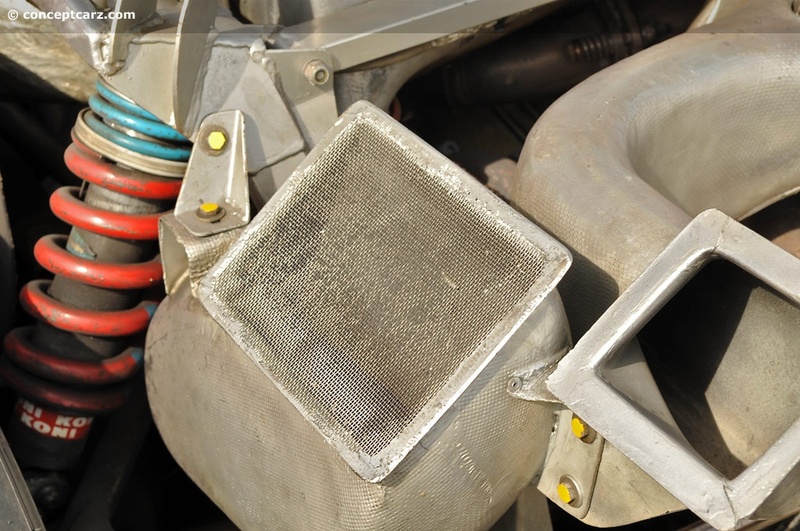 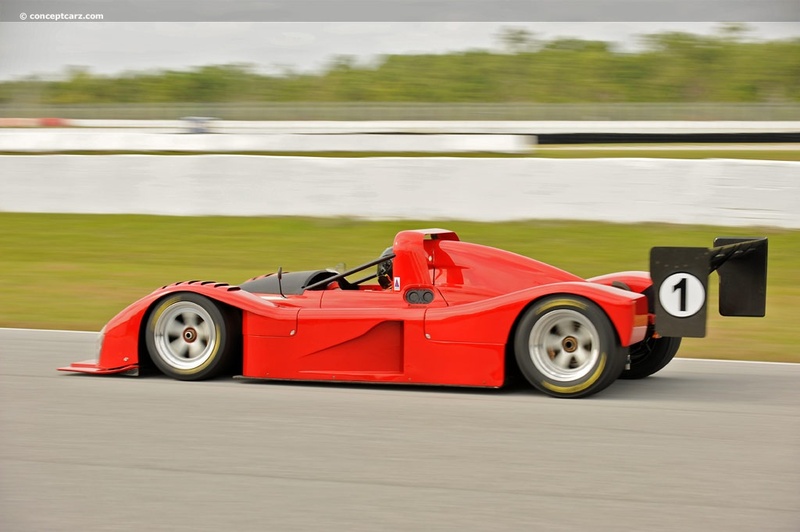 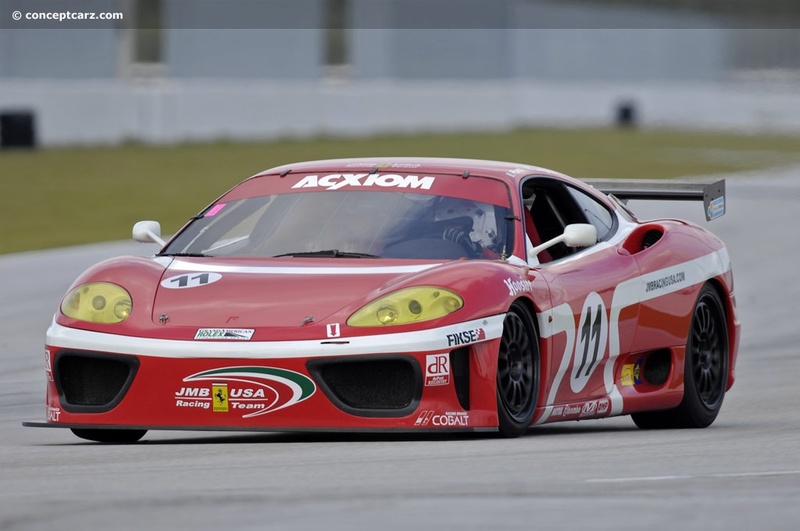 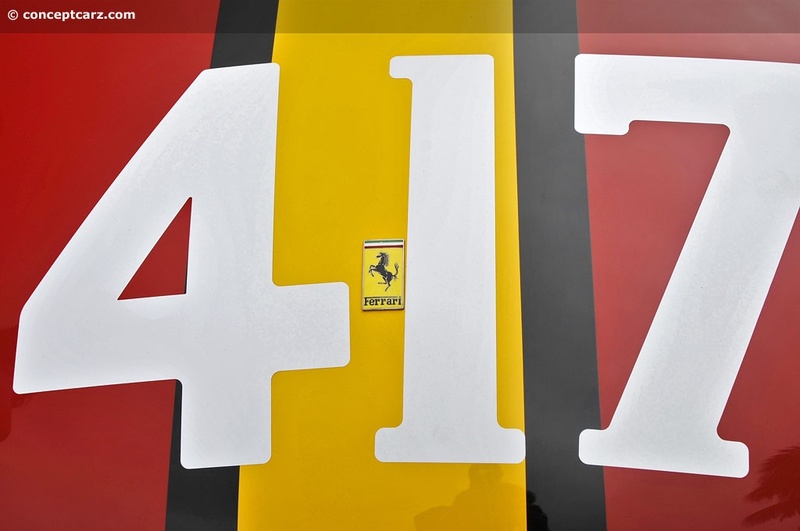 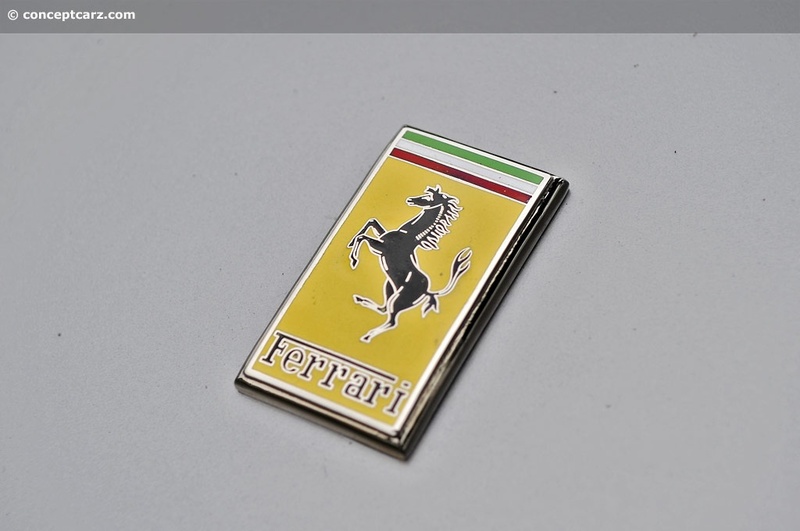 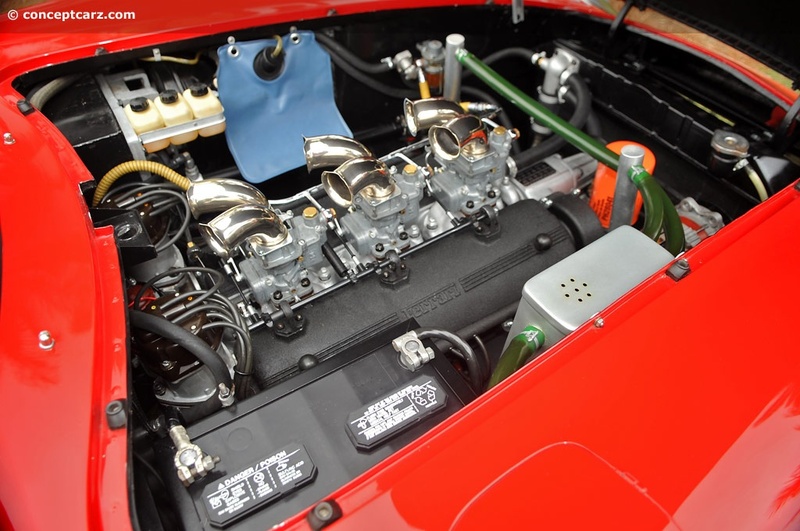 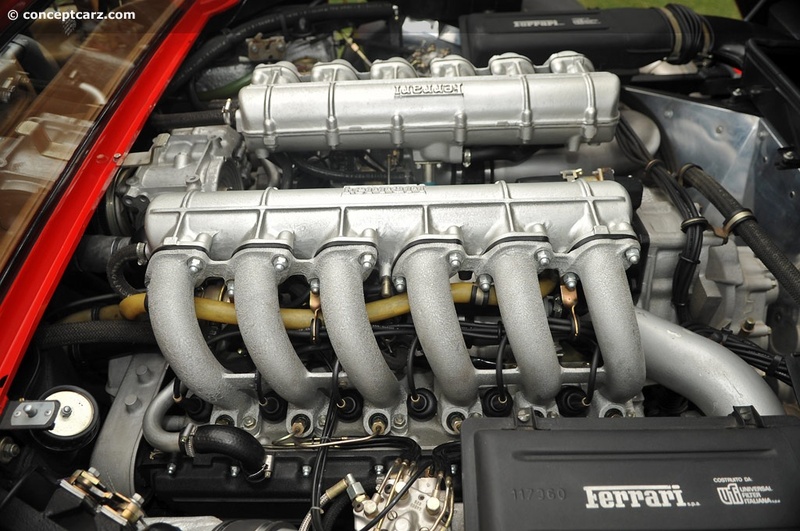 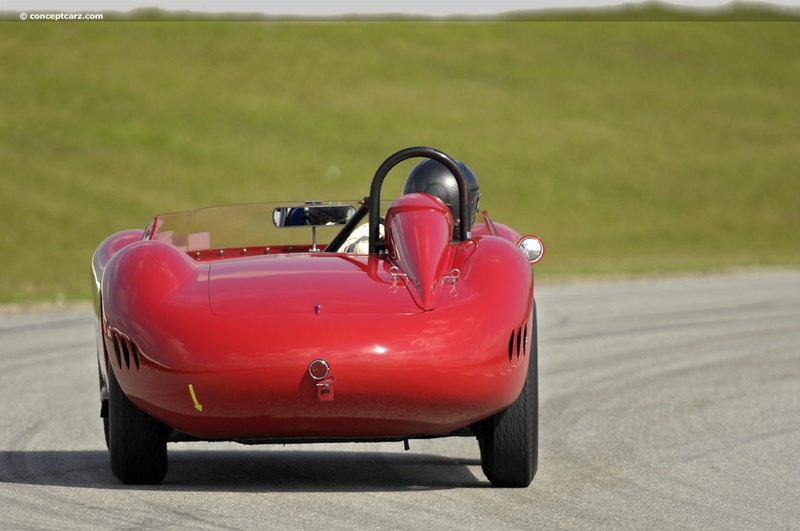 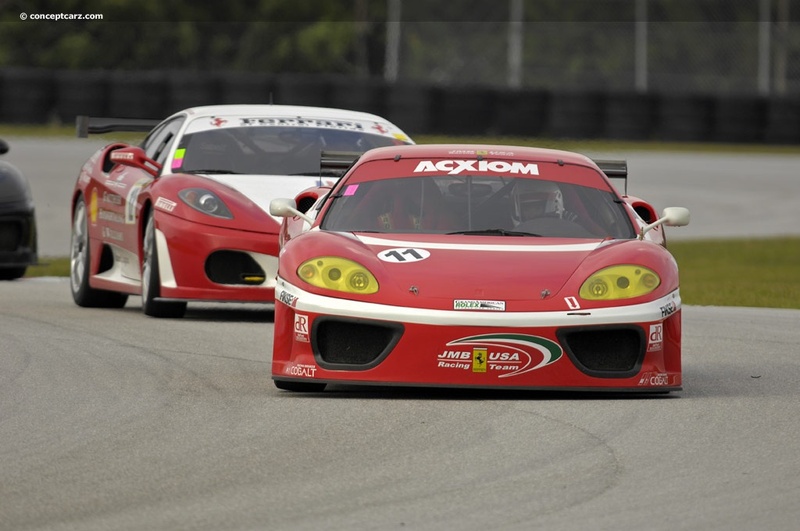 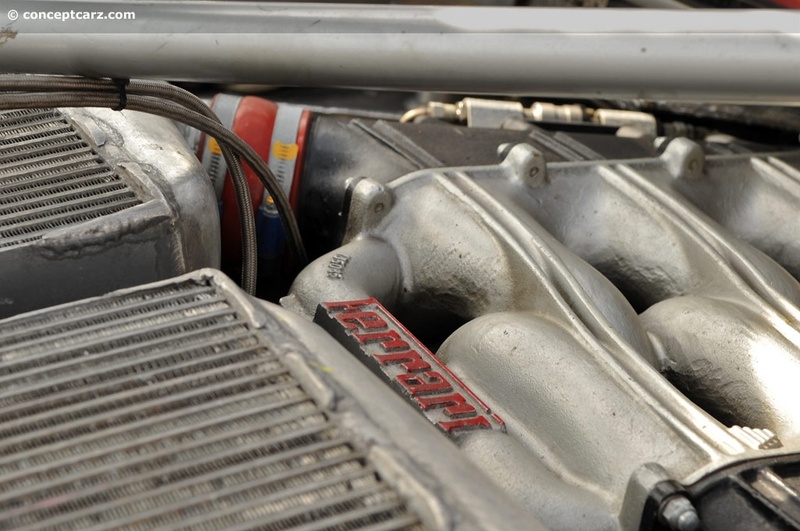 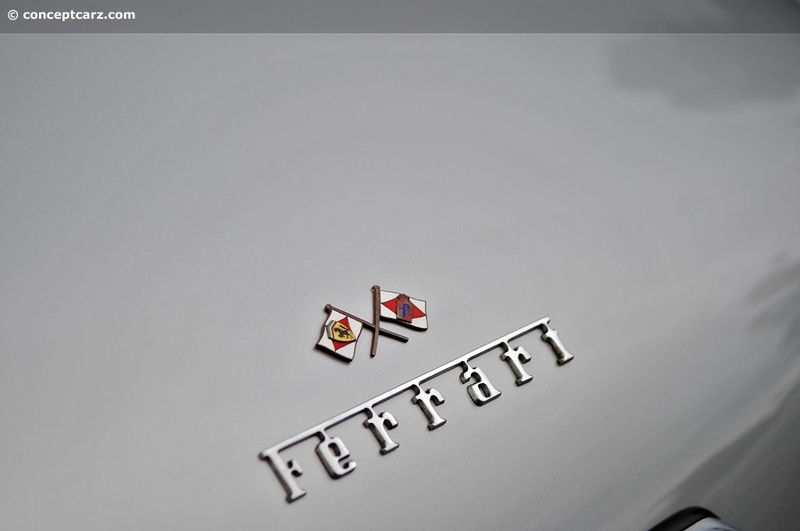 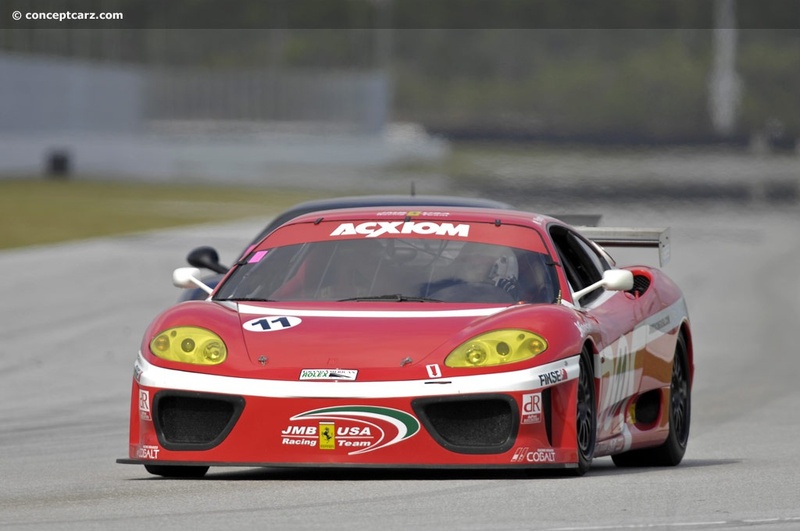 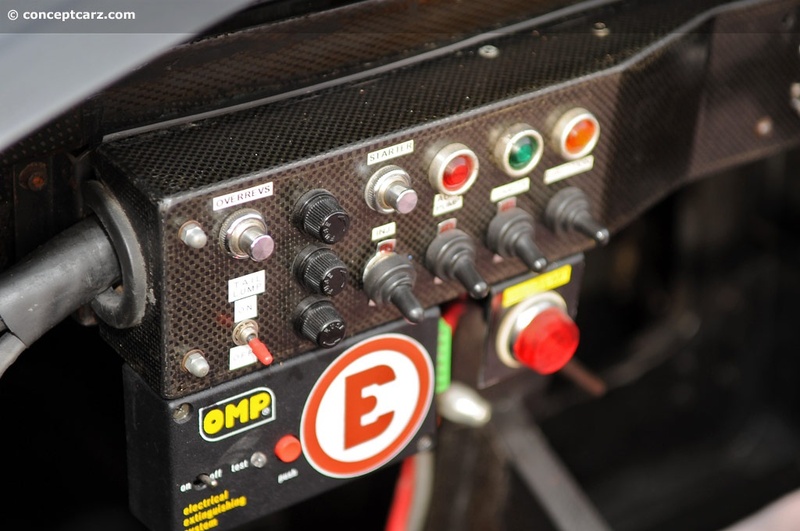 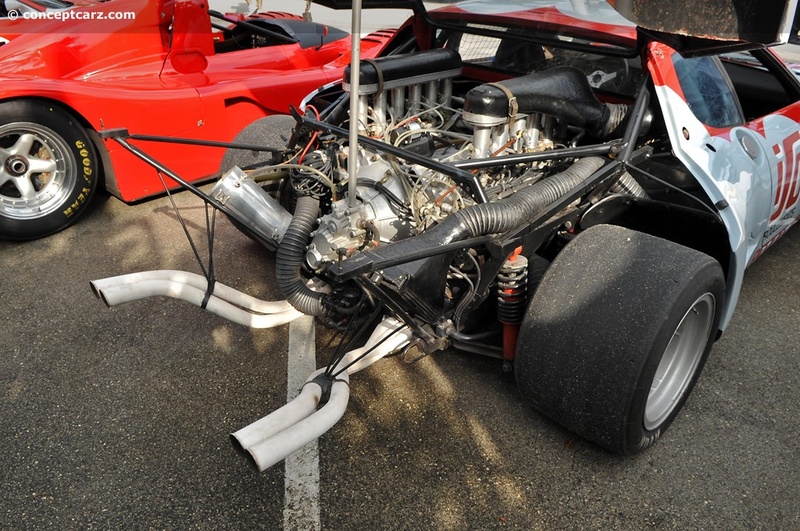 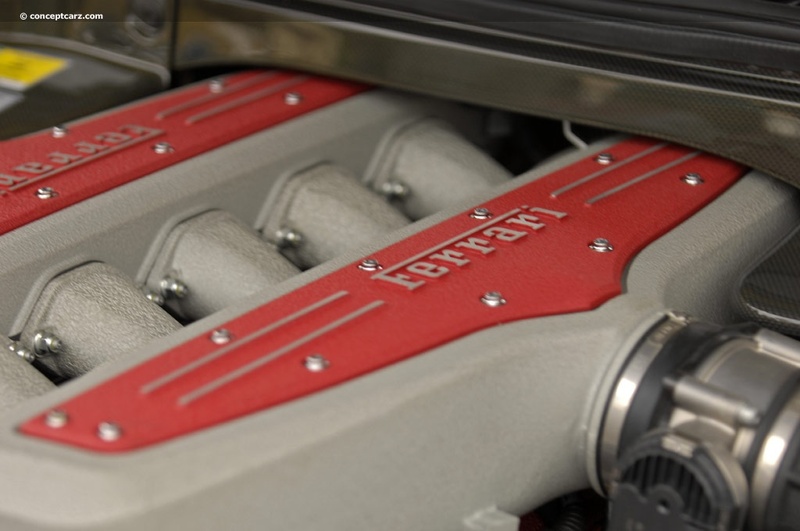 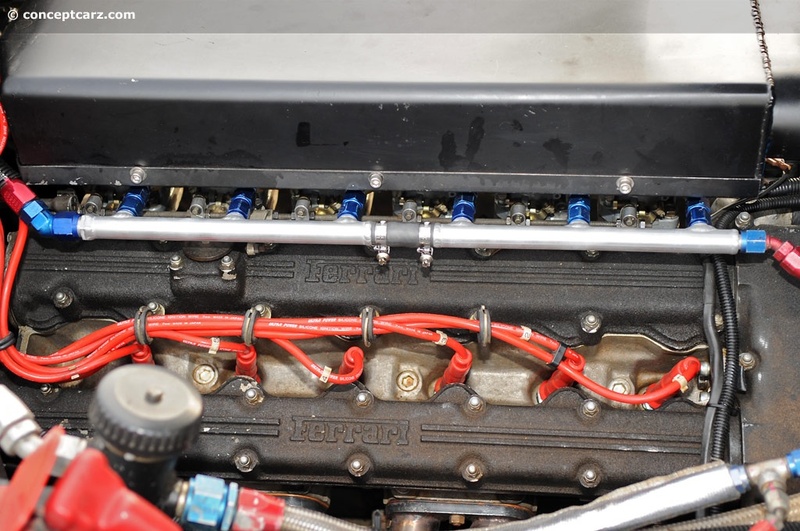 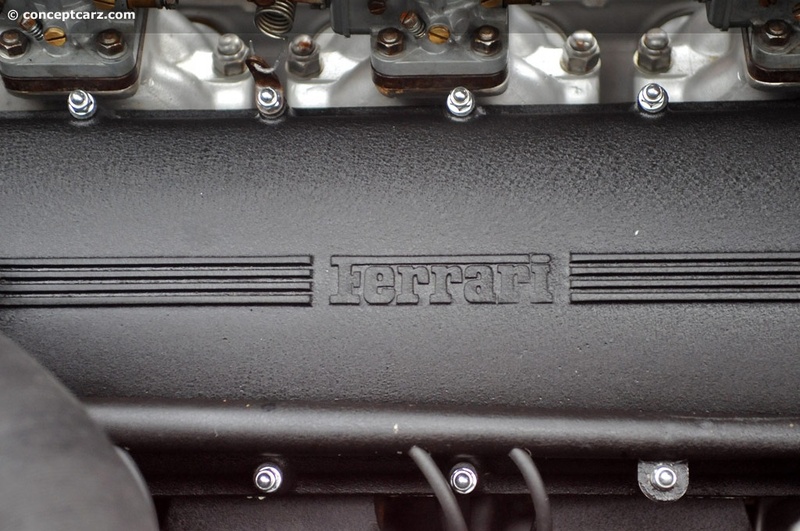 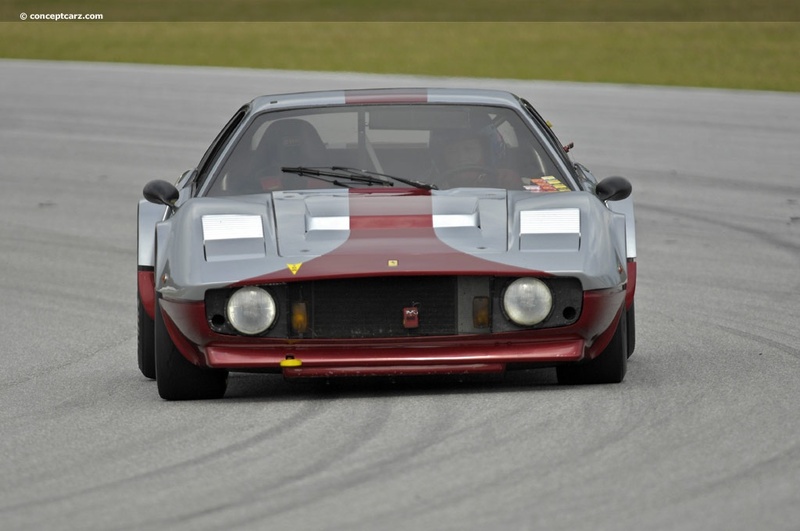 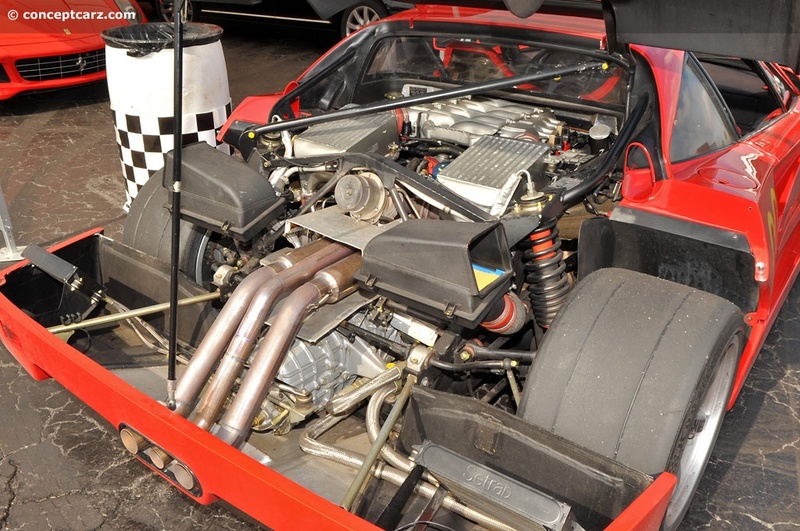 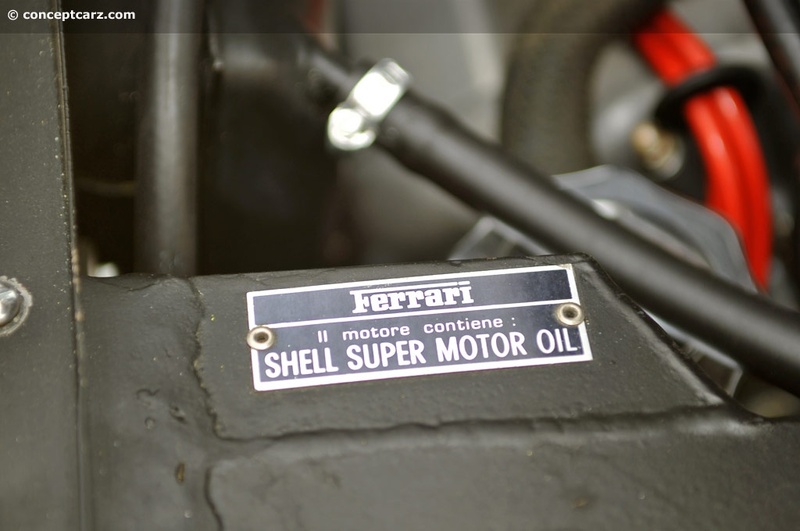 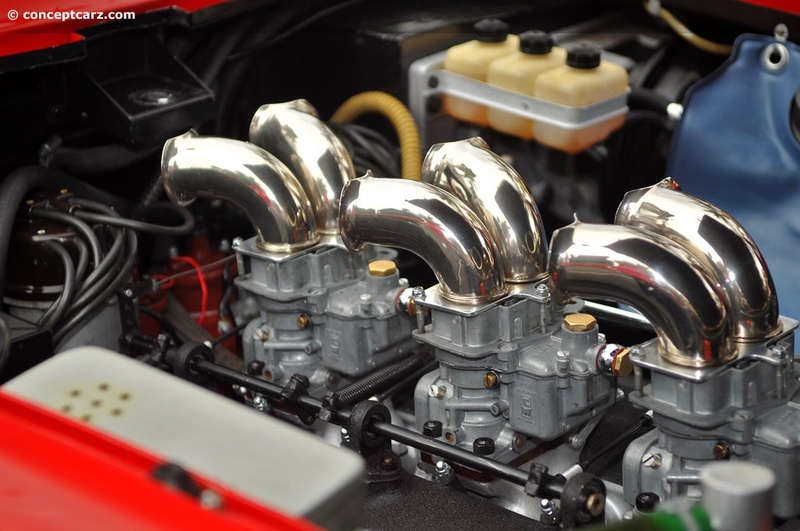 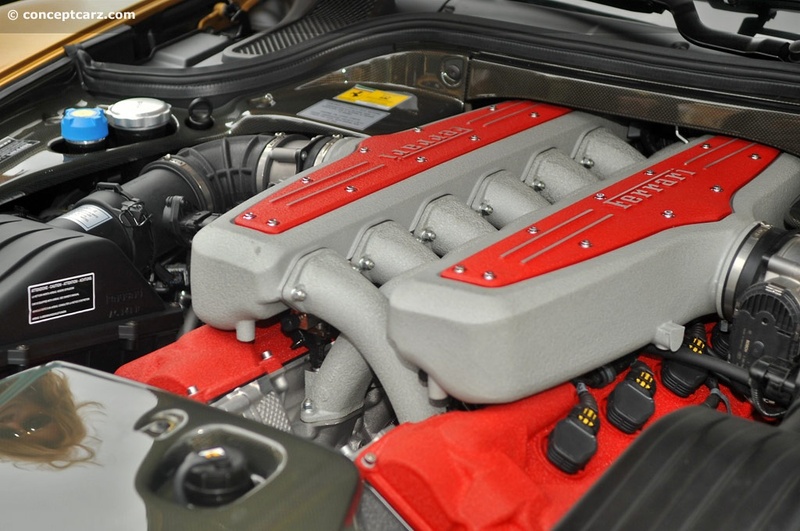 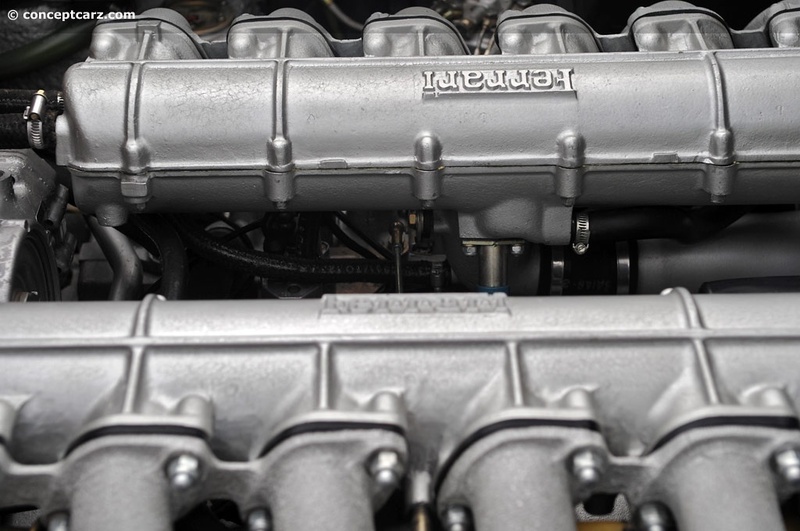 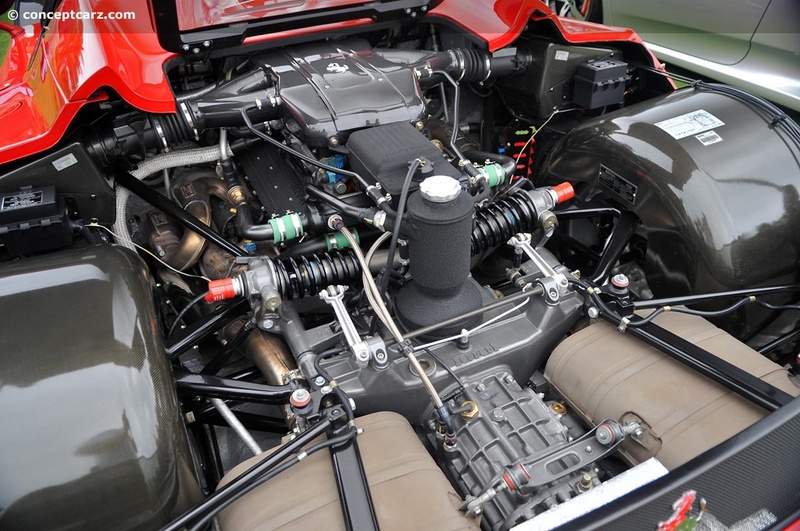 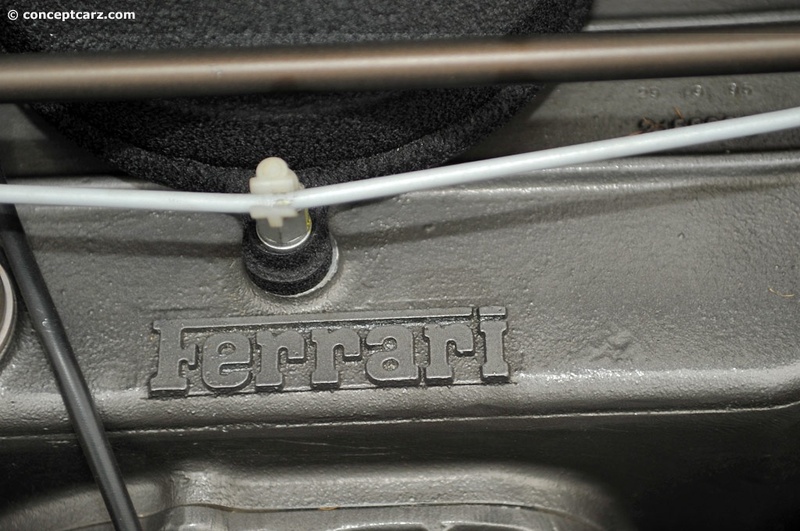 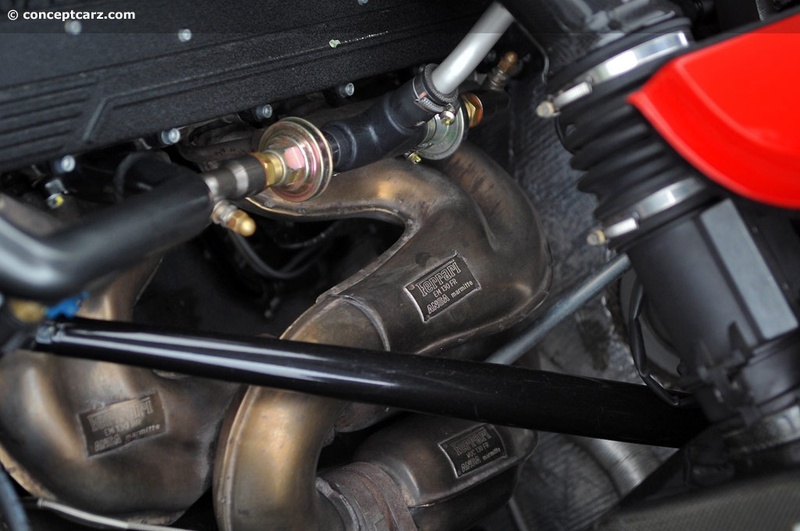 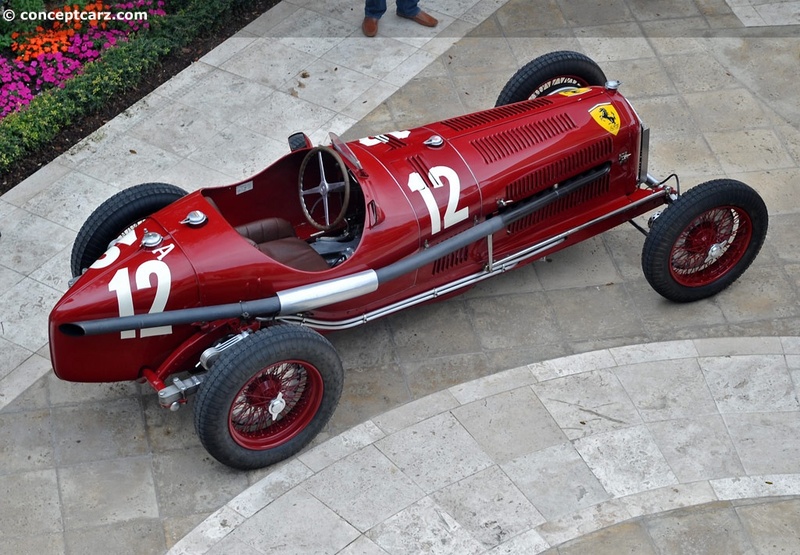 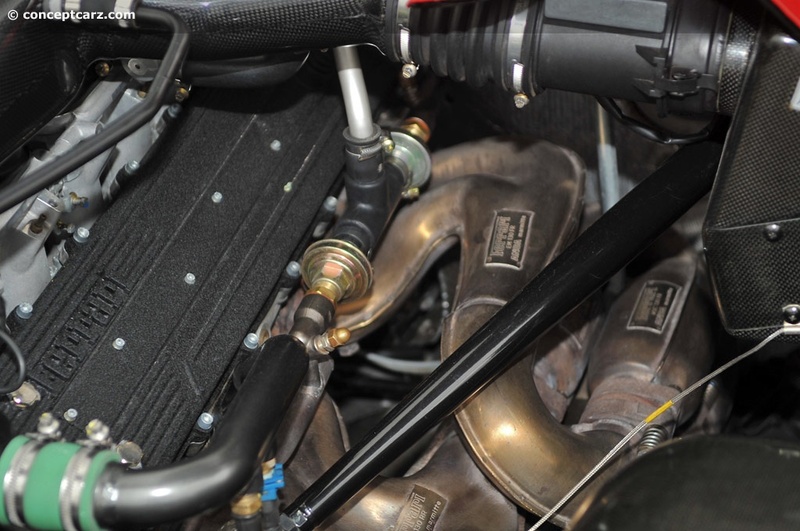 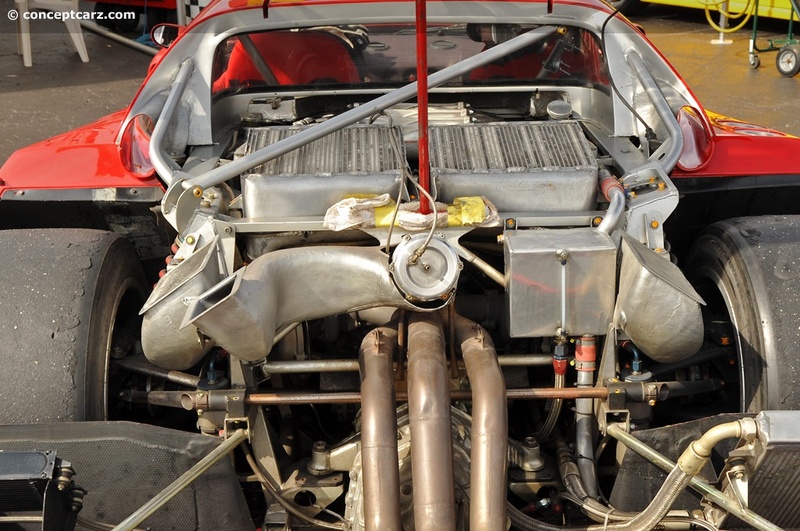 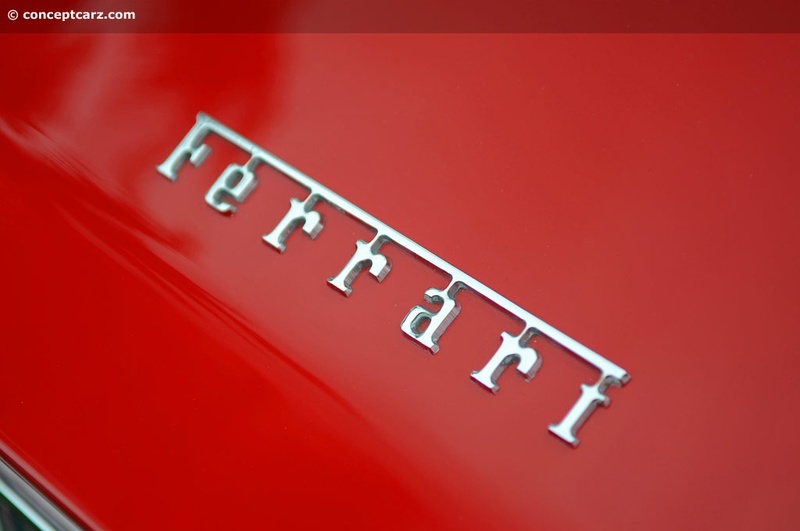 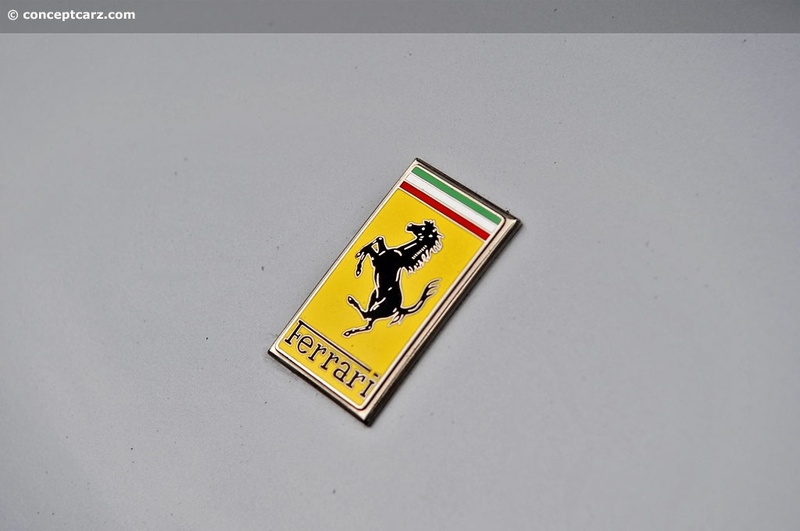 It went on to become one of the most success Ferrari racing cars. 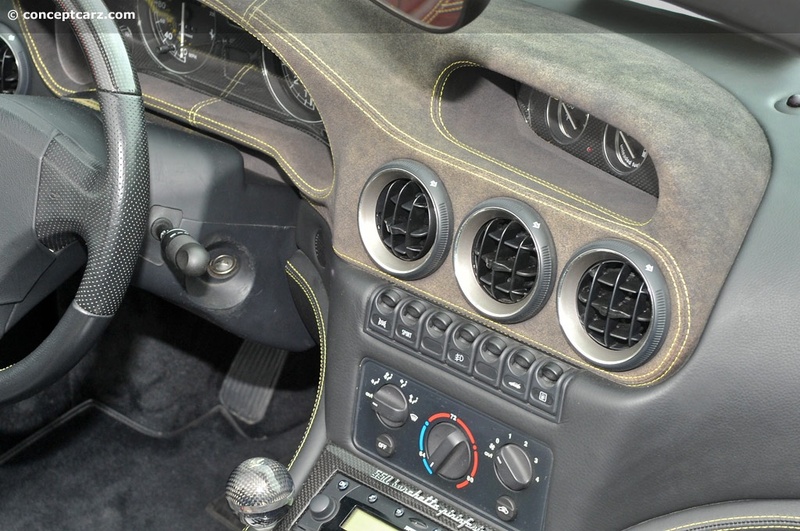 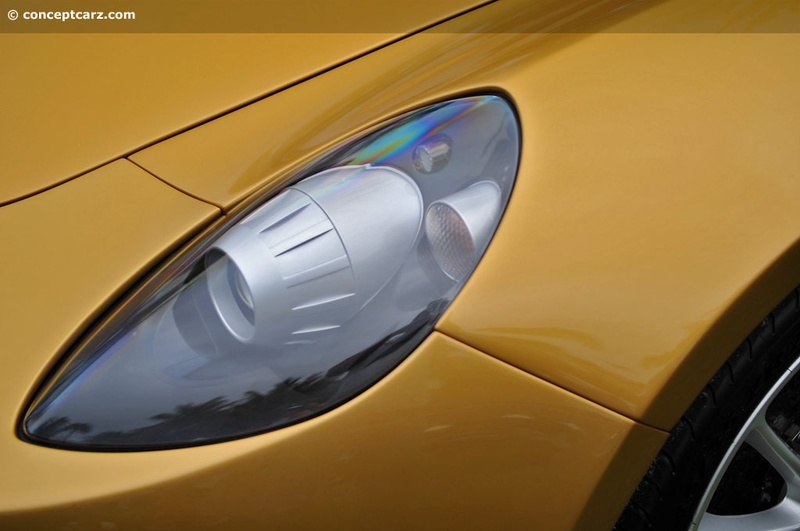 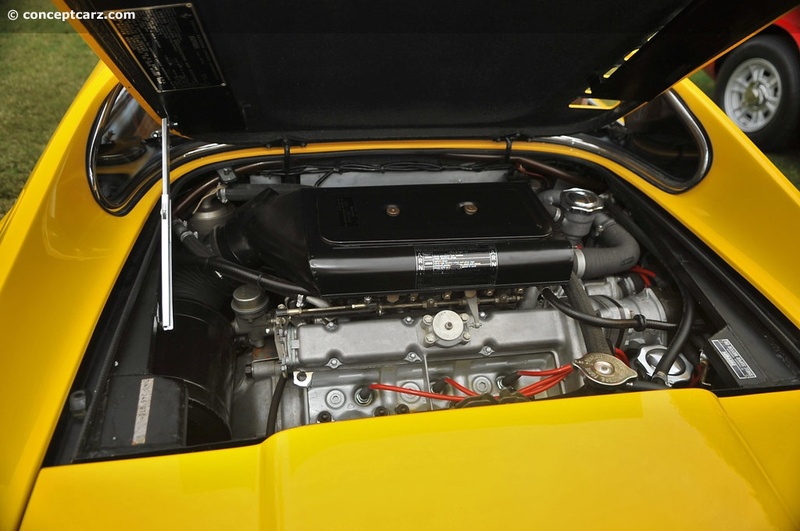 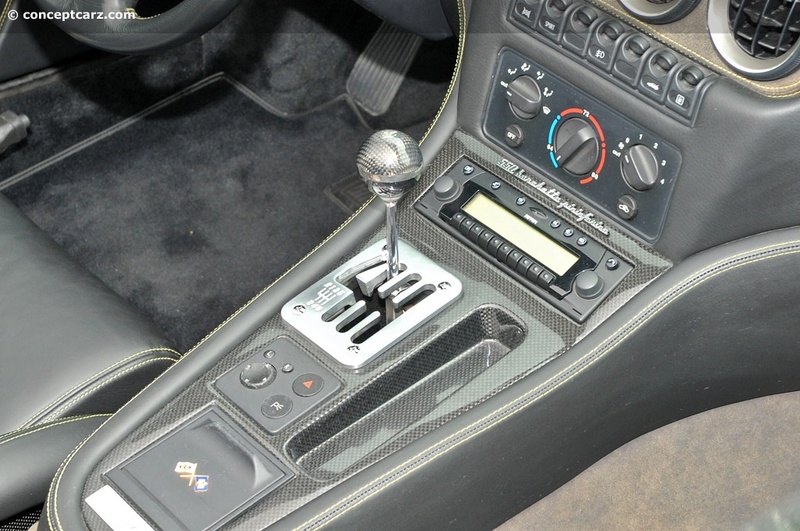 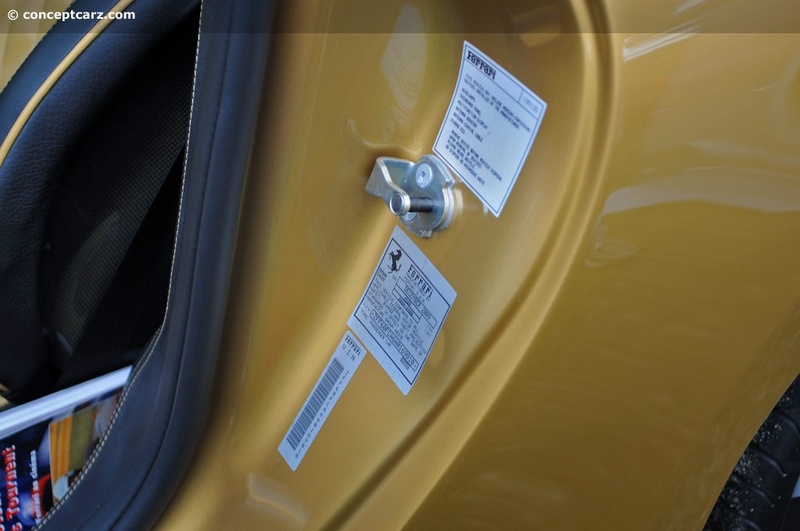 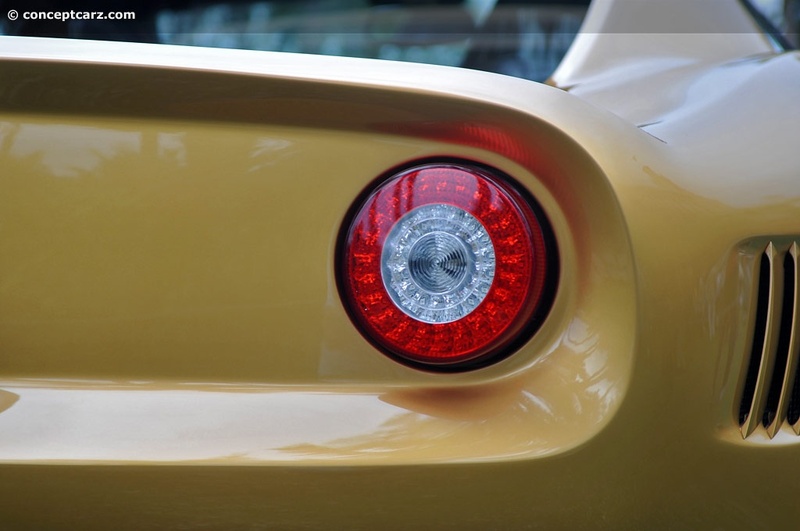 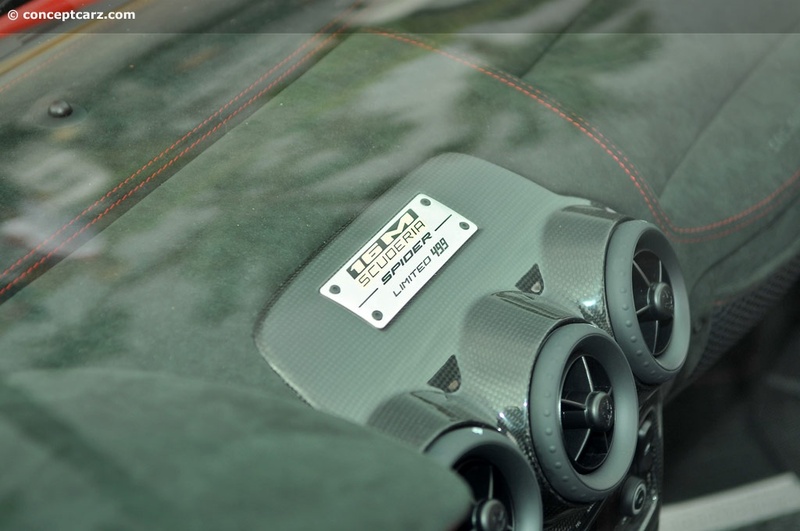 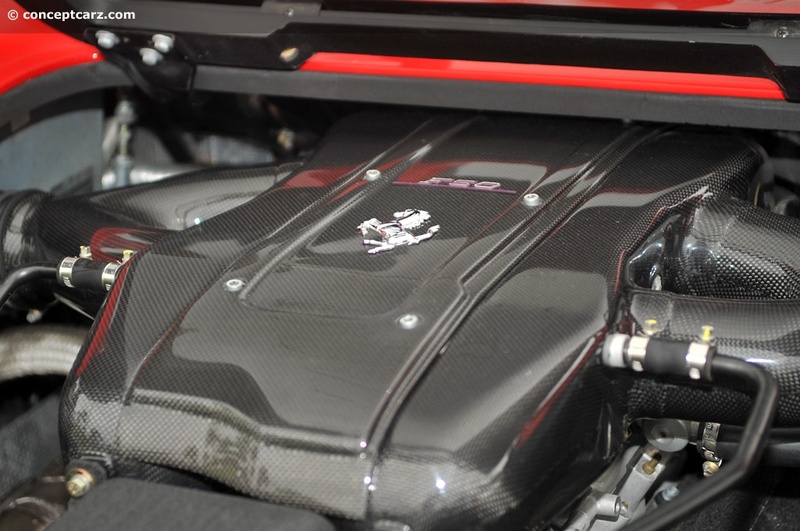 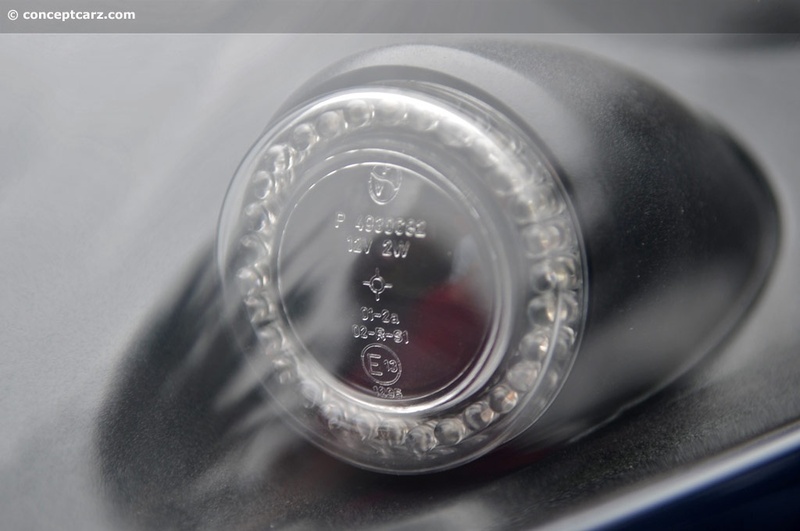 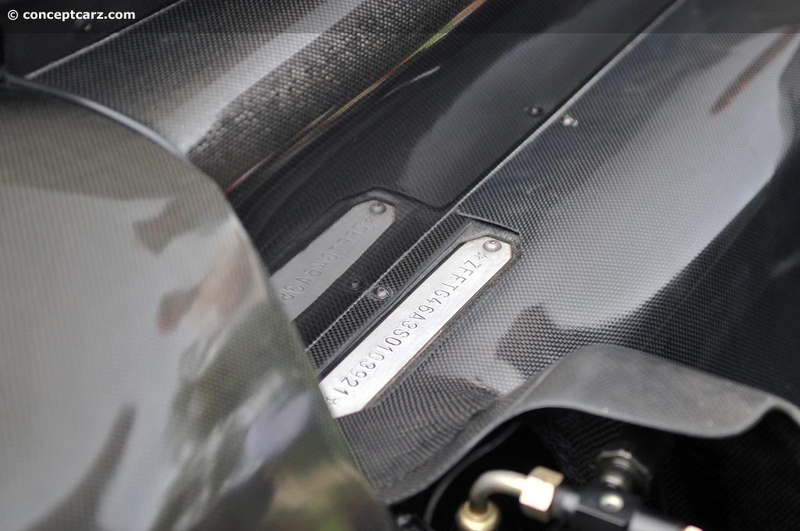 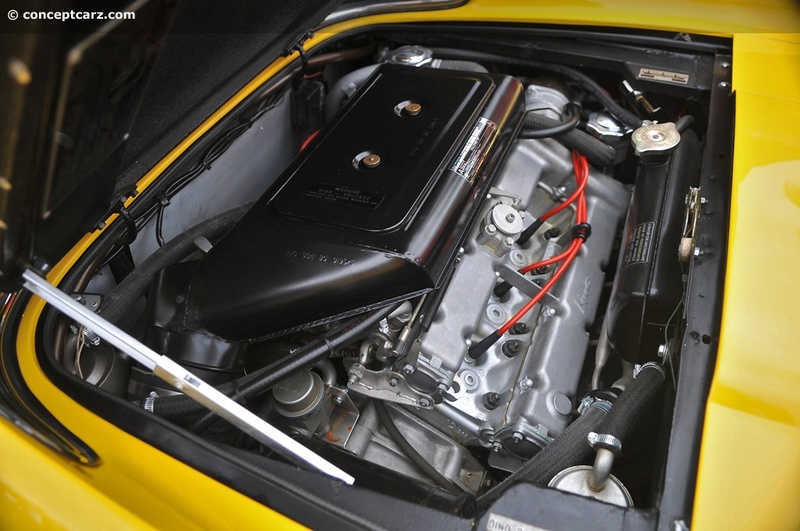 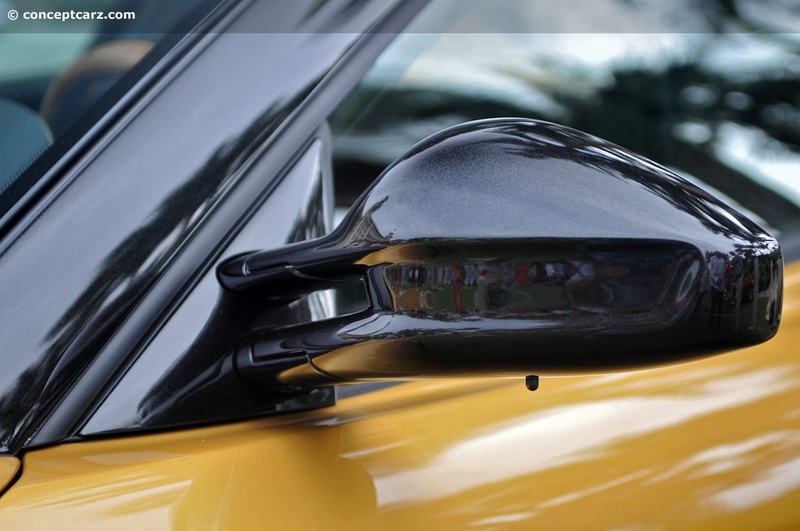 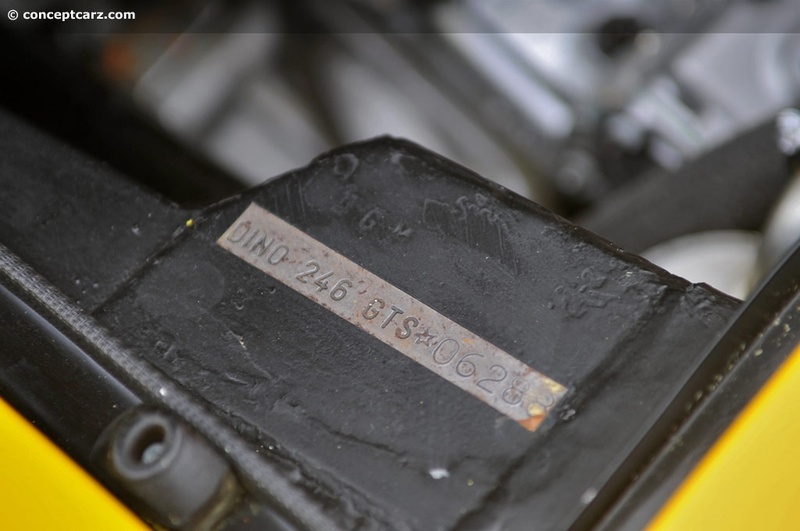 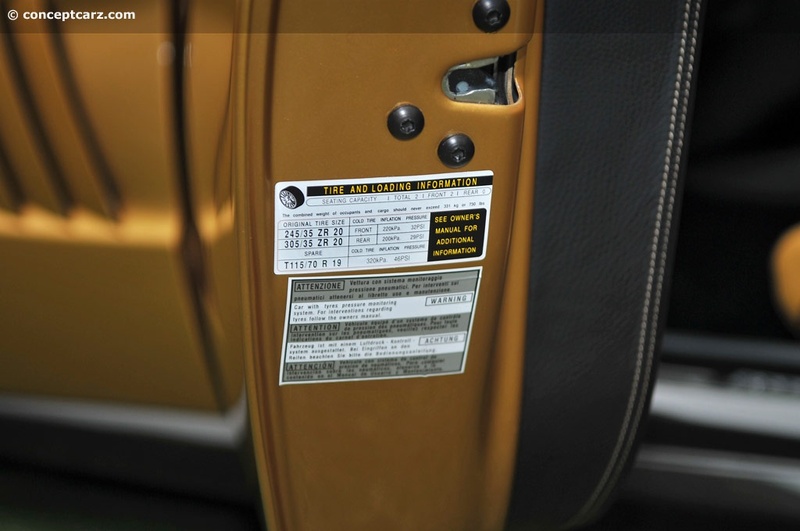 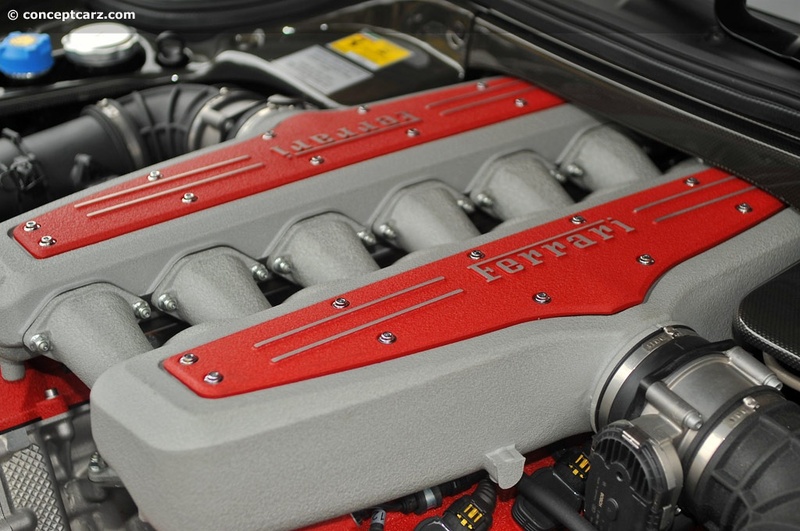 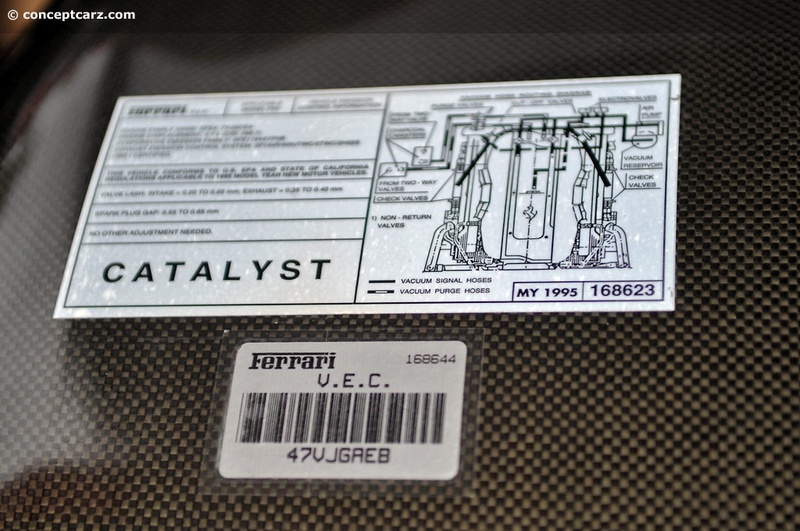 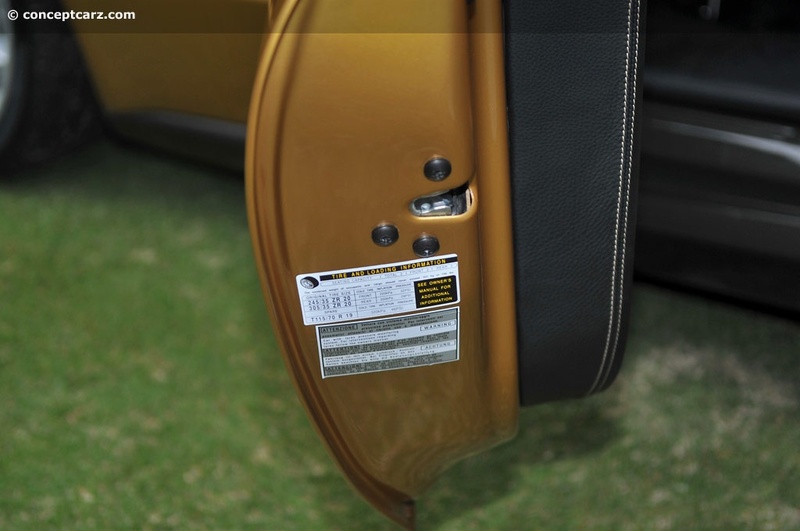 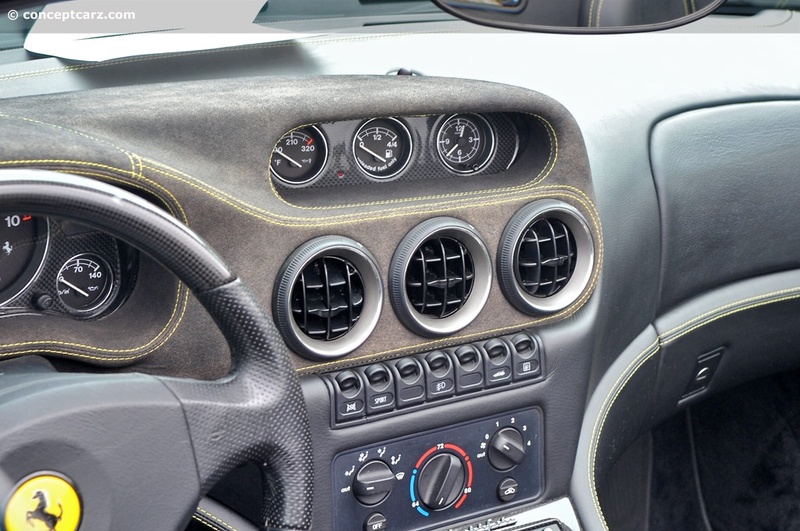 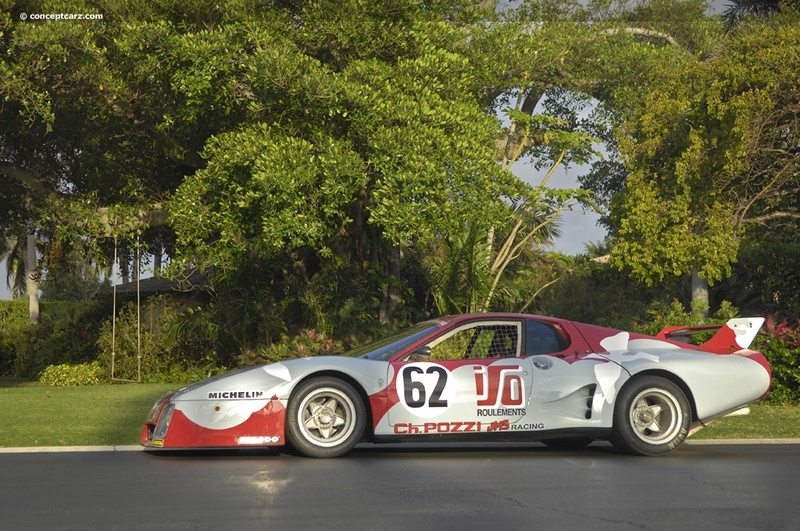 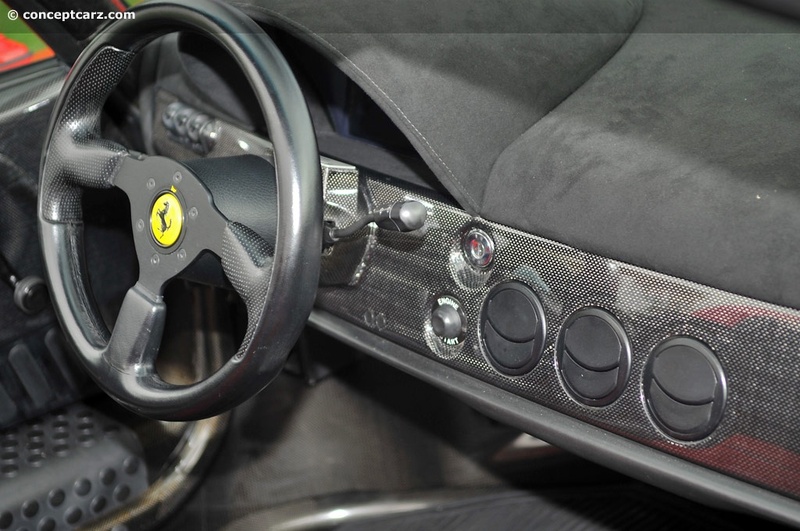 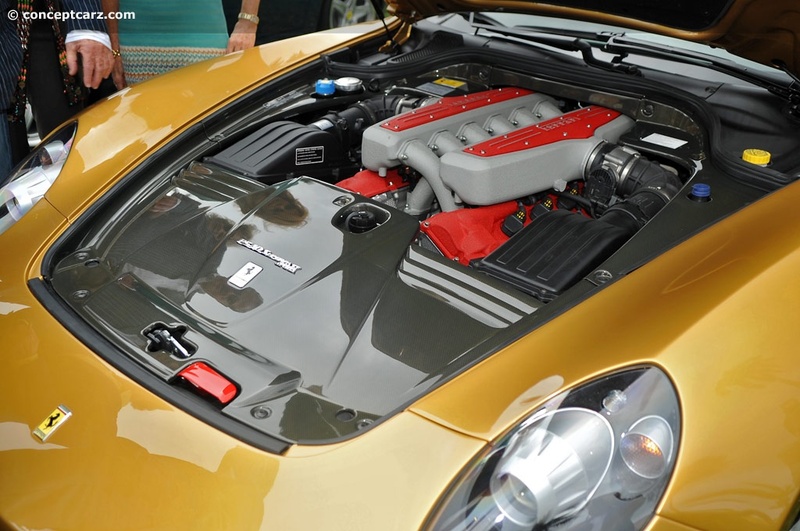 In 2006, the importance of this car was reinforced when it was sold for the sum of $5 million. 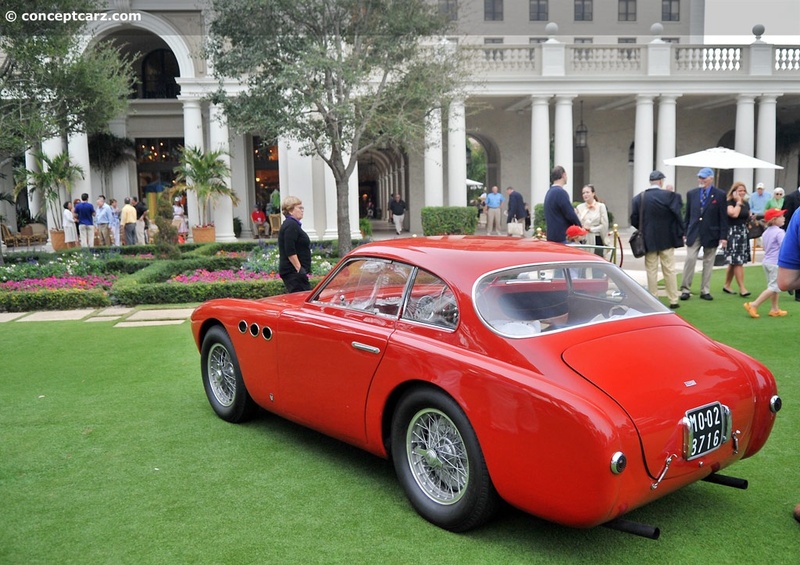 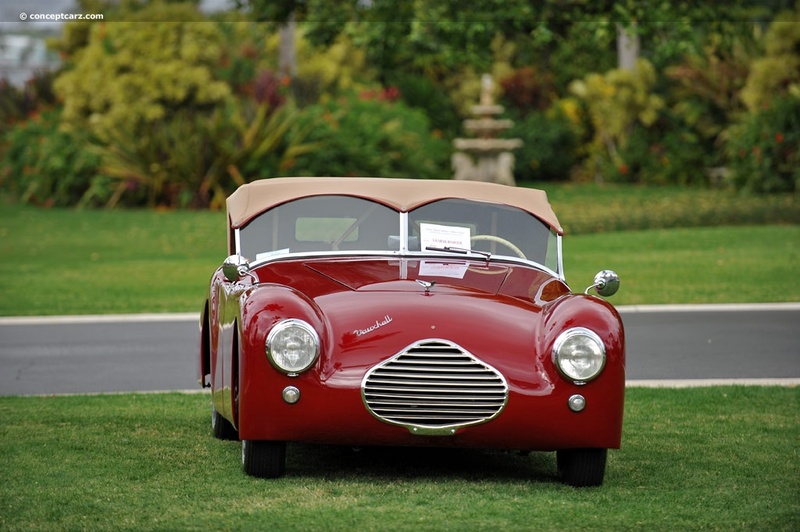 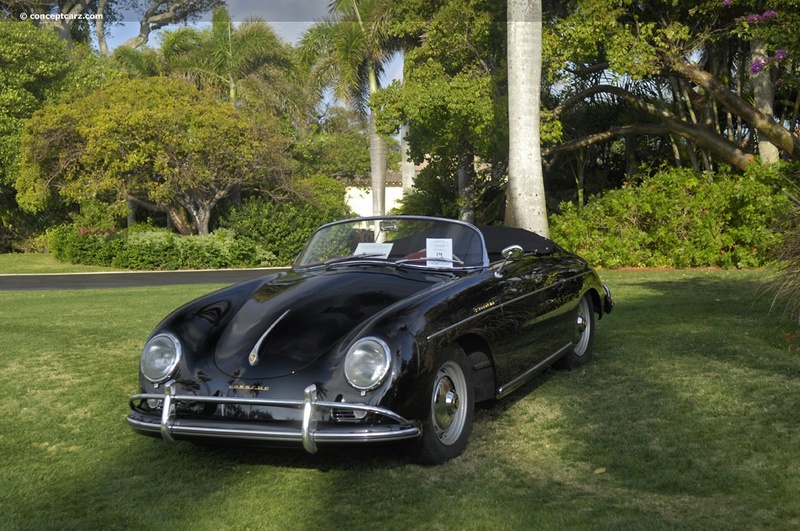 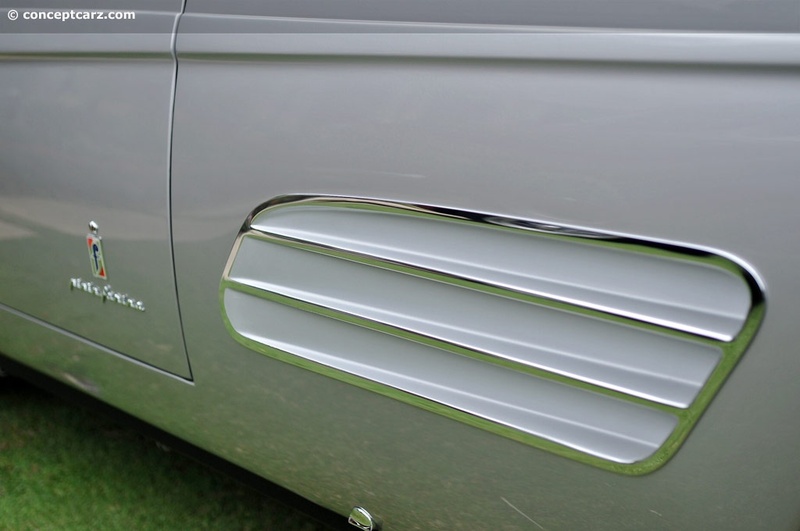 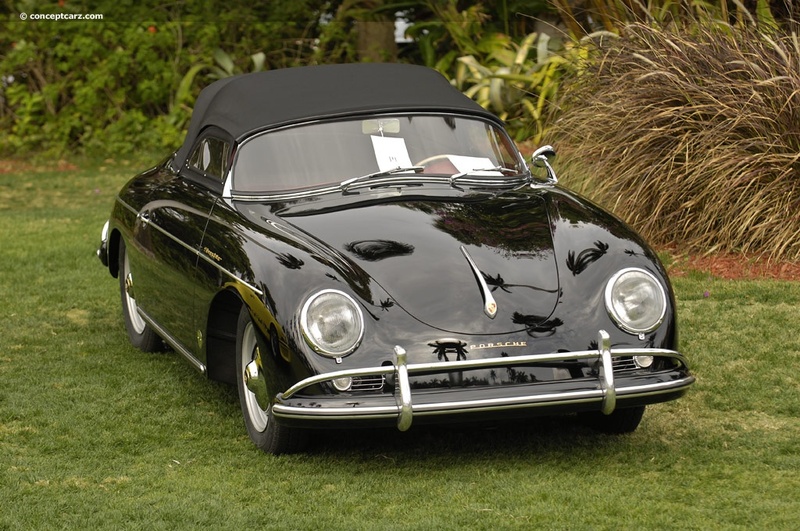 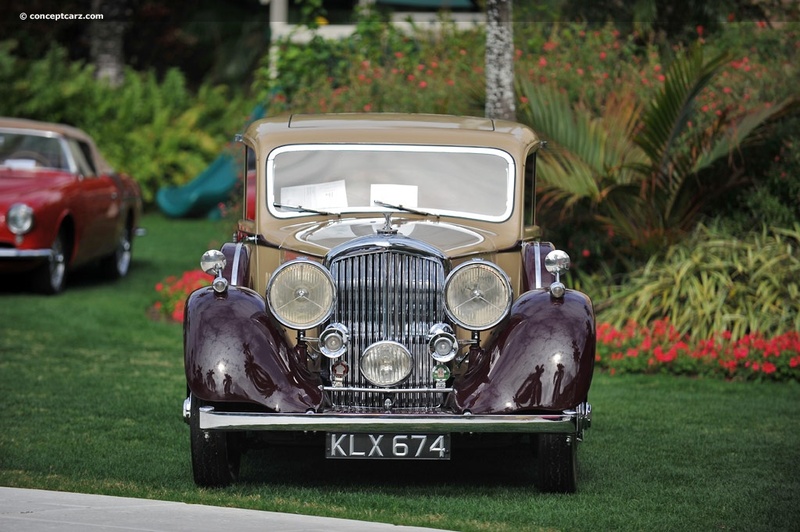 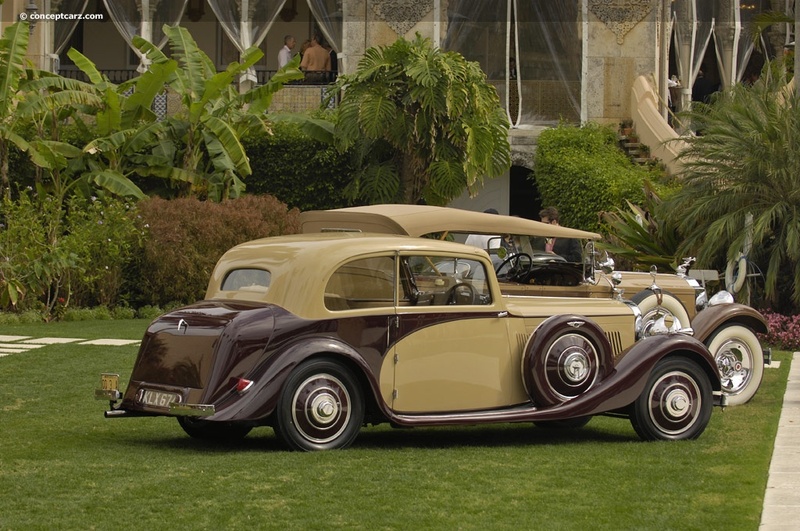 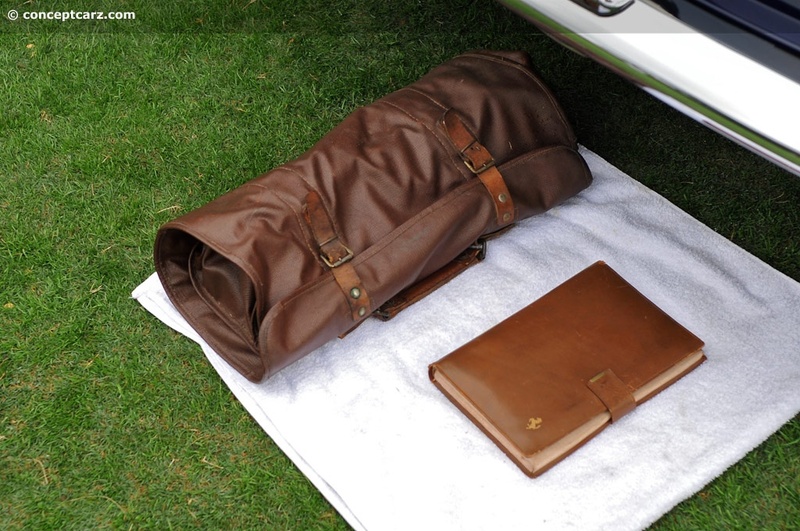 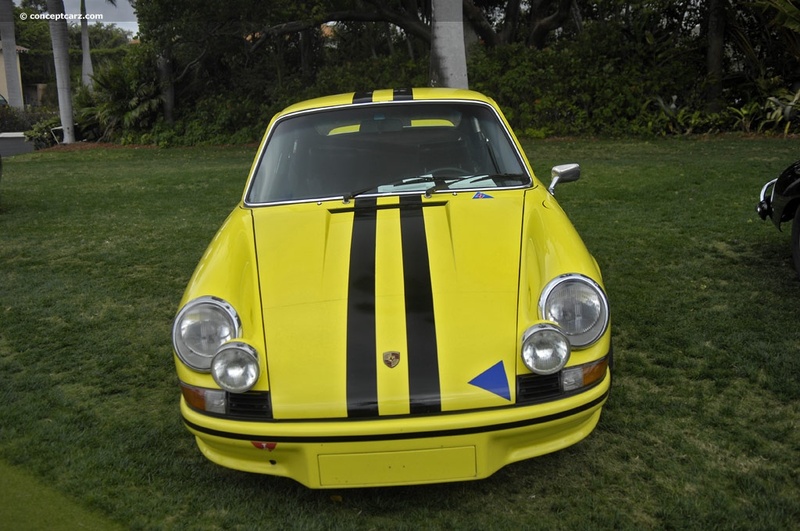 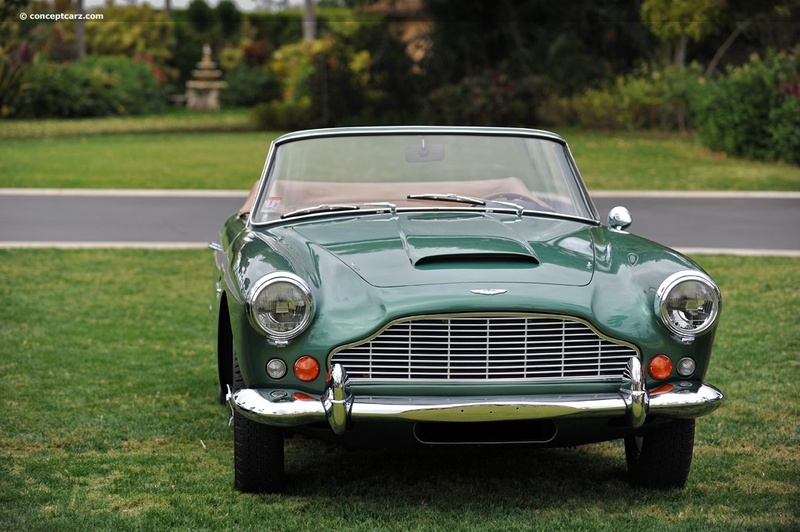 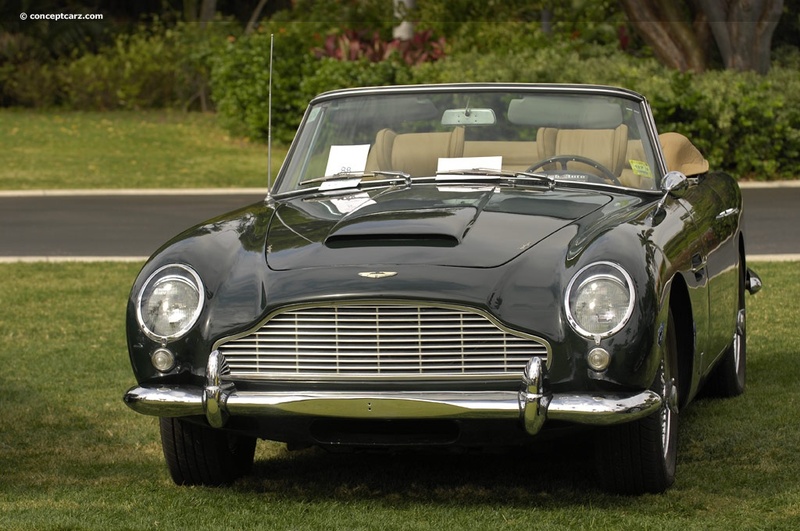 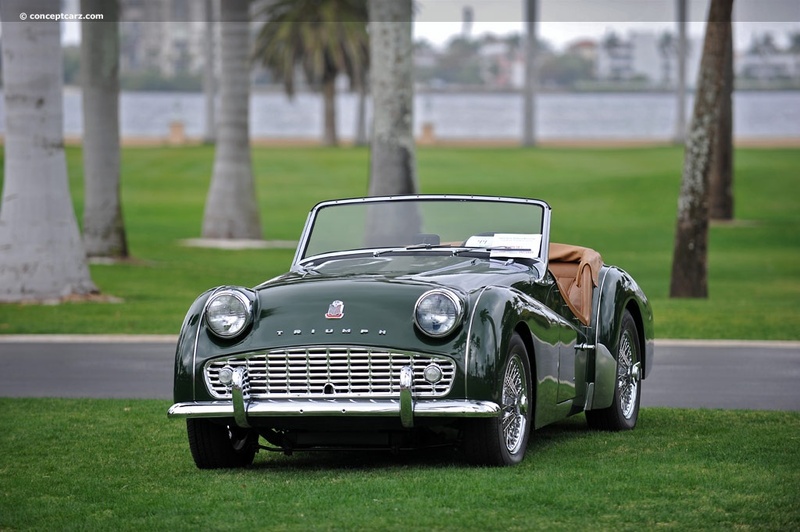 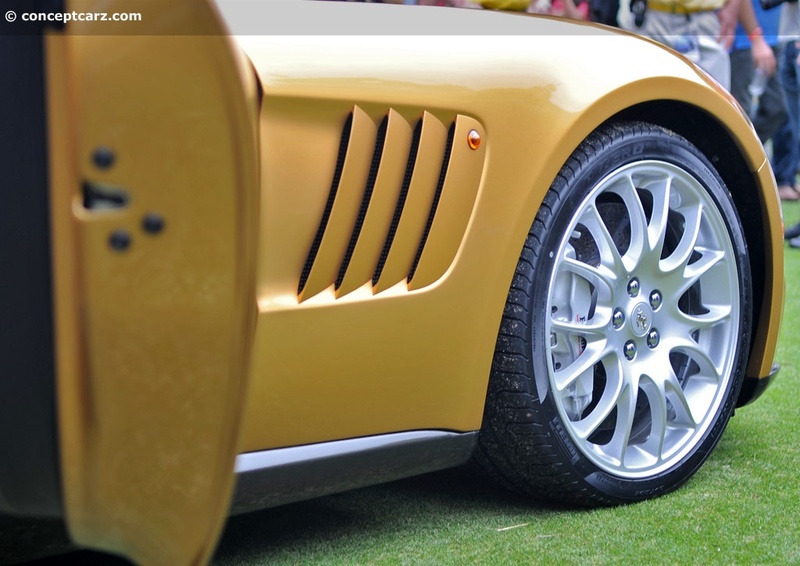 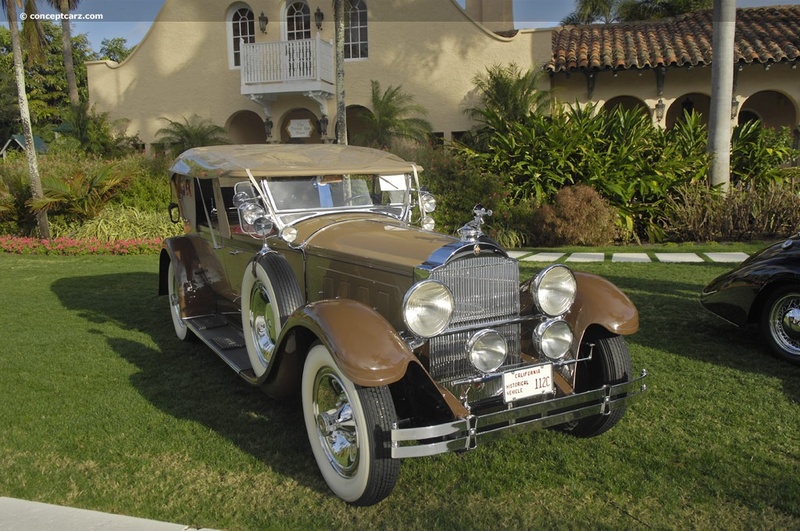 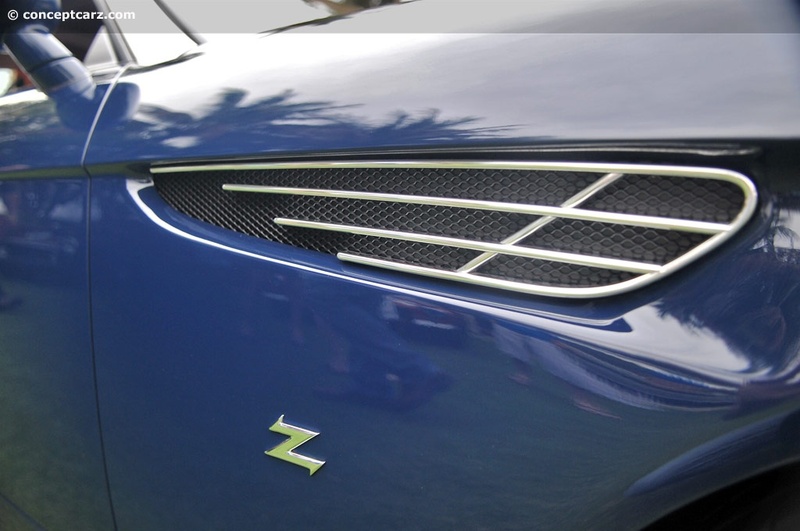 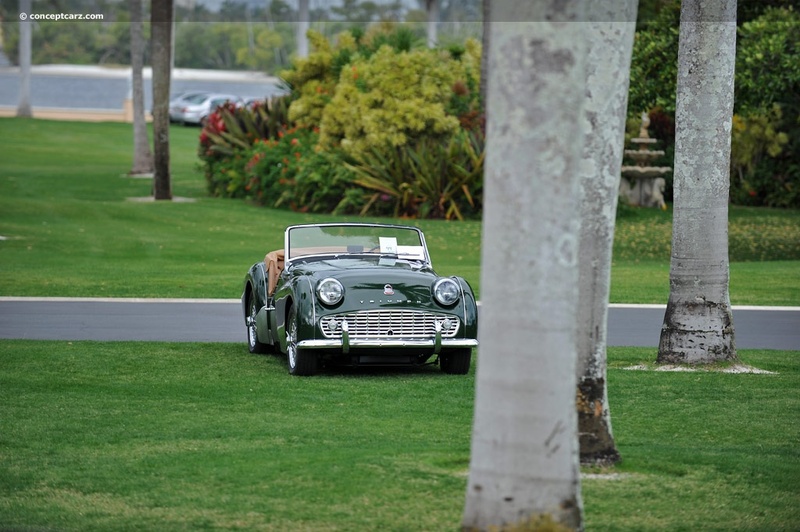 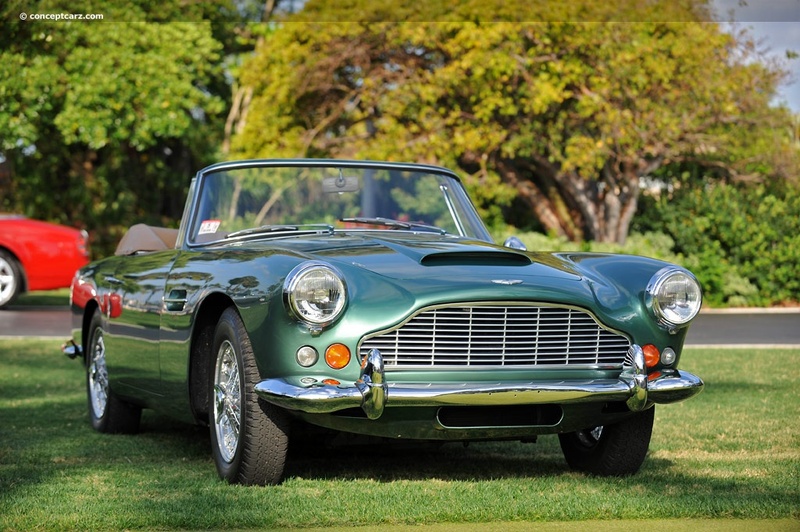 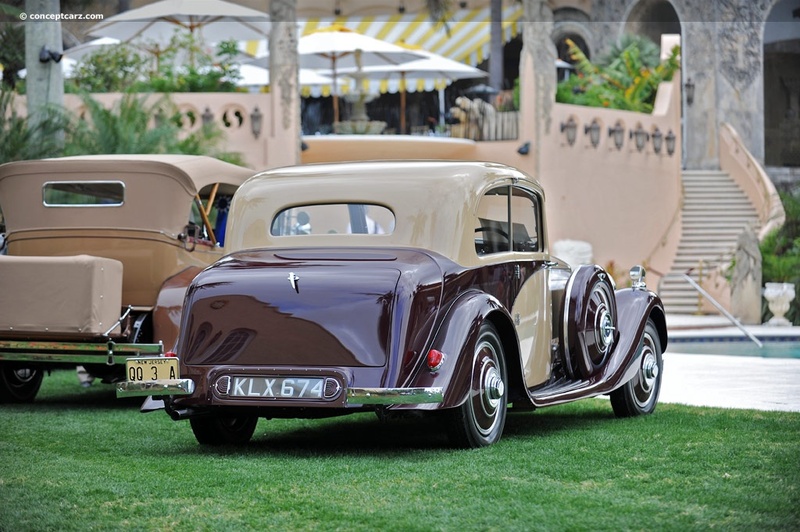 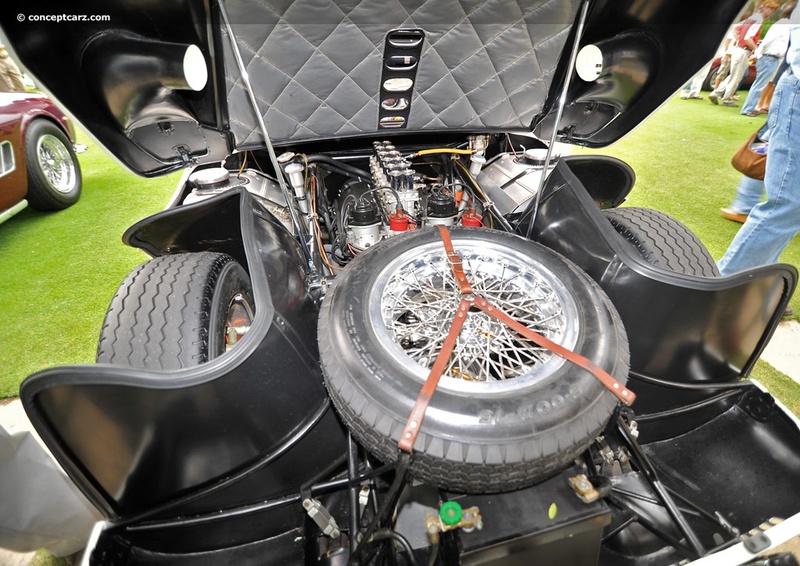 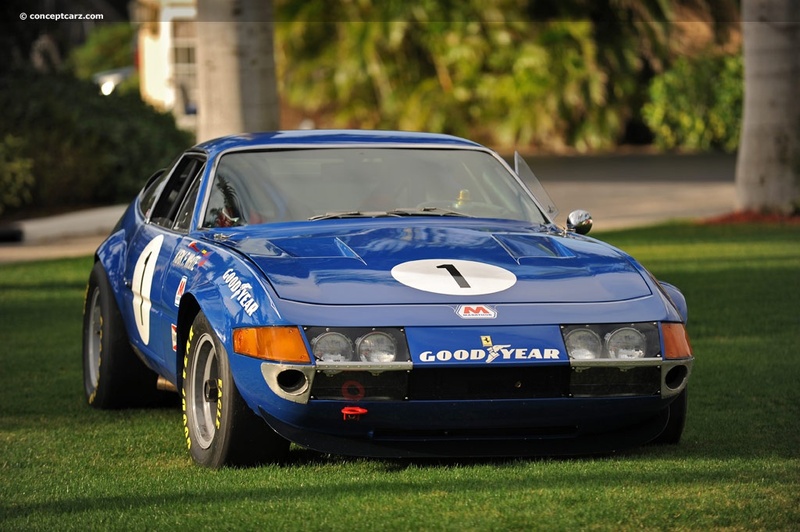 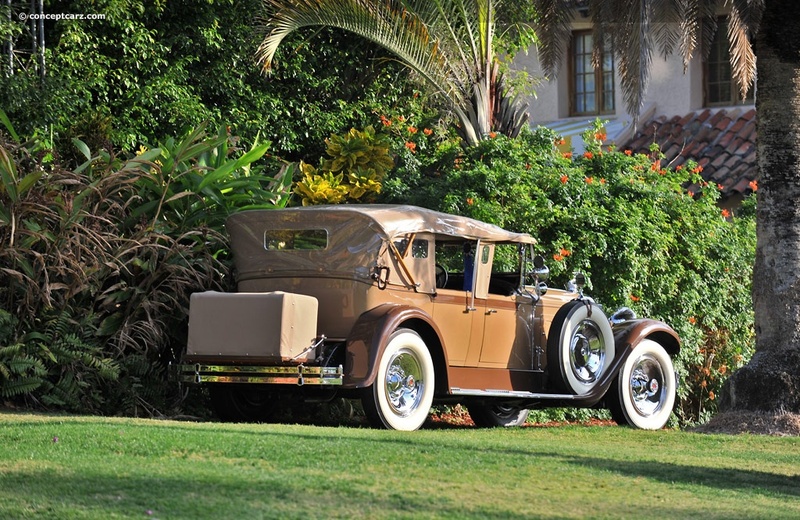 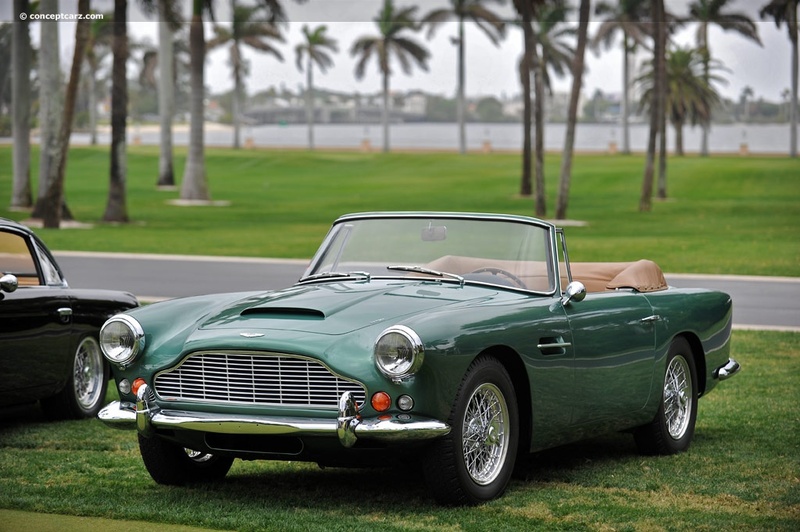 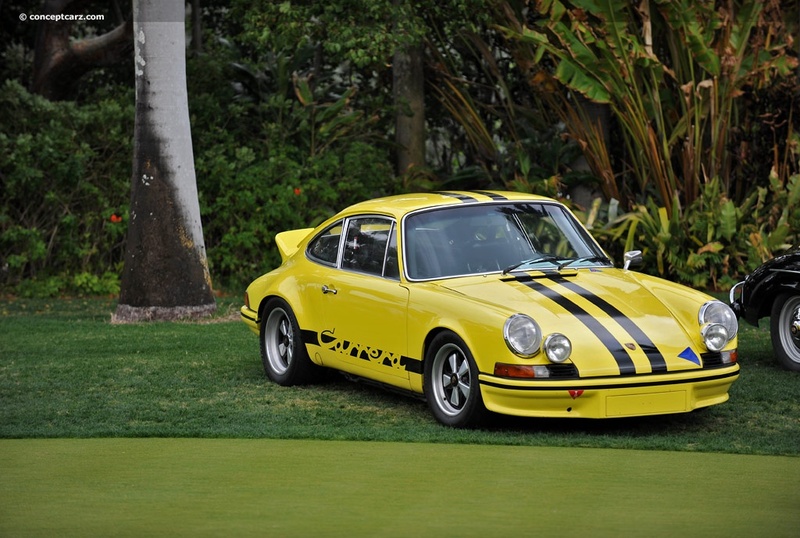 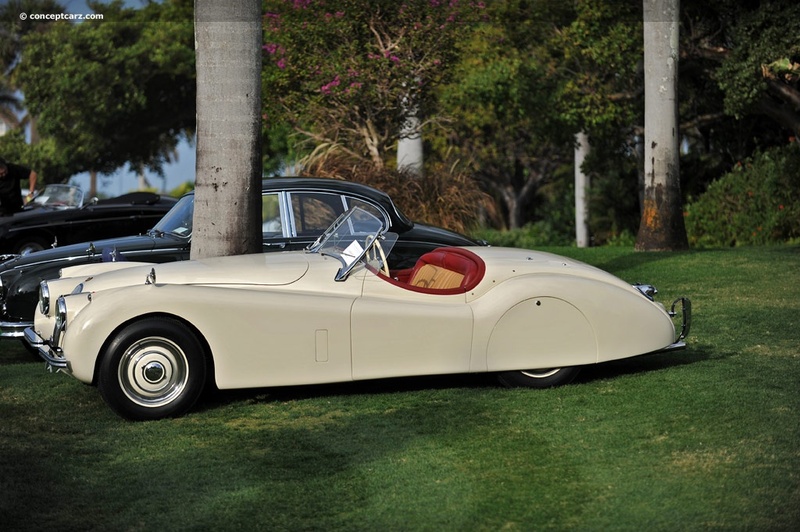 Recently, it made an appearance on the lawn of the Pebble Beach Concours. 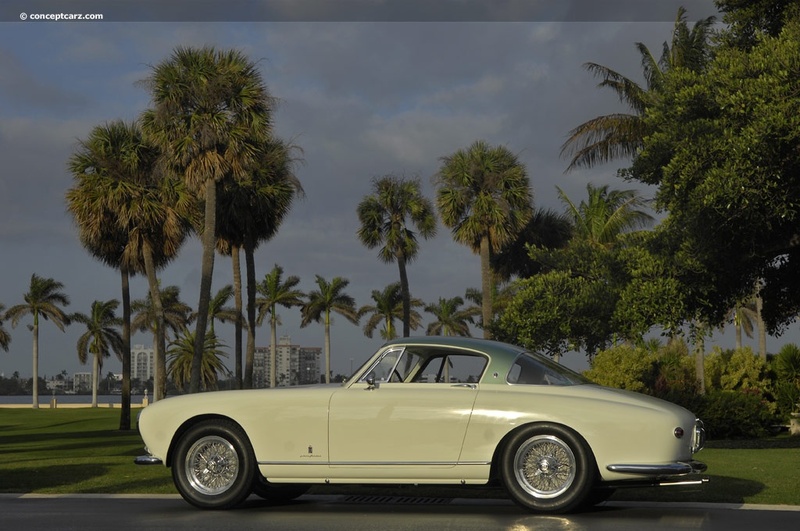 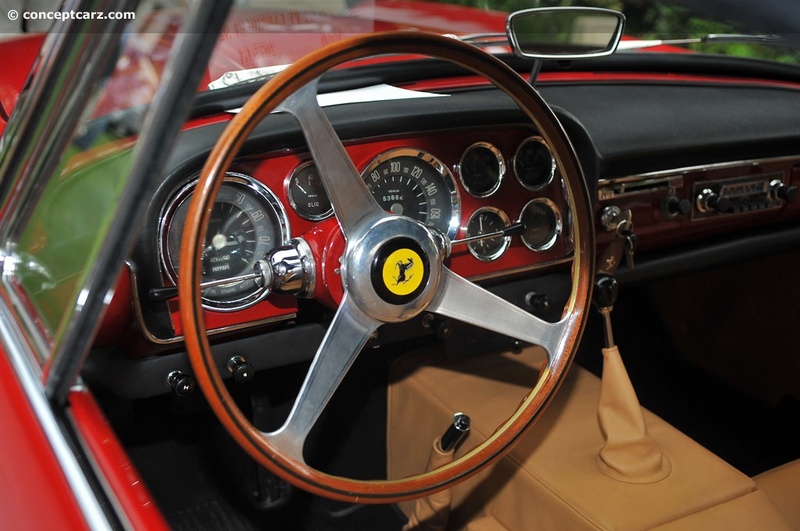 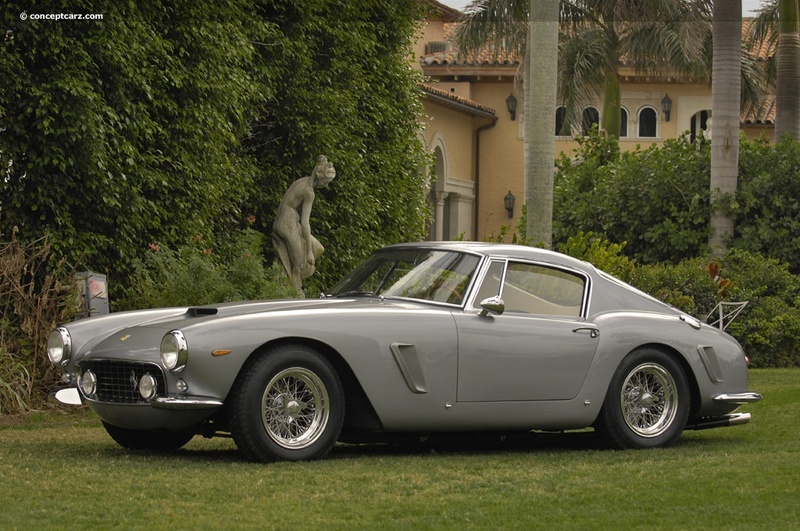 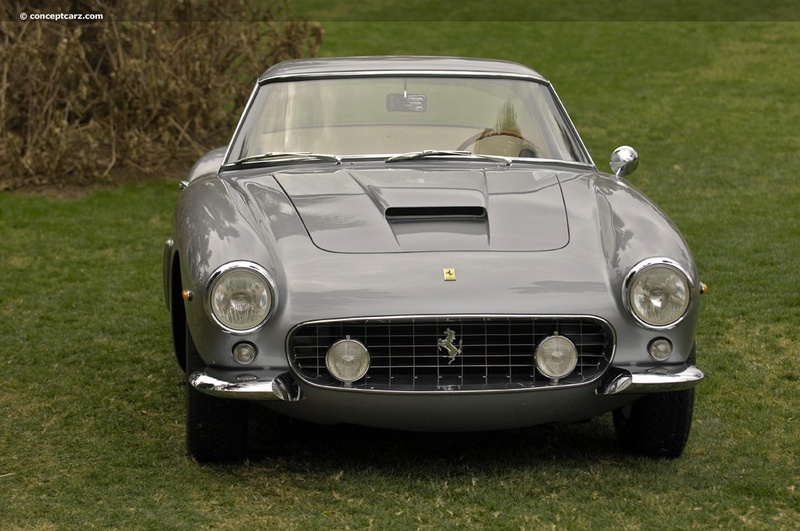 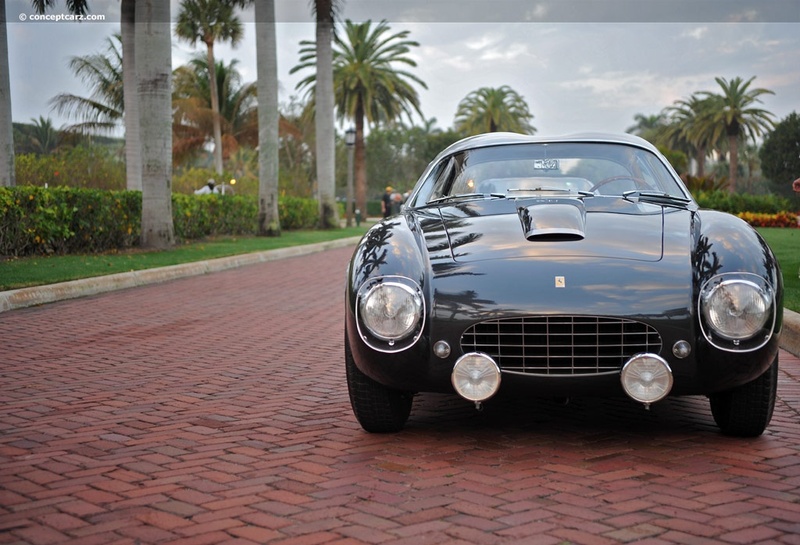 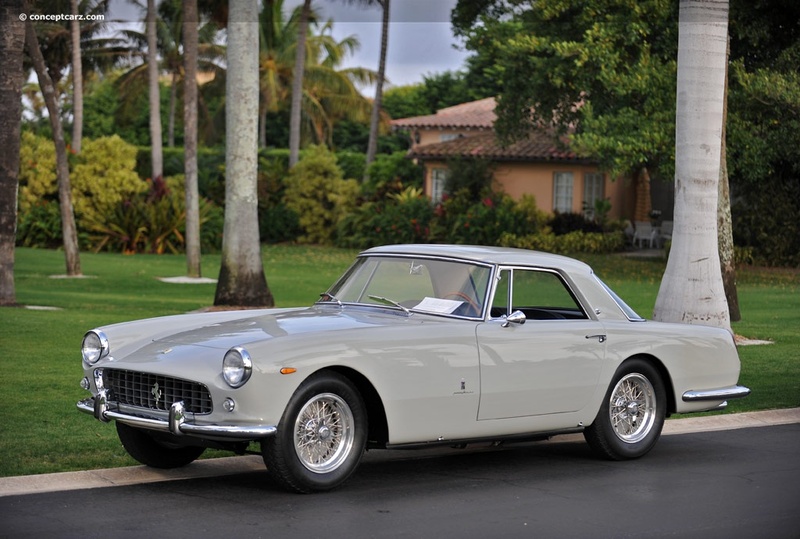 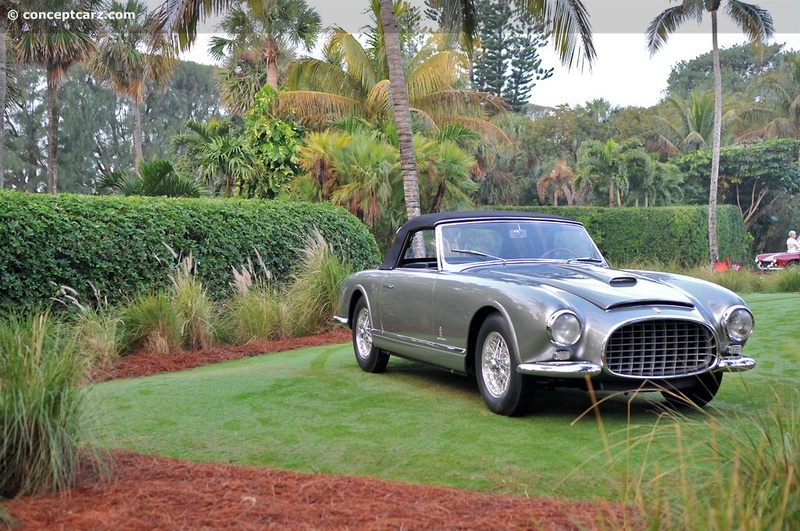 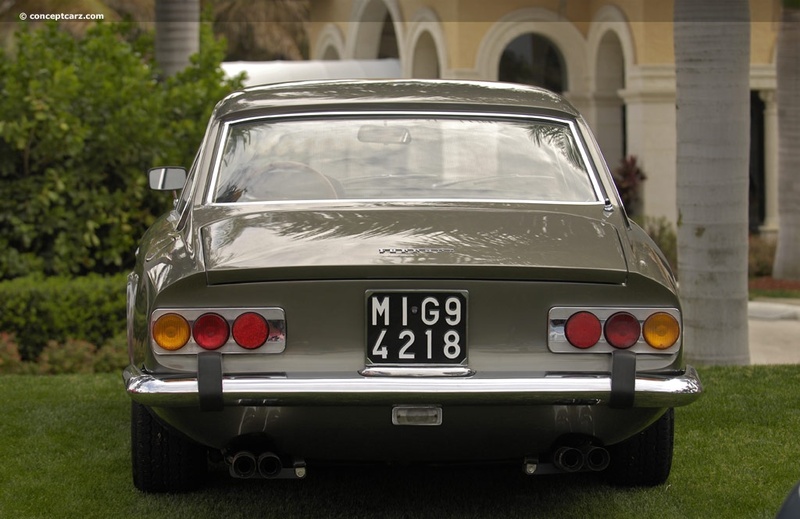 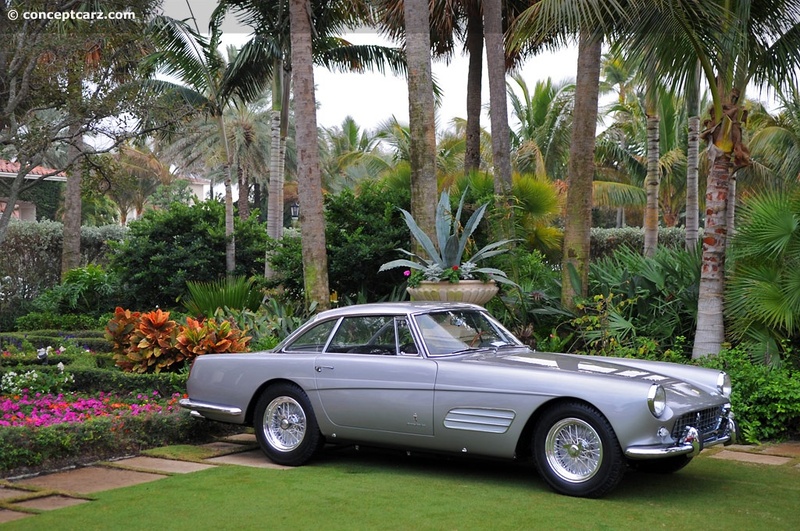 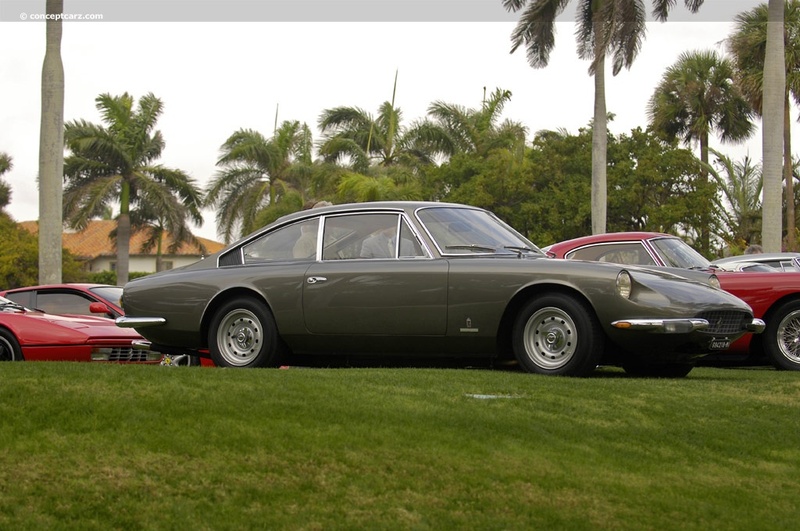 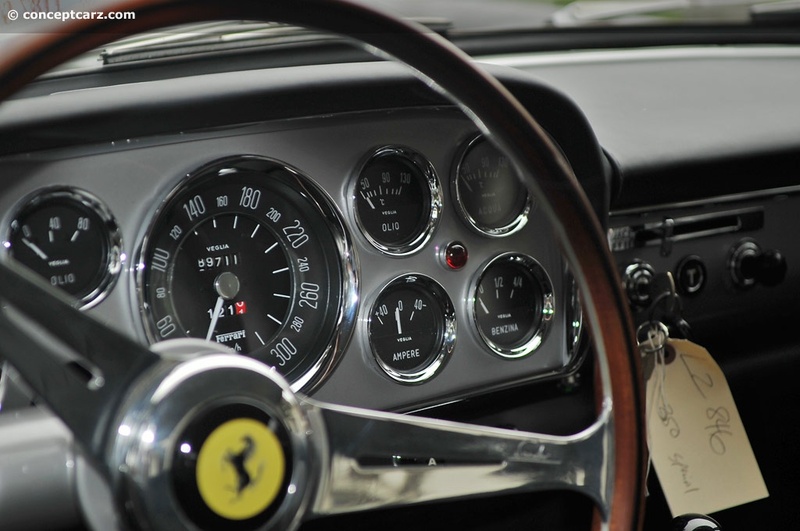 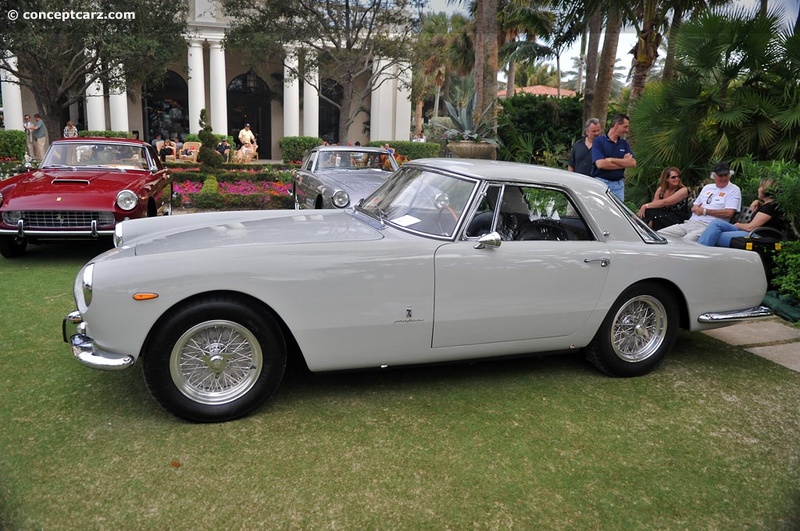 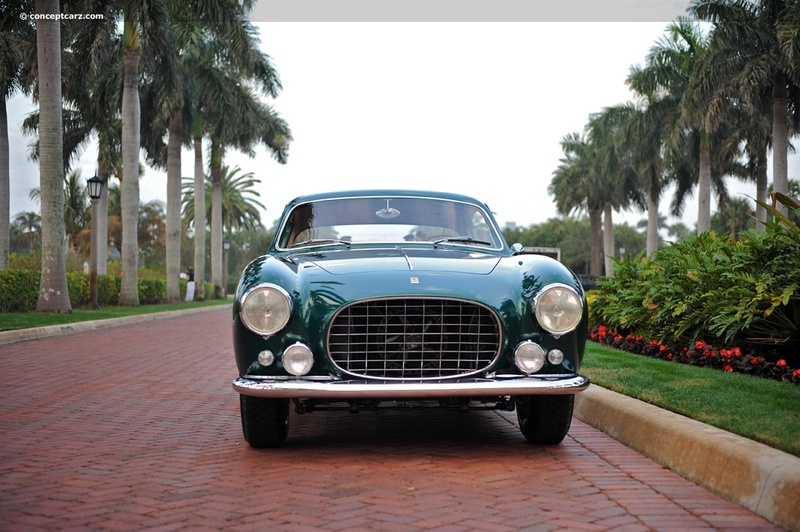 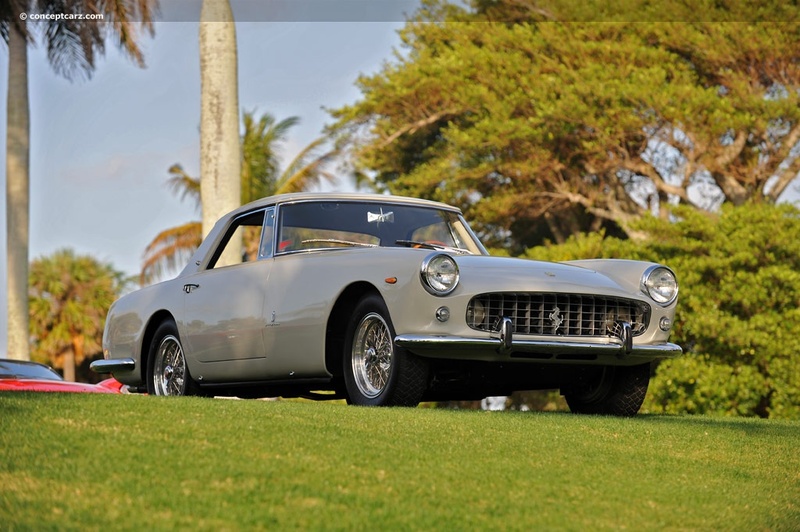 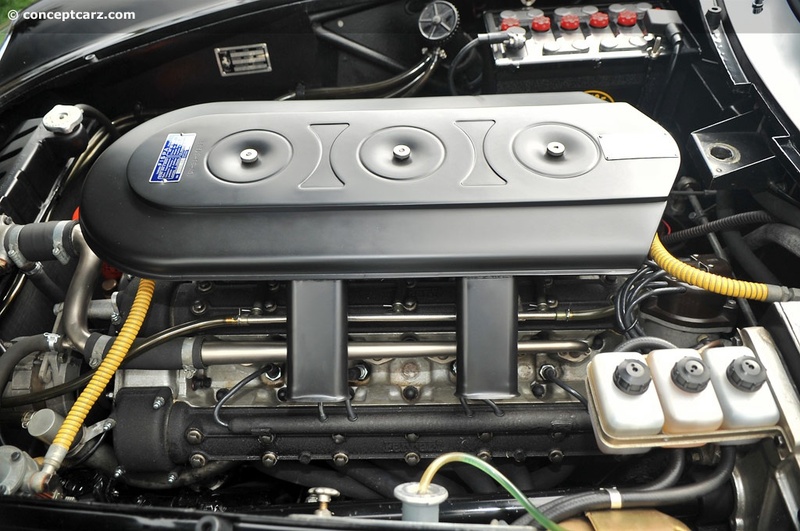 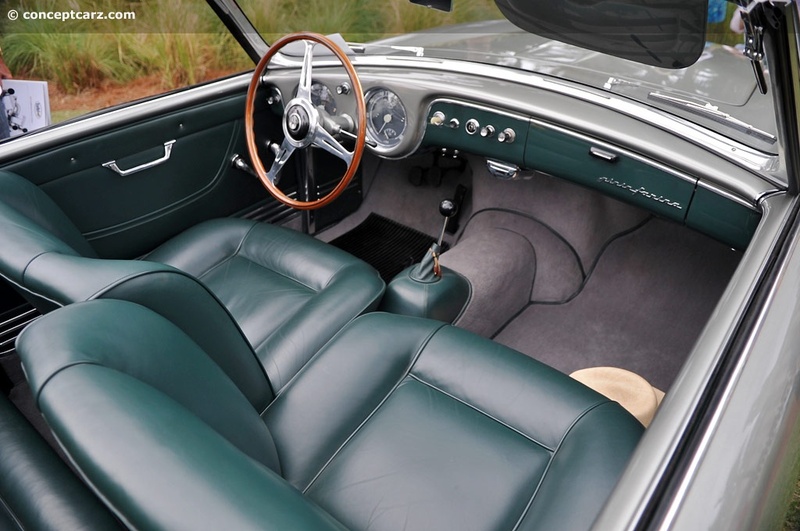 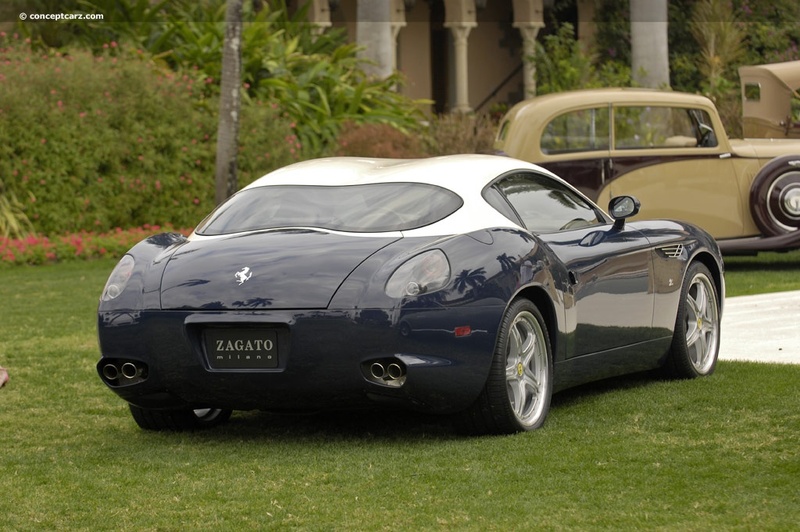 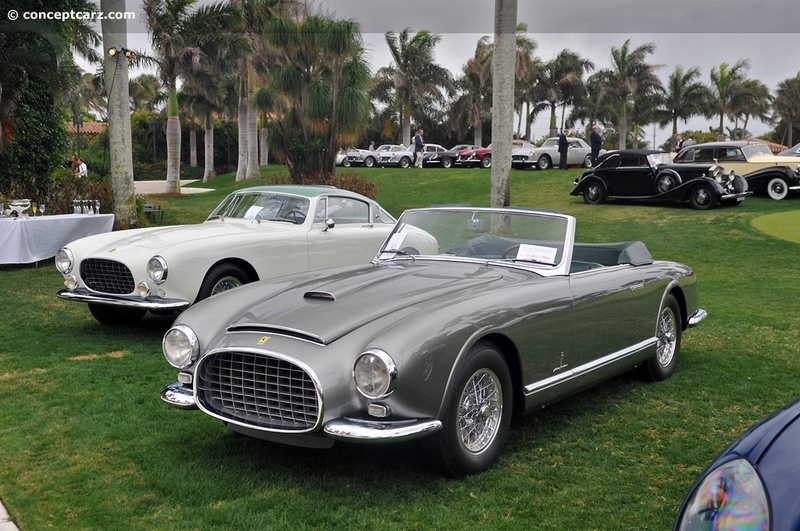 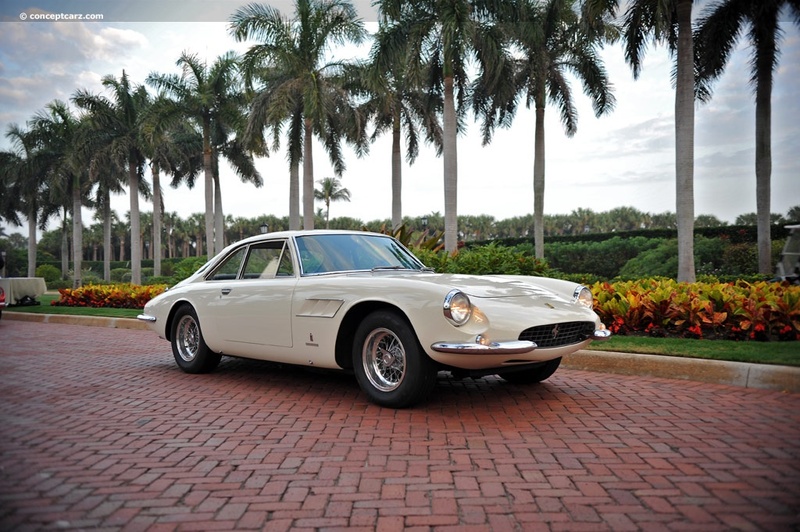 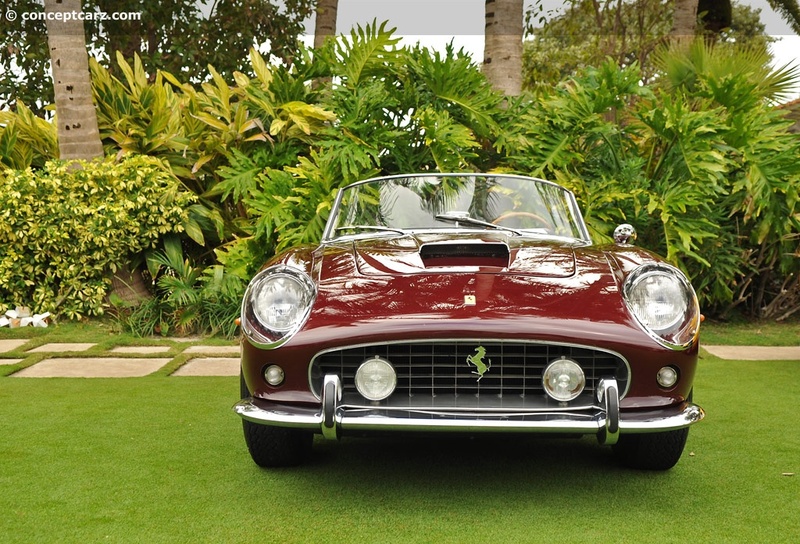 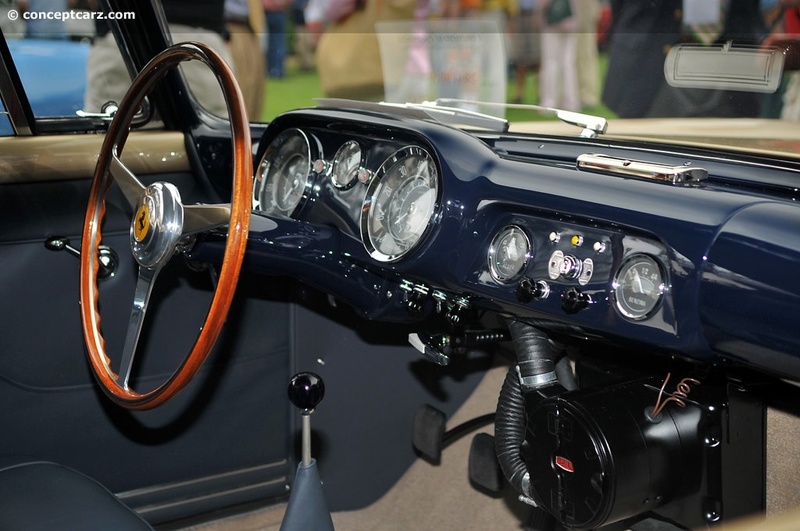 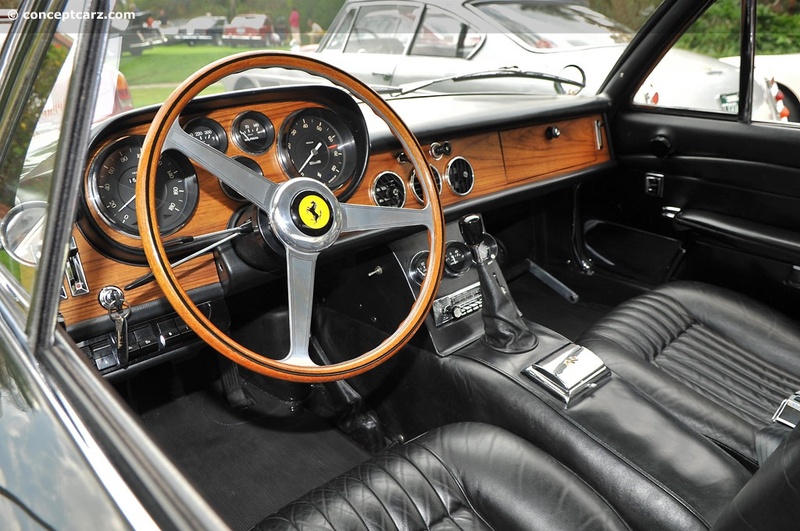 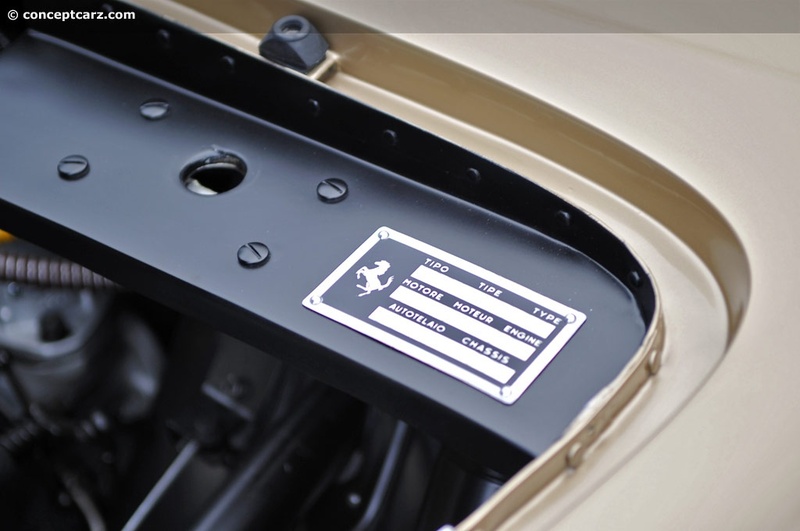 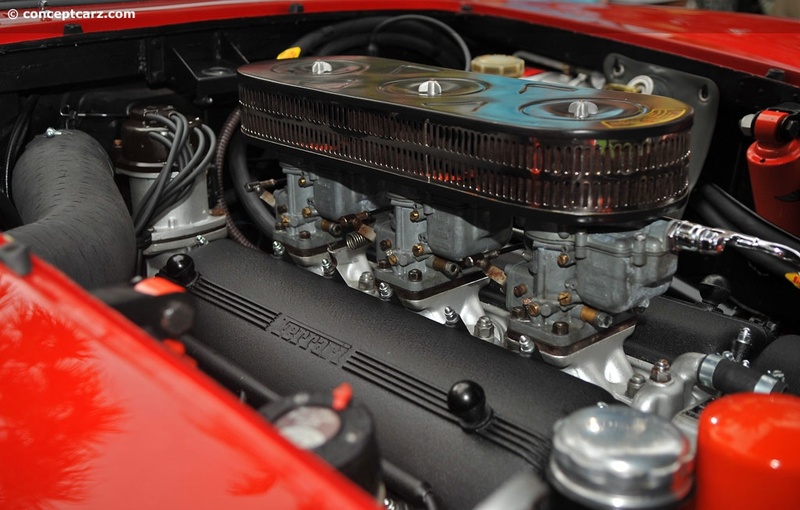 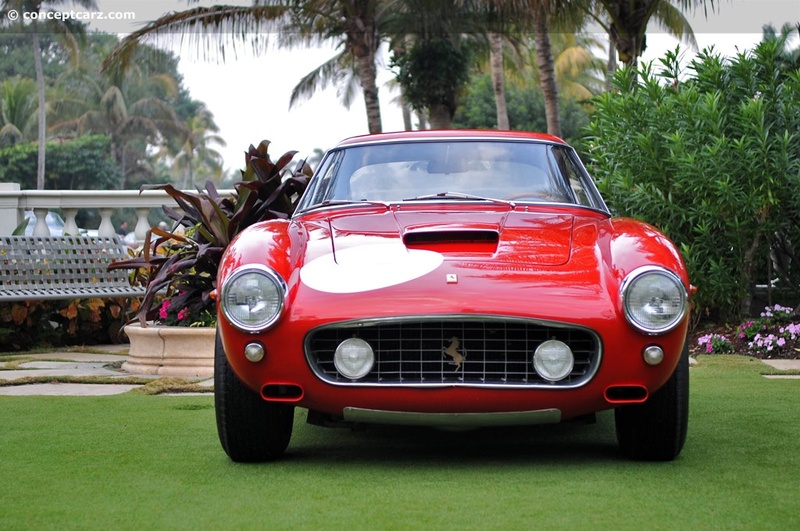 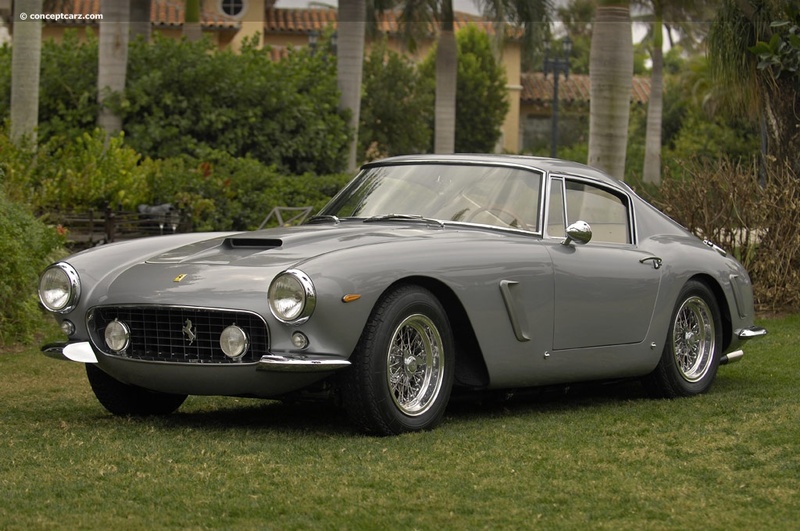 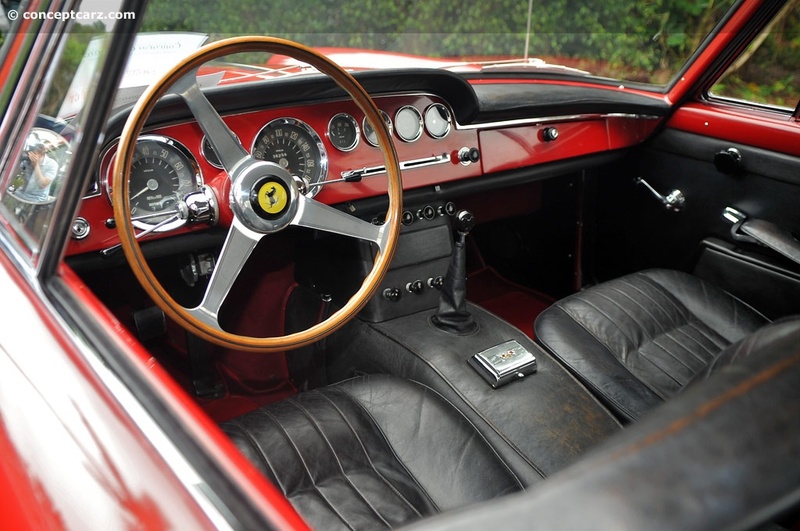 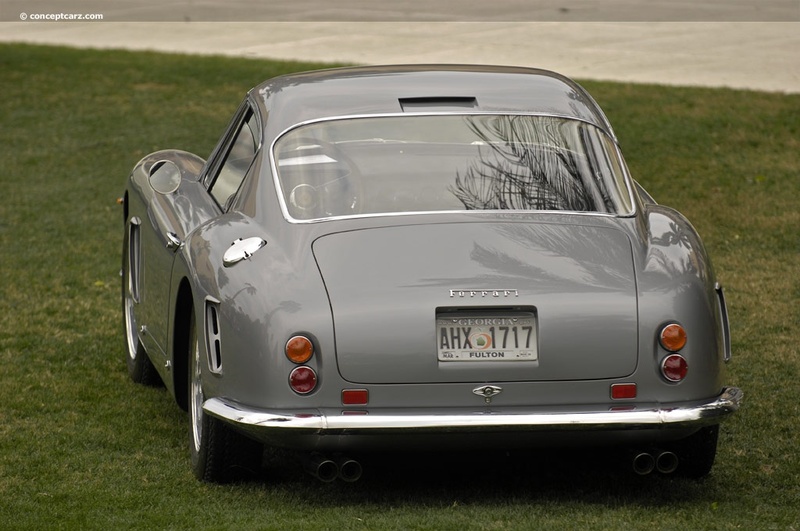 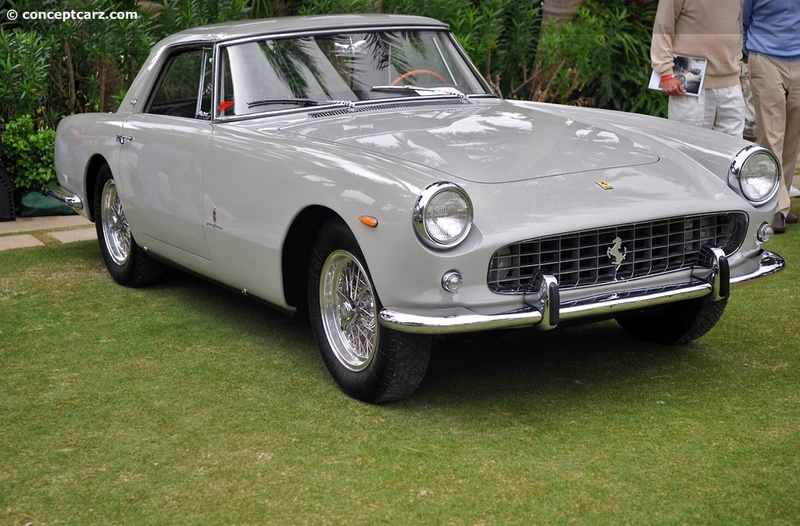 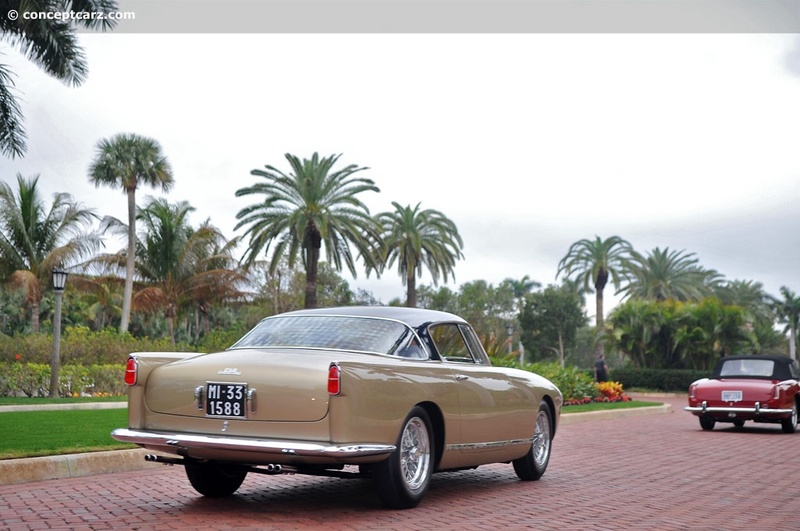 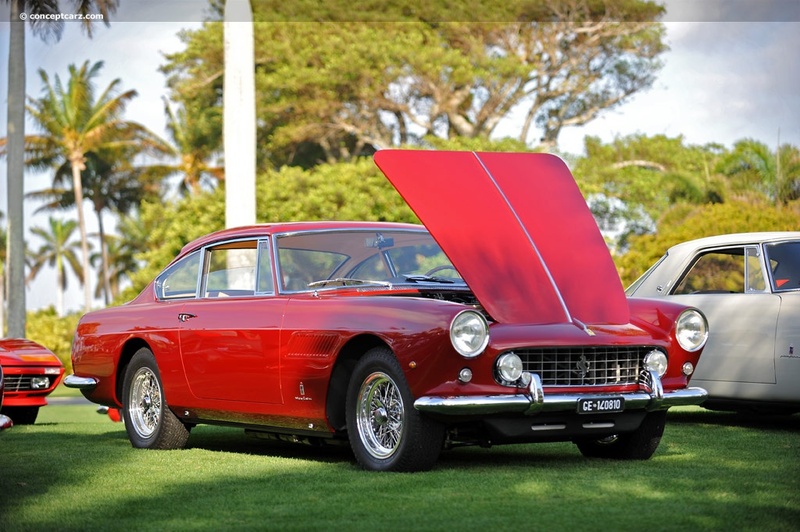 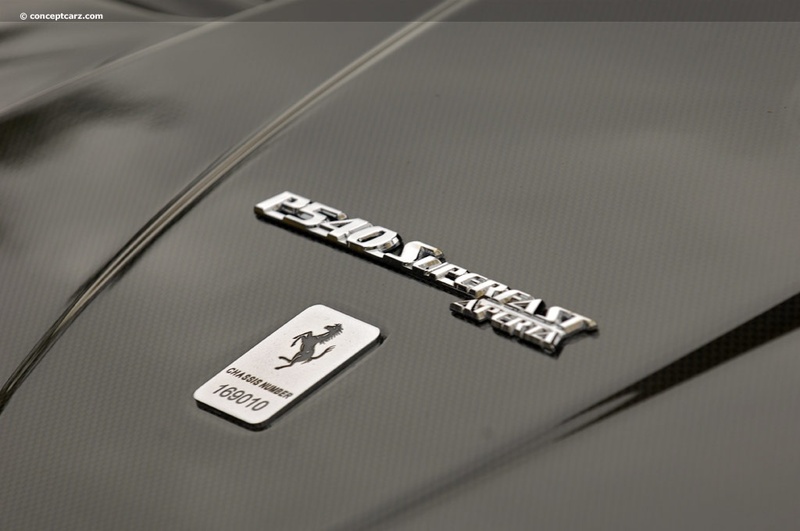 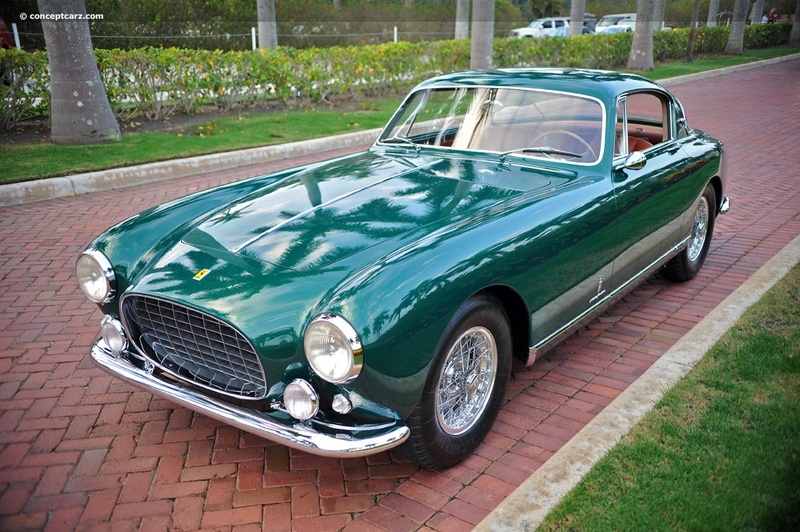 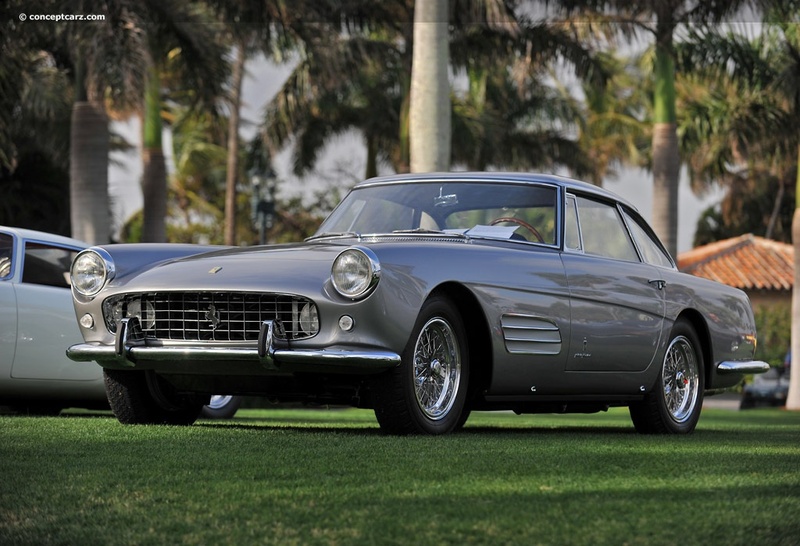 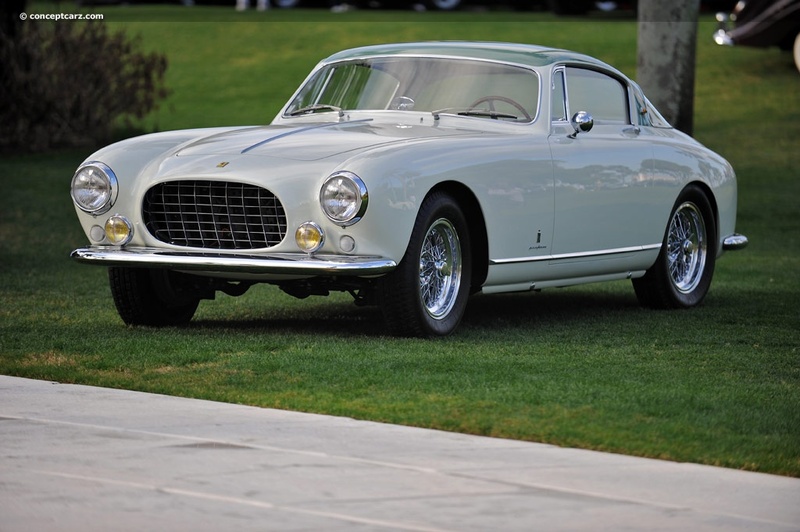 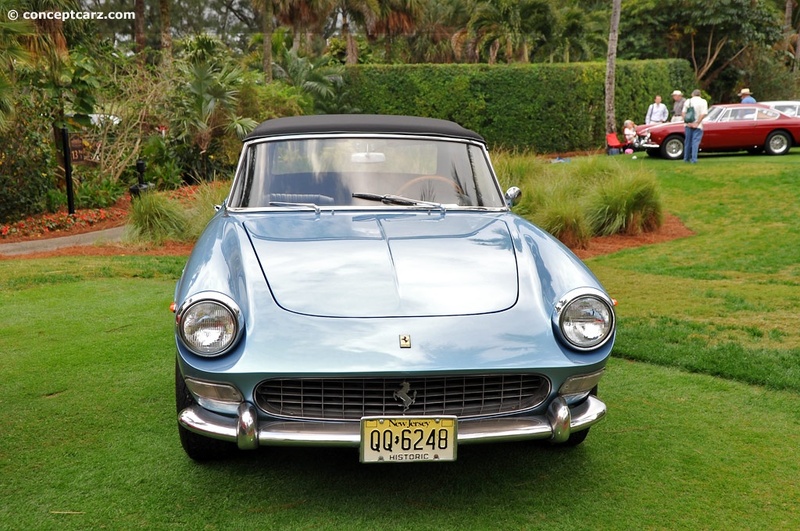 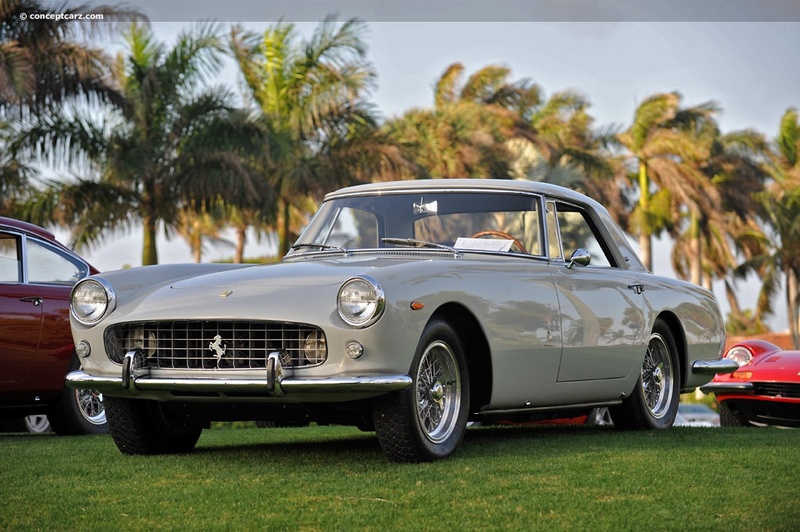 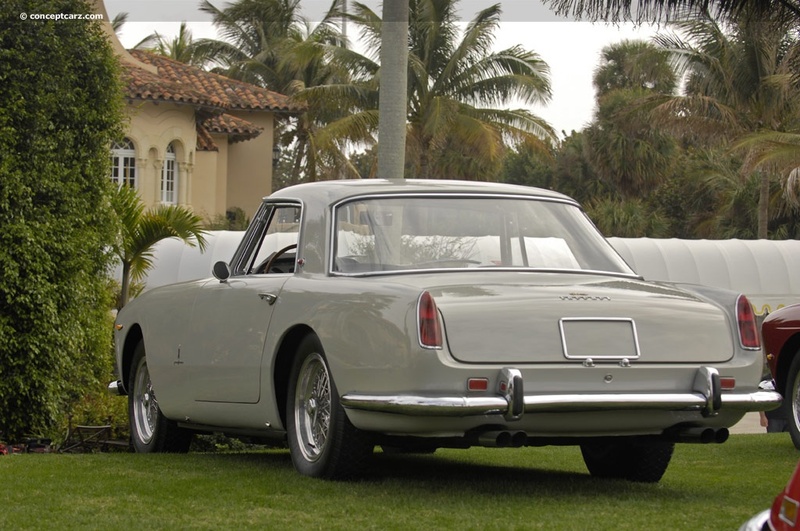 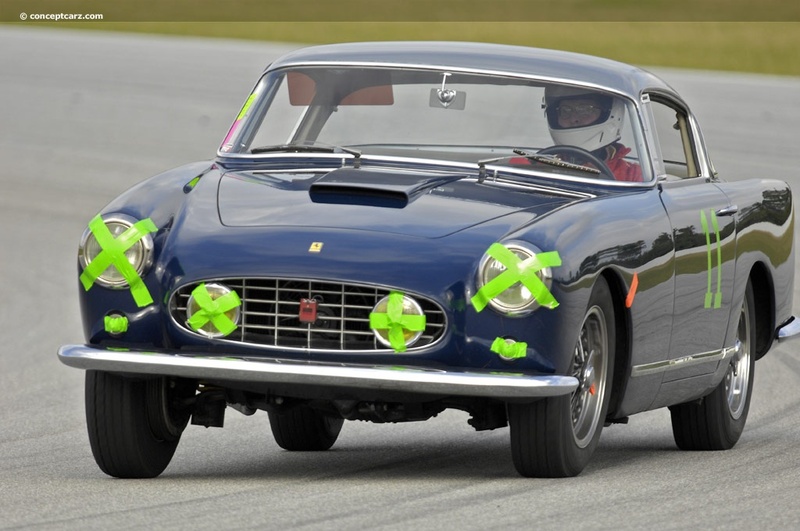 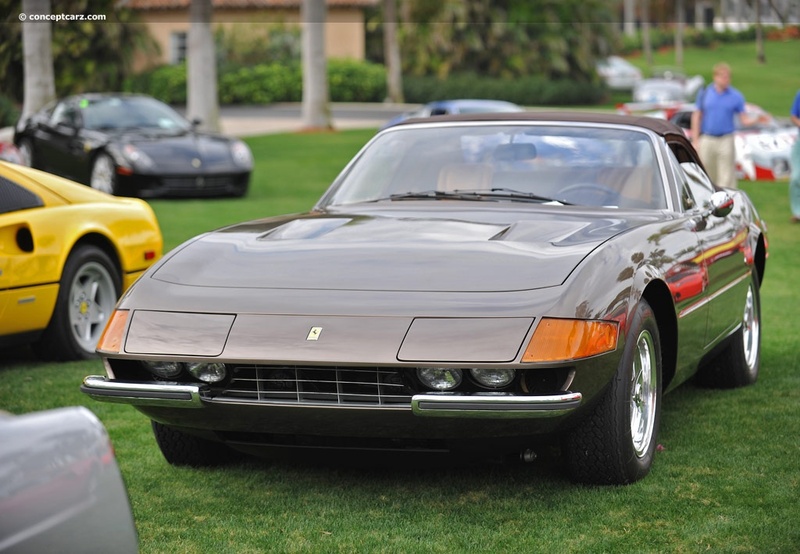 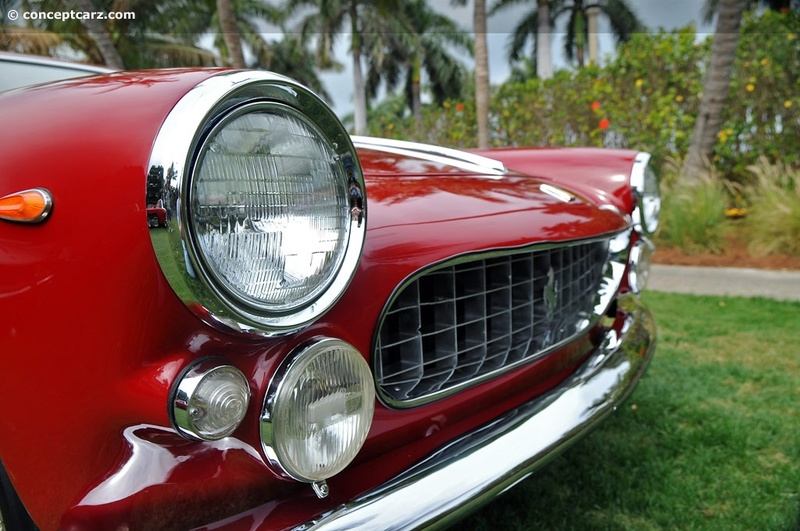 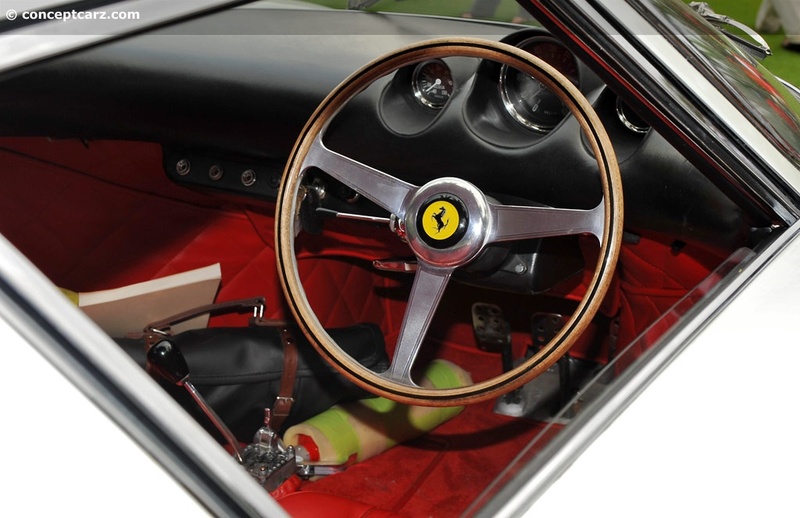 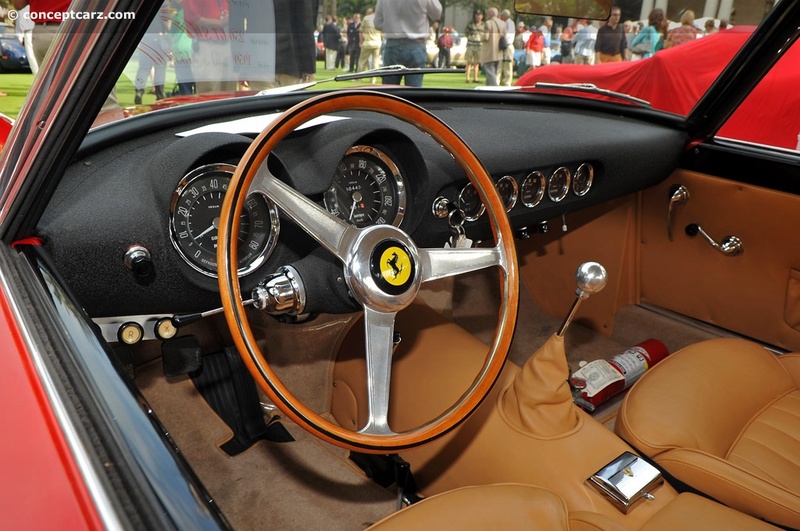 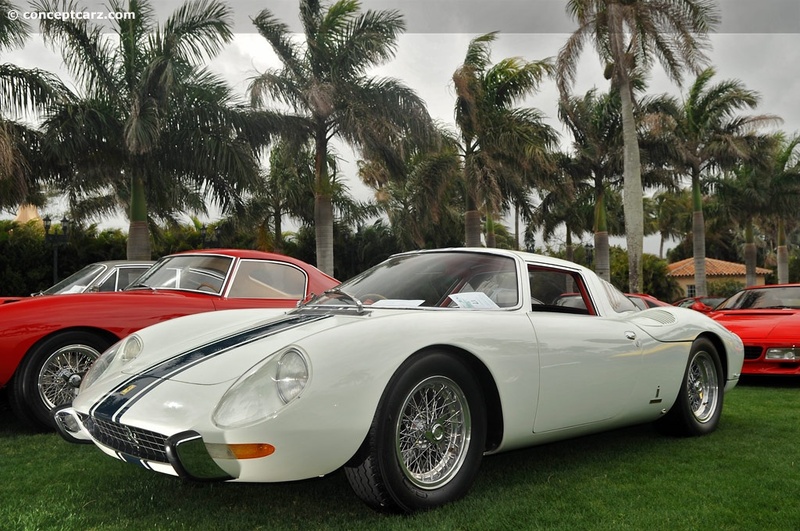 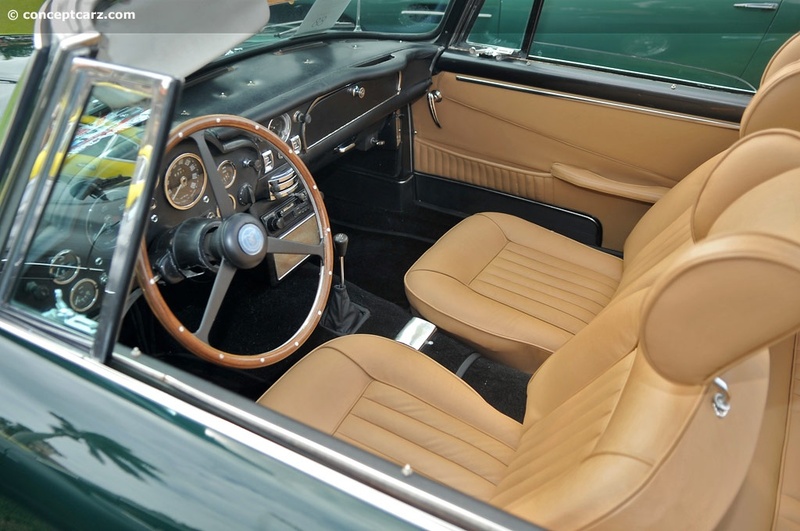 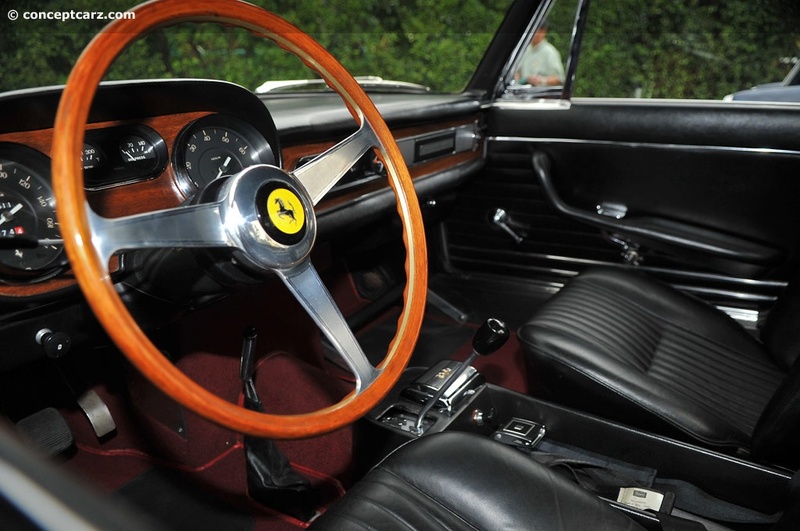 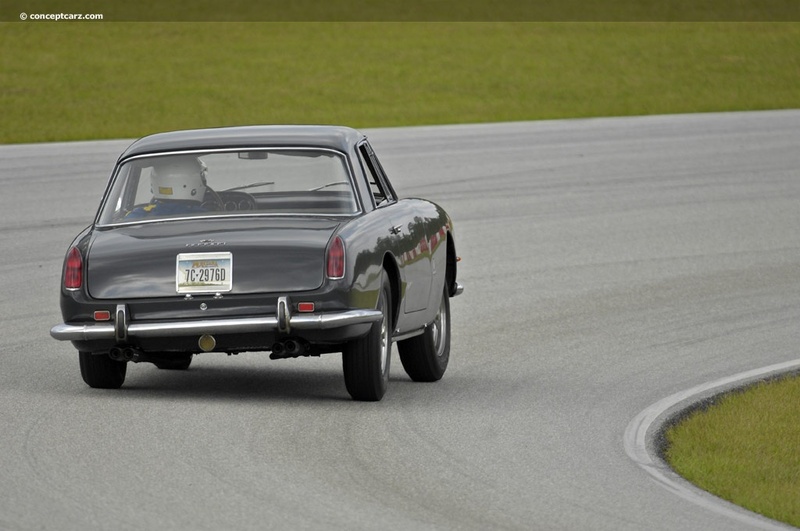 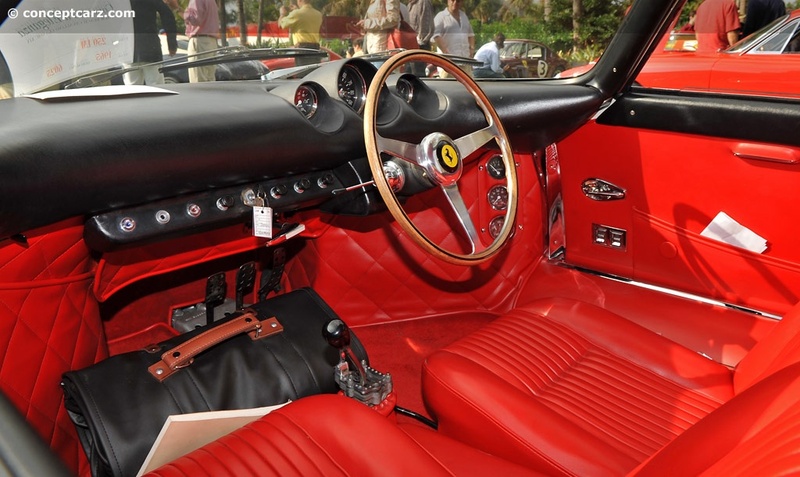 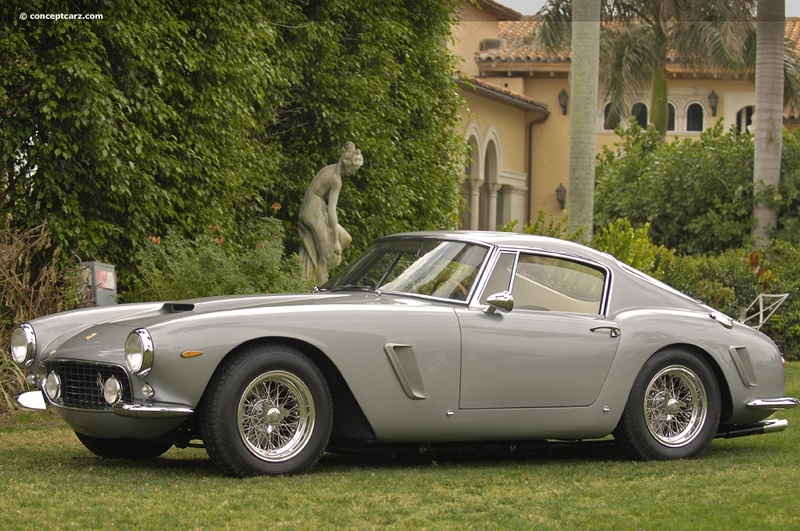 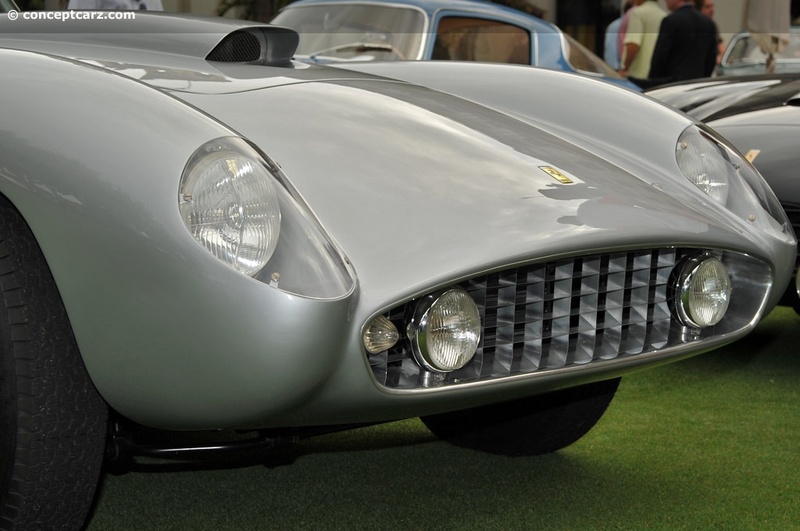 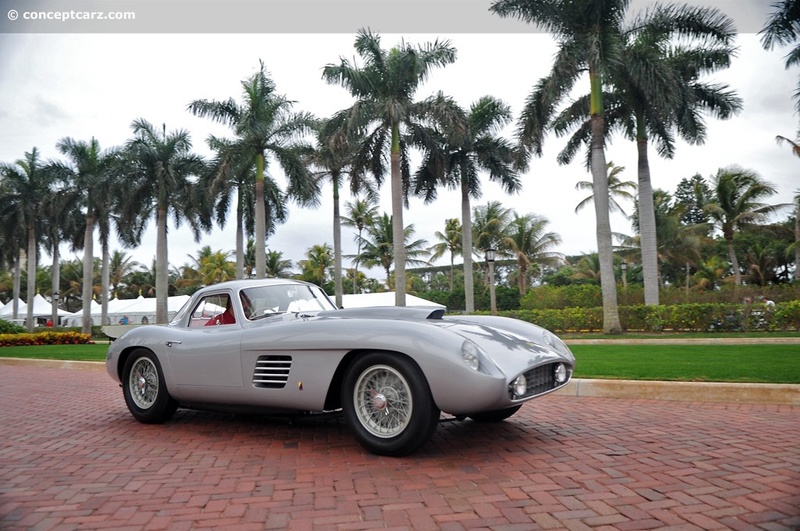 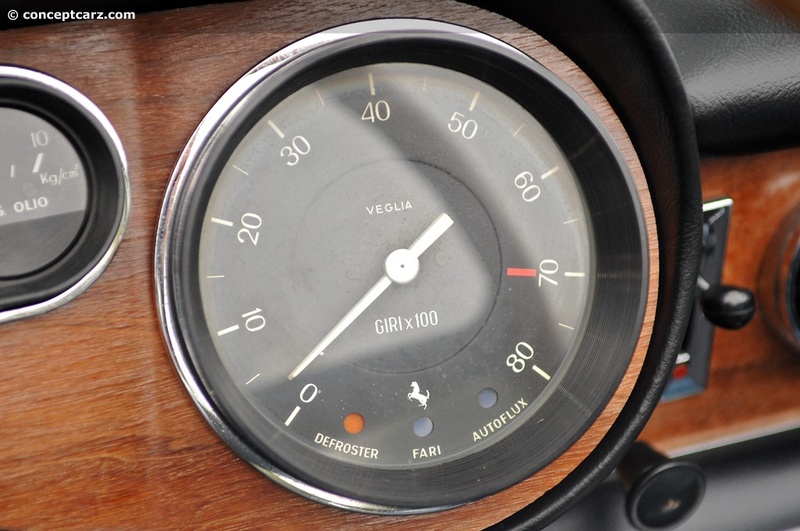 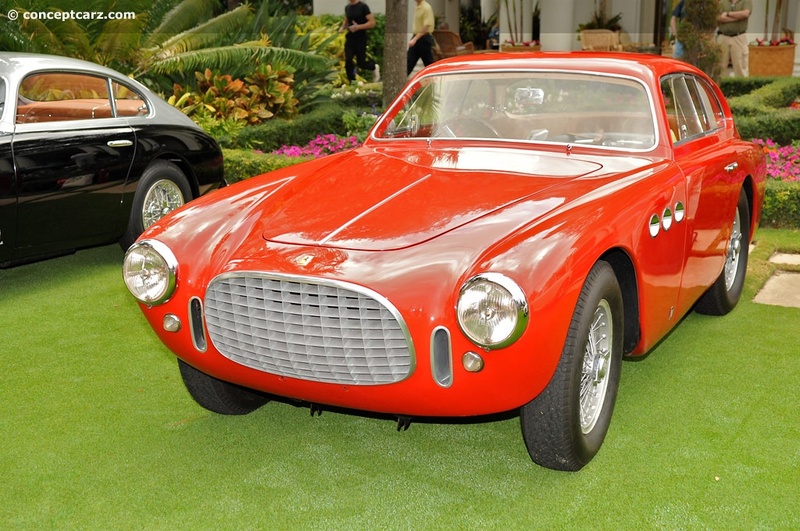 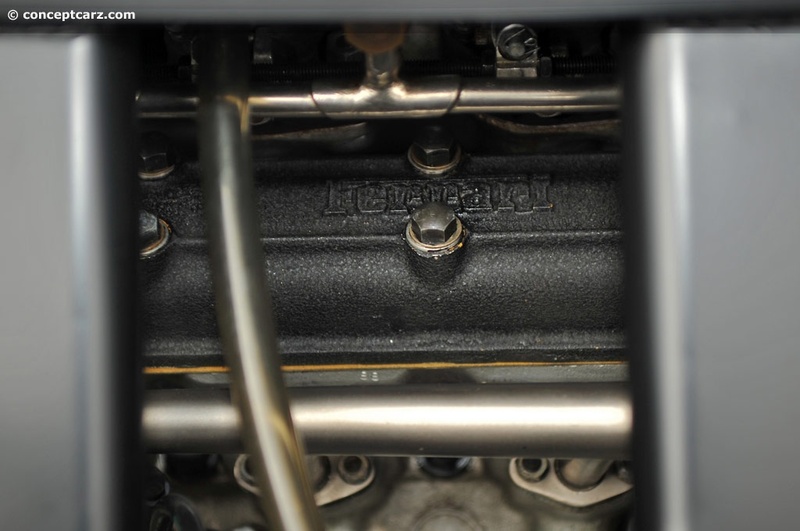 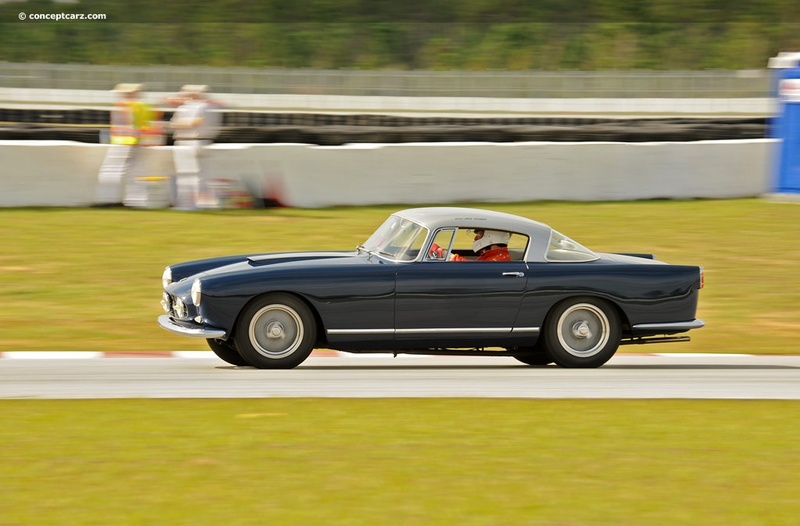 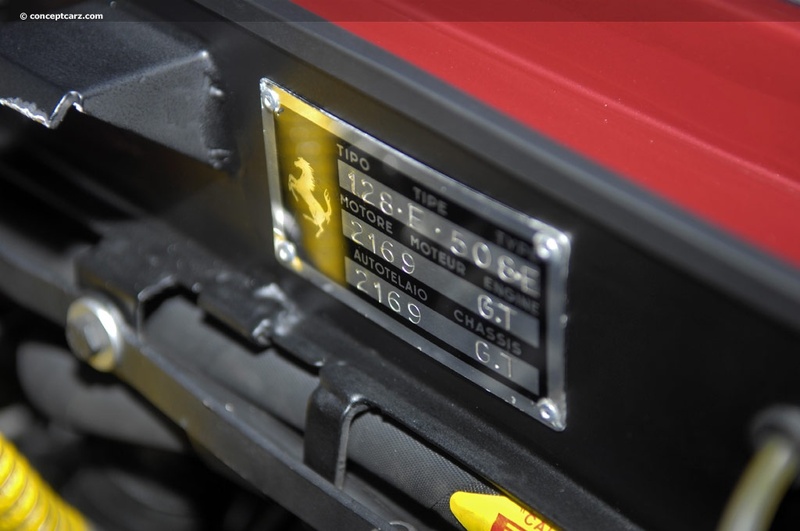 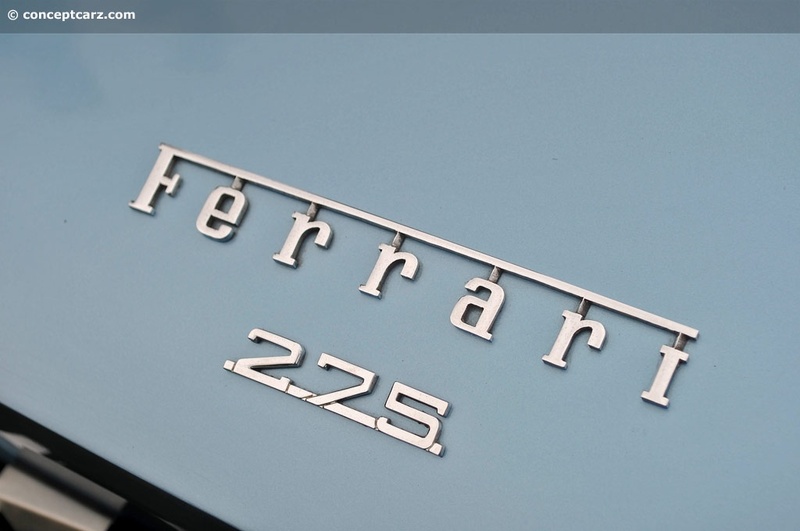 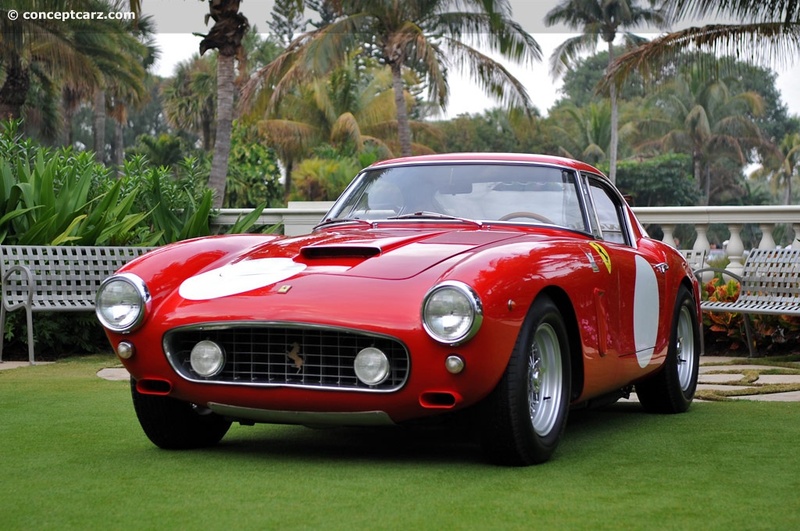 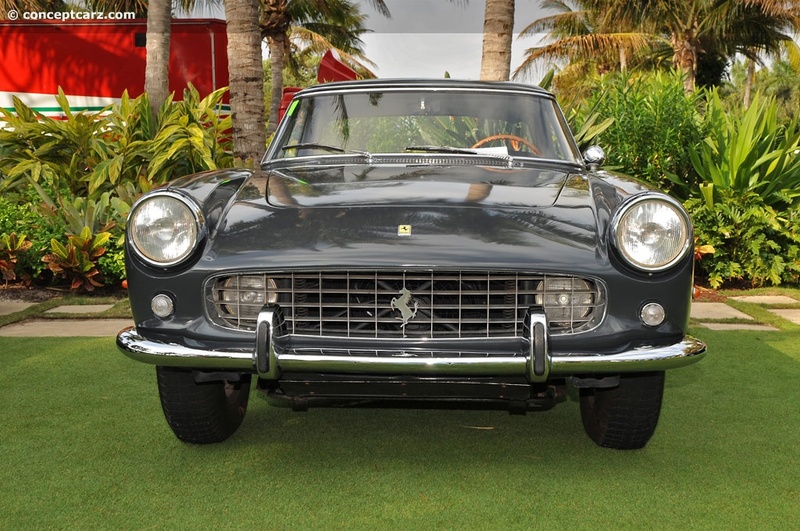 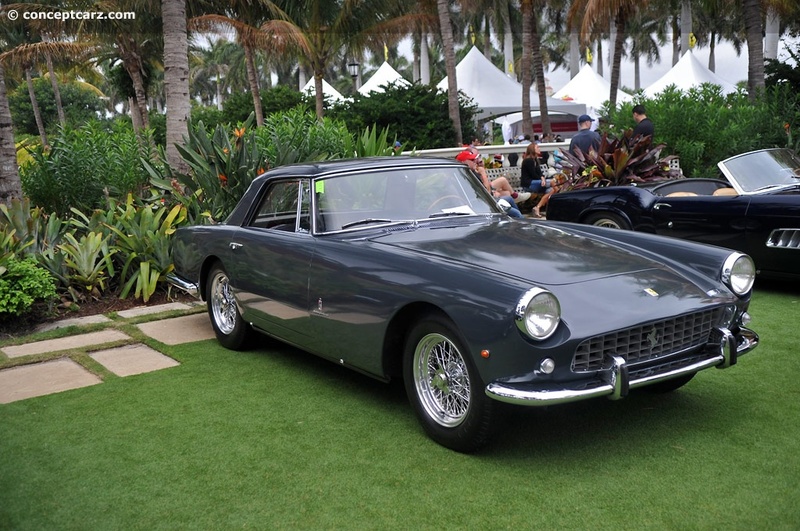 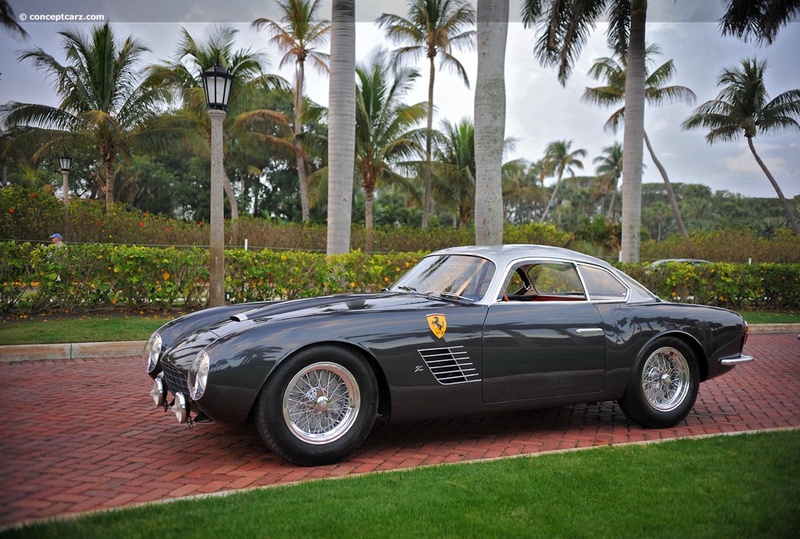 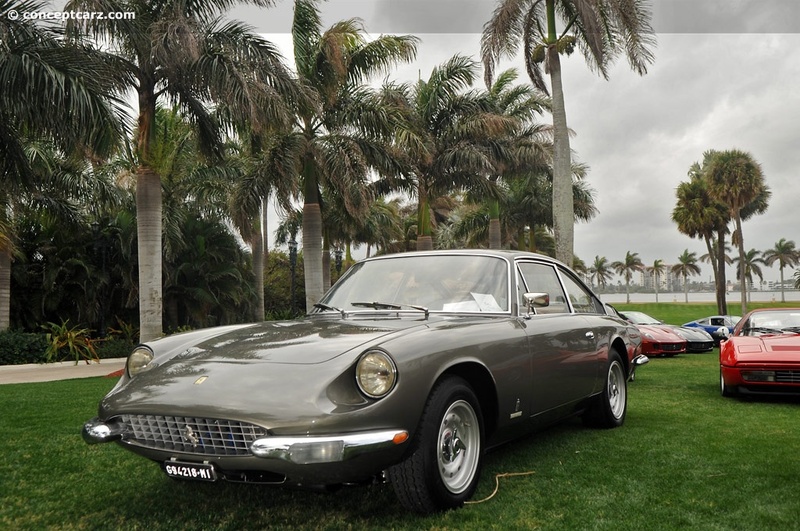 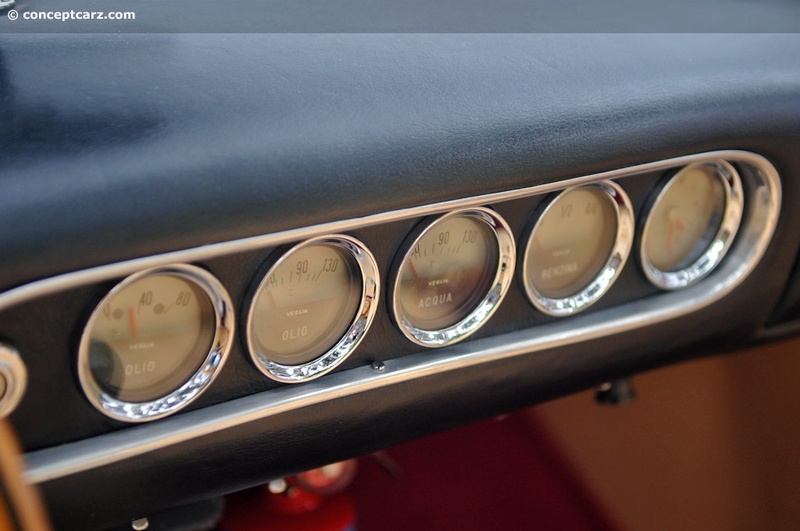 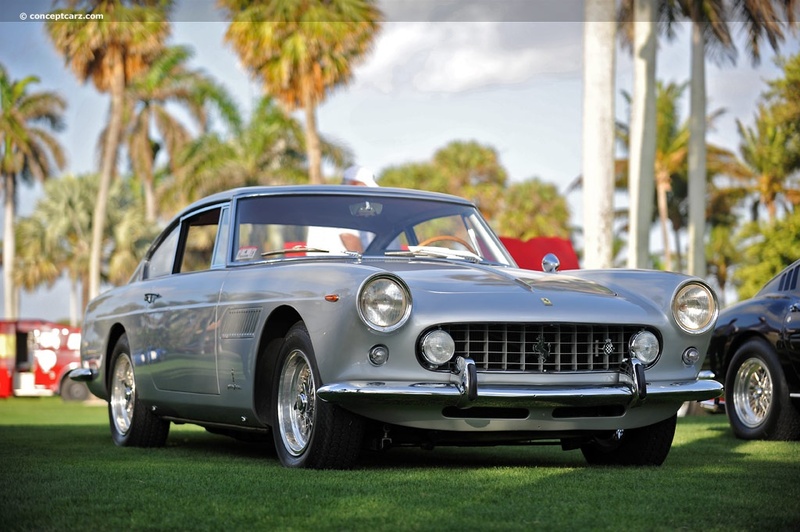 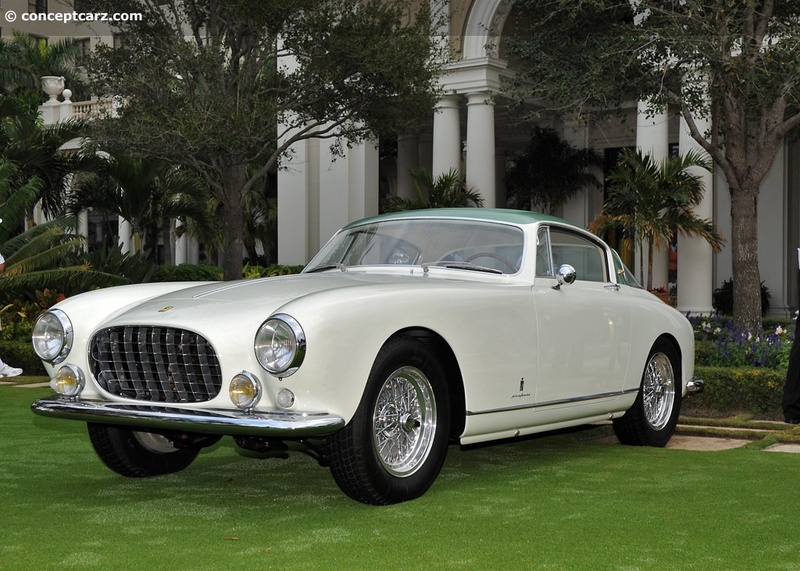 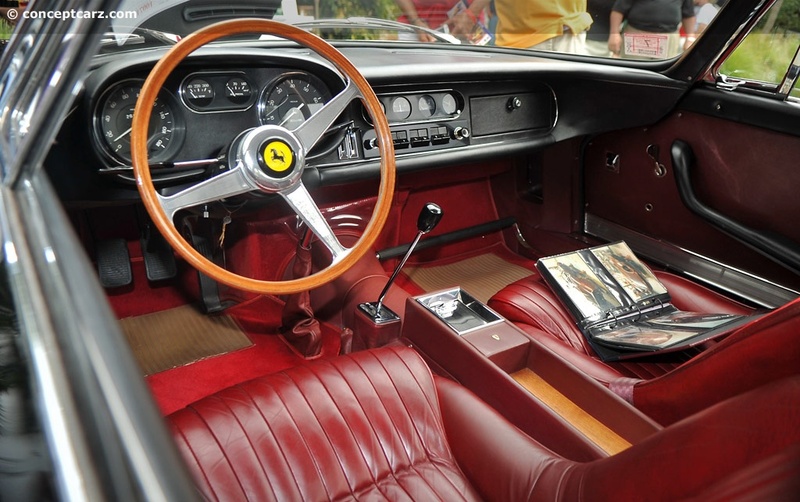 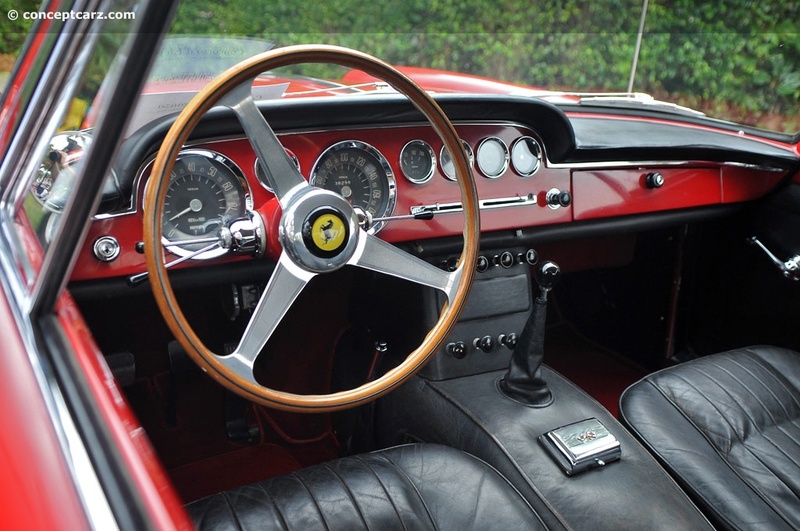 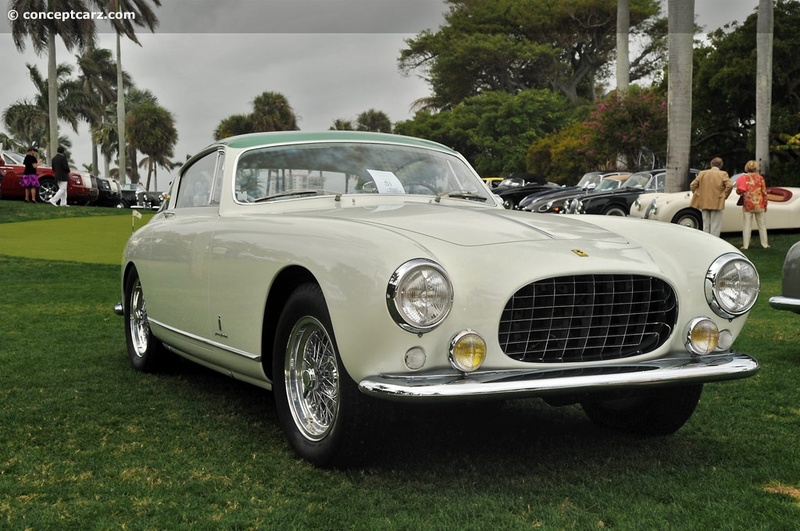 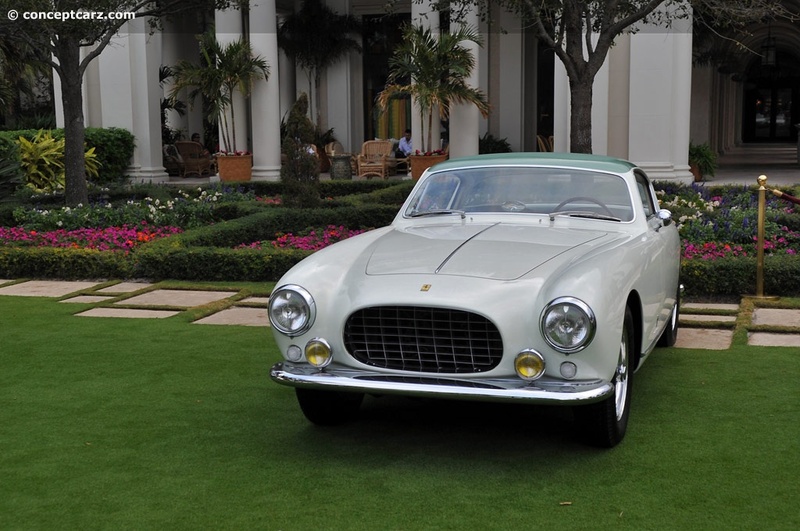 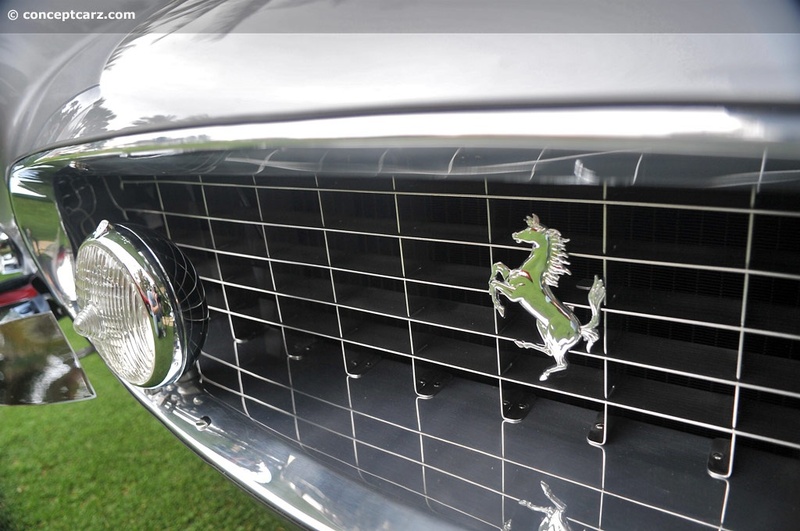 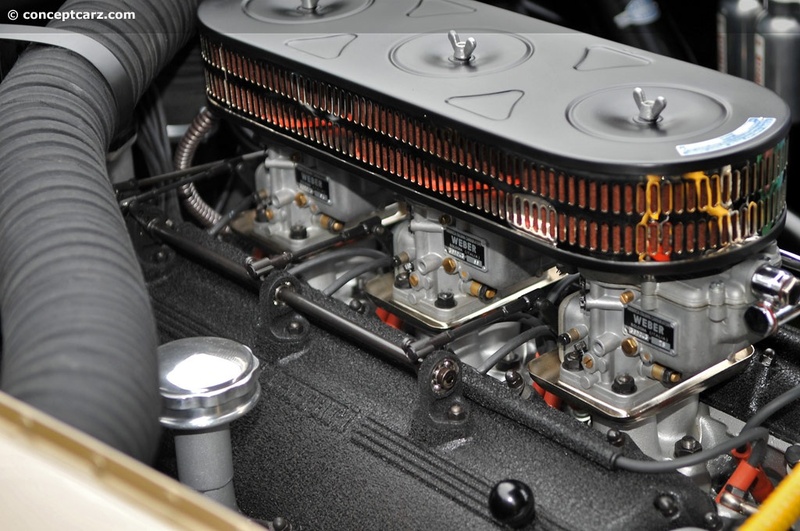 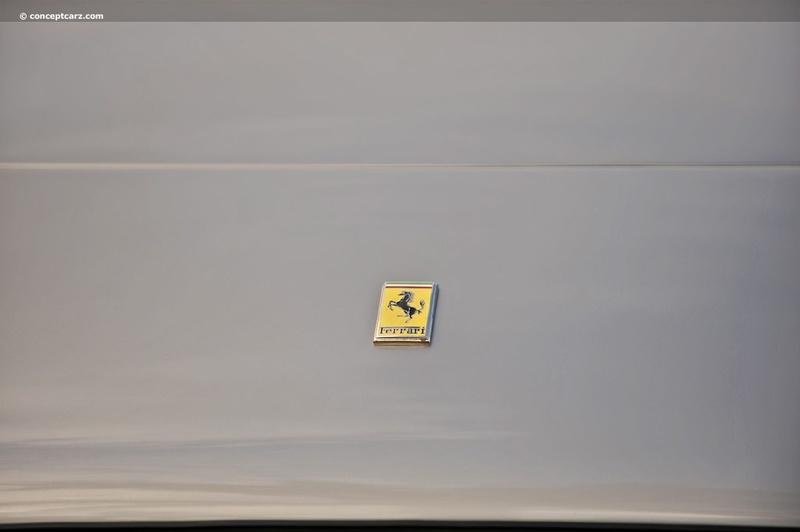 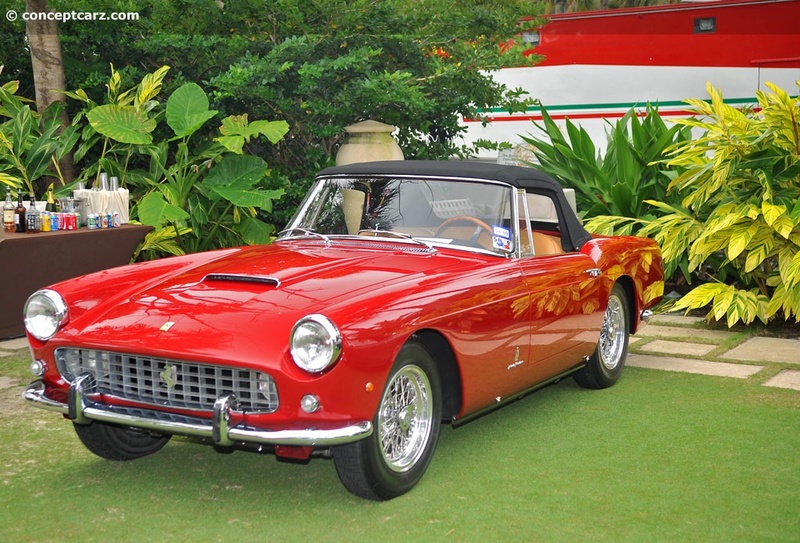 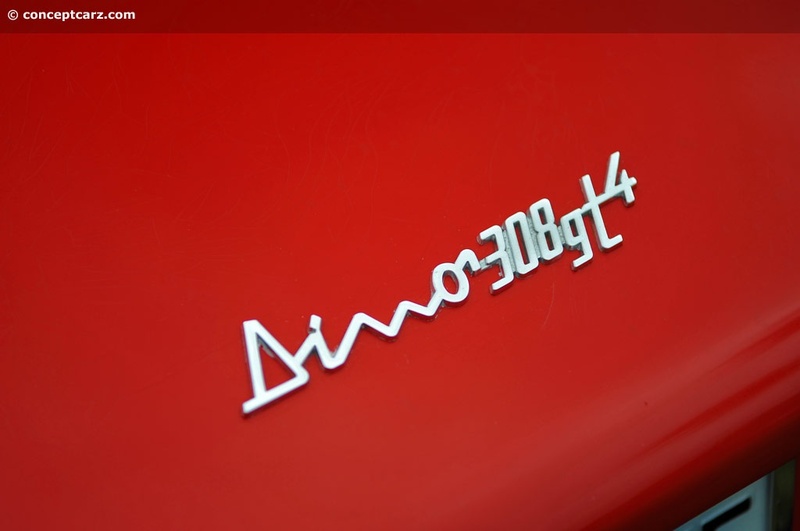 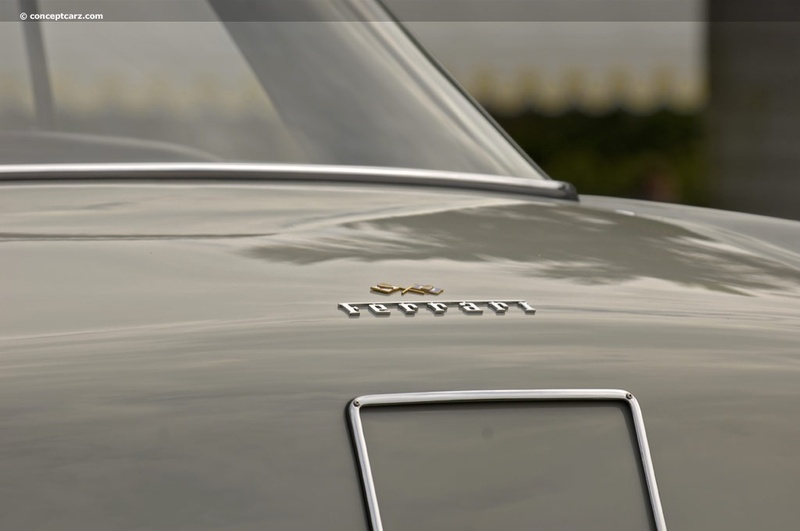 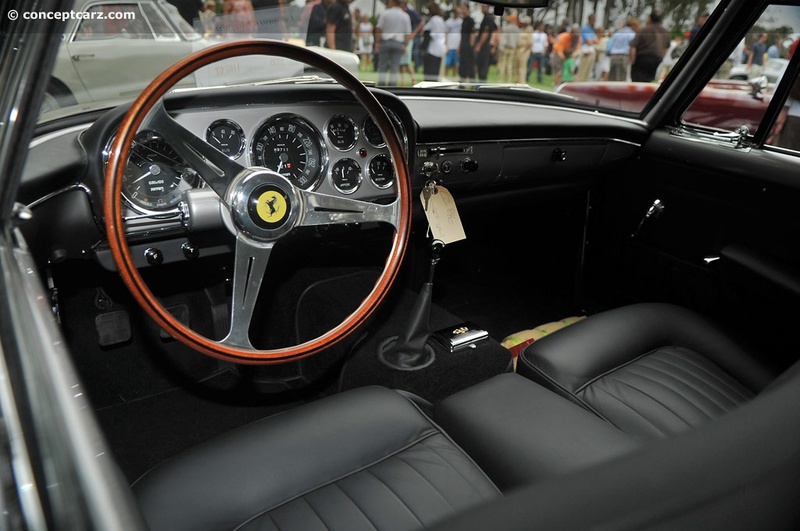 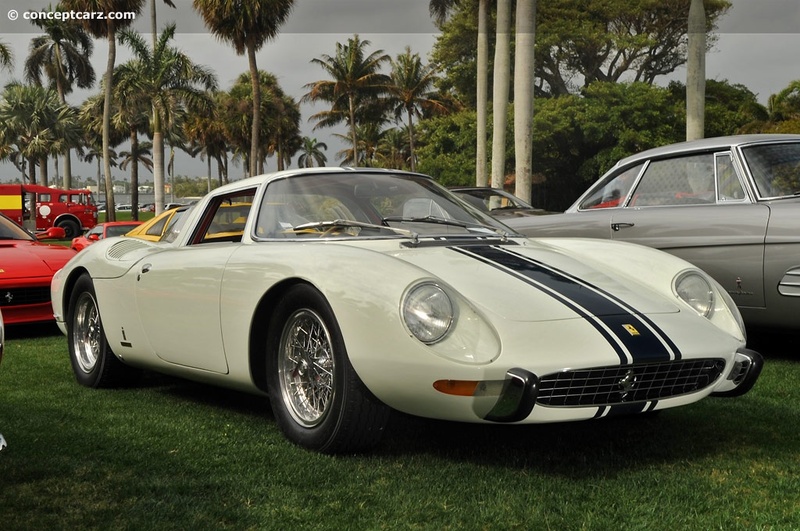 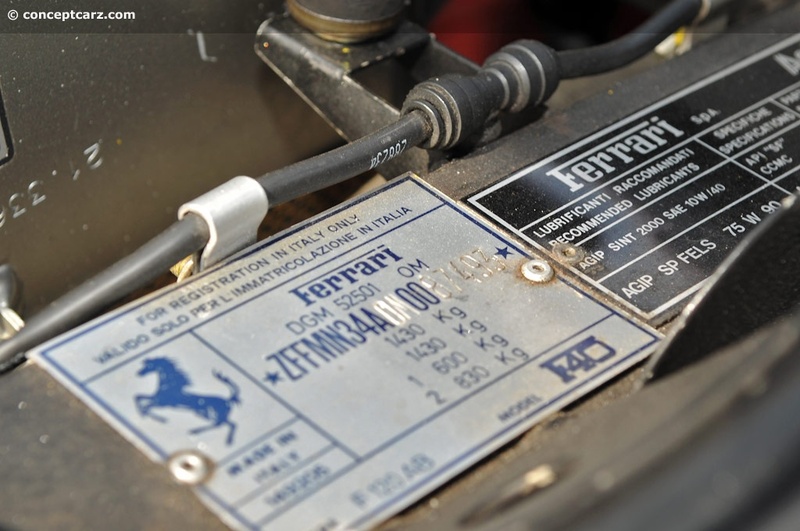 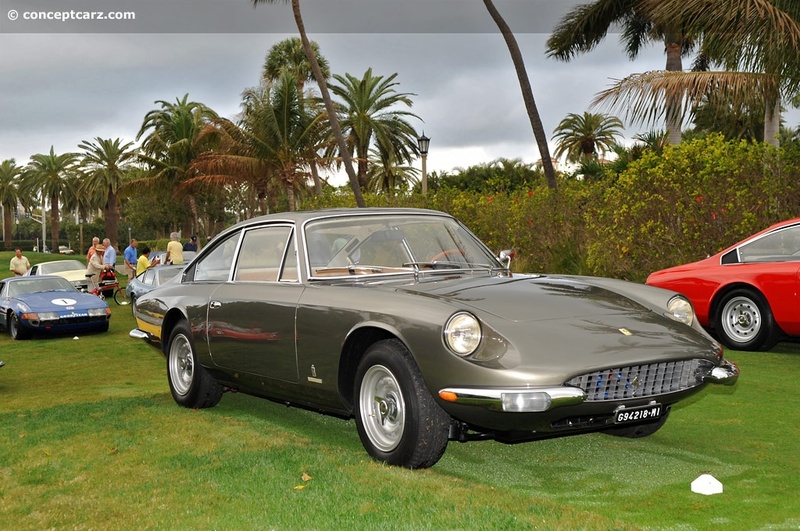 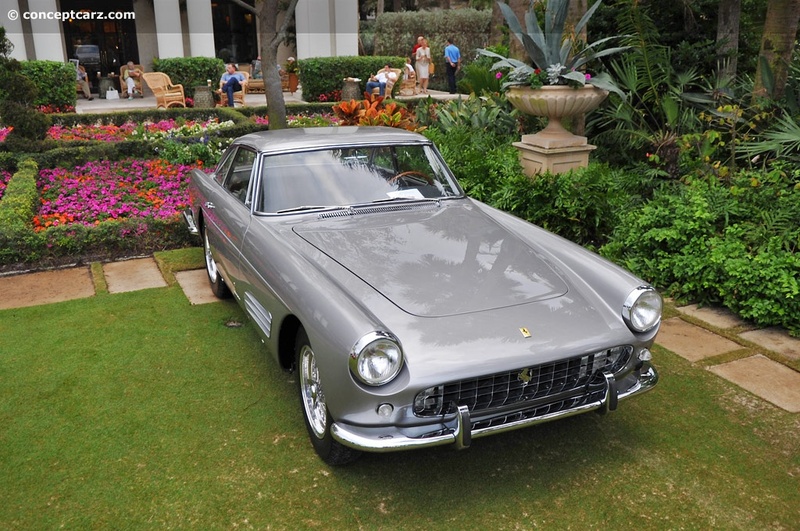 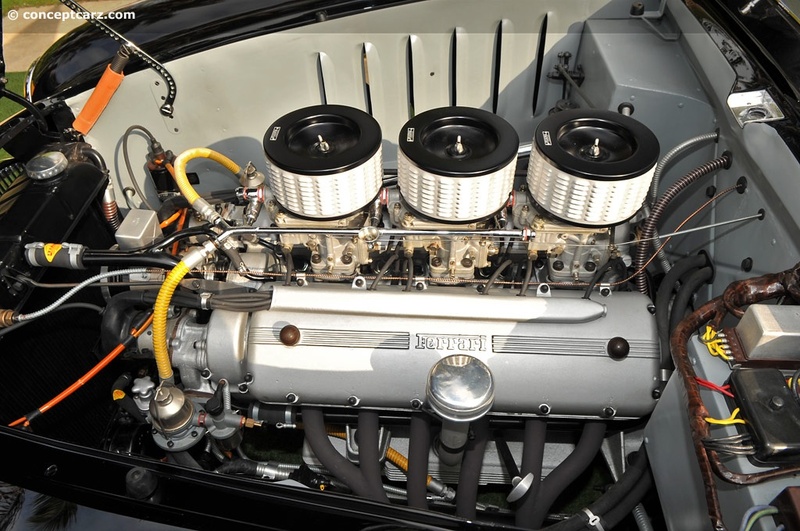 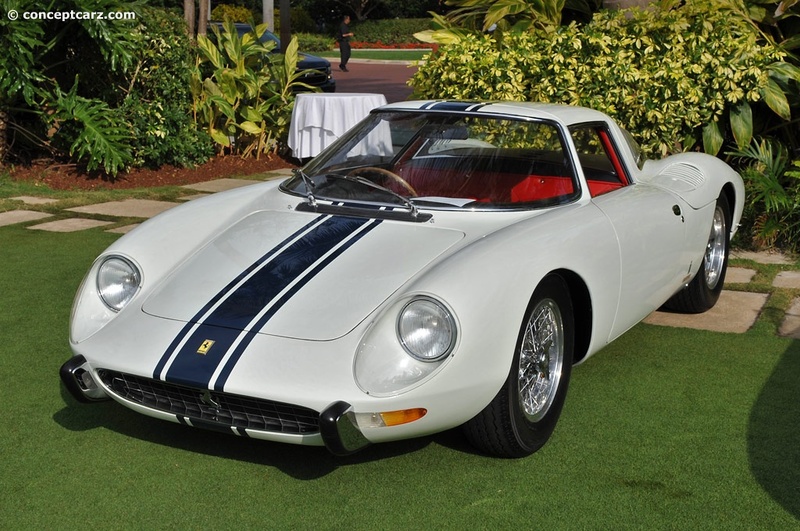 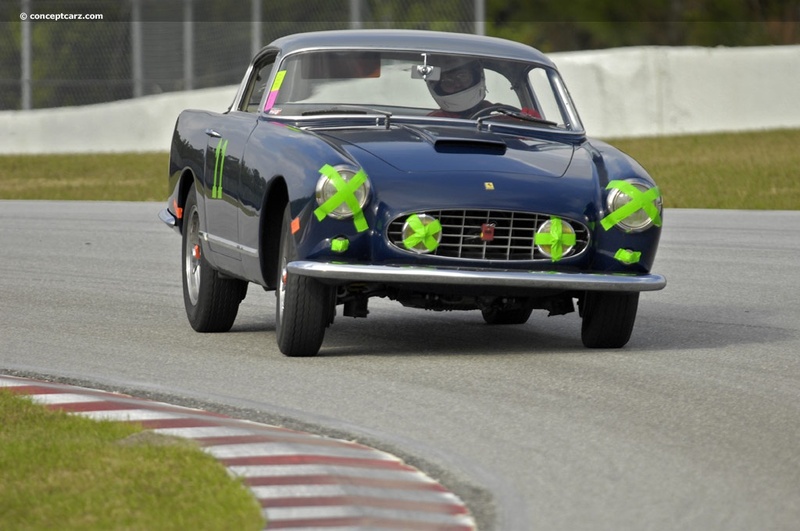 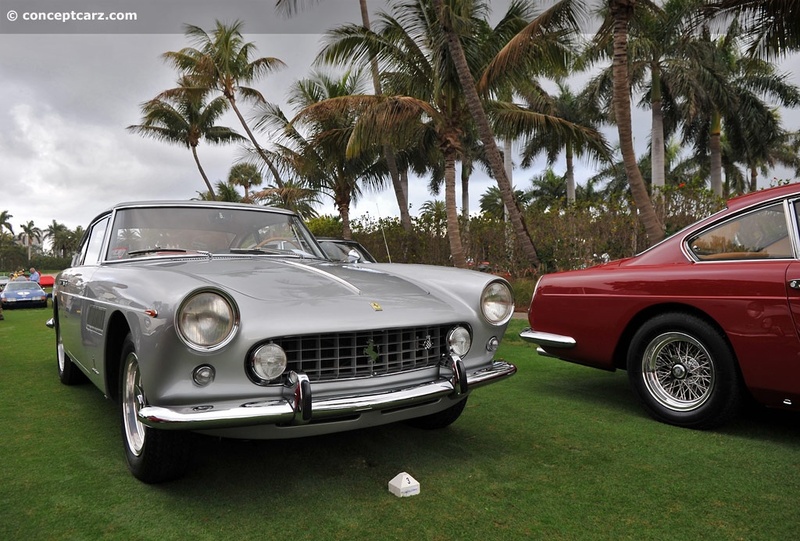 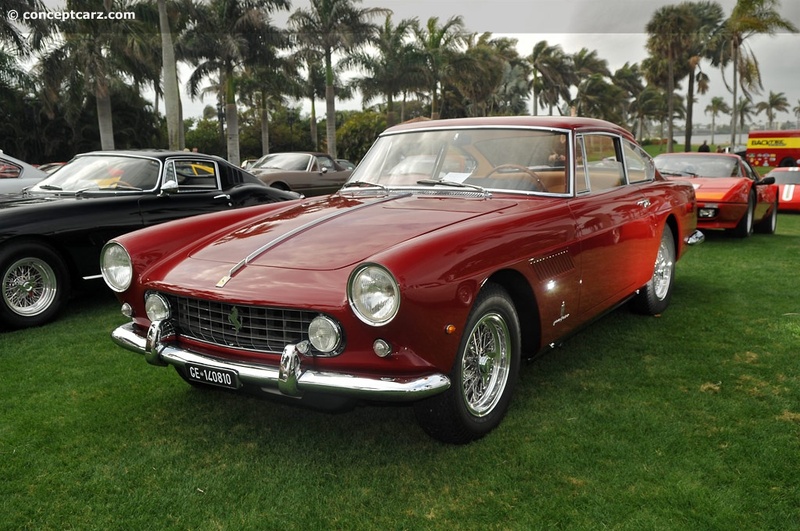 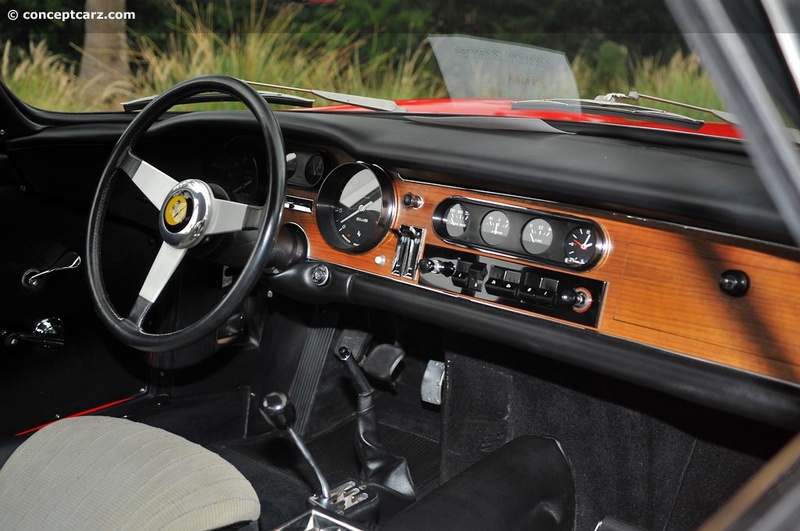 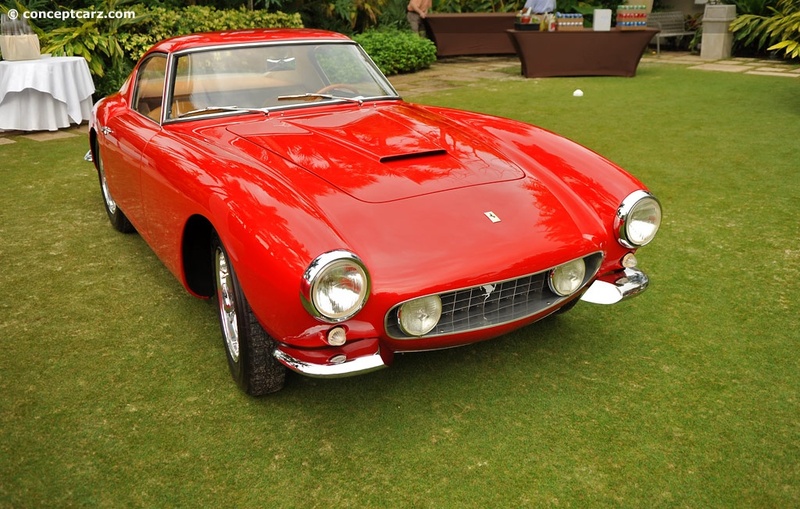 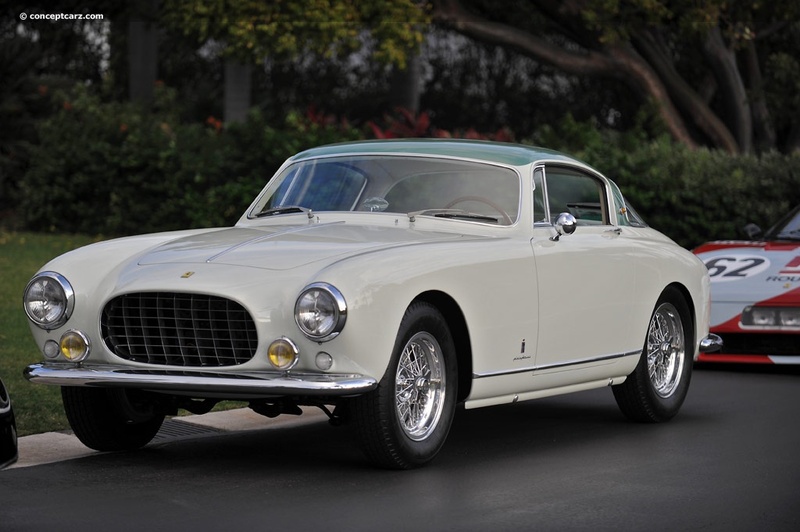 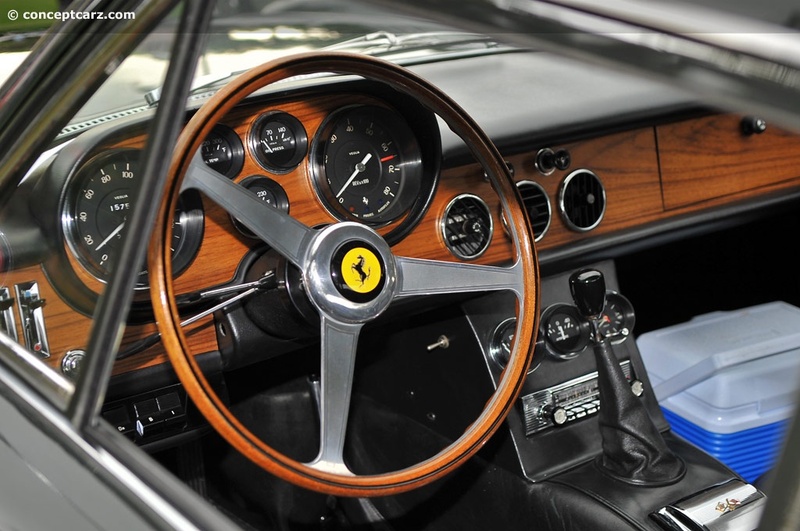 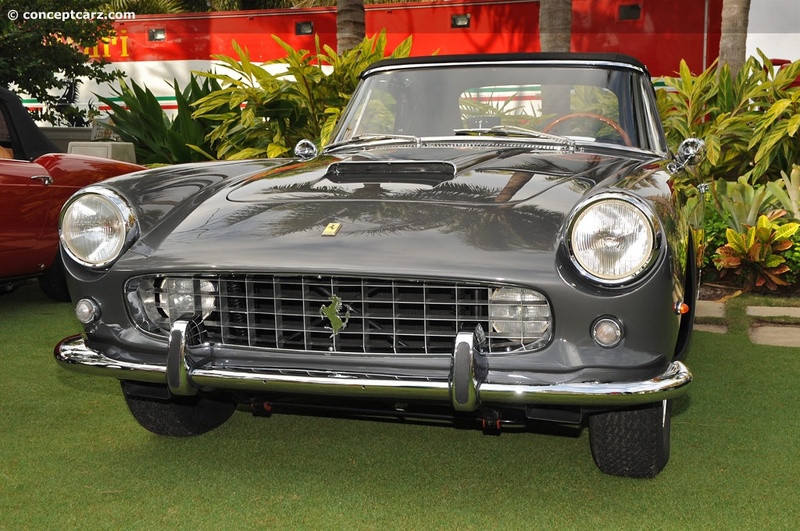 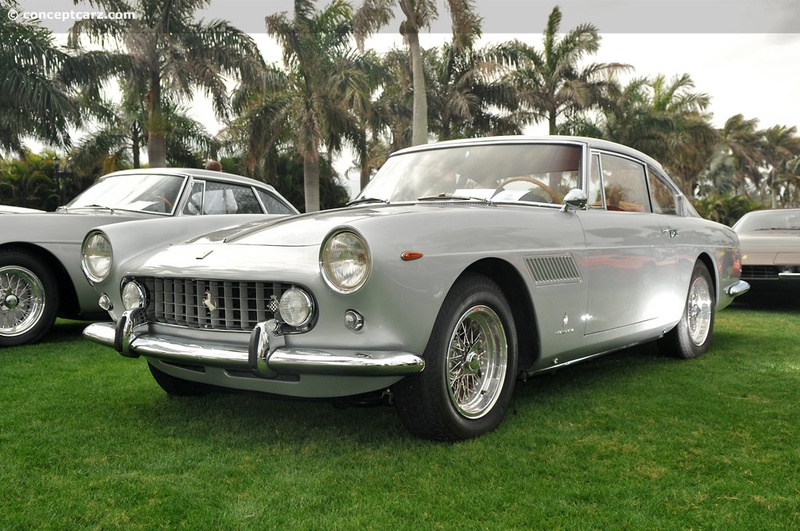 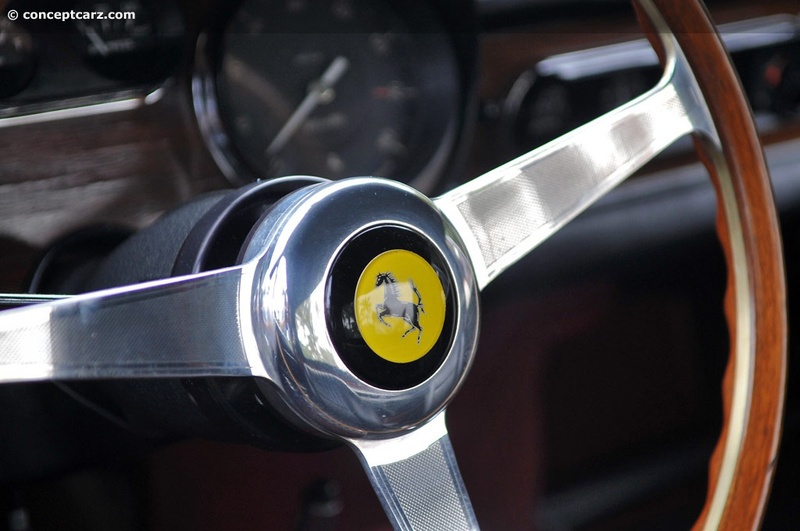 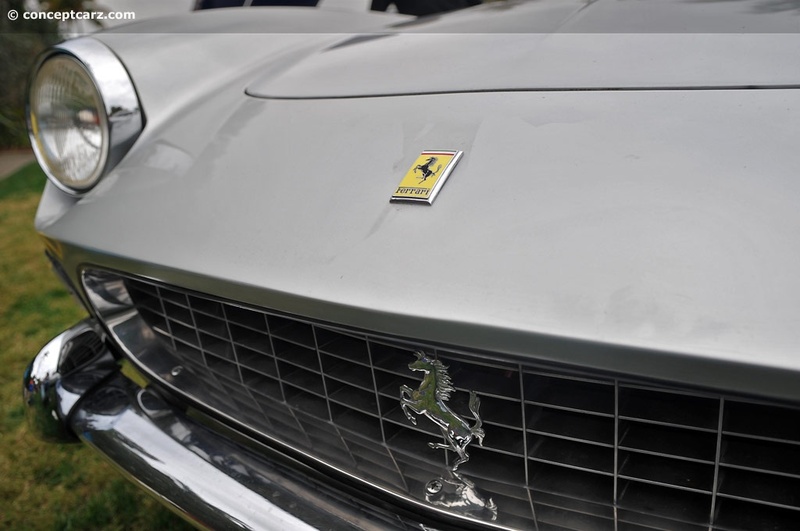 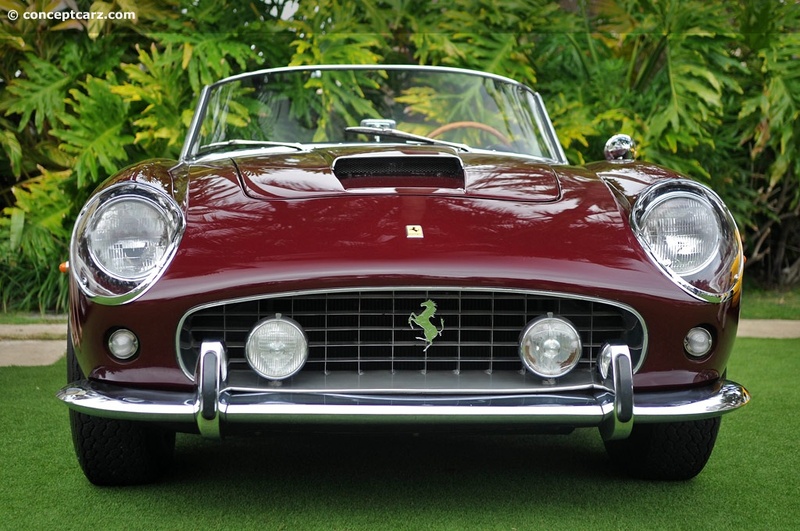 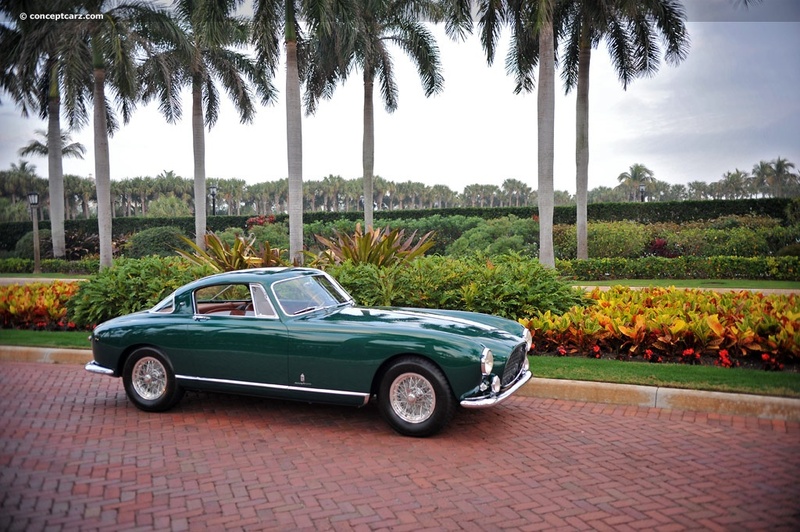 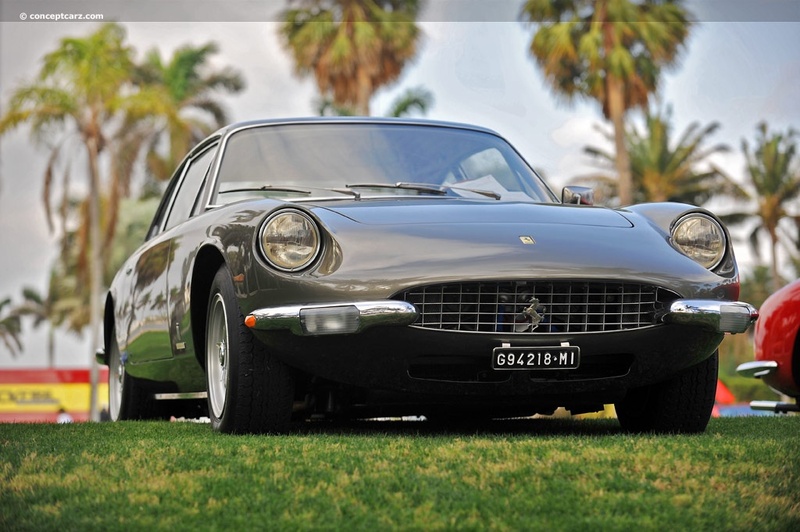 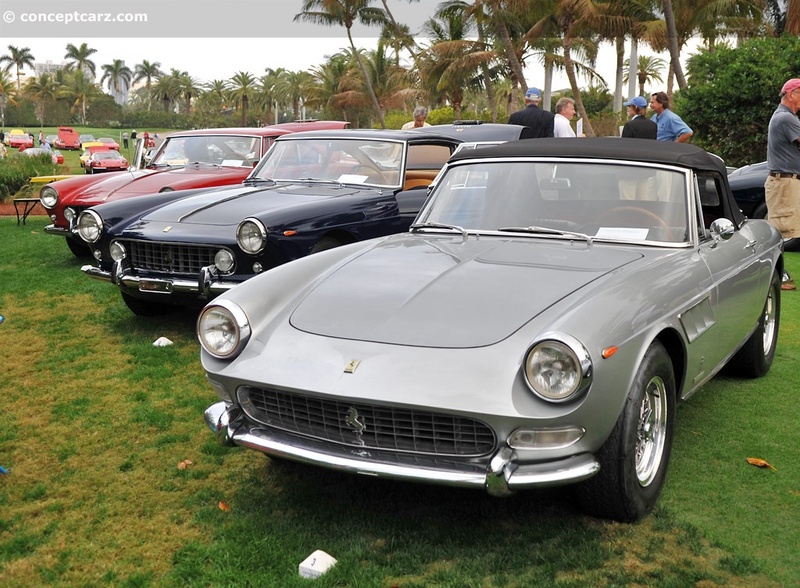 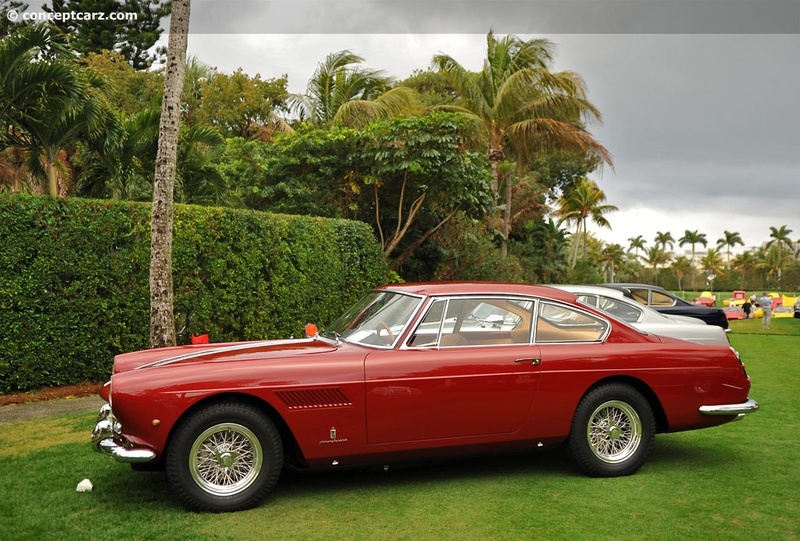 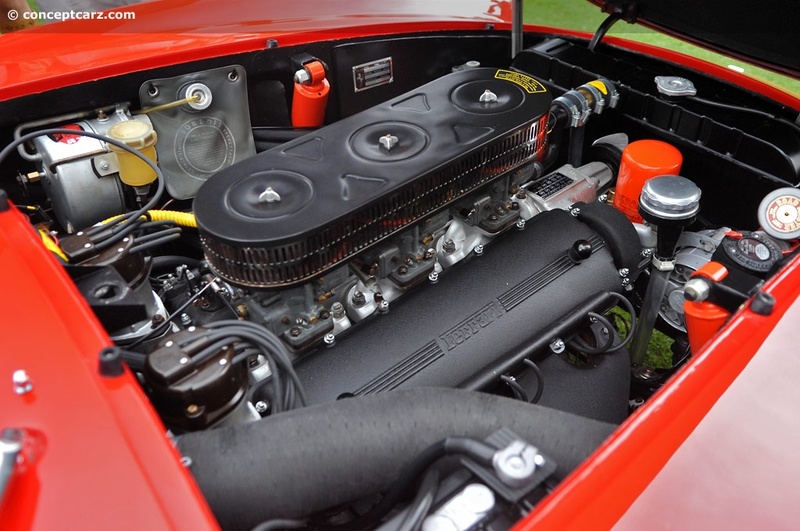 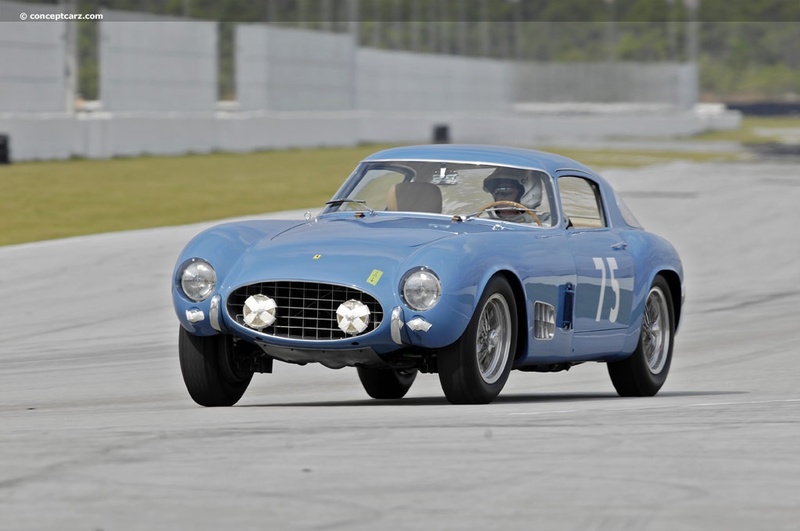 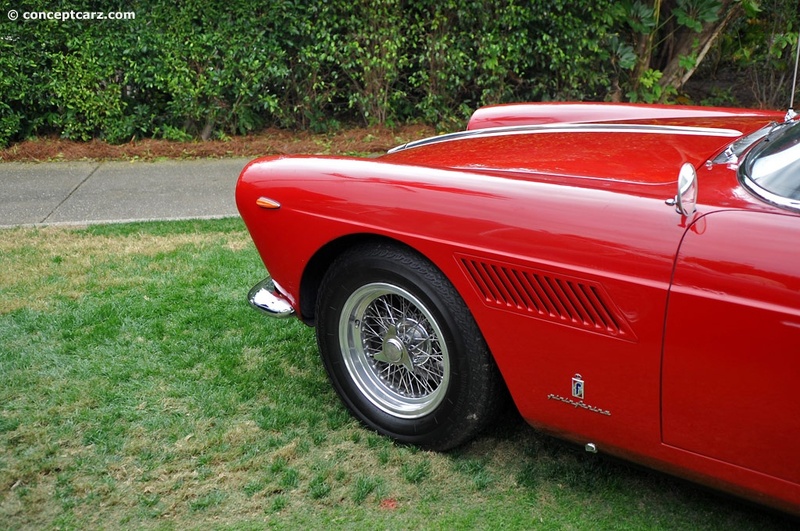 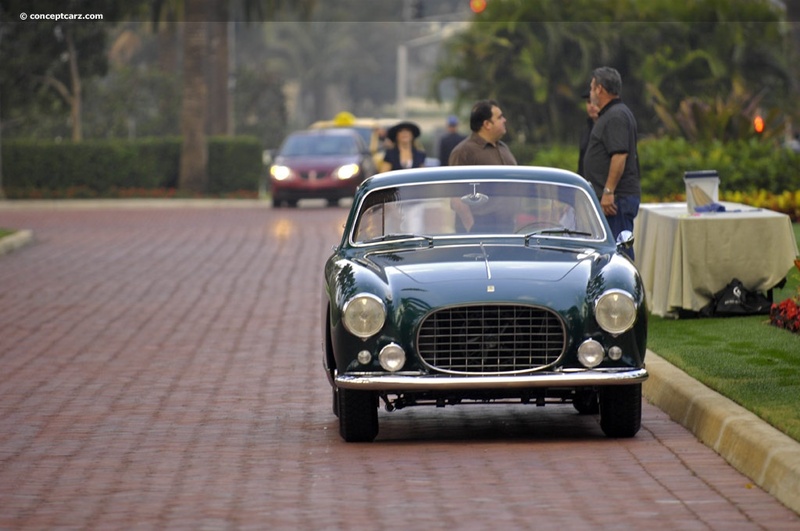 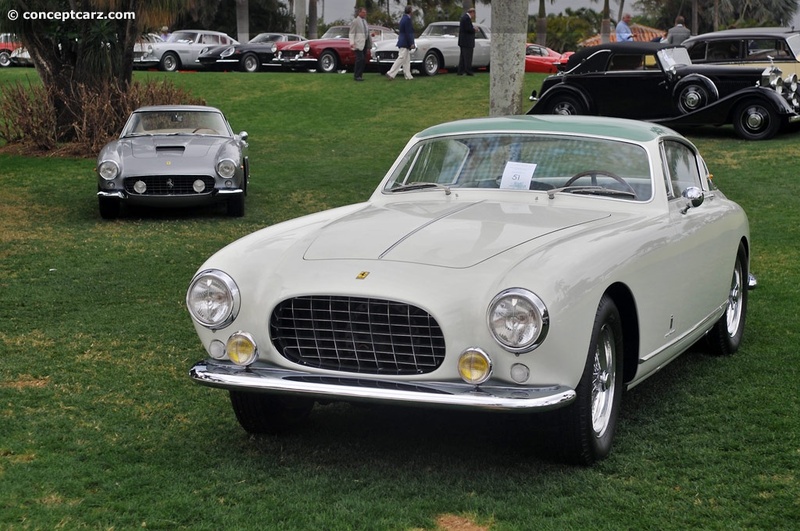 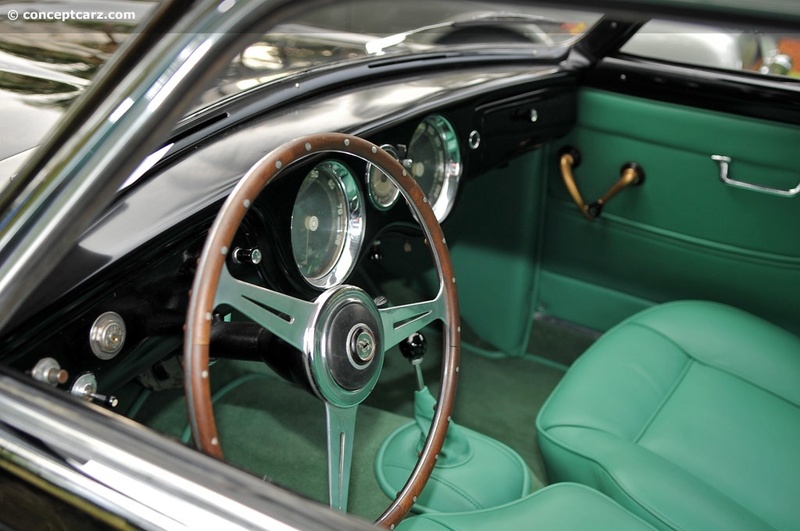 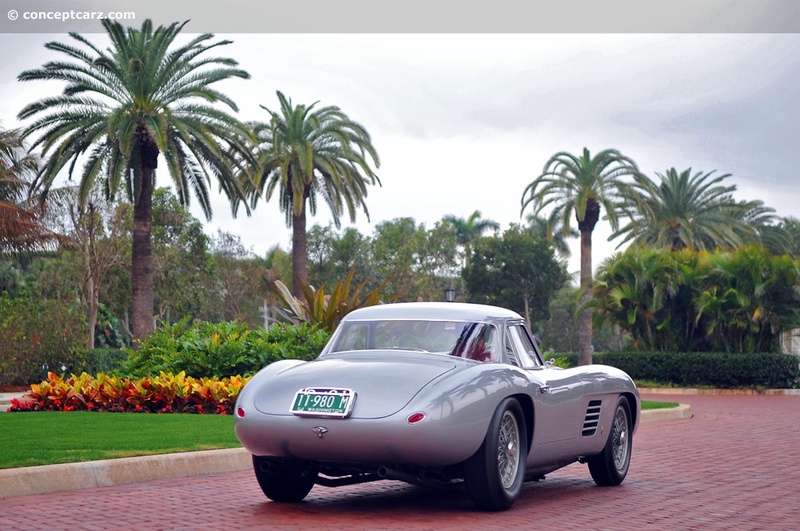 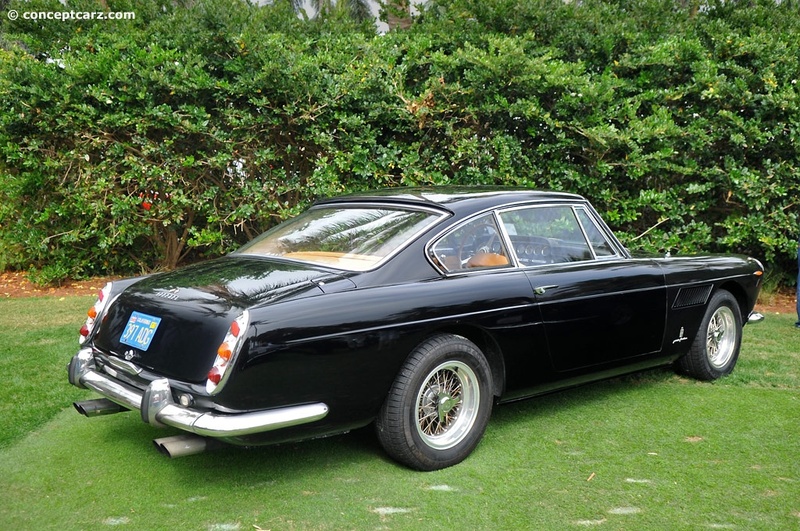 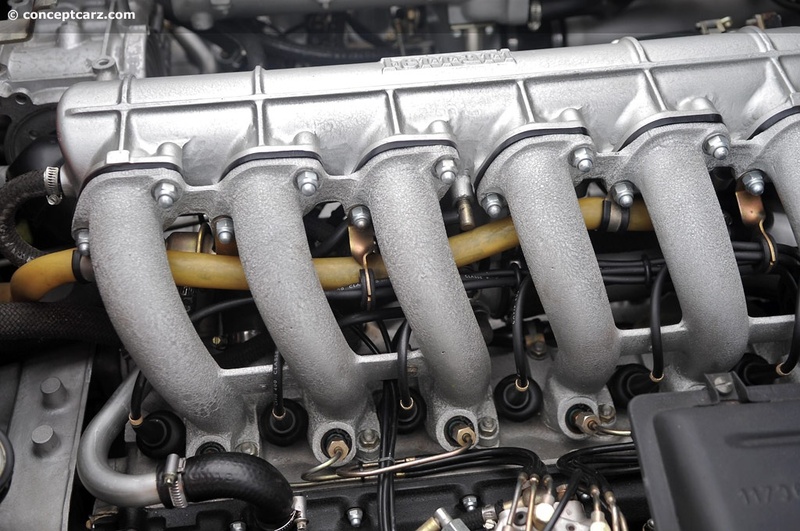 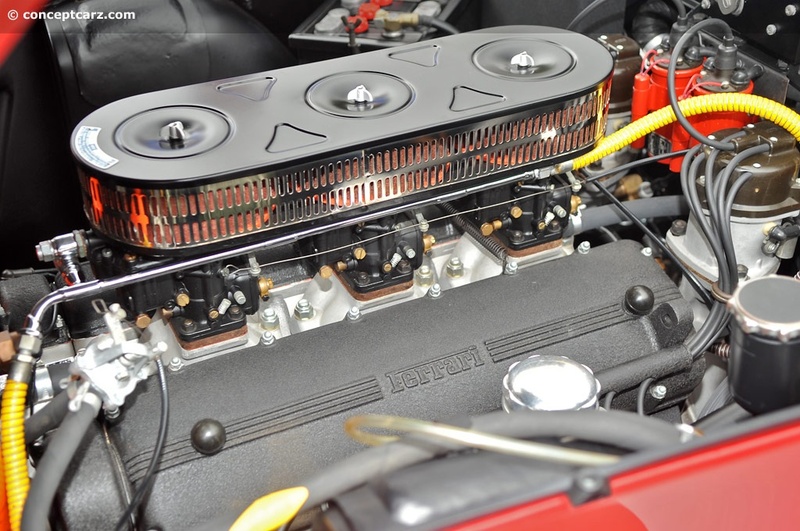 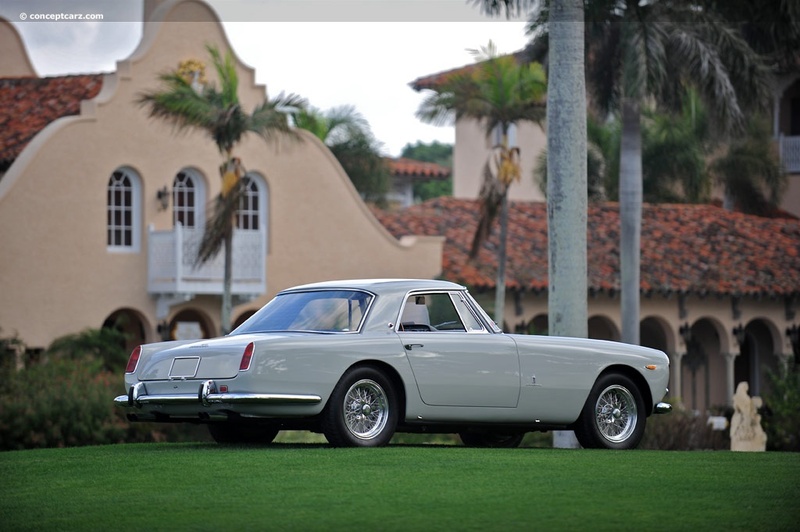 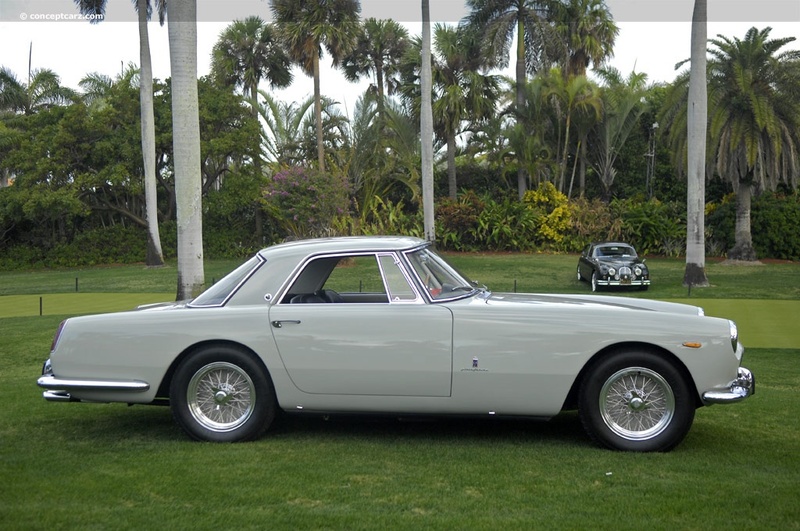 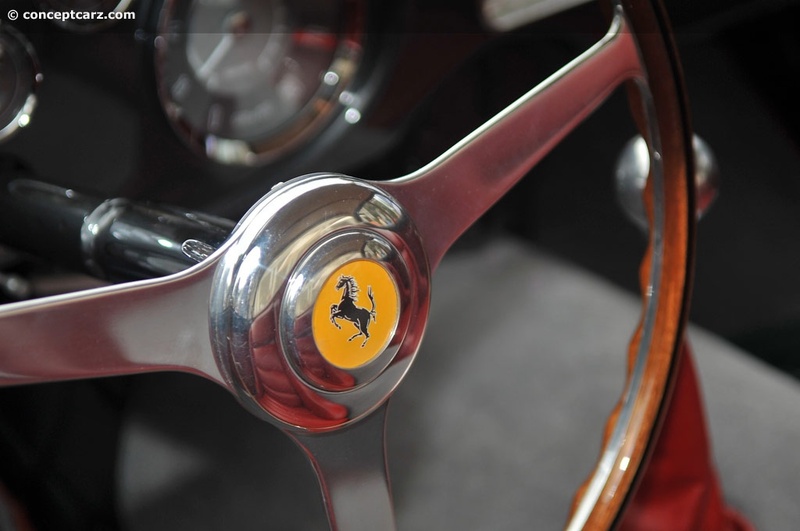 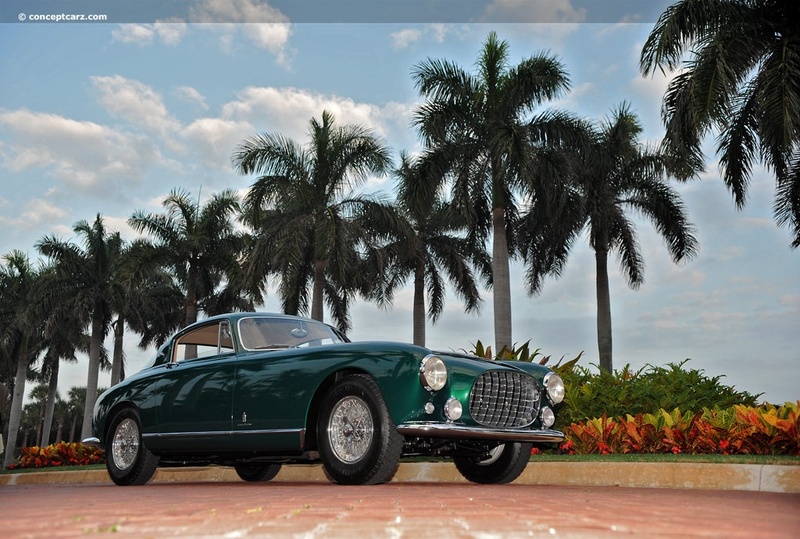 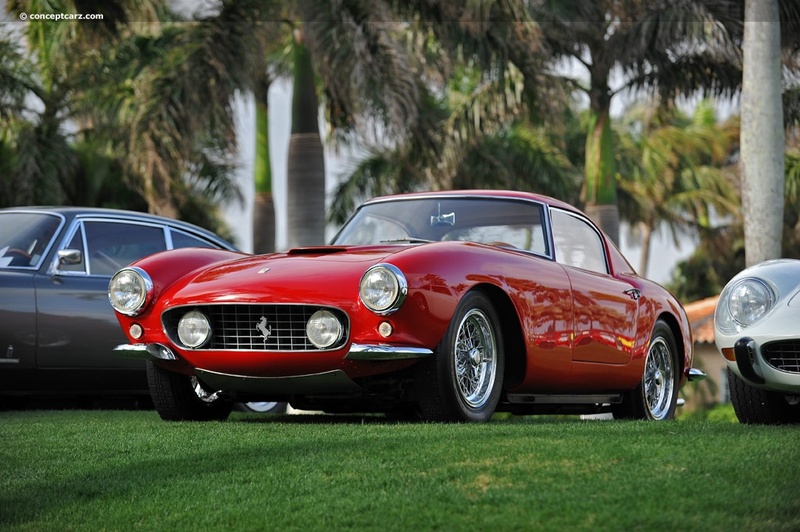 The Vignale-bodied Ferrari 212 Export with chassis number 0080 E has spent most of its life in the United States. 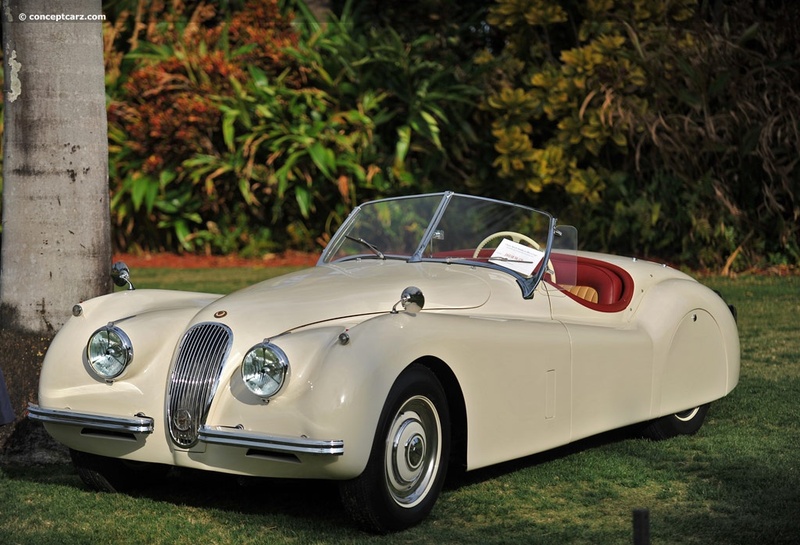 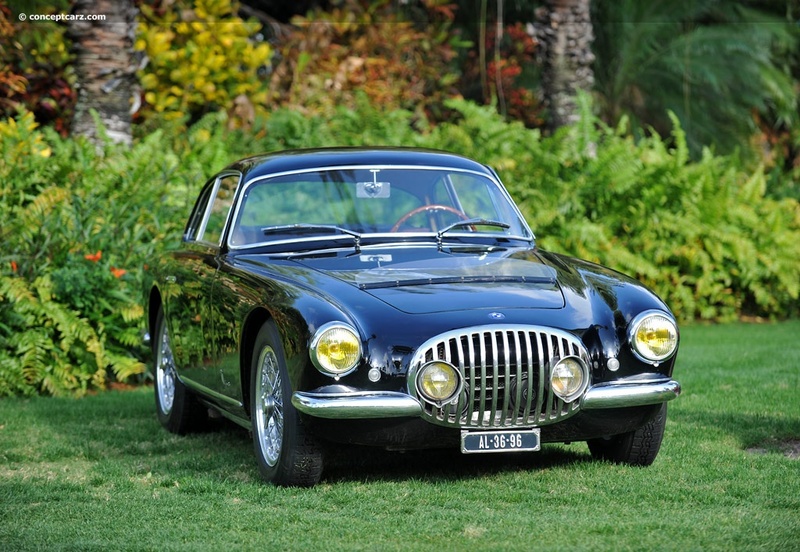 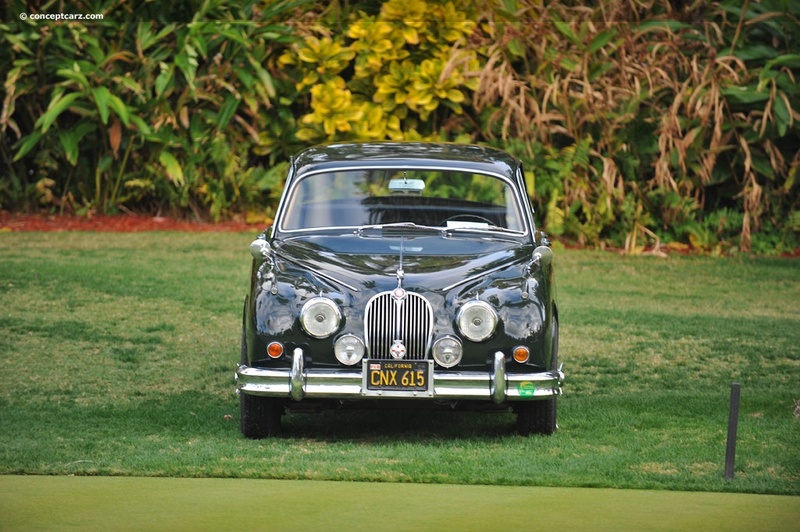 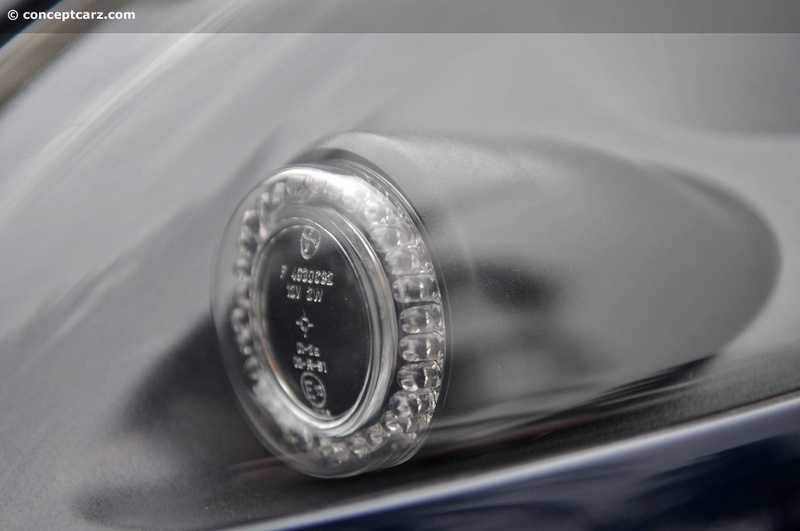 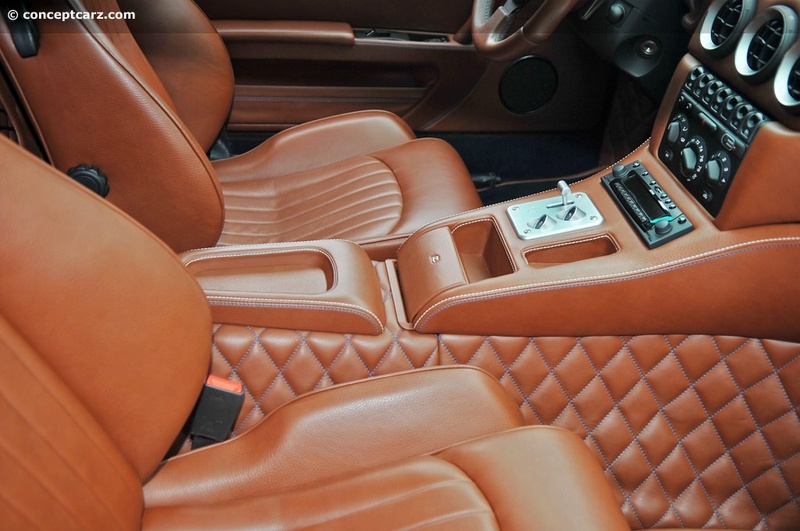 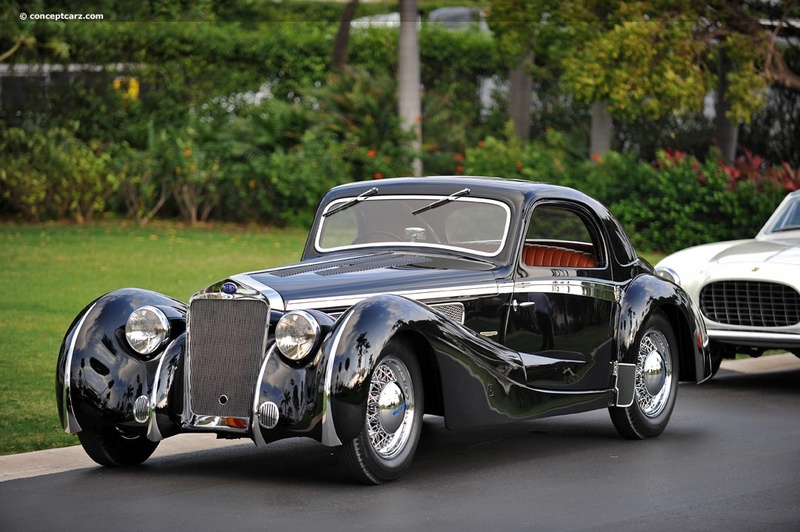 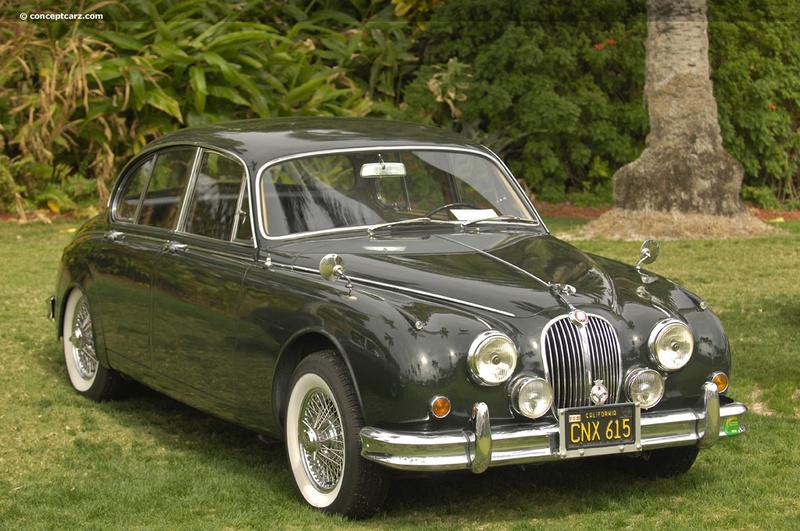 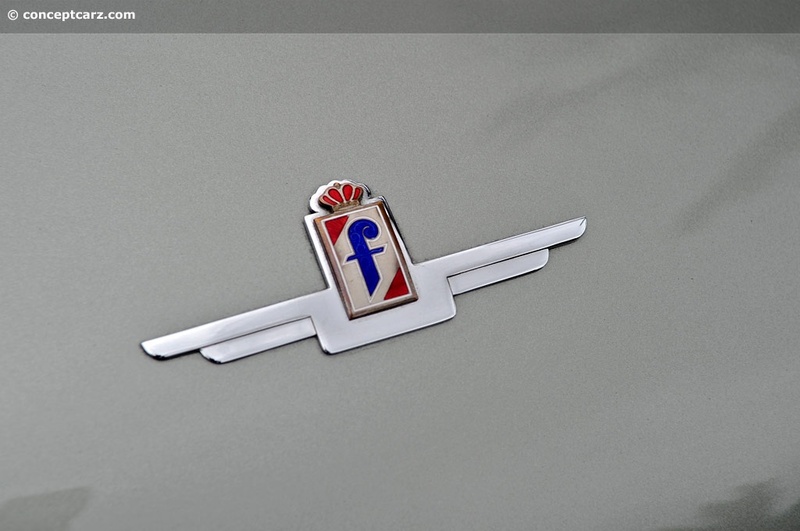 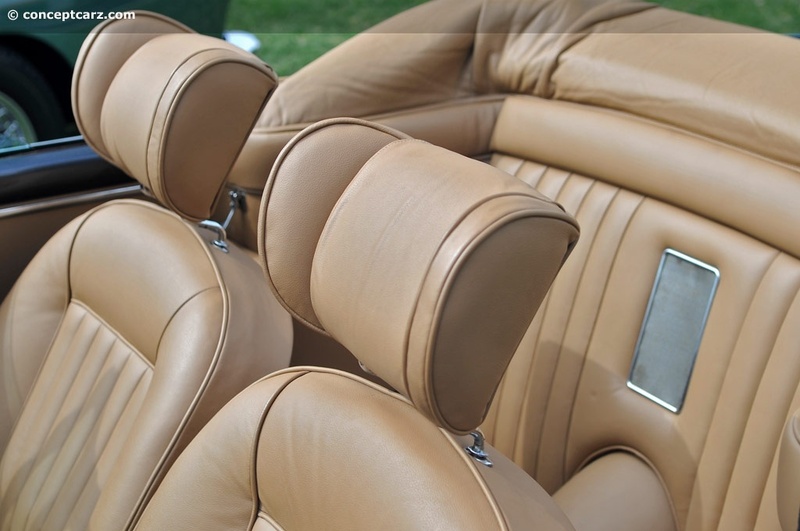 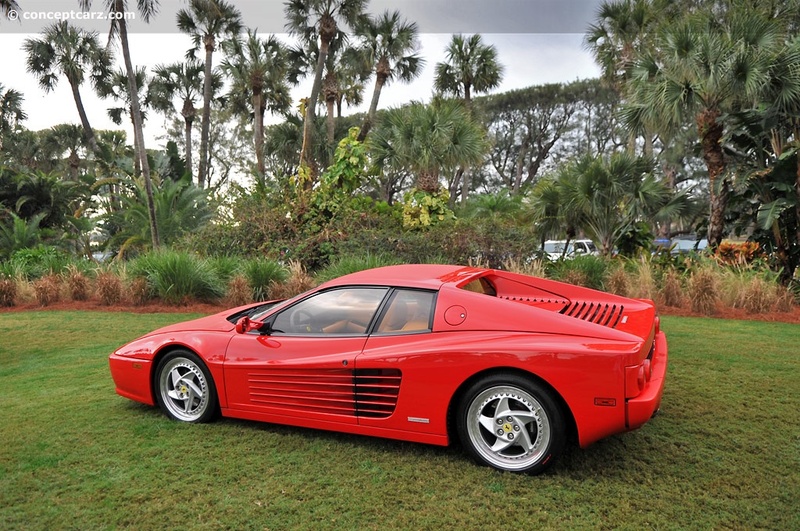 In 1994 it was the runner-up for the Most Elegant award at the Pebble Beach Concours d'Elegance. 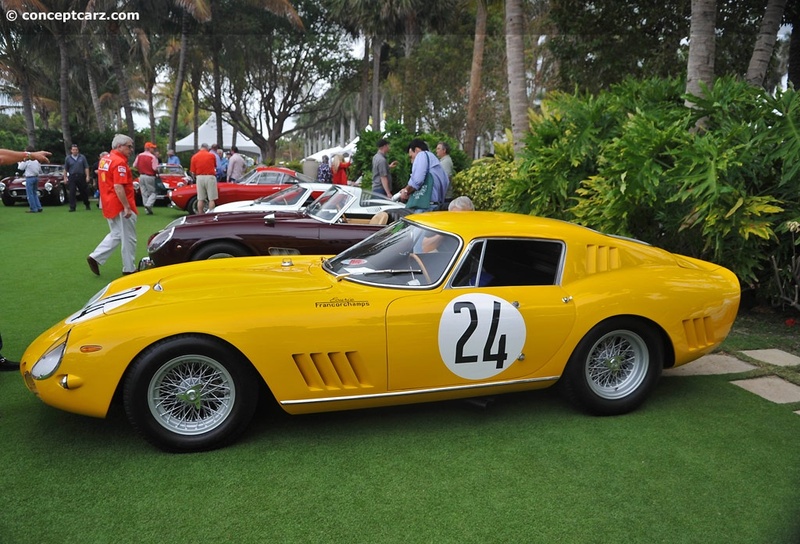 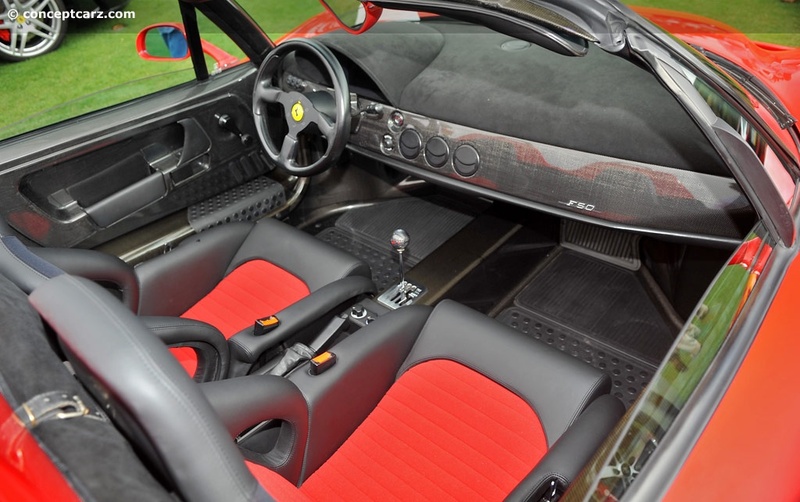 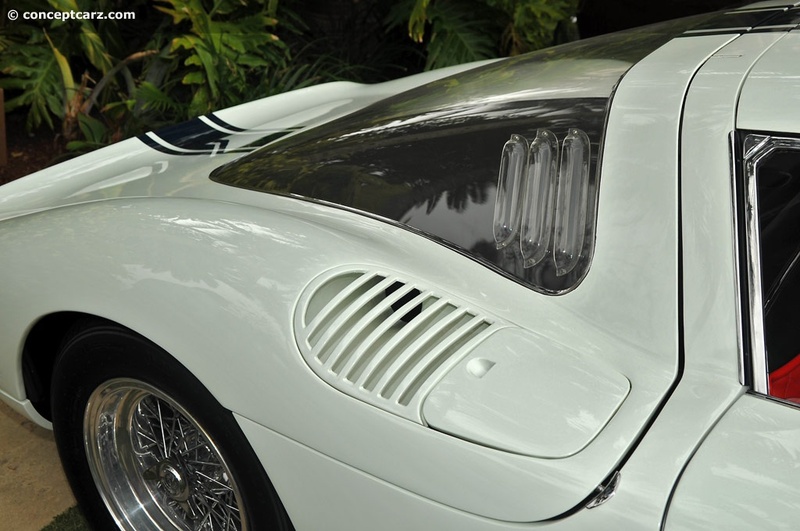 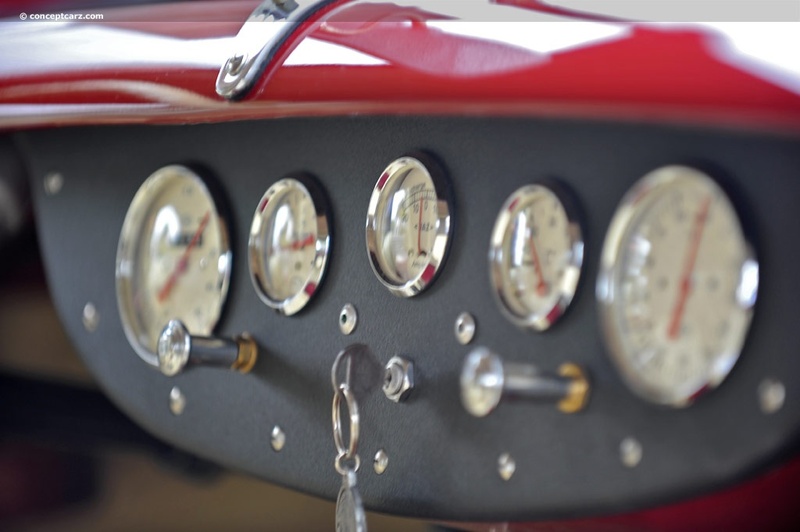 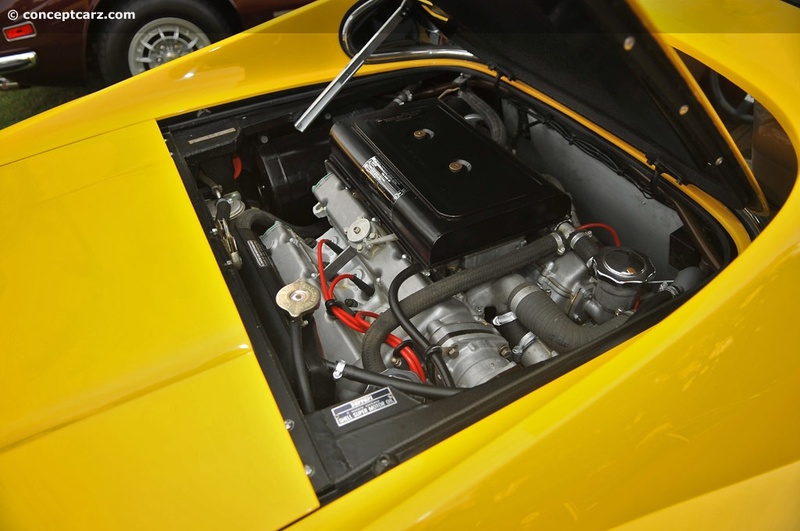 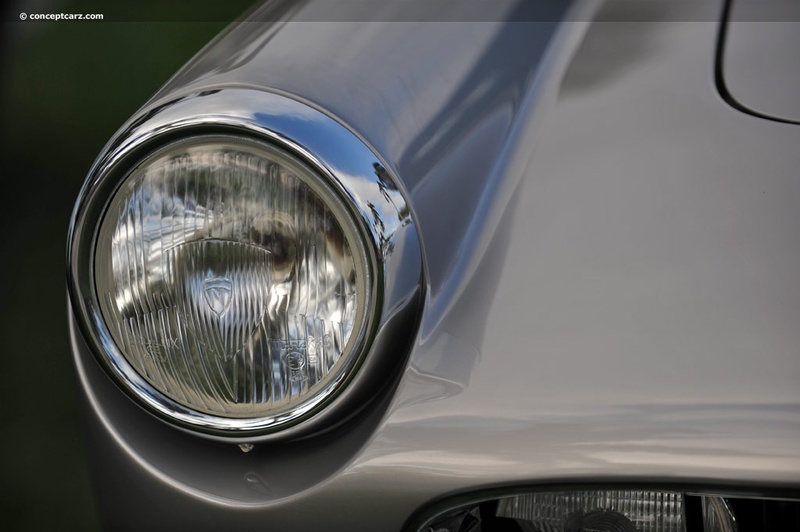 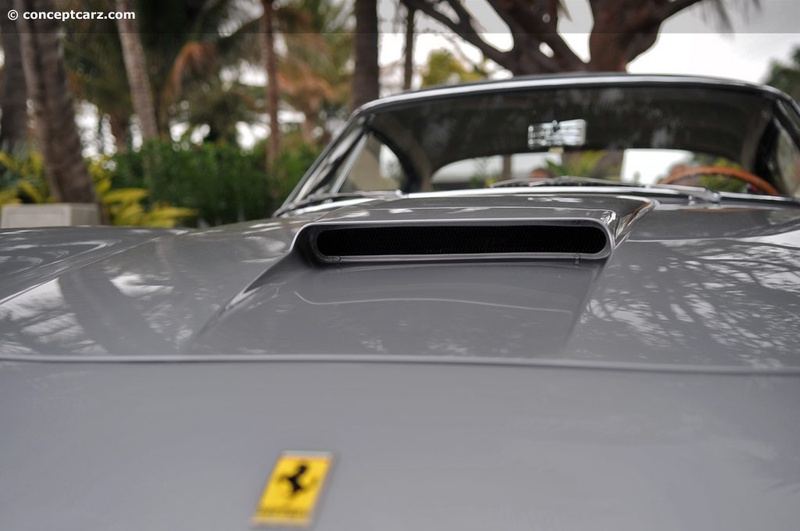 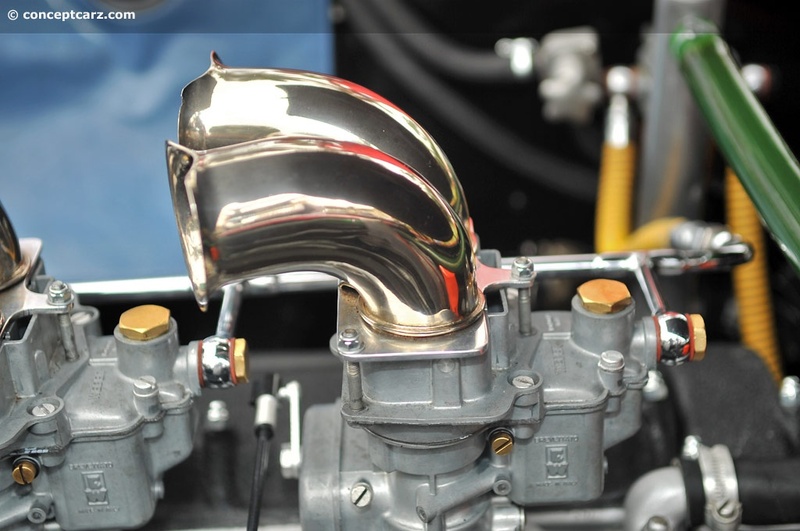 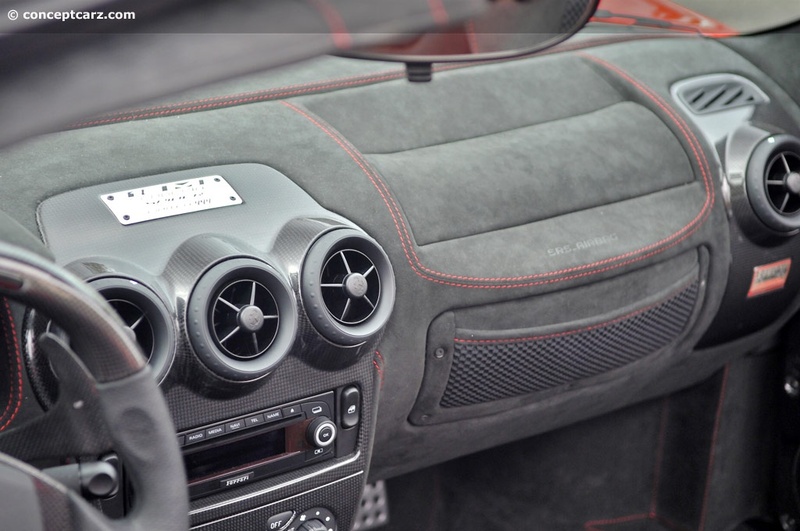 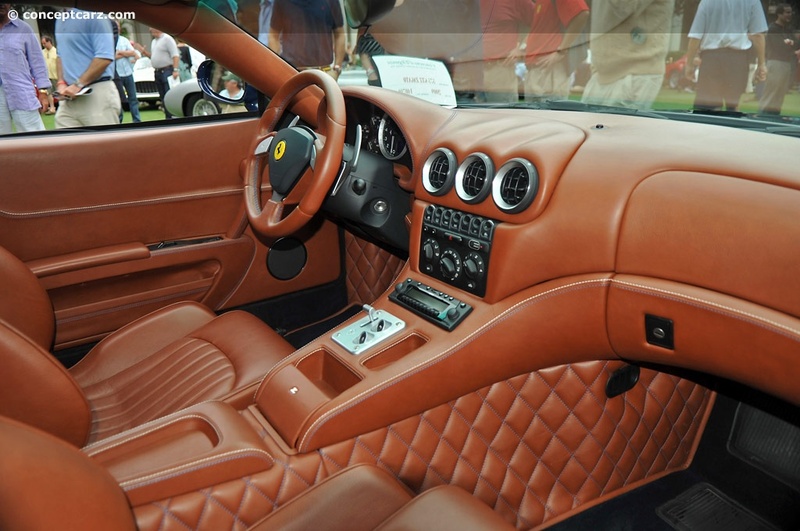 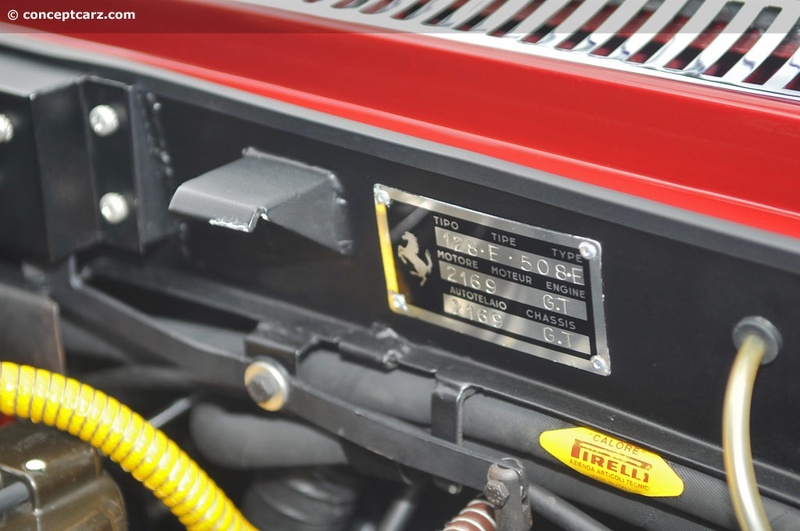 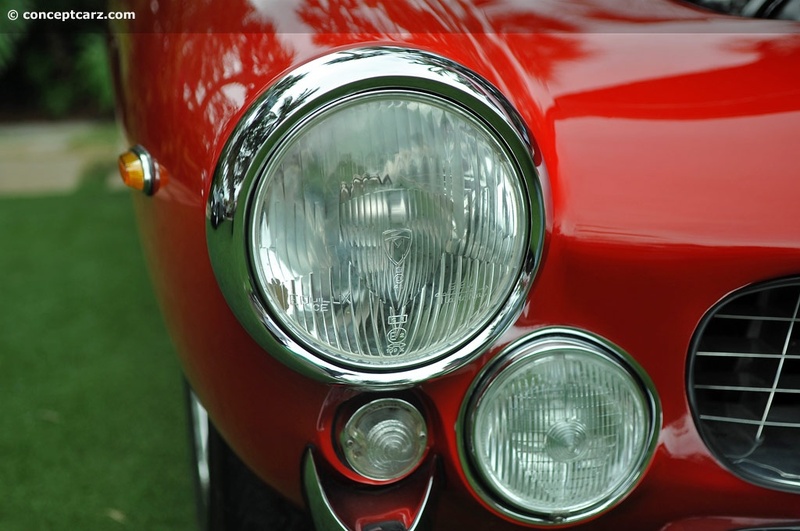 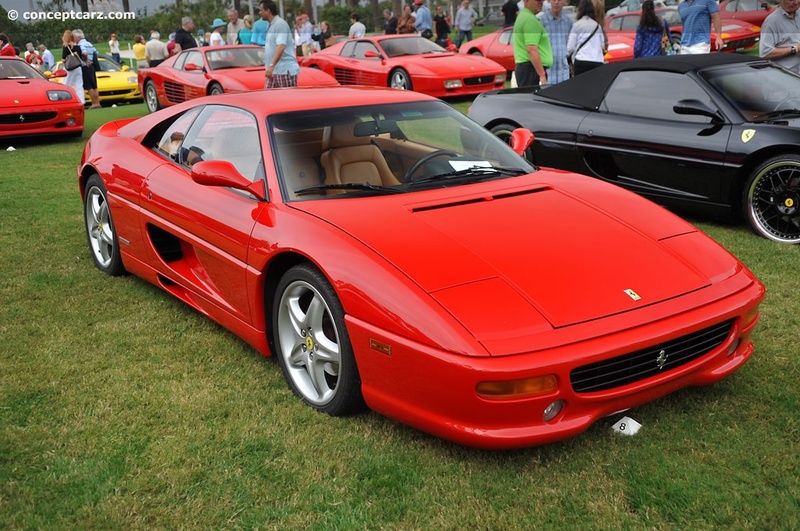 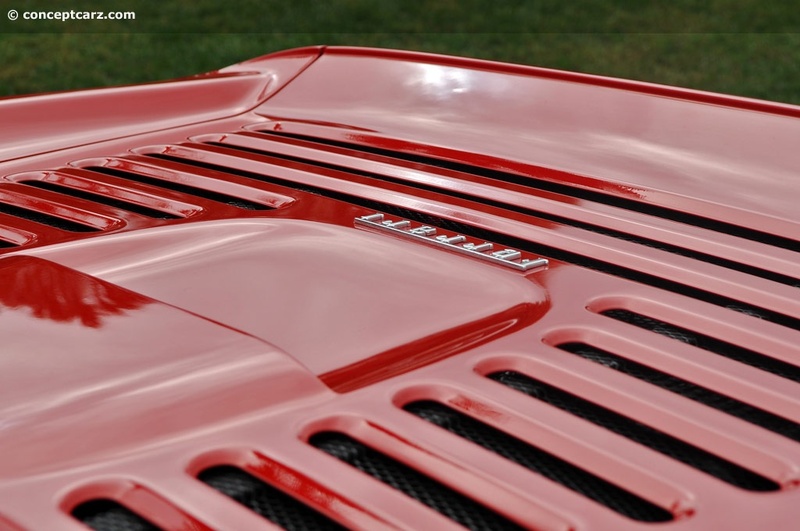 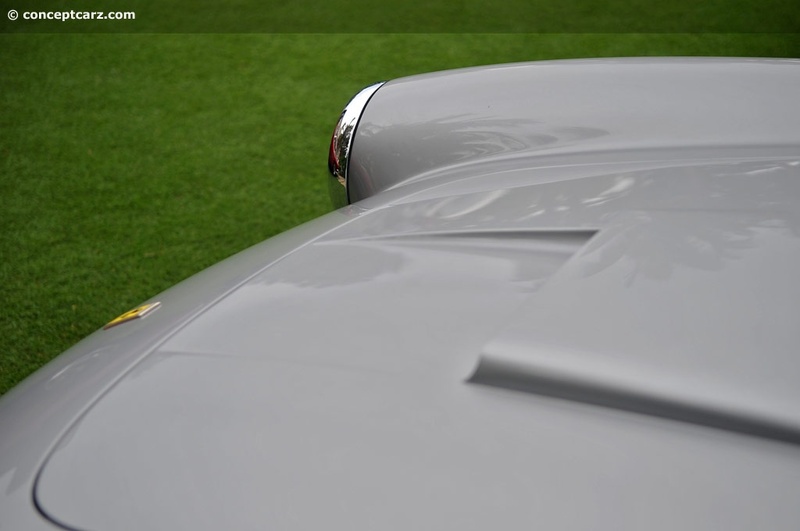 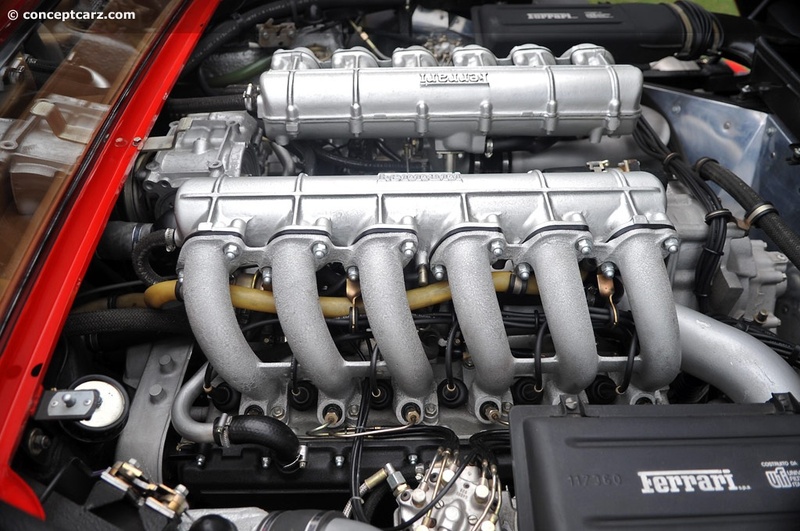 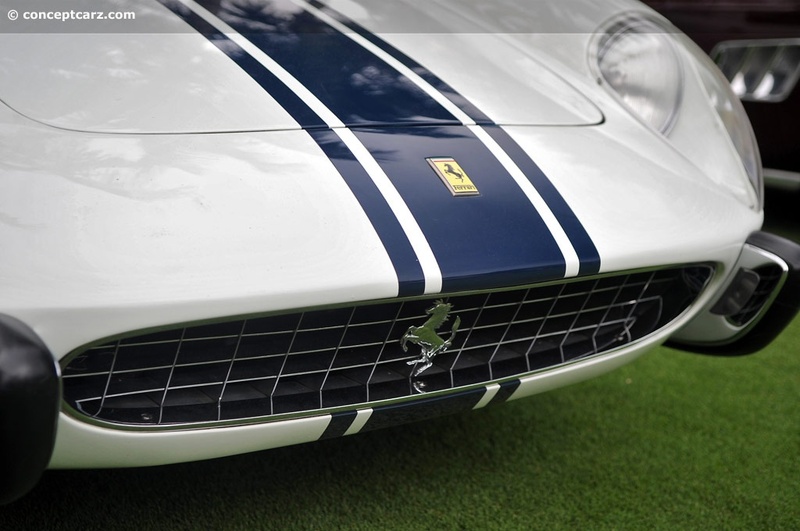 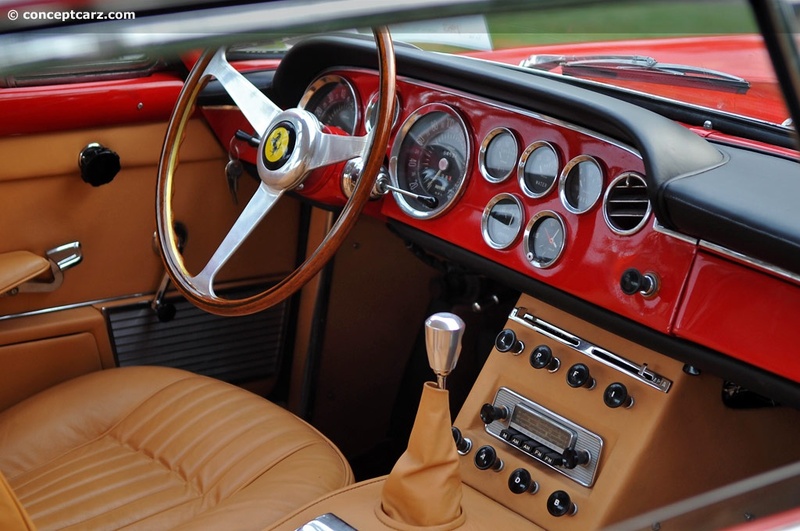 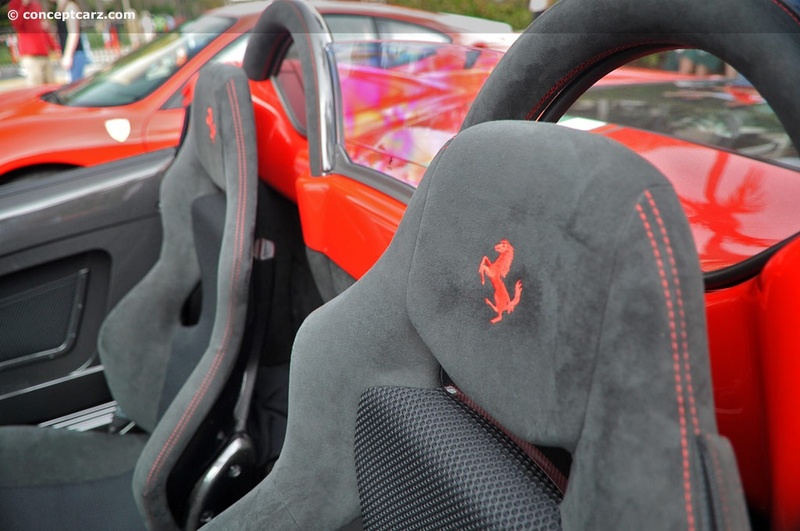 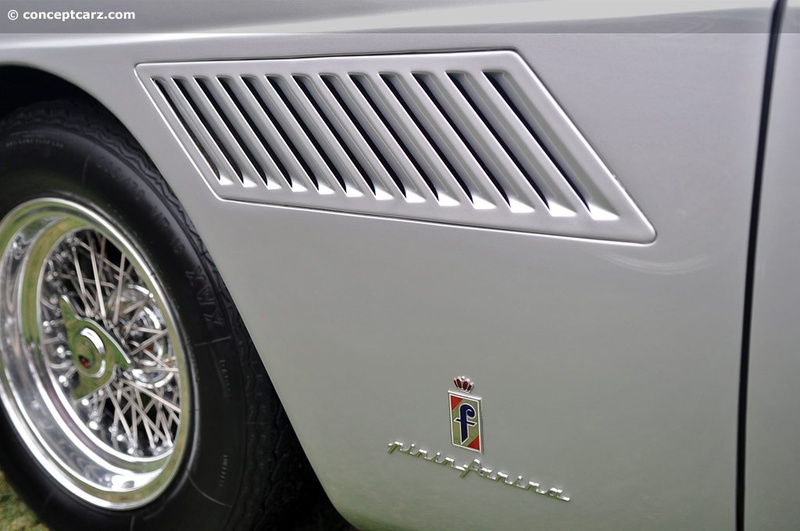 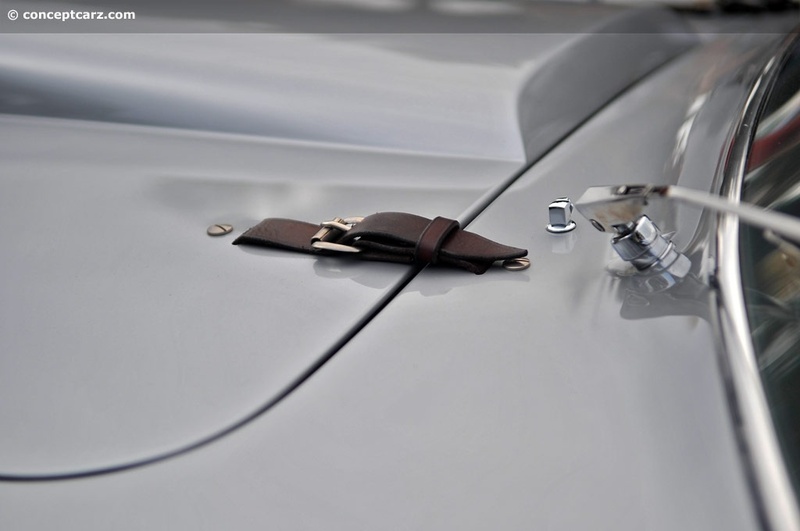 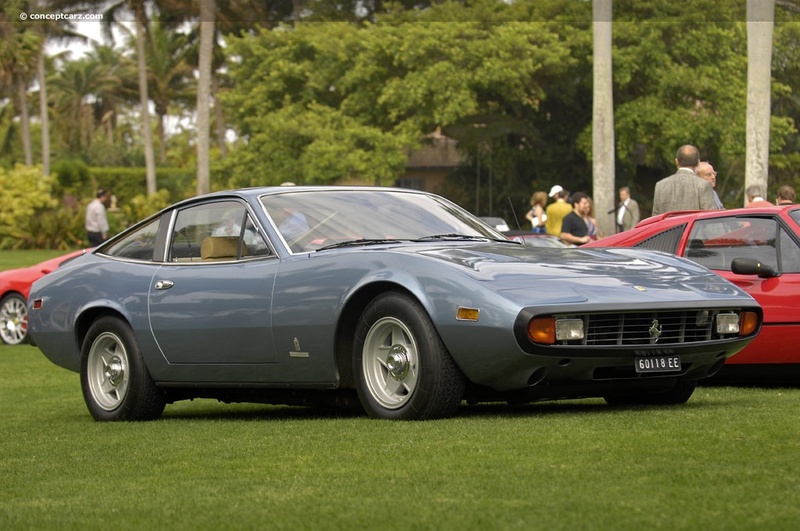 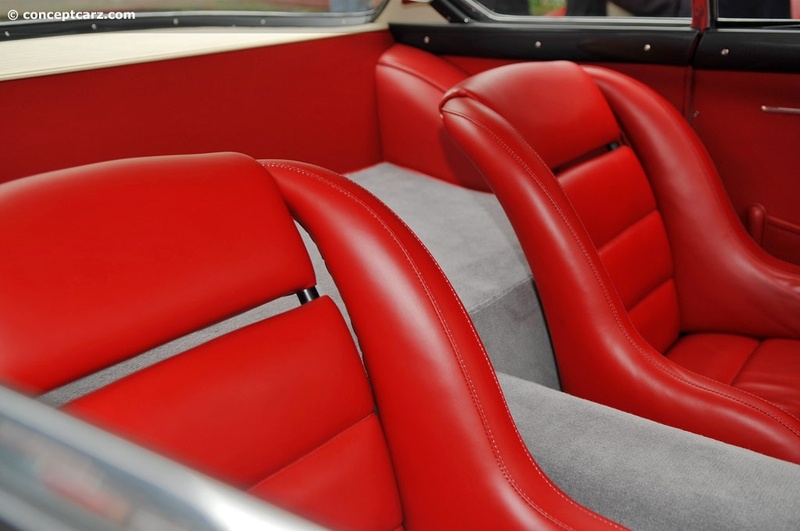 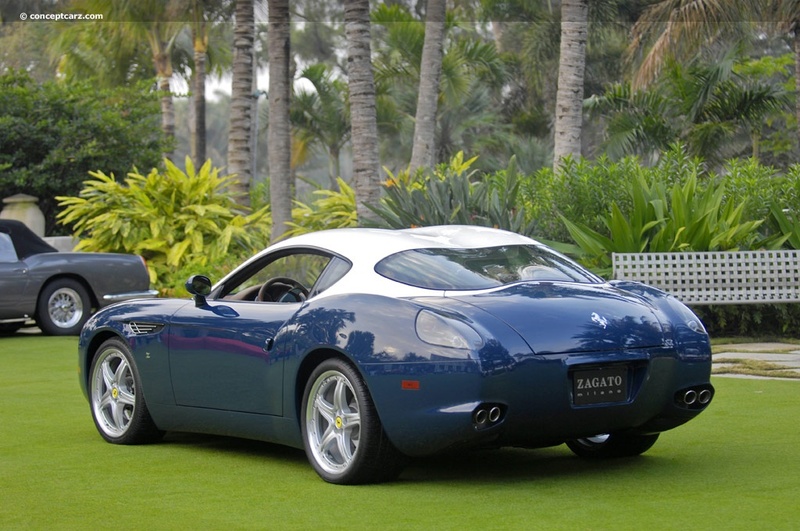 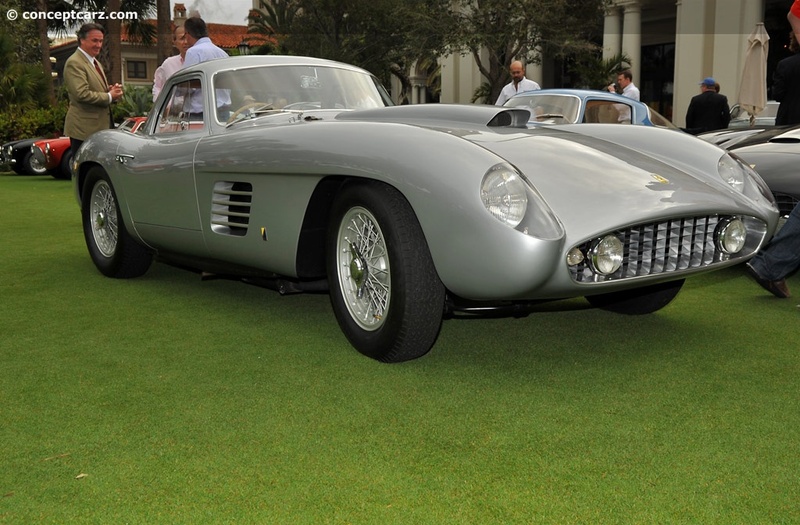 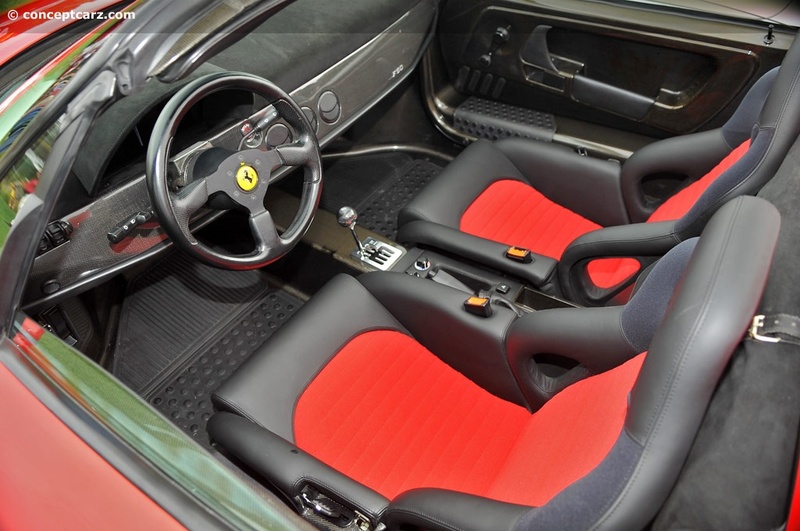 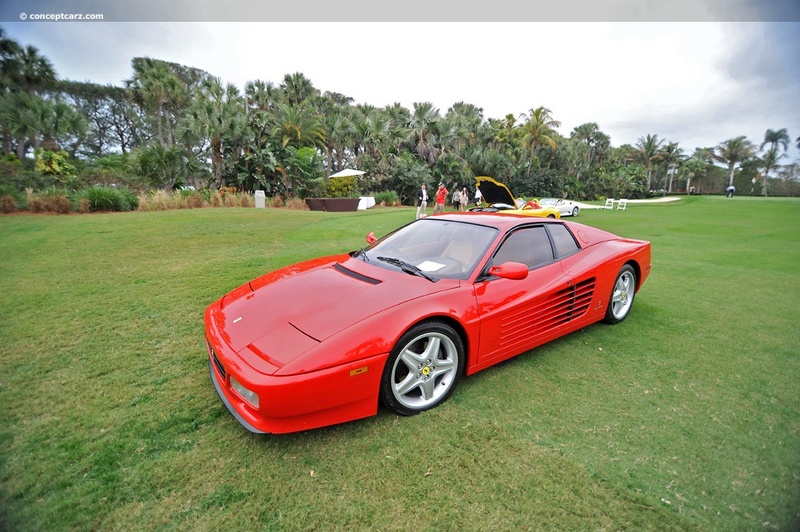 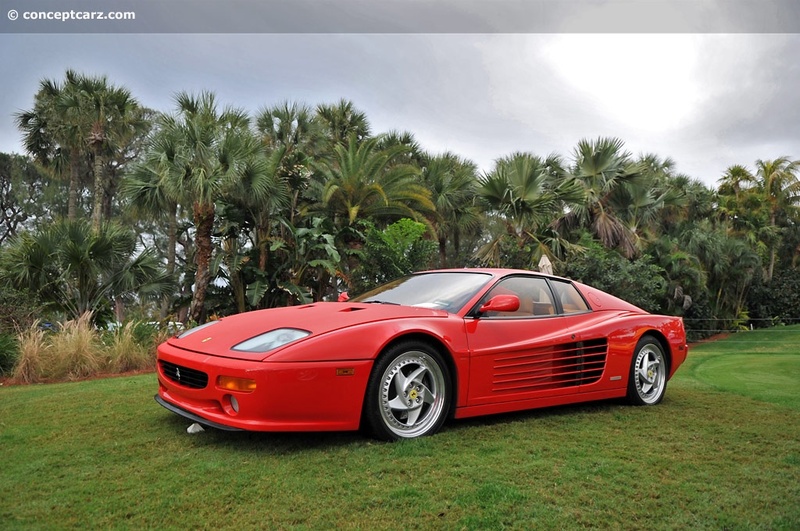 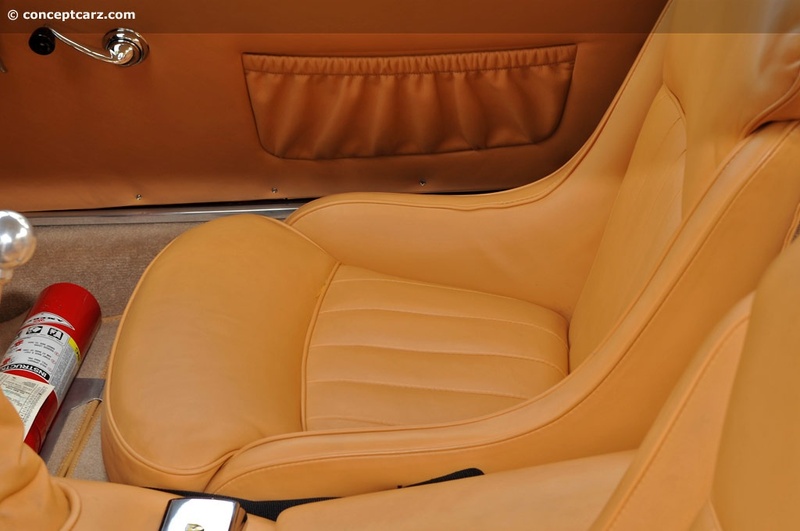 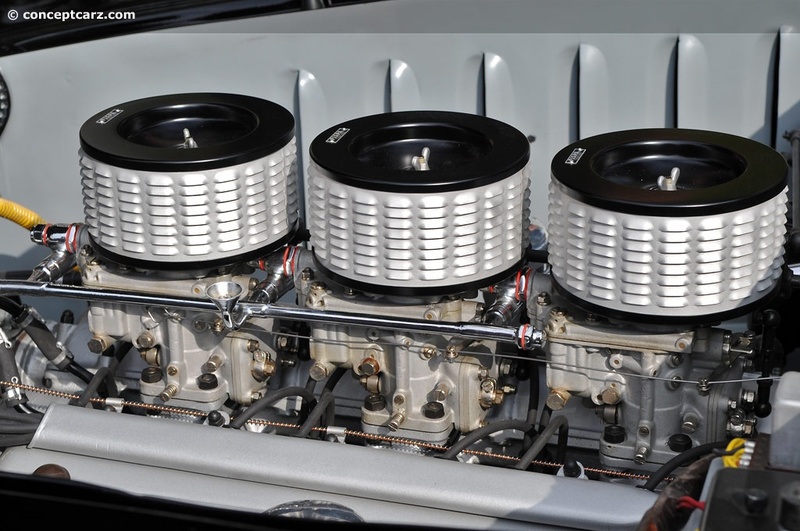 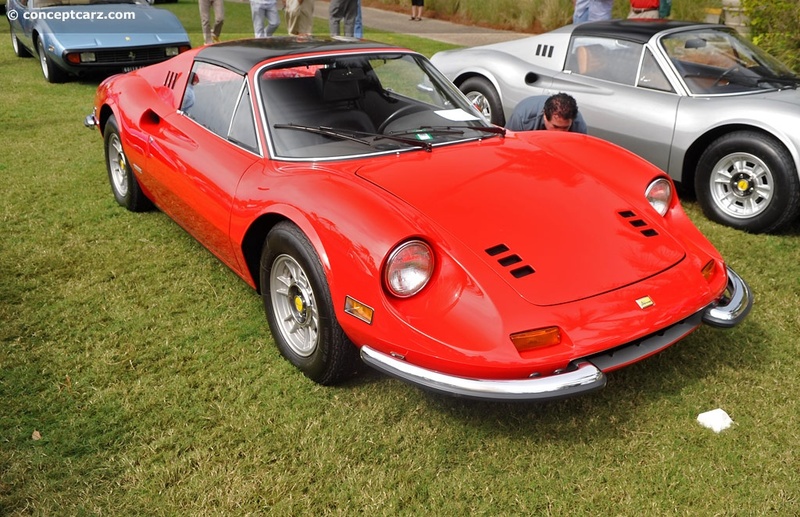 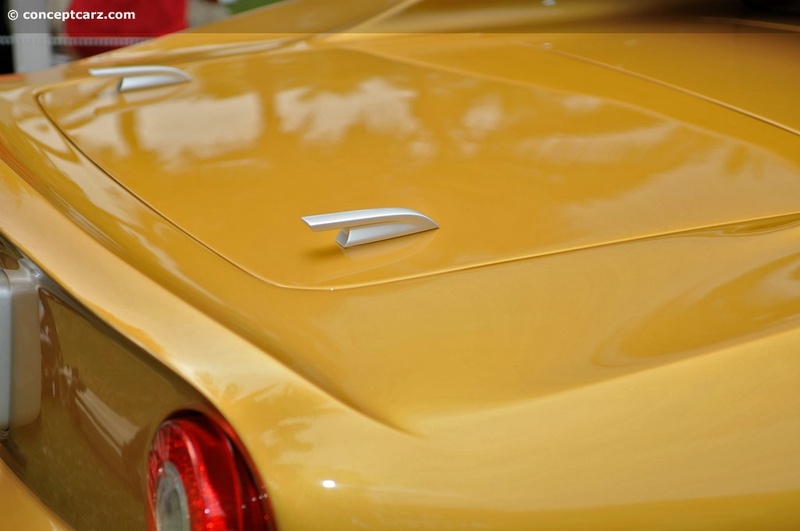 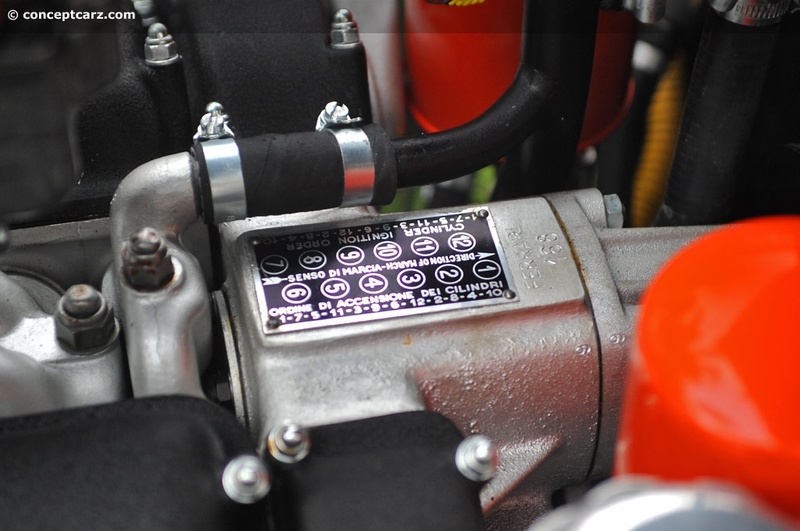 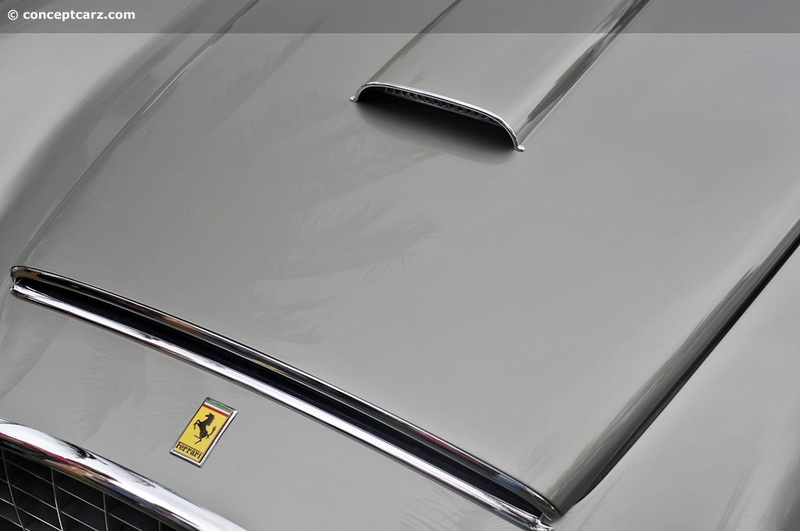 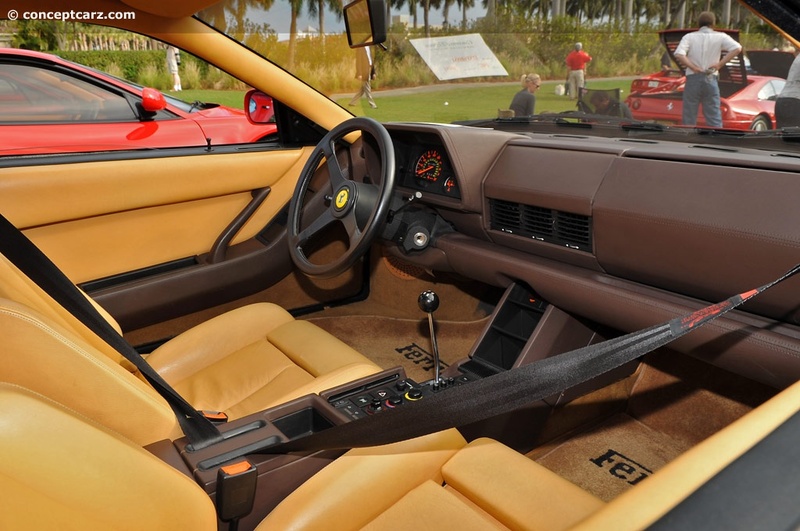 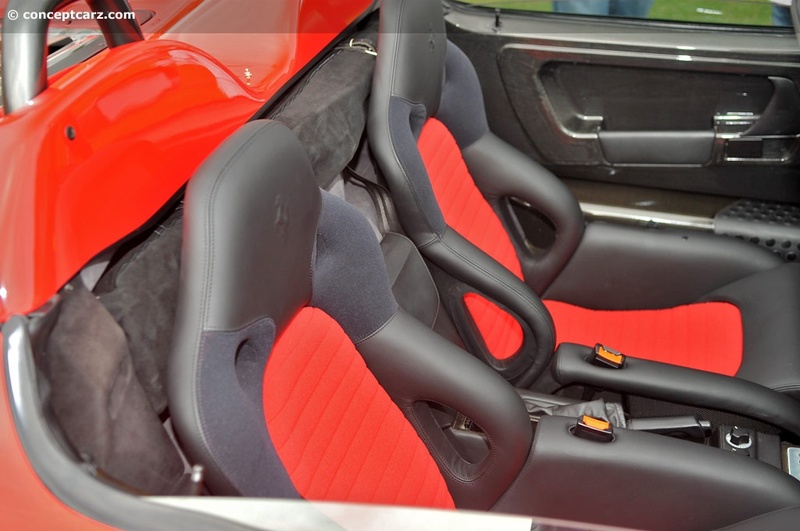 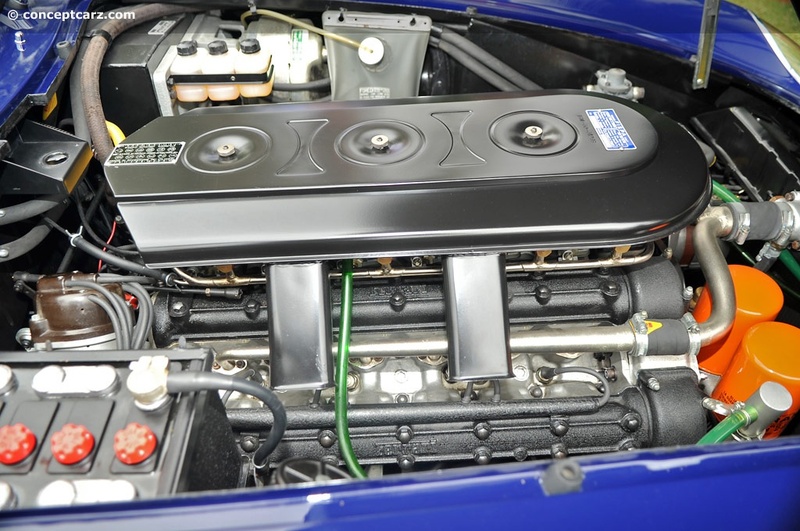 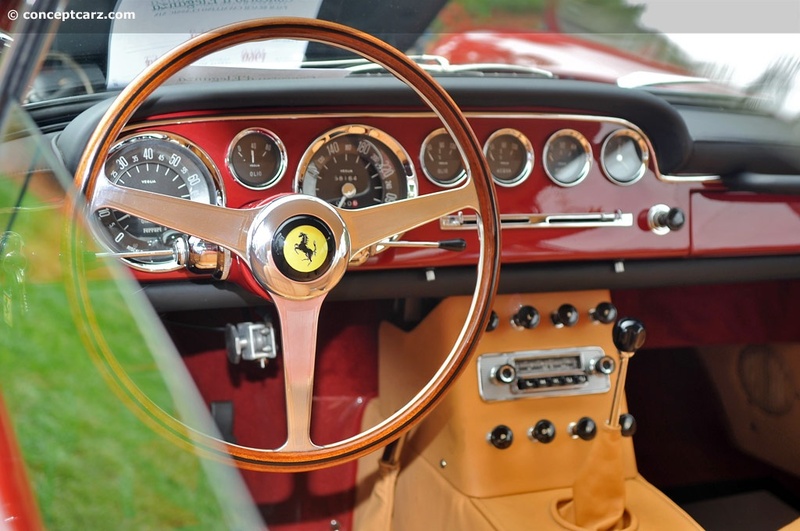 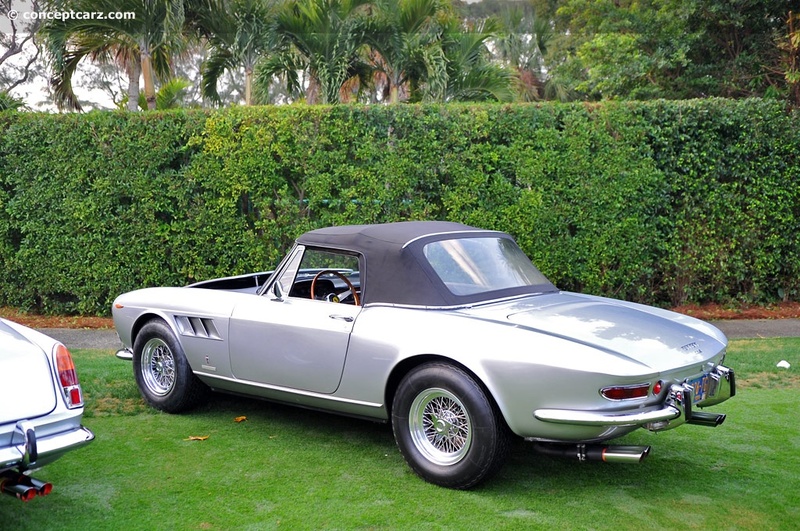 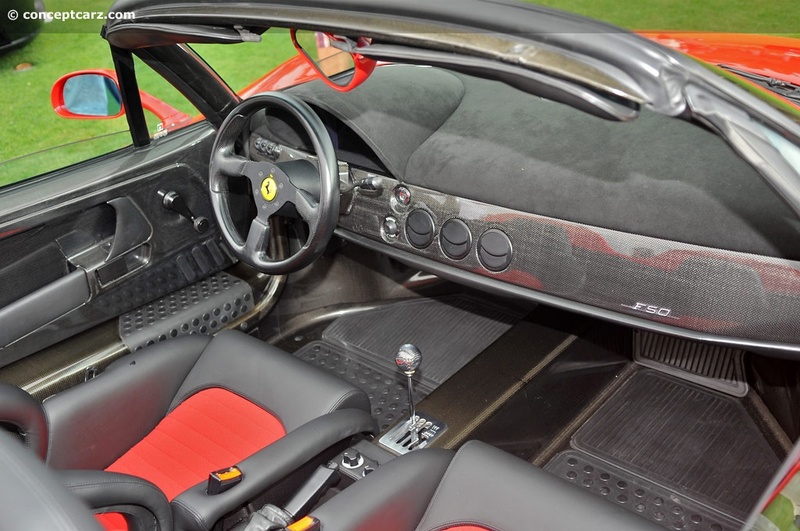 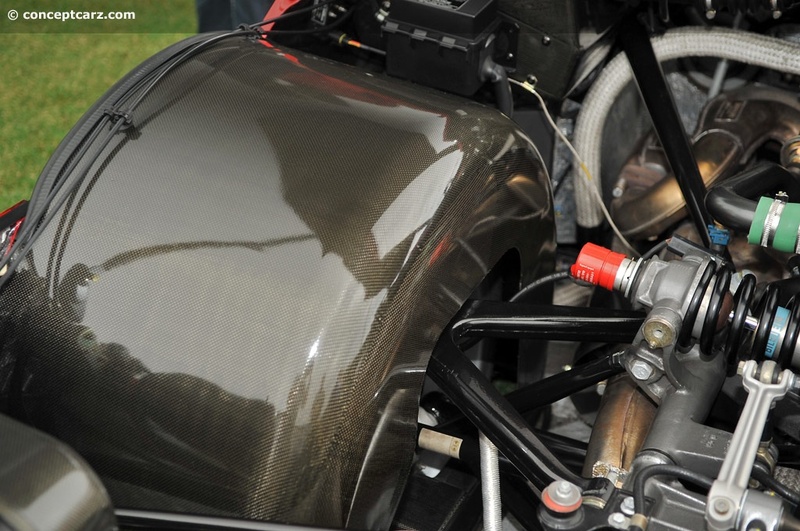 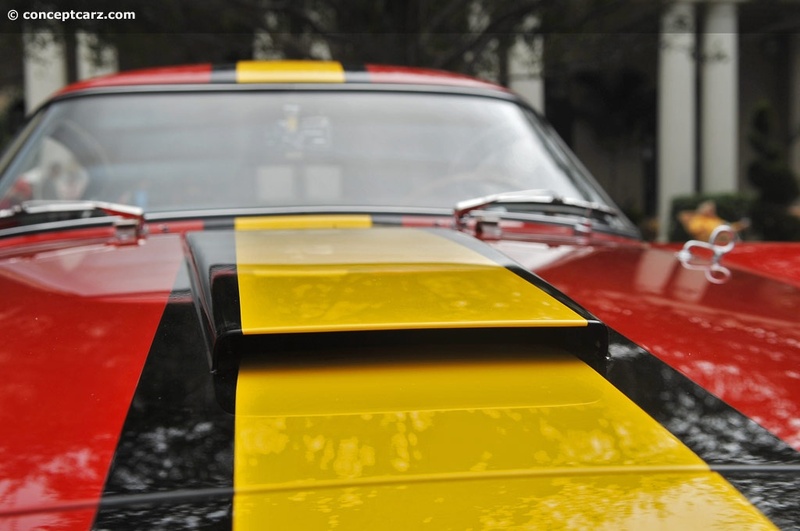 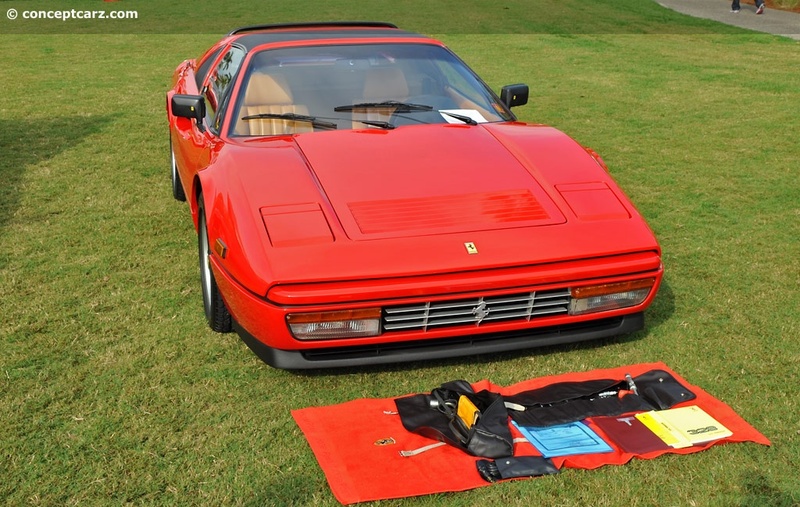 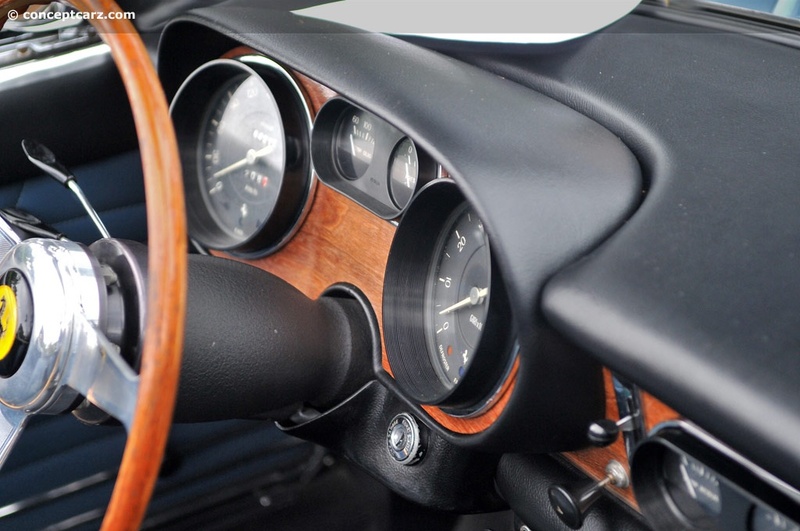 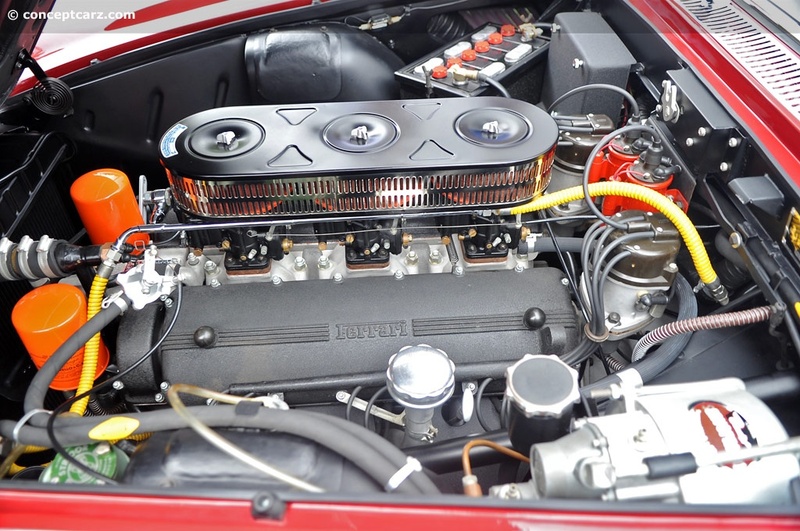 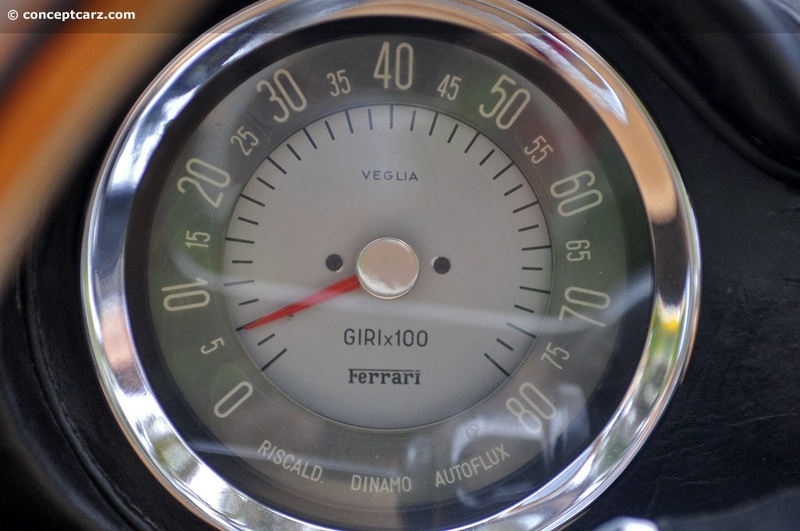 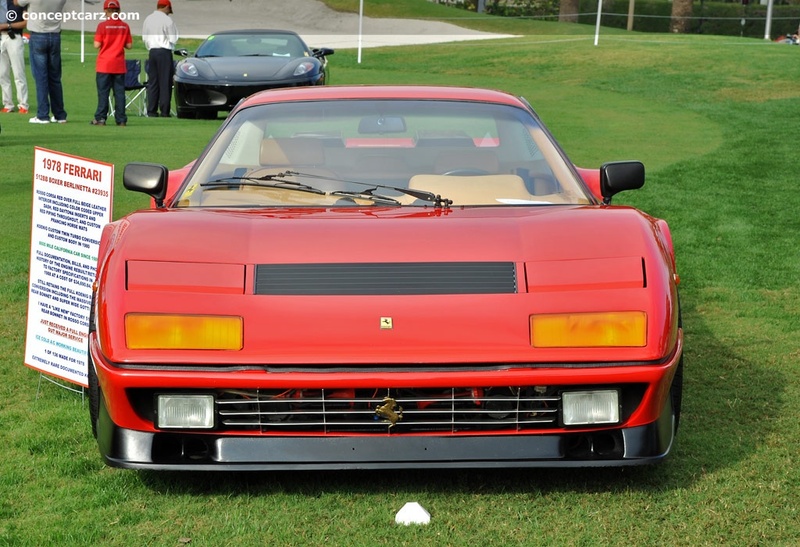 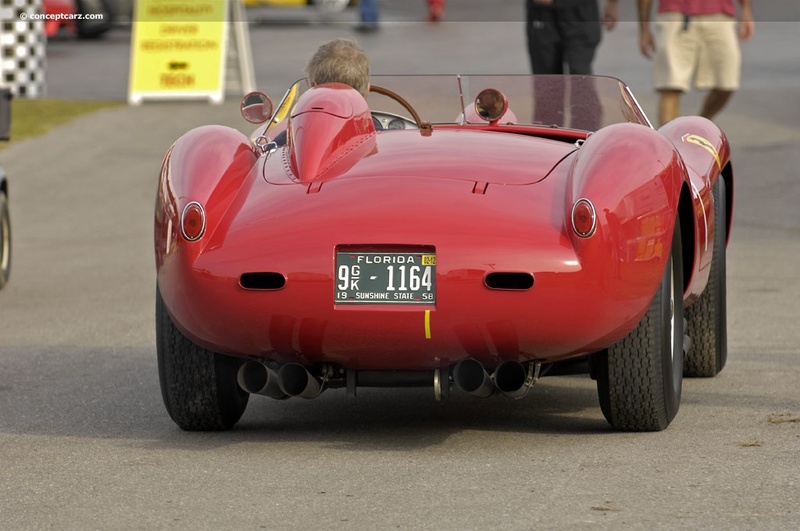 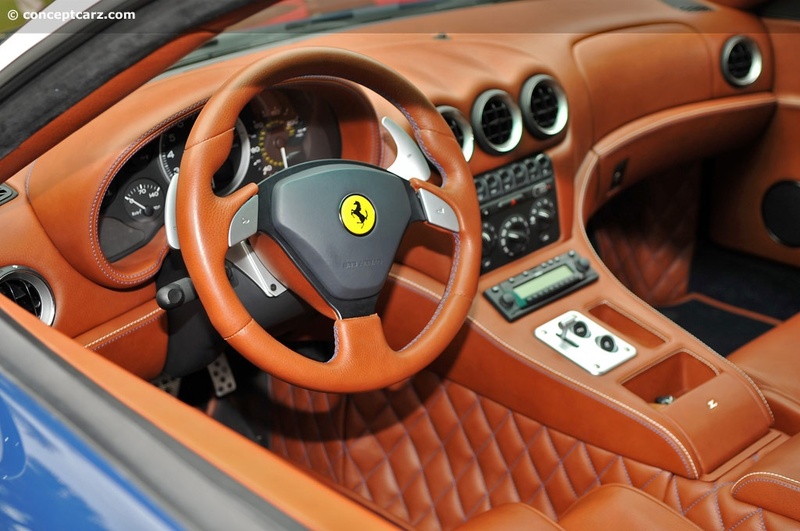 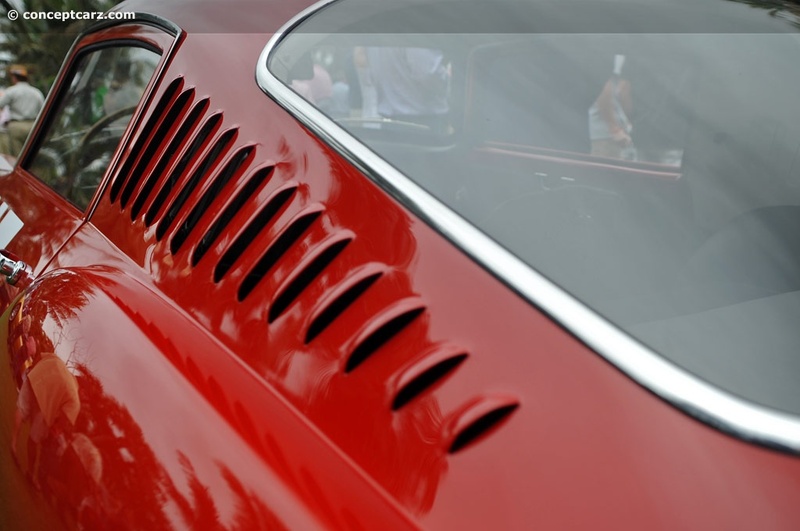 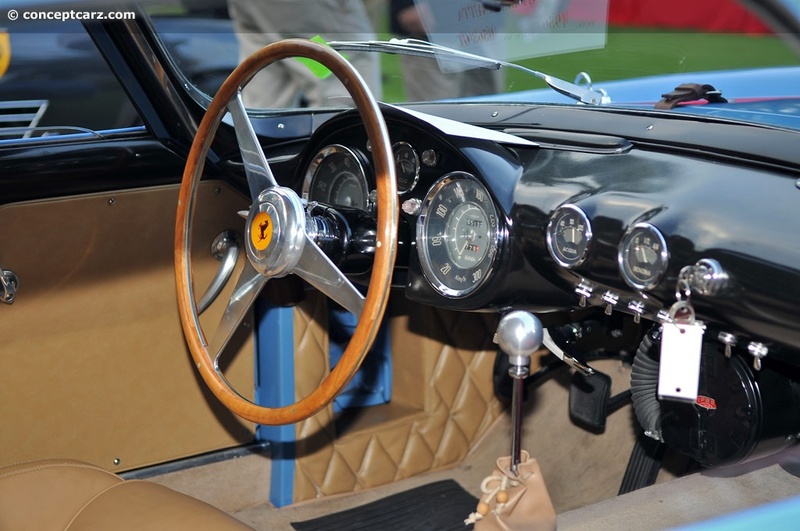 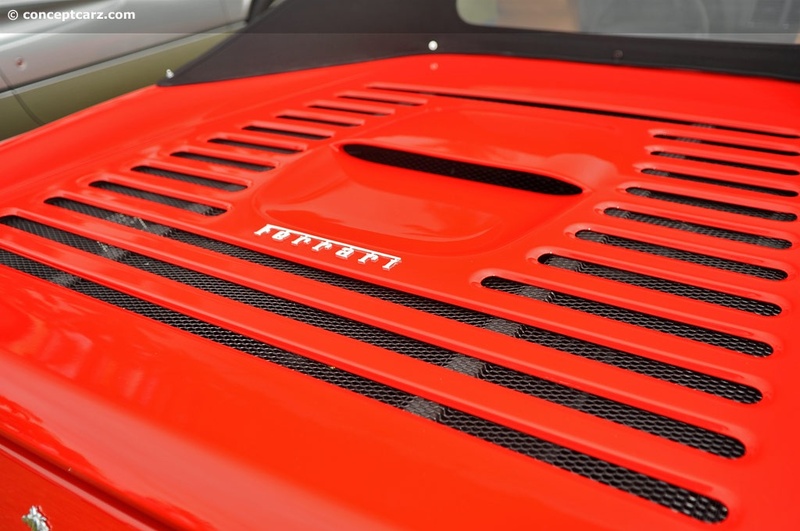 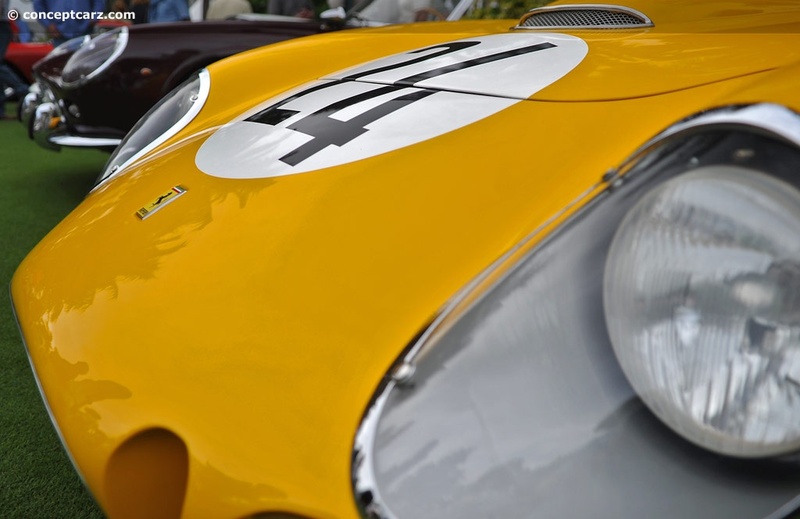 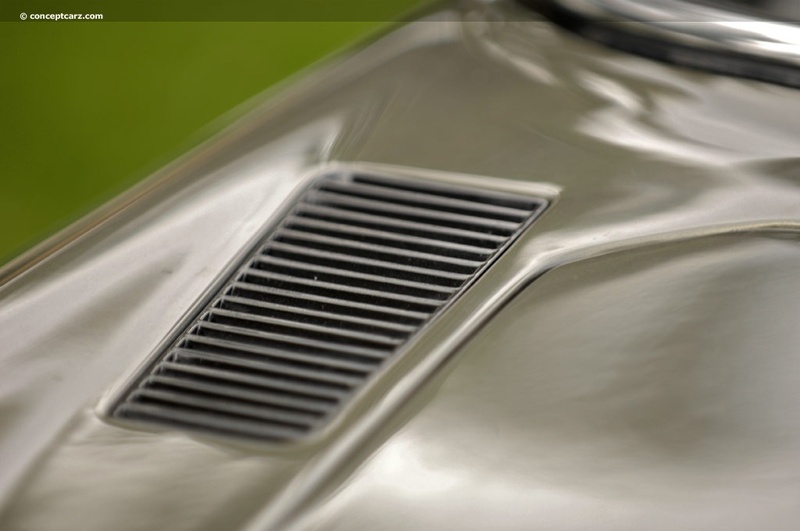 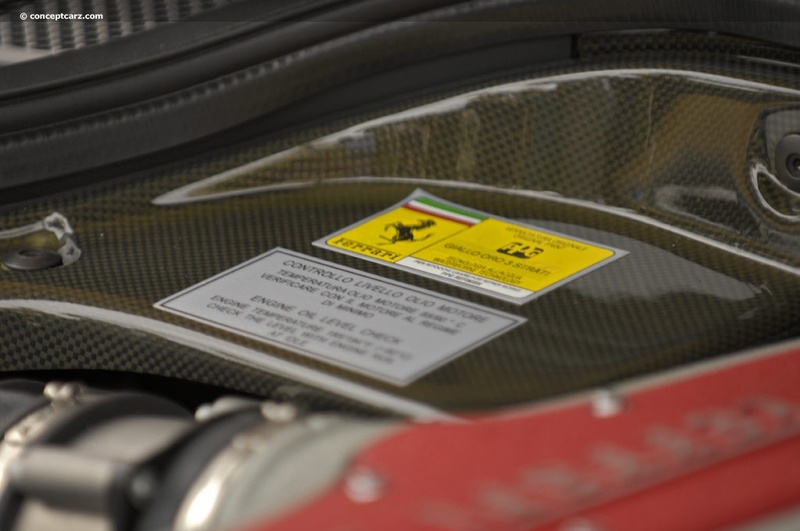 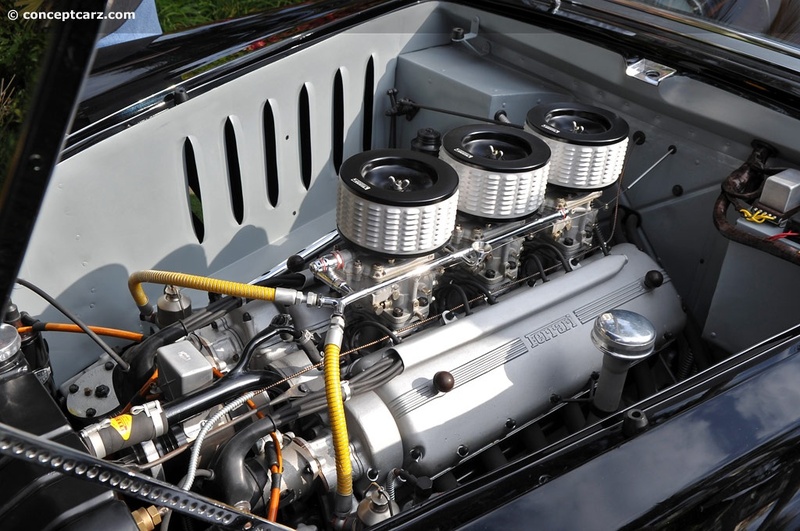 It earned a First in Class at the Cavallino Classic IV in 1995. 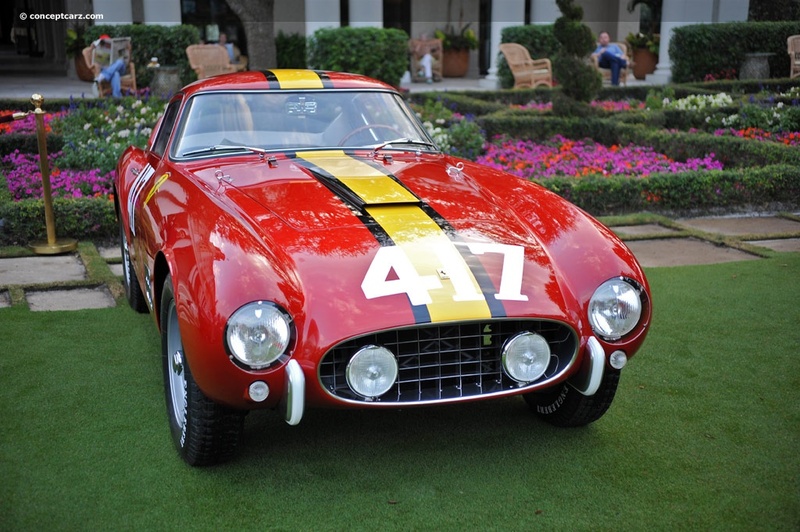 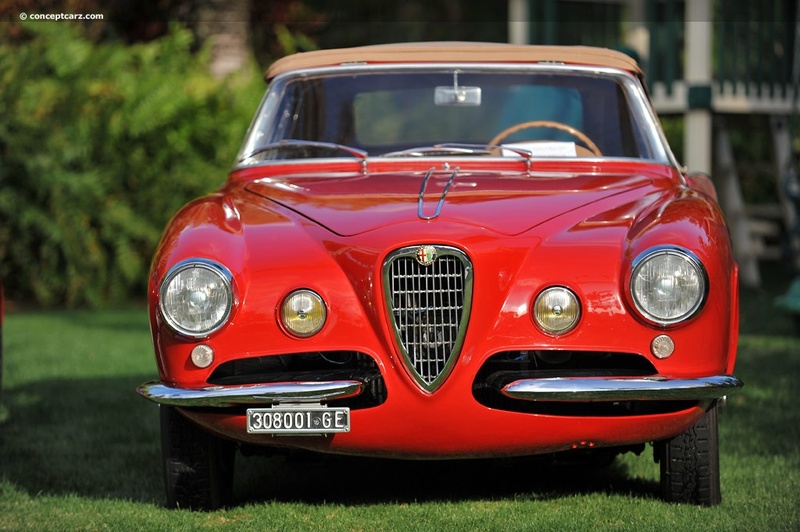 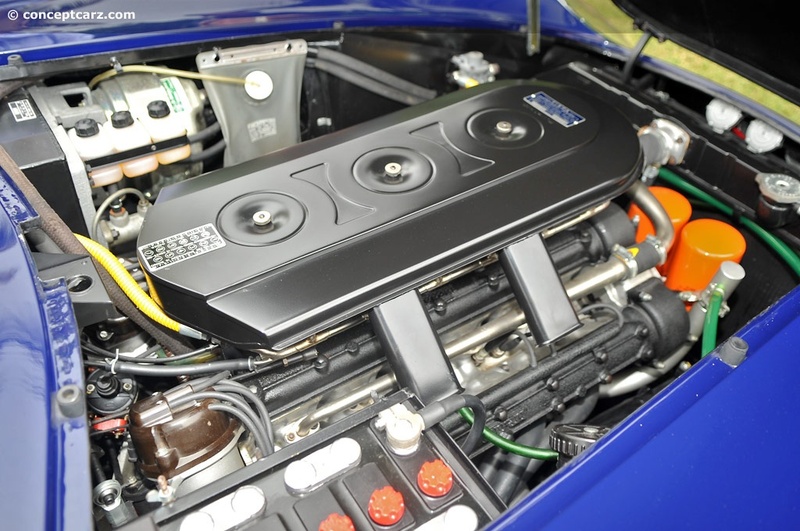 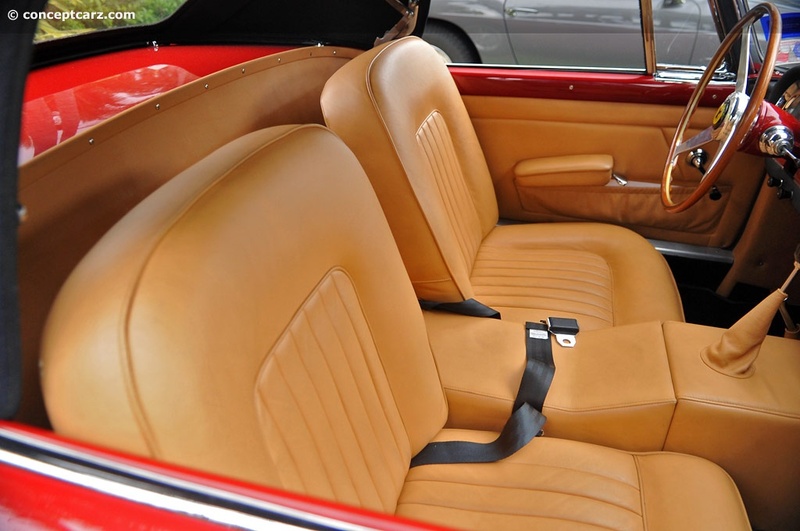 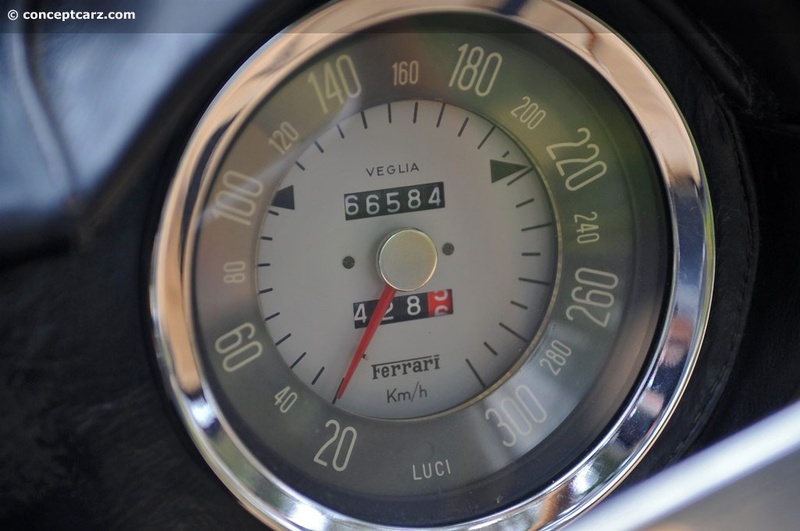 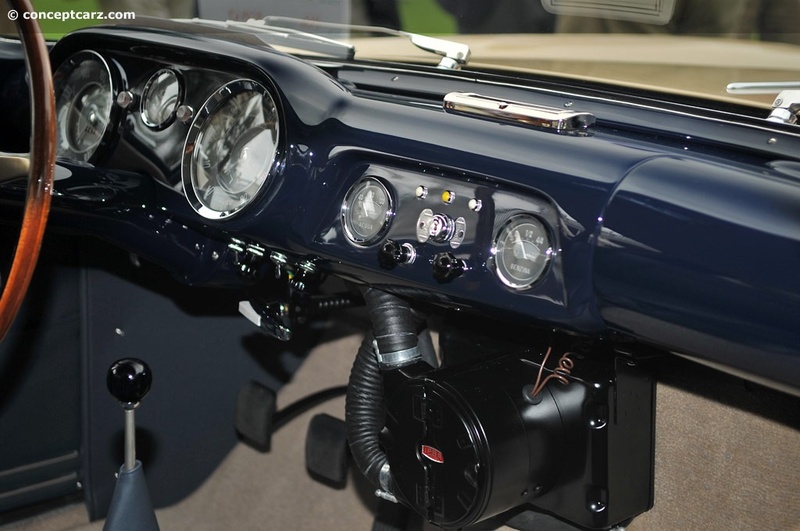 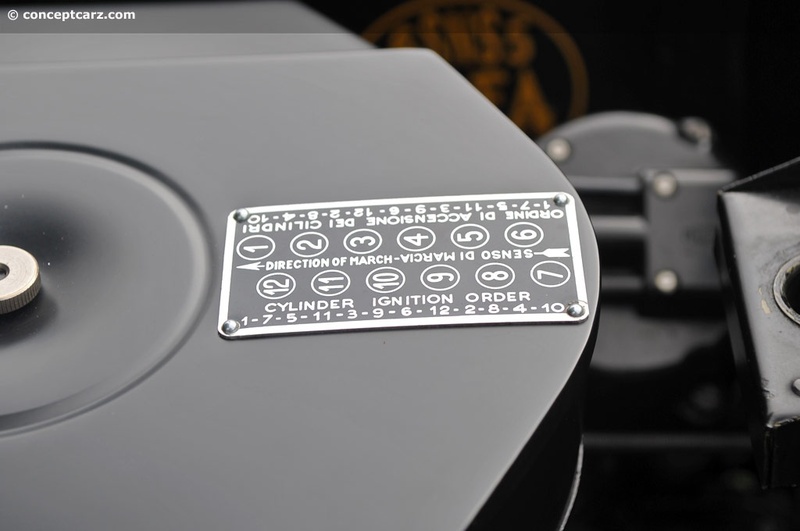 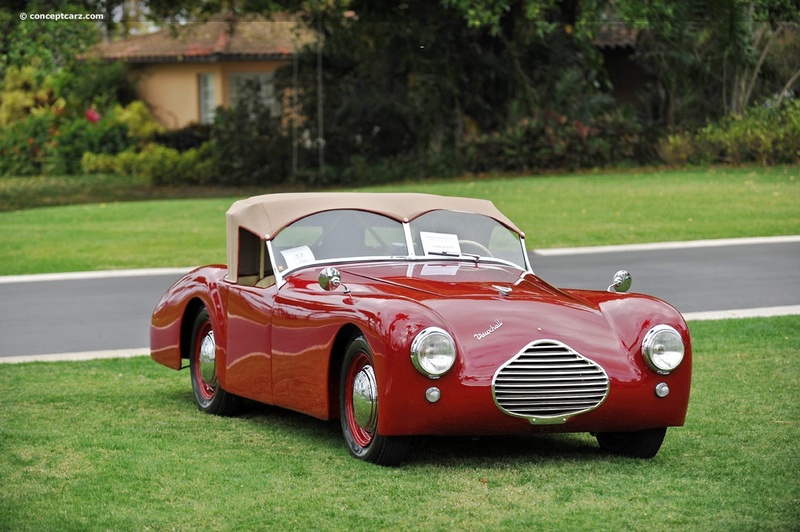 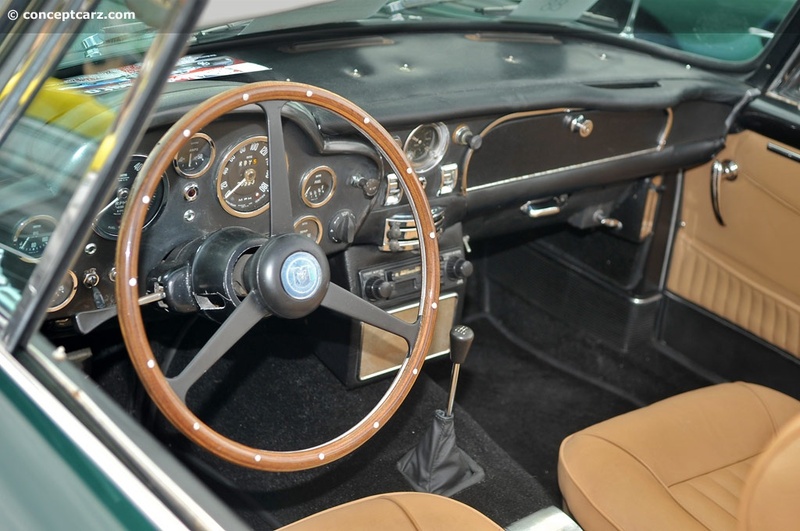 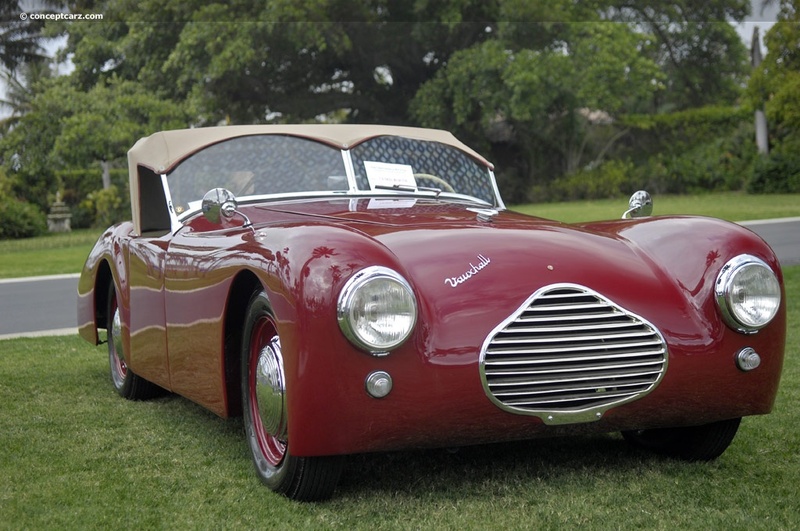 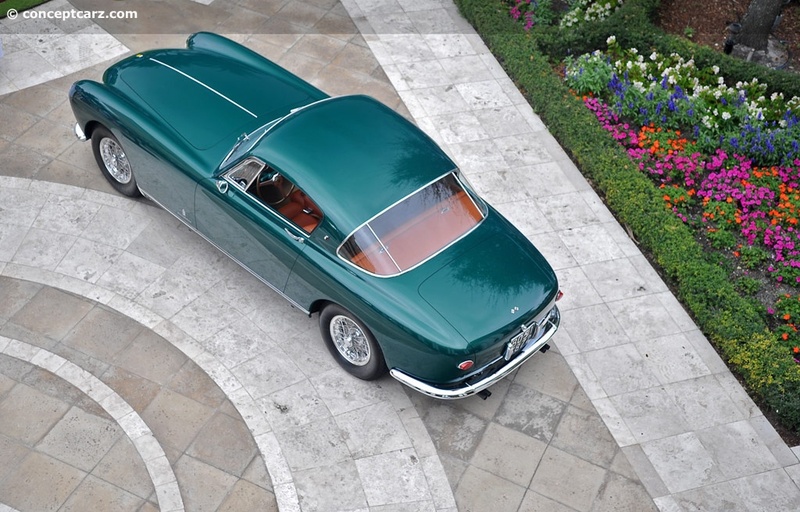 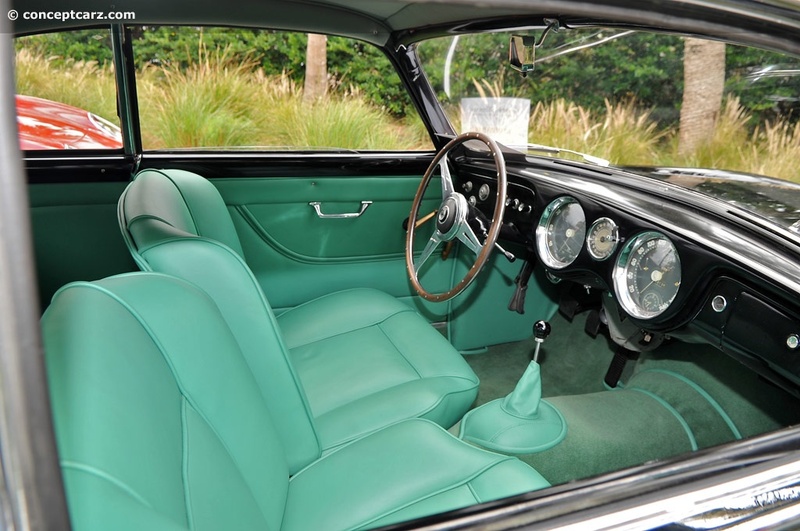 It has participated in the Mille Miglia Storica, the California Mille, and the Colorado Speed Festival. 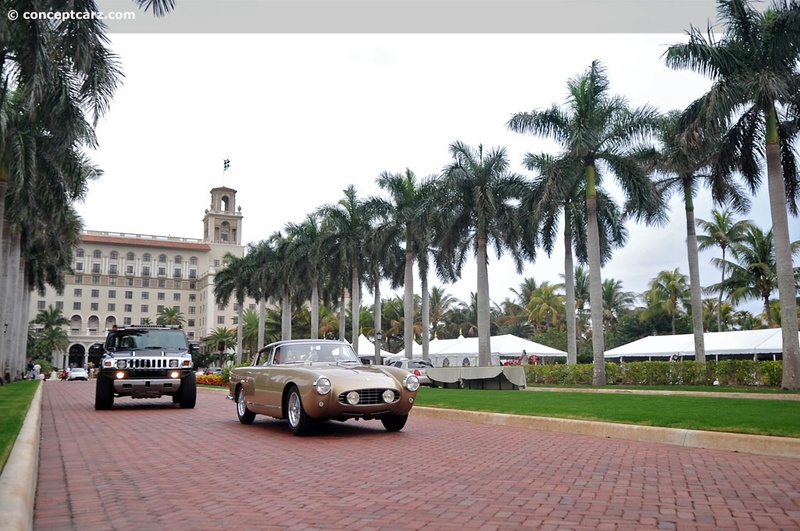 Moving farther away from The Breakers Hotel, the age of the cars decreased, with the modern cars sitting closest to the main road. 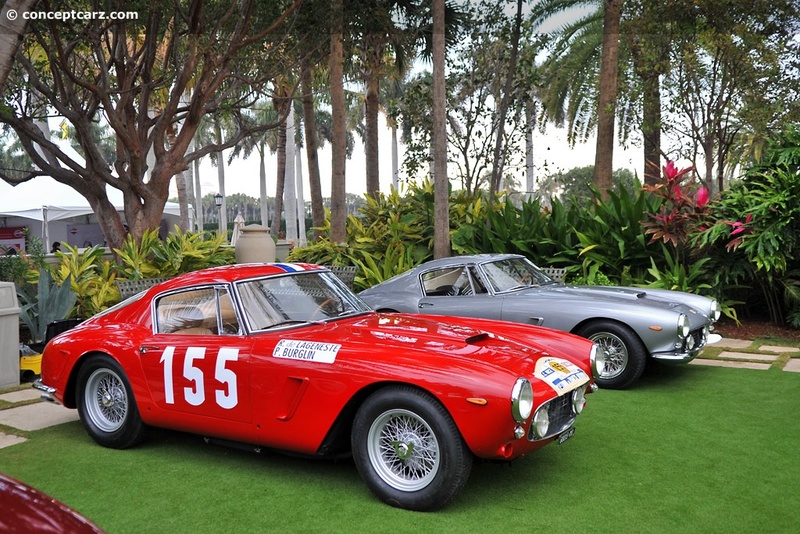 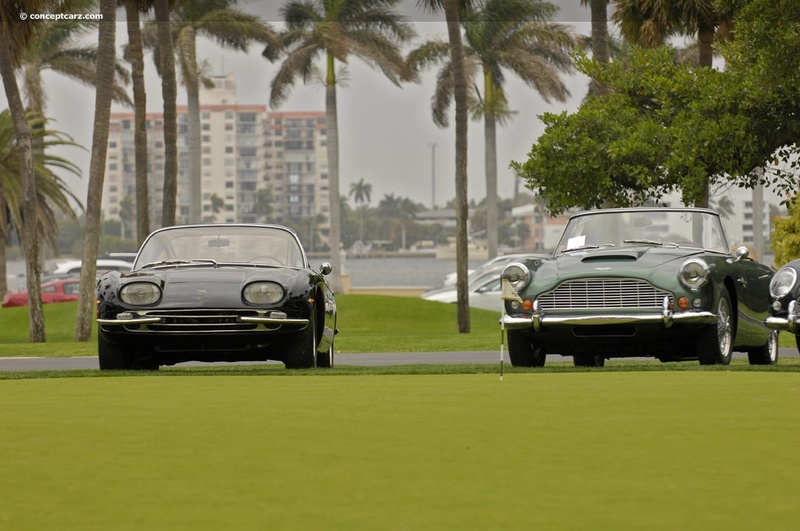 Since the 250 GTE and 250 GT SWB cars were the celebrated entries, several examples from both groups were on display. 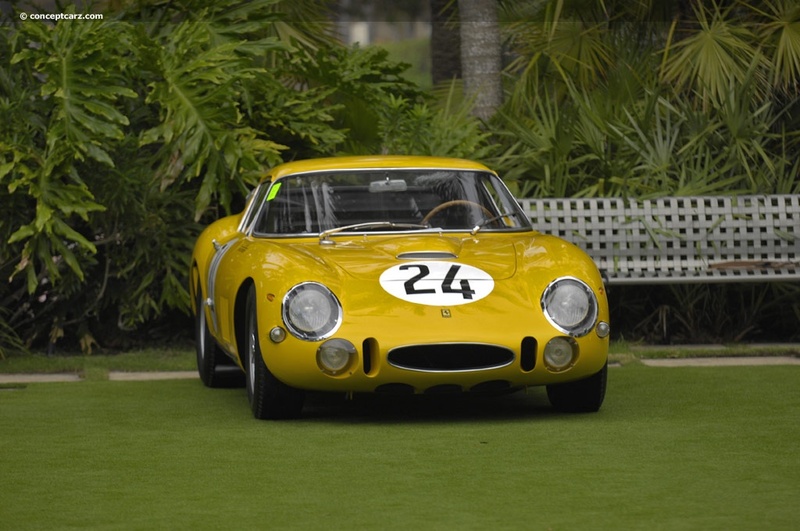 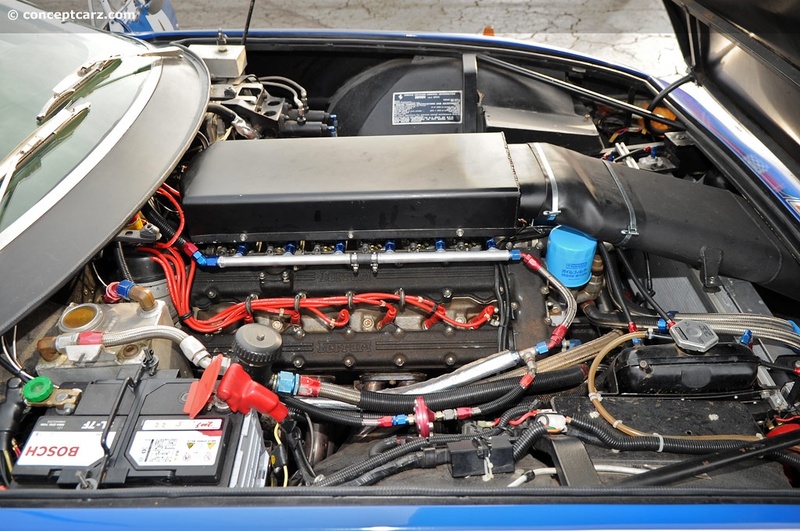 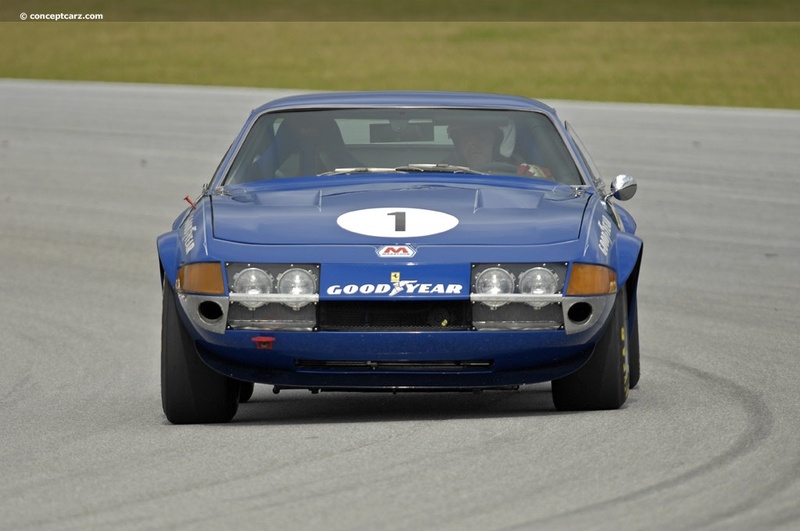 The 250 chassis came in two standard wheelbase lengths, and the GTE rested upon the longer of the two. 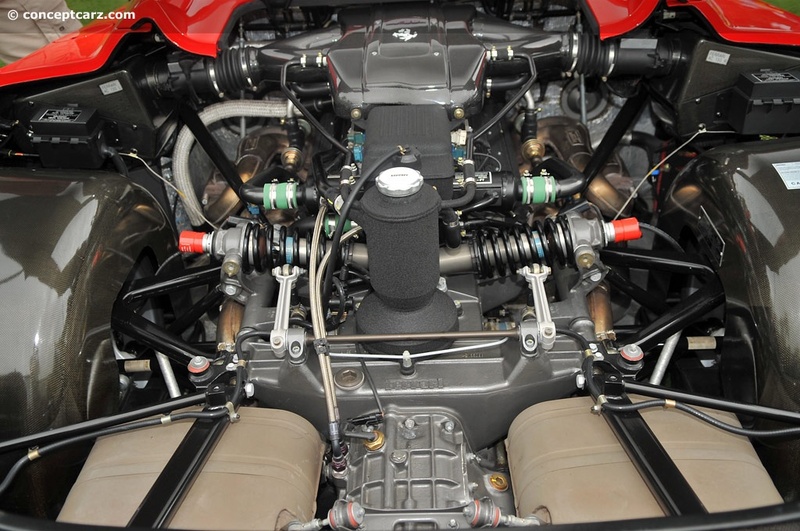 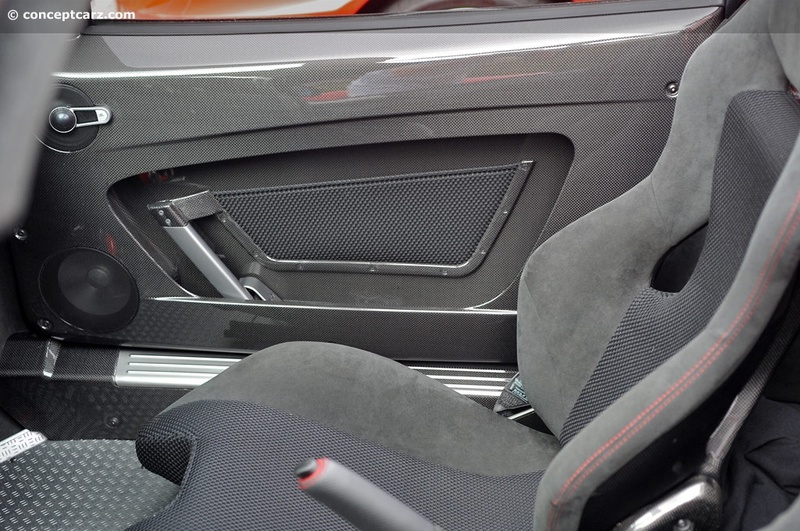 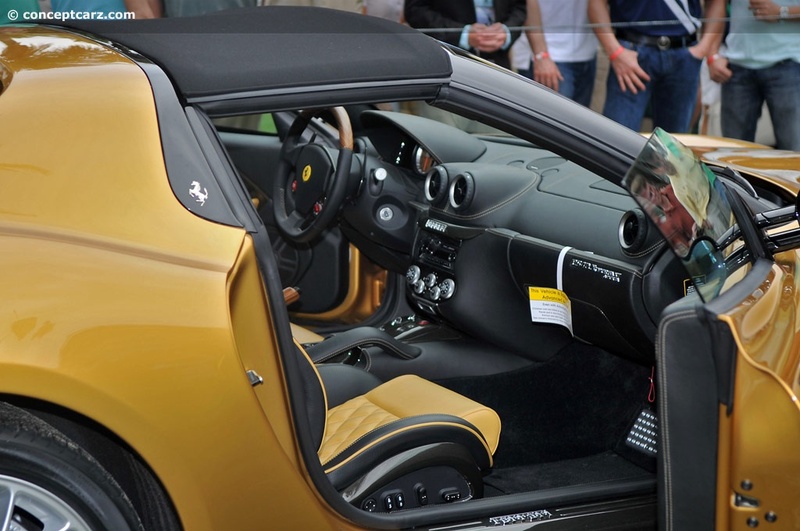 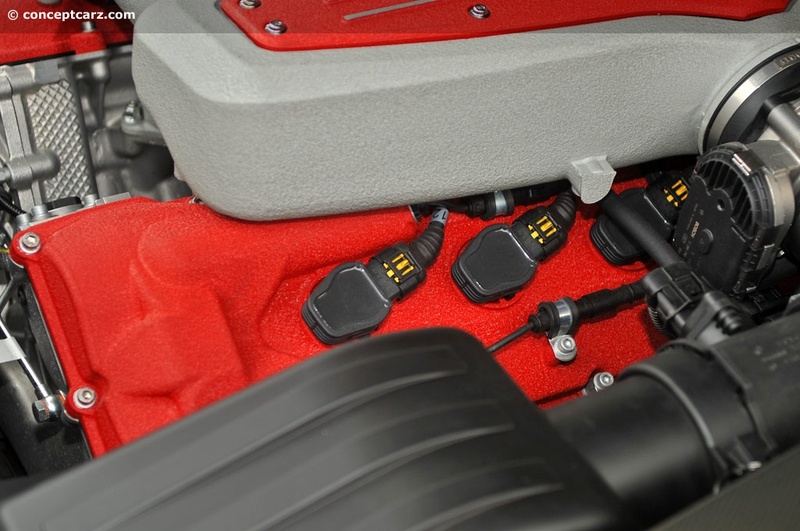 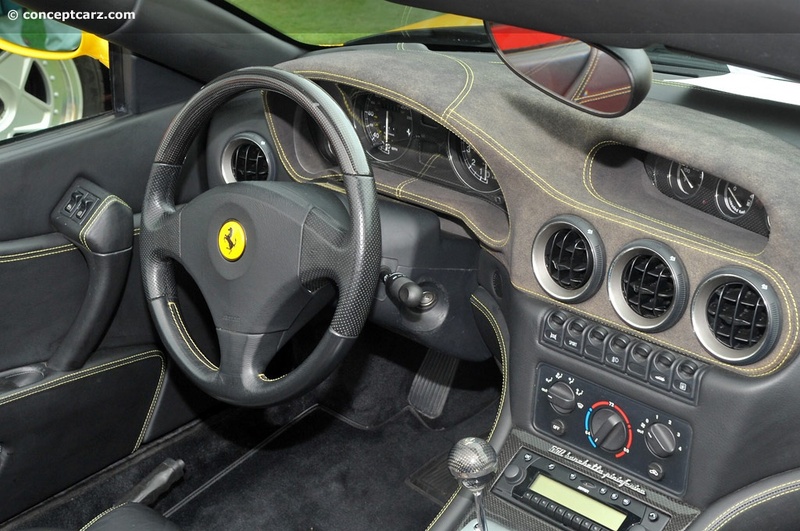 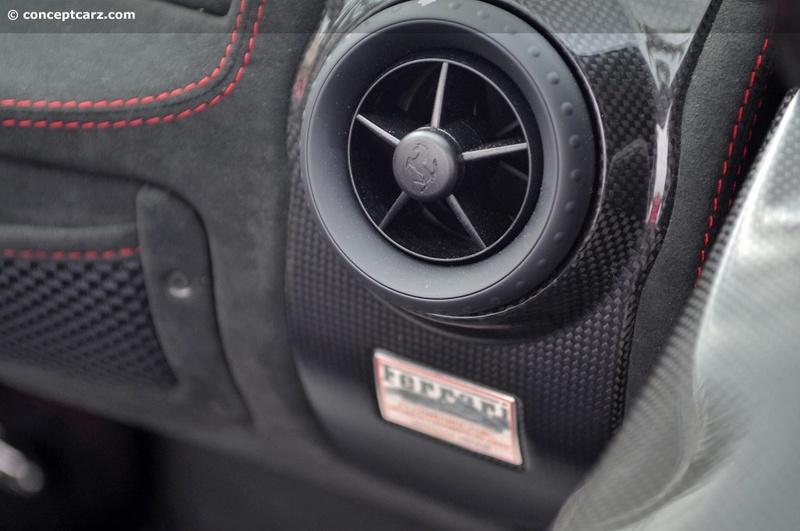 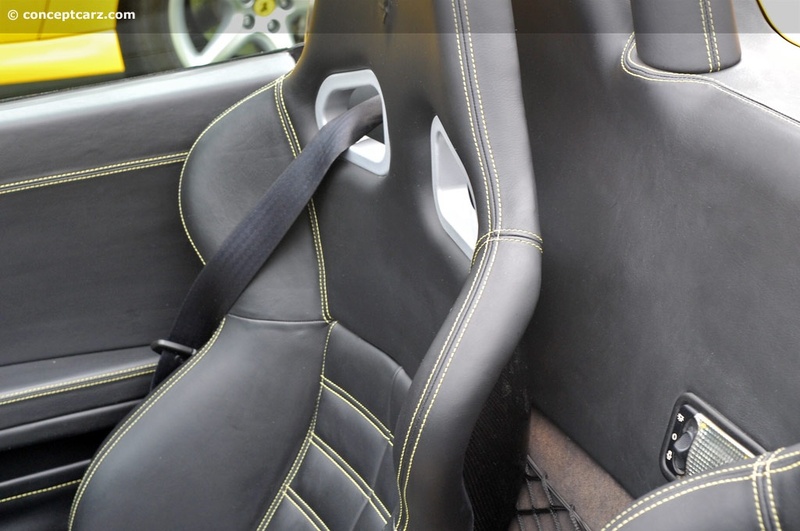 Ferrari moved the engine forward and gave the body a longer rear overhang in an attempt to provide more interior space for the occupants. 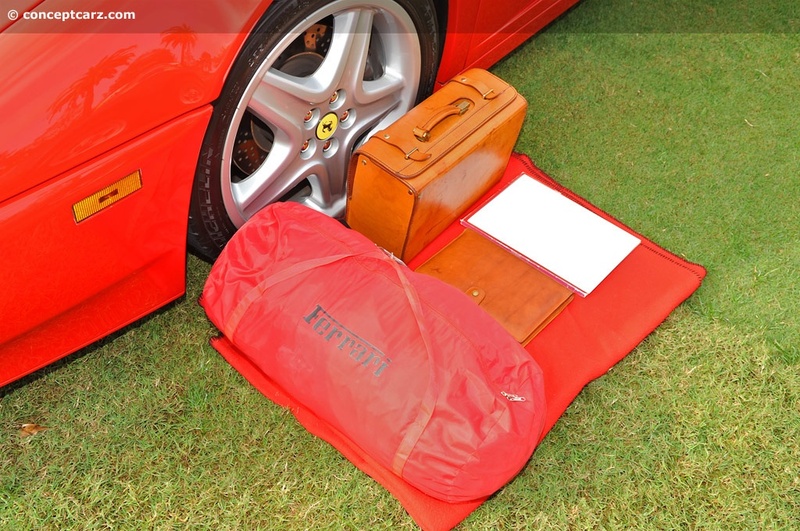 The result was suitable space for four adults. 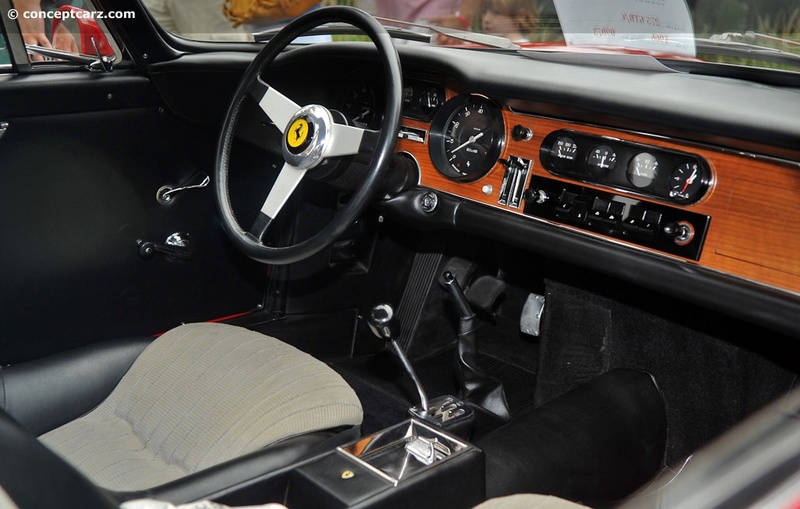 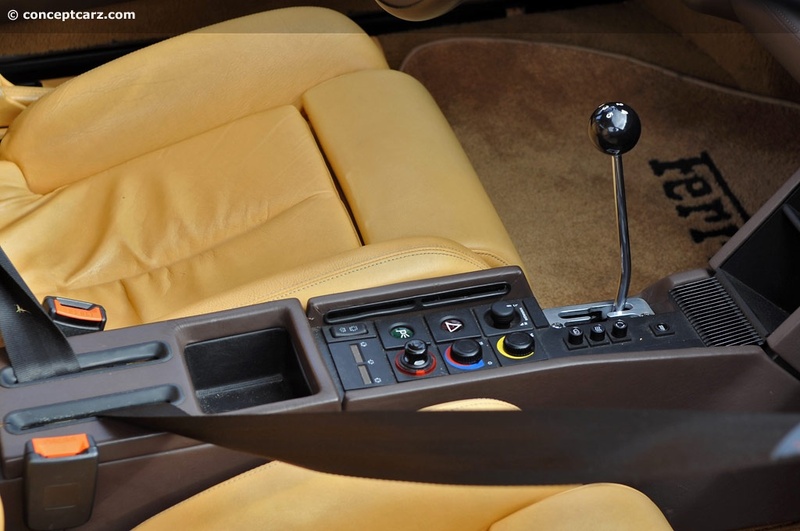 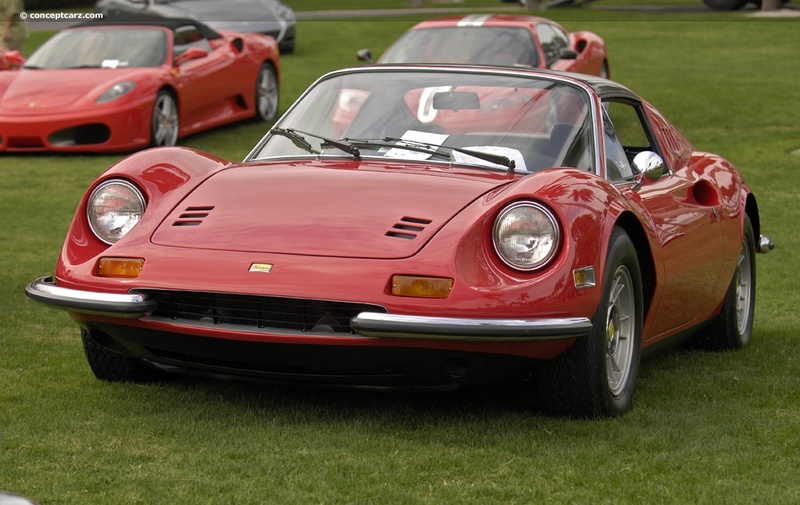 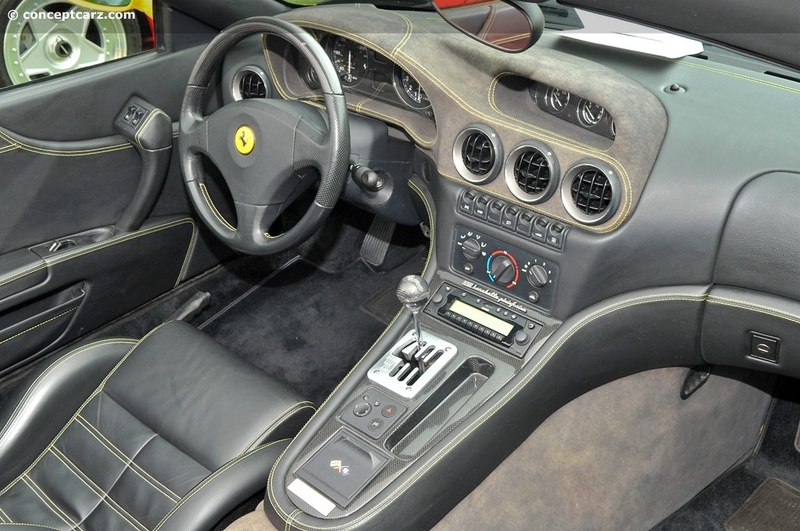 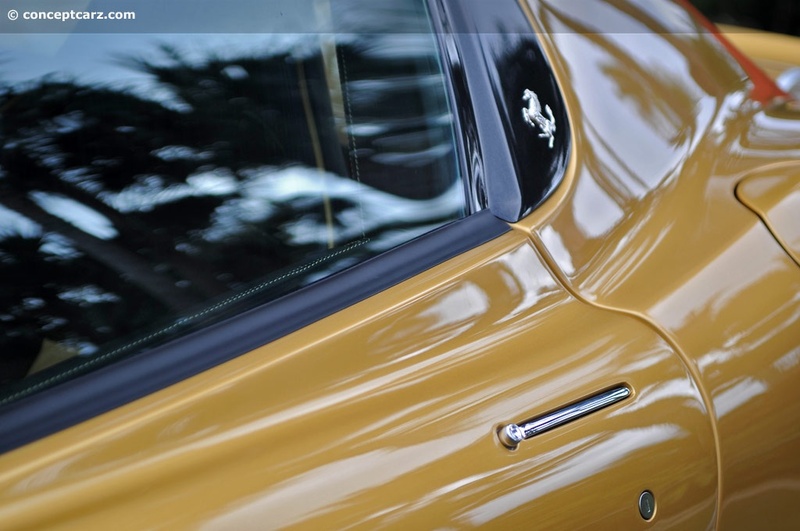 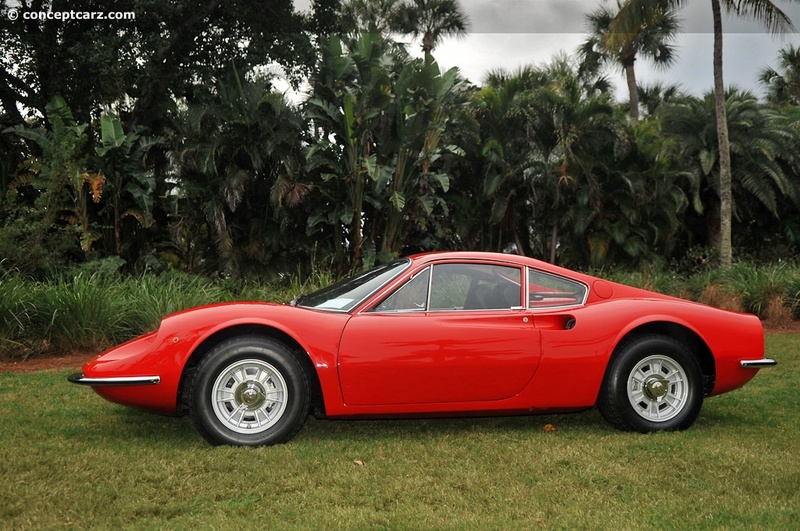 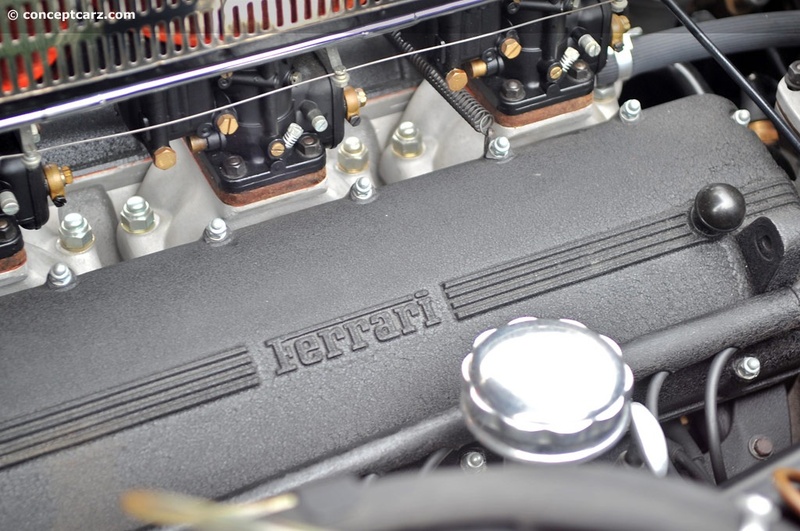 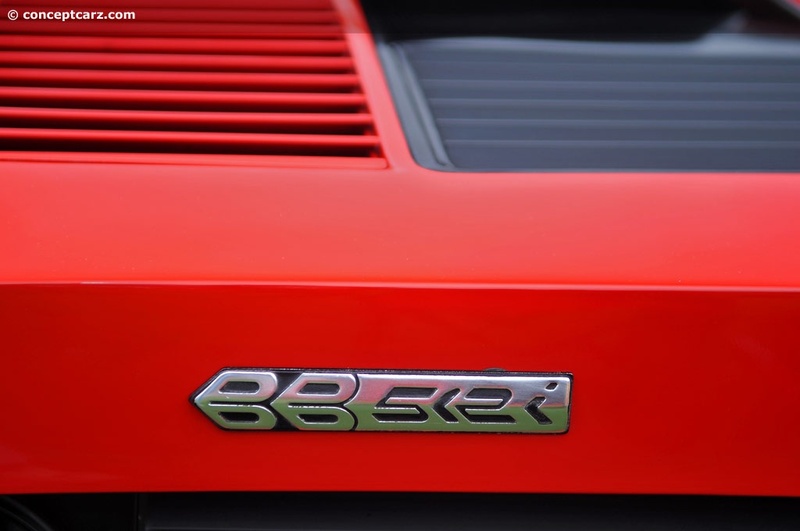 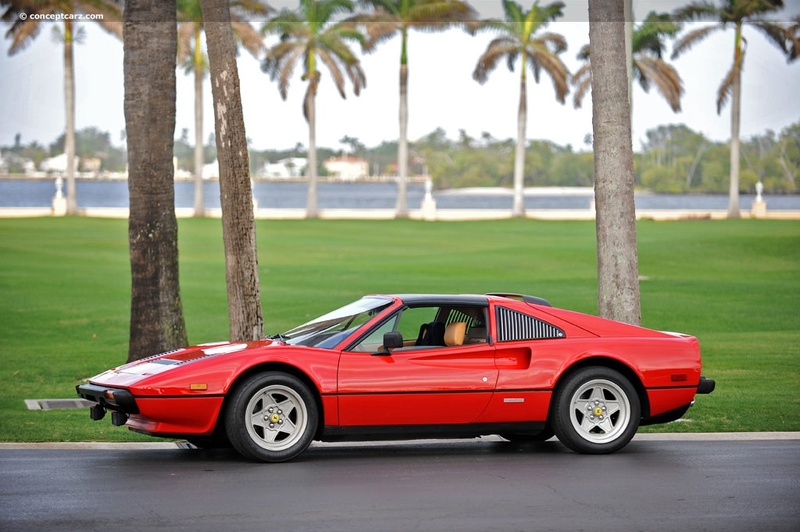 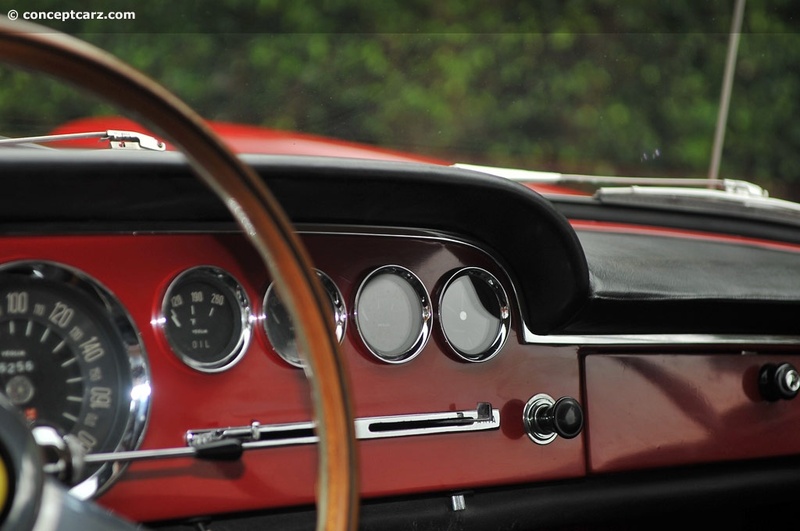 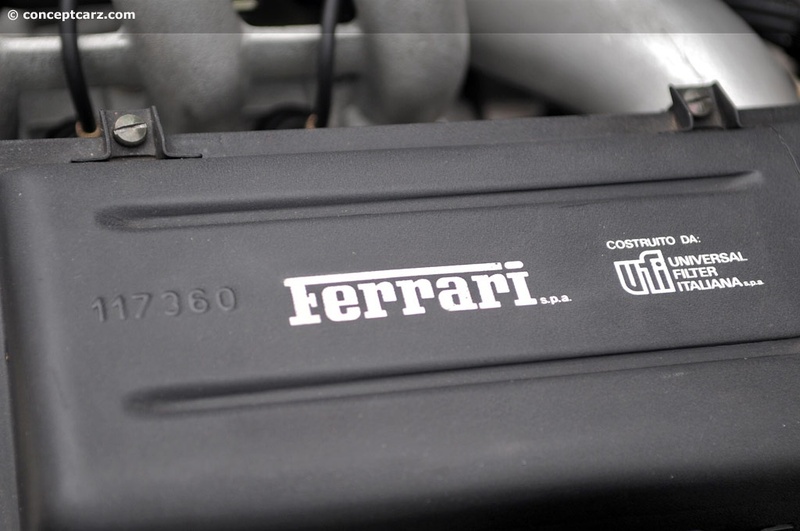 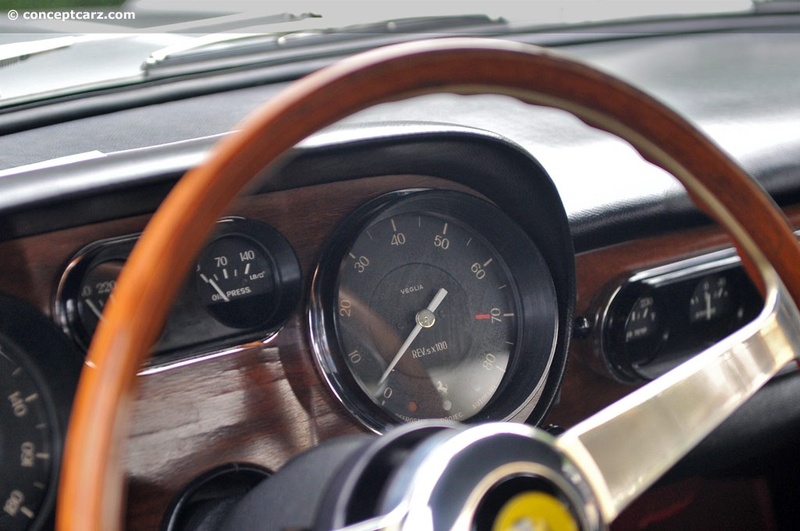 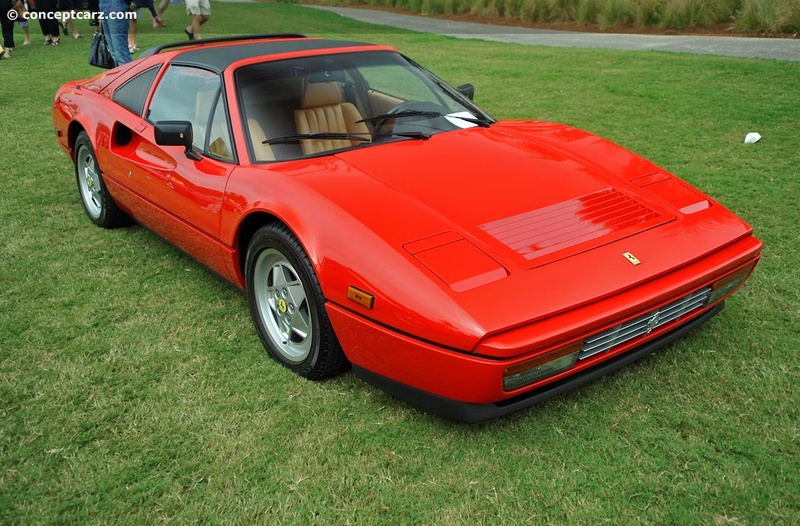 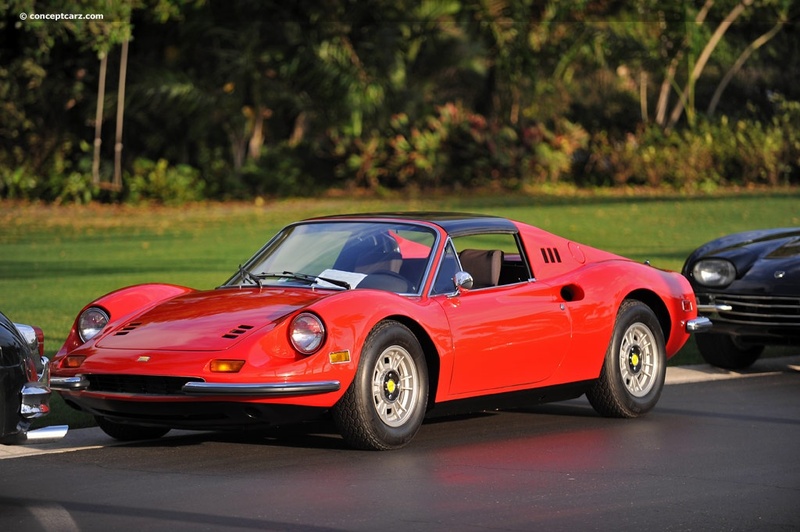 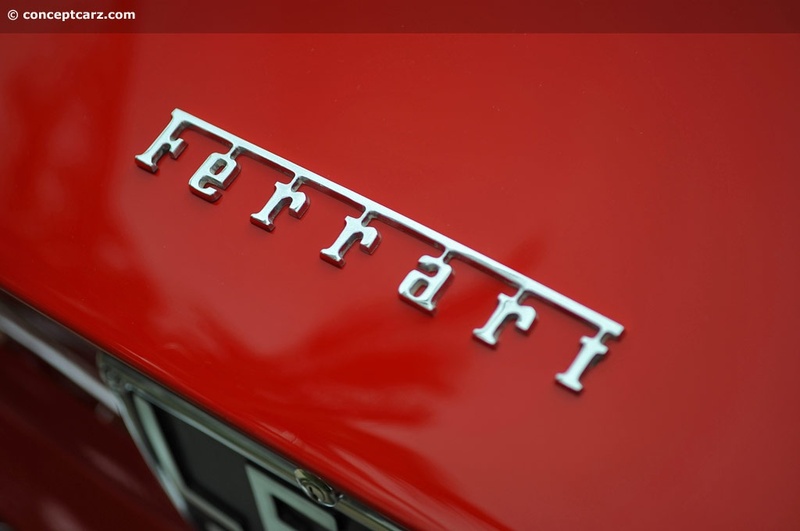 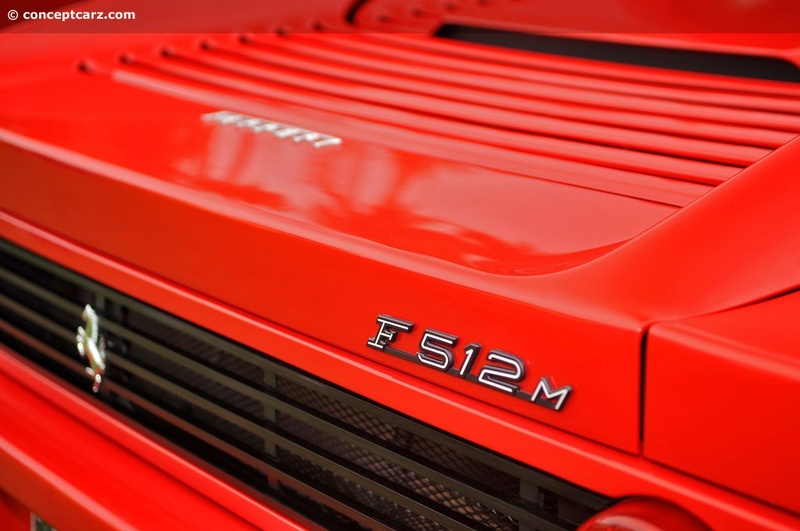 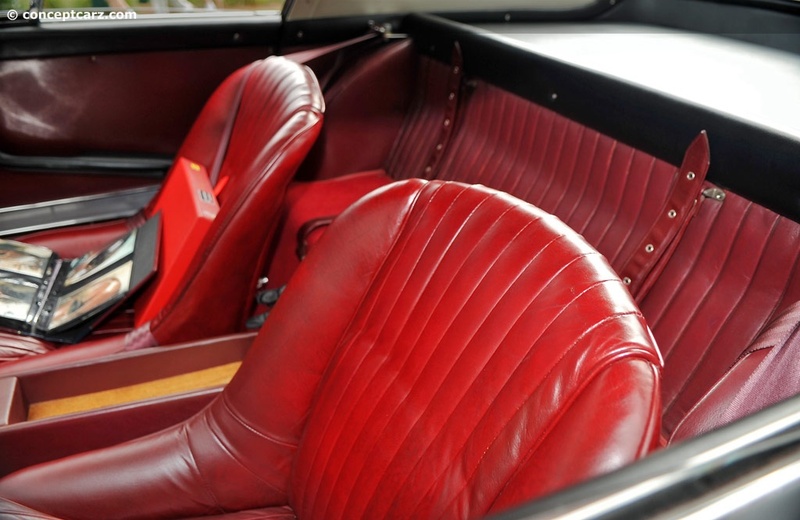 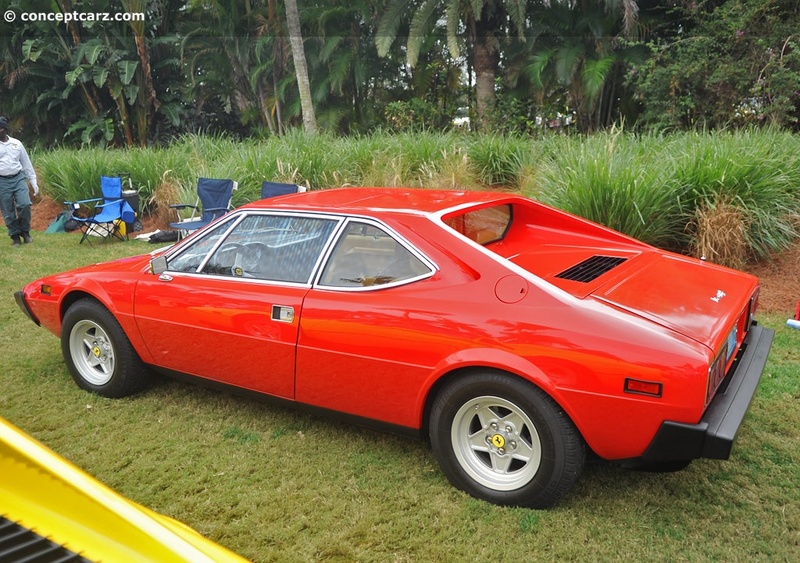 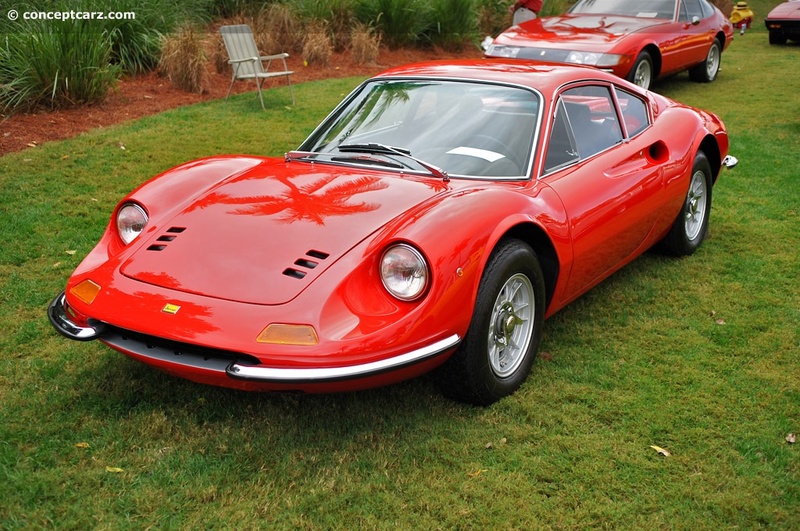 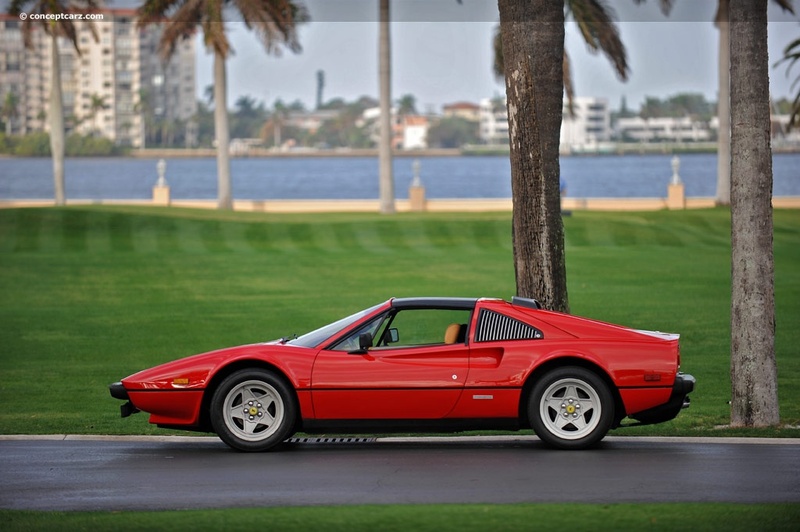 It was Ferrari's first series-production 2+2 car, and it would remain as one of the few four-passenger series production cars that the company would ever offer. 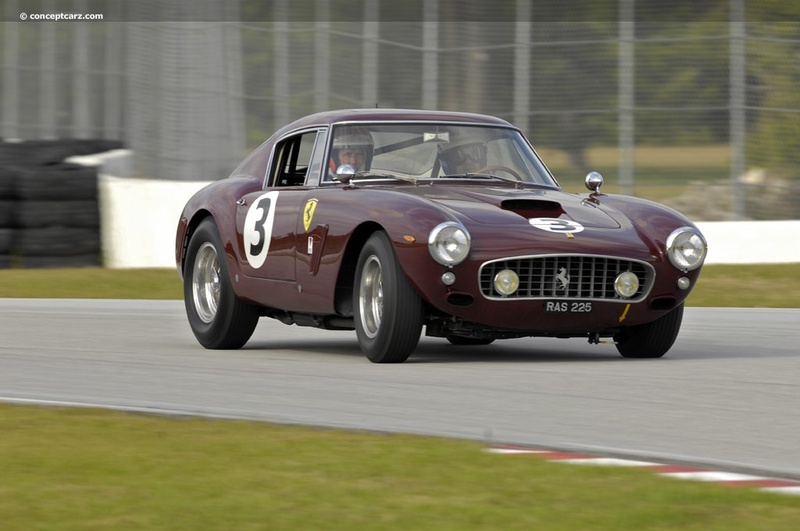 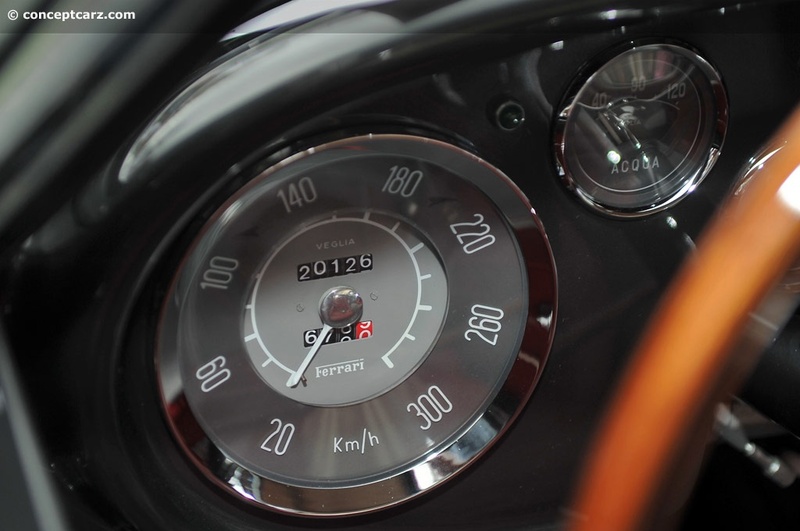 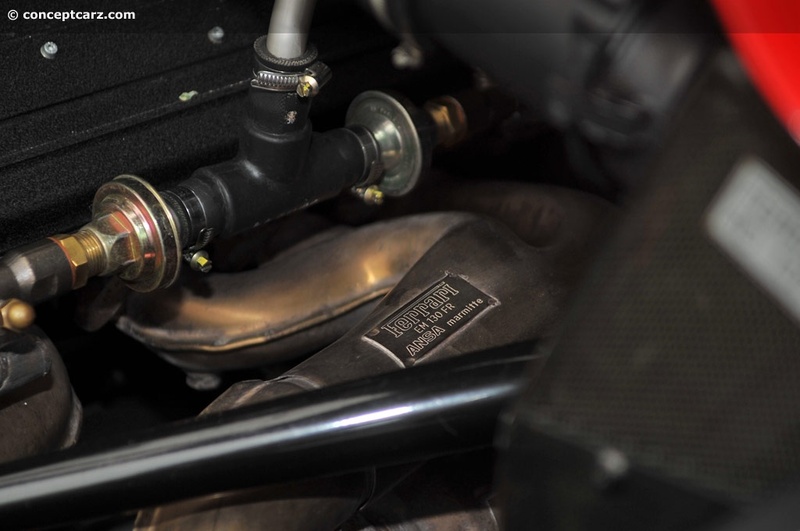 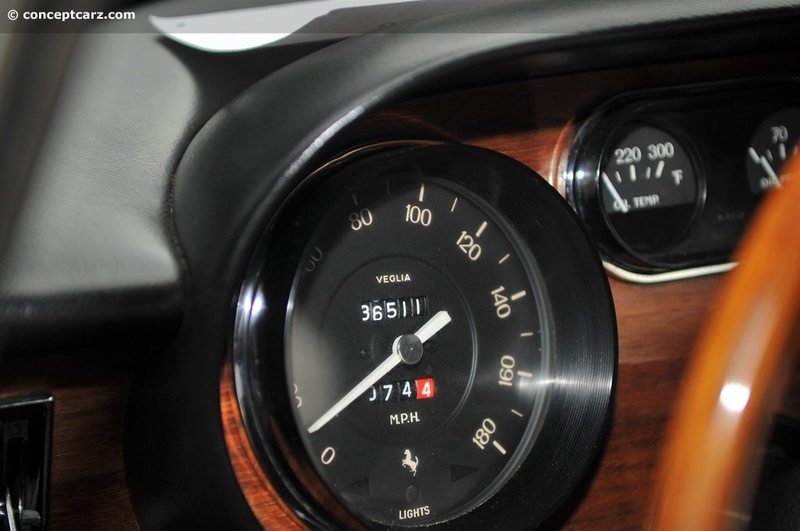 The 250GT SWB has a small footprint, lightweight characteristics, and a potent powerplant, making it a formidable competition car. 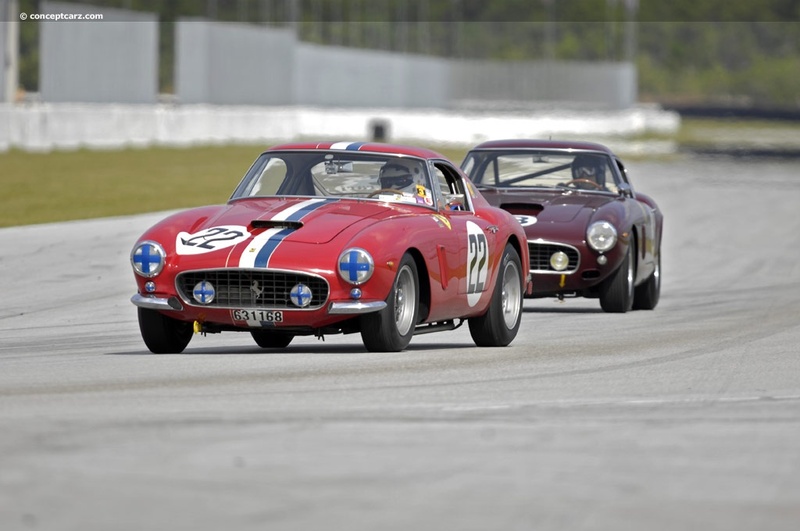 Fittingly, most of the 250GT SWB cars in attendance wore race livery, and had performed magnificently during the track days. 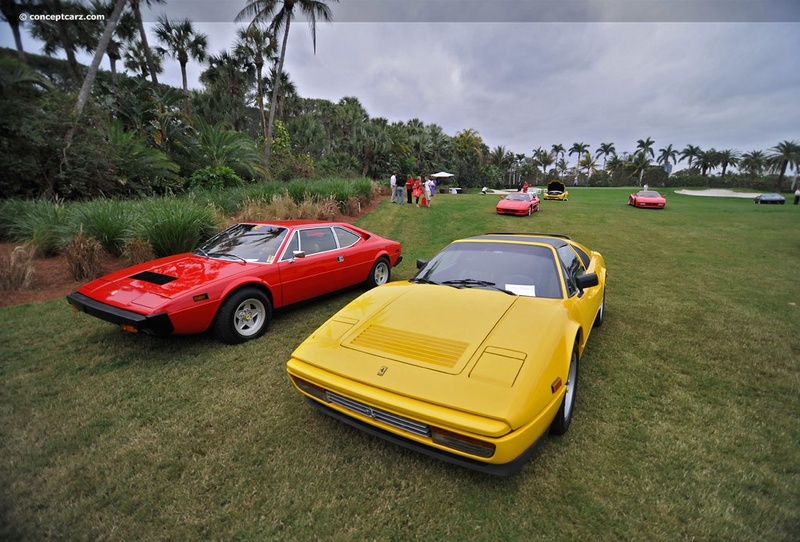 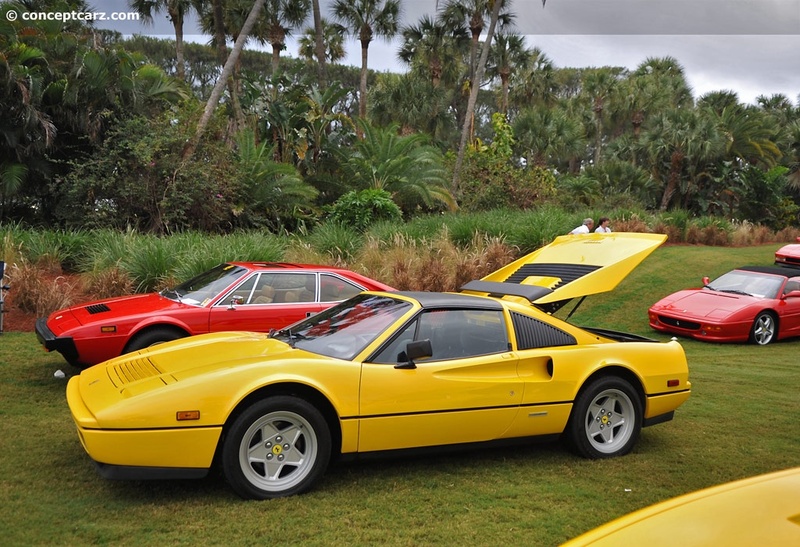 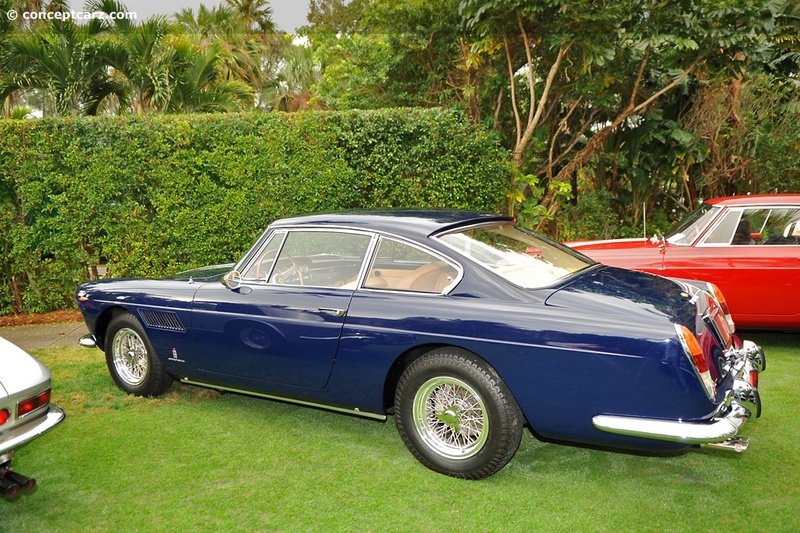 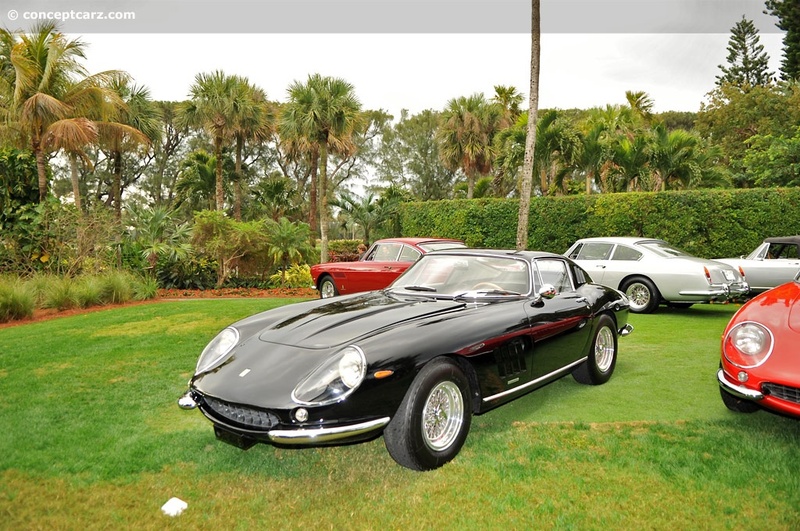 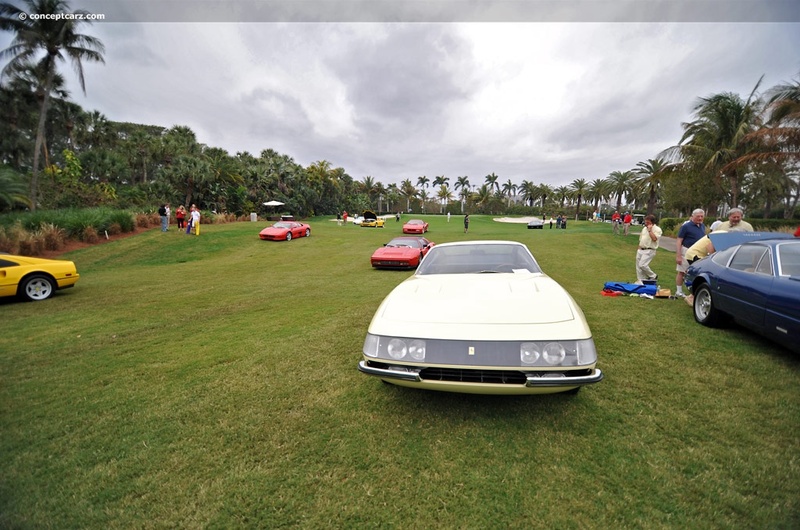 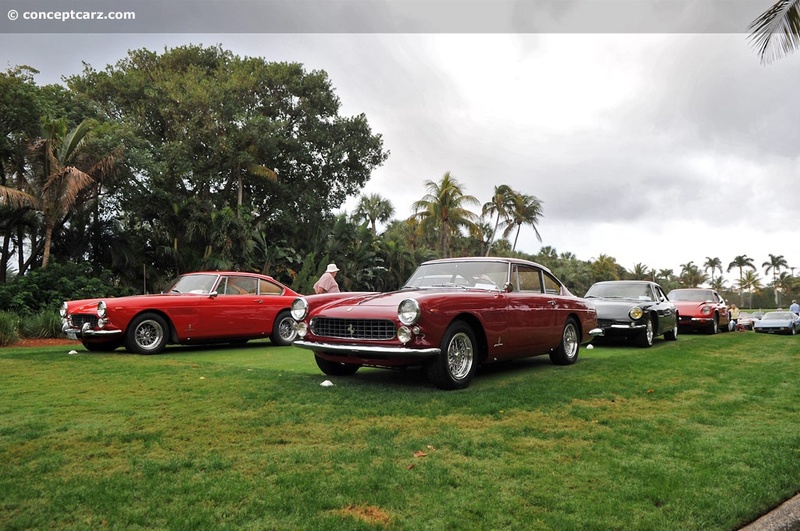 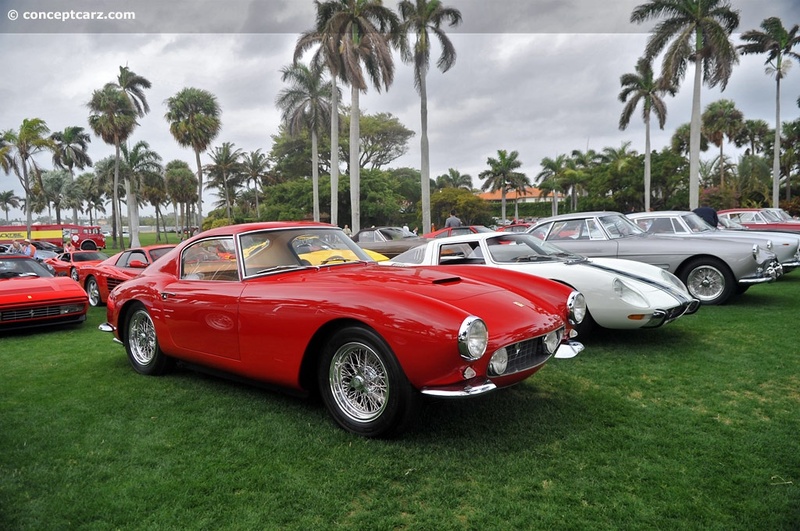 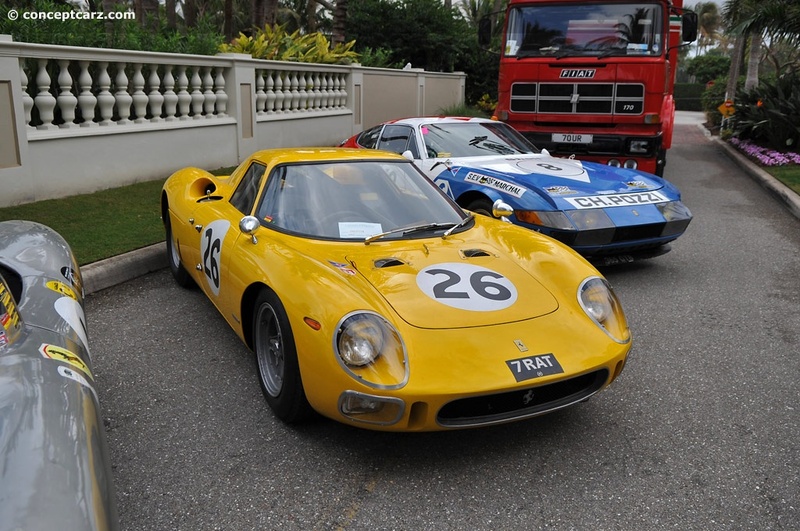 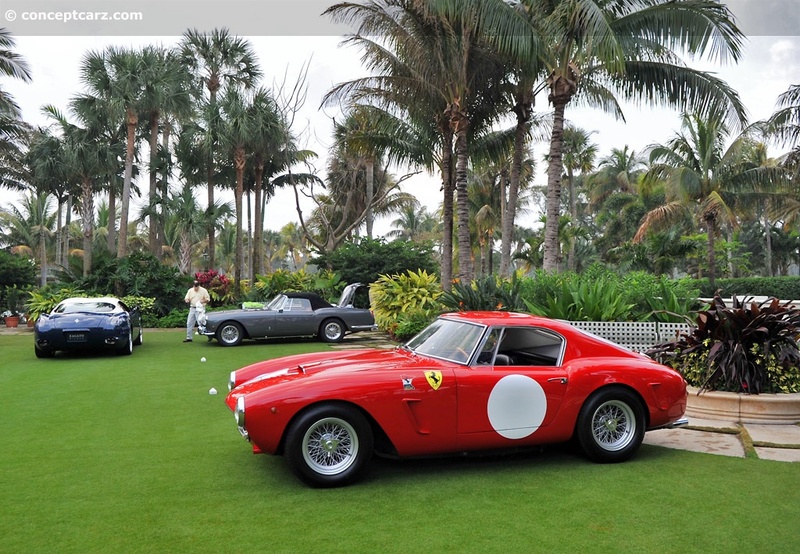 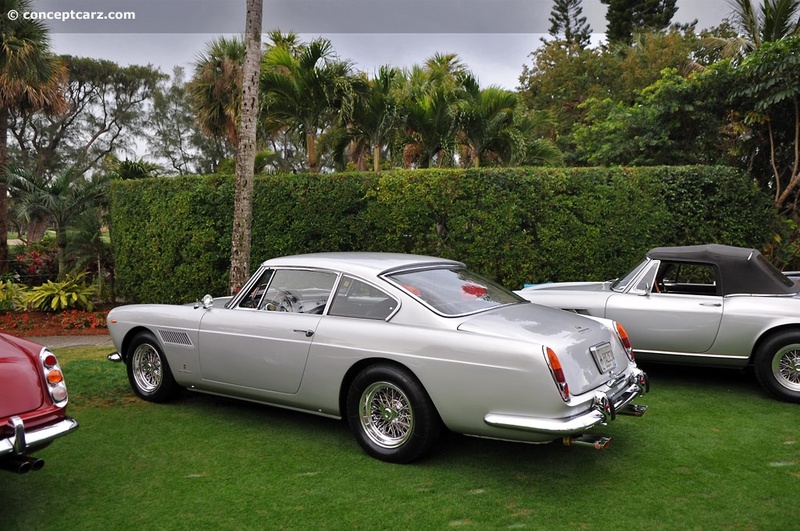 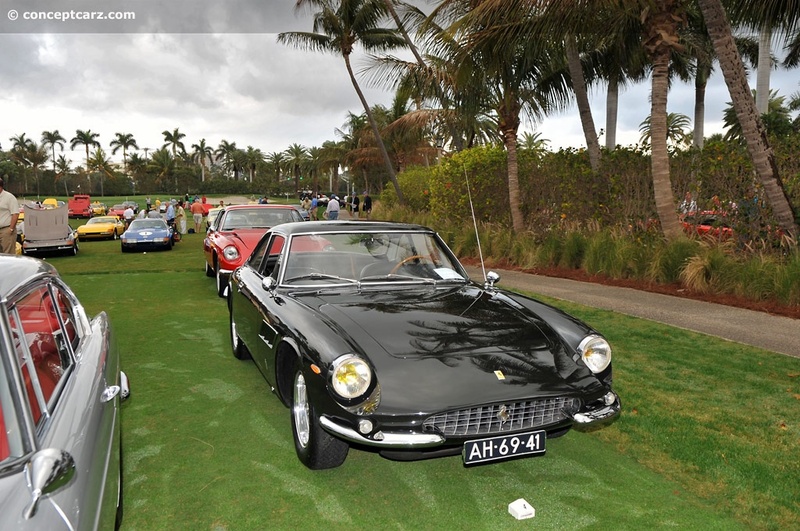 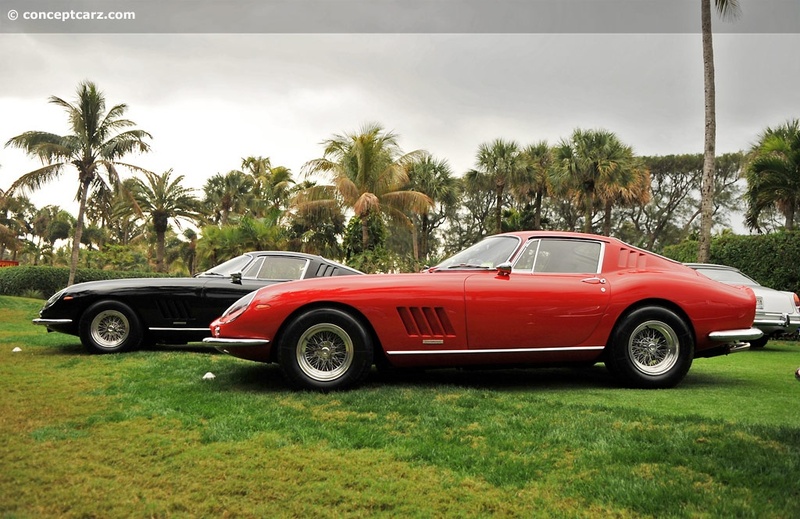 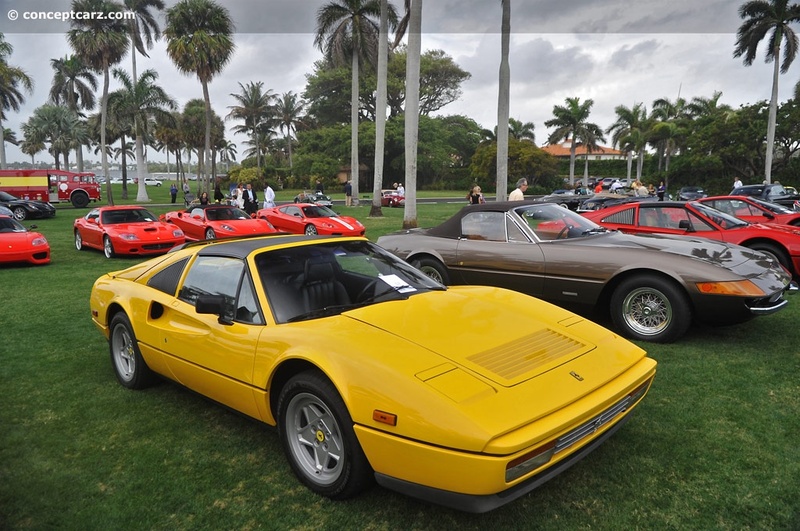 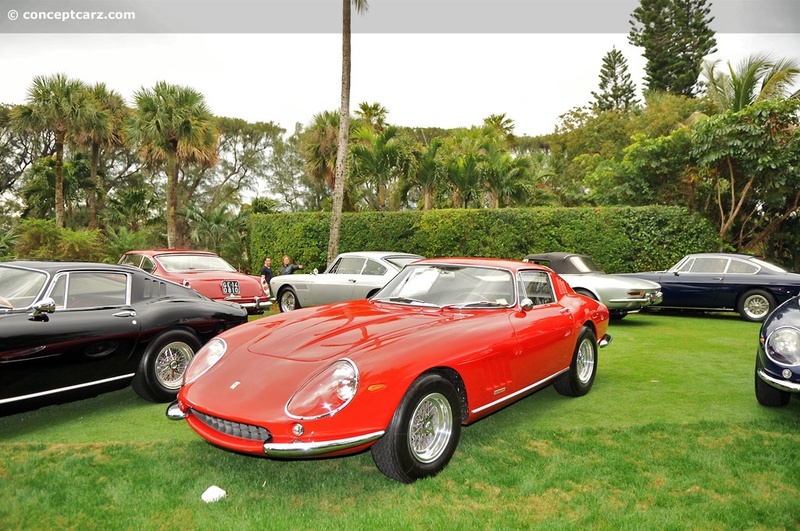 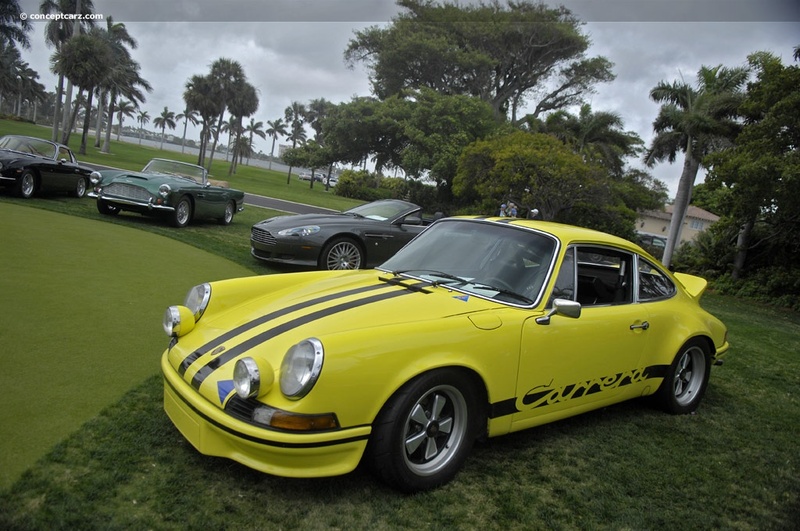 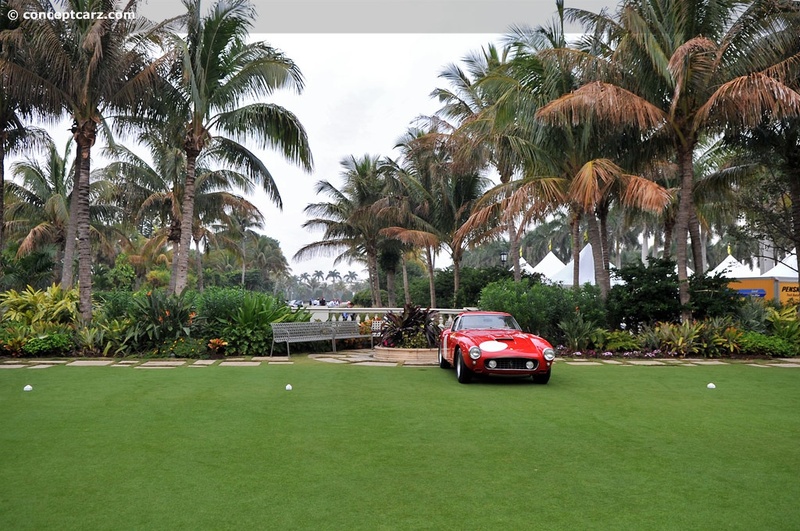 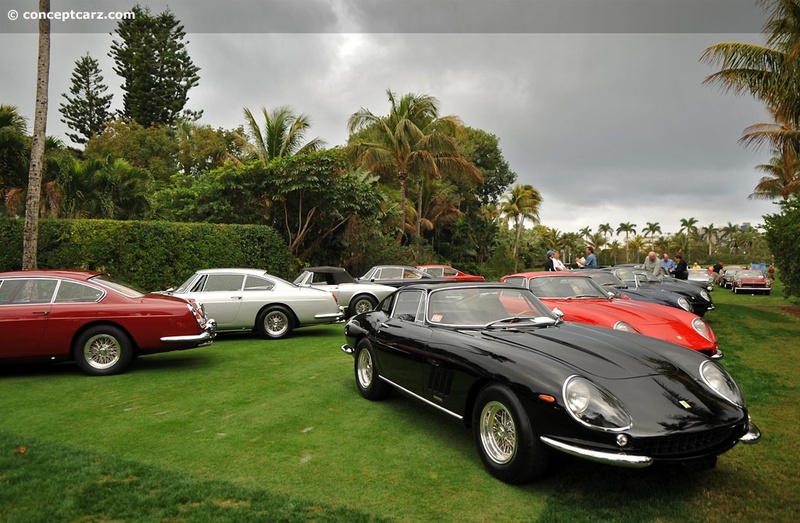 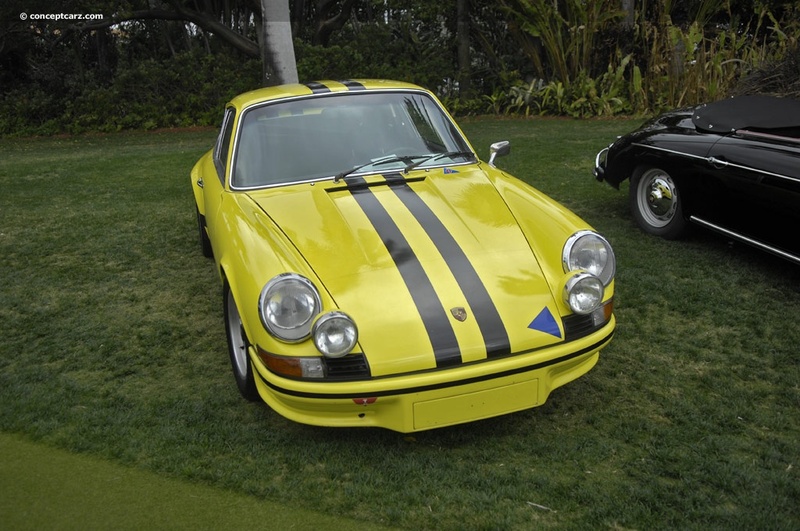 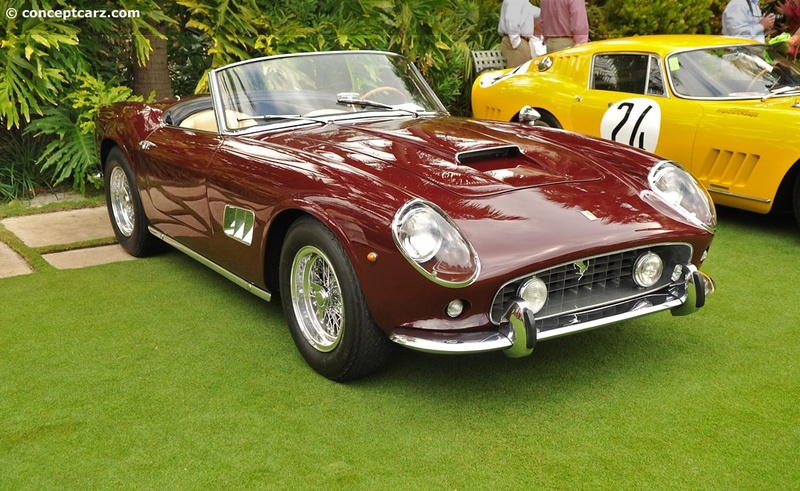 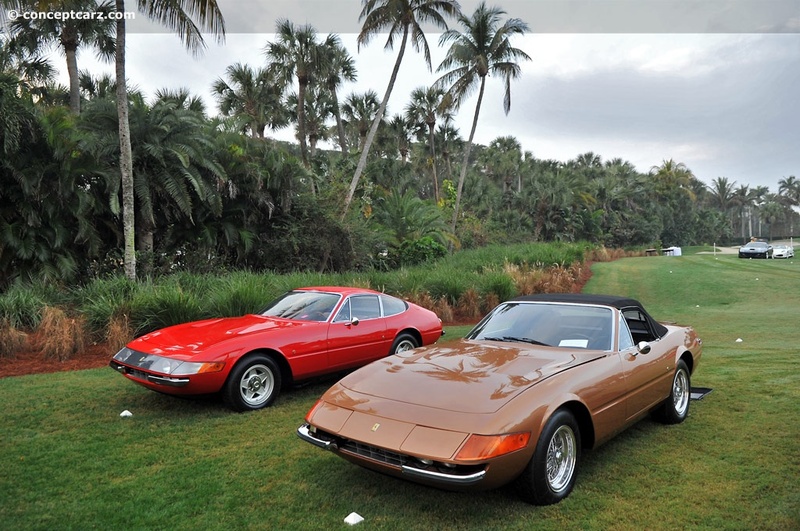 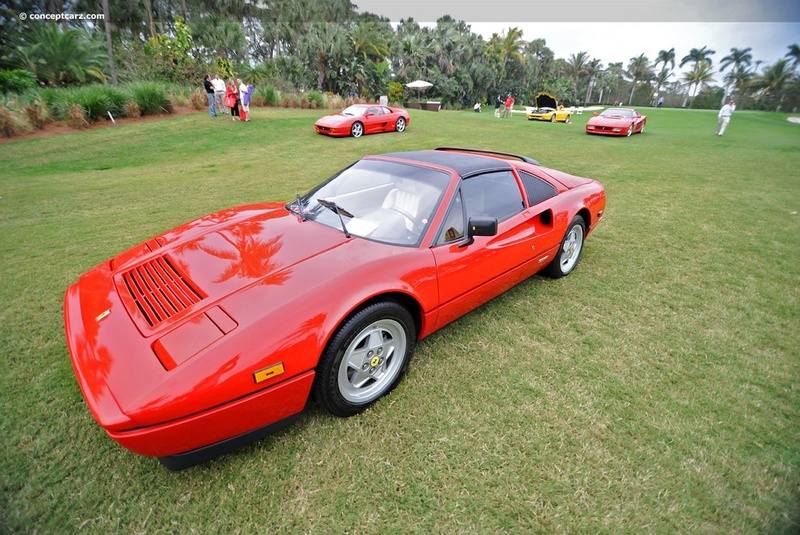 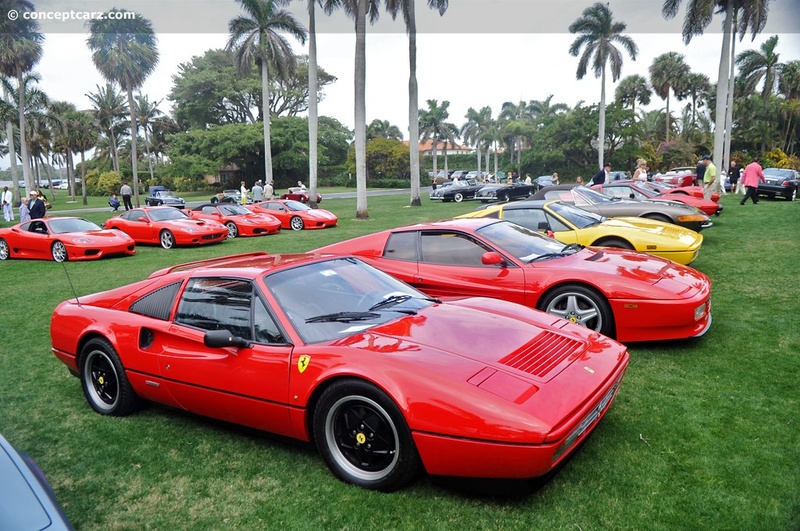 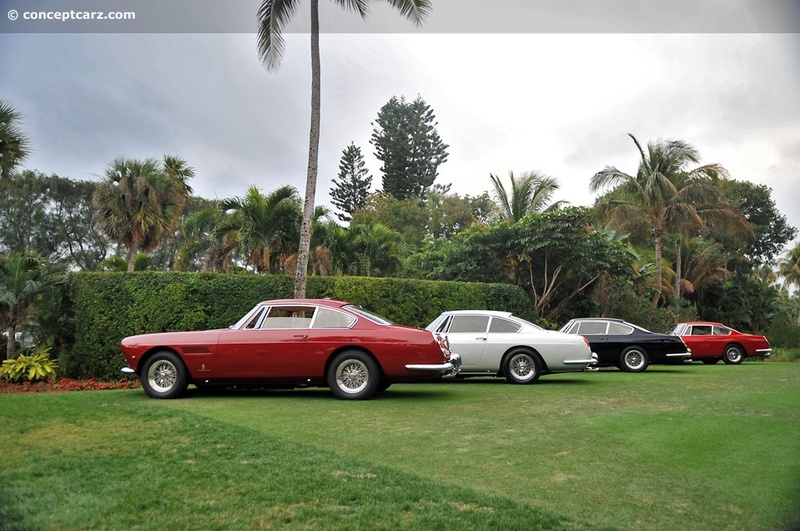 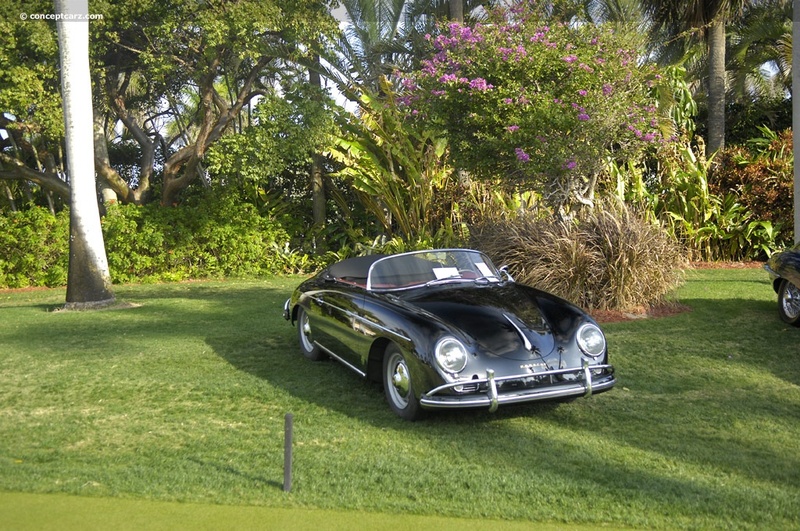 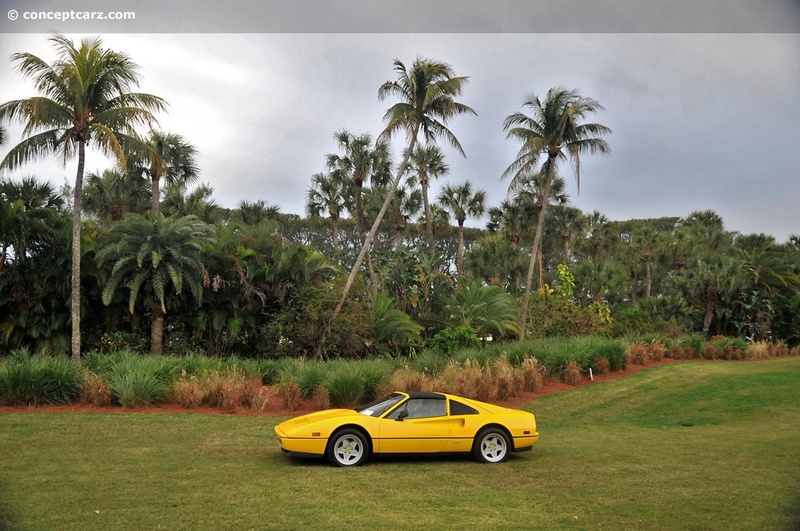 The final day of the Cavallino Classic celebration was the Classic Sports Sunday at the Mar-a-Lago Club, the legendary Marjorie Merriweather Post mansion in old Palm Beach. 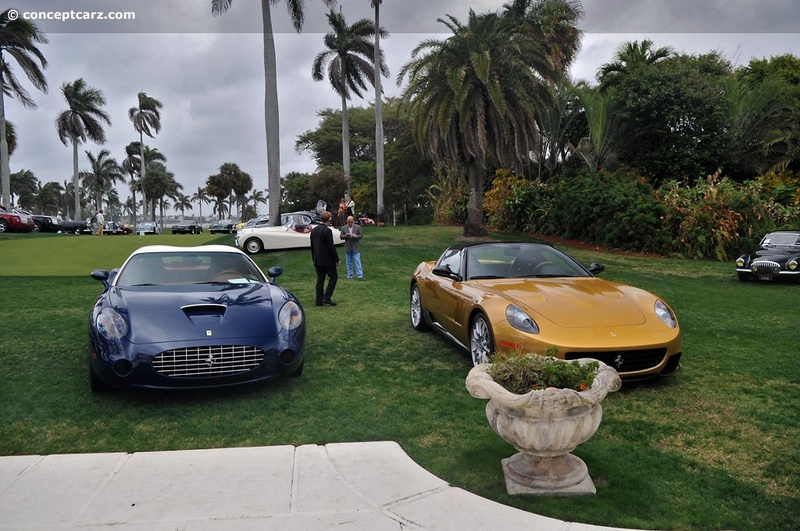 The Mar-a-Lago Club sits on 20 beautiful acres of vibrant gardens, manicured lawns, and sweeping sea-to-lake vistas. 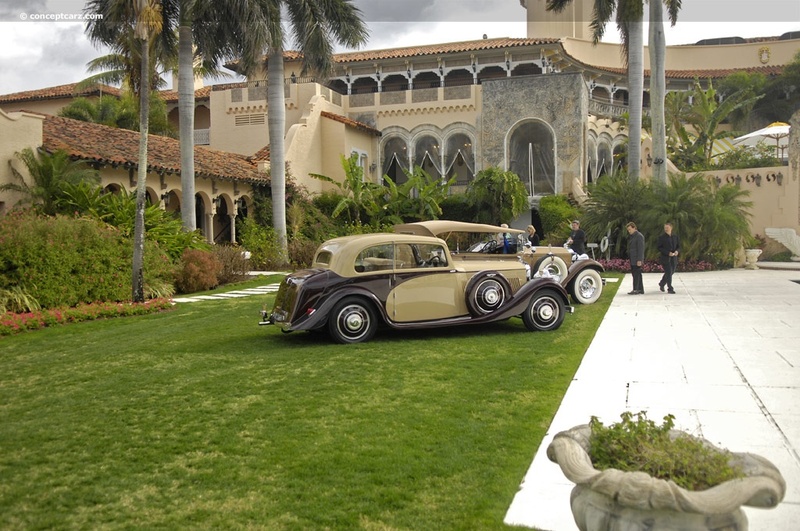 It is the former Marjorie Merriweather Post estate and a National Historic Landmark. 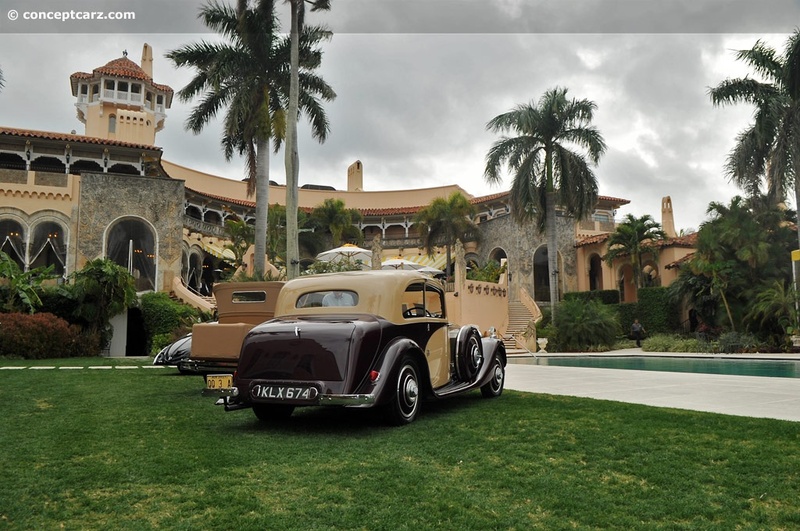 There are 126 rooms that have been fully renovated and restored to their original splendor under the watchful eye of Donald J. Trump. 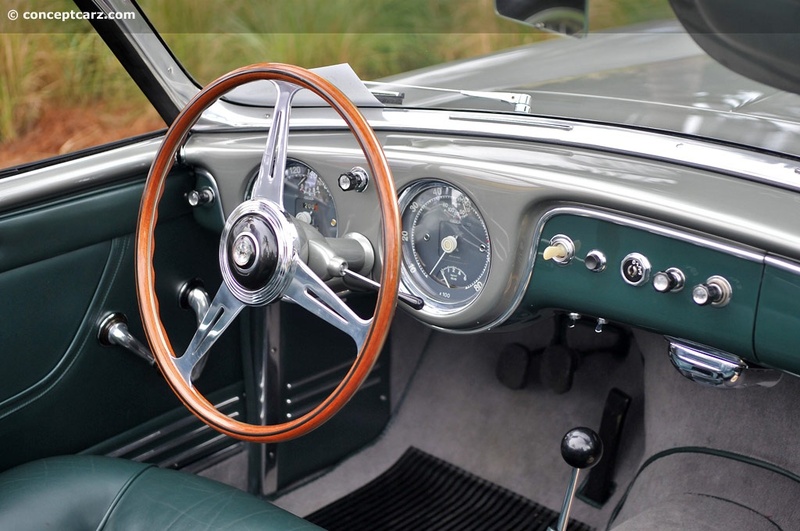 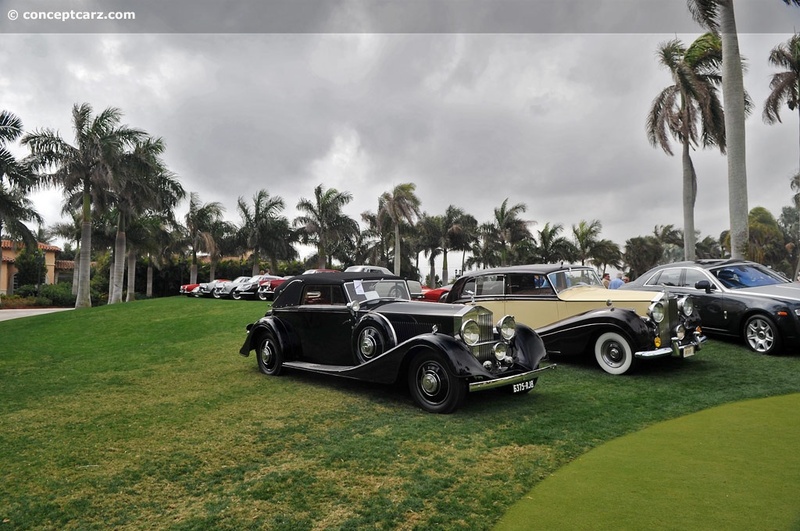 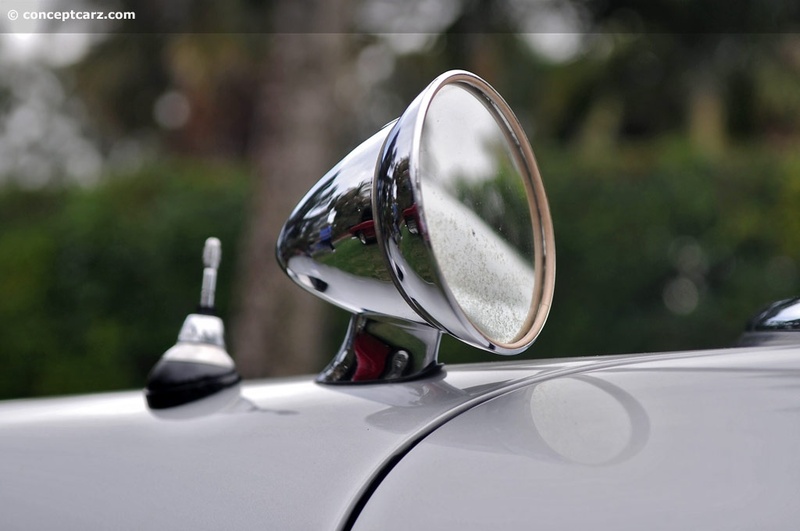 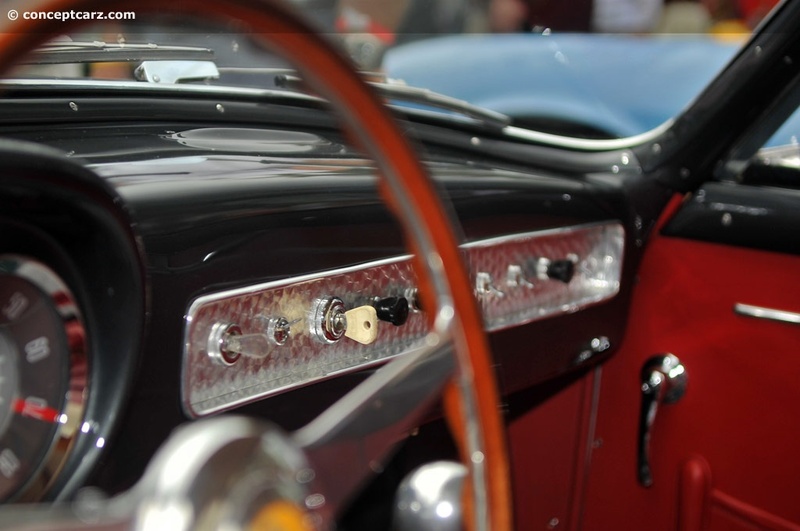 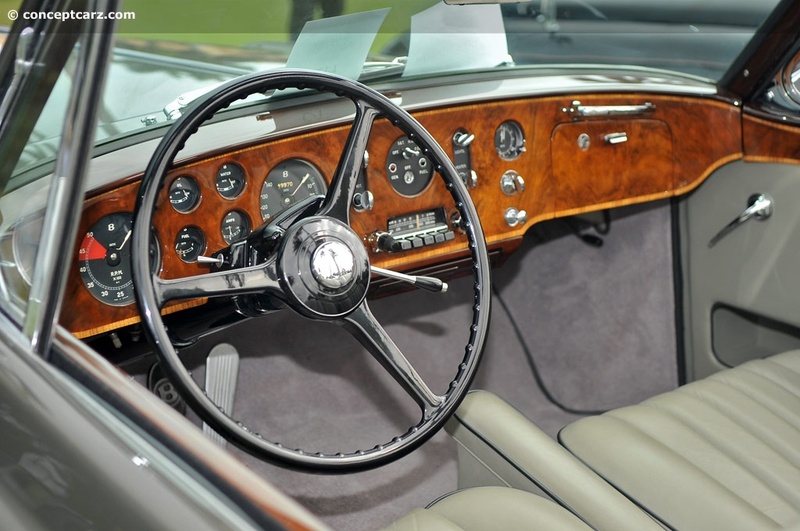 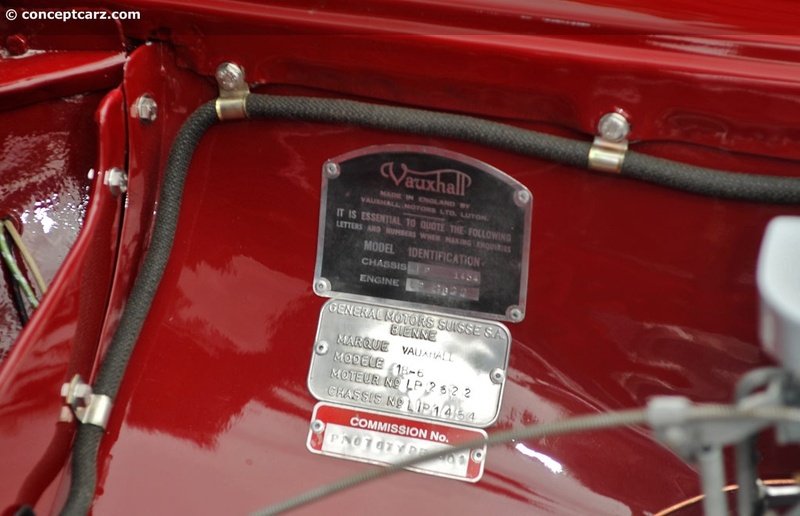 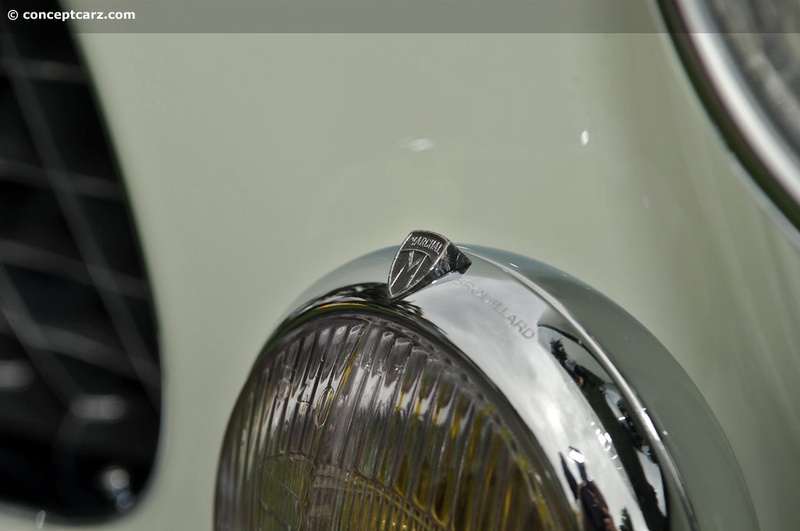 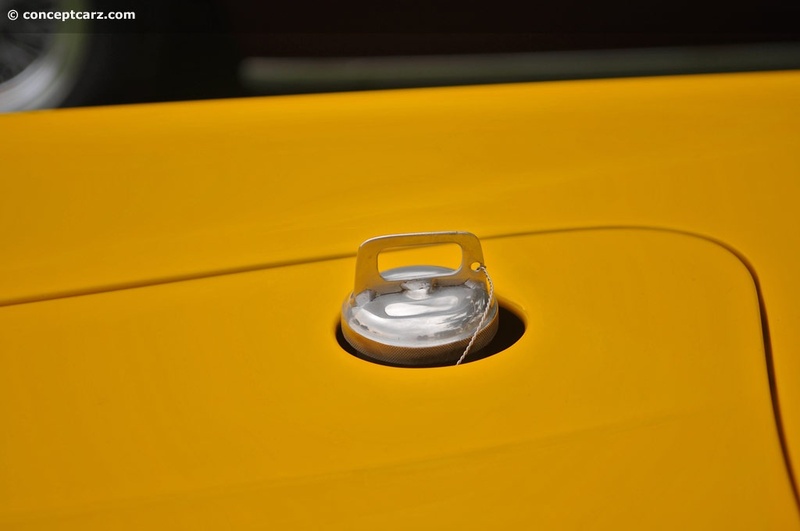 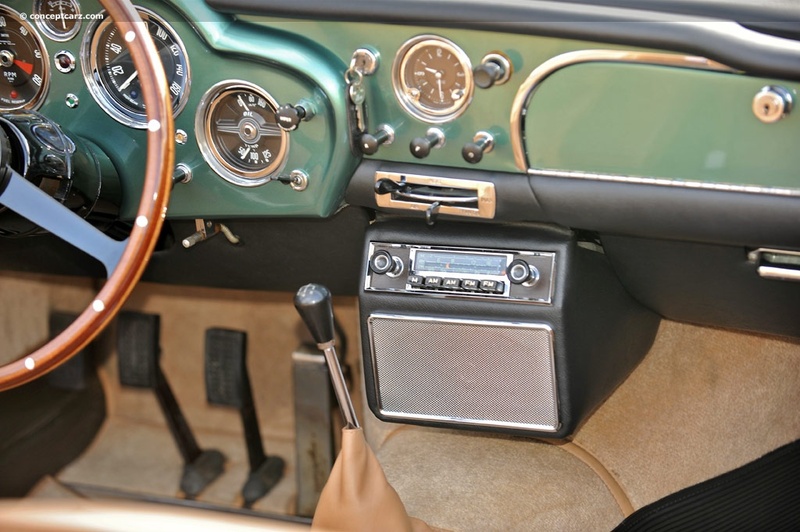 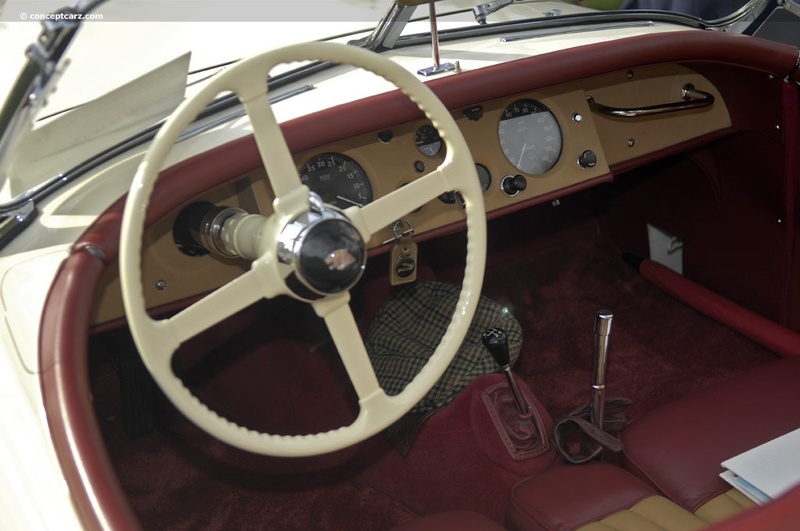 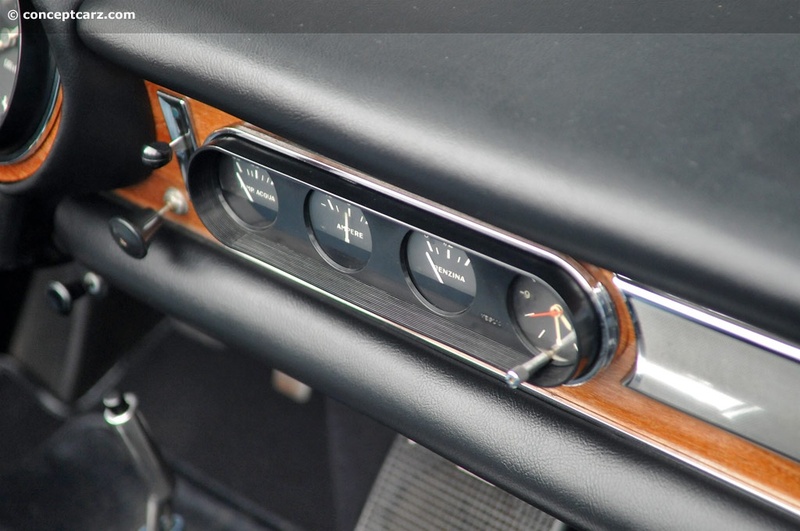 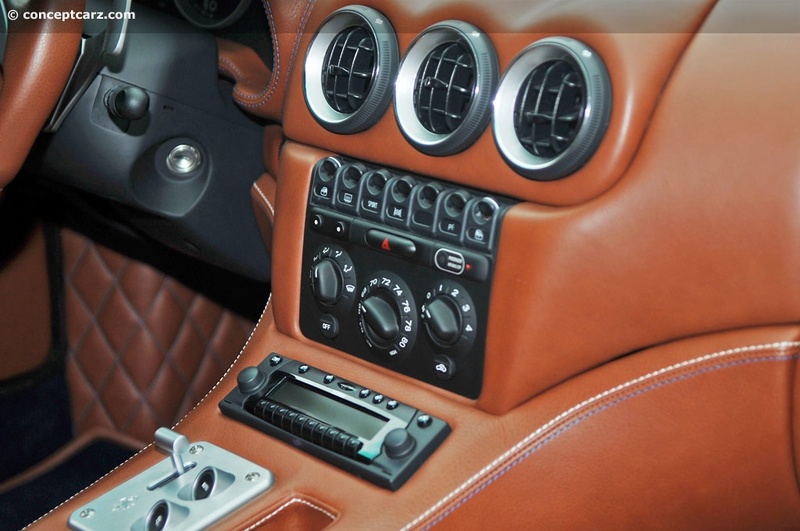 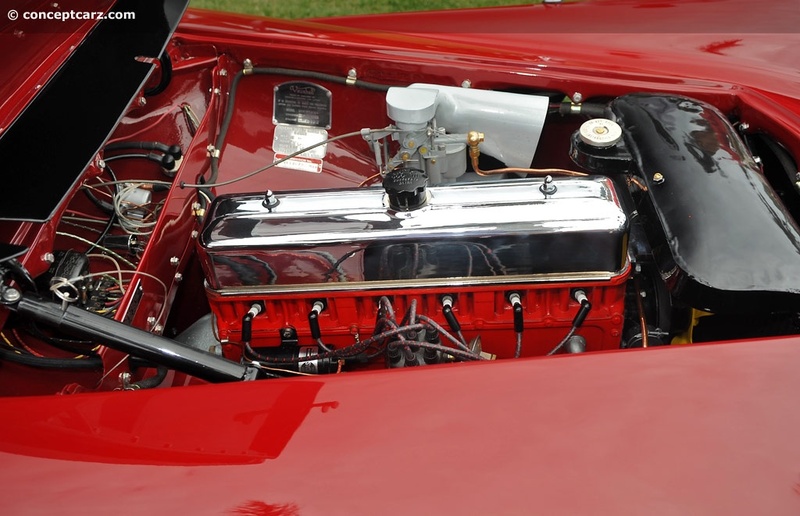 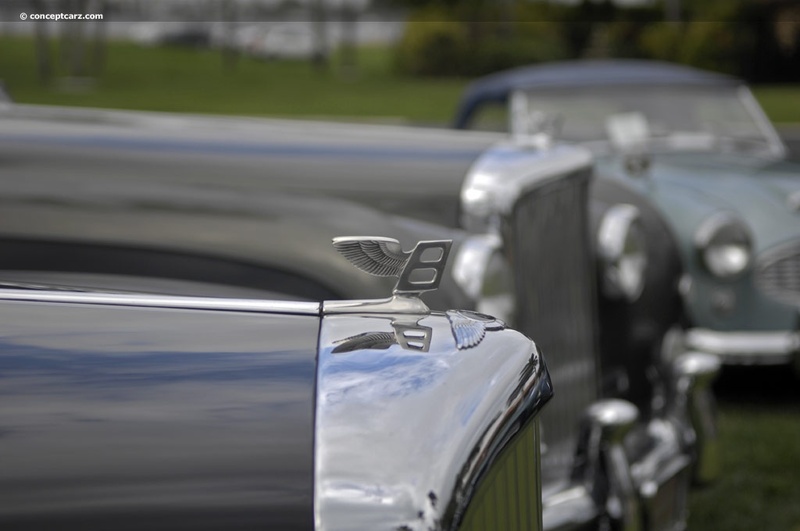 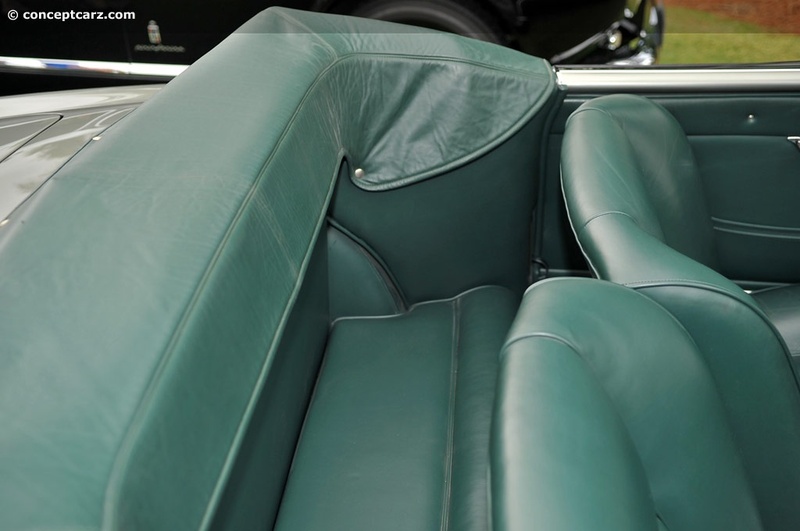 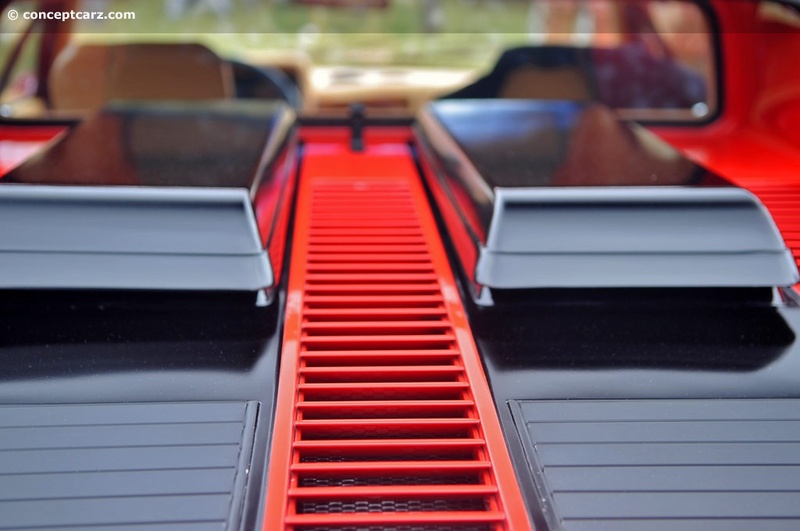 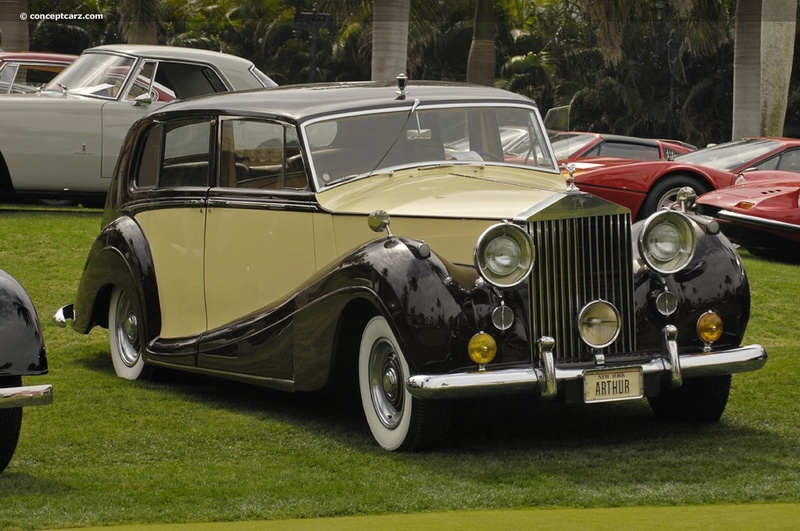 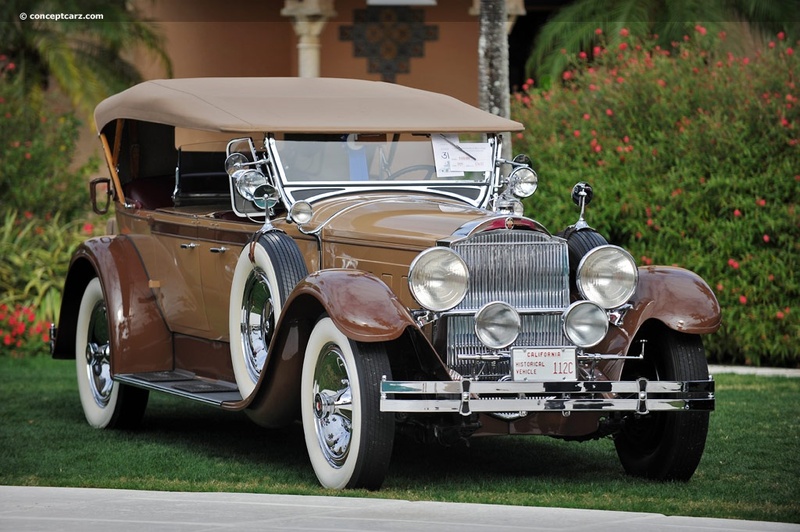 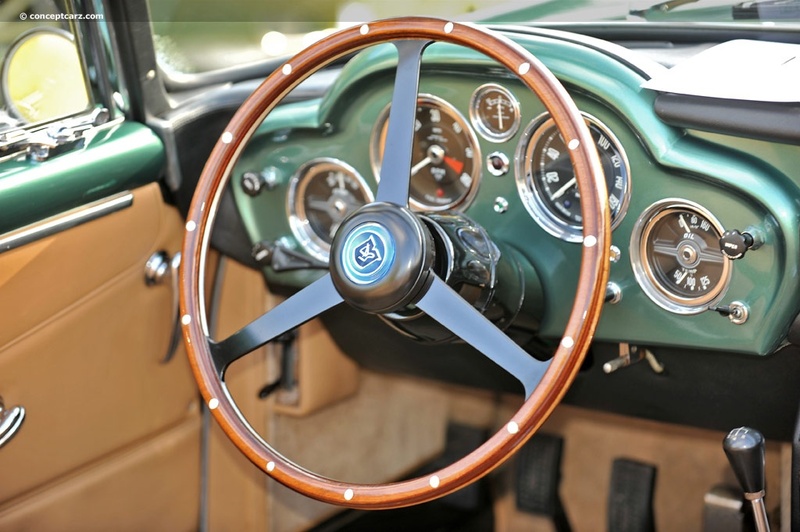 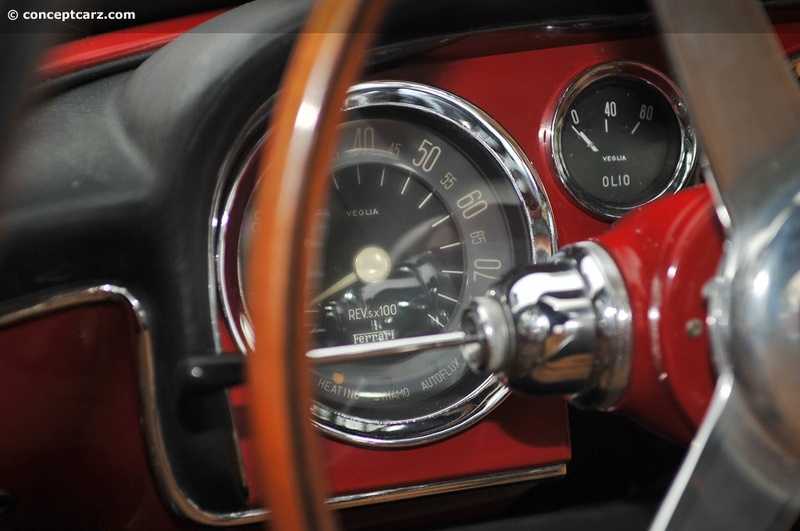 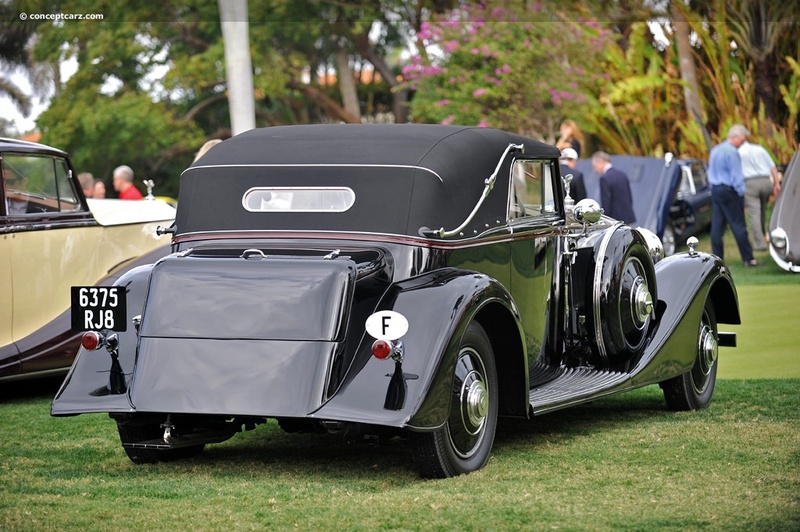 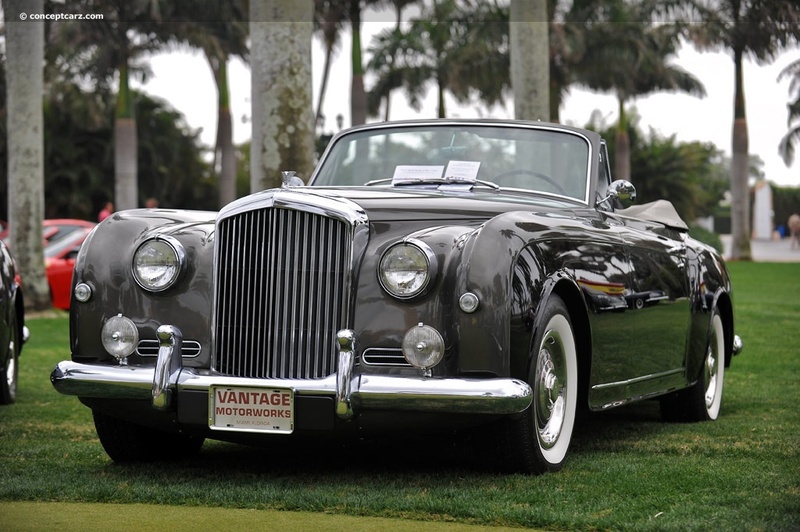 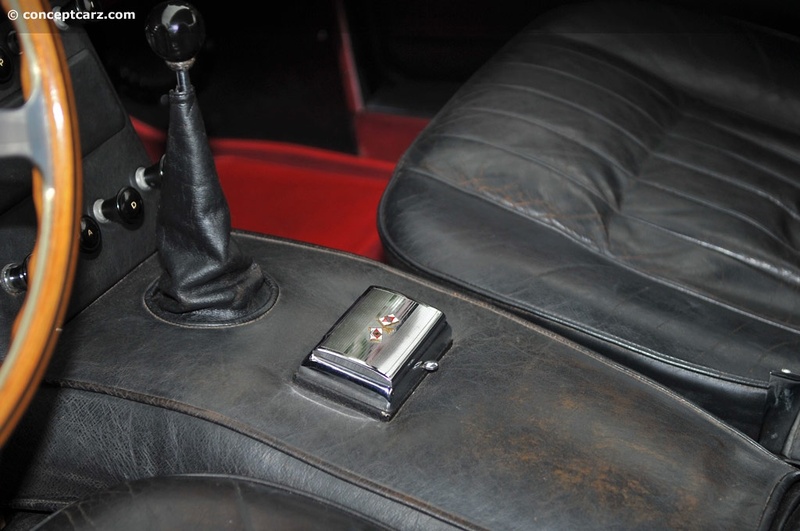 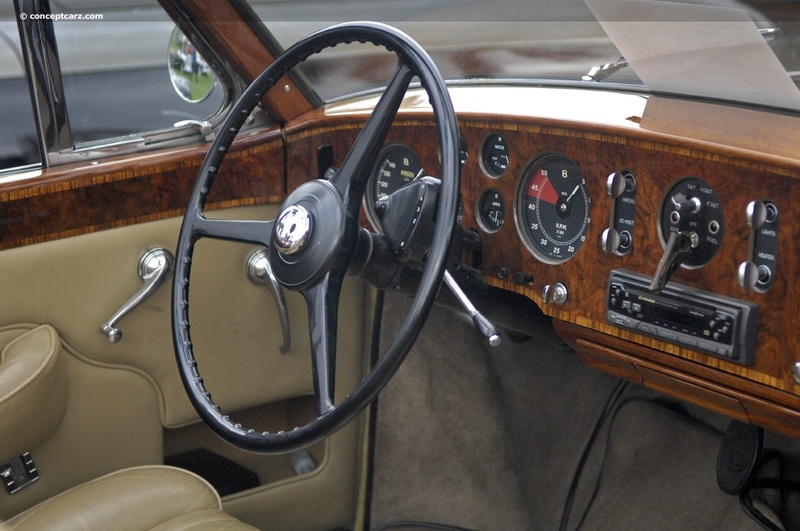 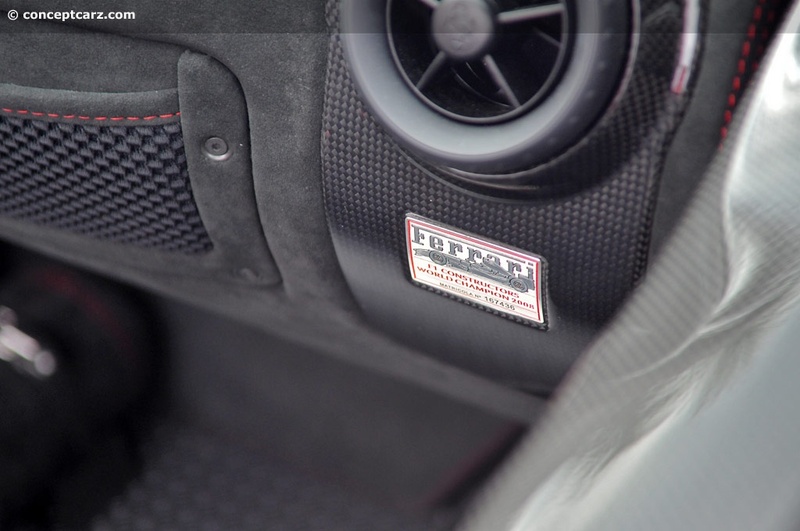 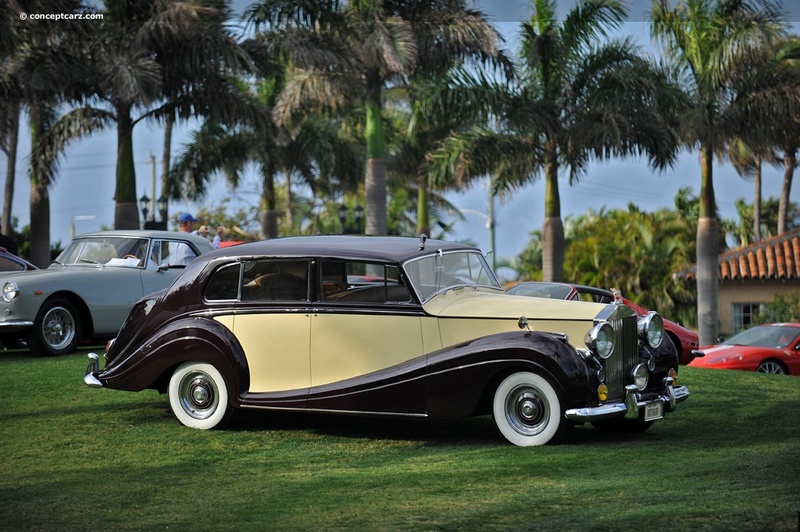 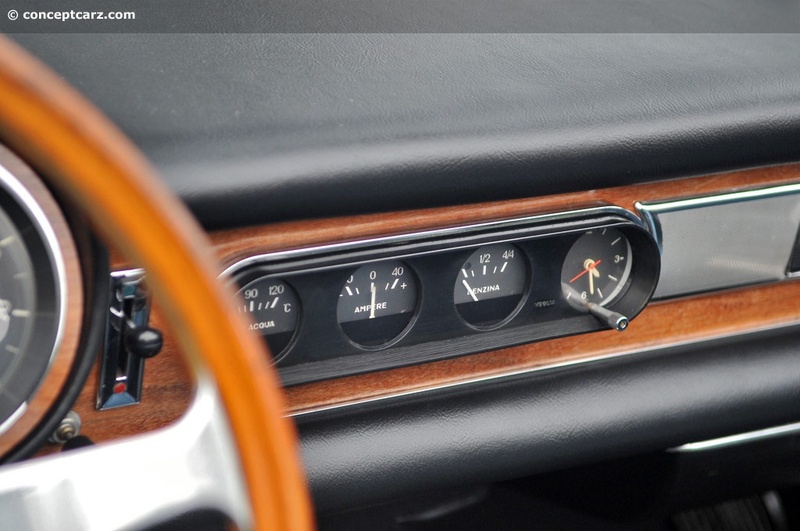 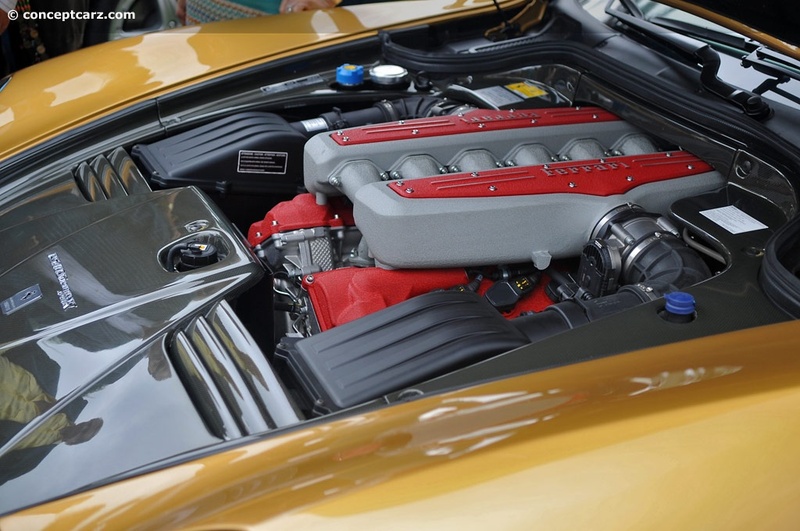 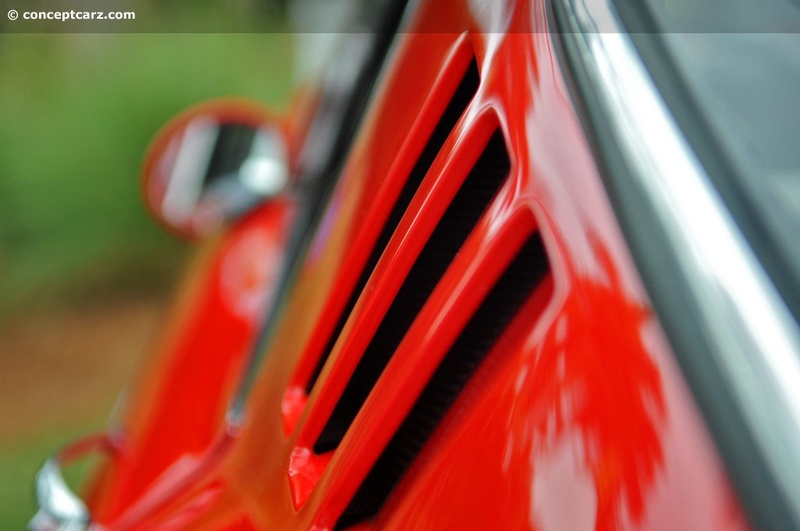 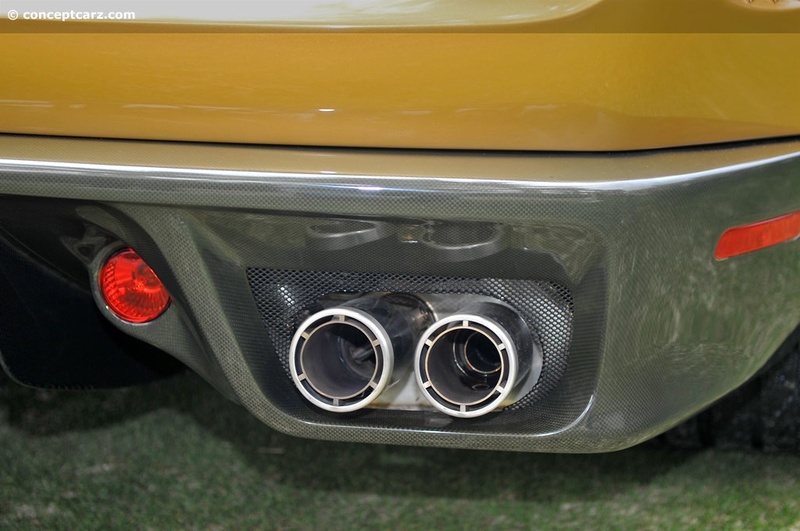 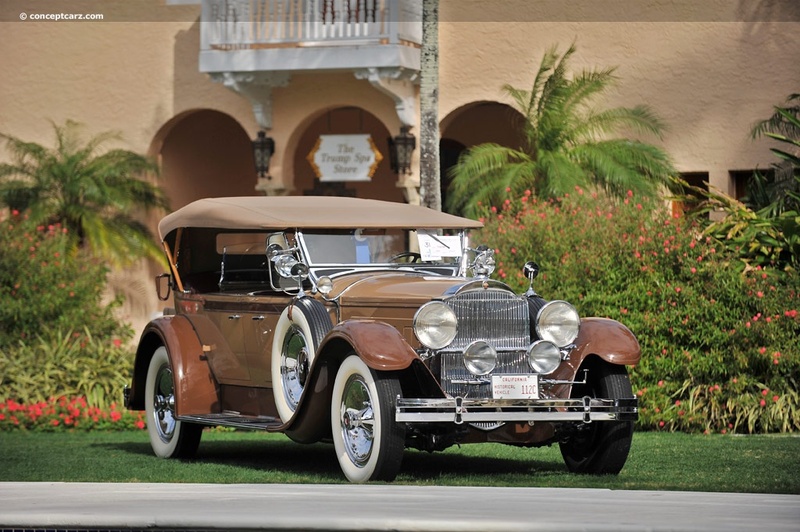 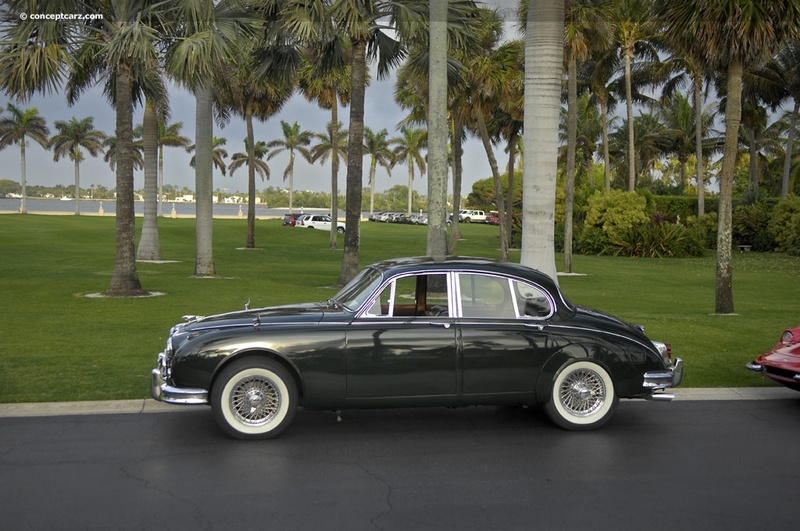 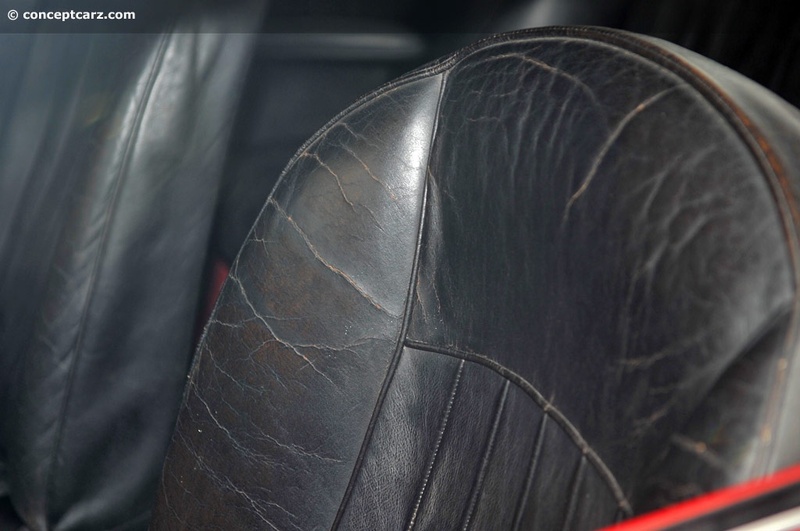 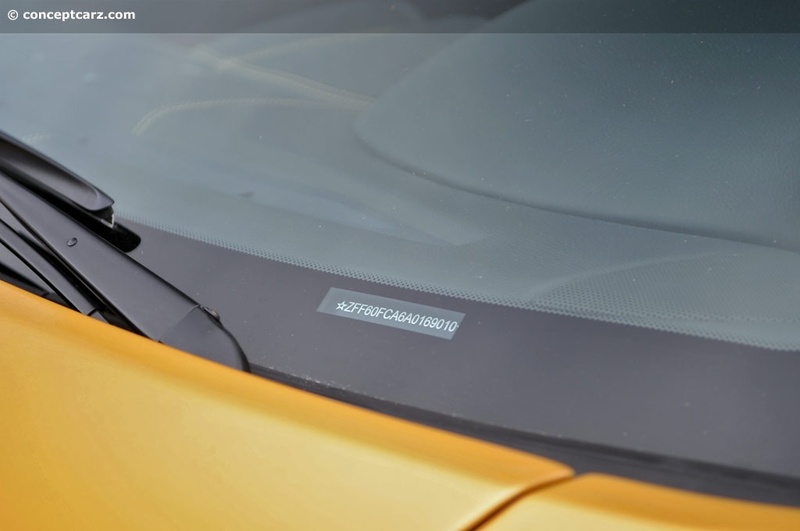 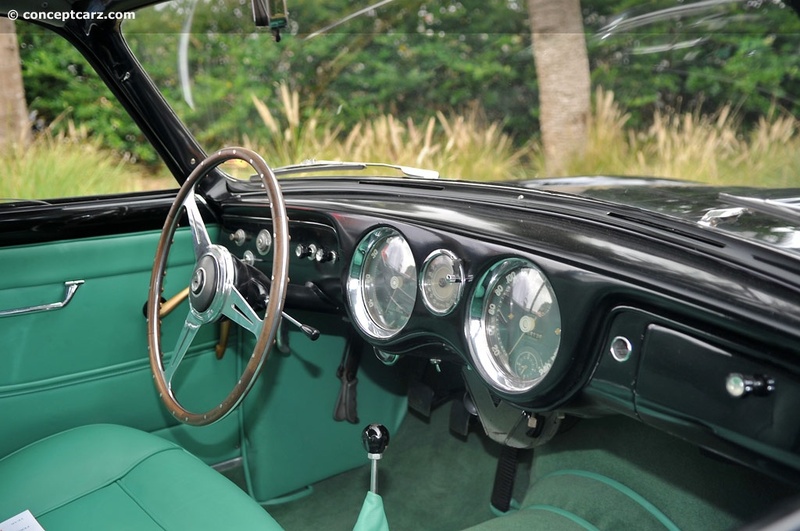 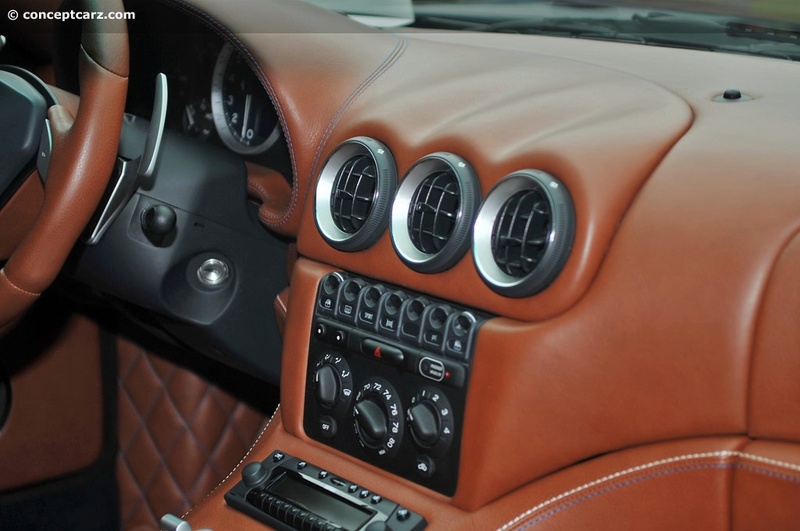 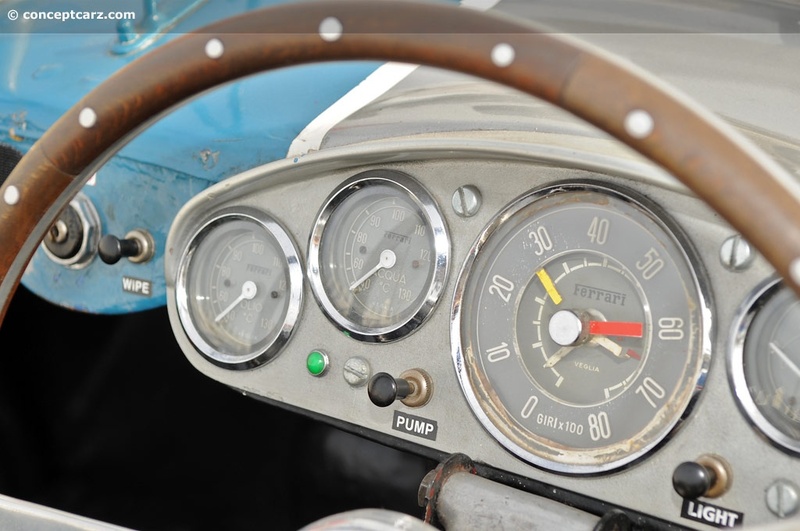 In attendance were cars from a plethora of marques, such as Packard, Rolls-Royce, Alfa-Romeo, Porsche, Bentley, Delage, Jaguar, Ferrari, Triumph, and Vauxhall. 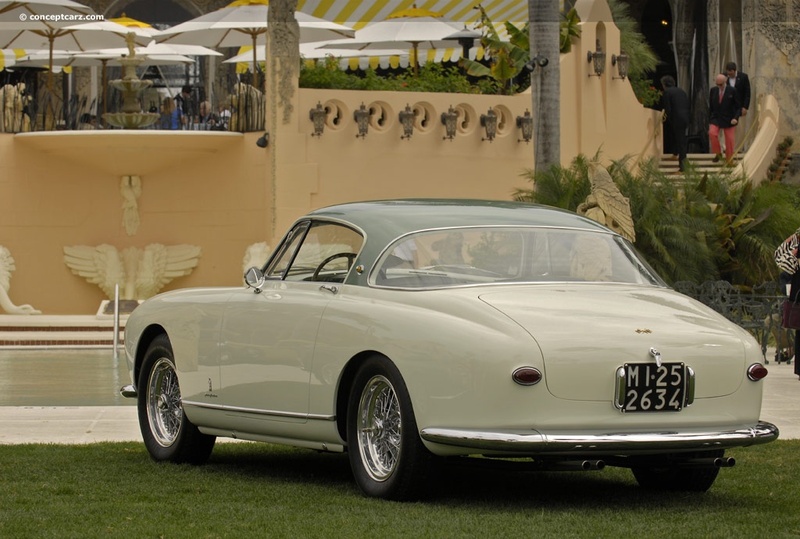 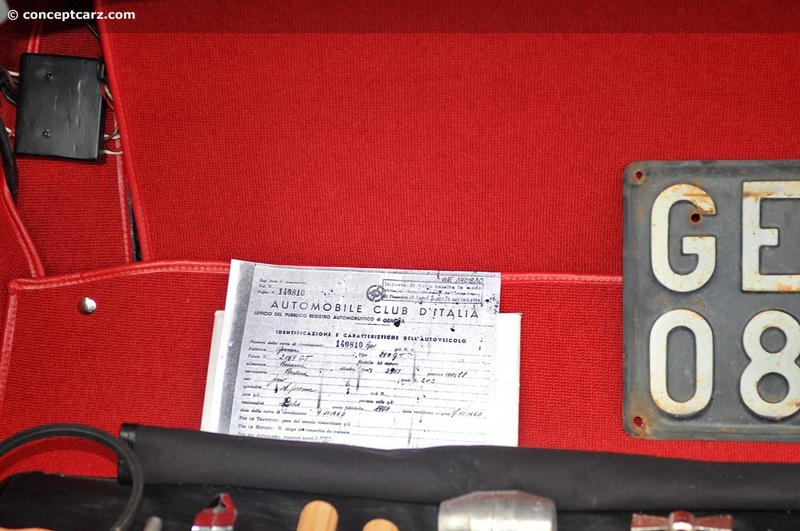 Whereas the cars of the Concorso d'Eleganza had been meticulously judged by experts in their field, the Classic Sport Sunday employed a different approach. 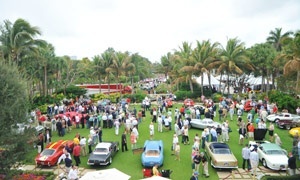 The guests to this event voted for their favorites and the awards were presented at the charity brunch in the new Ballroom. 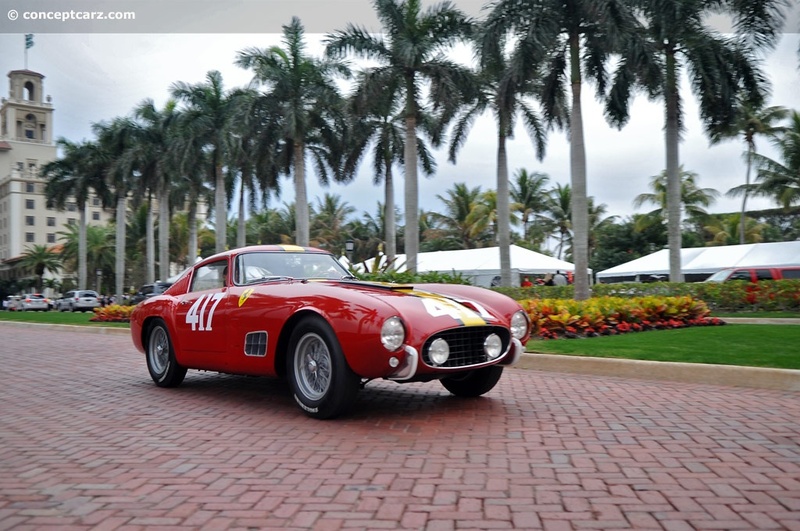 With 18 years of history, incredible scenery and a spectacular array of Ferraris throughout the celebration, the Cavallino Classic XIX did not disappoint. 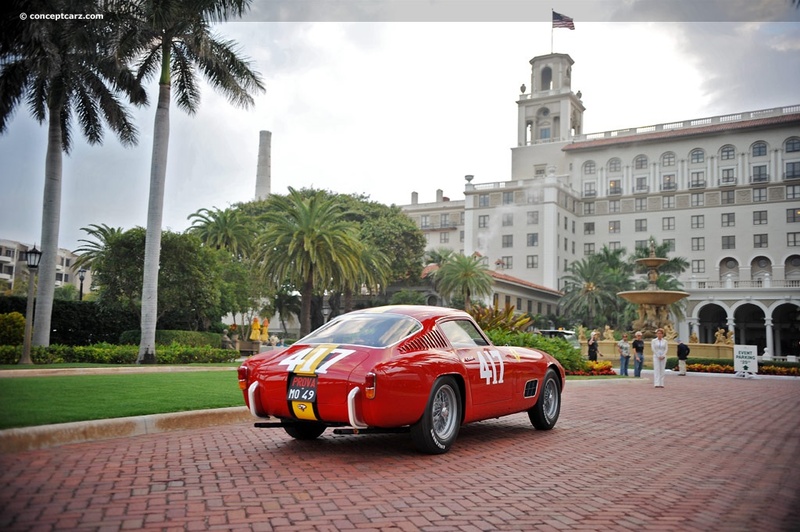 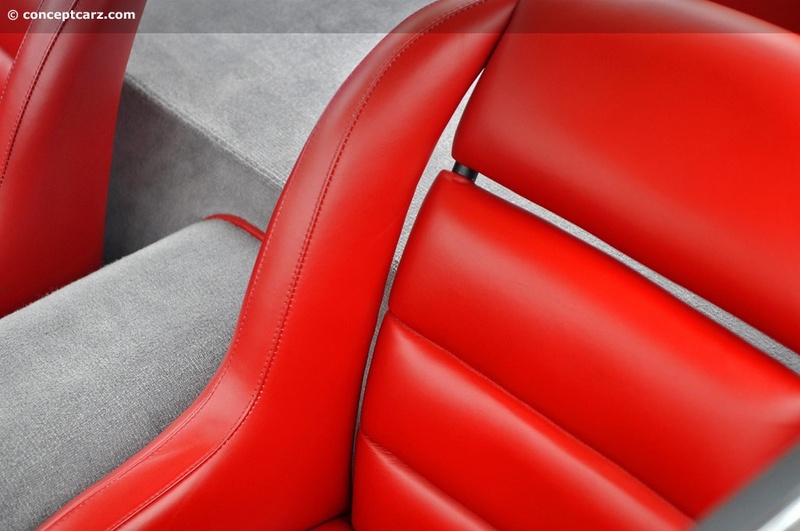 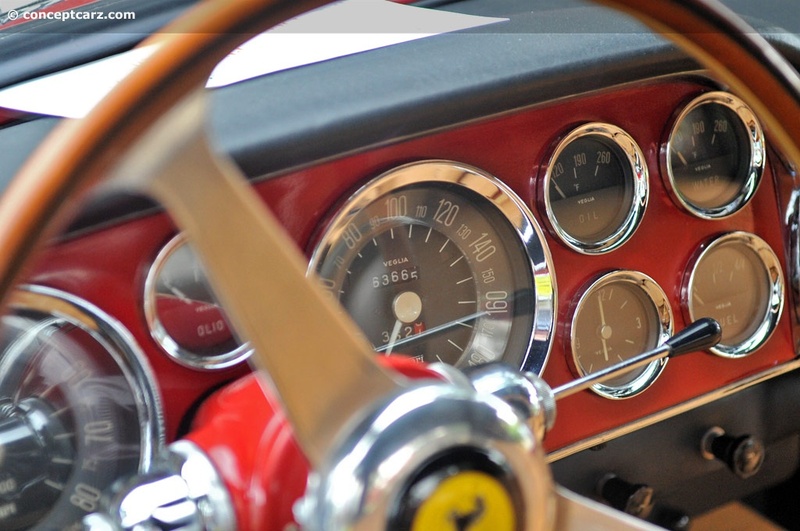 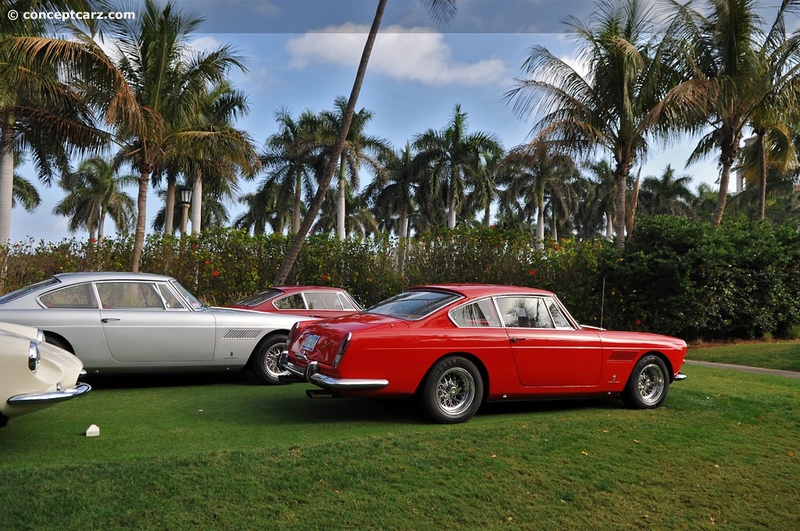 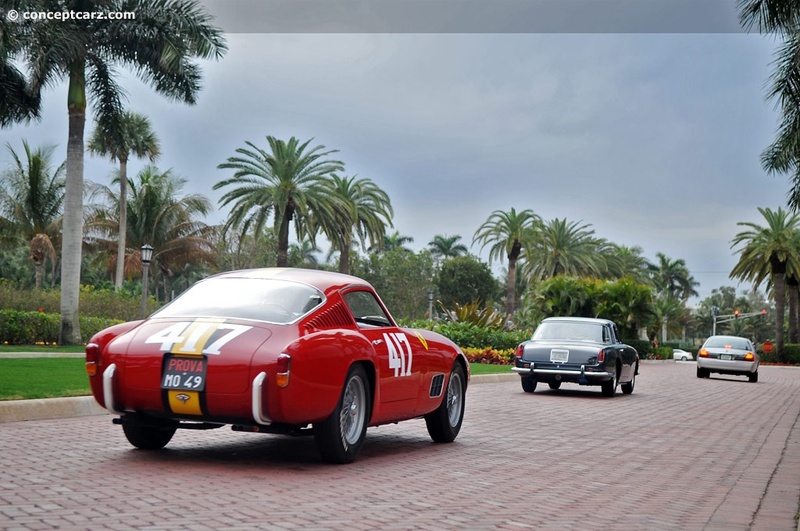 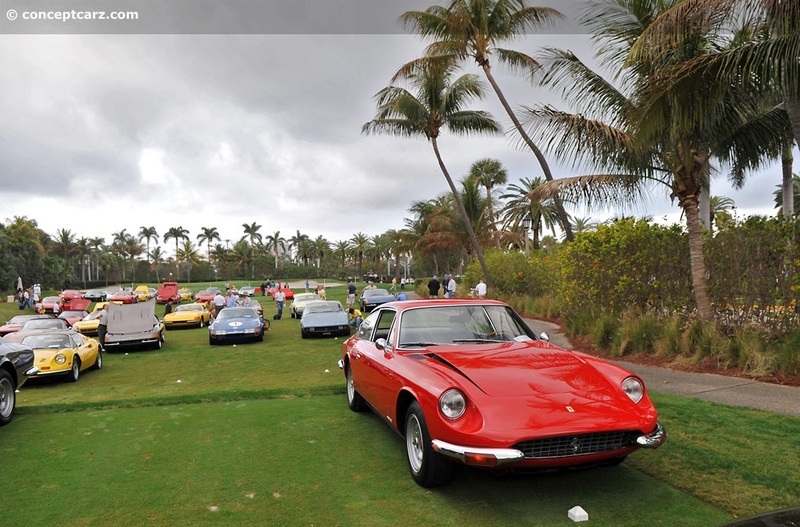 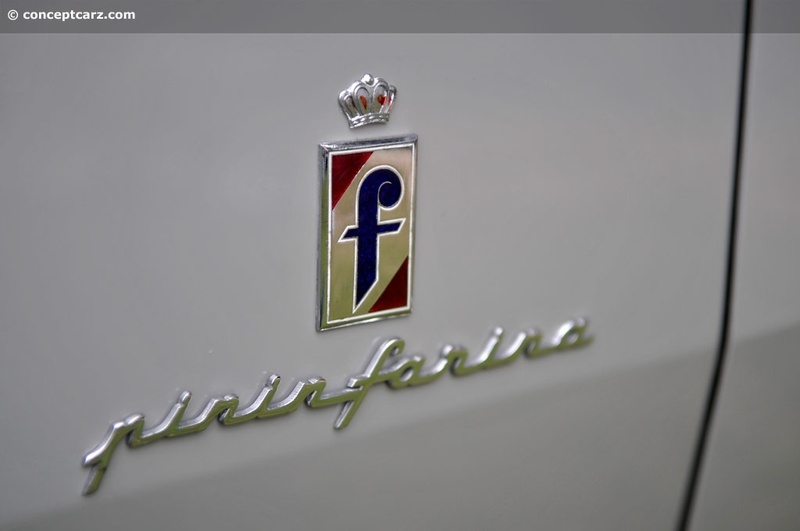 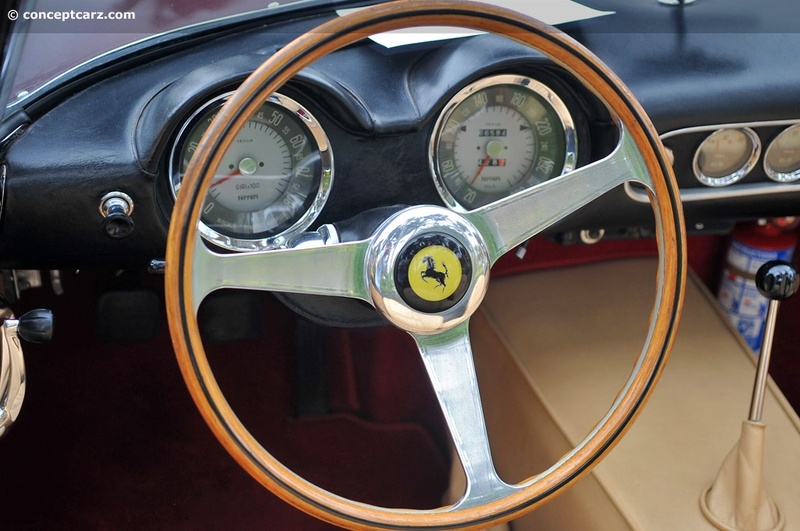 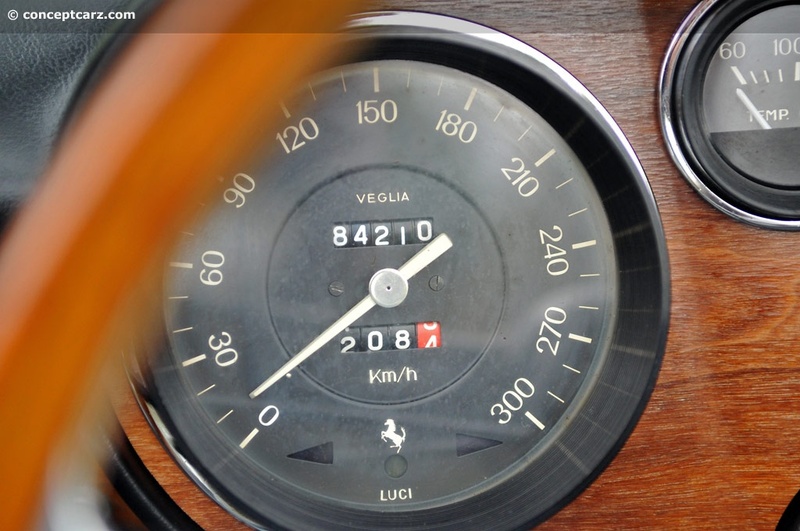 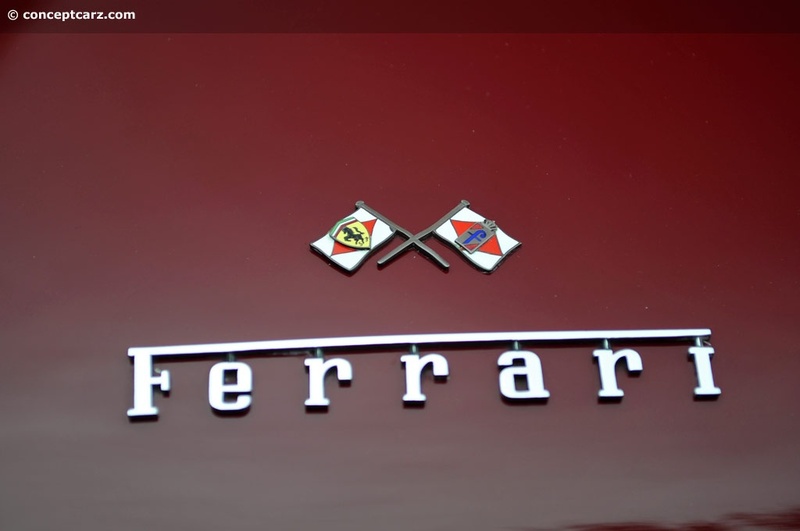 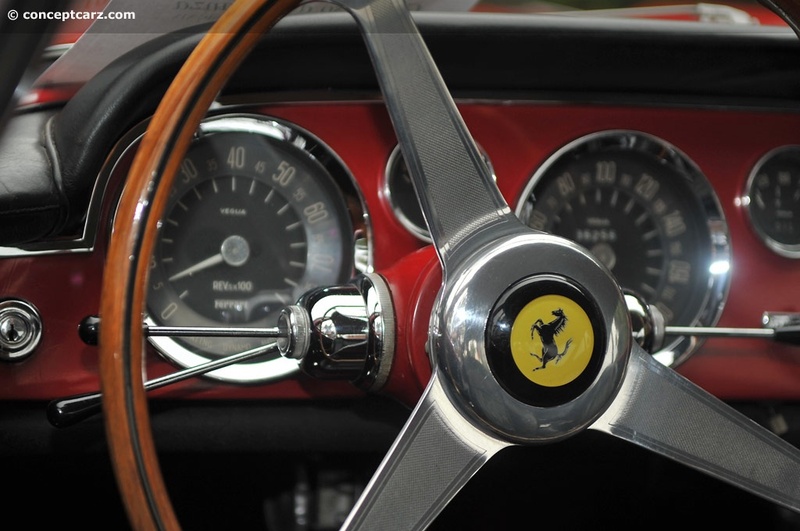 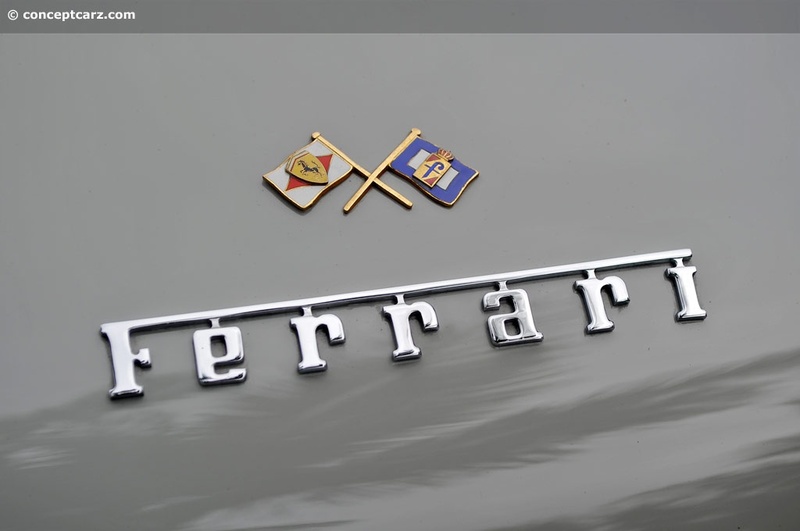 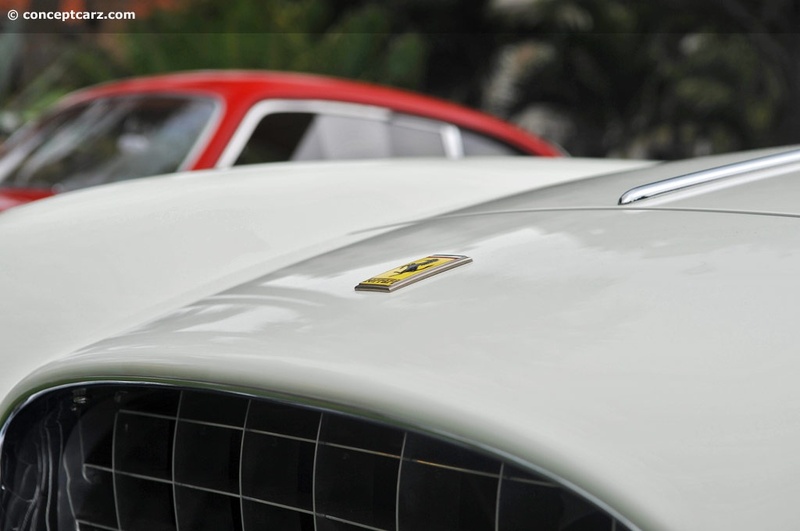 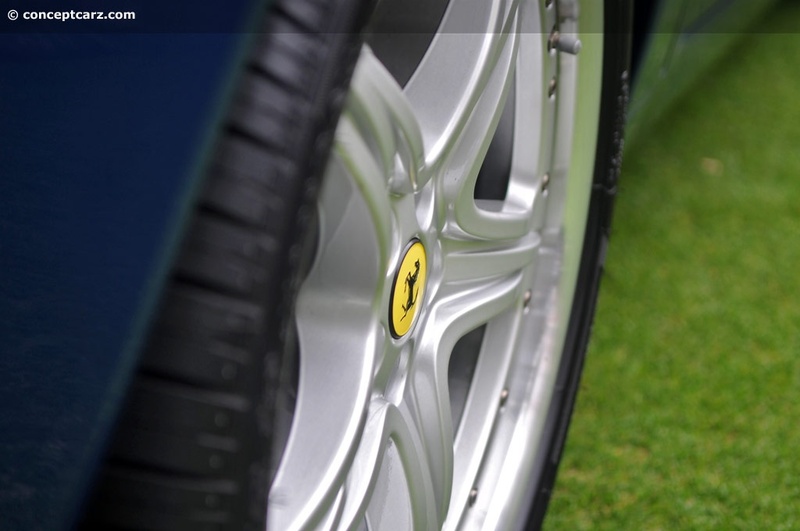 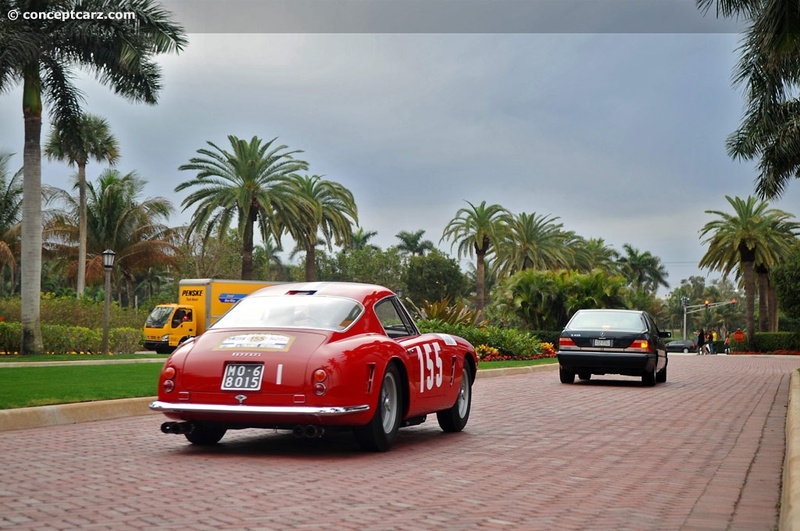 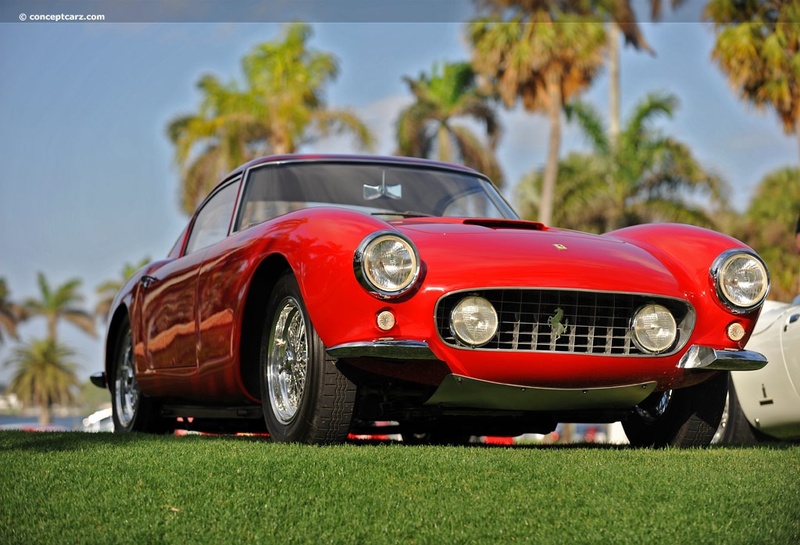 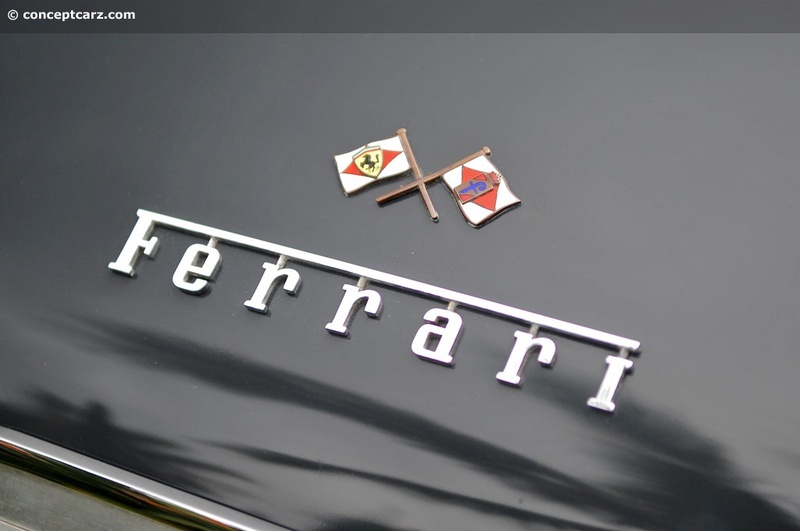 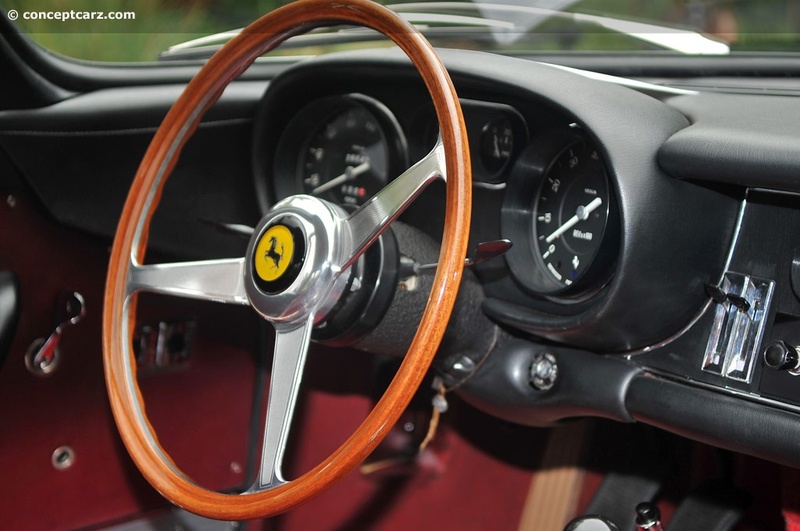 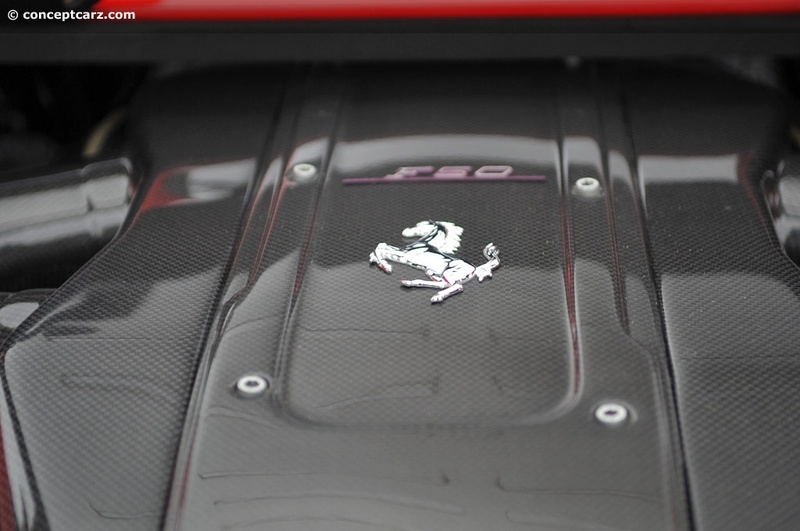 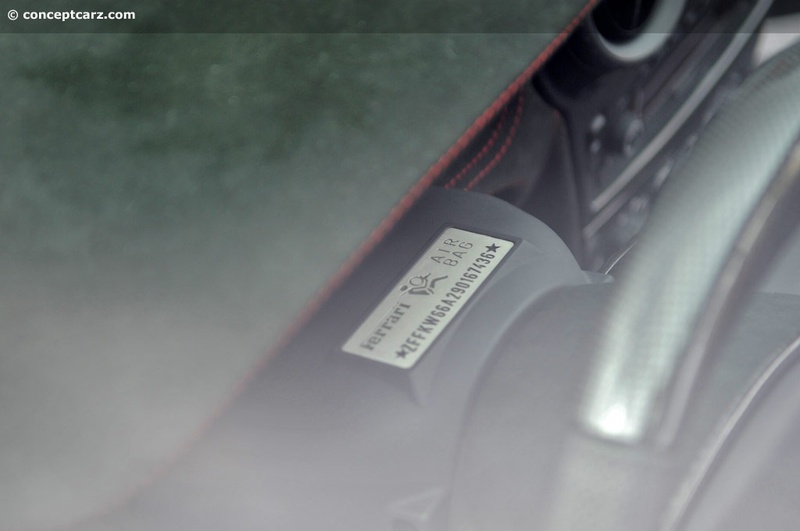 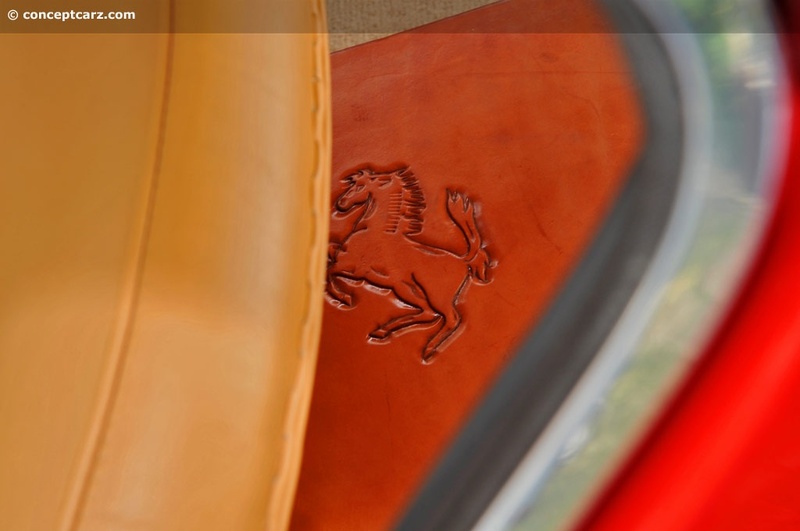 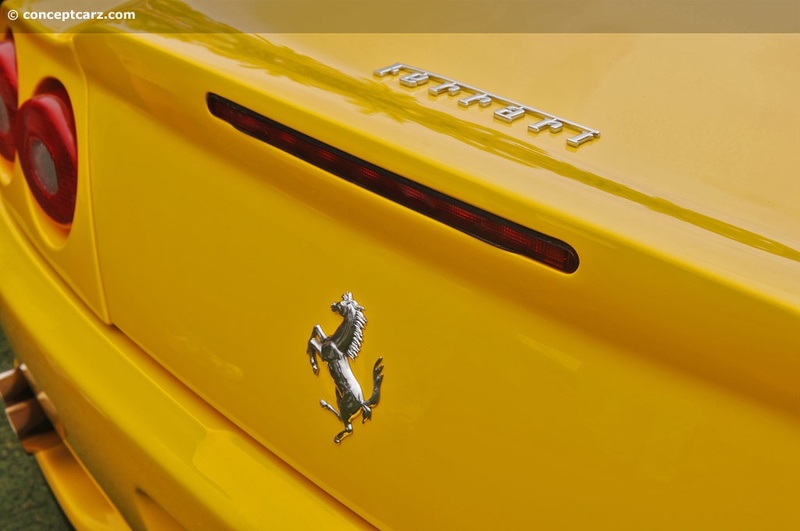 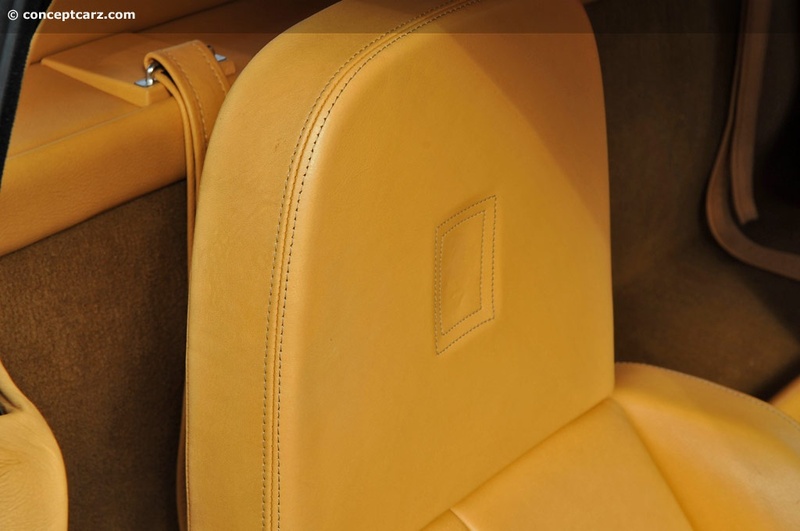 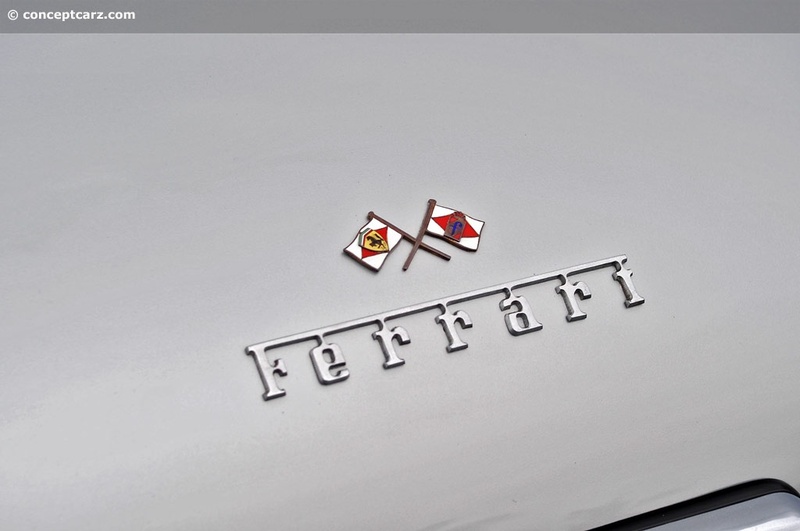 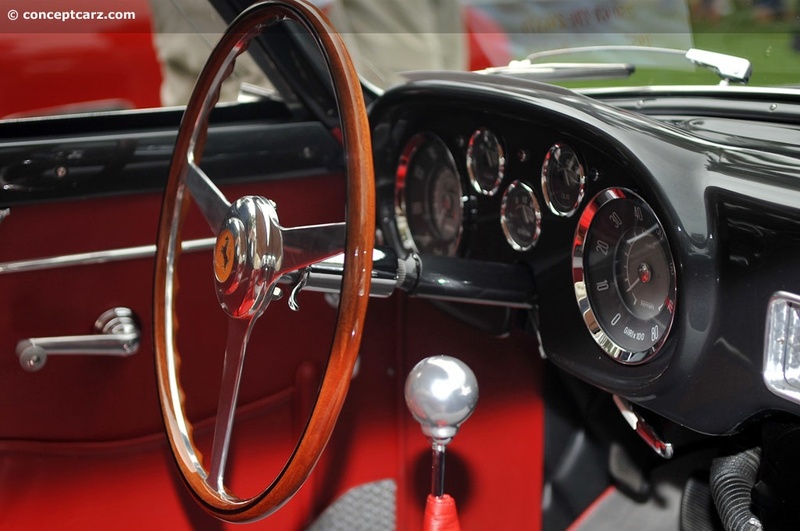 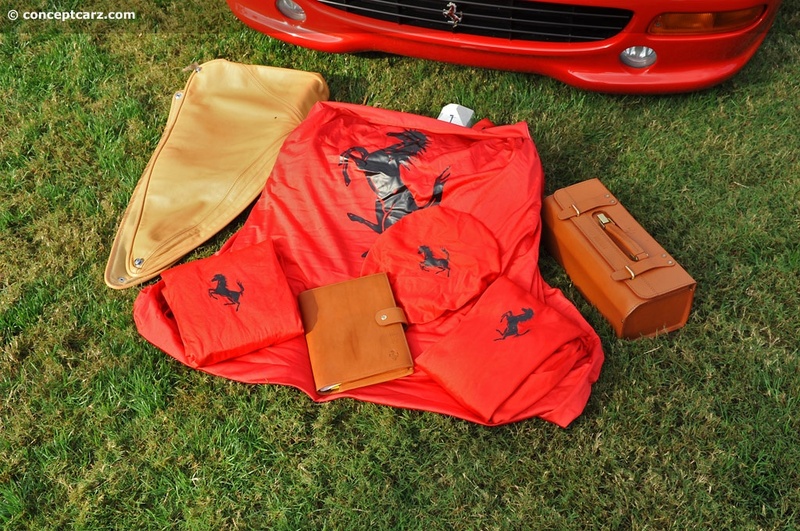 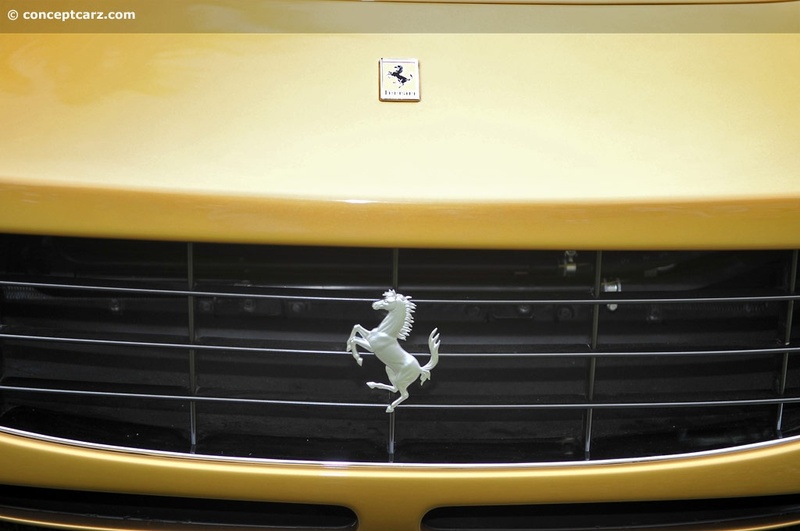 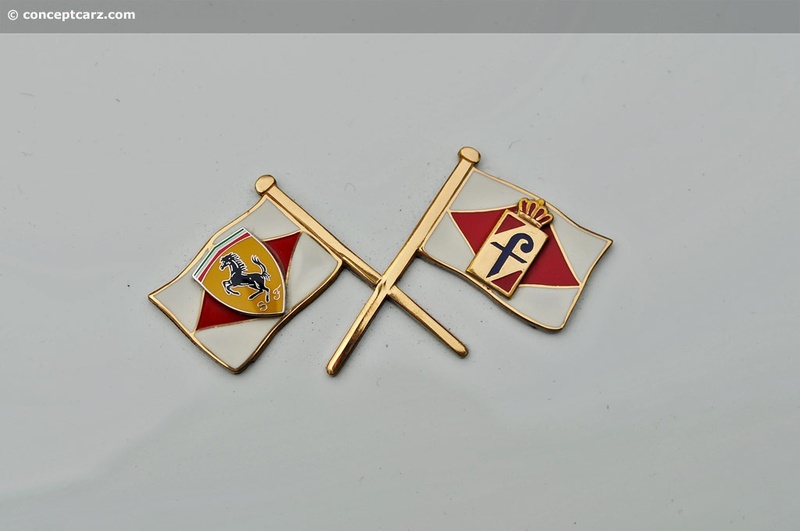 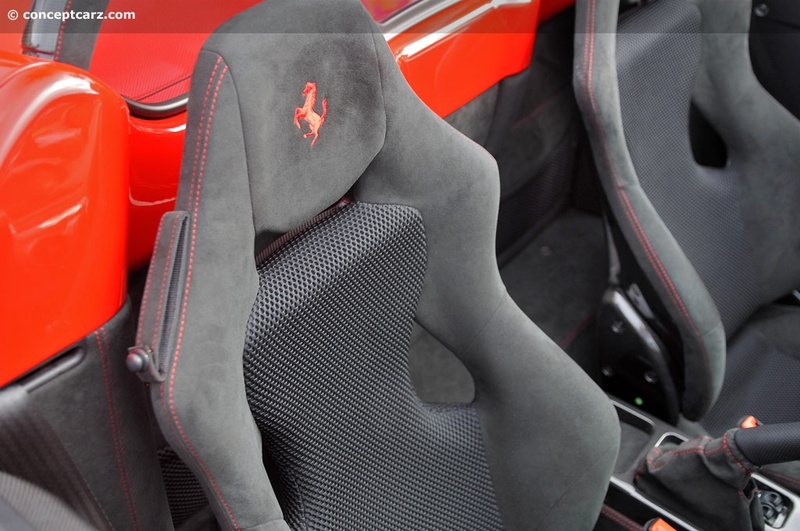 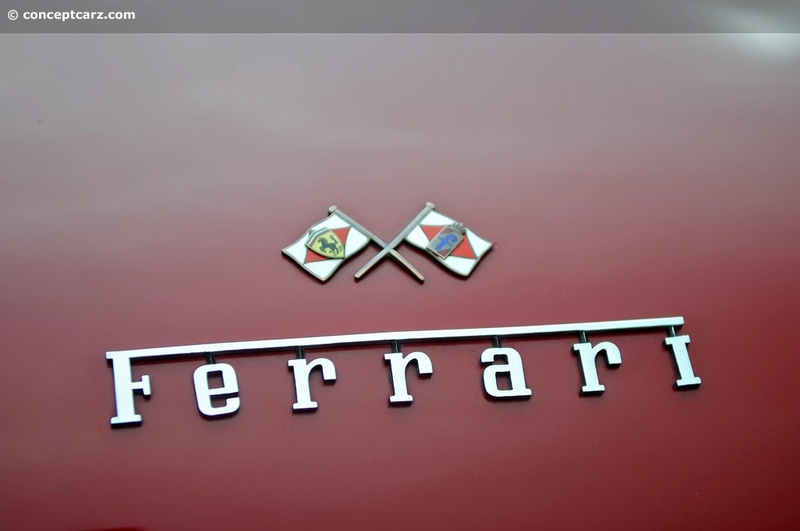 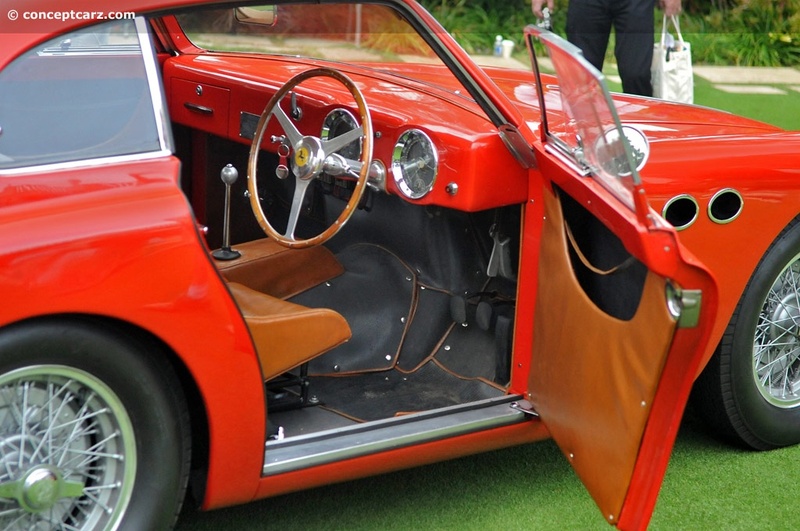 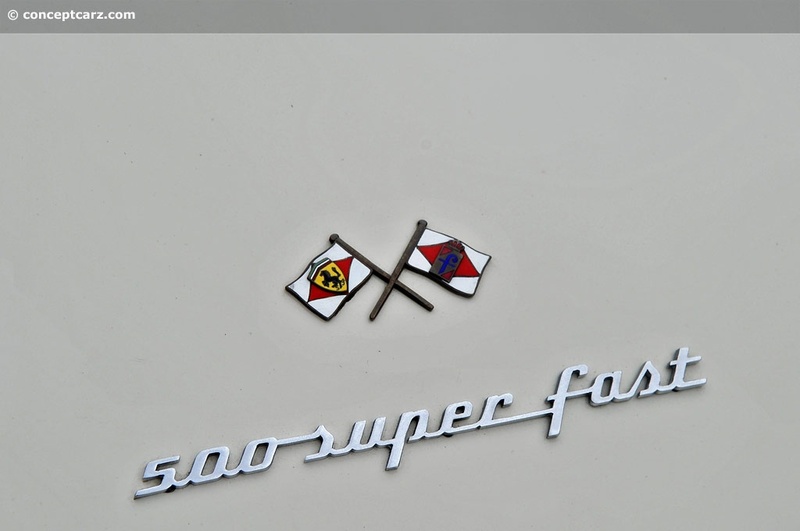 The Cavallino Classic is hosted by the Cavallino Magazine, The Journal of Ferrari History.